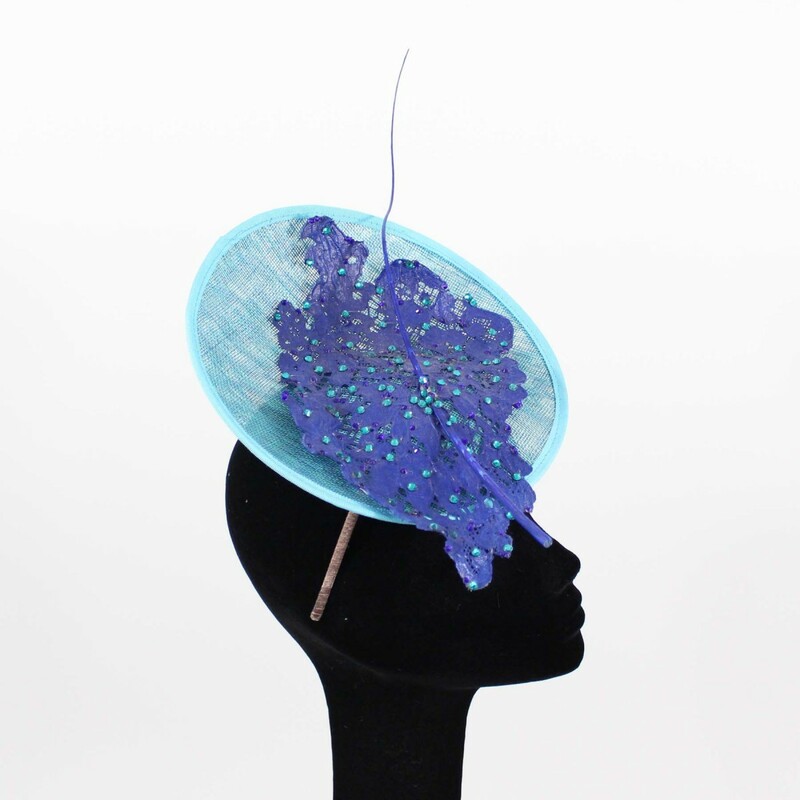 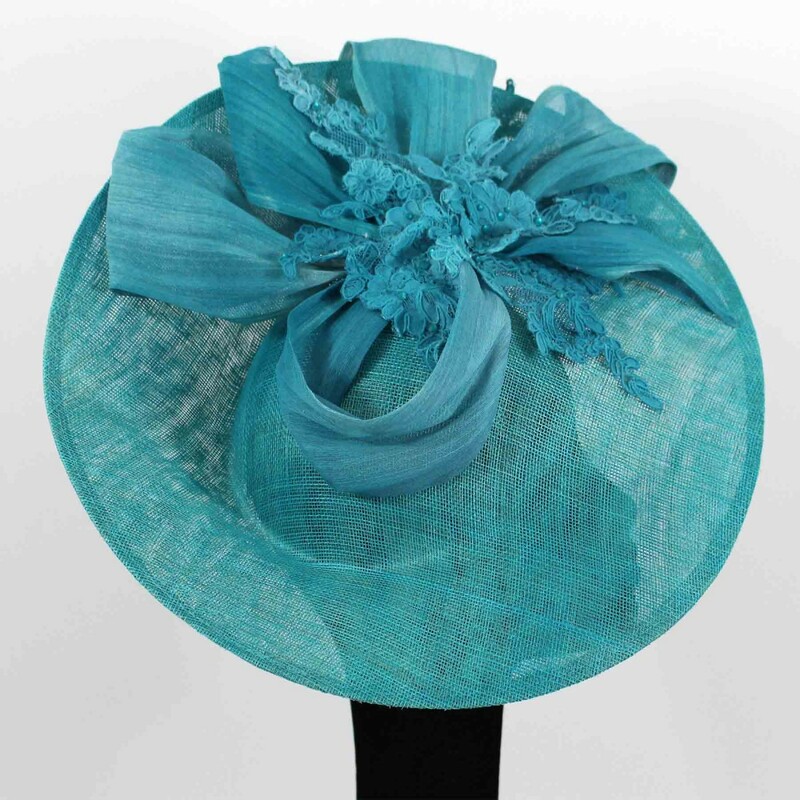 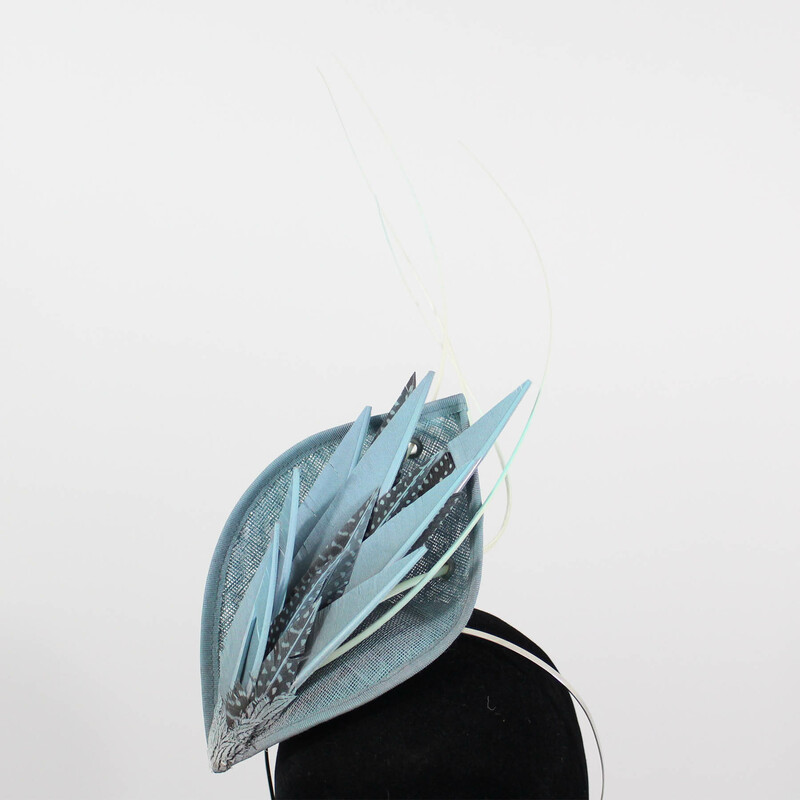 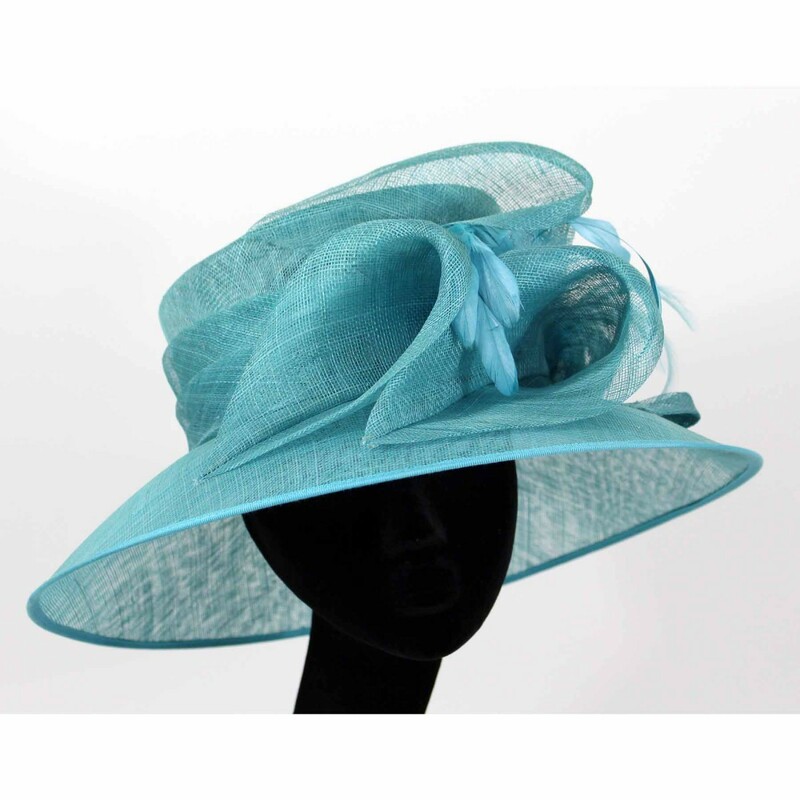 A tear drop aqua sinemay base with a abaca bow and pretty pearl detail. 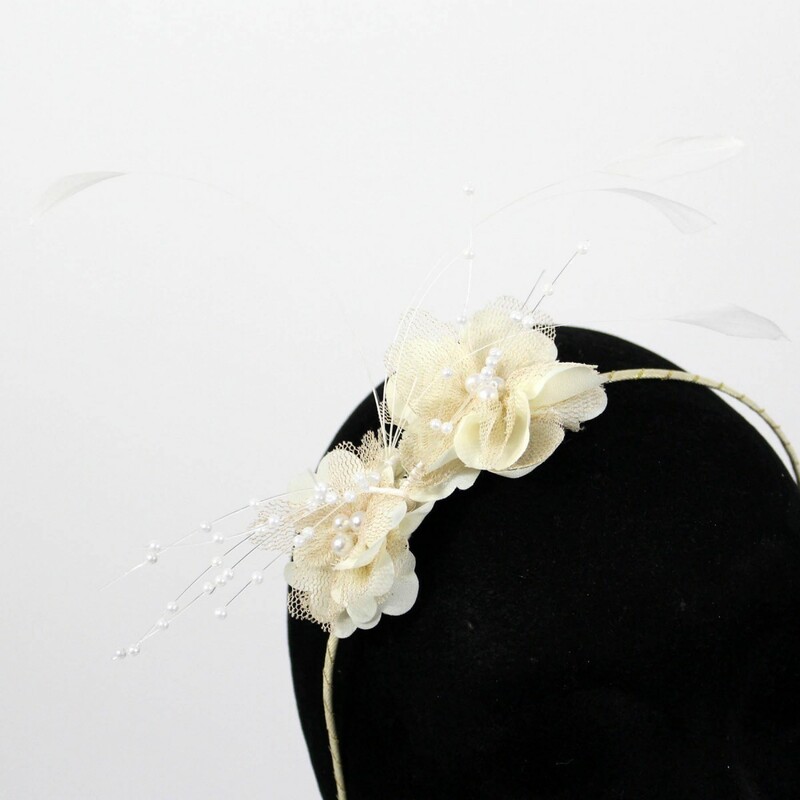 A classic Jane Taylor design, a beaded button headpiece adorned with wired double circlets. 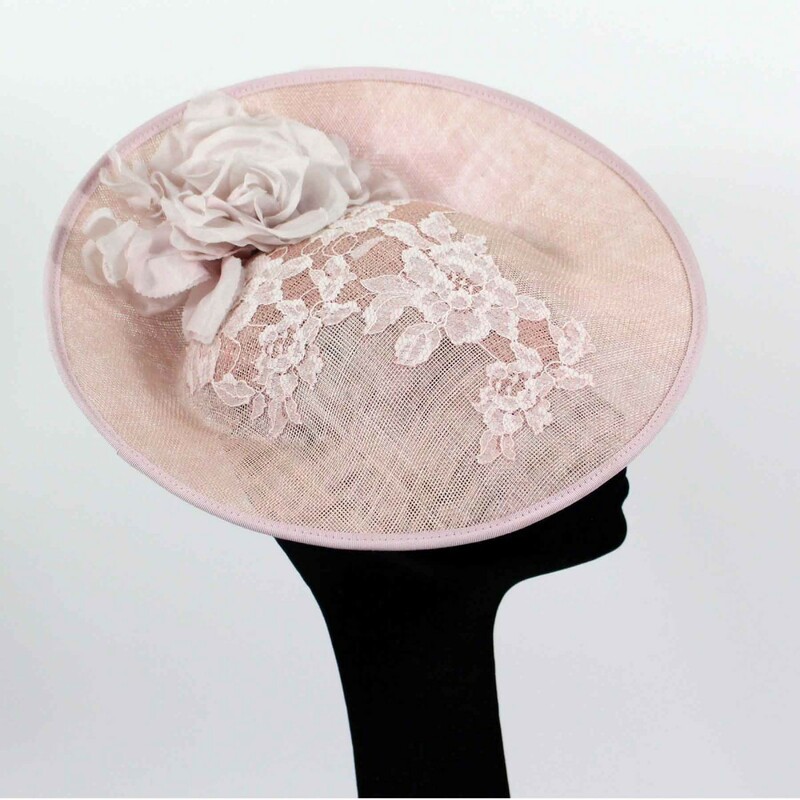 A beautifully feminine raspberry pink swirl with blush silk rose. 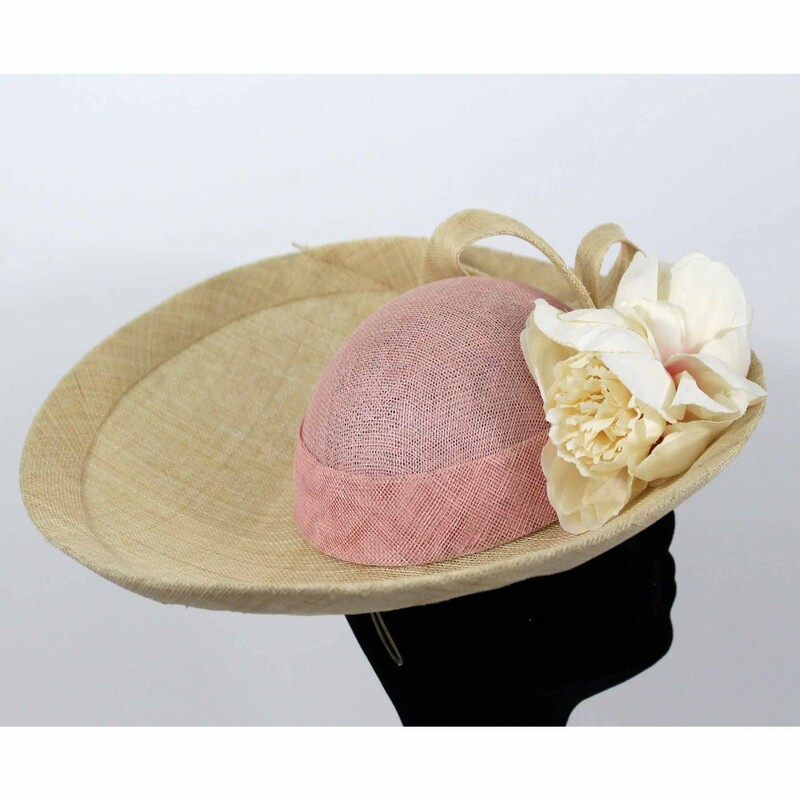 A light pink sinemay button with subtle veiling, embellished with delciate fushia and pink flowers. 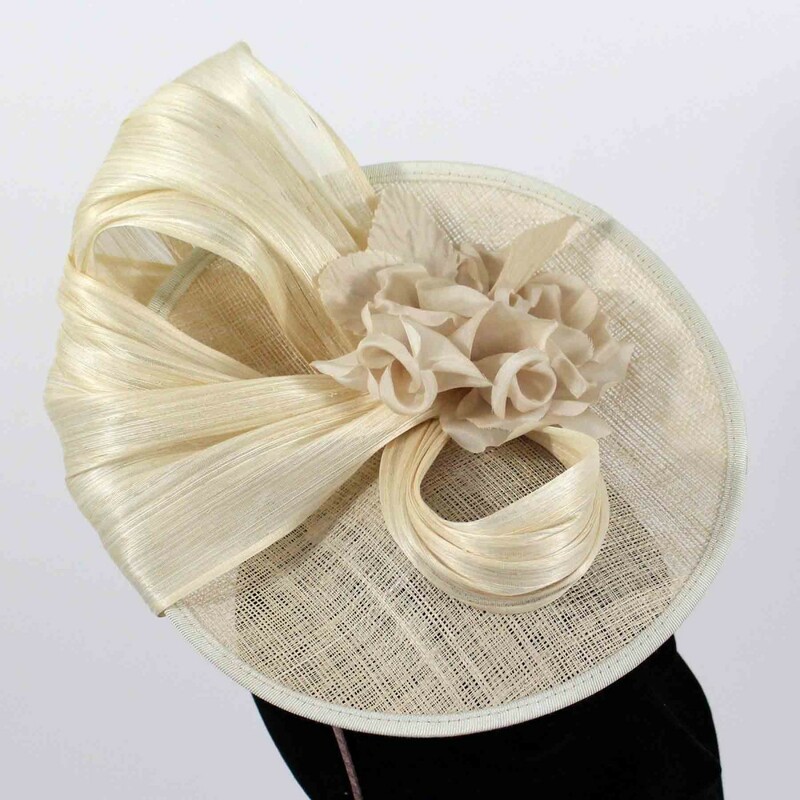 A classic blocked sisal beret with a neat silk abaca knot trim. 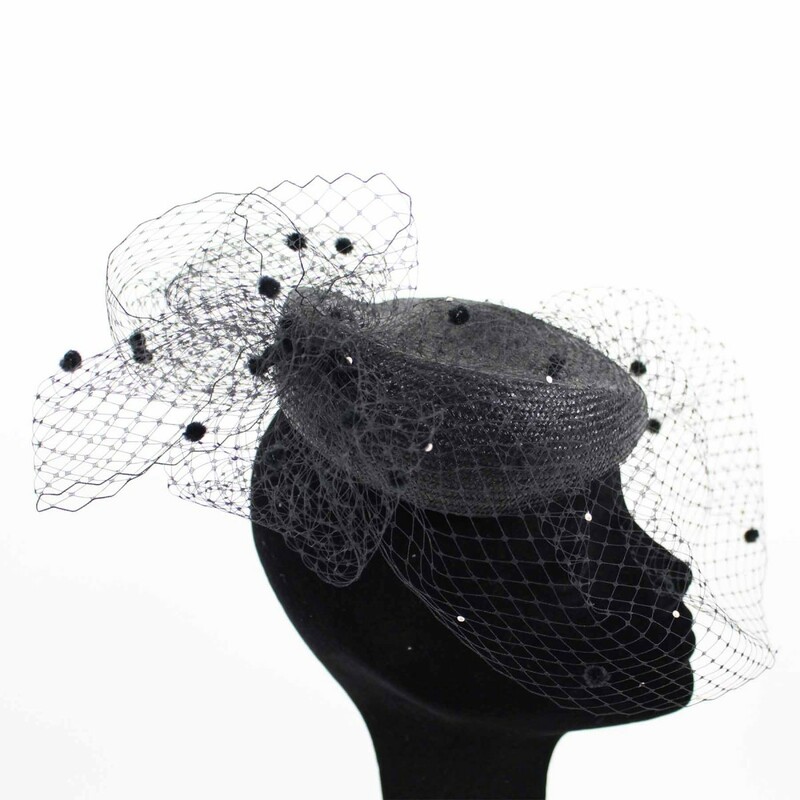 Soft veiling covers the face and glistens with carefully placed Swarovski crystals. A rose gold sequinned button adorned with an oyster and dusky pink silk flower and two stunning quills. 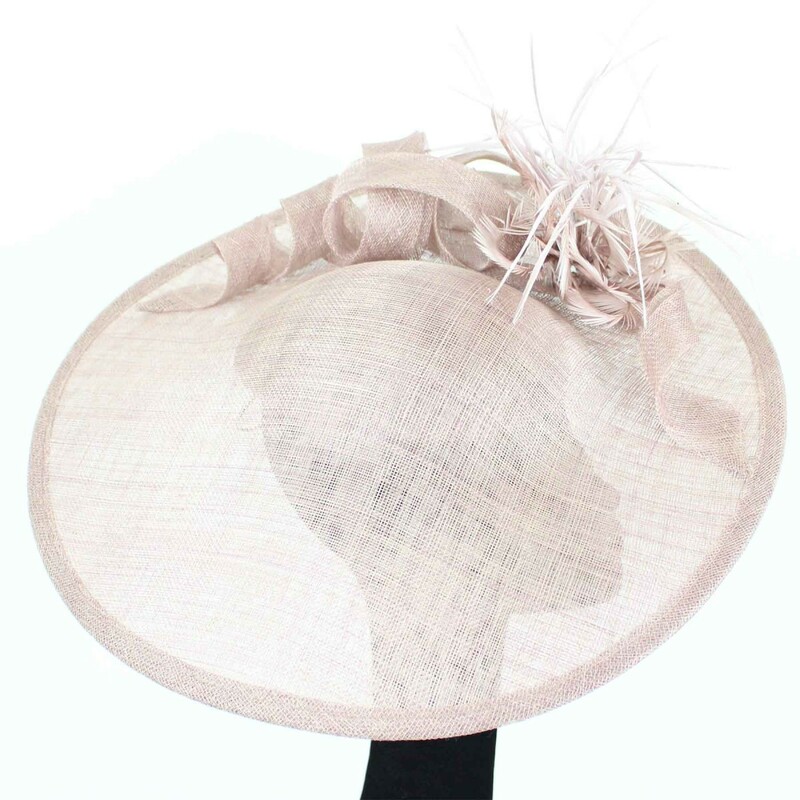 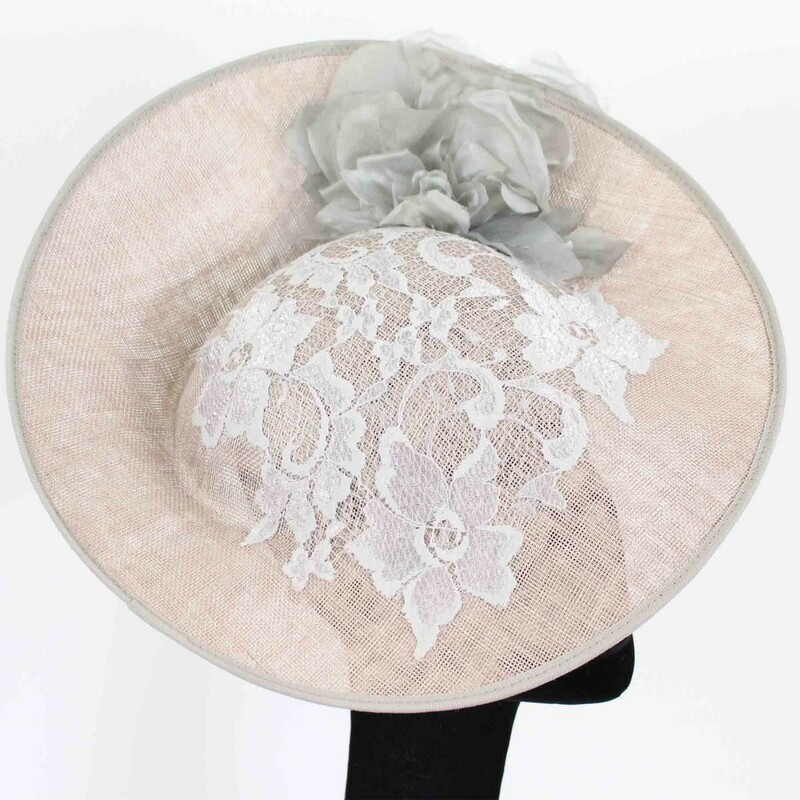 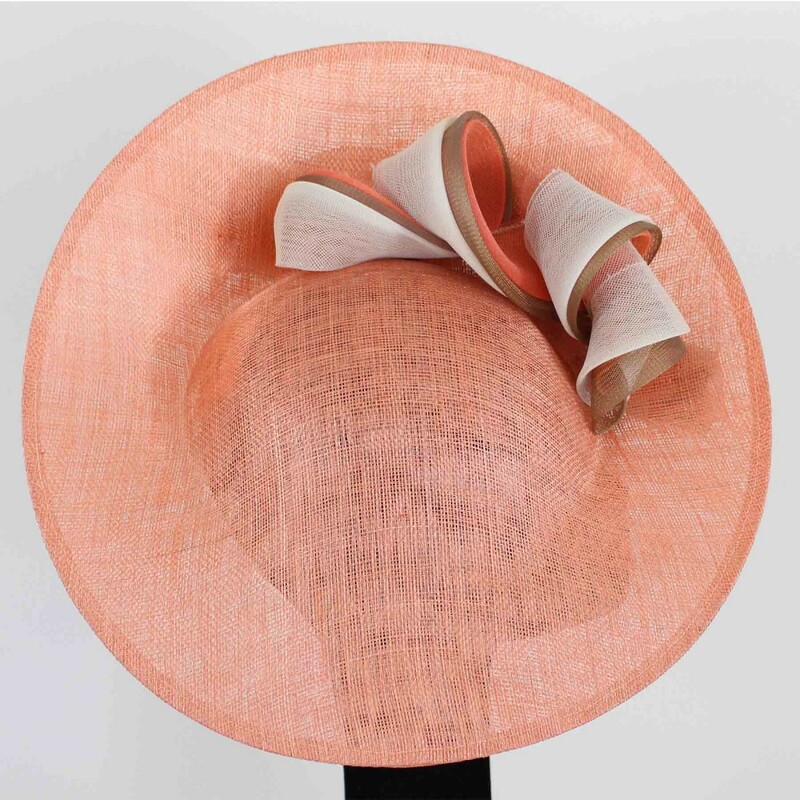 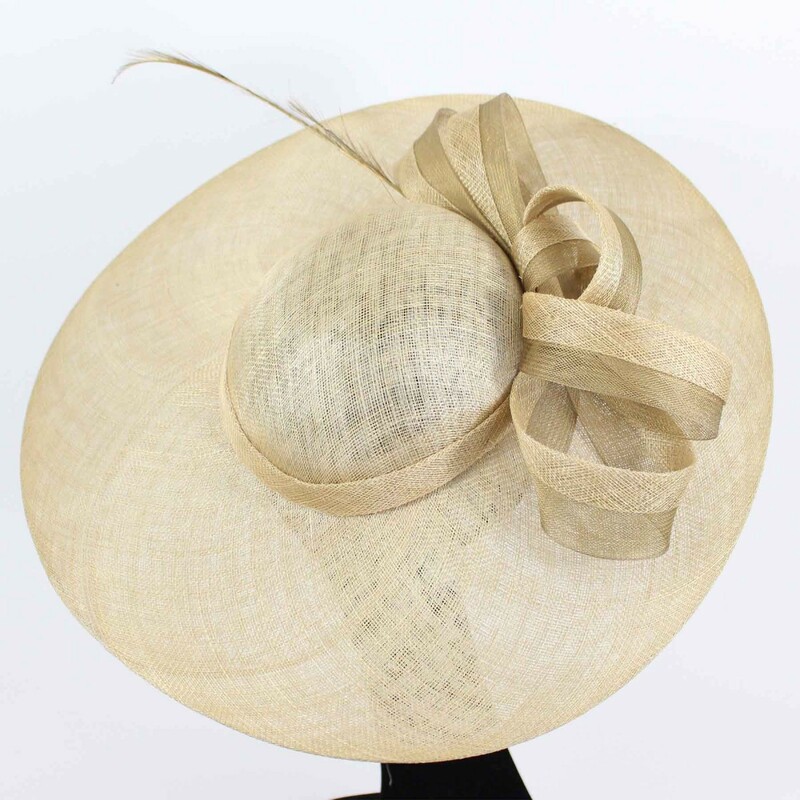 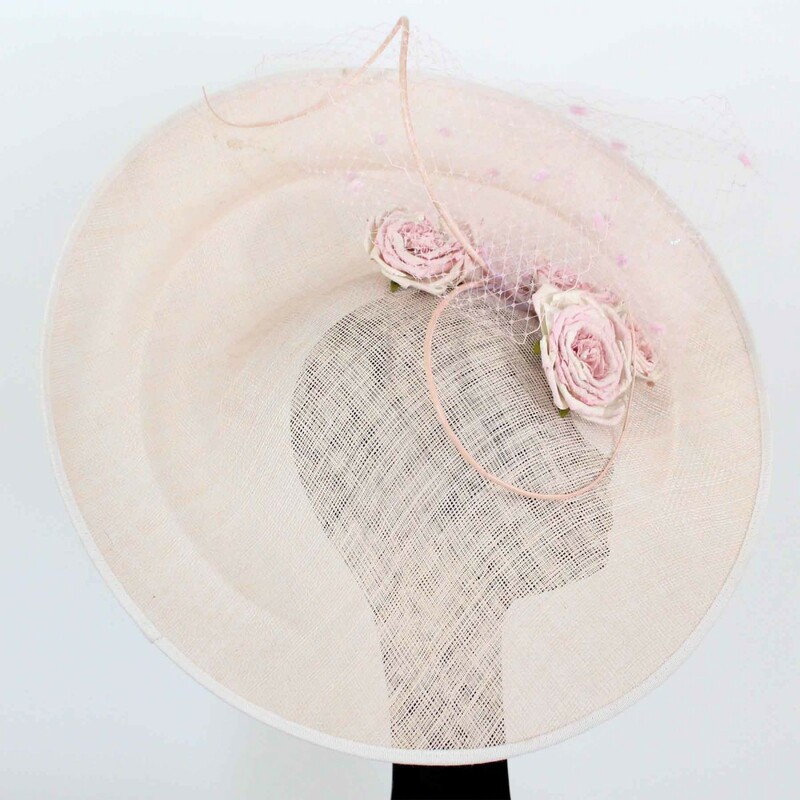 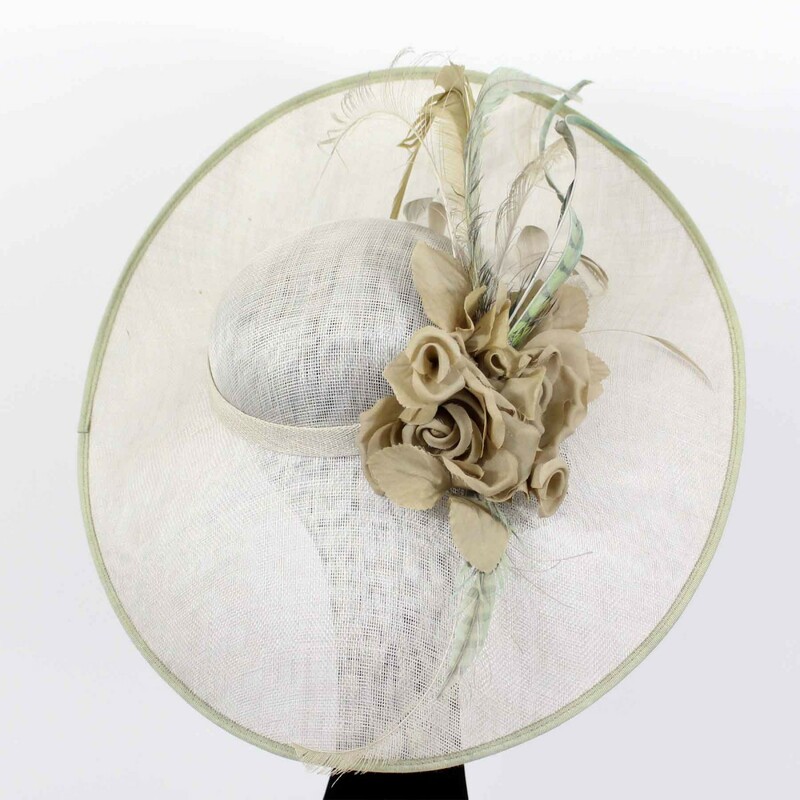 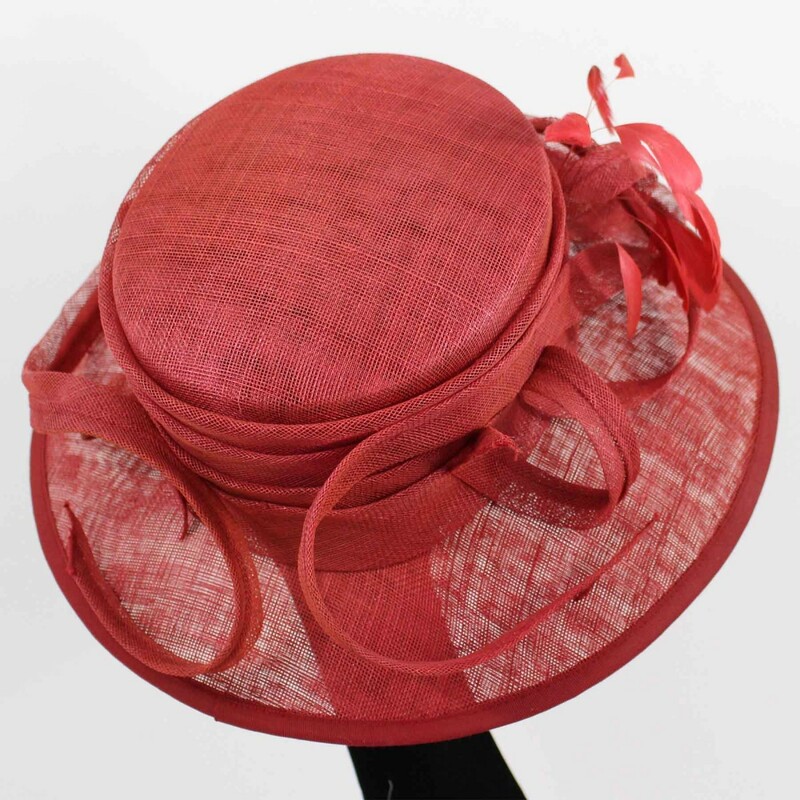 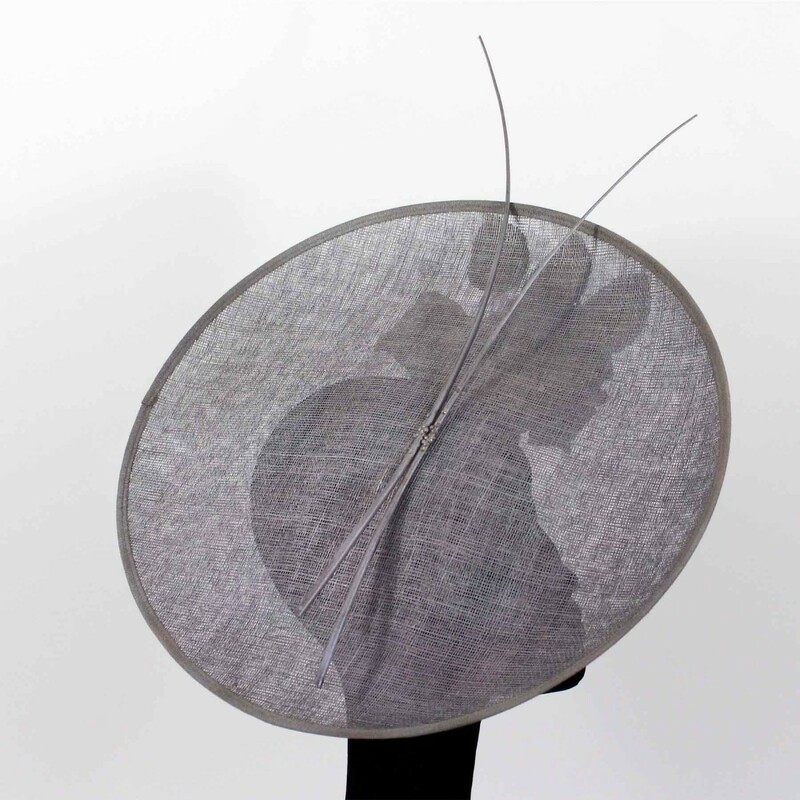 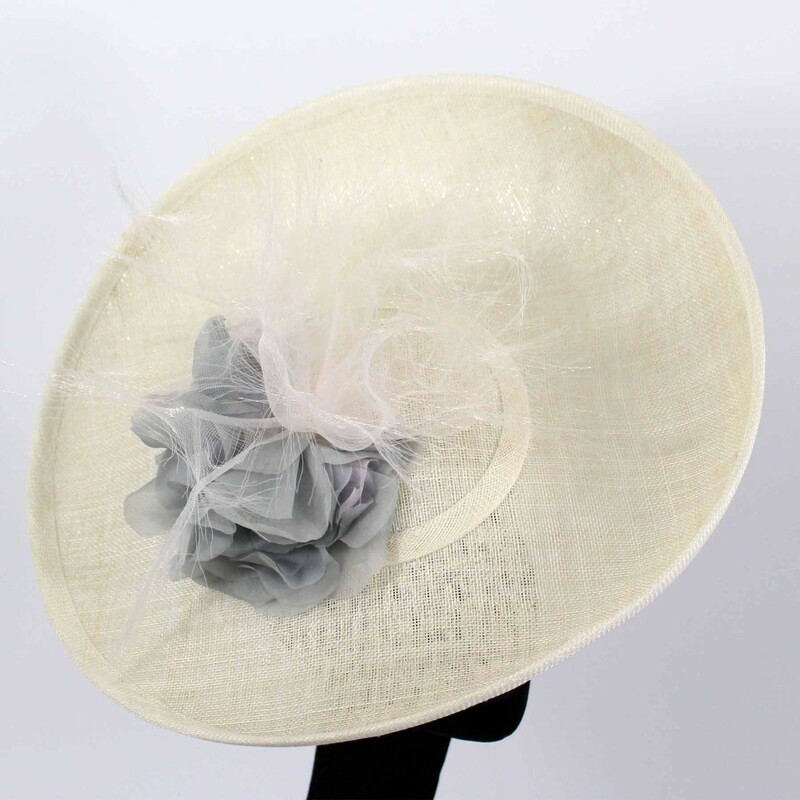 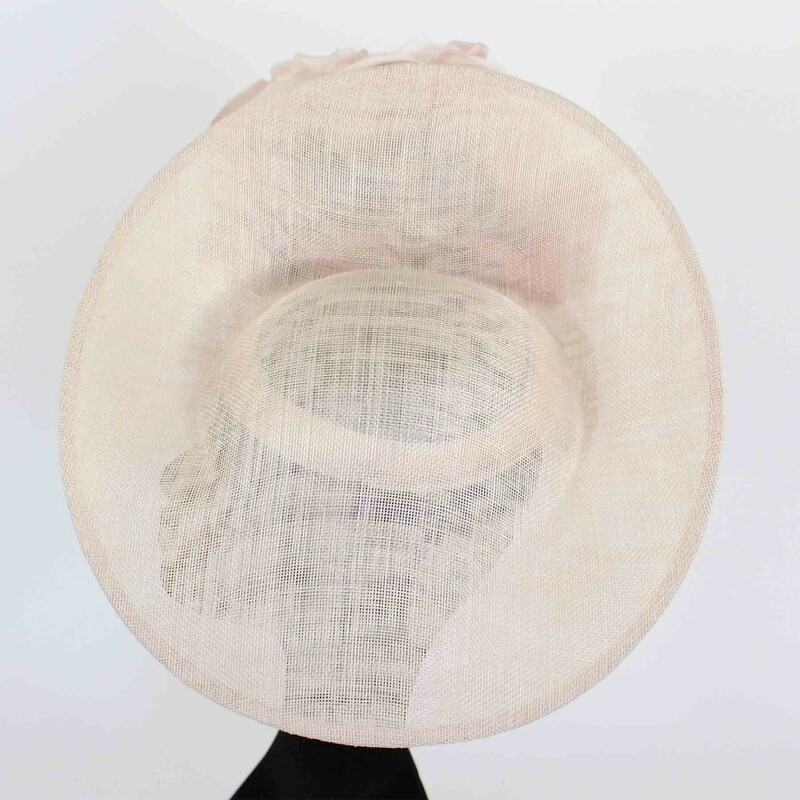 Woven sinamay blush and ivory fabrics creates a lightness for this large brim disc. 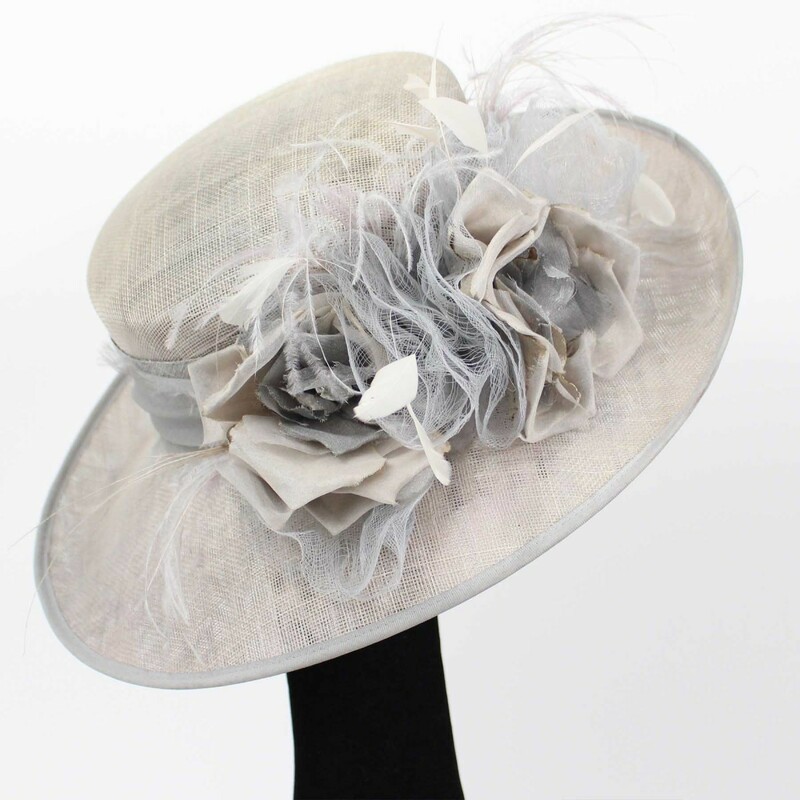 finished with a handmade feather flower, and finished with a beautiful matt silver touch on each feather. 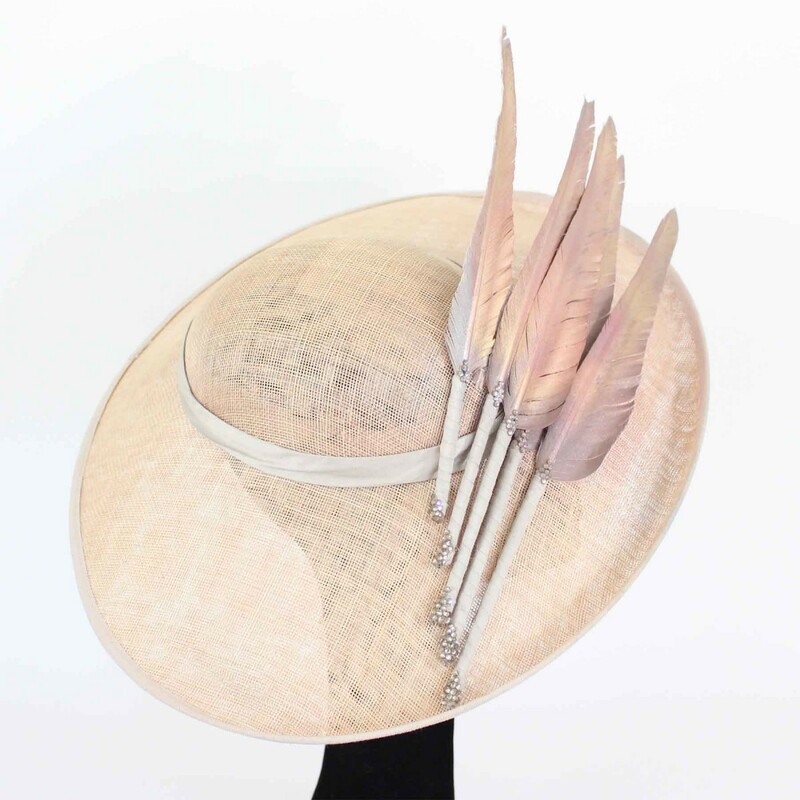 A hand formed blush sisal base, trimmed with a mixture of elegant pheasant and goose feathers in pink and ivory. 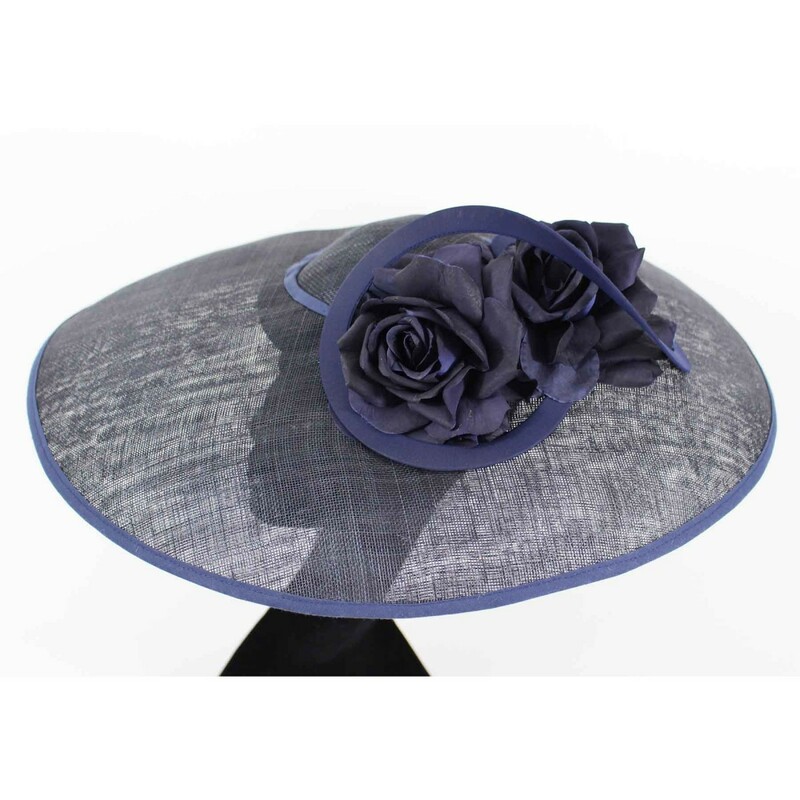 A simple and sophisticated medium disc style. 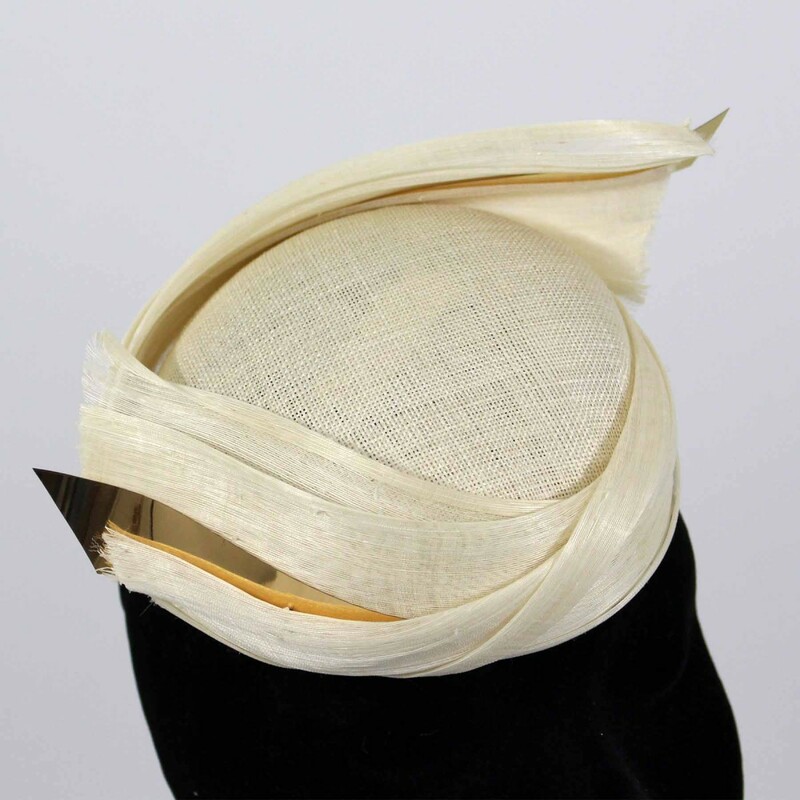 Layered pinokpok and woven sinamay, finished with a silk abaca knot. 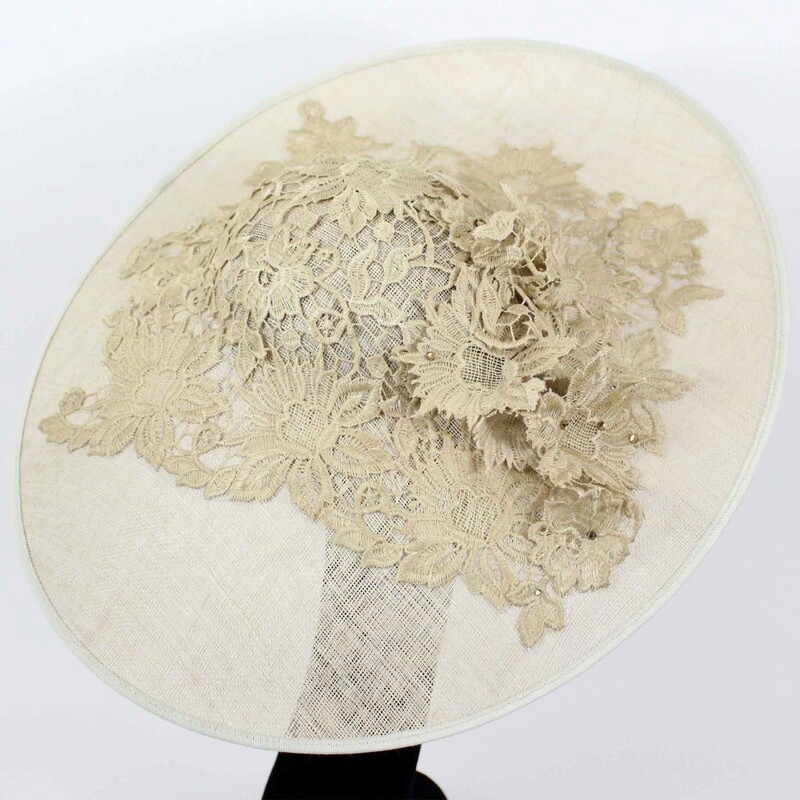 A crown of tonal flowers and silk abaca fabric sit centrally on a small sinamay base. 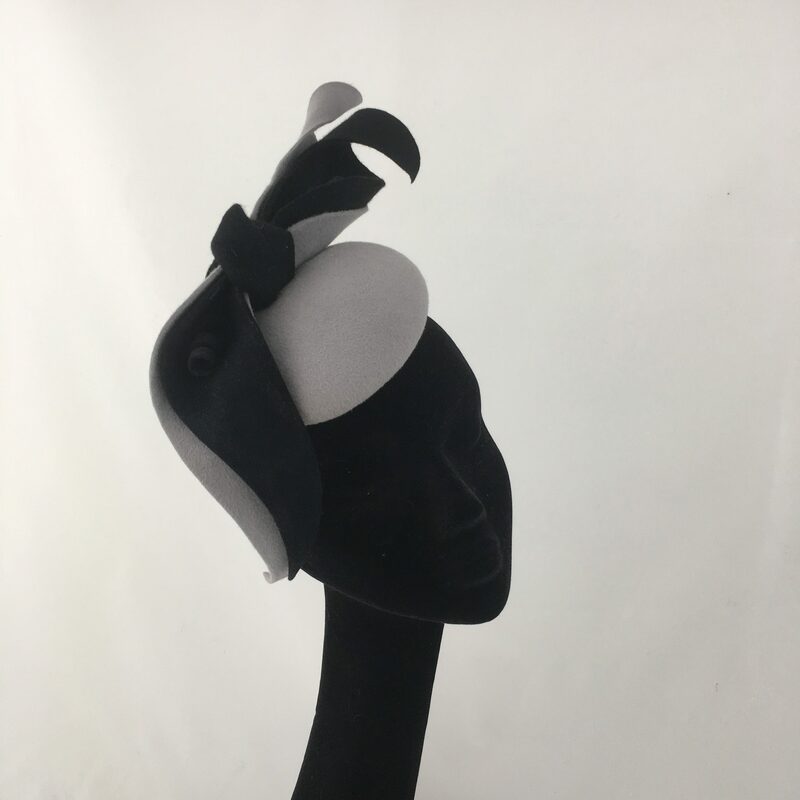 Finished with a full face veil, and held to the head on a neutral tone headband. 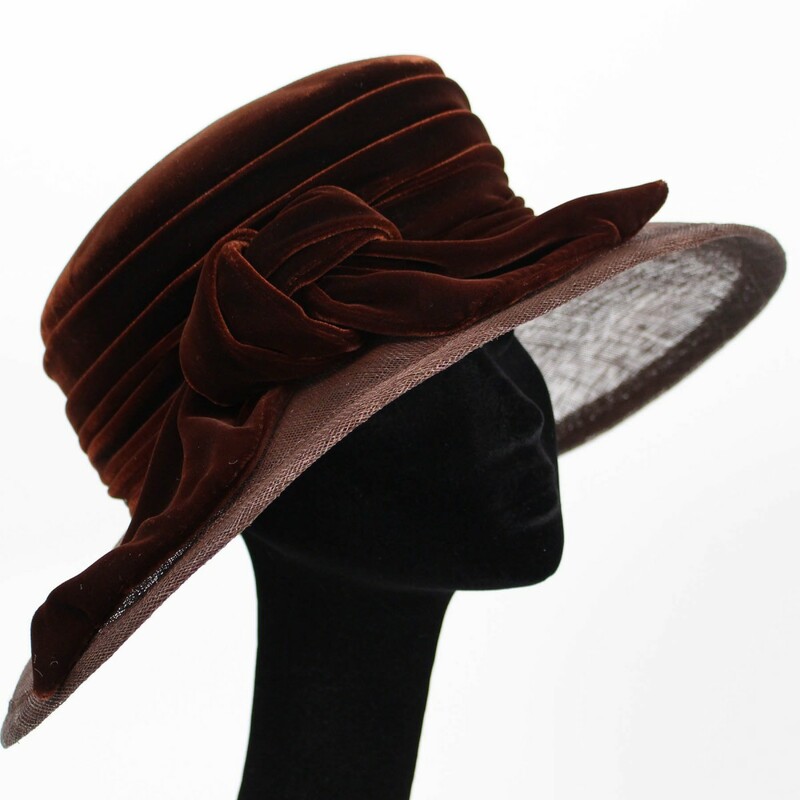 Luxurious and soft suede covers a blocked beret base shape. 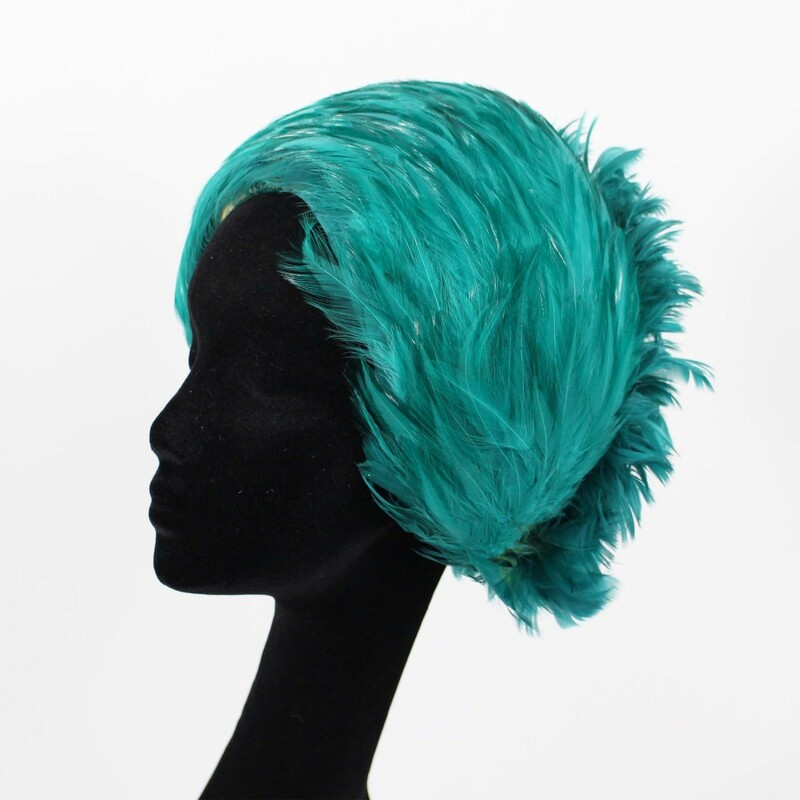 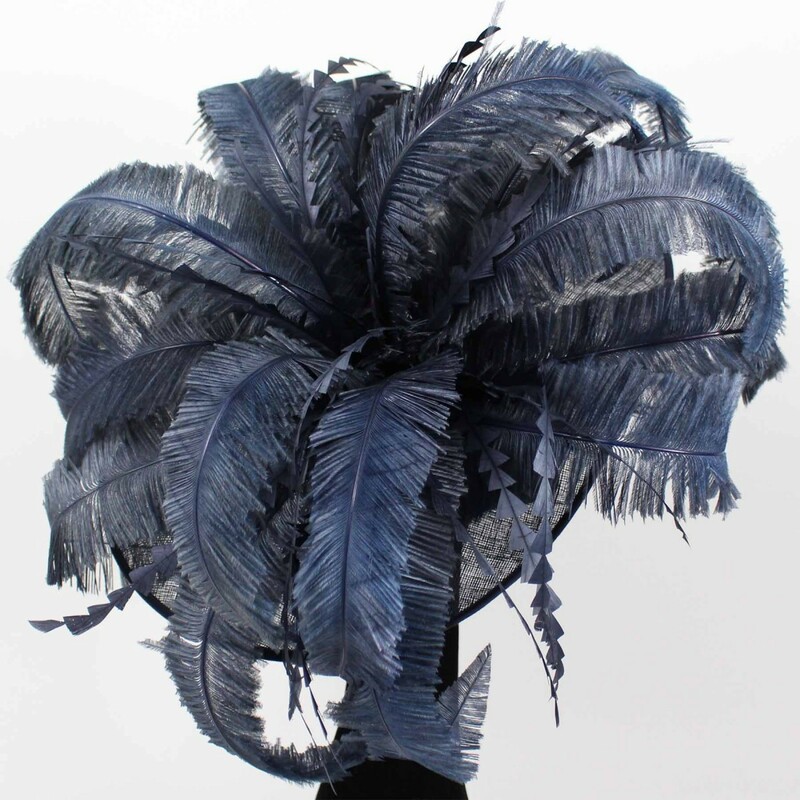 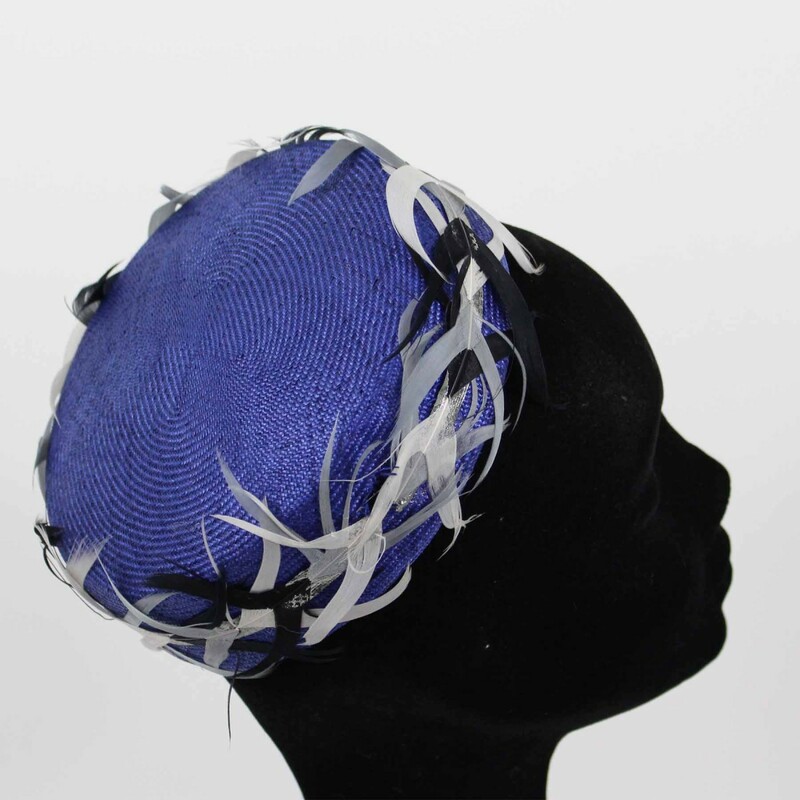 Hand dyed buntal fabric is formed into a simple twist and finished with shaped ostrich quills. 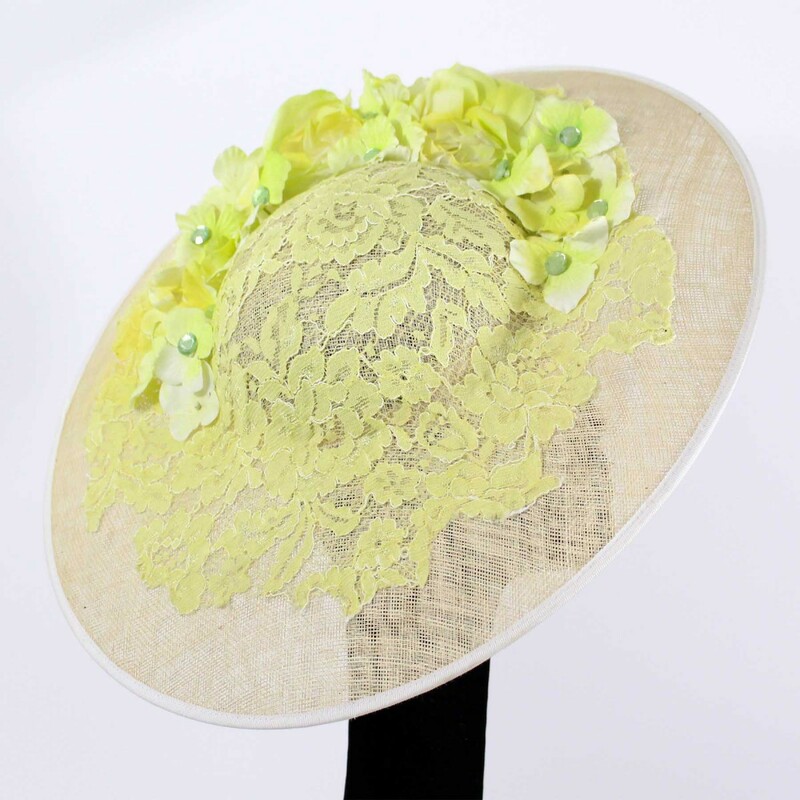 Delicate faux hydrangea petals nestle in the back for added detail. 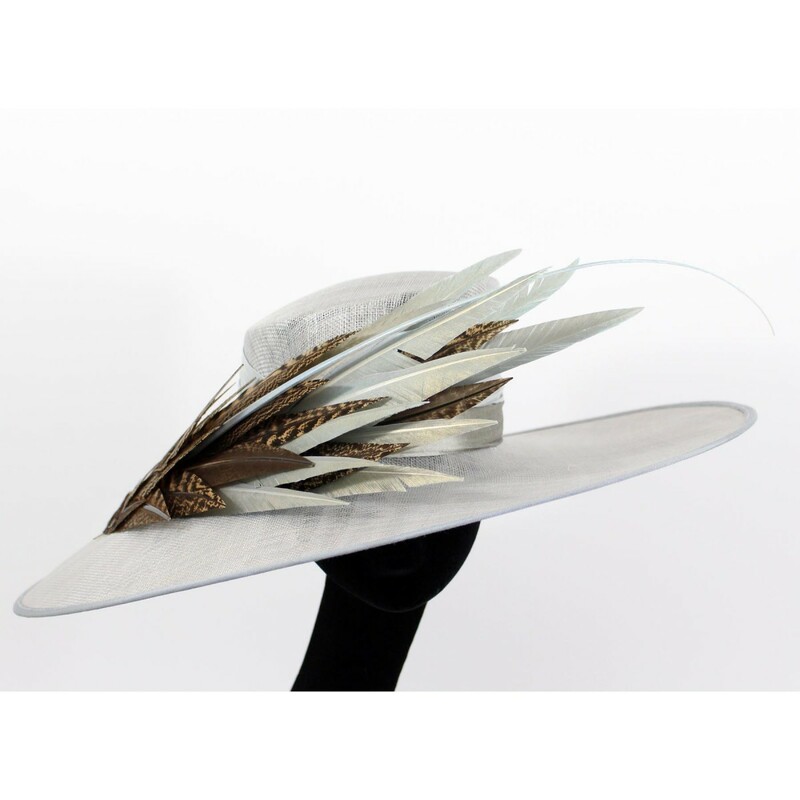 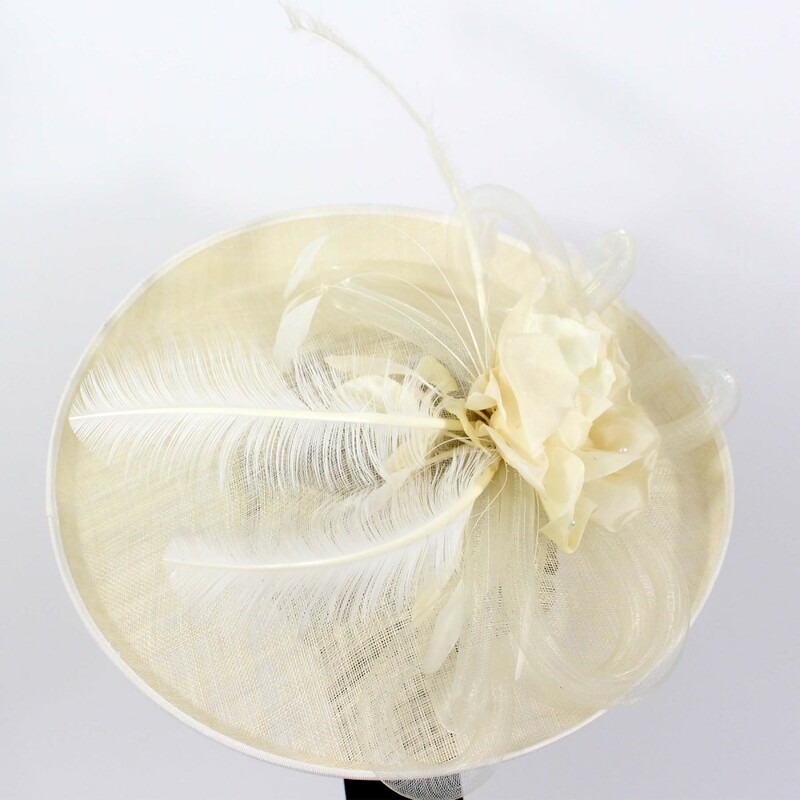 A classic wing headpiece is a real Vivien Sheriff signature. 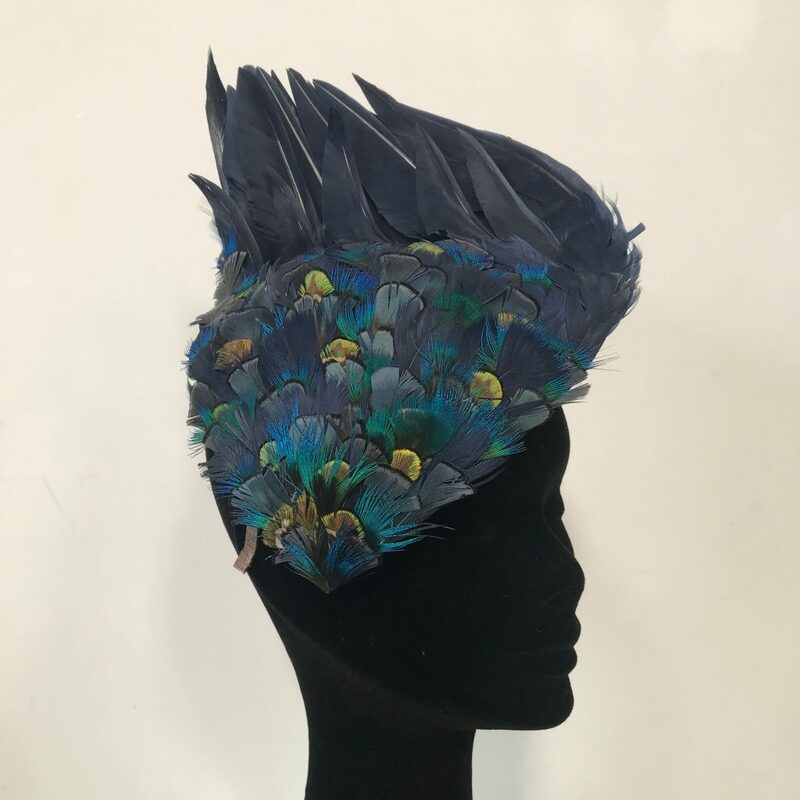 Shown here for SS19 in a deep peacock tone. 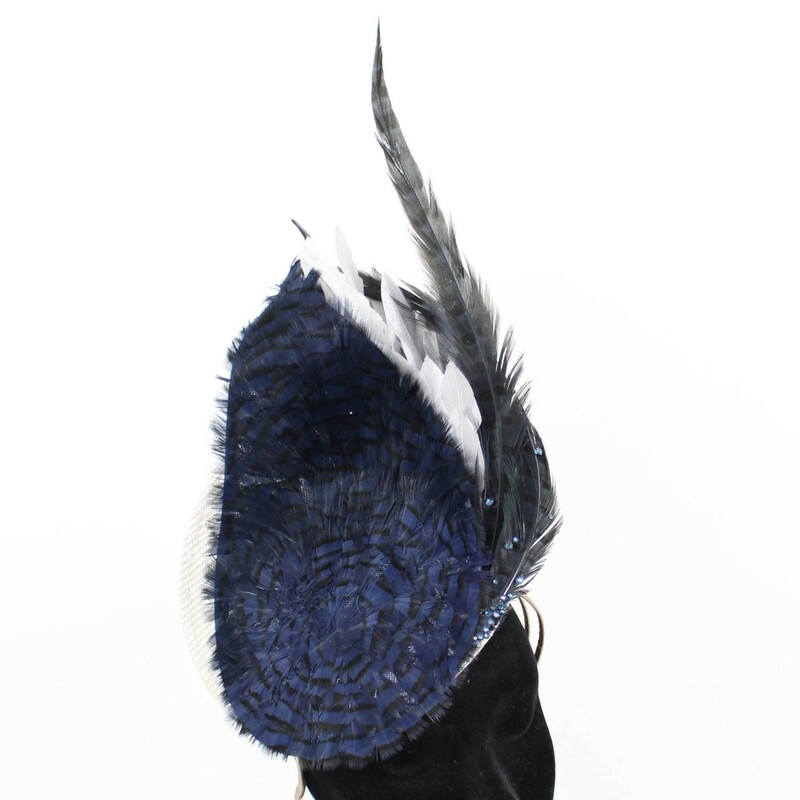 Navy goose feathers create the main wing, transforming into goose, peacock and pheasant plumage. This blocked teardrop shaped beret base is covered with luxurious suede and trimmed with fans of silk abaca fabric. 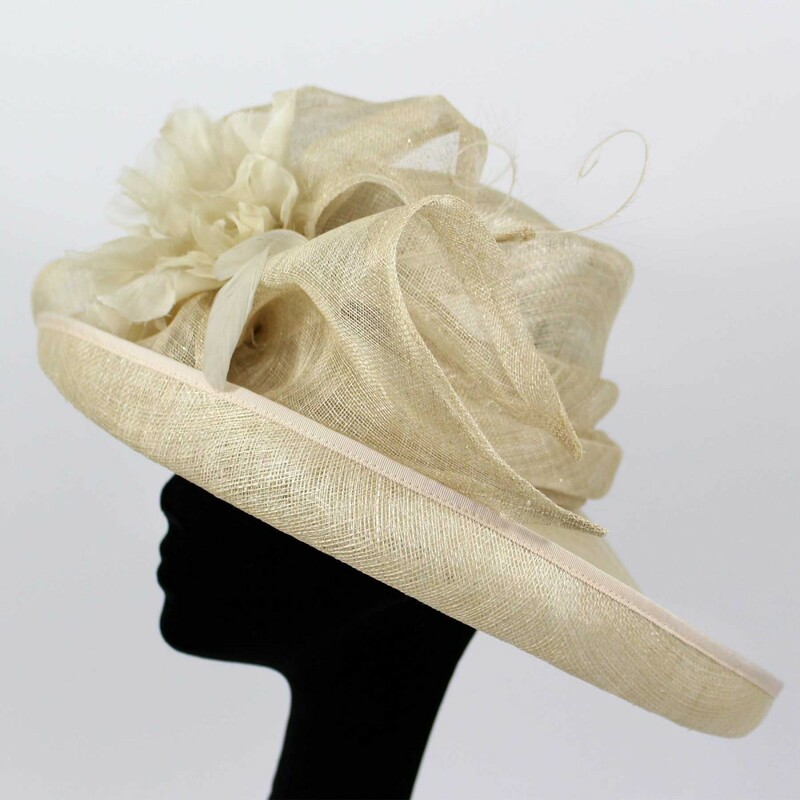 A soft gold low crown with a flower and delicate lace lining the underside. 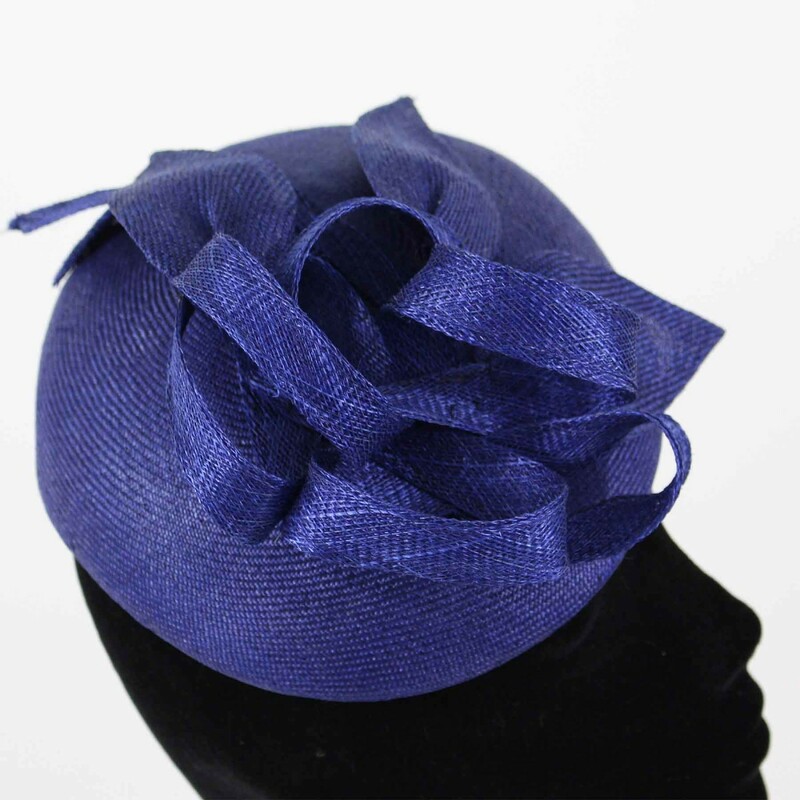 Our hugely popular style, new for this season in blue. 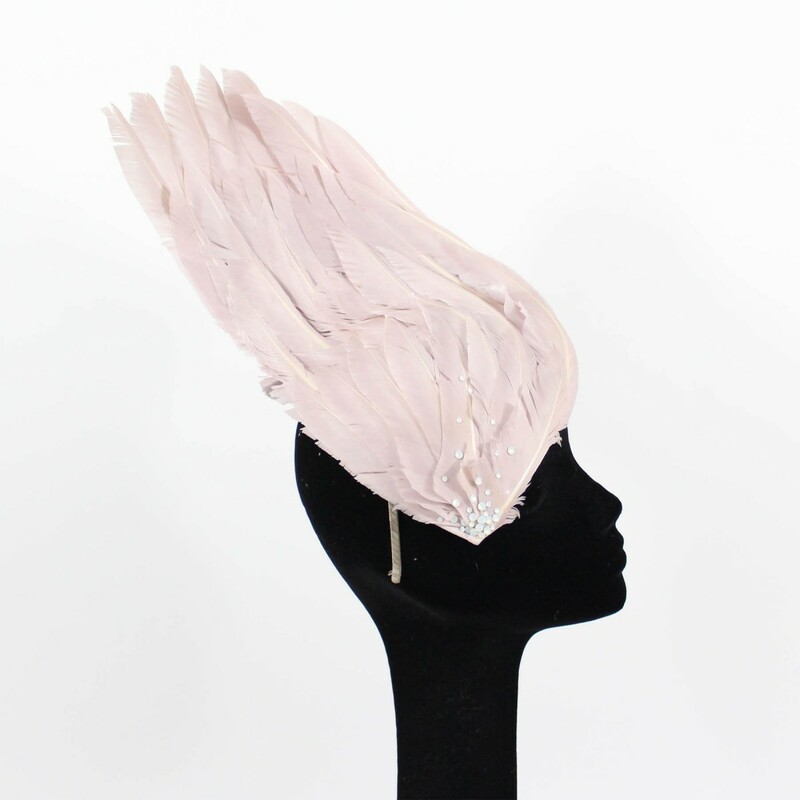 Pink and grey feather headband. 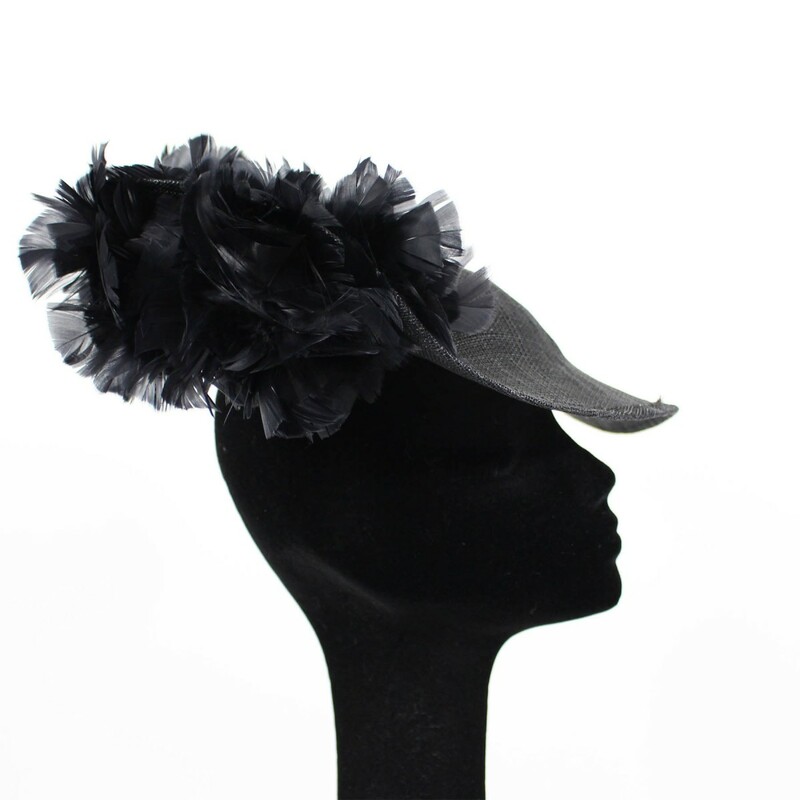 Black and white feather headband. 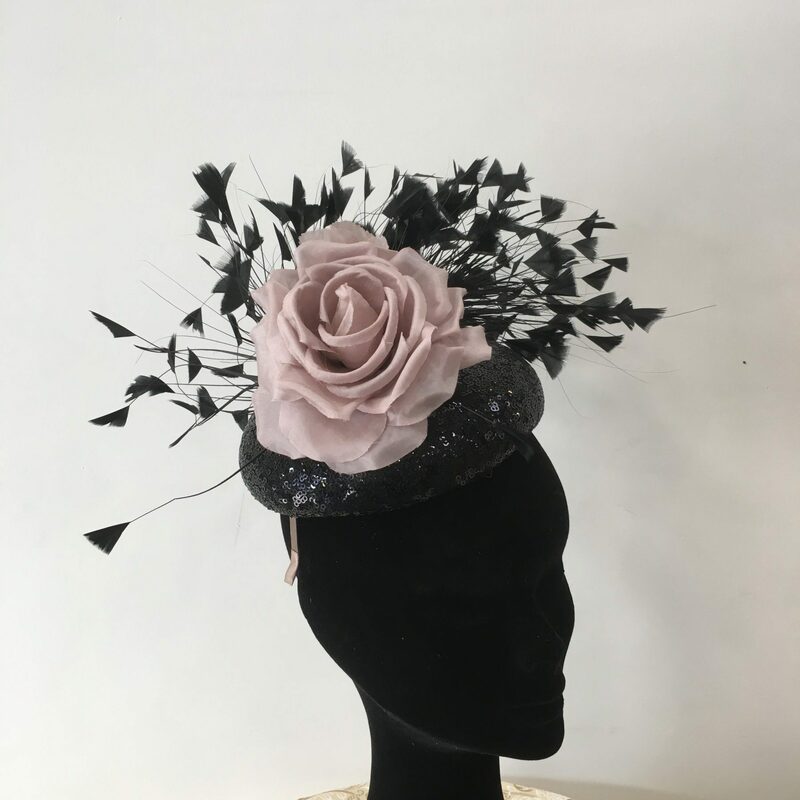 A glamorous black sequin button adorned with a blush pink flower and finished with black feathers. 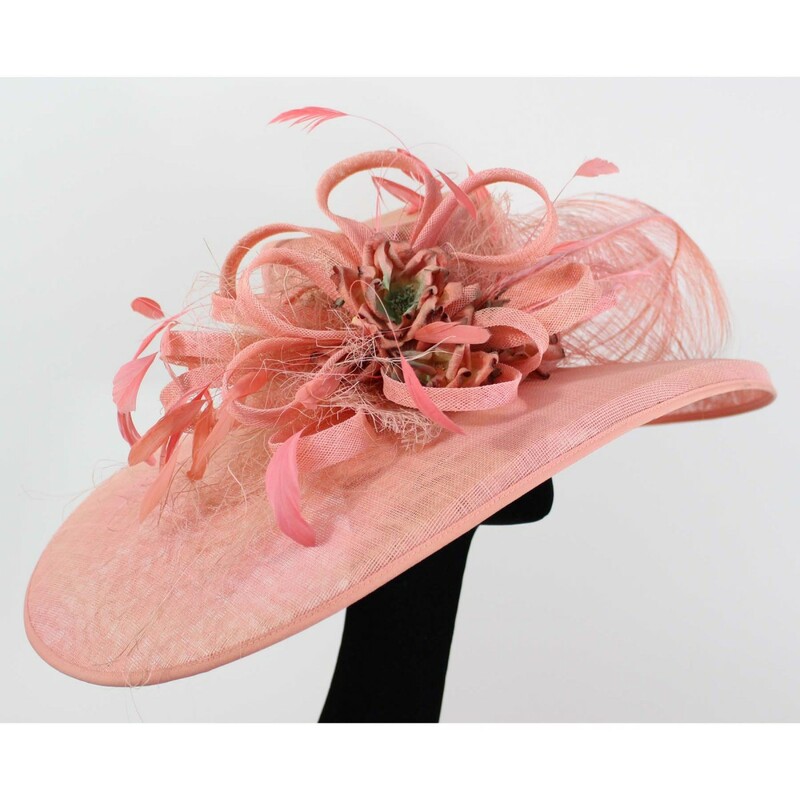 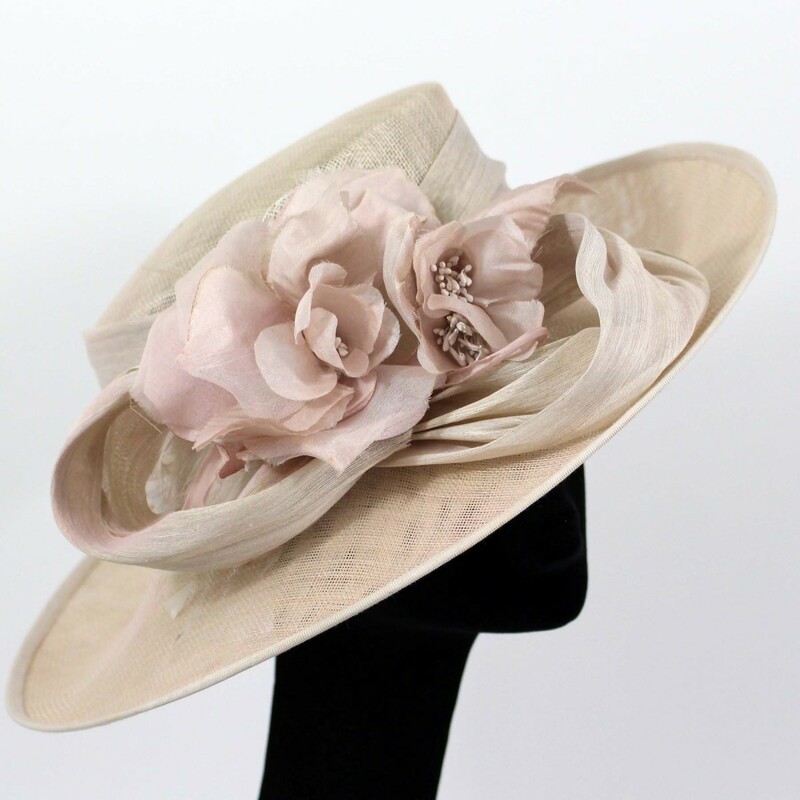 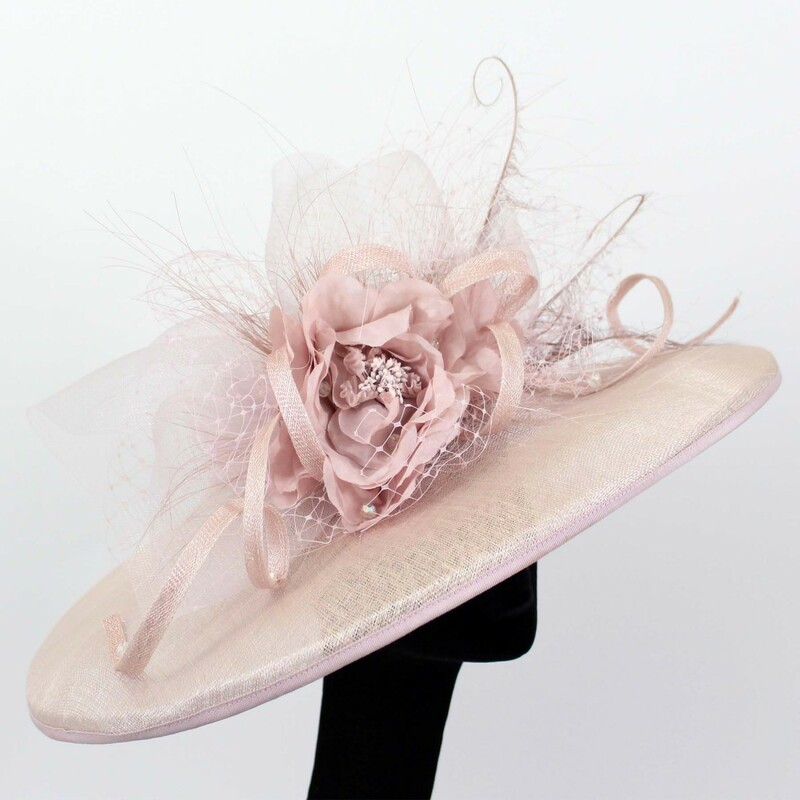 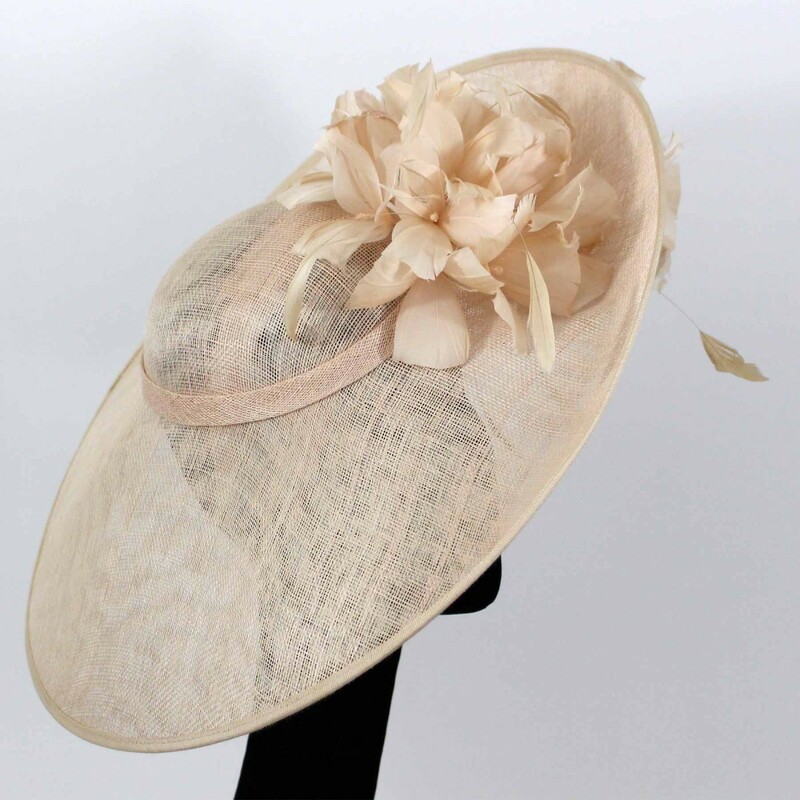 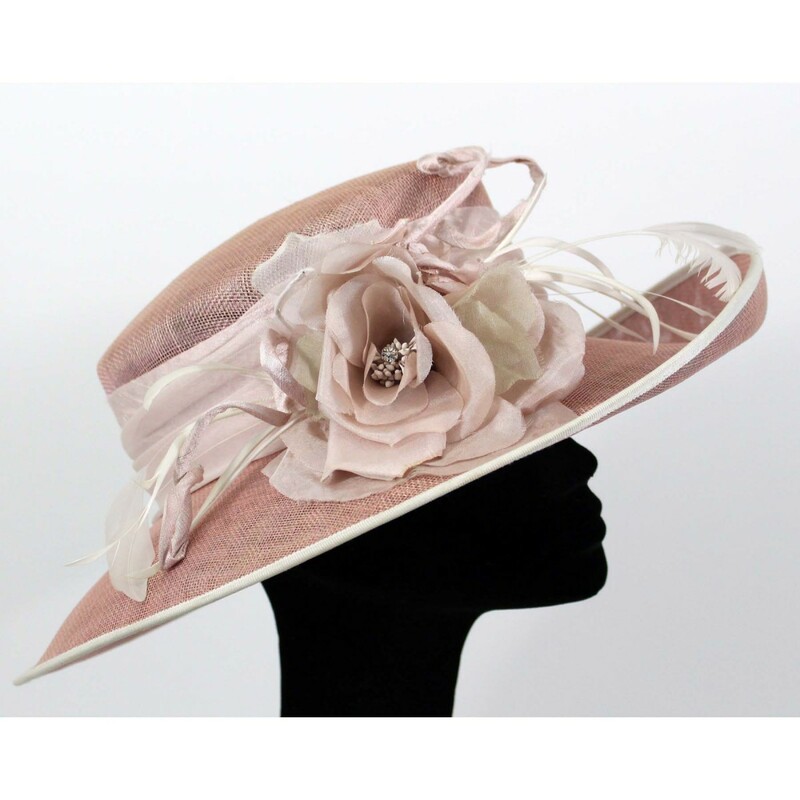 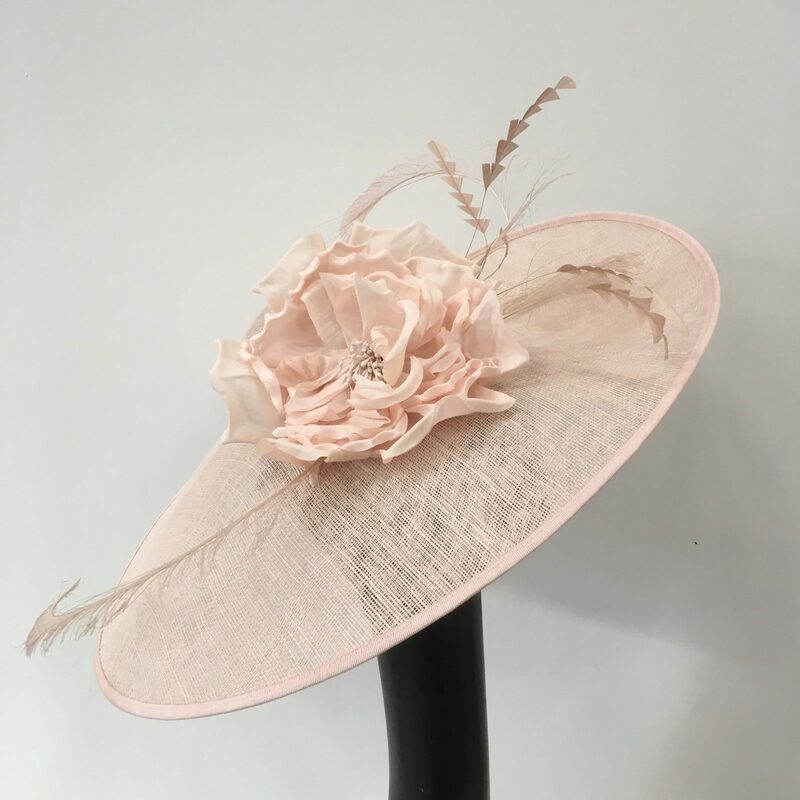 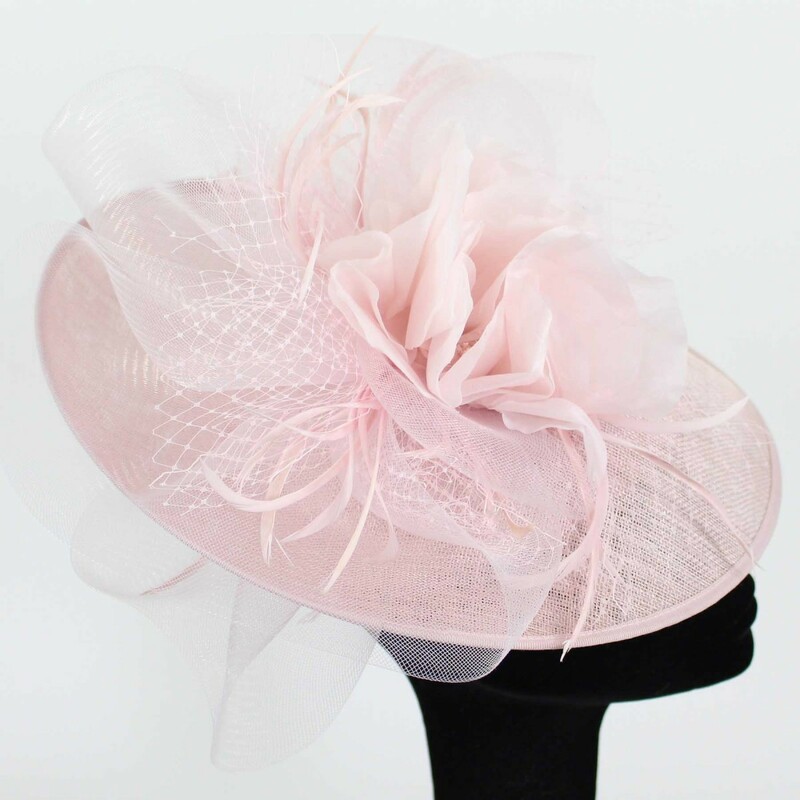 A blush peach wide brimmed headpiece with a low crown and beautiful flower detail. 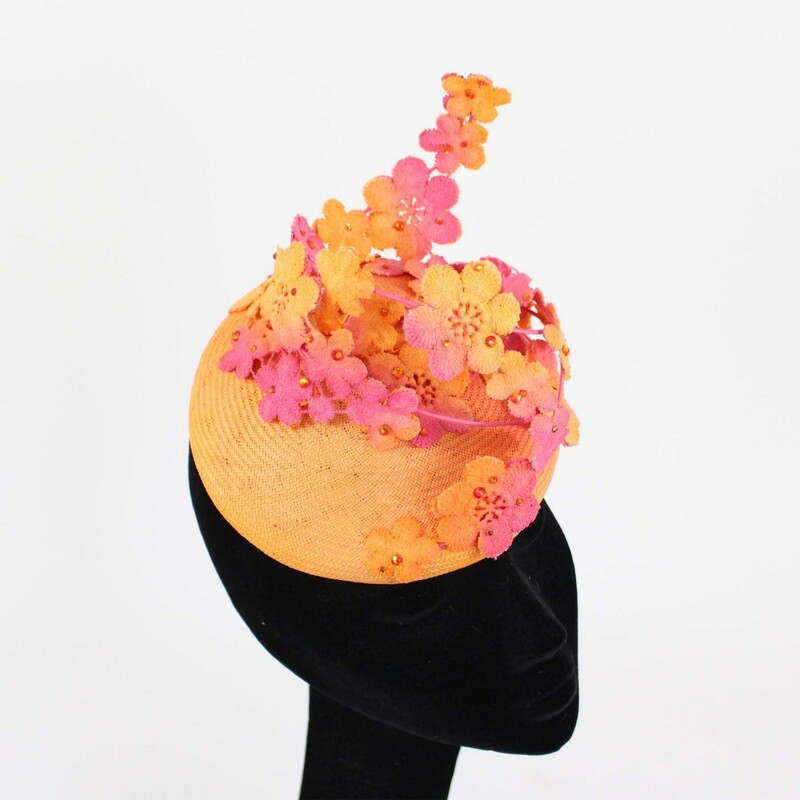 A stunning summery piece. 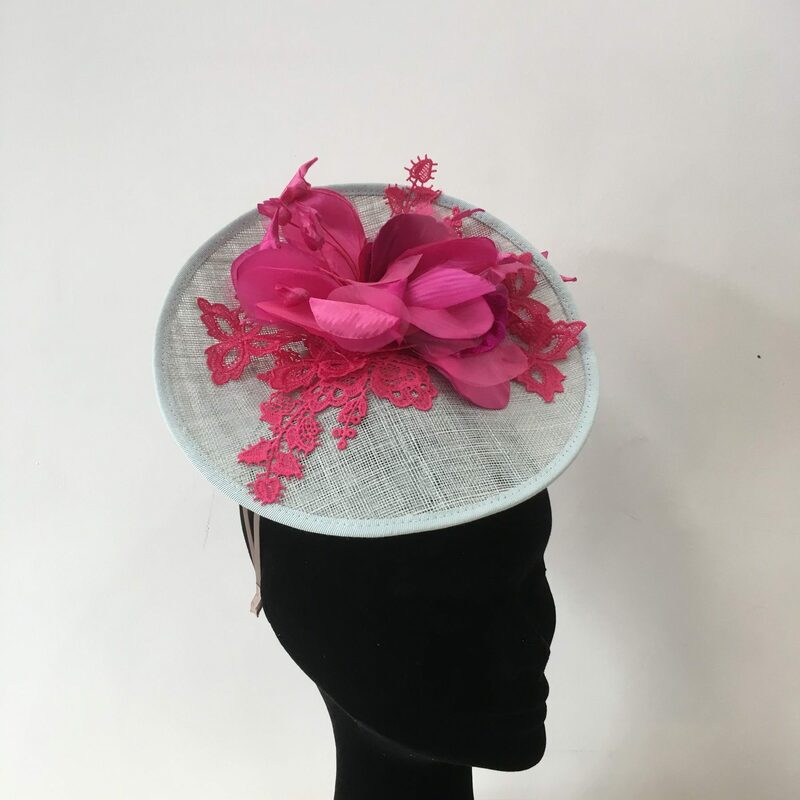 An aqua small plate adorned with cerise silk flowers and lace, and silk flower detail on the underside. 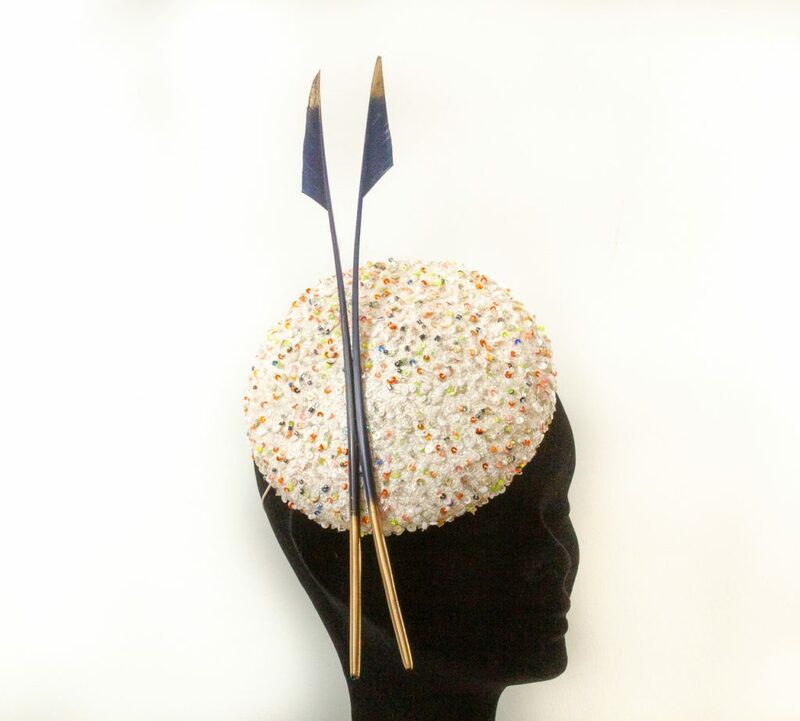 A fabulously fun piece. 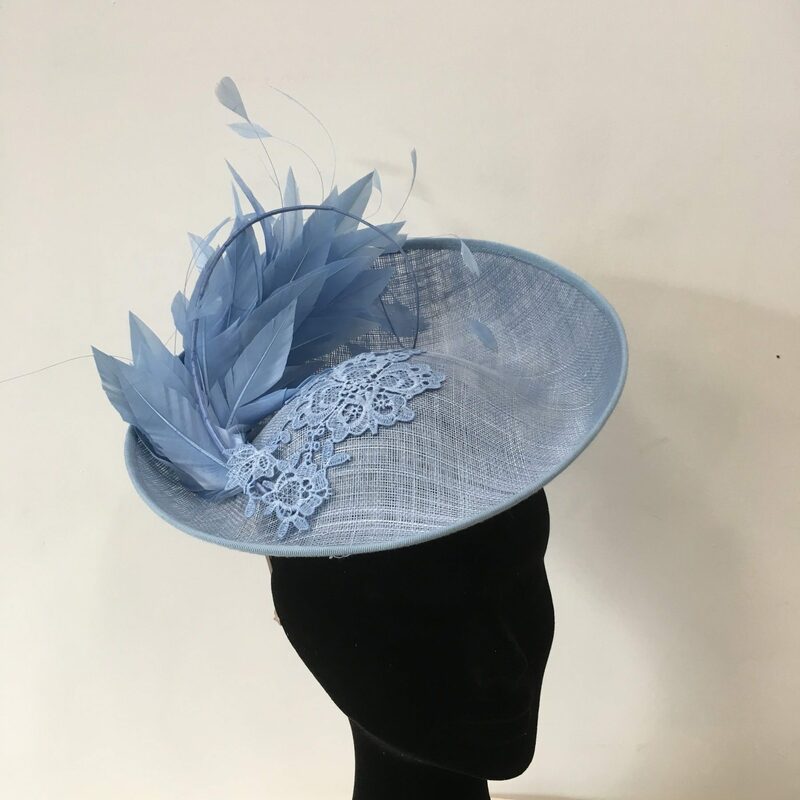 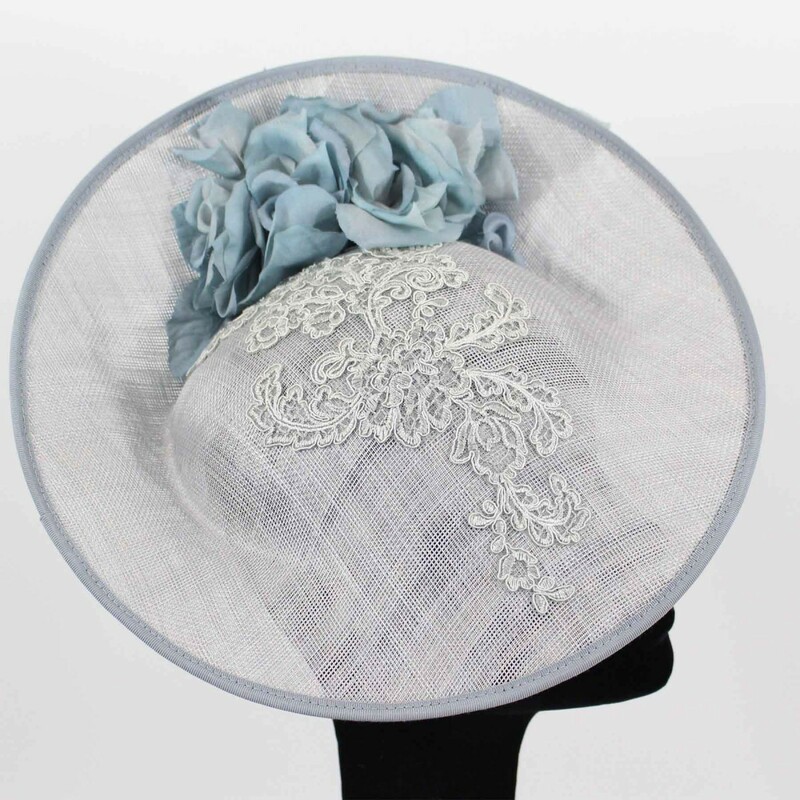 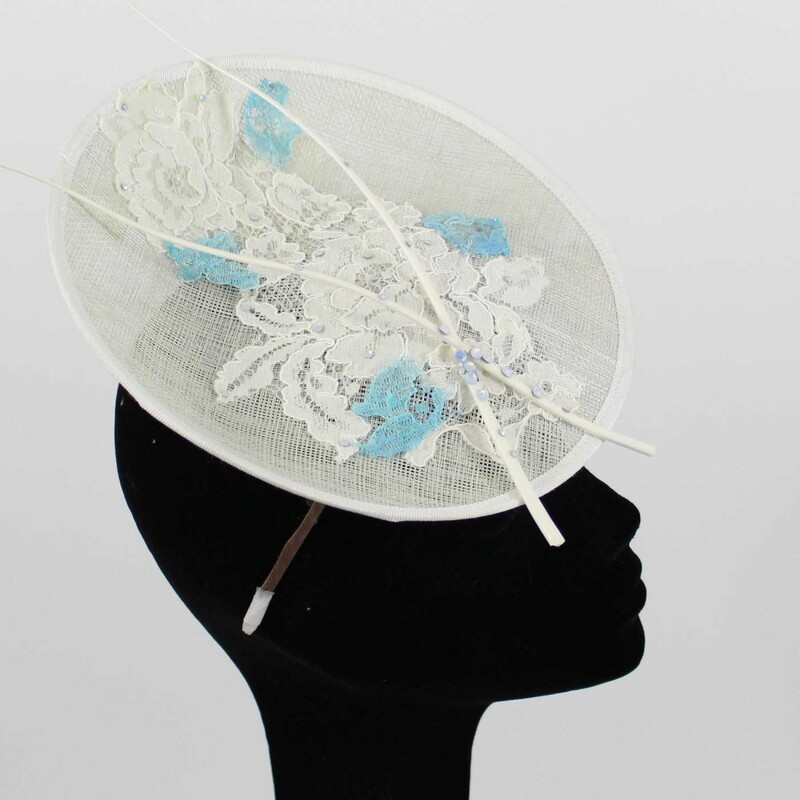 Powder blue upturn saucer adorned with feathers and beautiful lace. 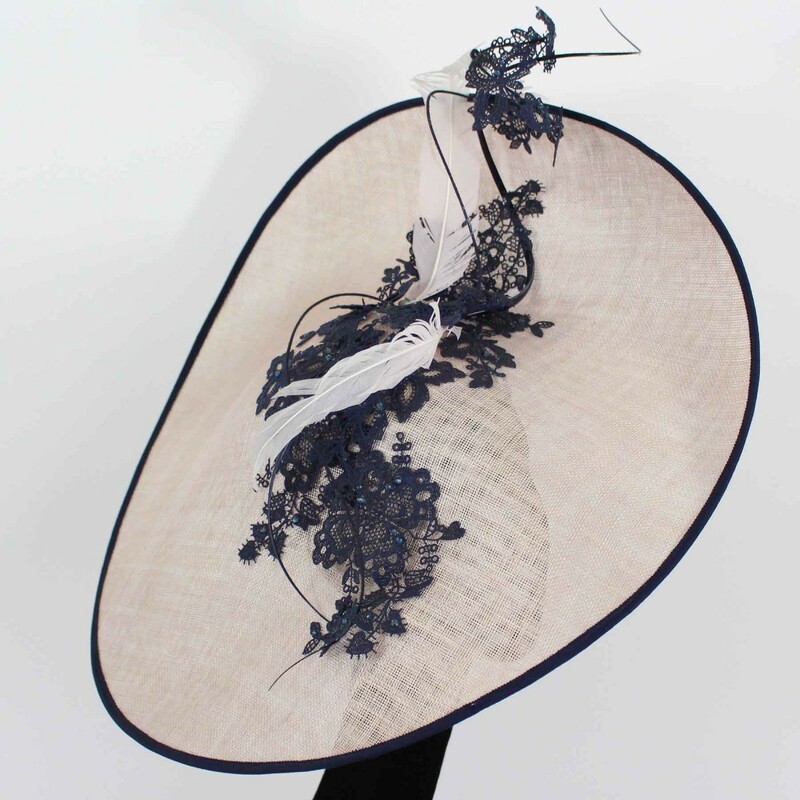 A neat white sinamay saucer adorned with a spray of navy feathers and navy lace. 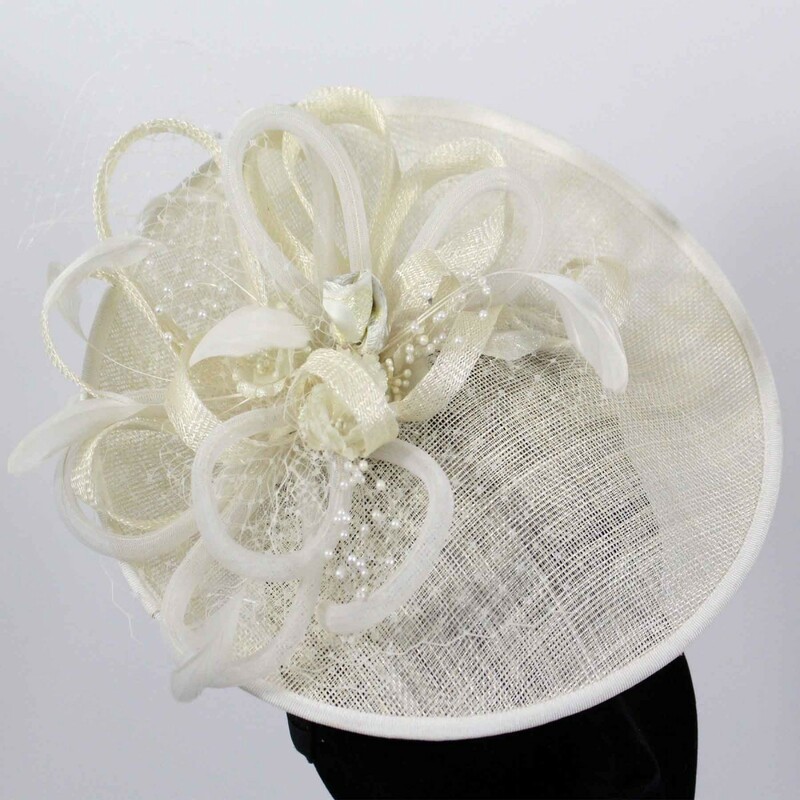 A beautiful ivory and soft gold plate adorned with delicate lace detail and gold bow. 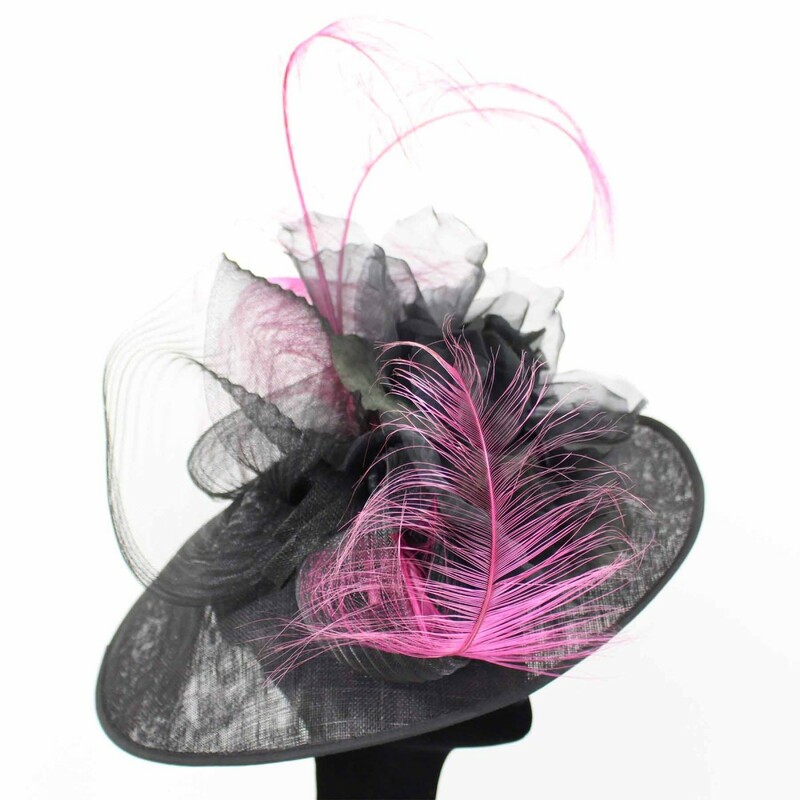 A contemporary pink leather beret adorned with a leather rose and delicate feather detail. 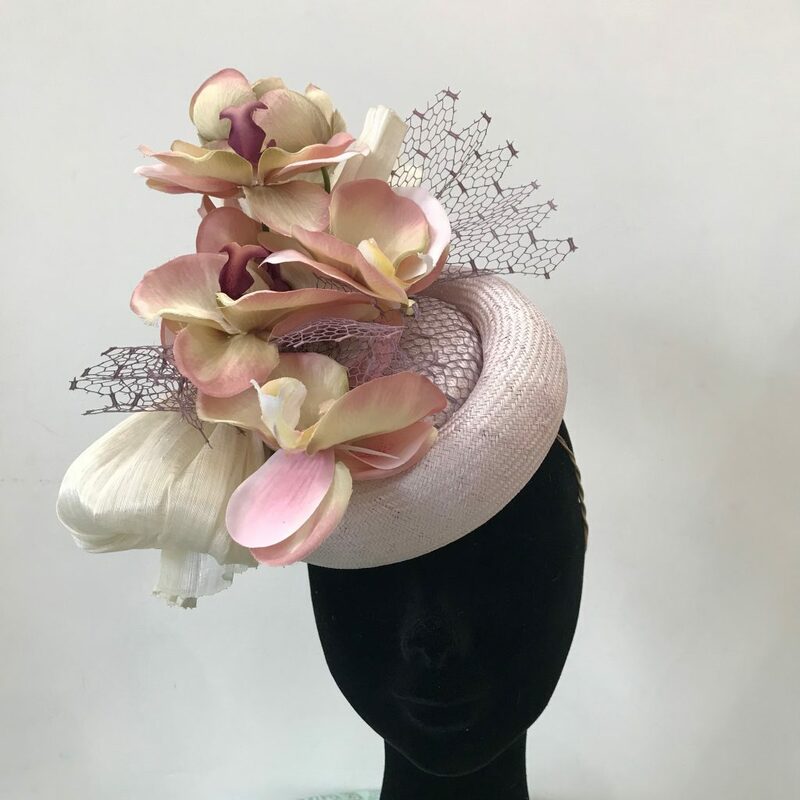 A stunning blush headpiece adorned with orchids and and ivory bow. 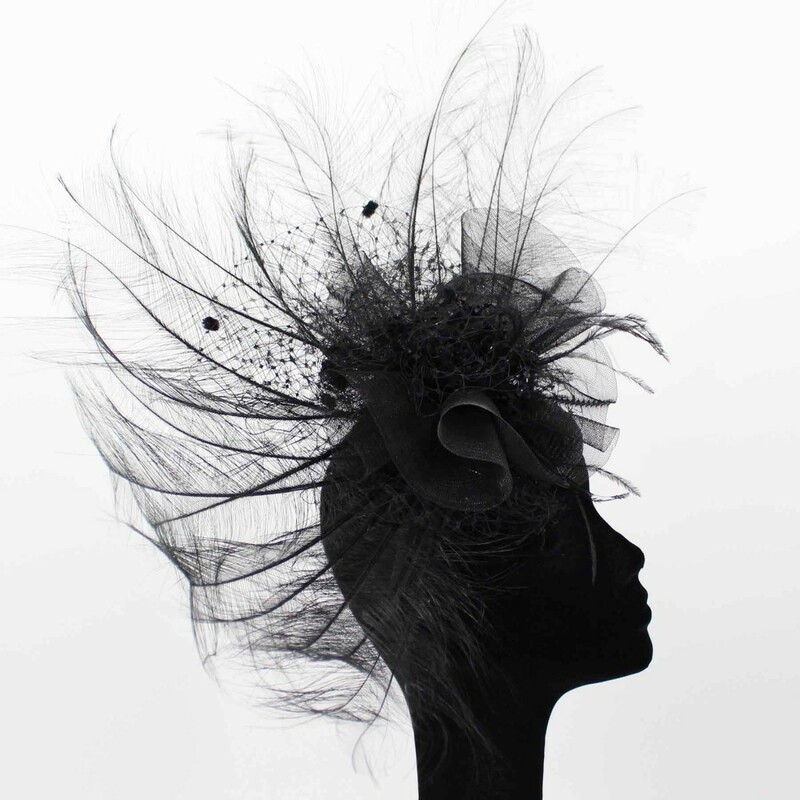 Incredibly feminine. 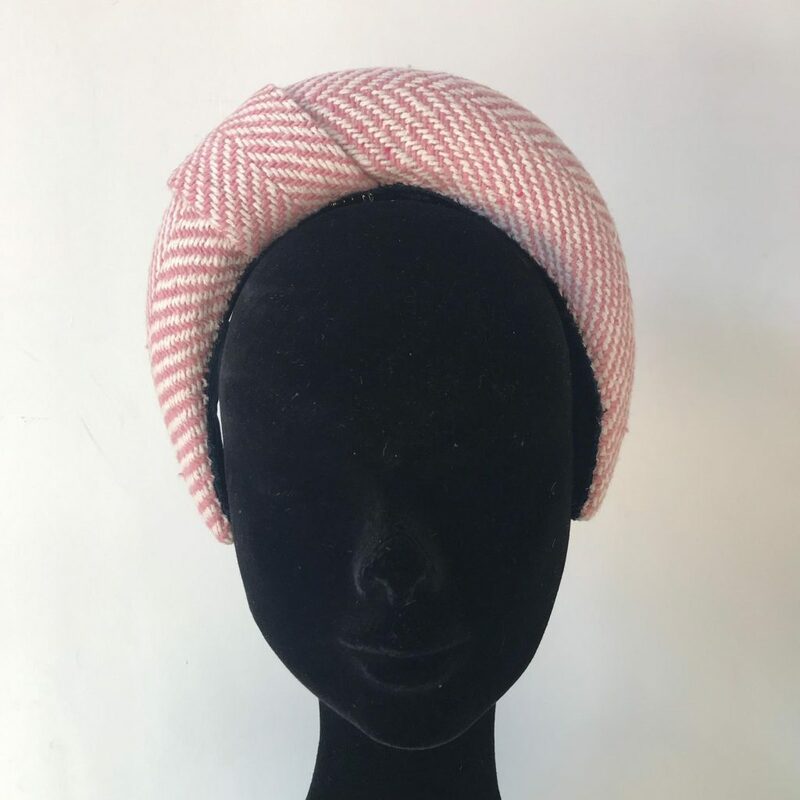 A beautiful pink tweed headband. 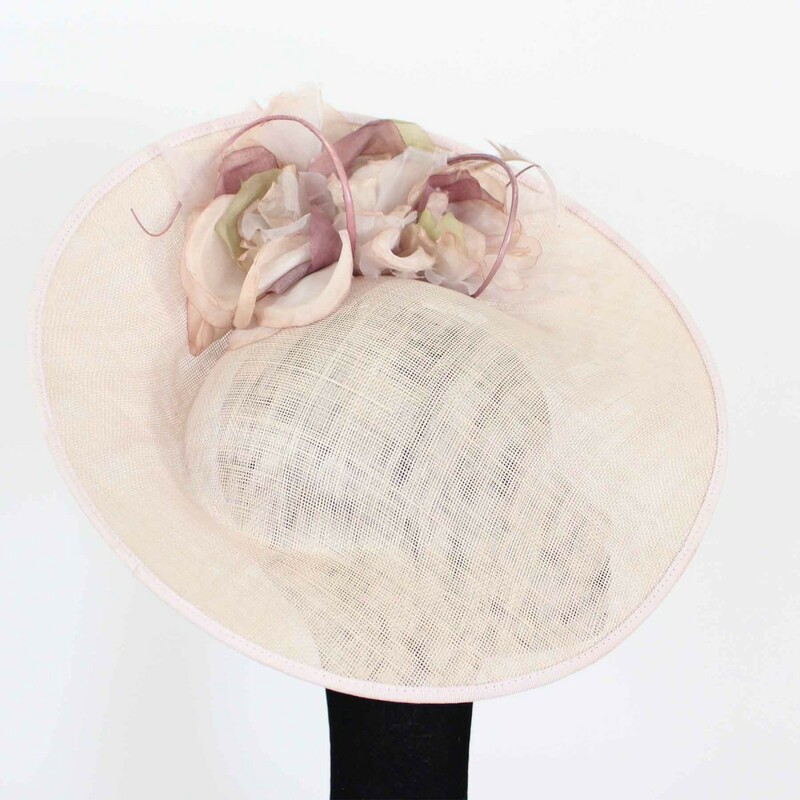 Claret silk coveted button with a delicate claret and ivory abaca swirl. 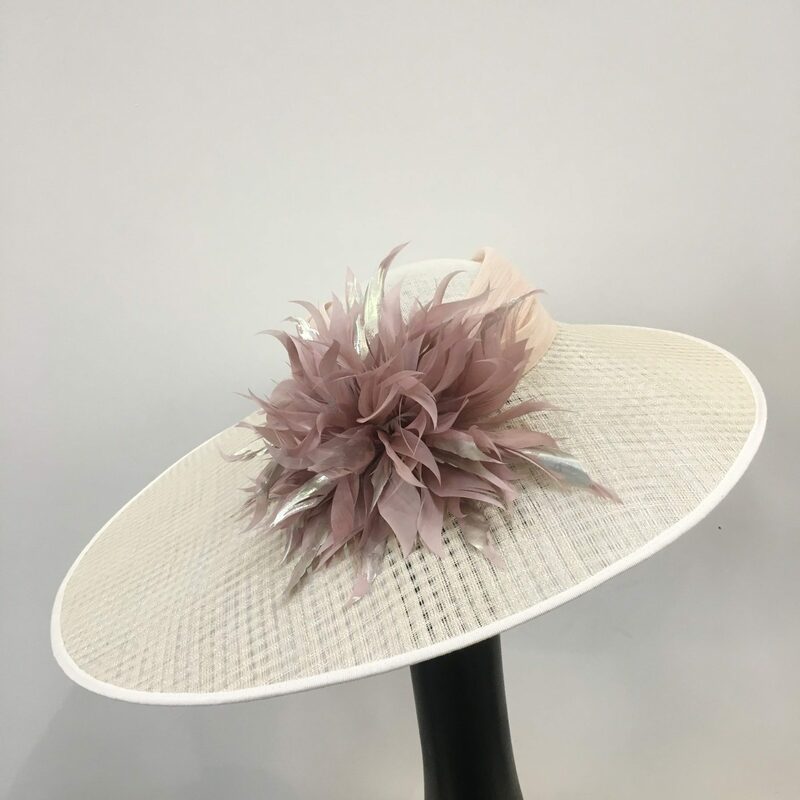 Pink tipped ivory feather roses grace the underside of this stunning sculpted pale pink sinamay base. 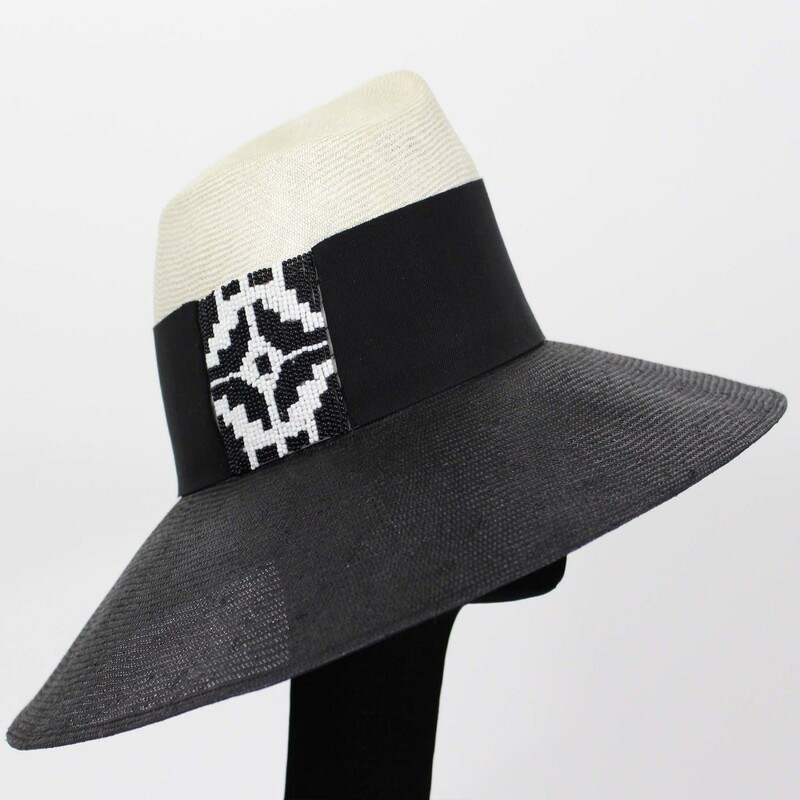 The perfect summer design. 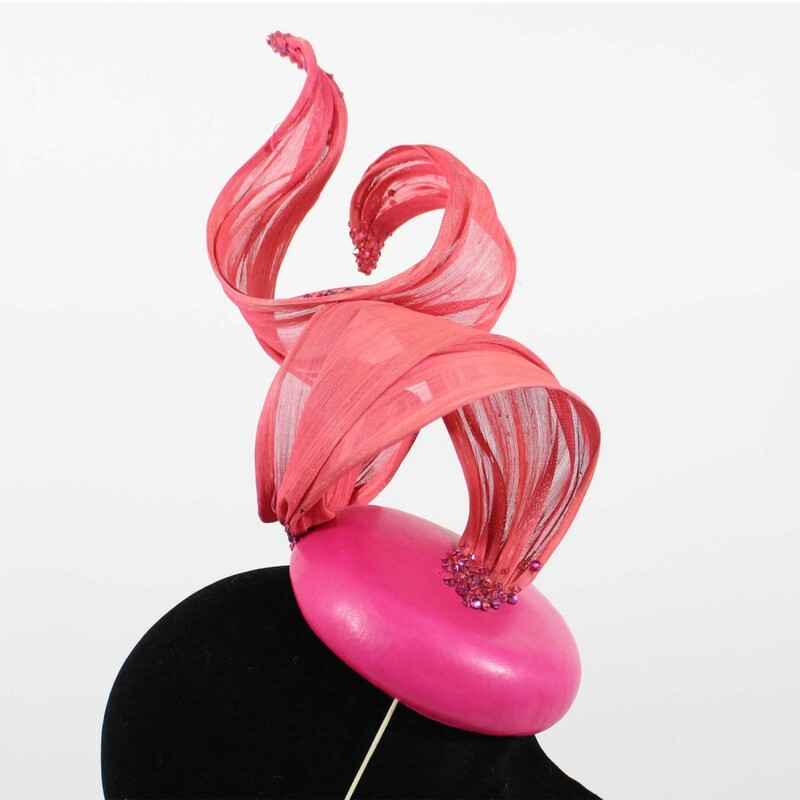 Two magenta sinamay saucers sit either side of these stunning magenta chin halos trimmed with a magenta feather hackle. 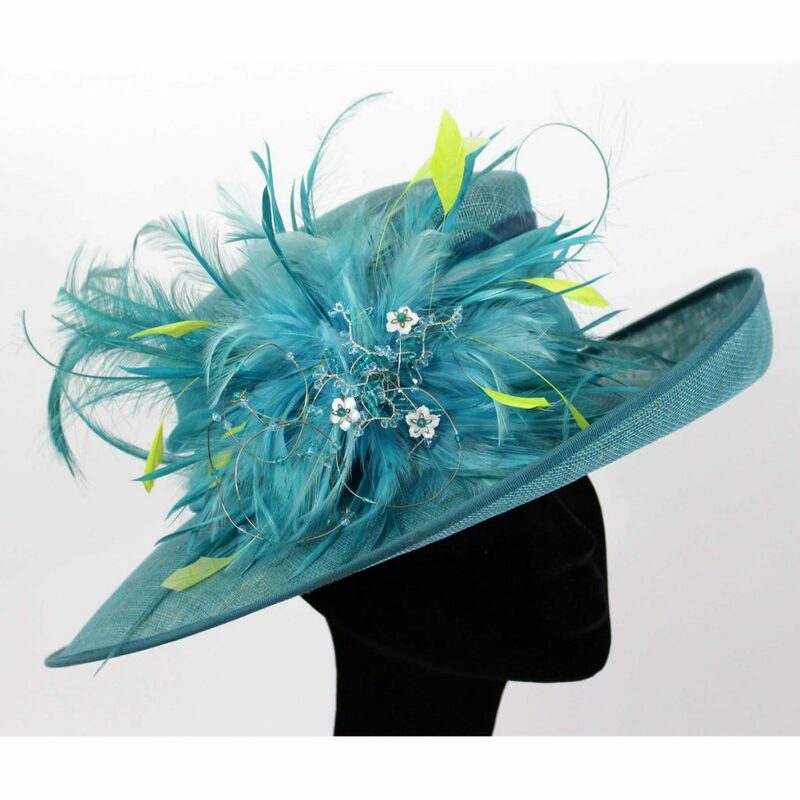 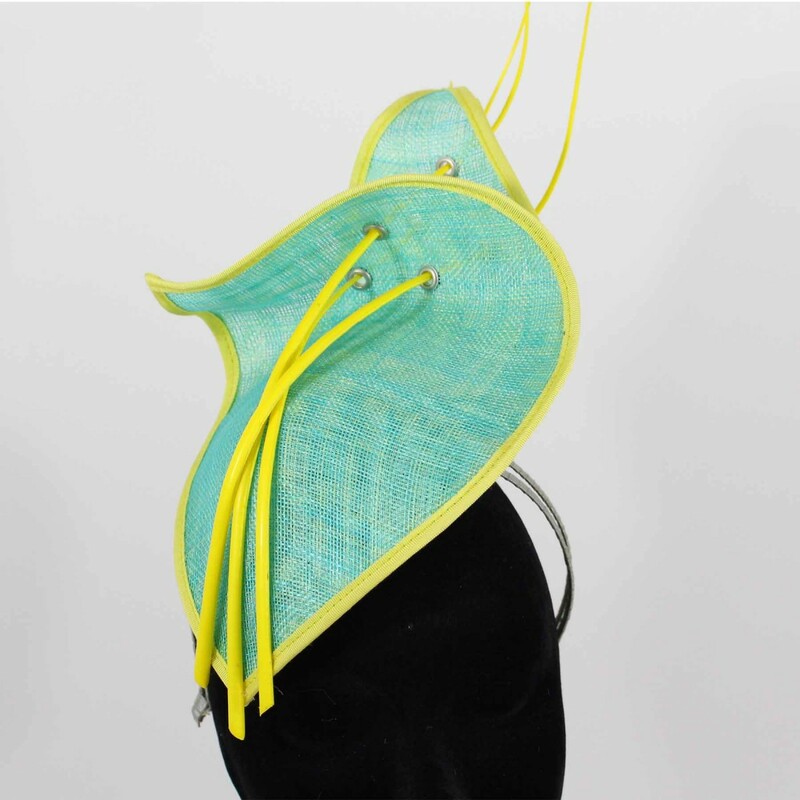 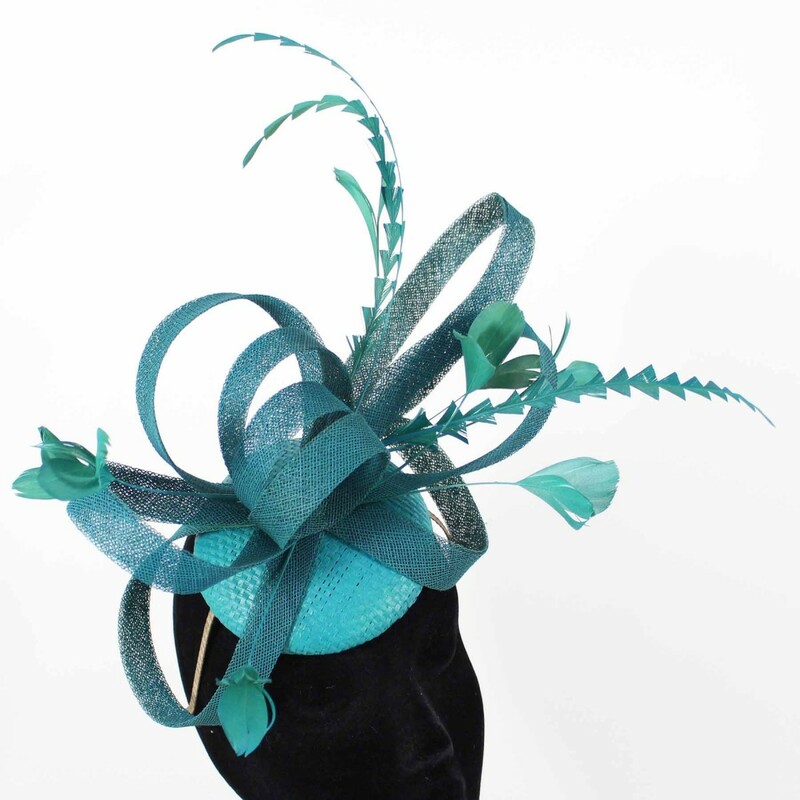 A button headpiece covered in cobolt blue adorned with two neon green quills. 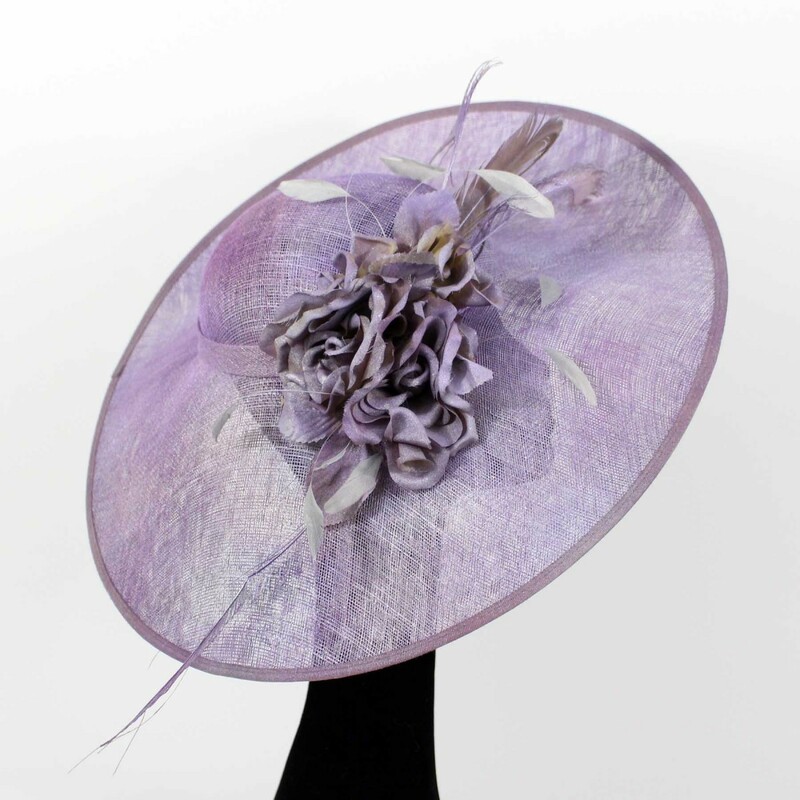 A mauve sinamay saucer adorned with a cornucopia of hand sewn mauve silk flowers with champagne scattered lace petals. 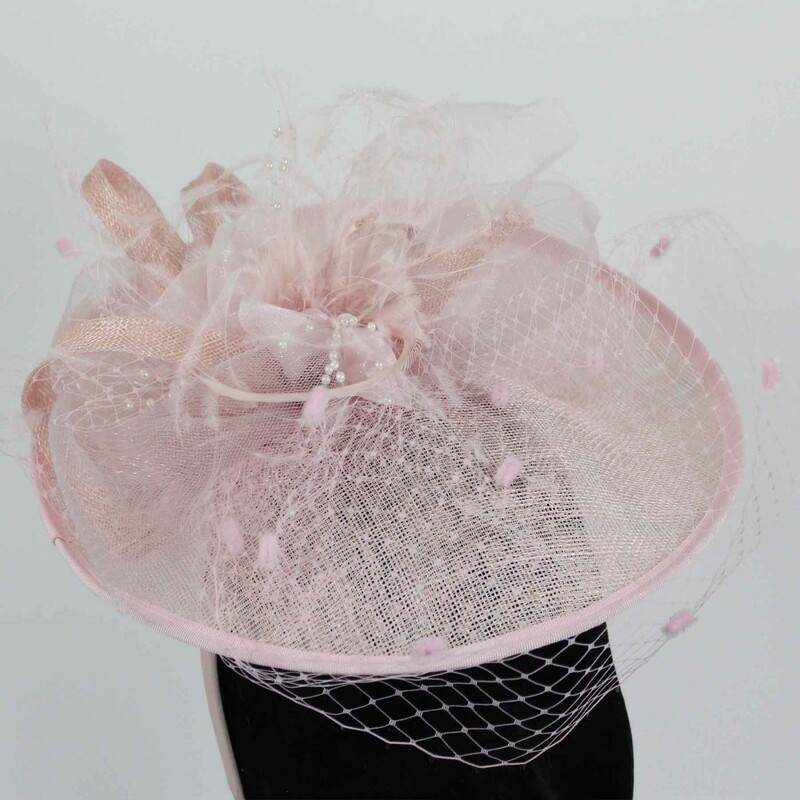 A wonderfully romantic, feminine design. 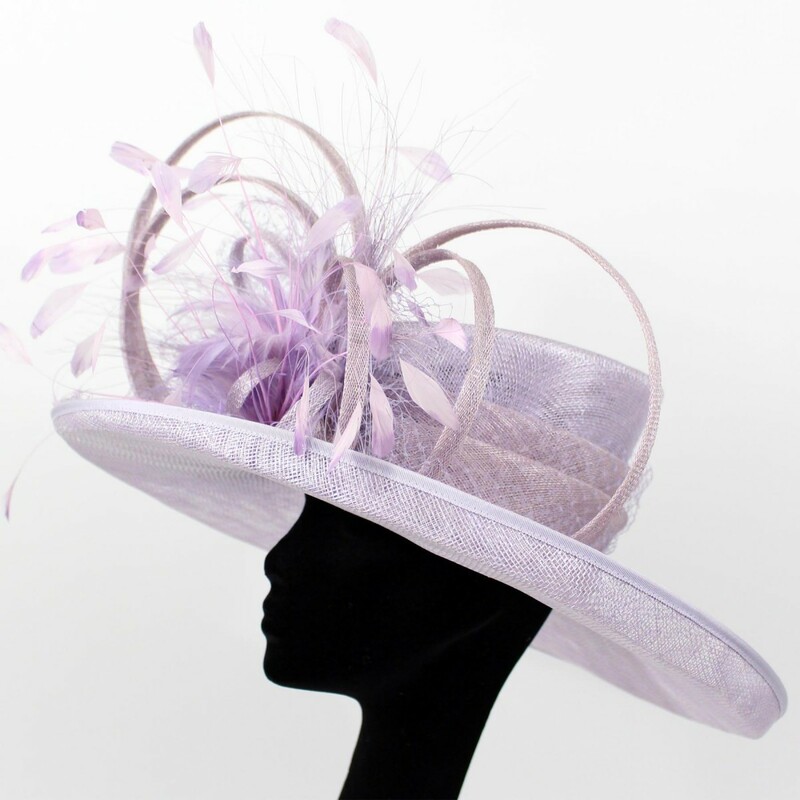 The fabulous ‘Gina’ saucer in lilac is decorated with an array of feather flowers on the upper and under slides. 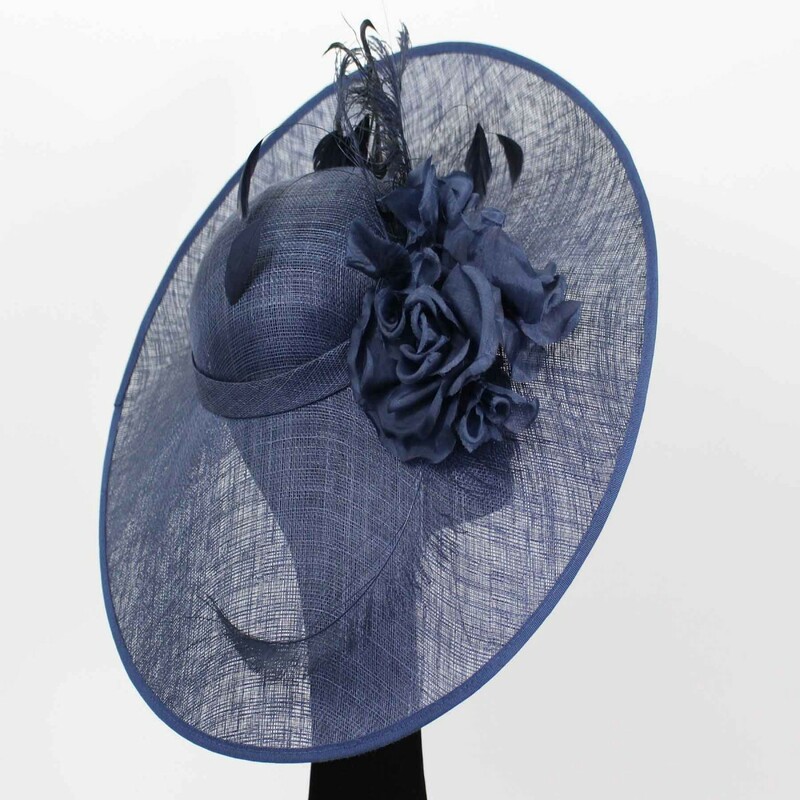 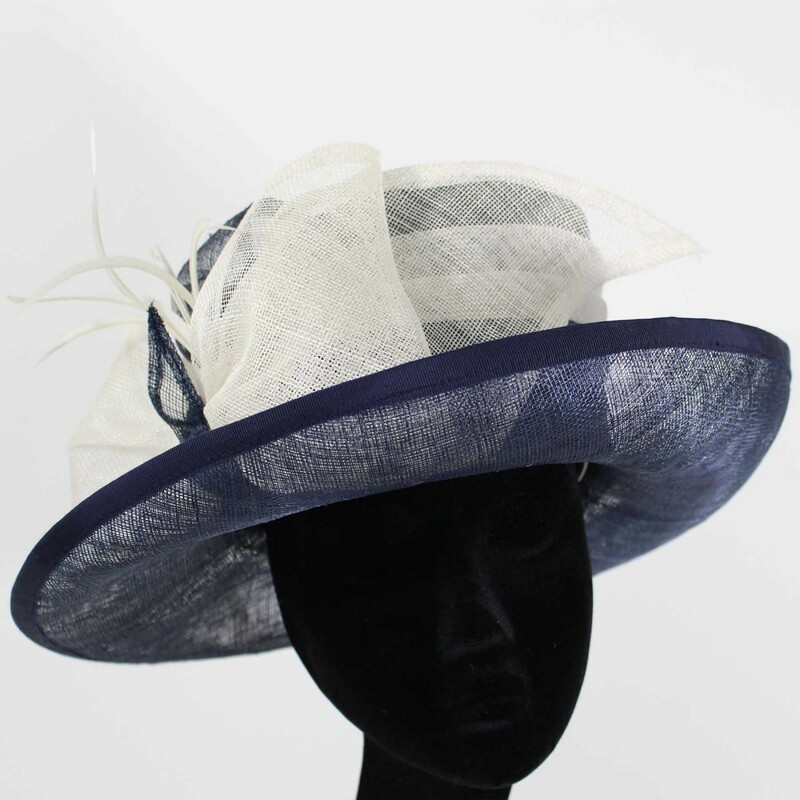 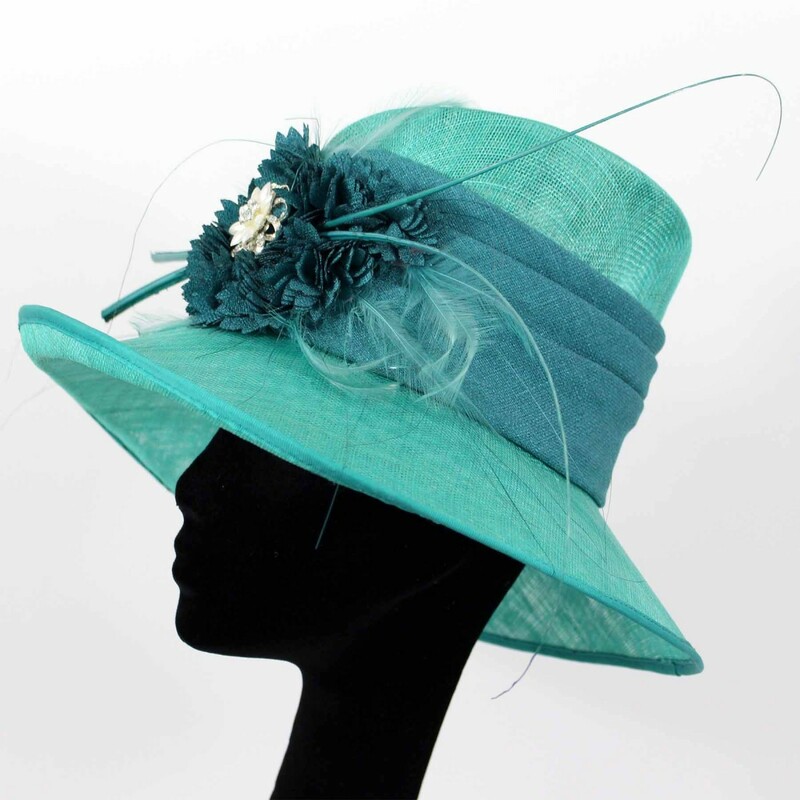 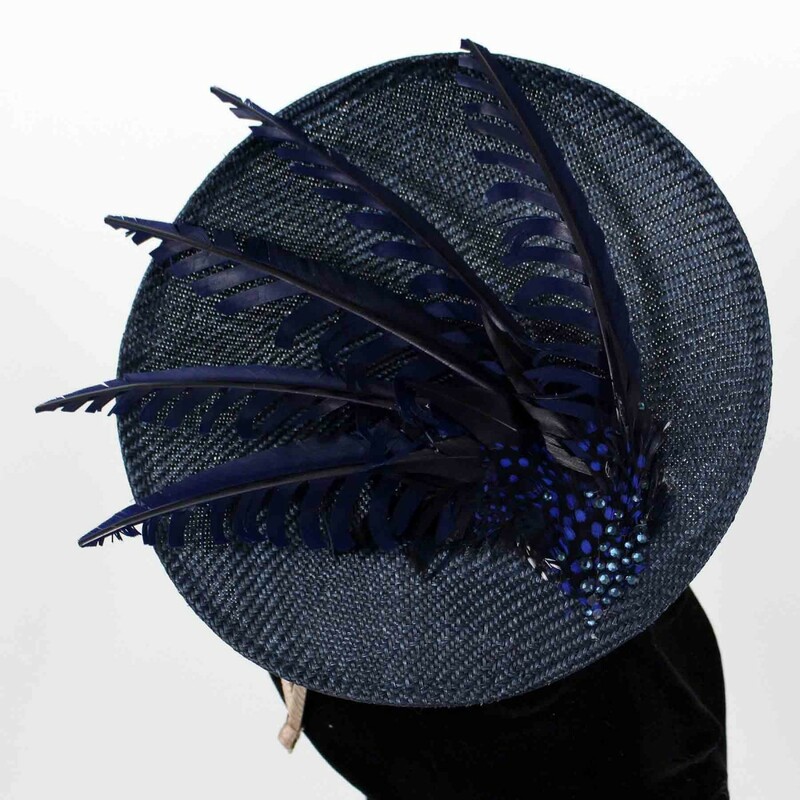 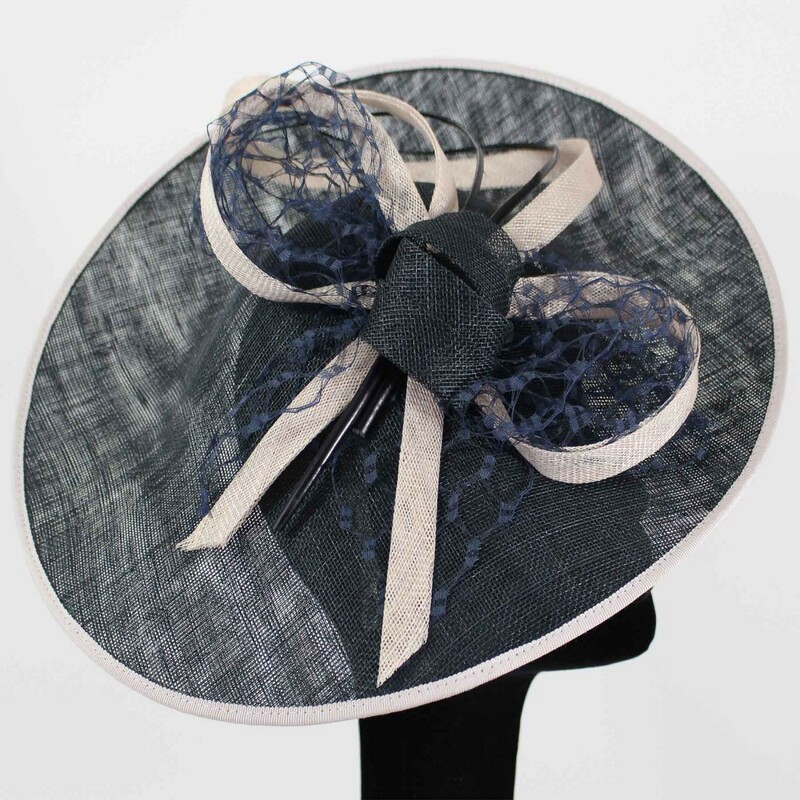 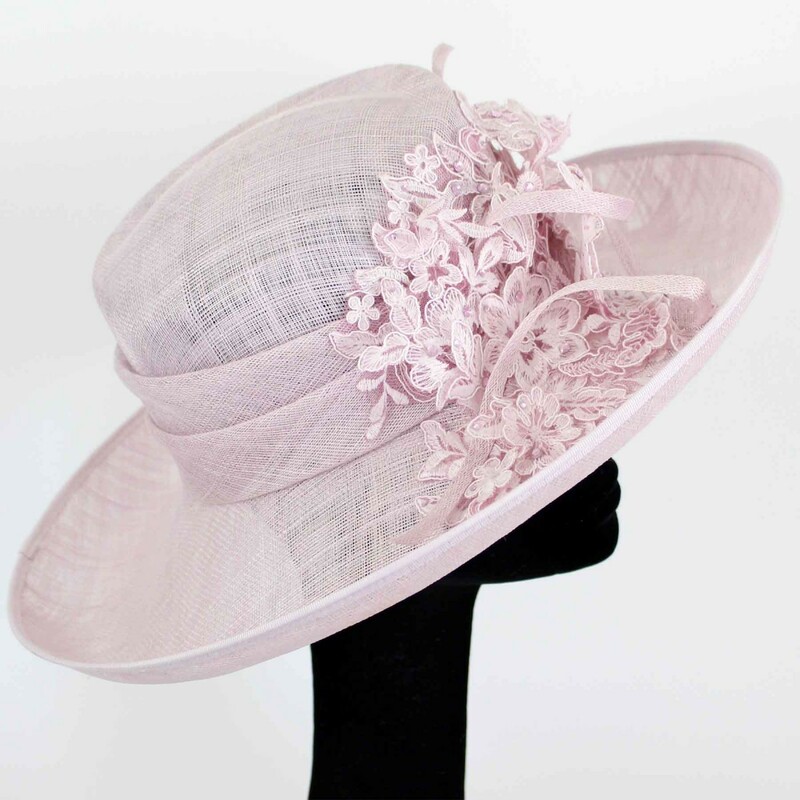 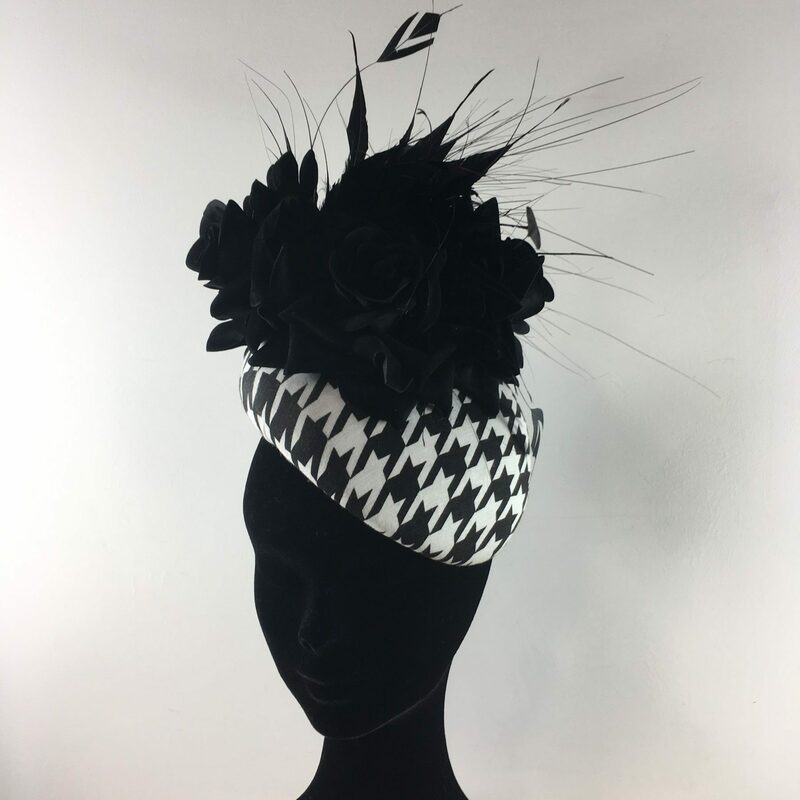 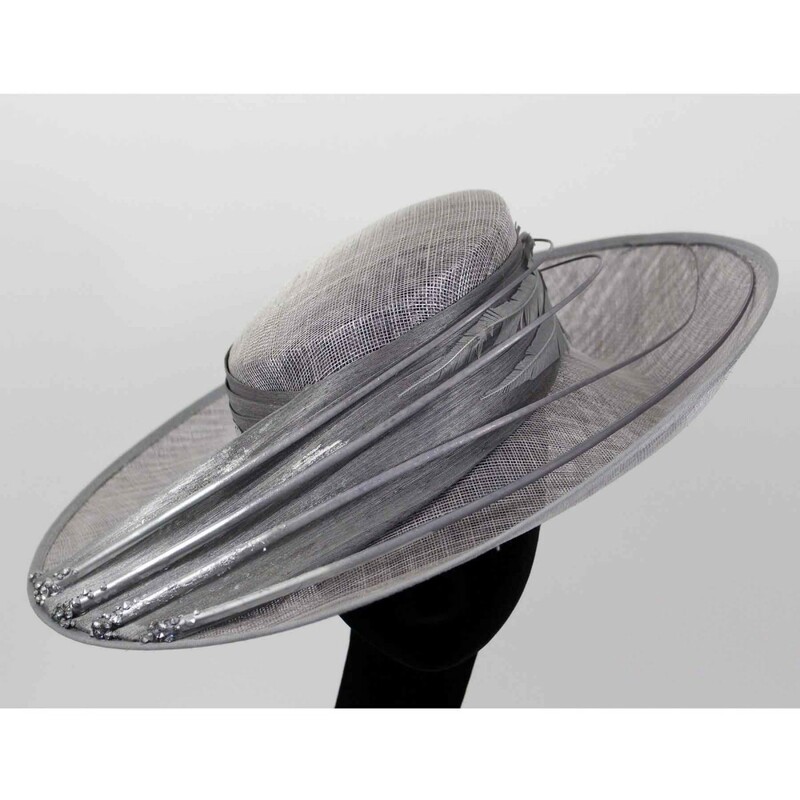 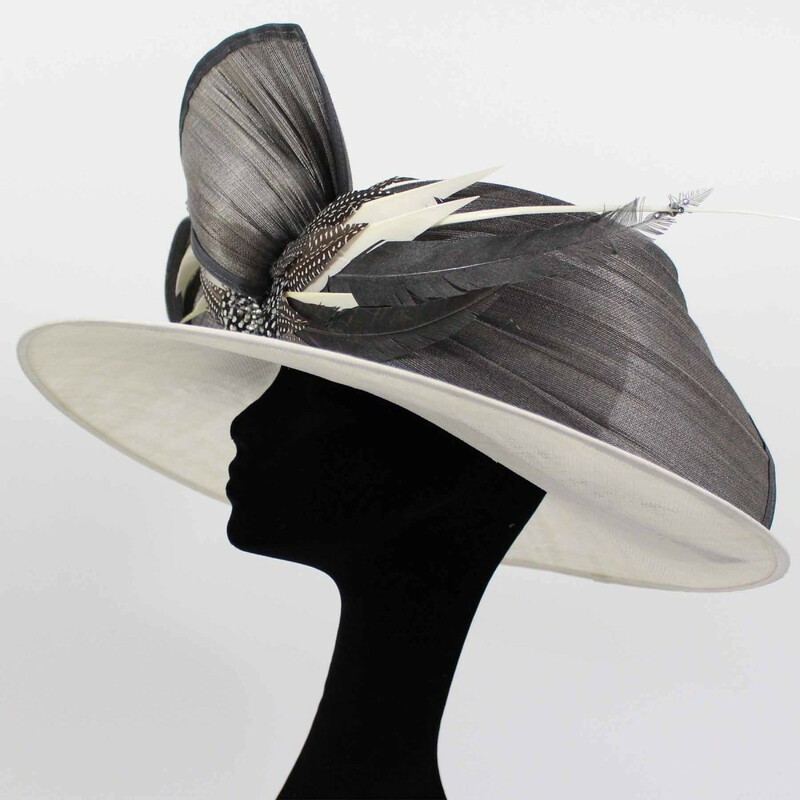 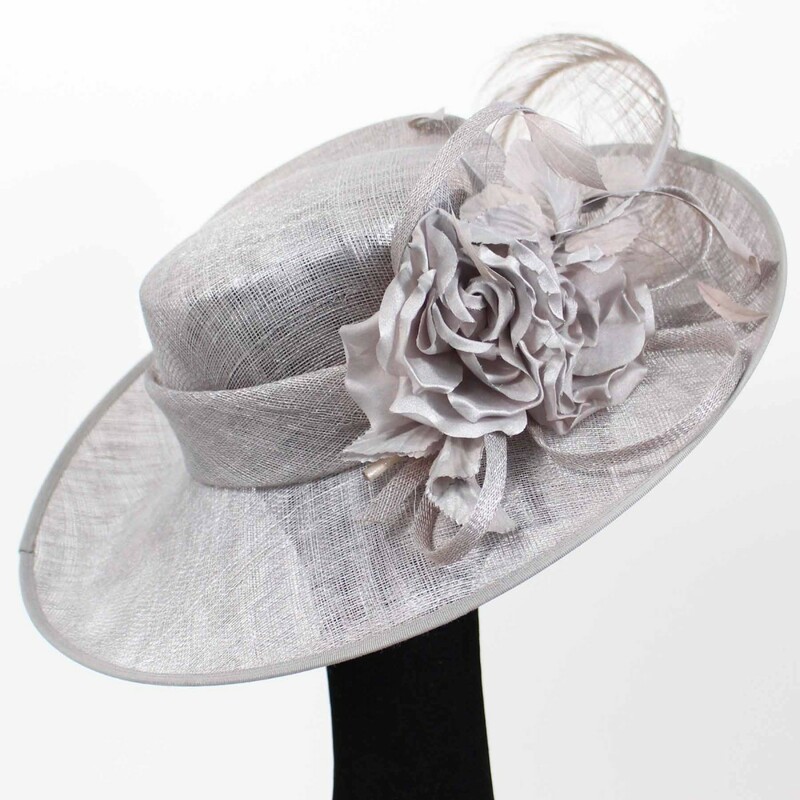 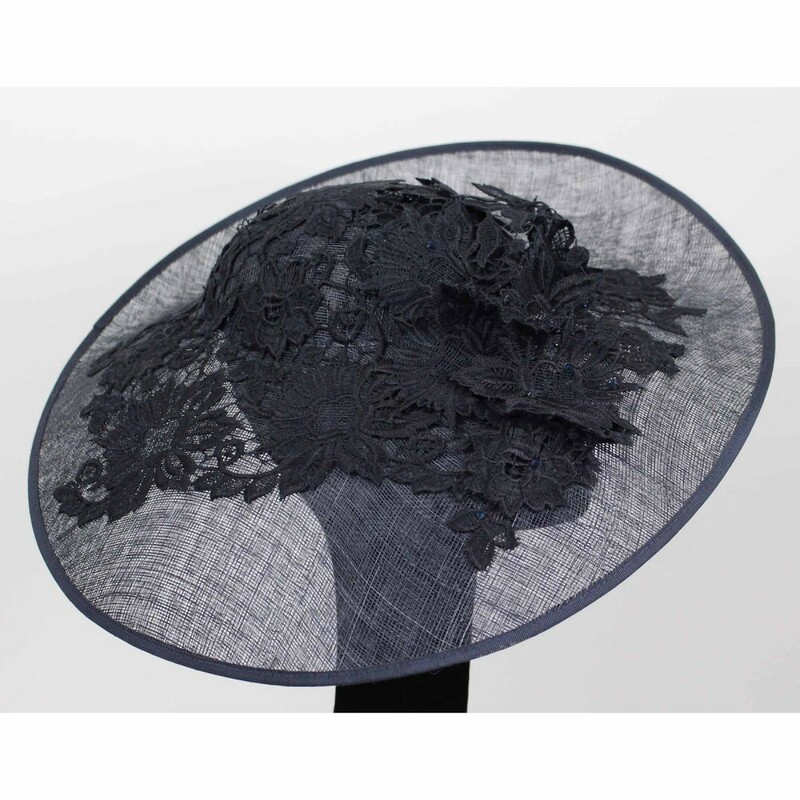 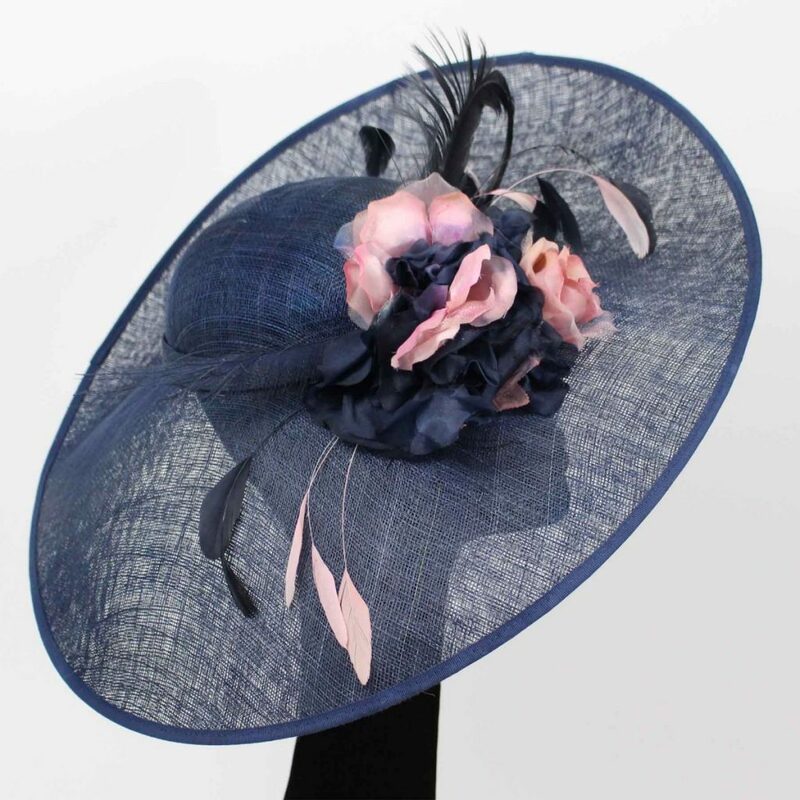 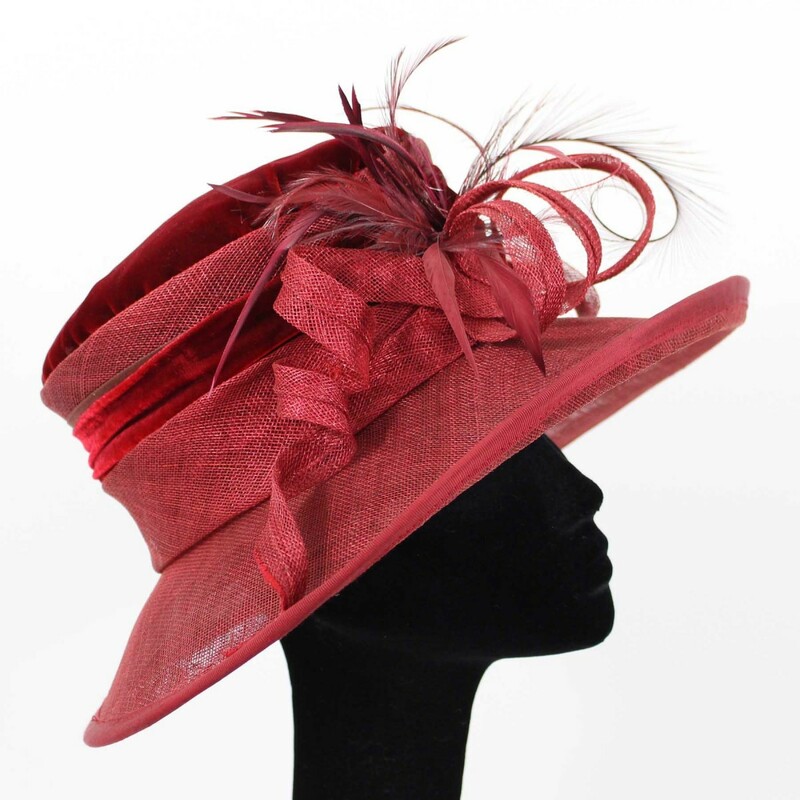 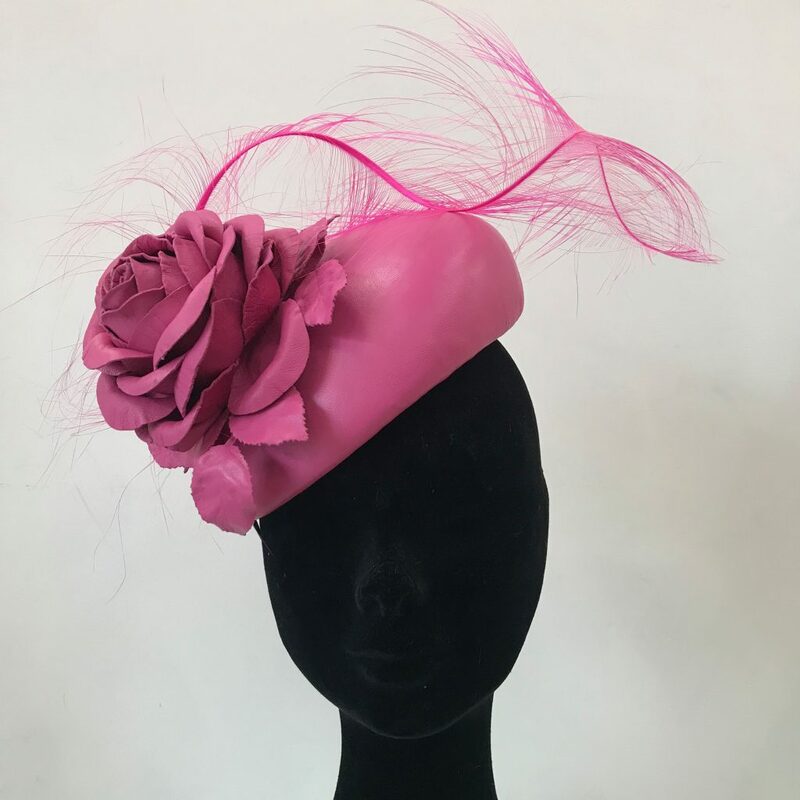 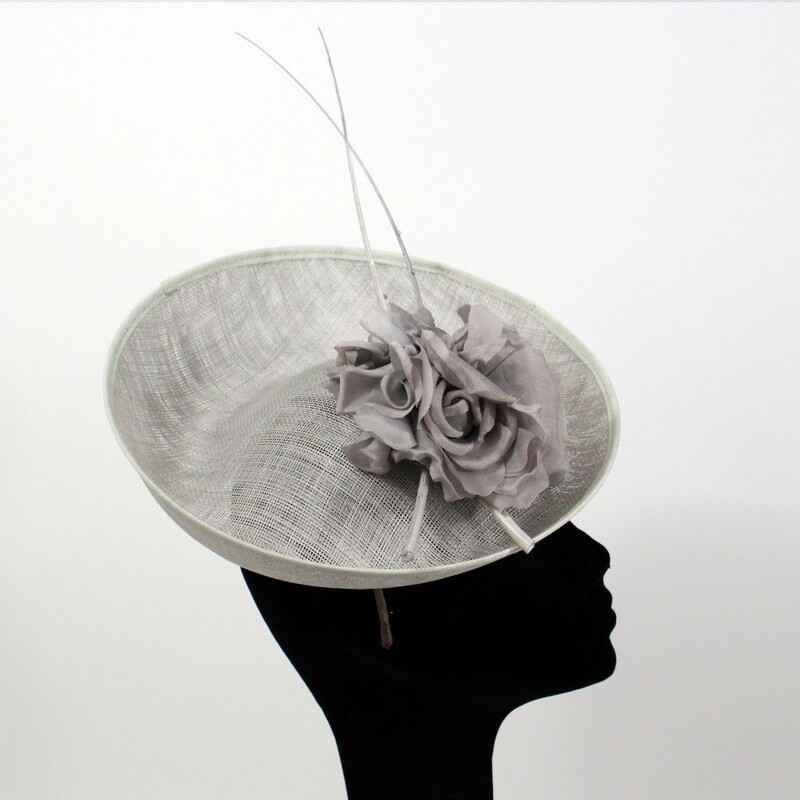 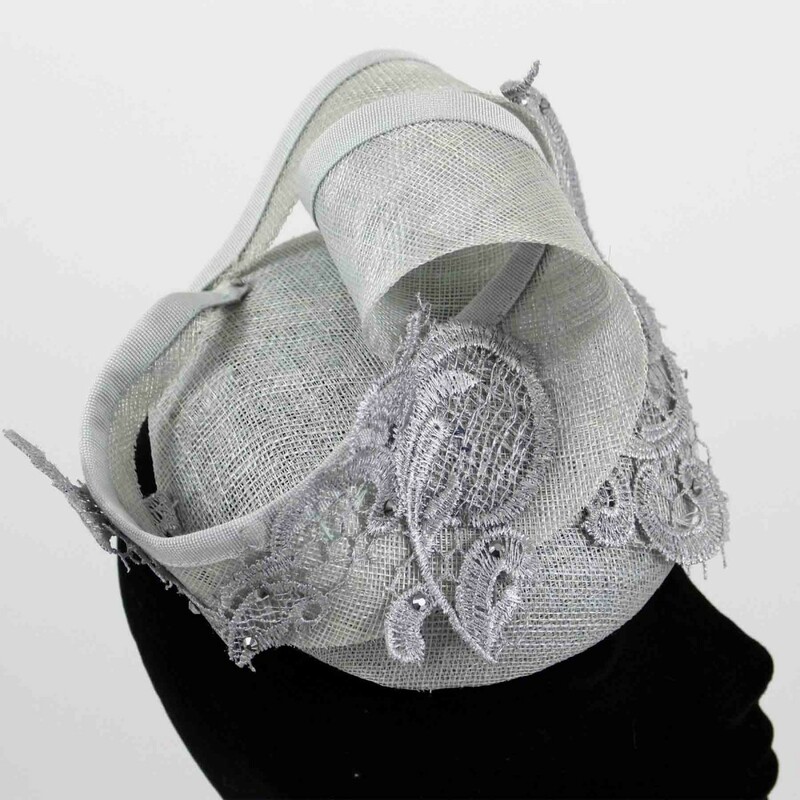 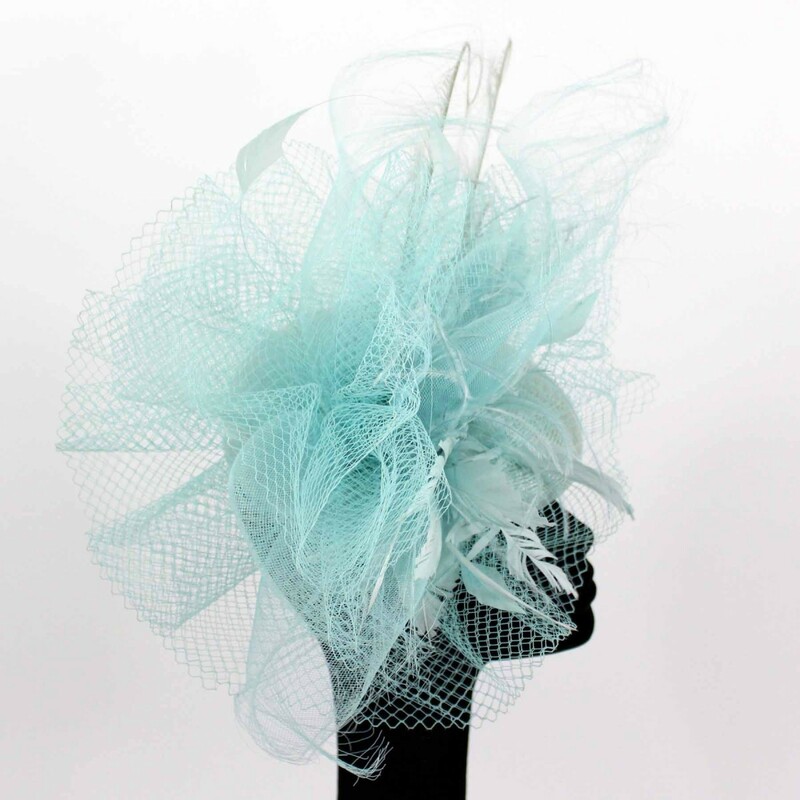 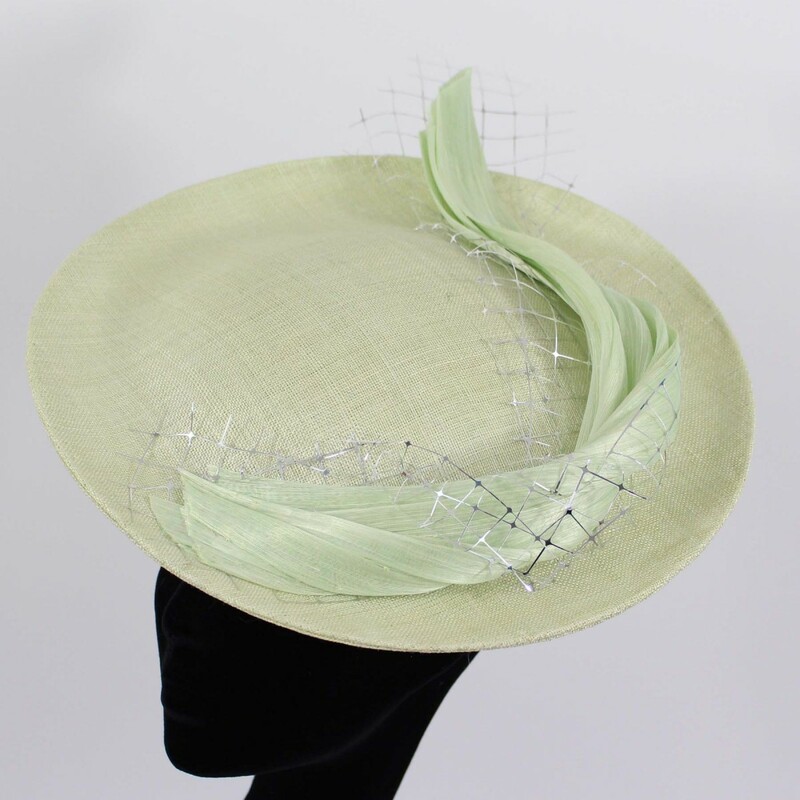 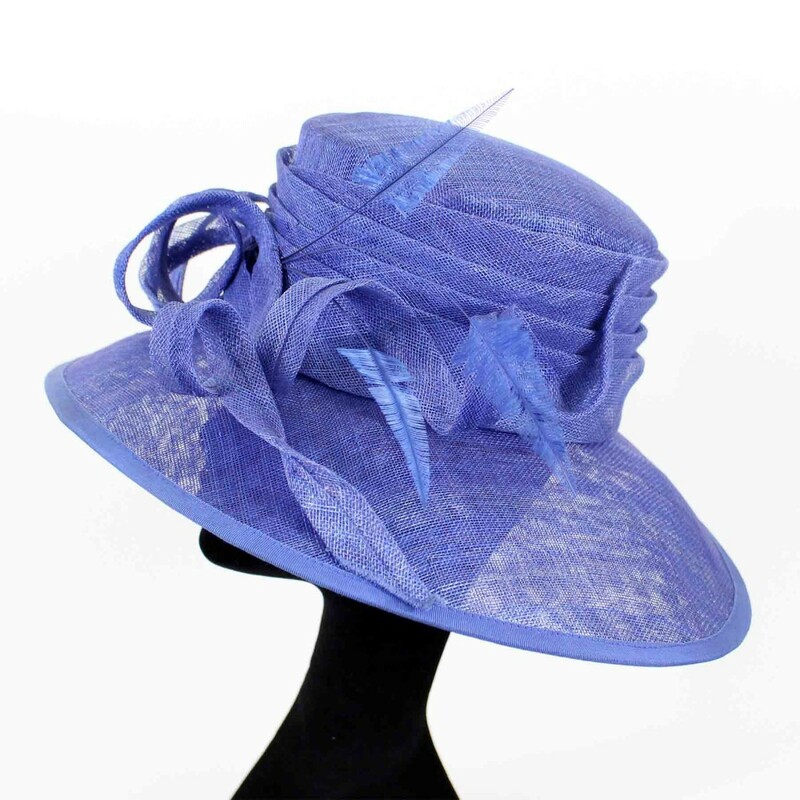 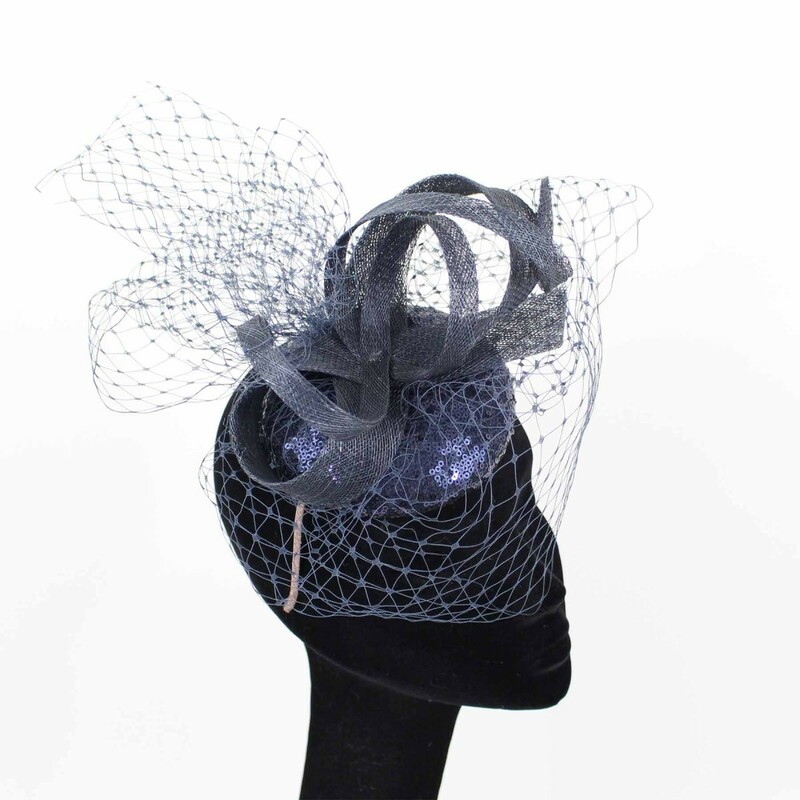 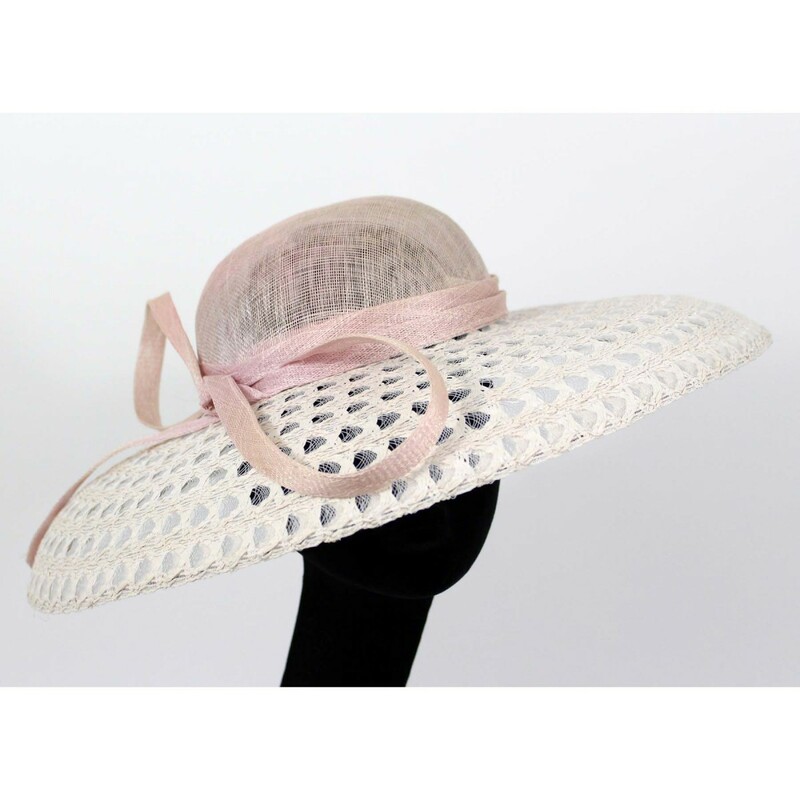 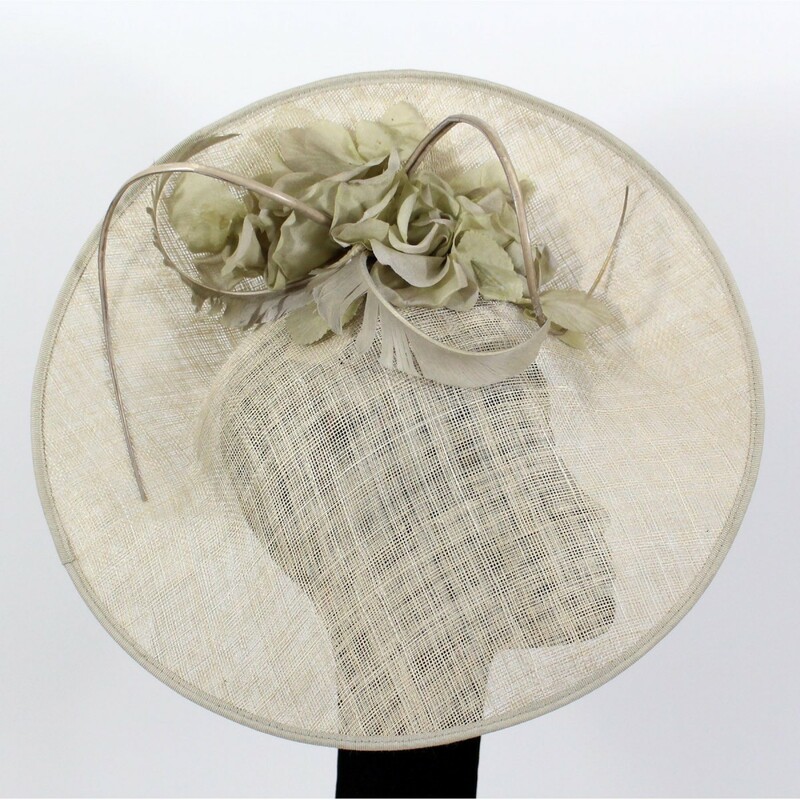 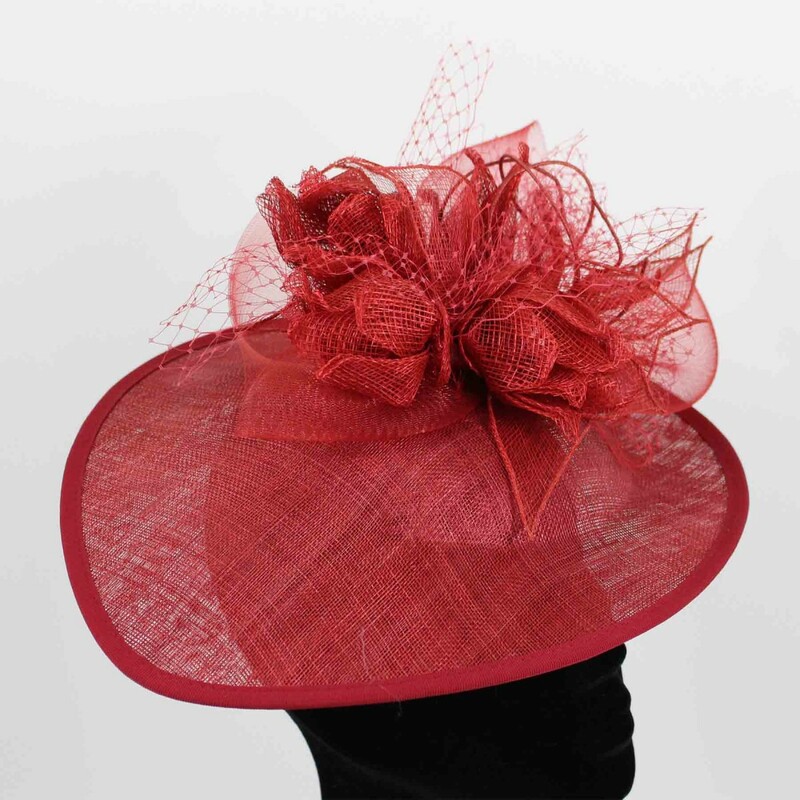 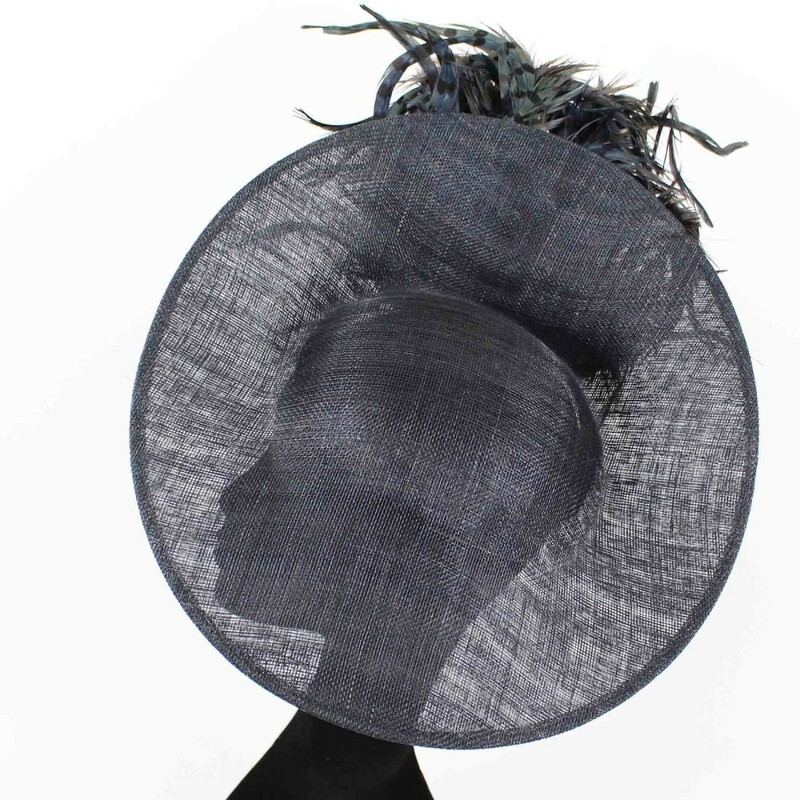 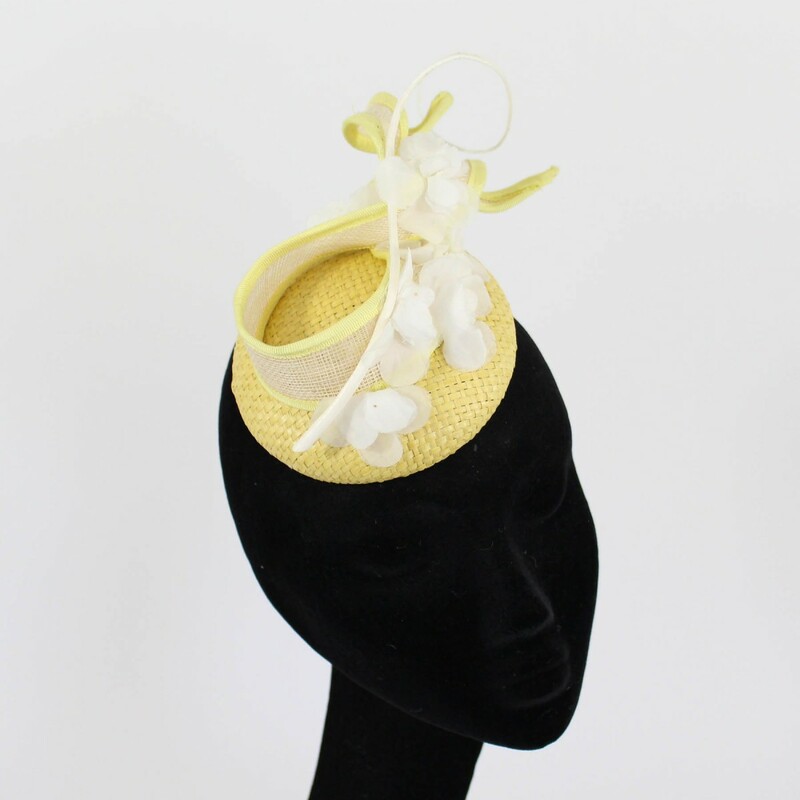 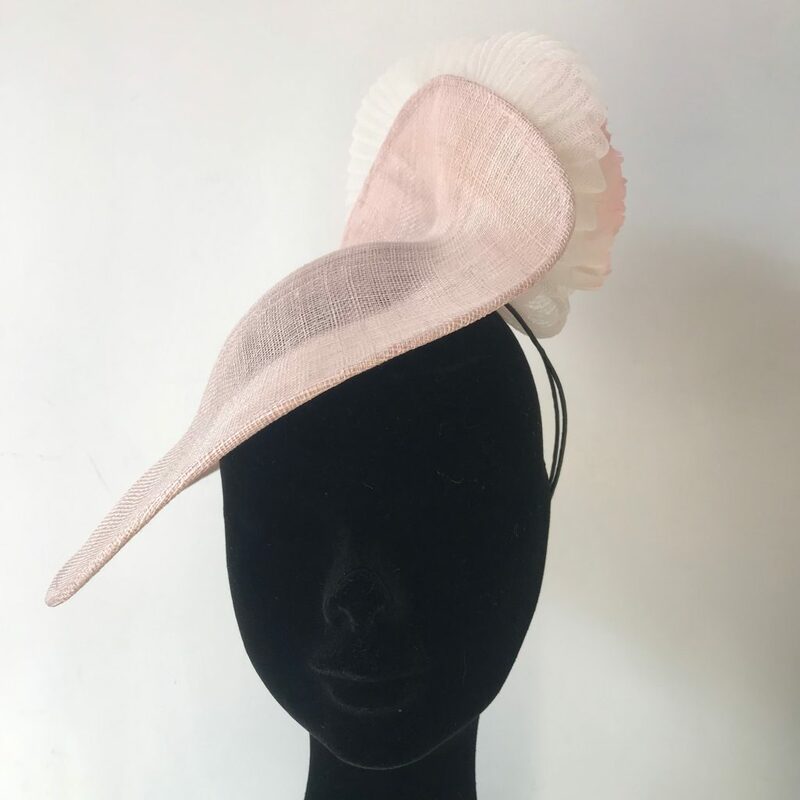 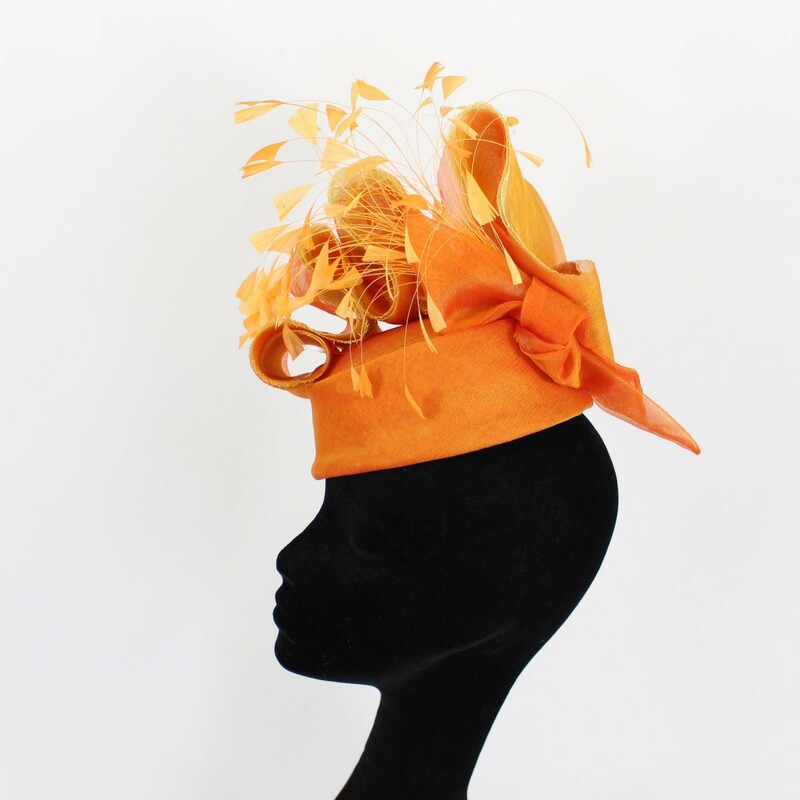 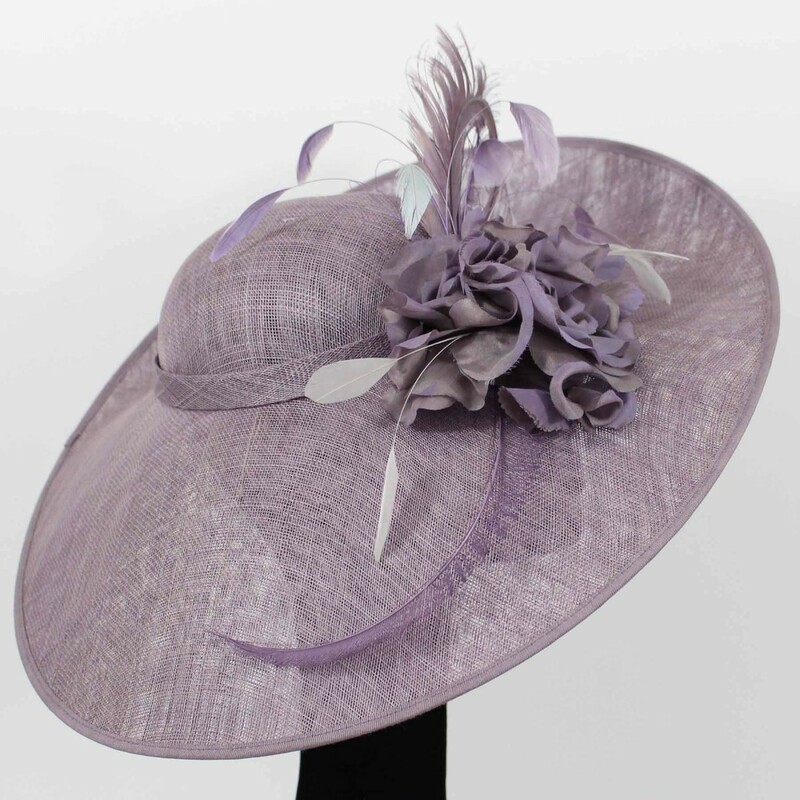 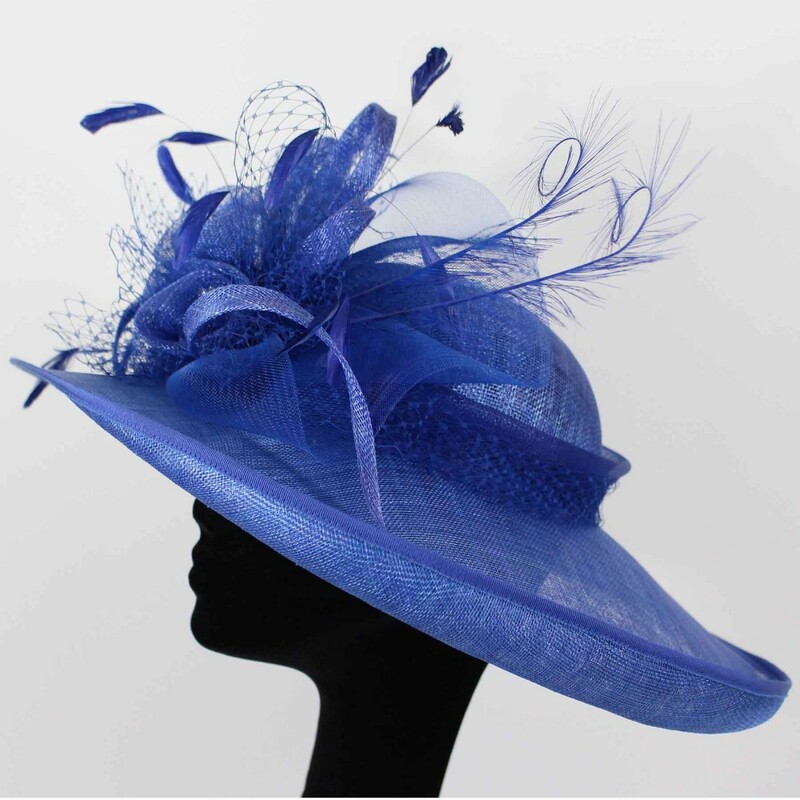 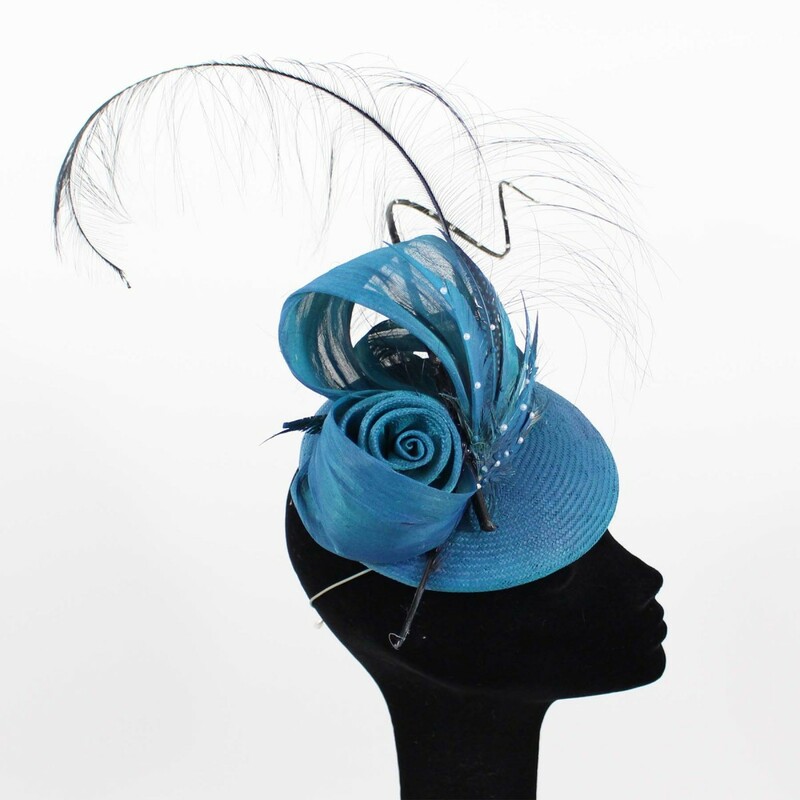 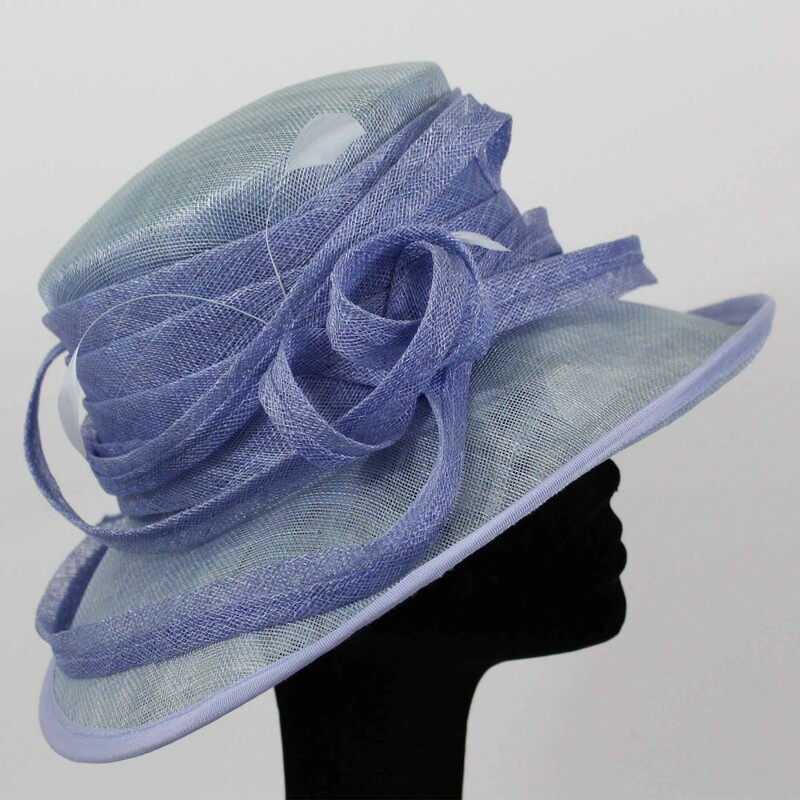 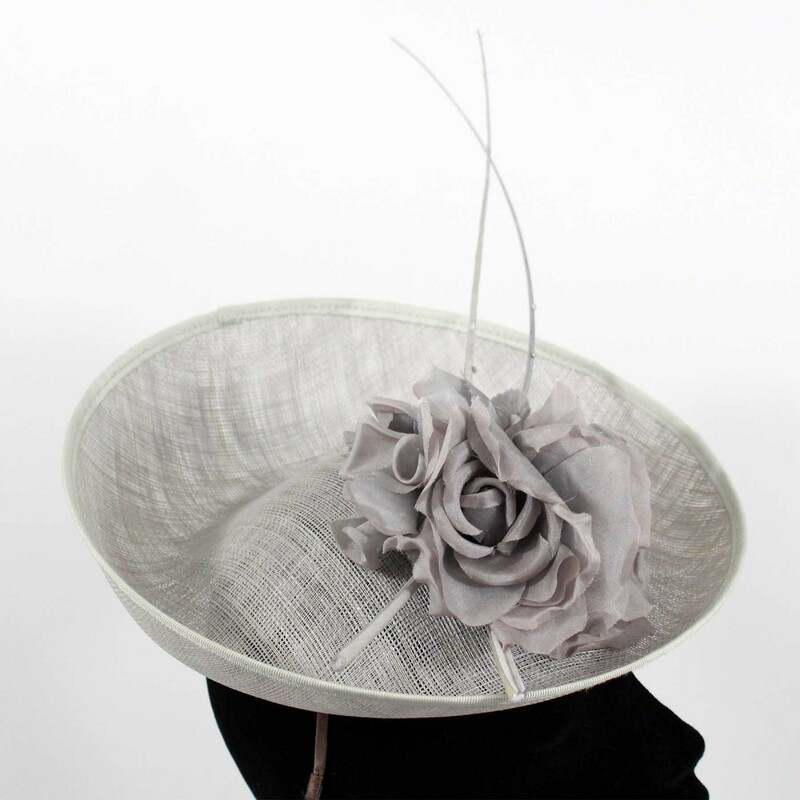 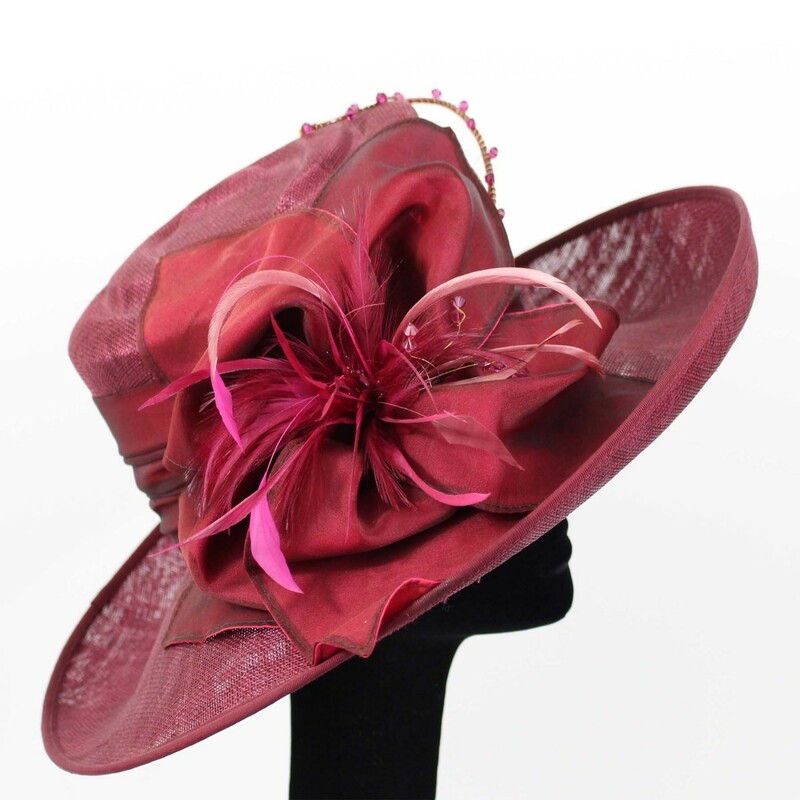 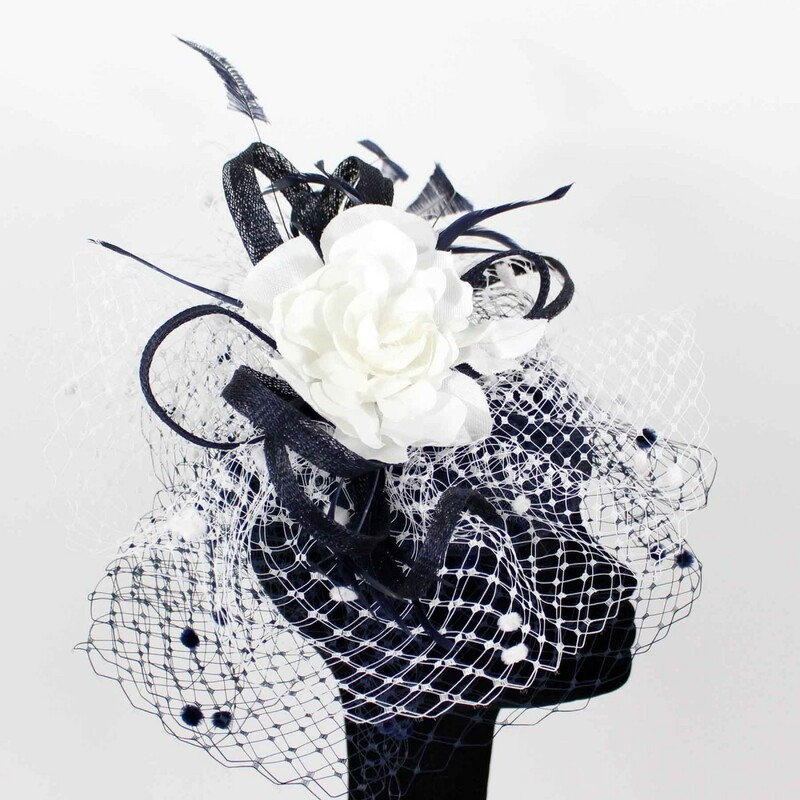 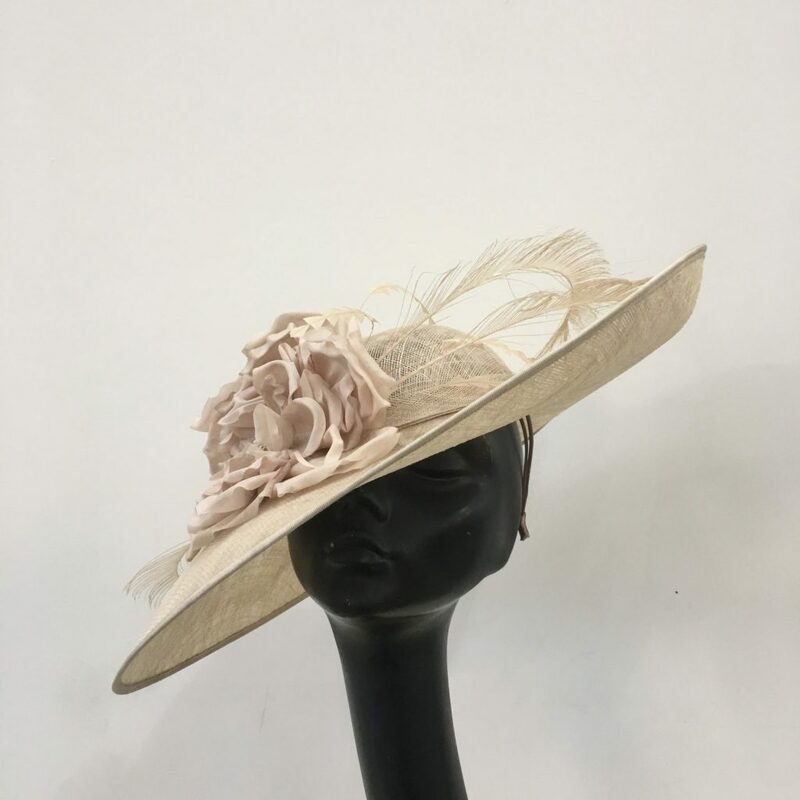 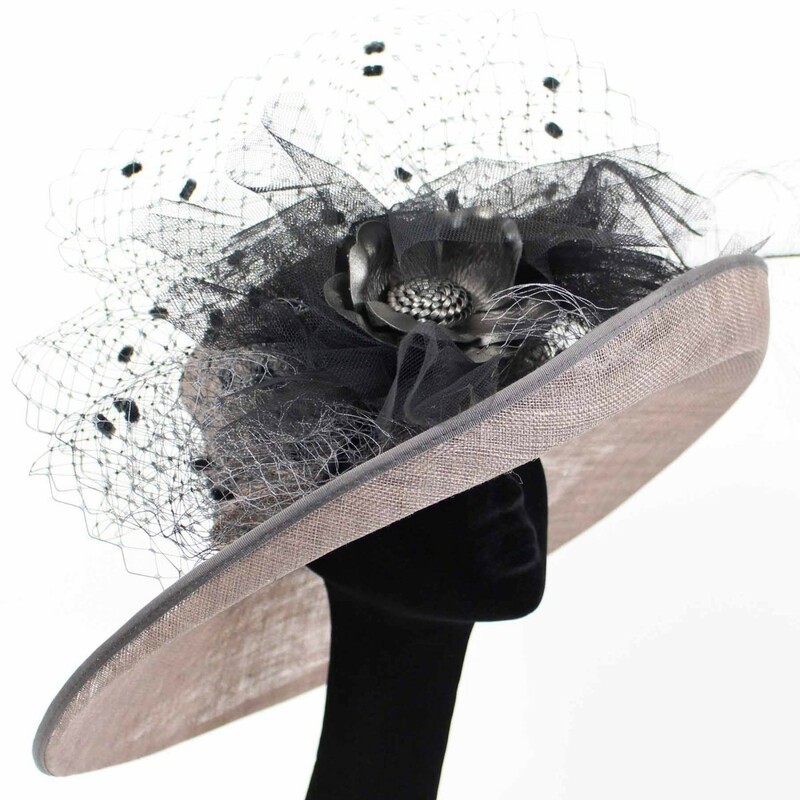 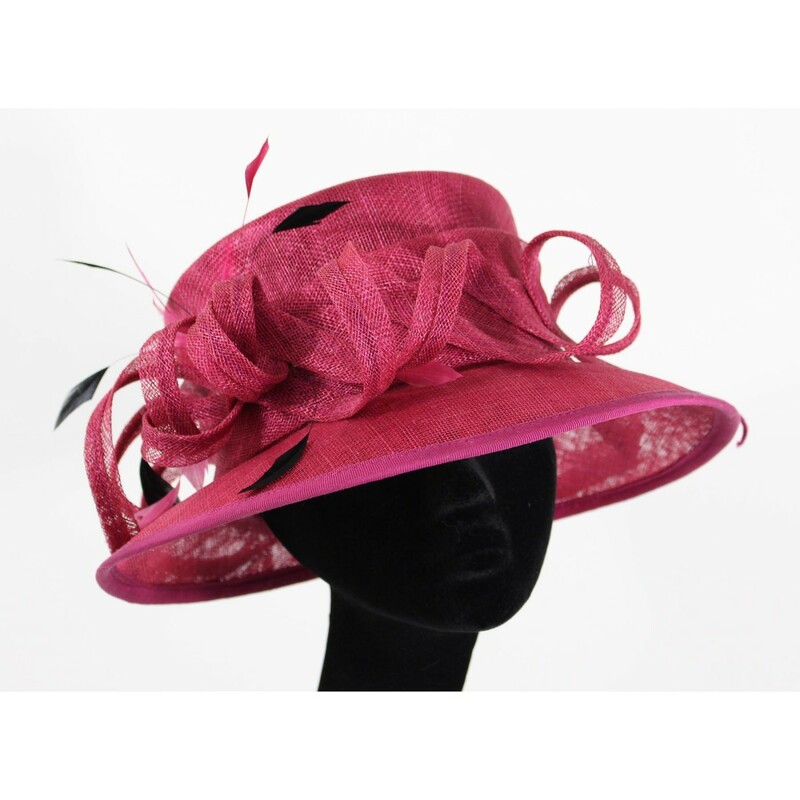 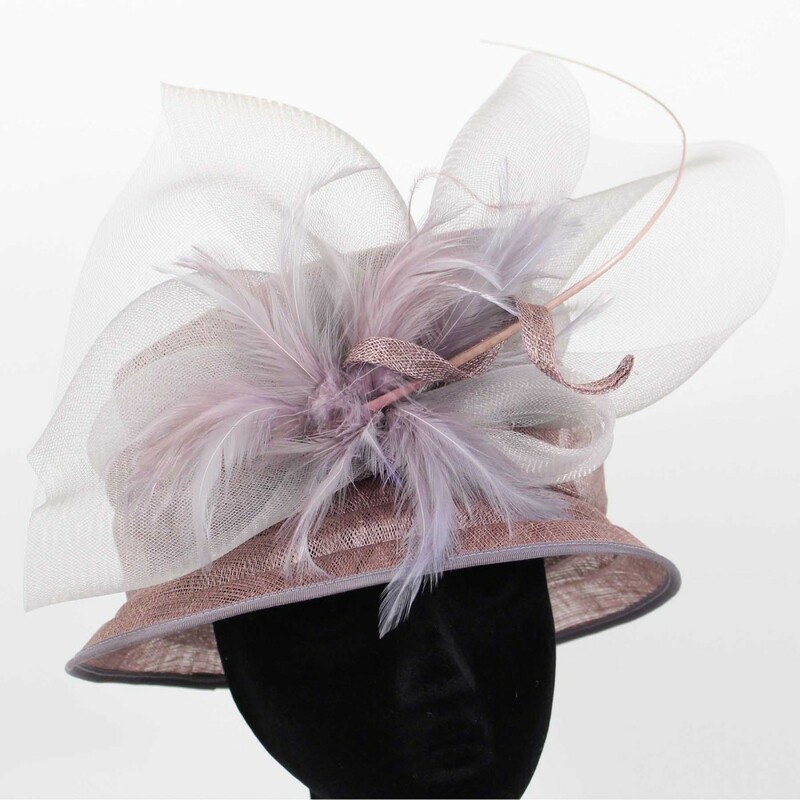 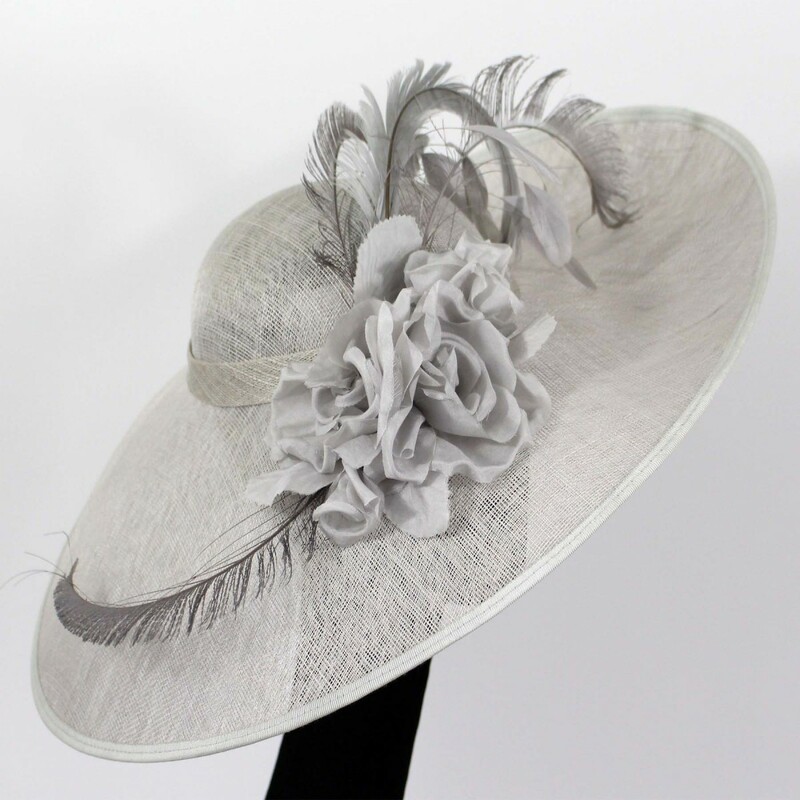 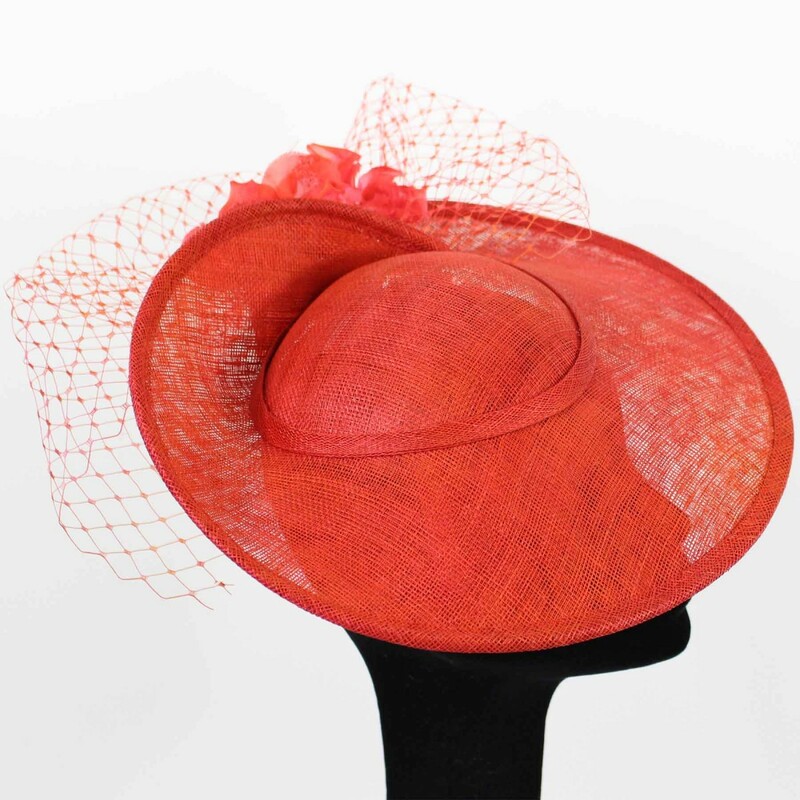 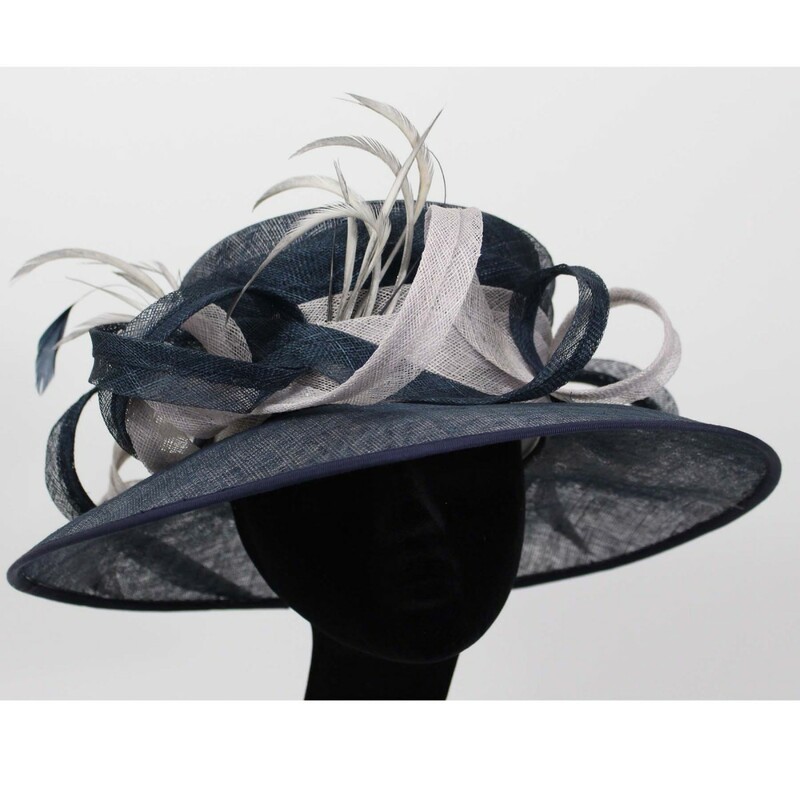 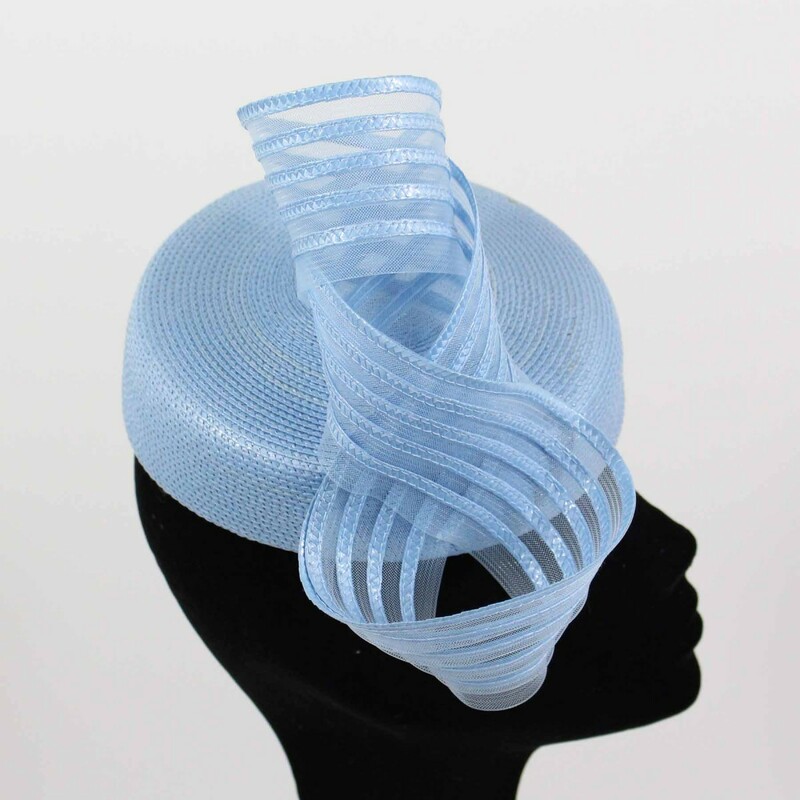 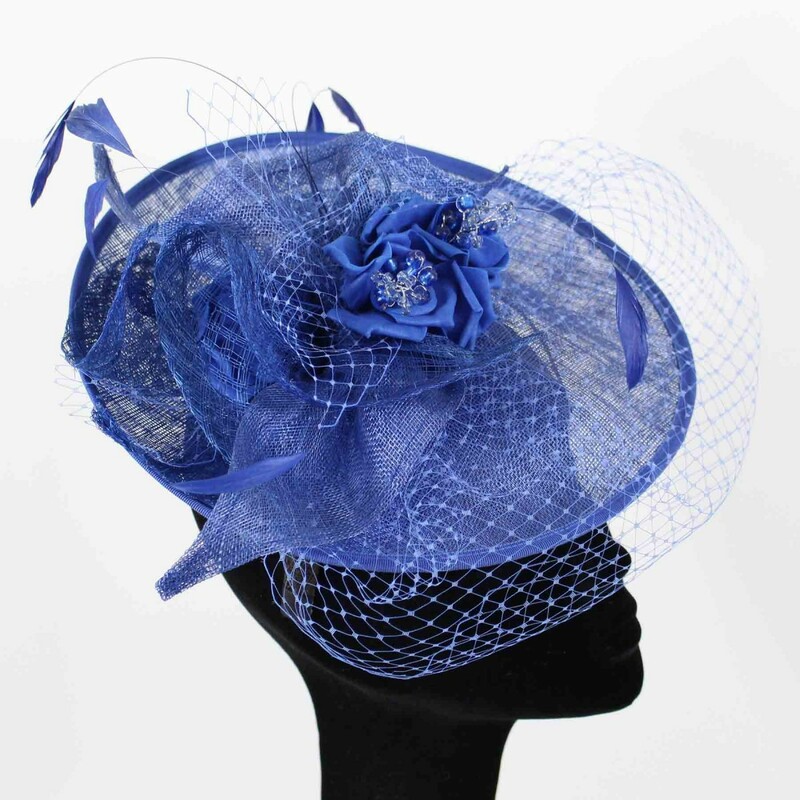 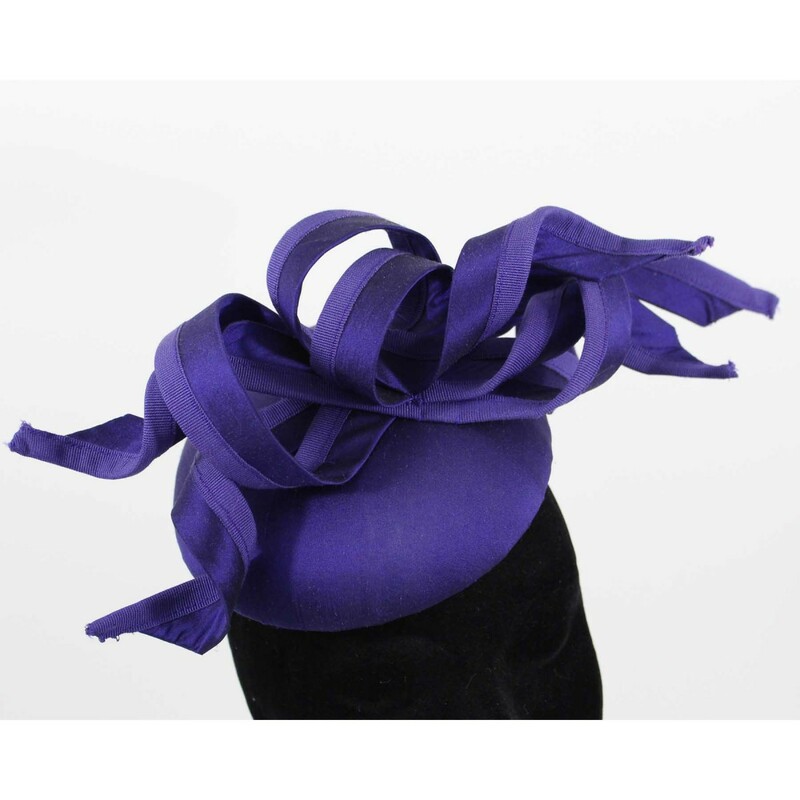 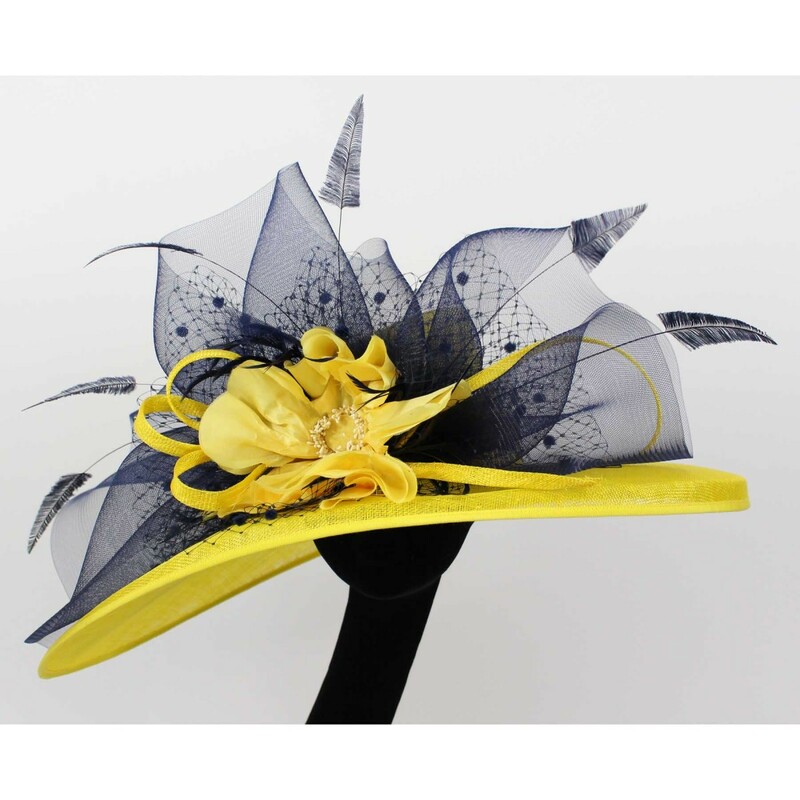 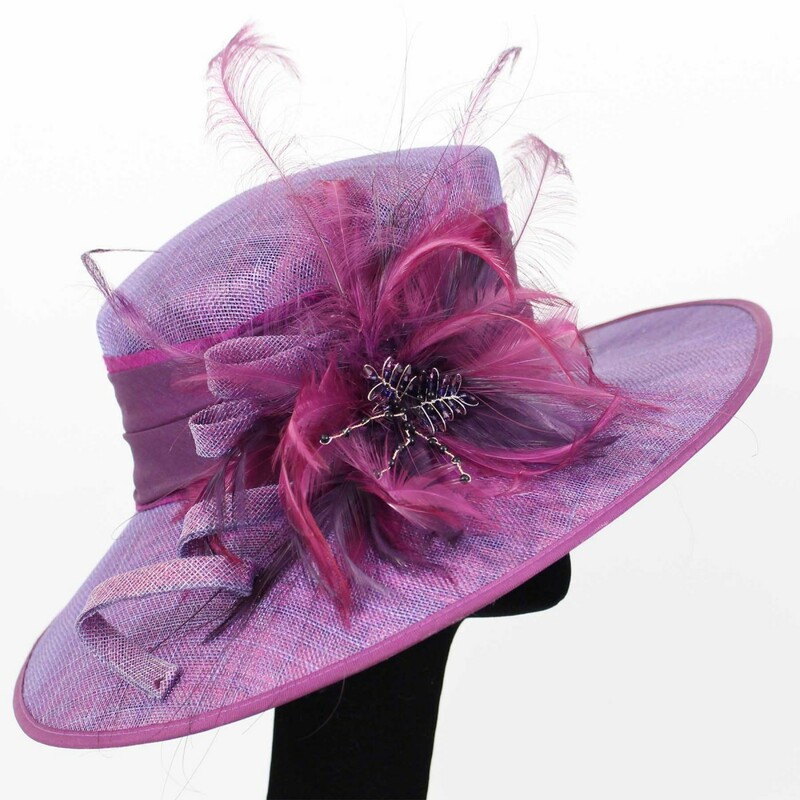 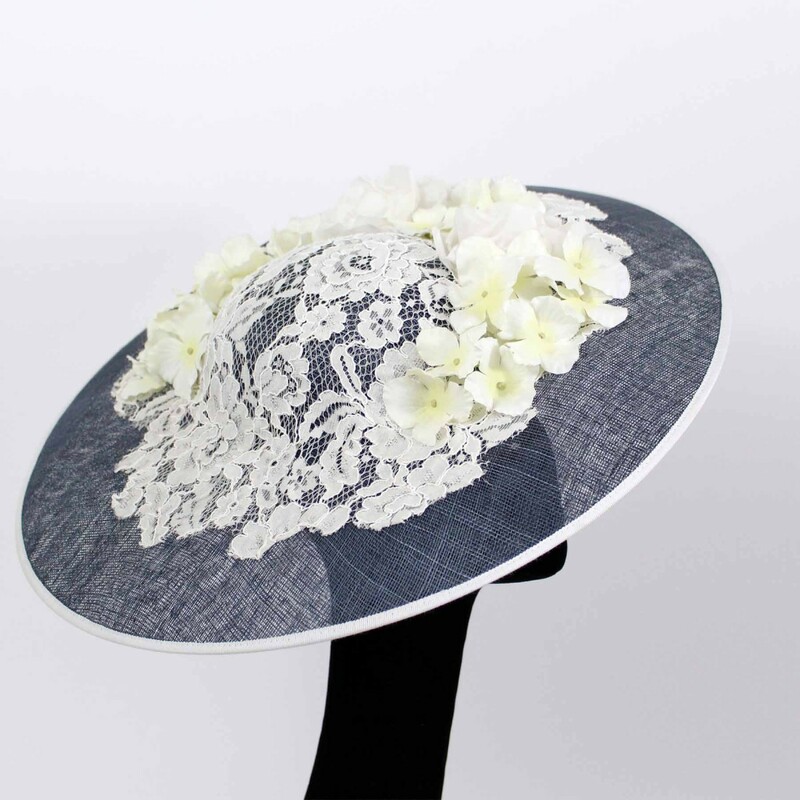 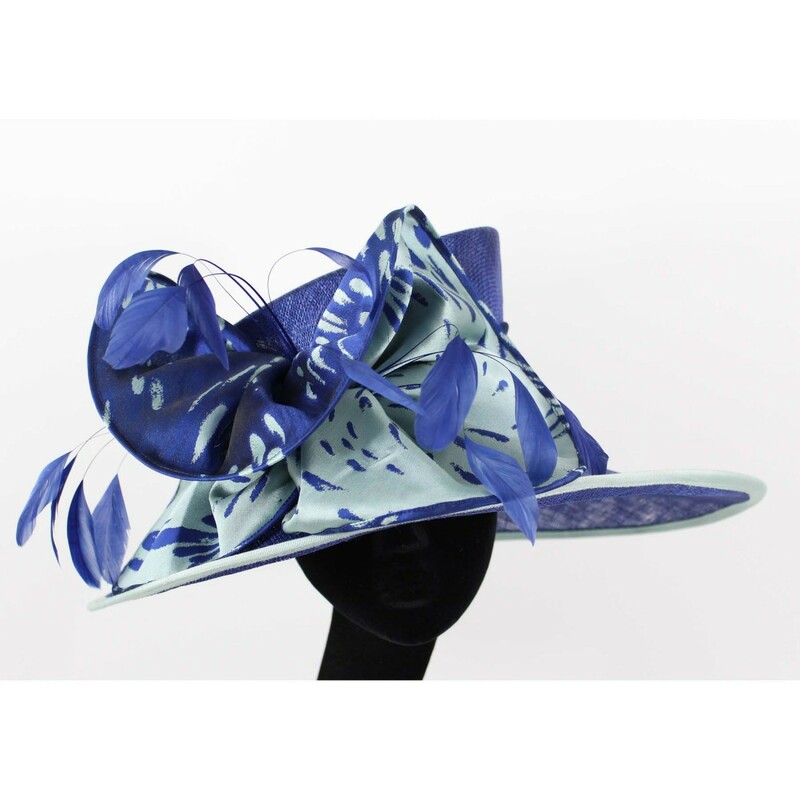 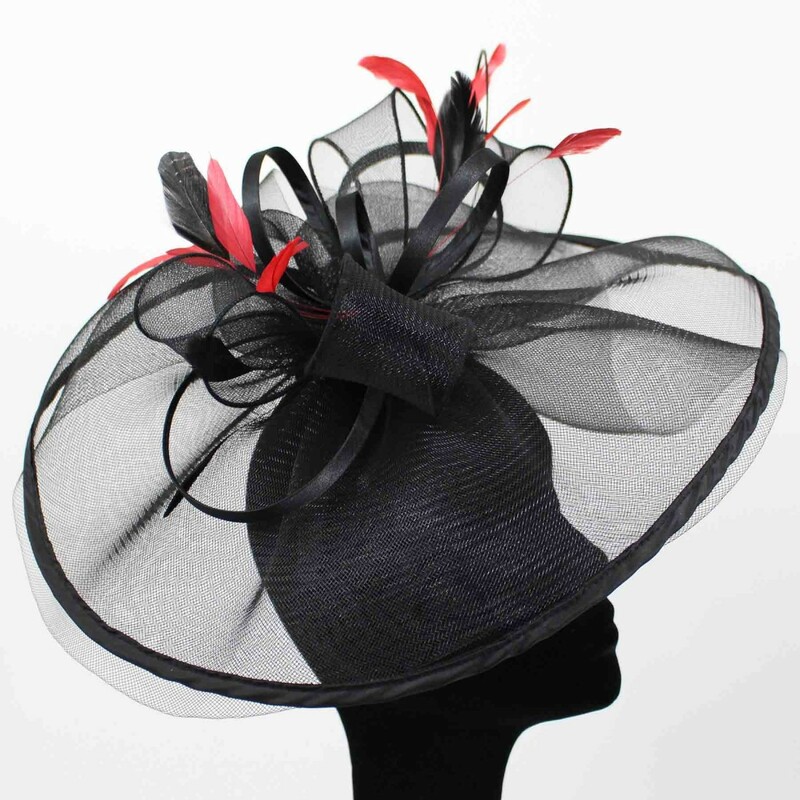 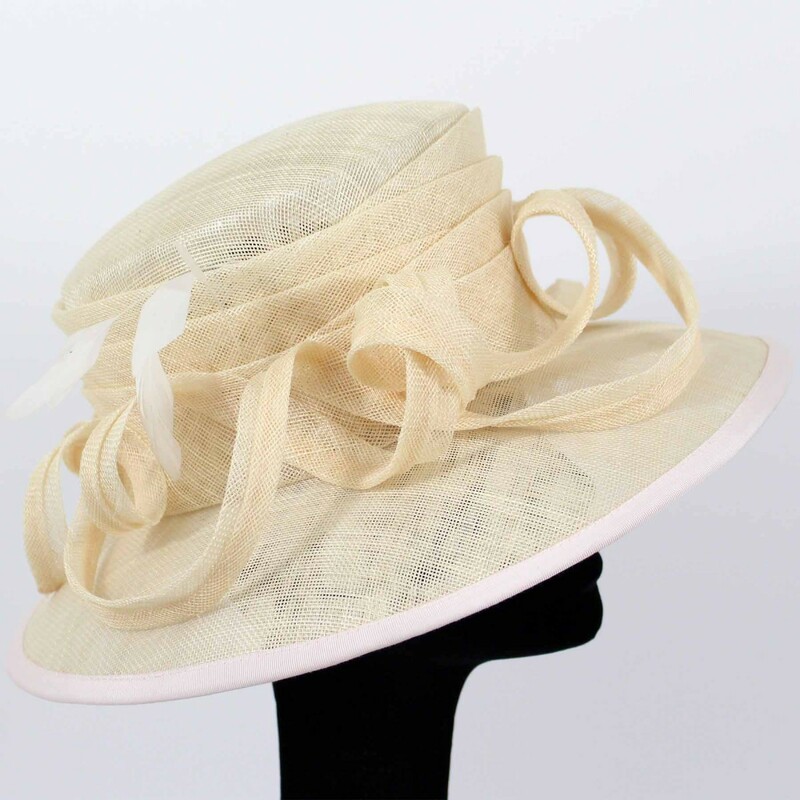 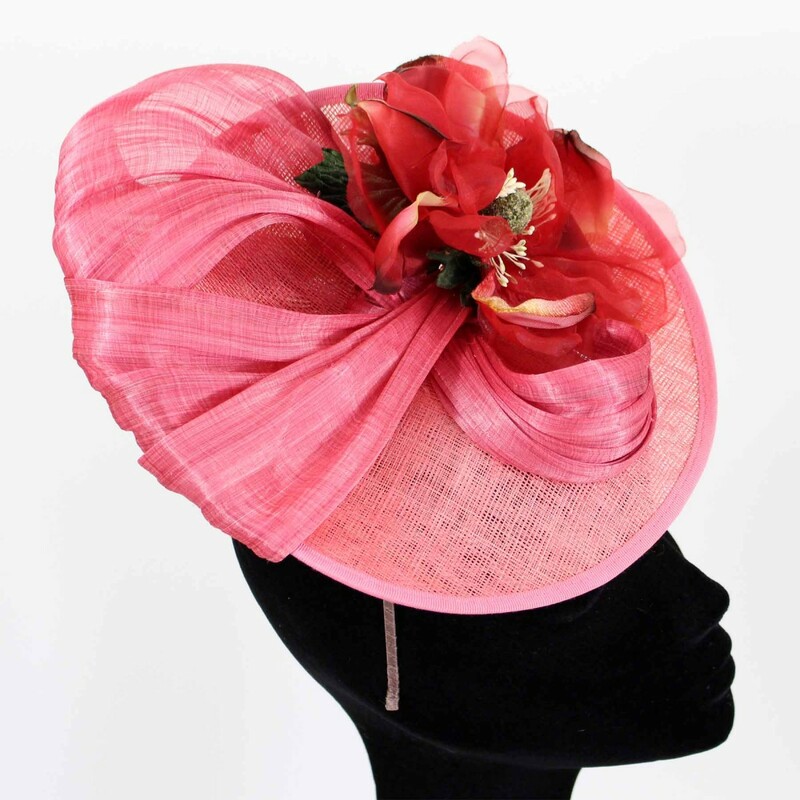 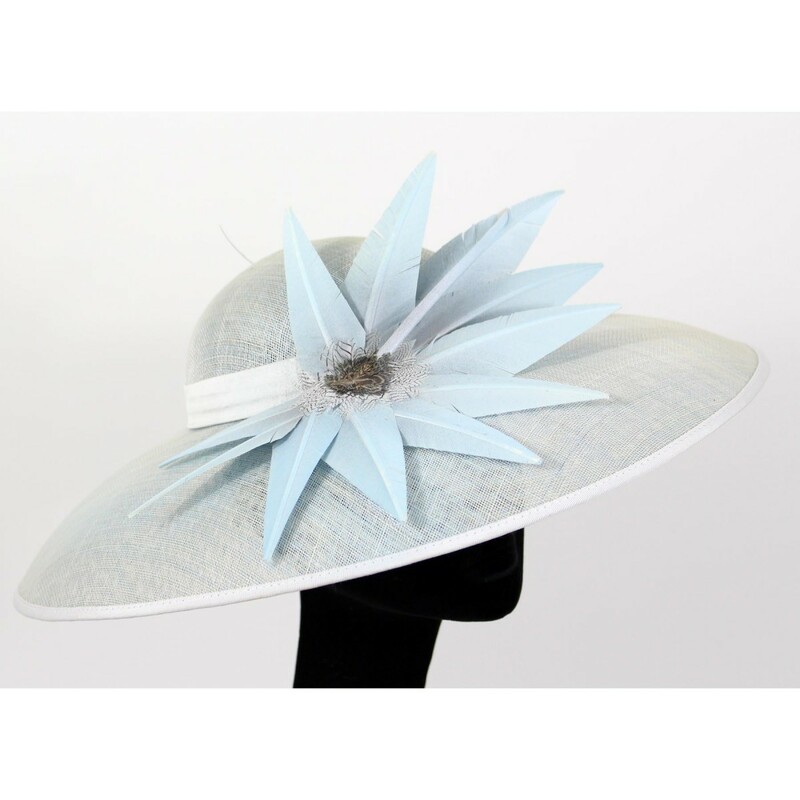 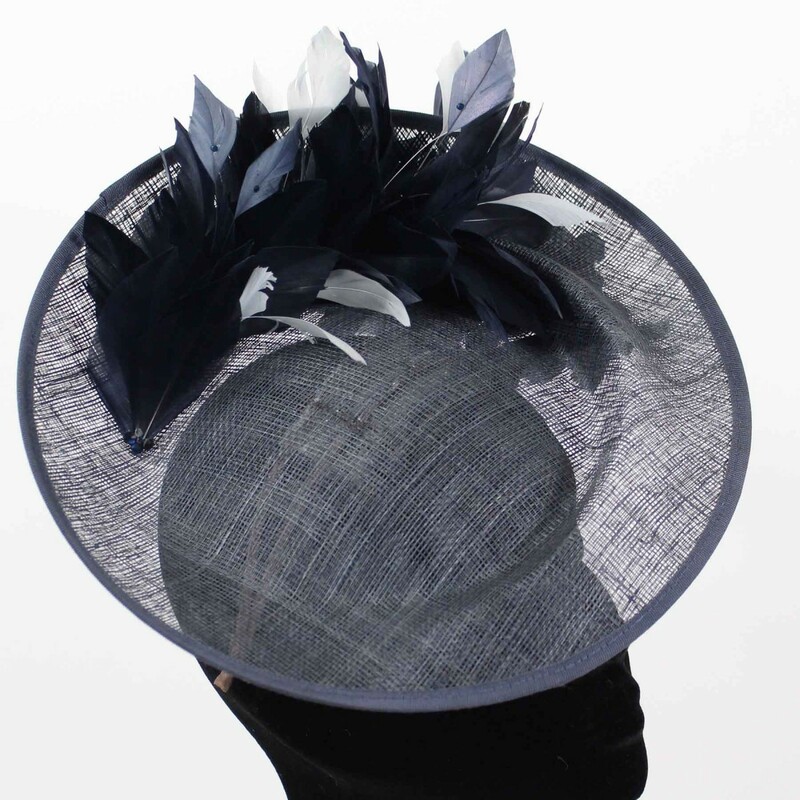 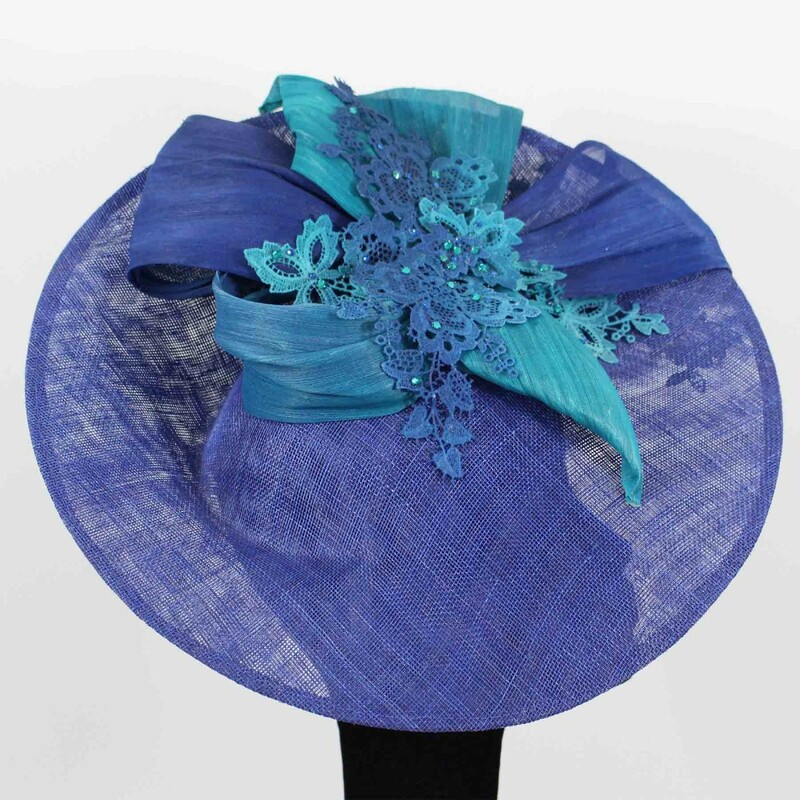 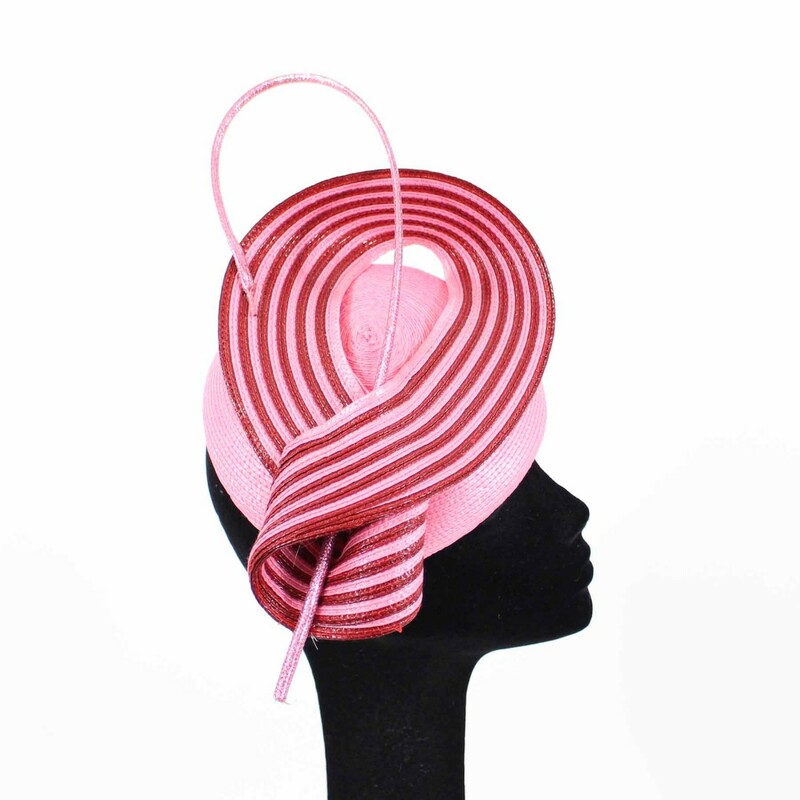 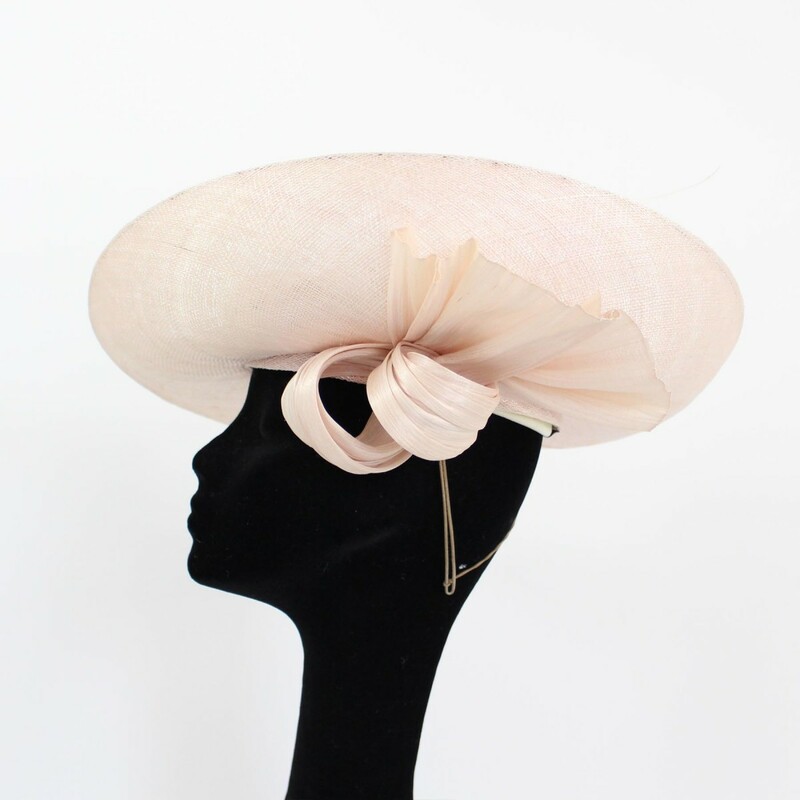 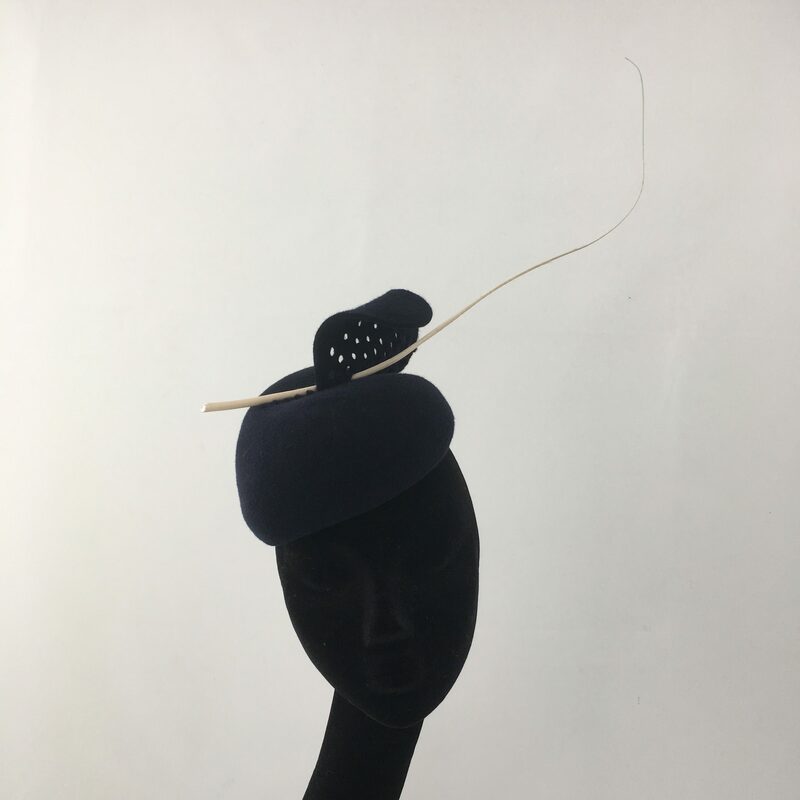 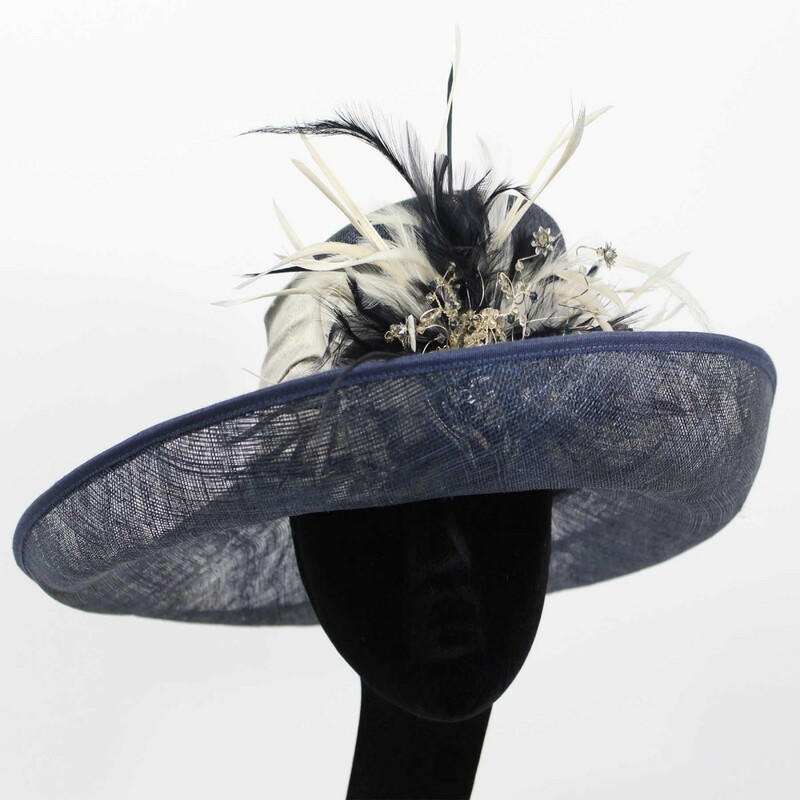 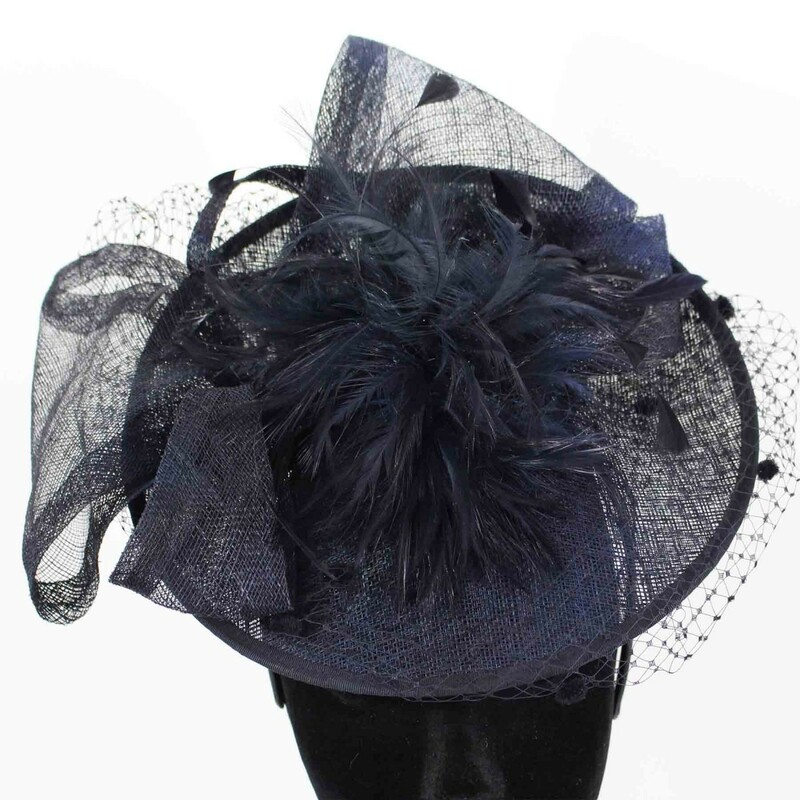 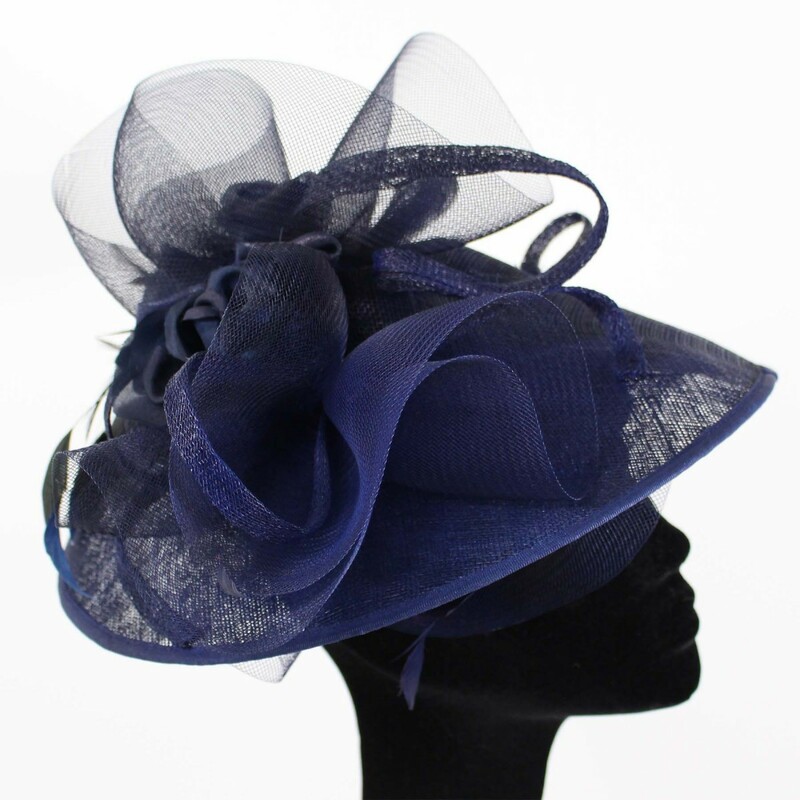 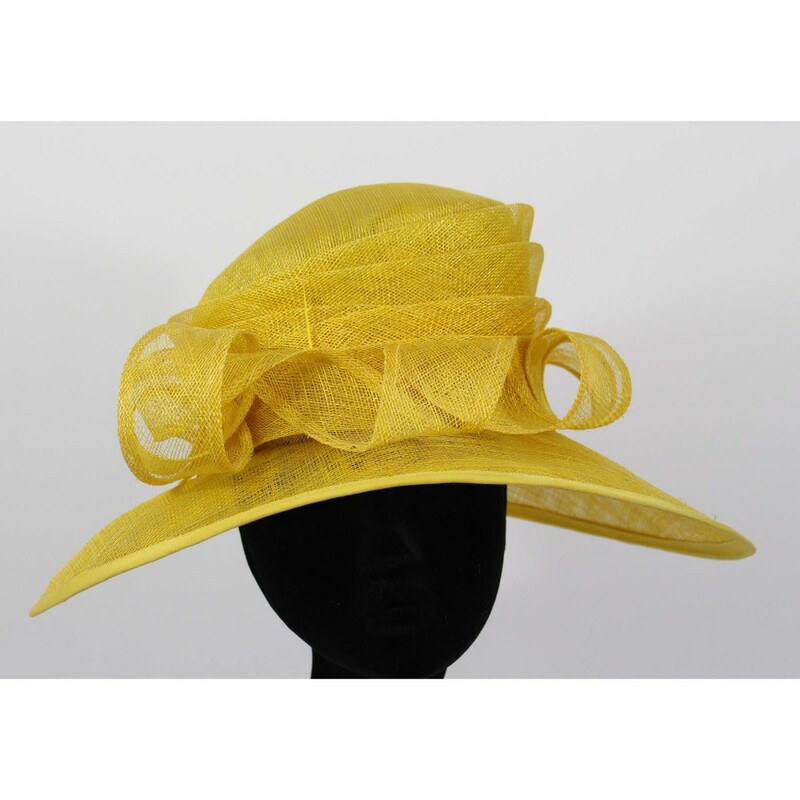 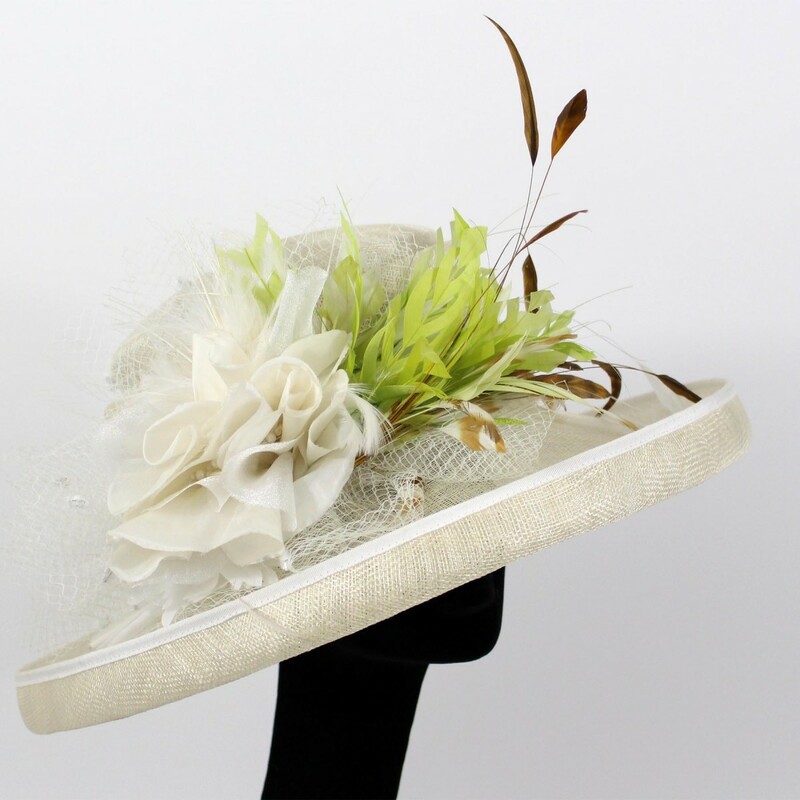 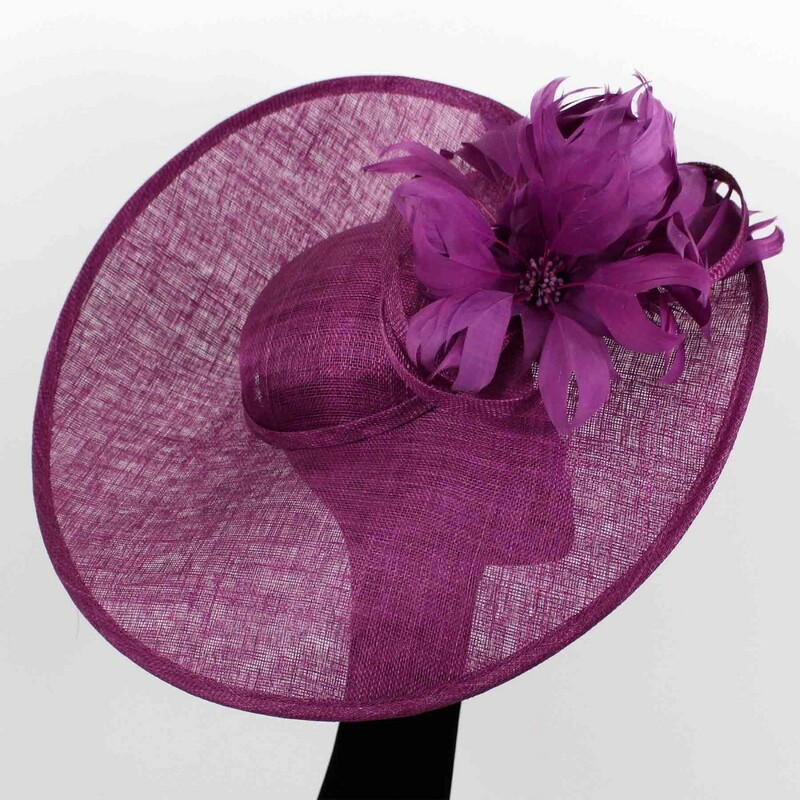 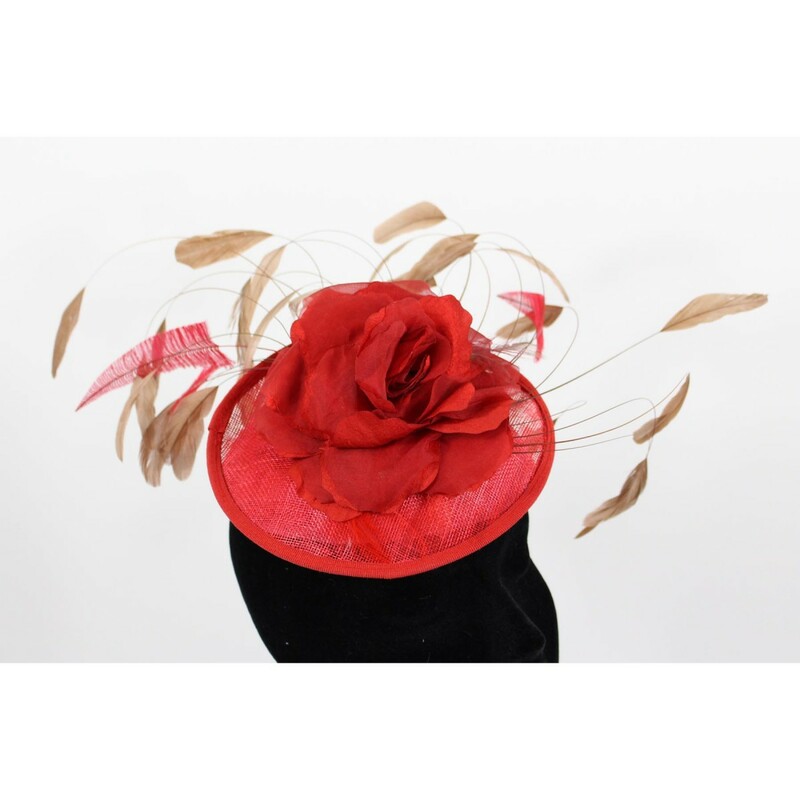 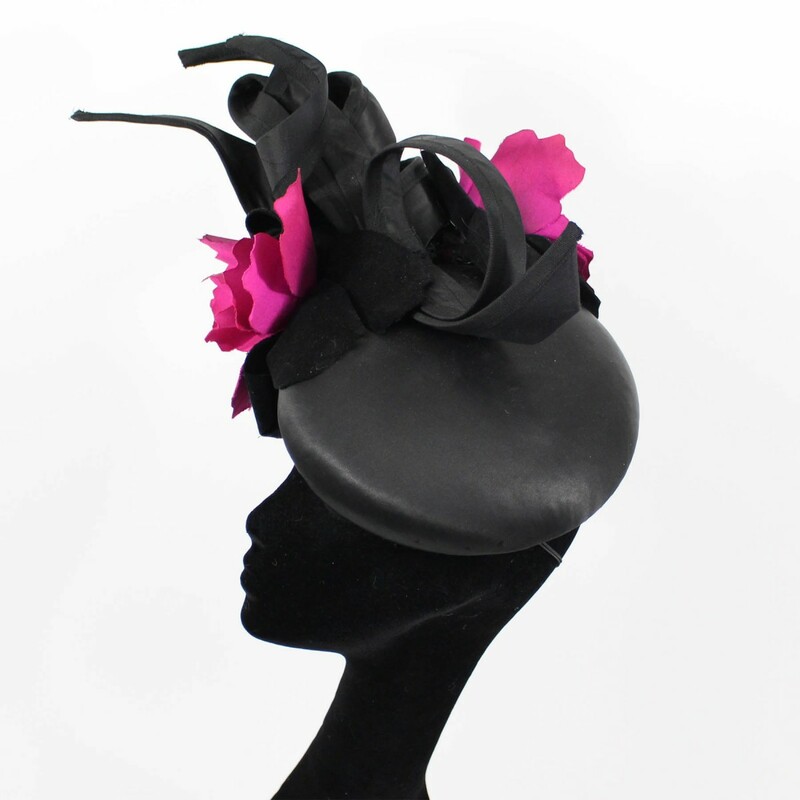 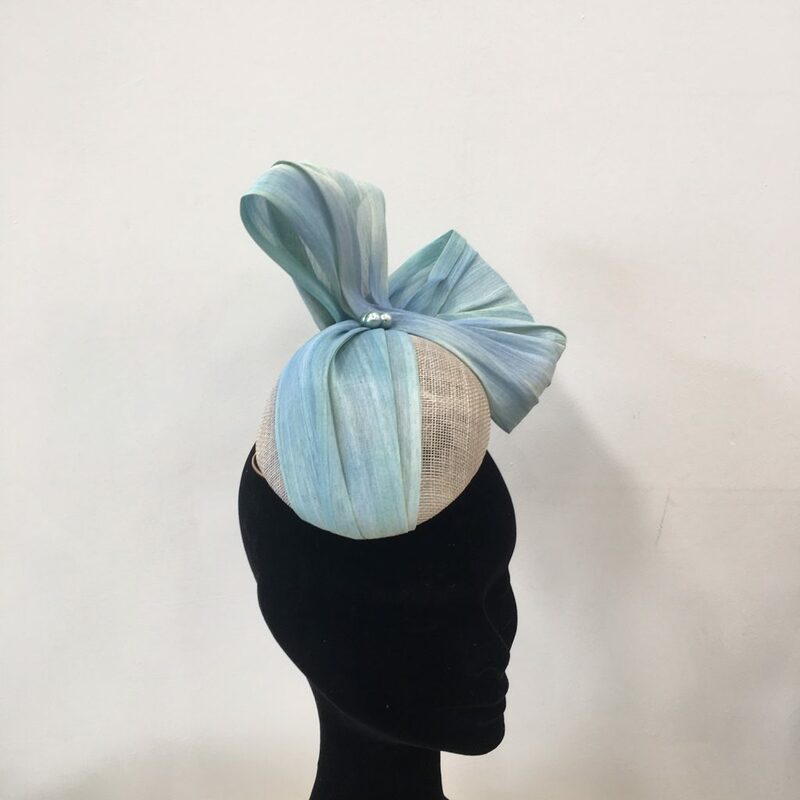 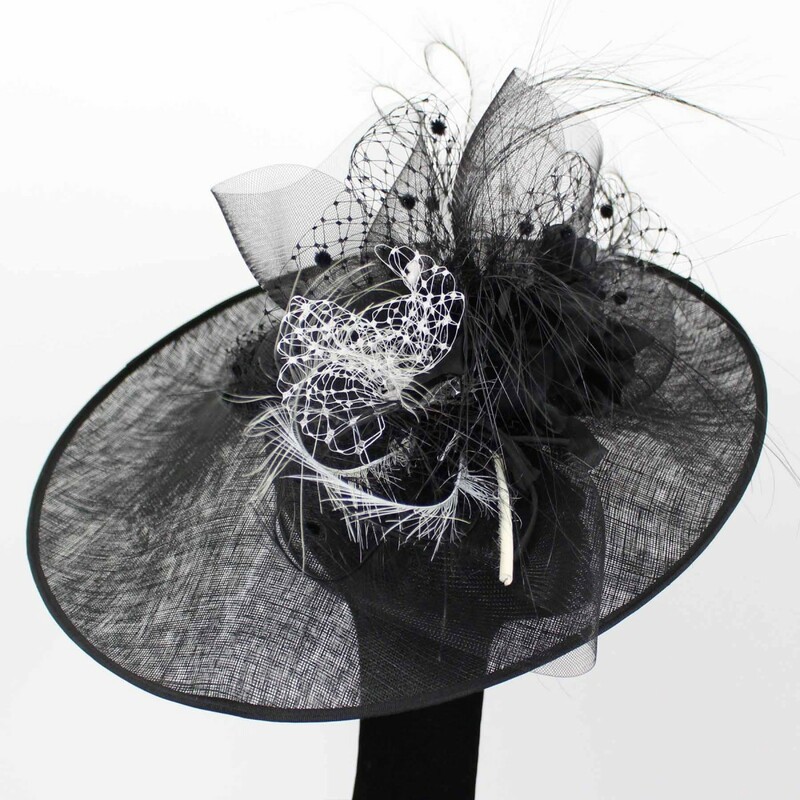 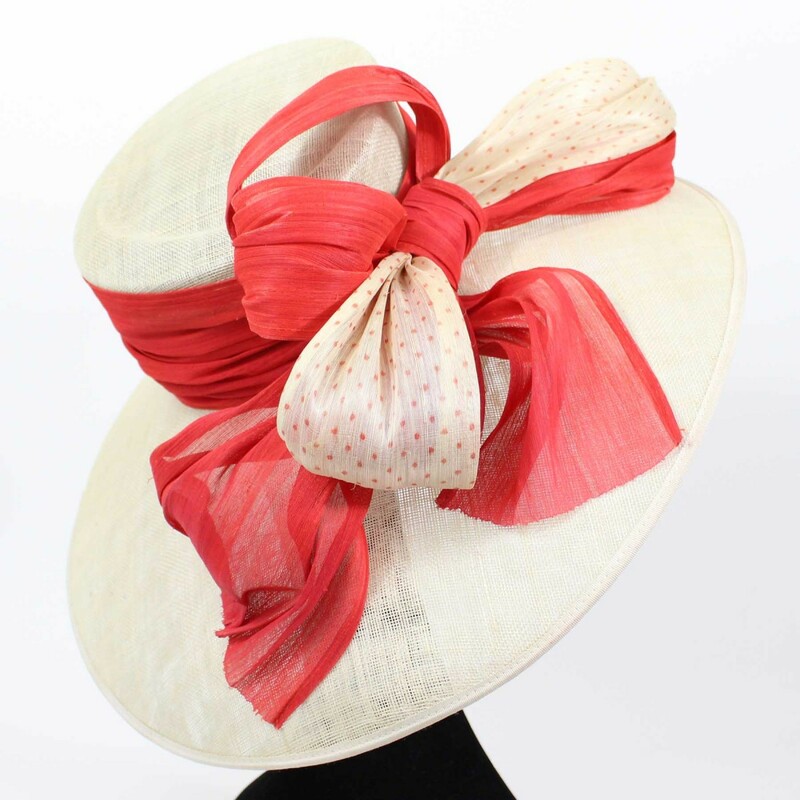 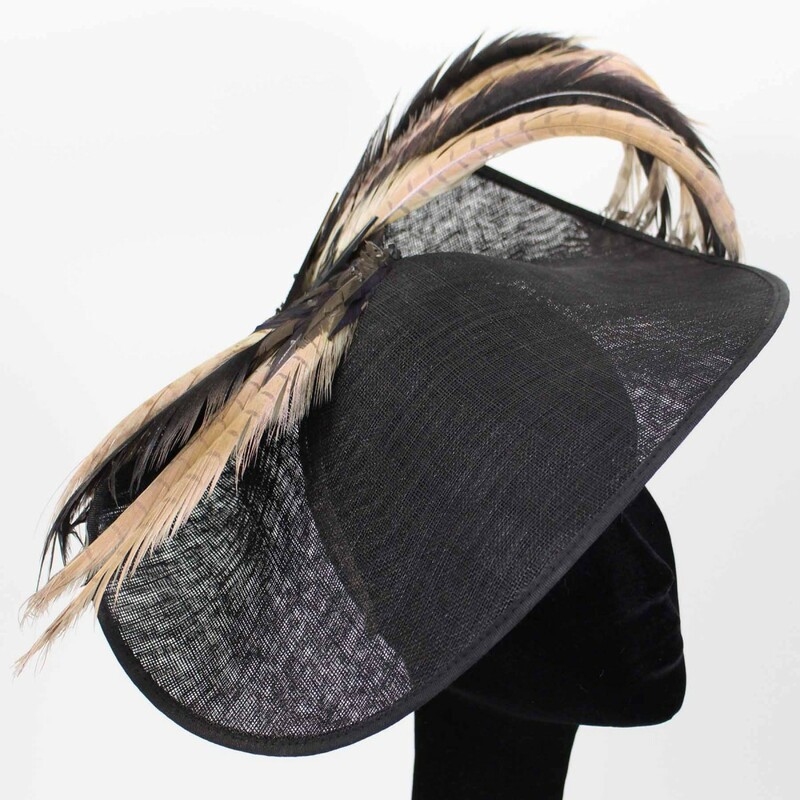 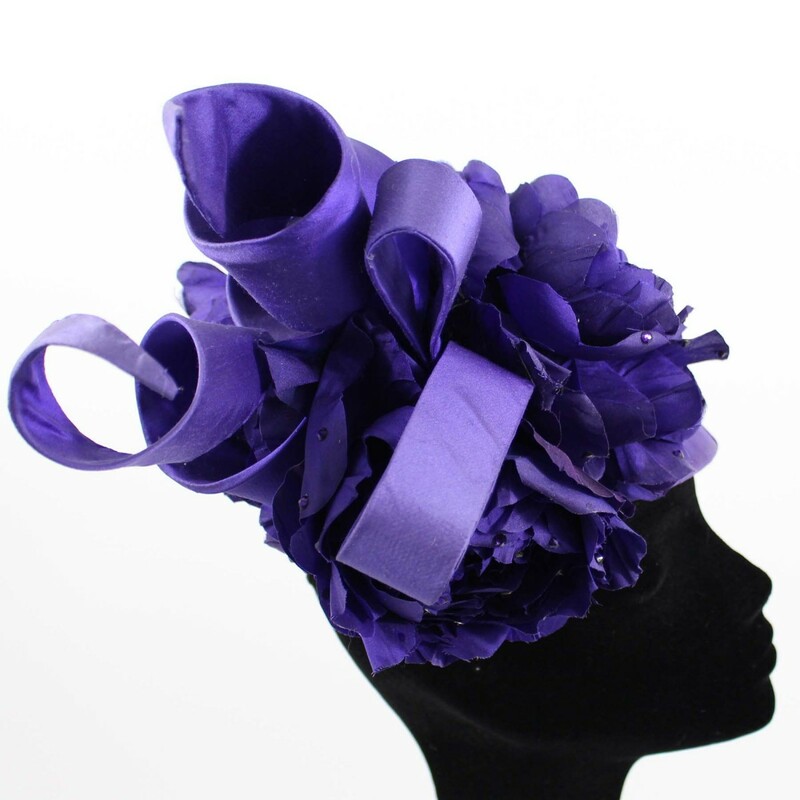 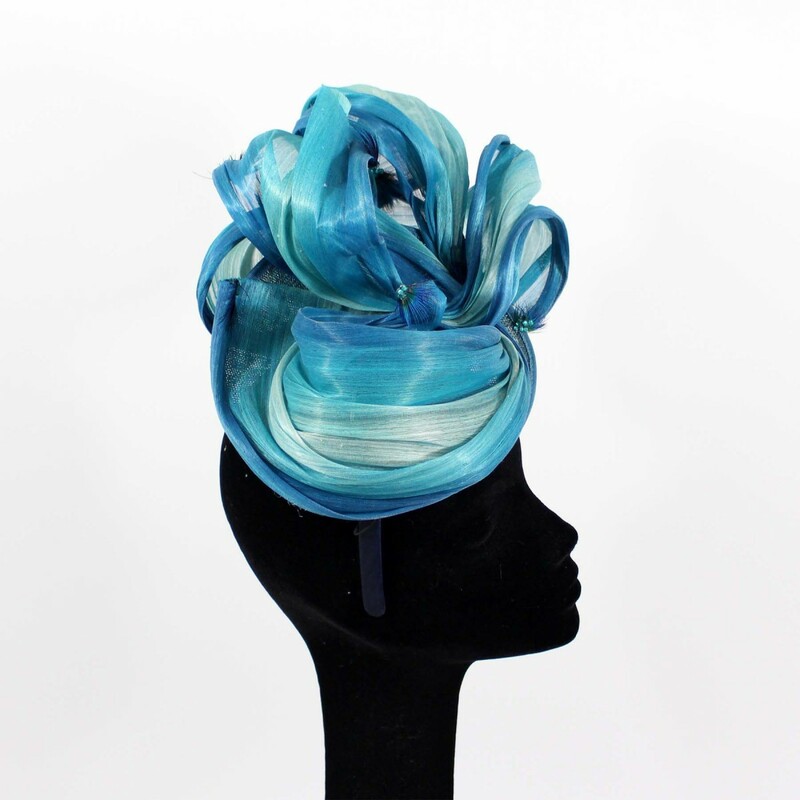 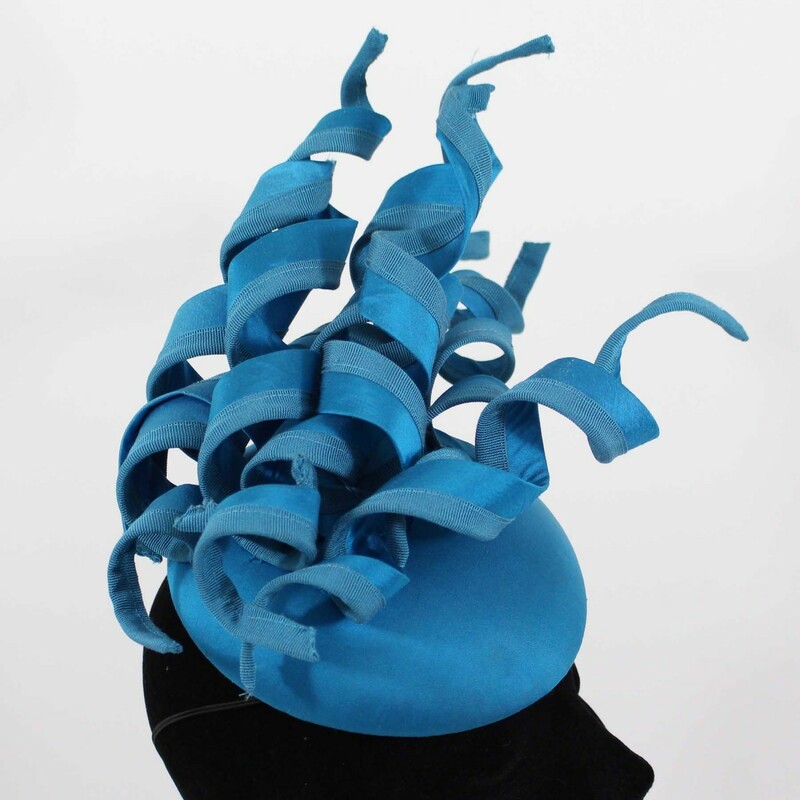 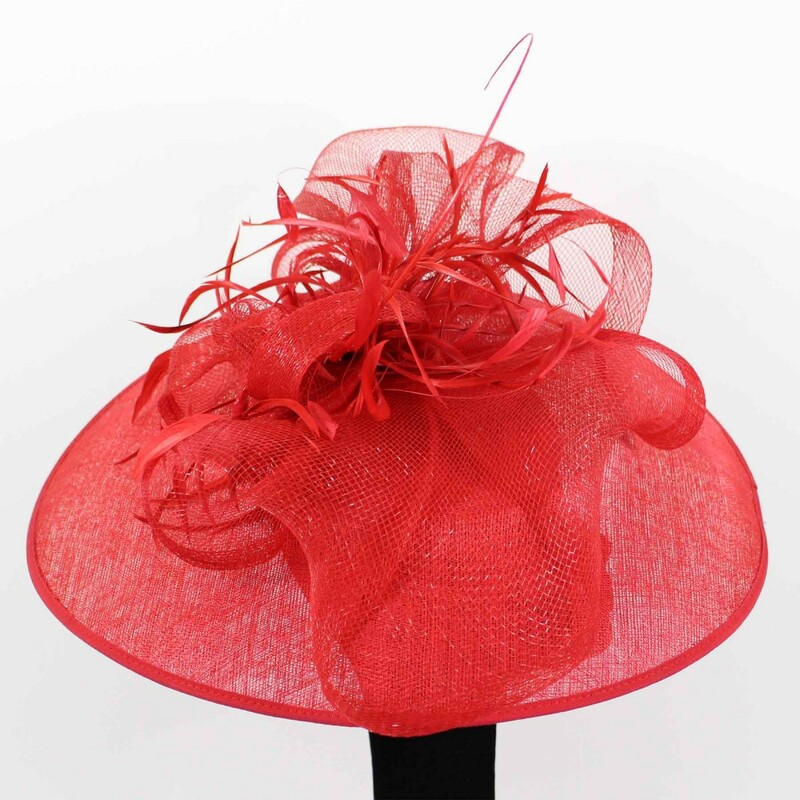 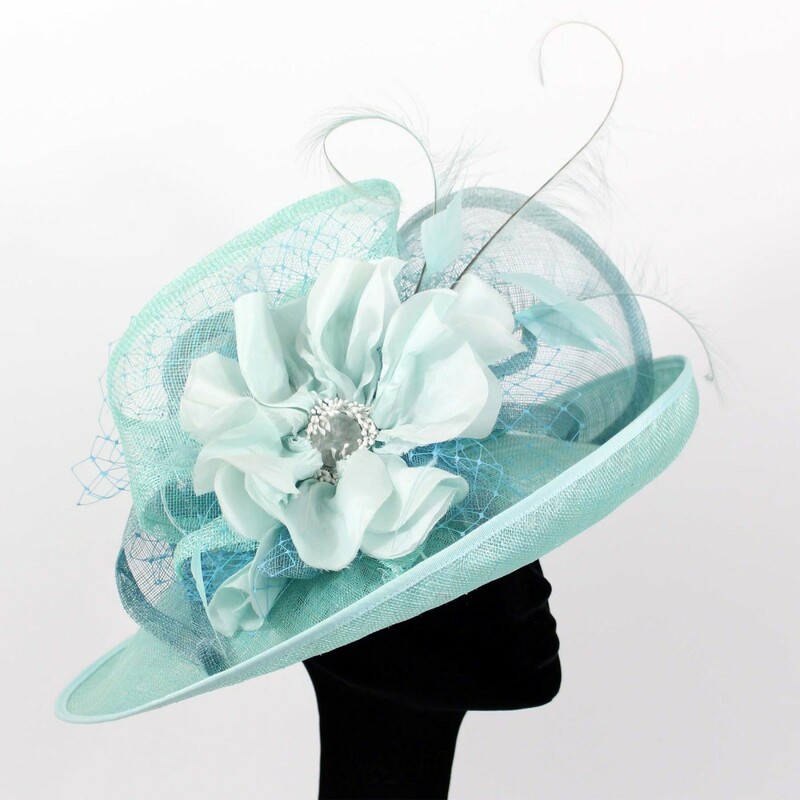 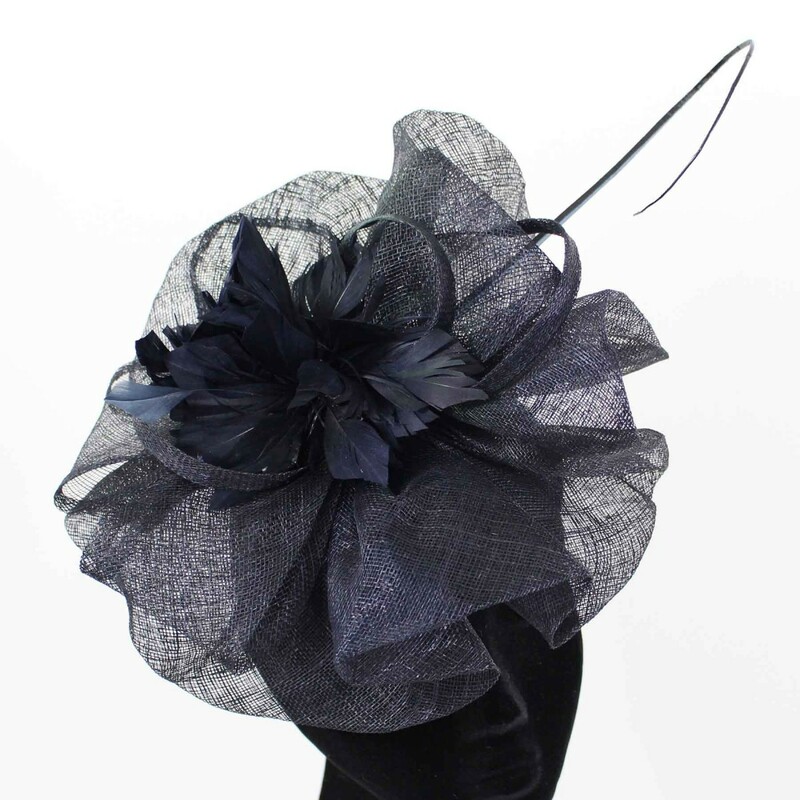 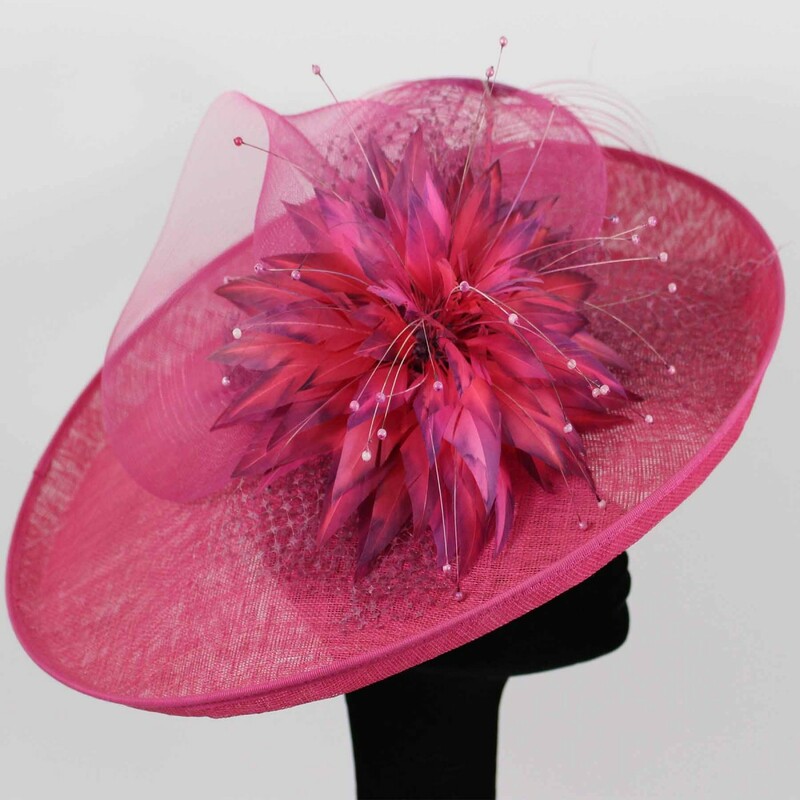 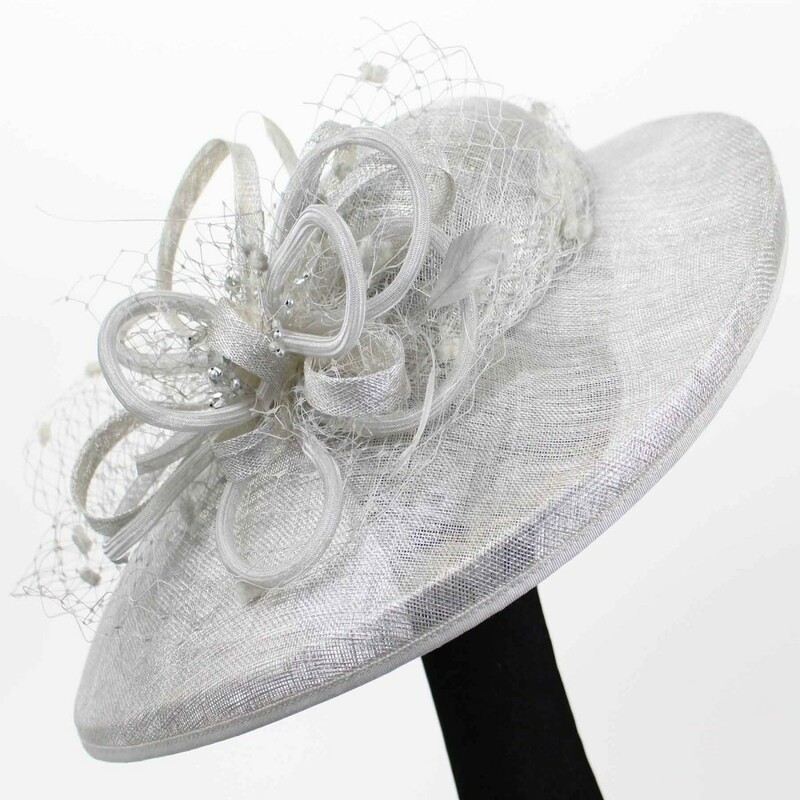 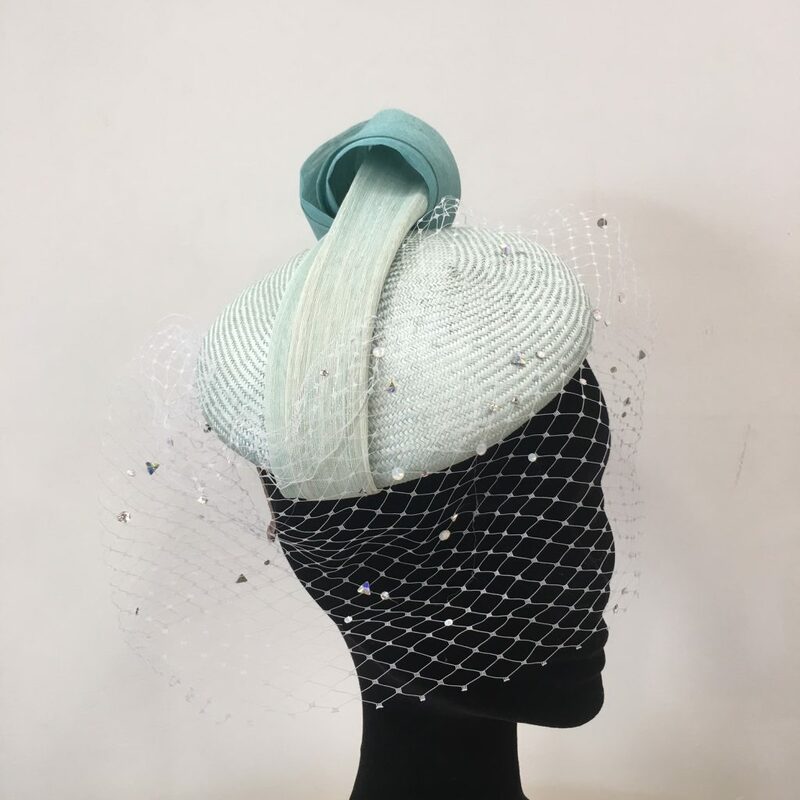 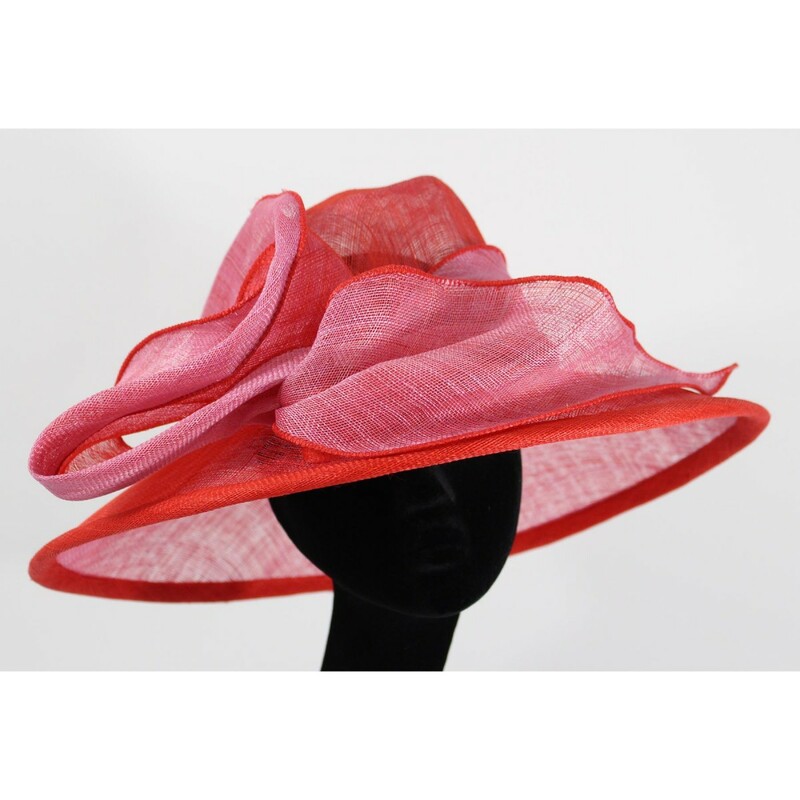 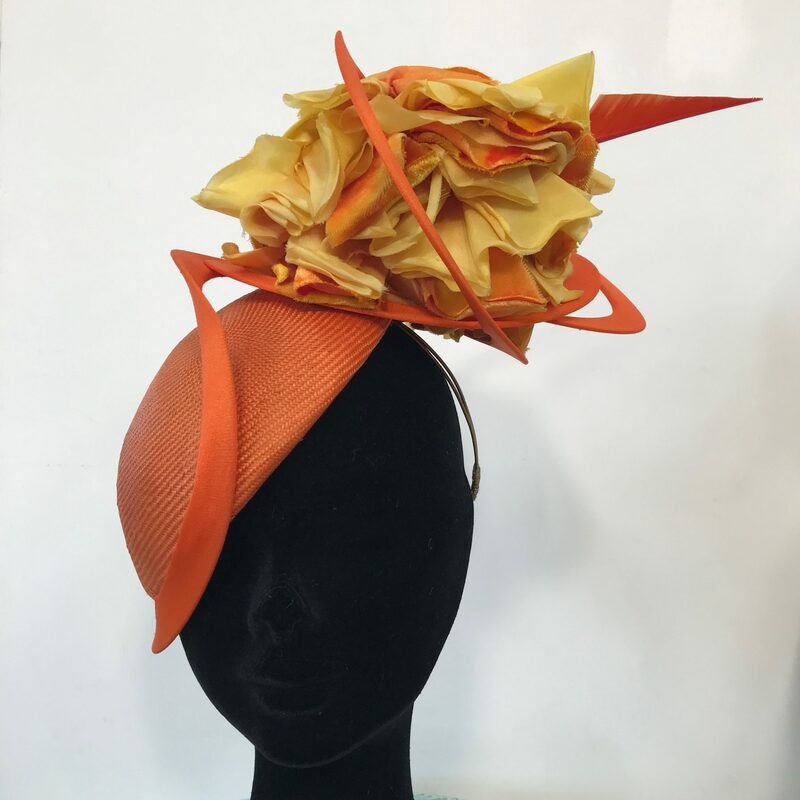 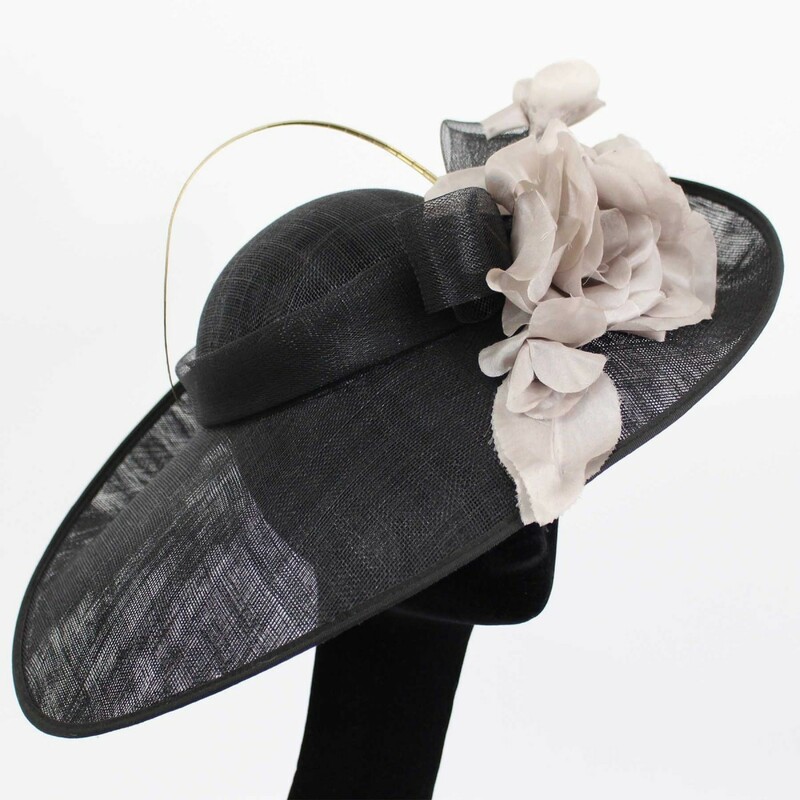 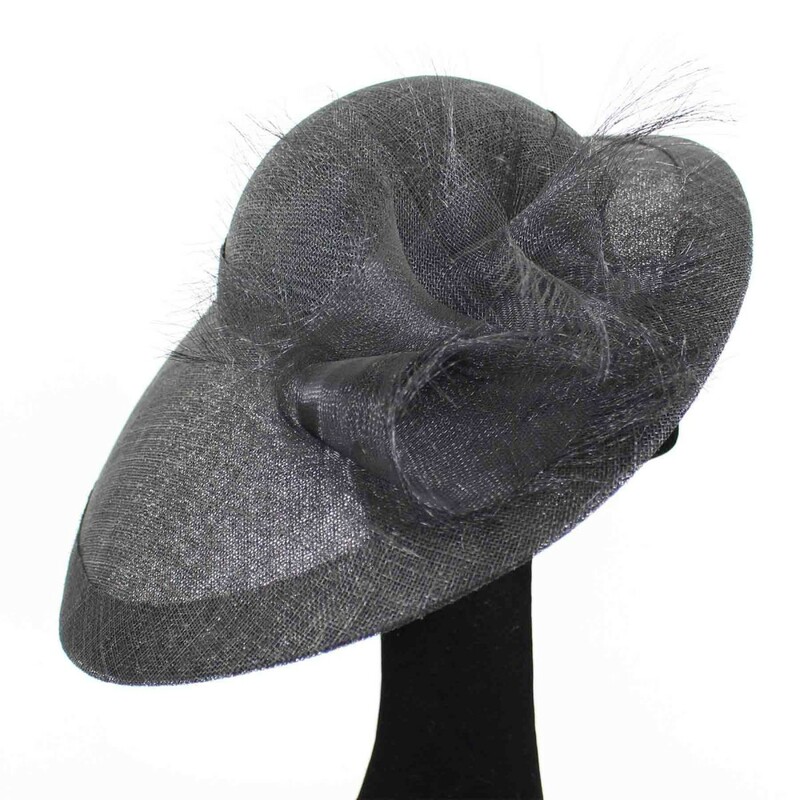 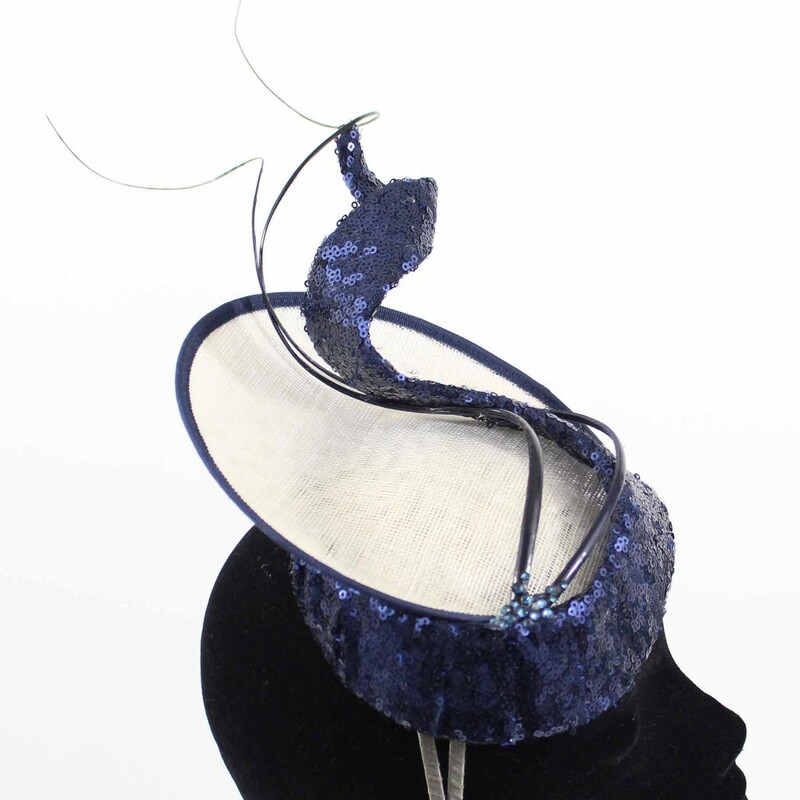 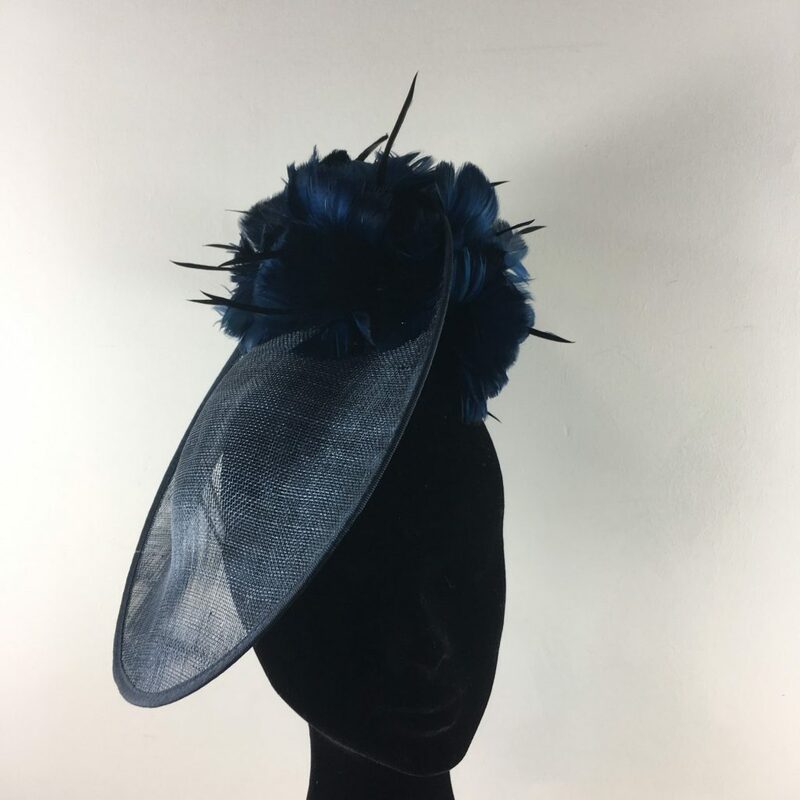 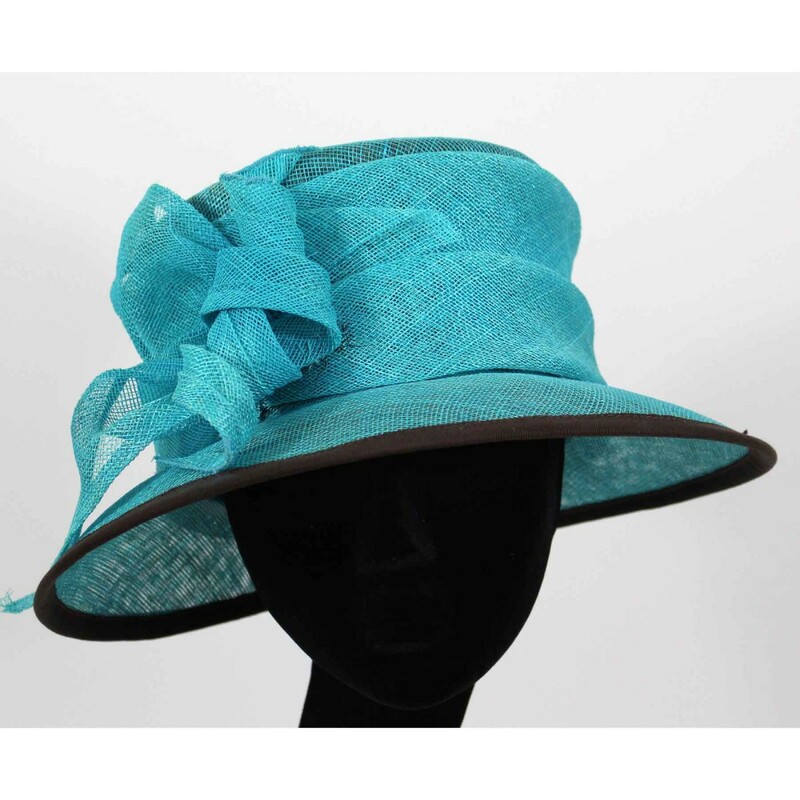 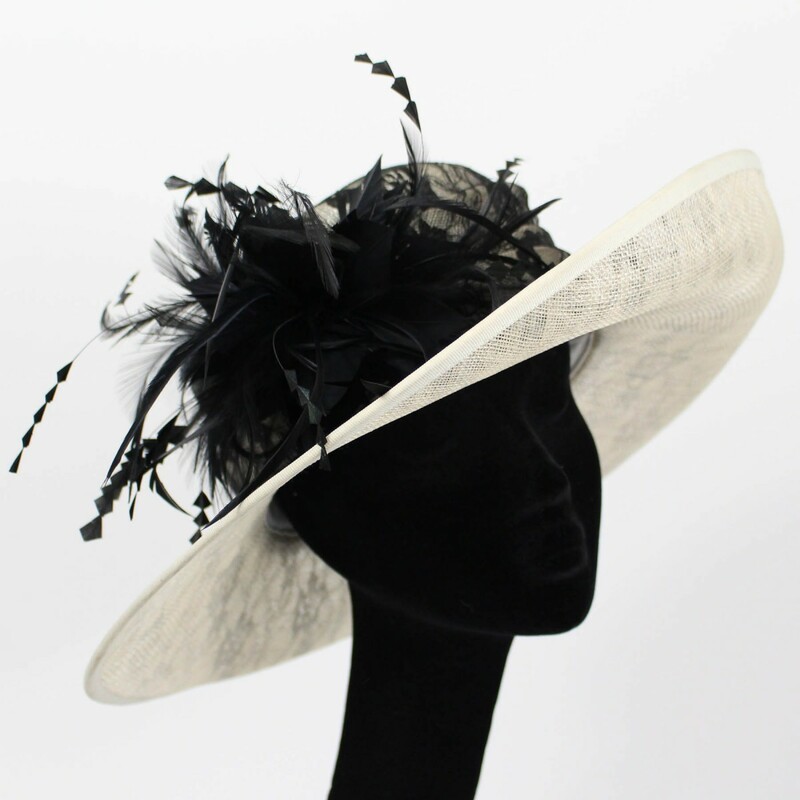 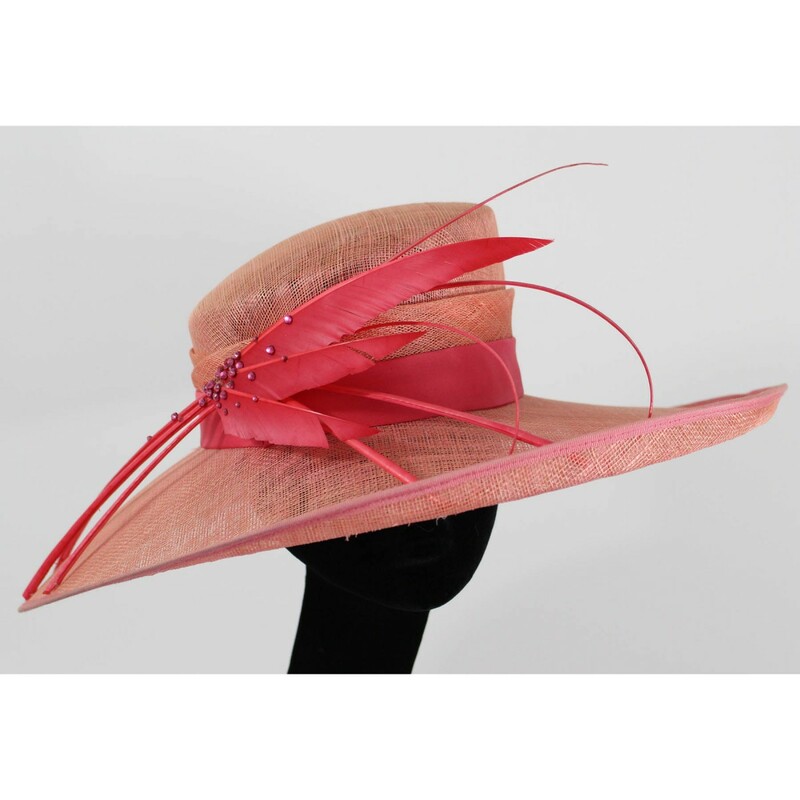 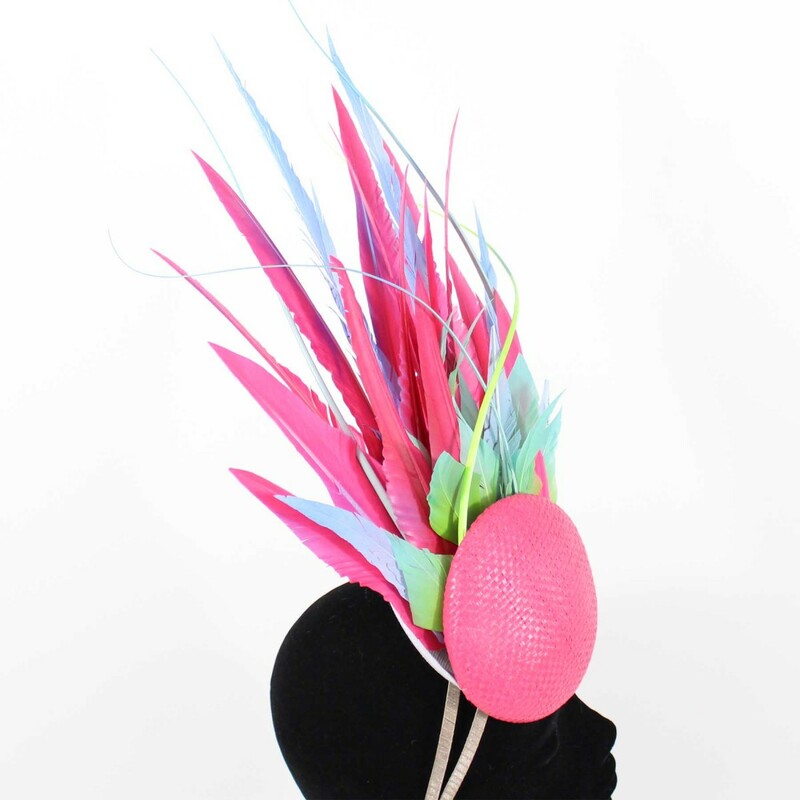 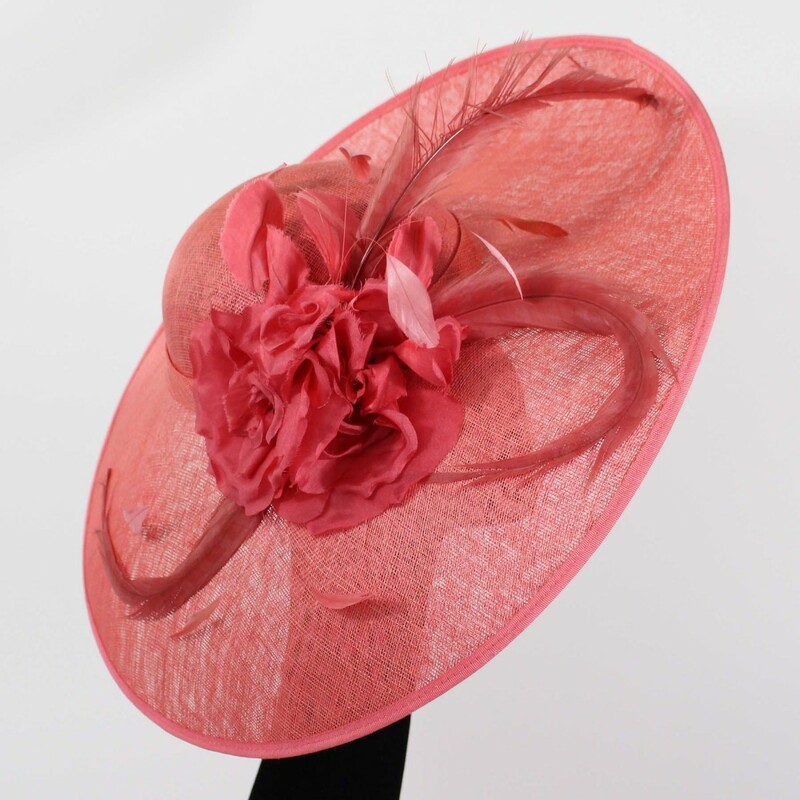 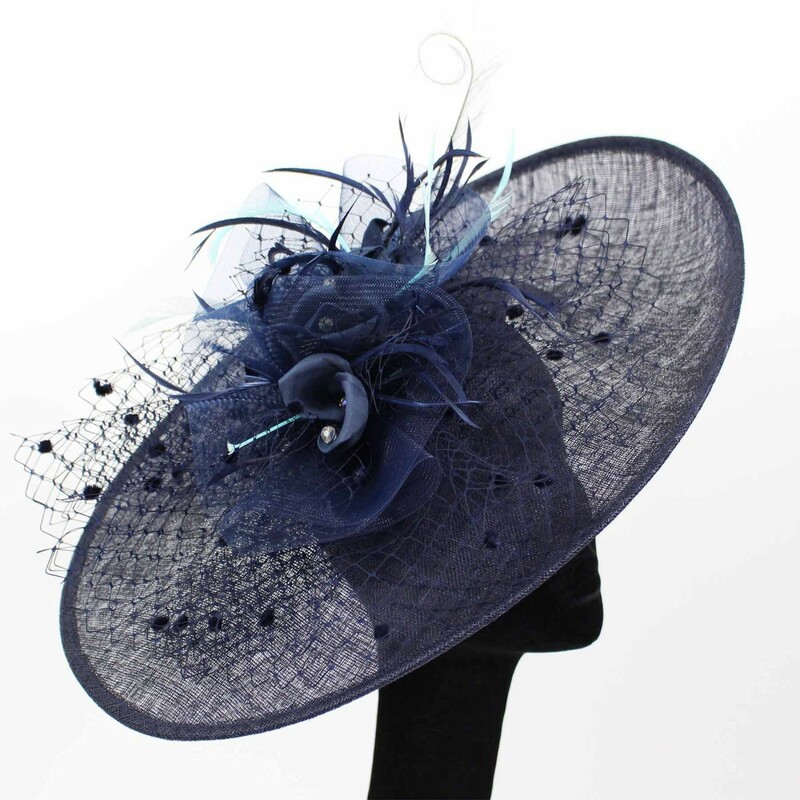 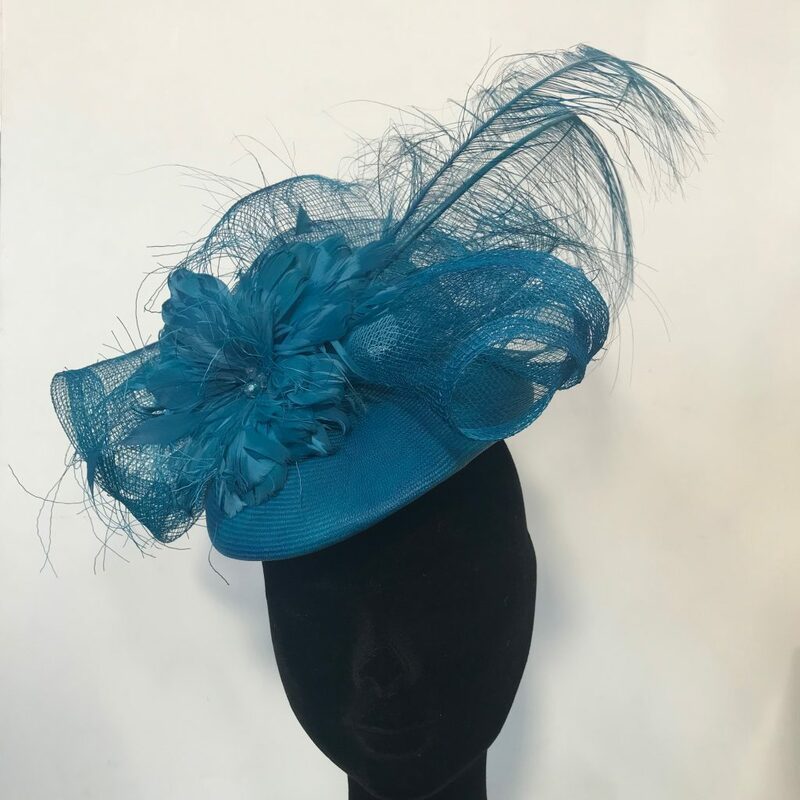 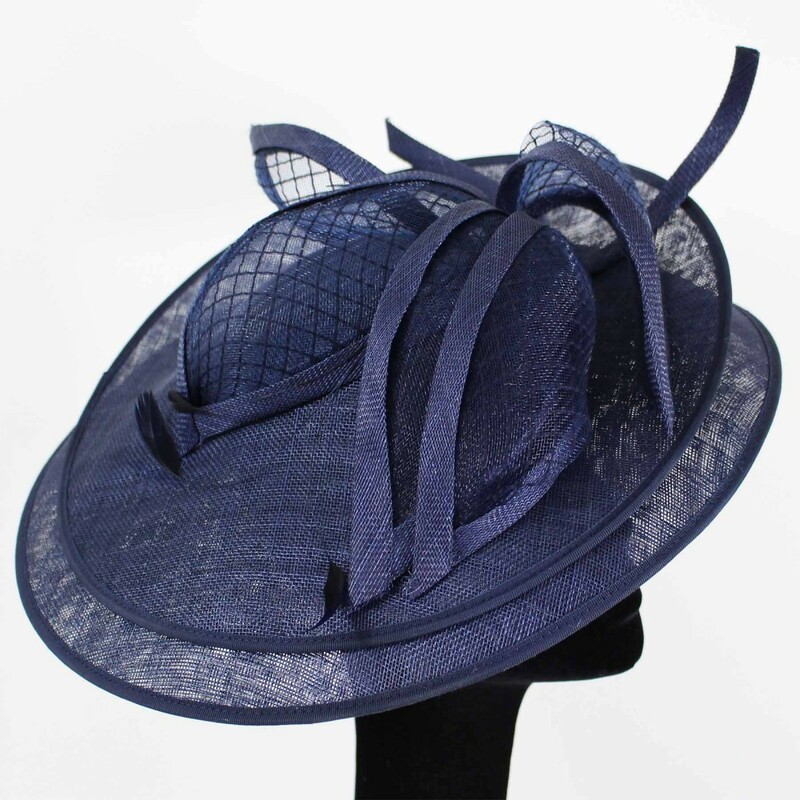 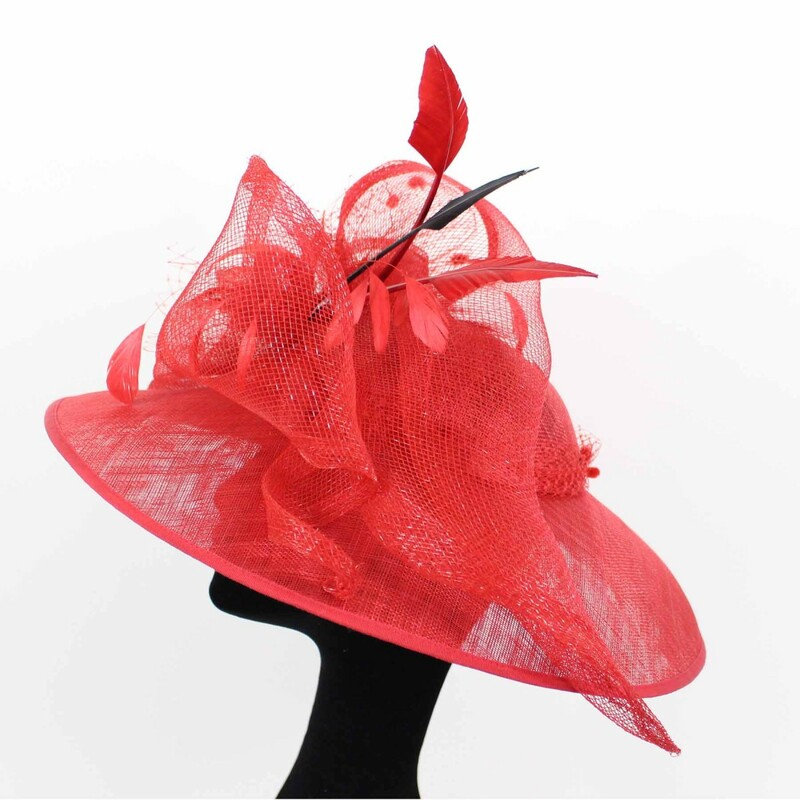 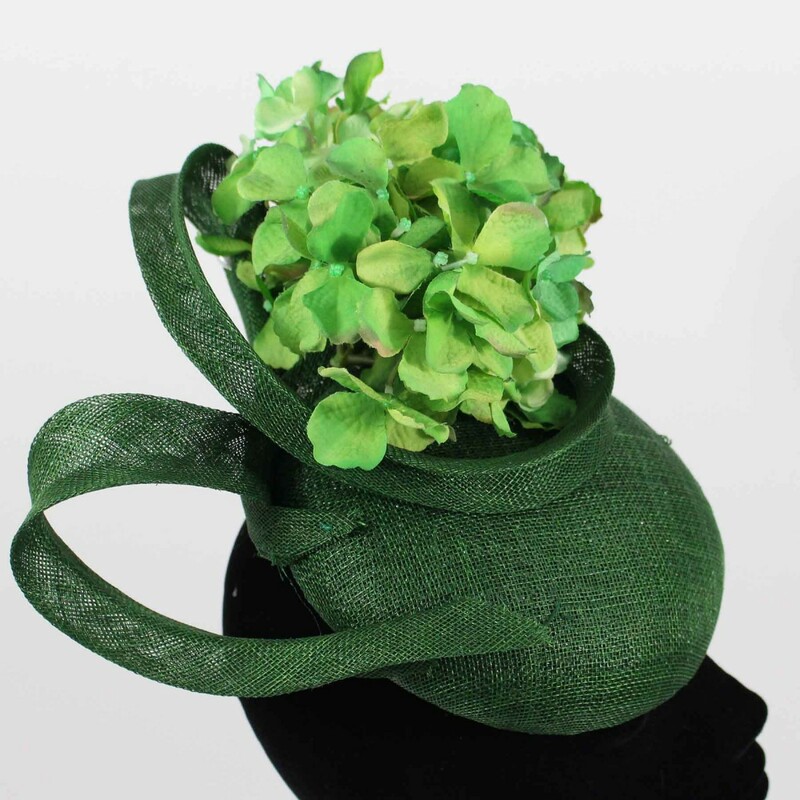 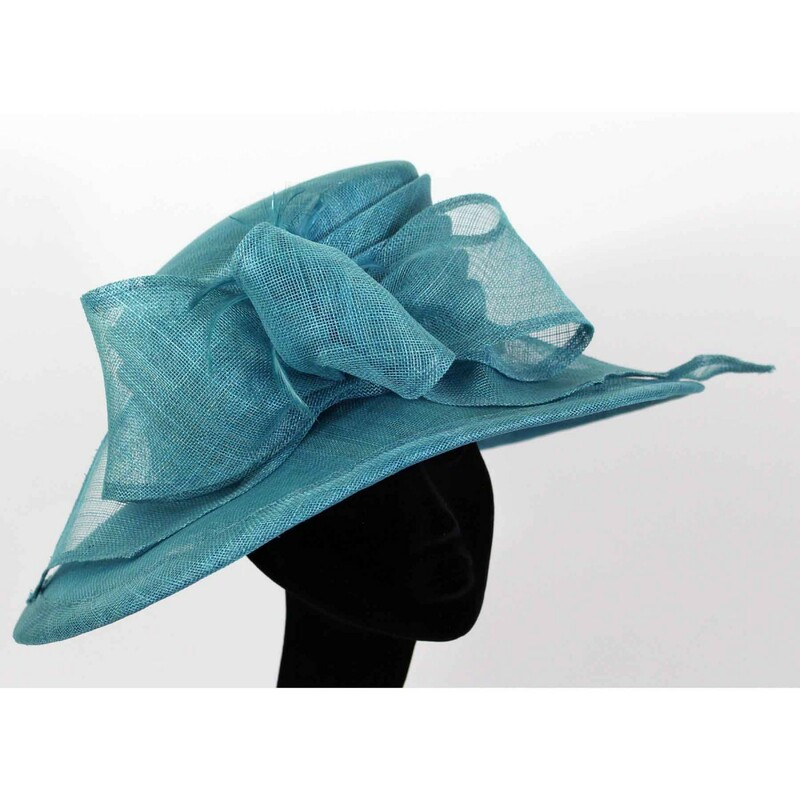 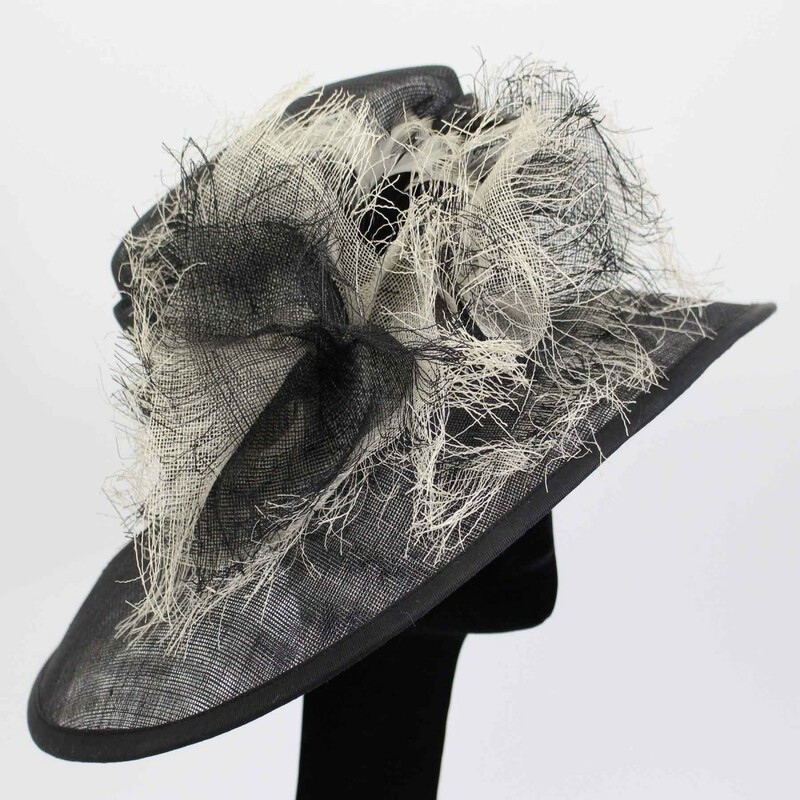 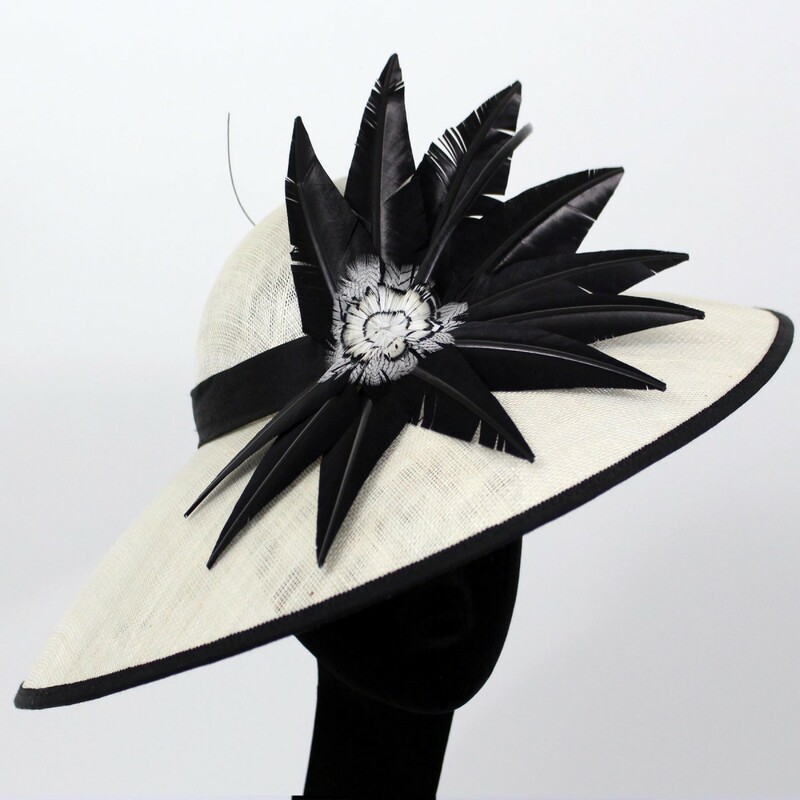 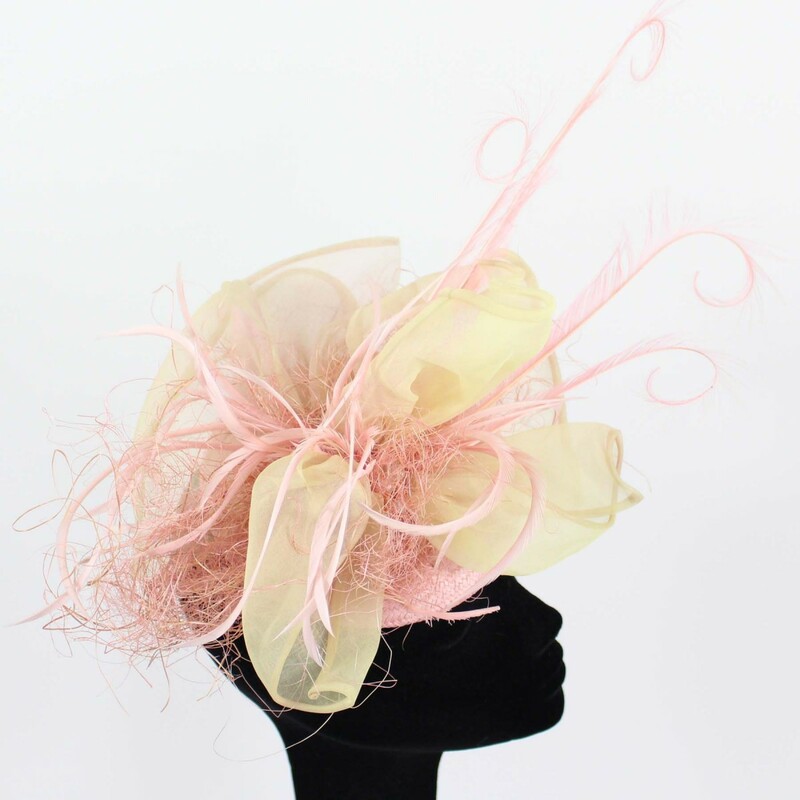 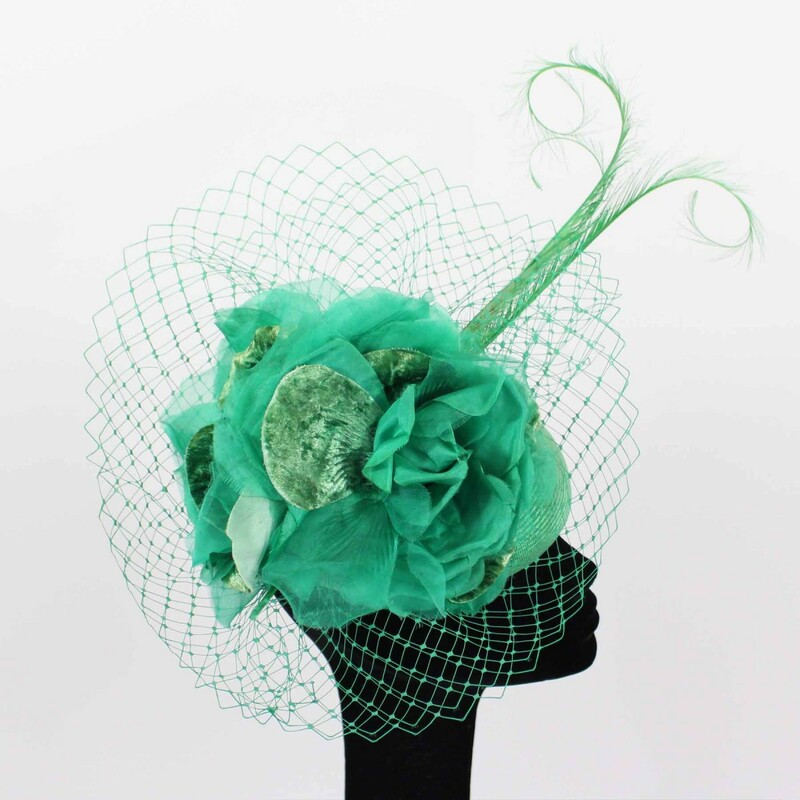 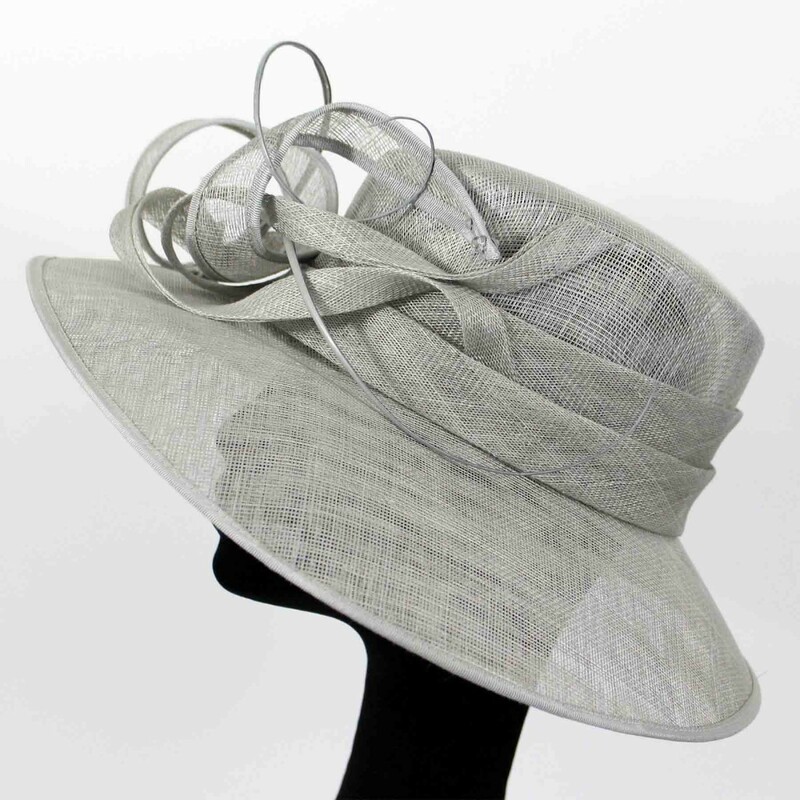 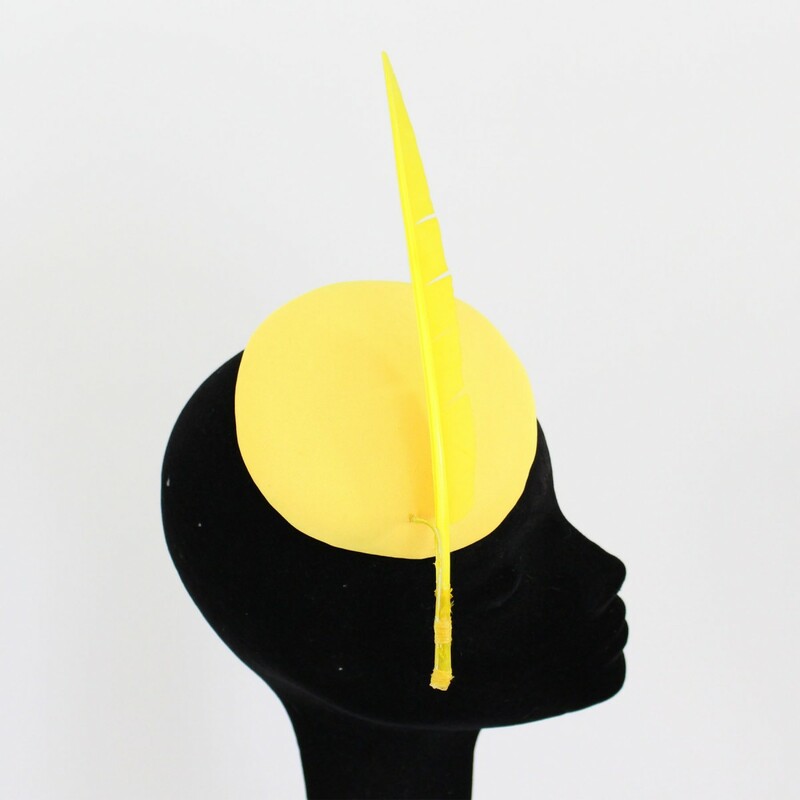 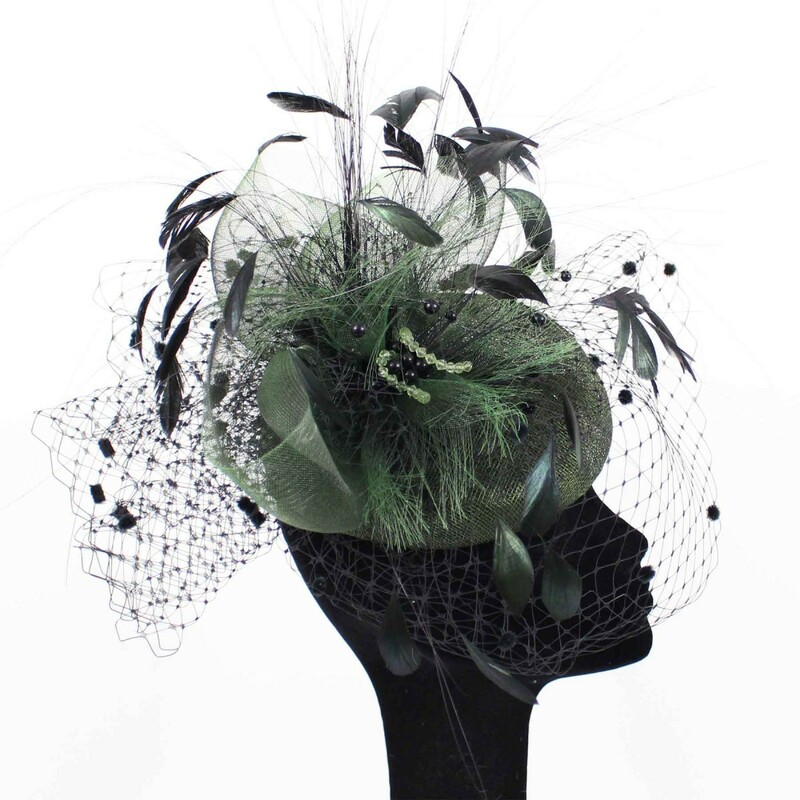 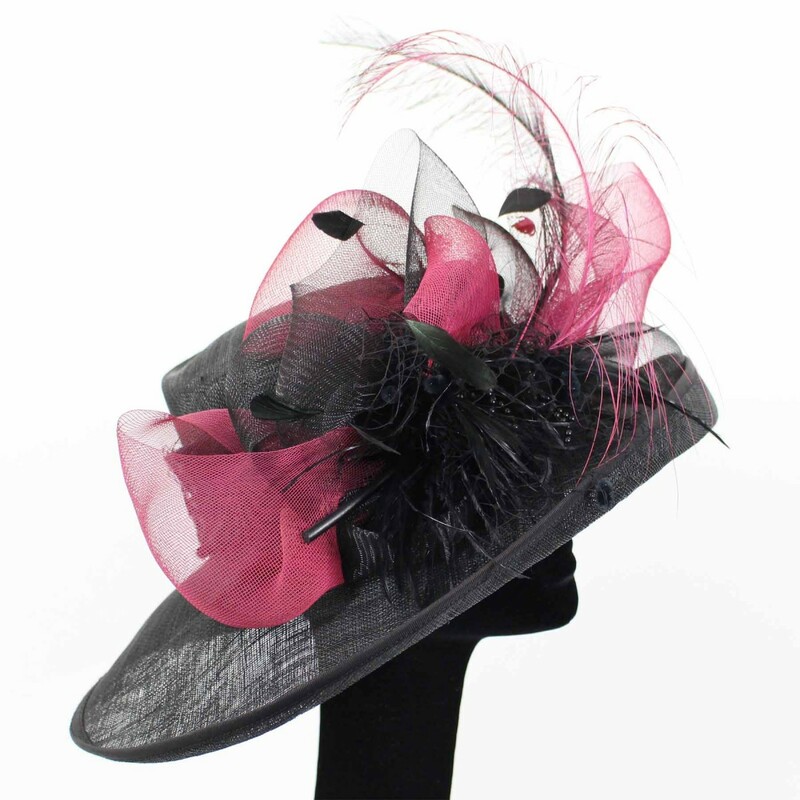 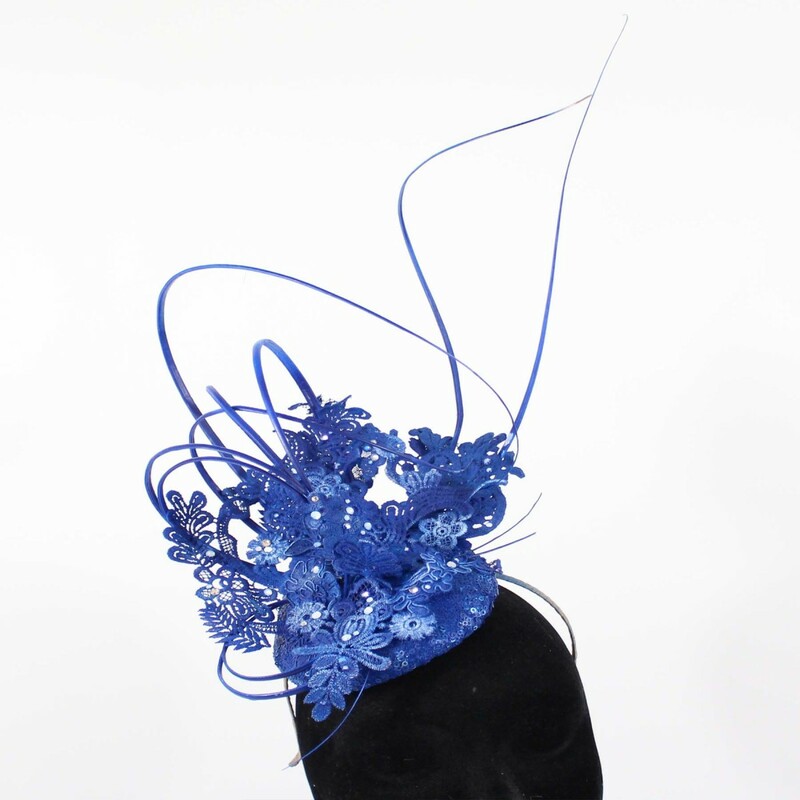 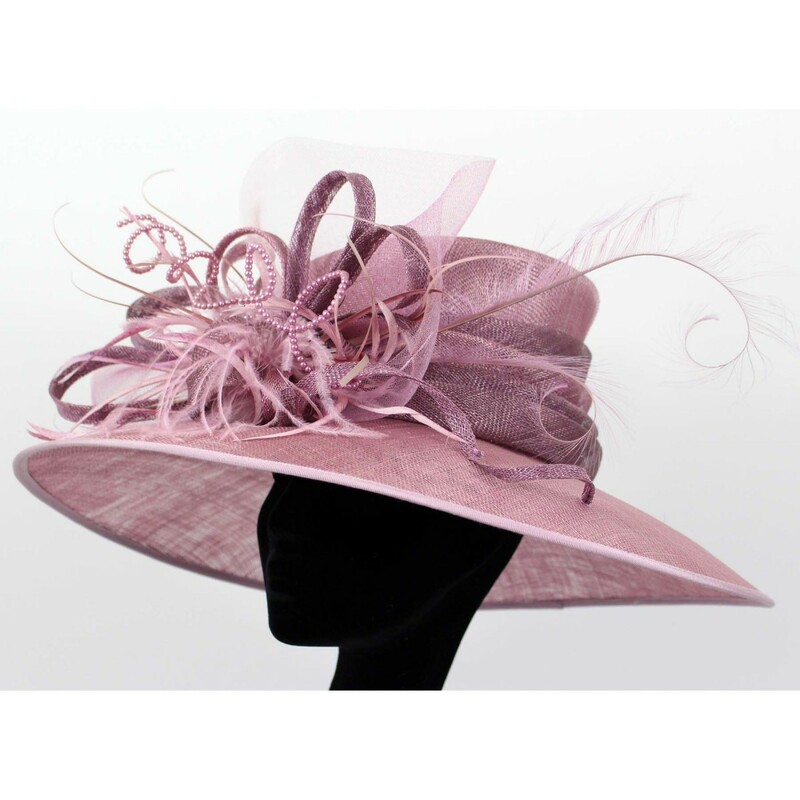 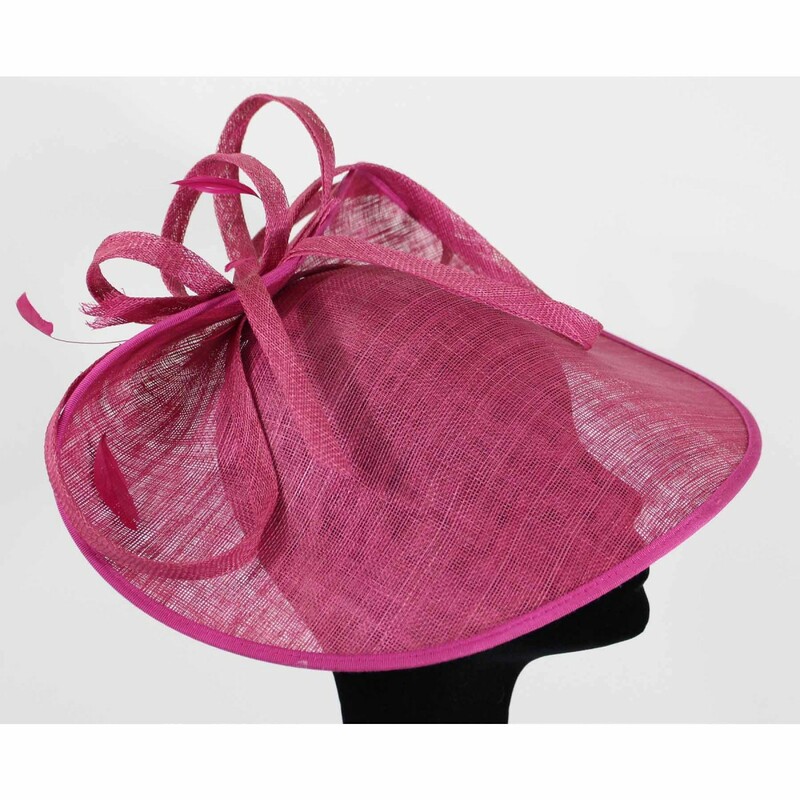 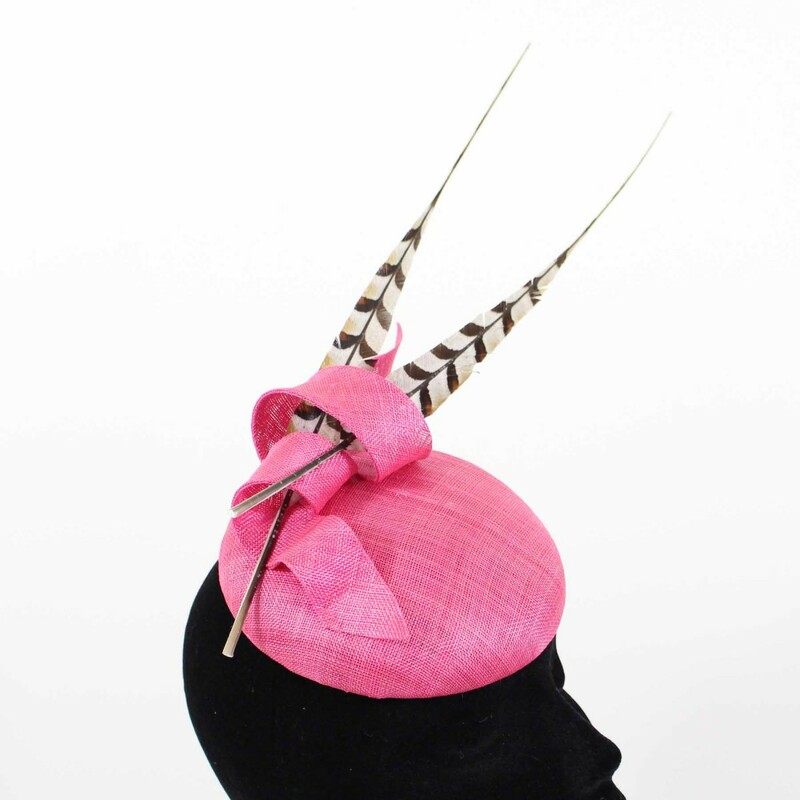 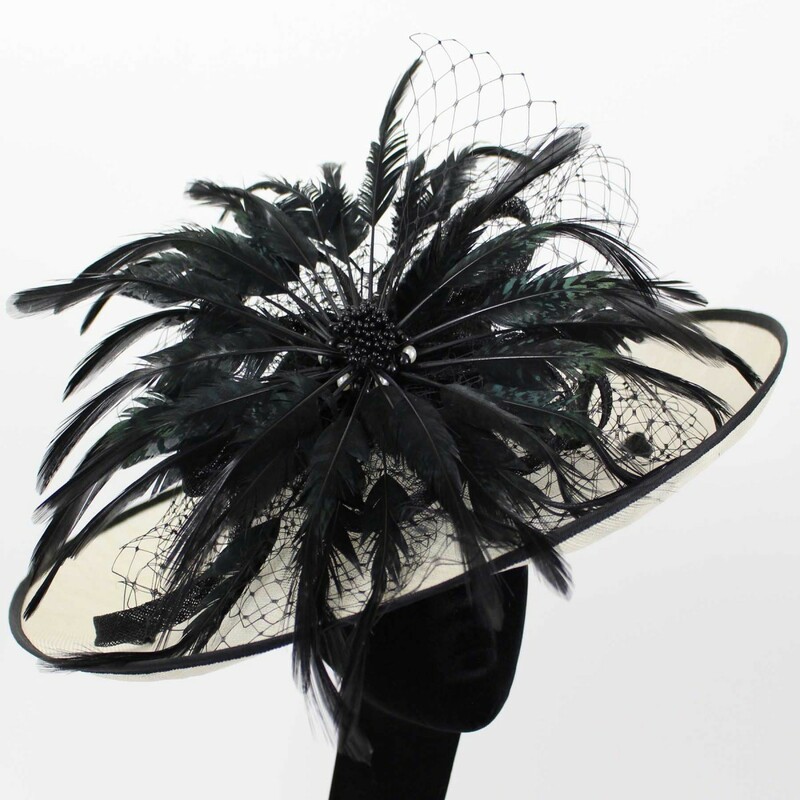 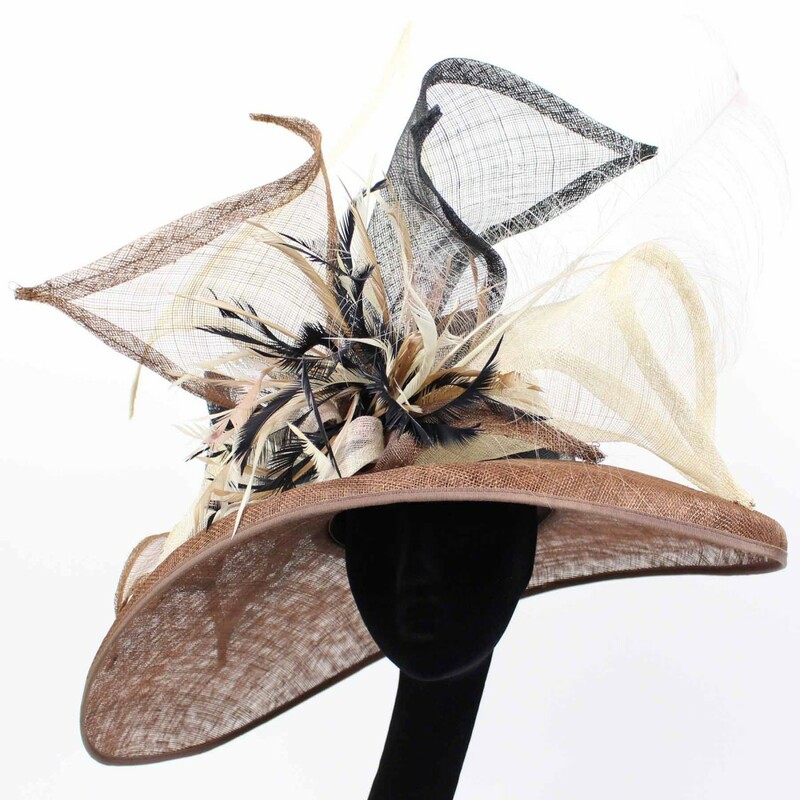 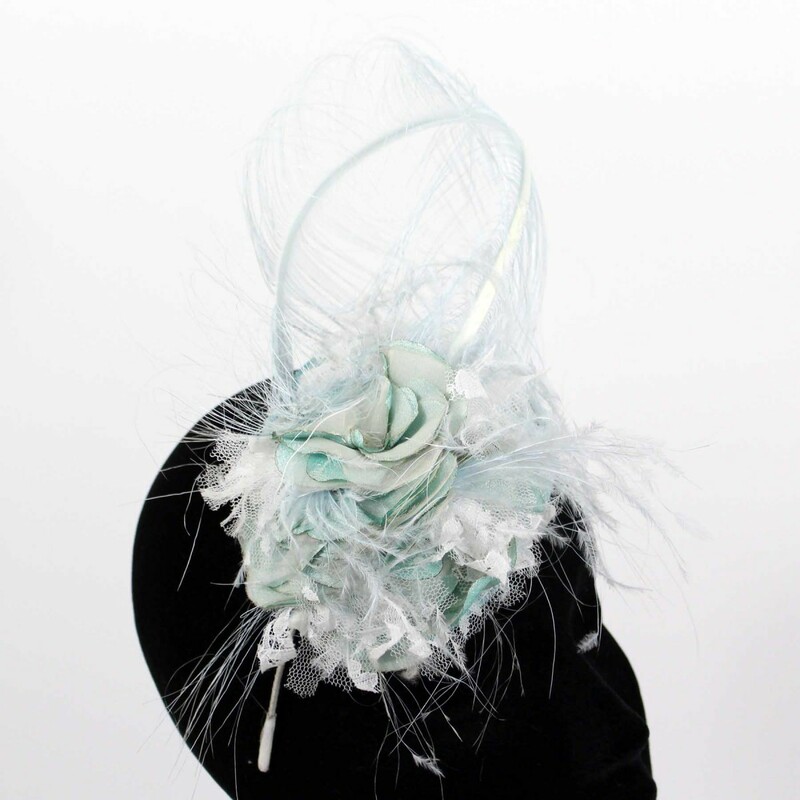 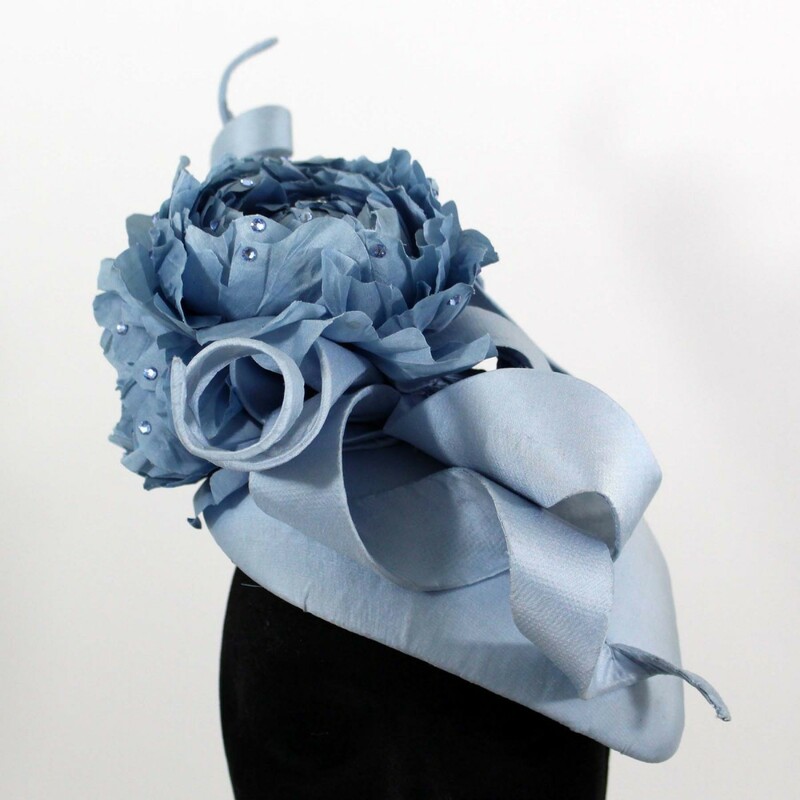 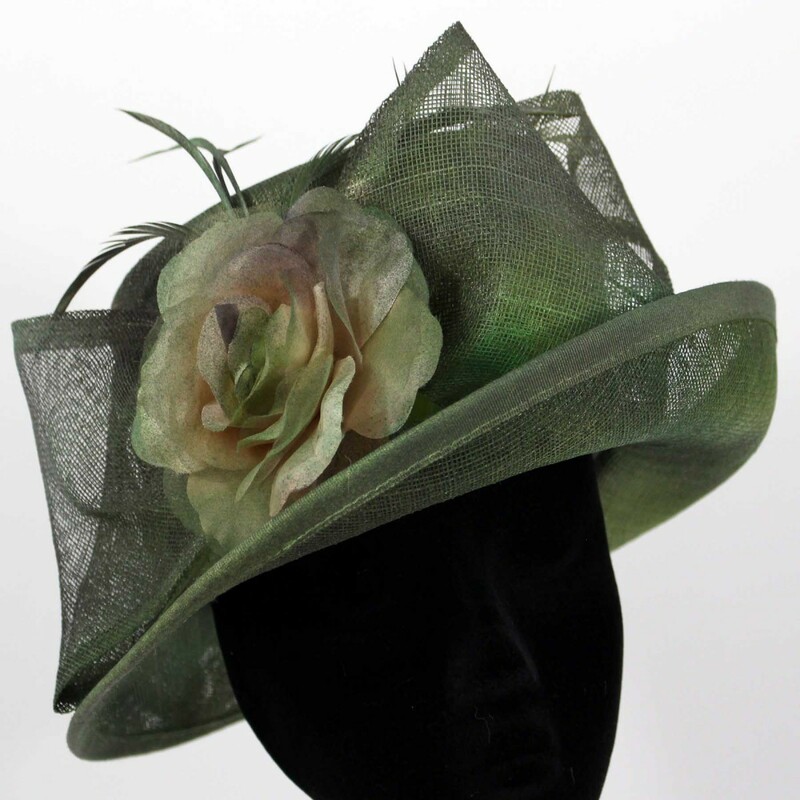 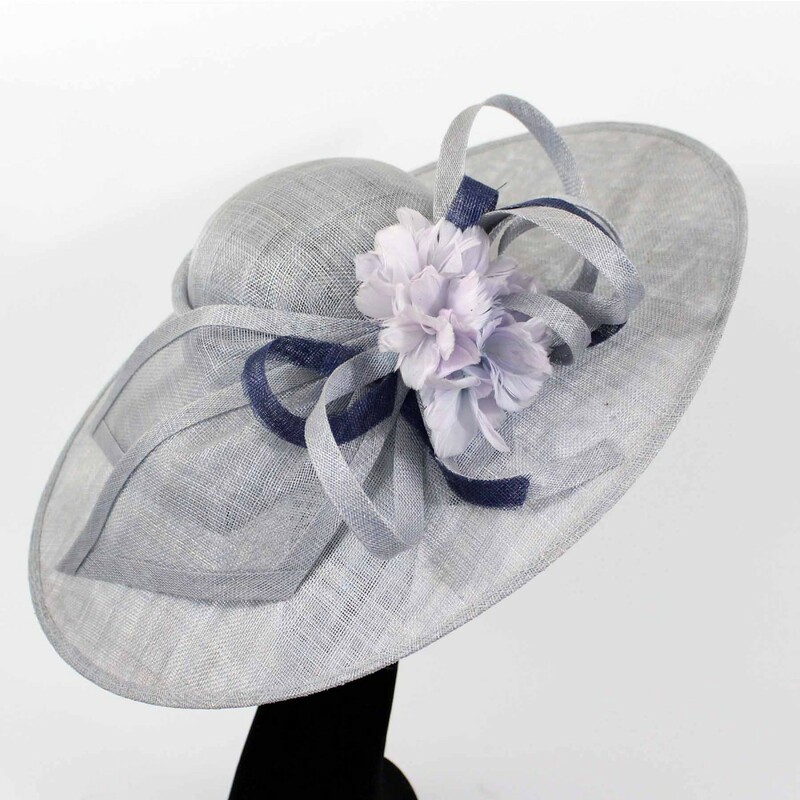 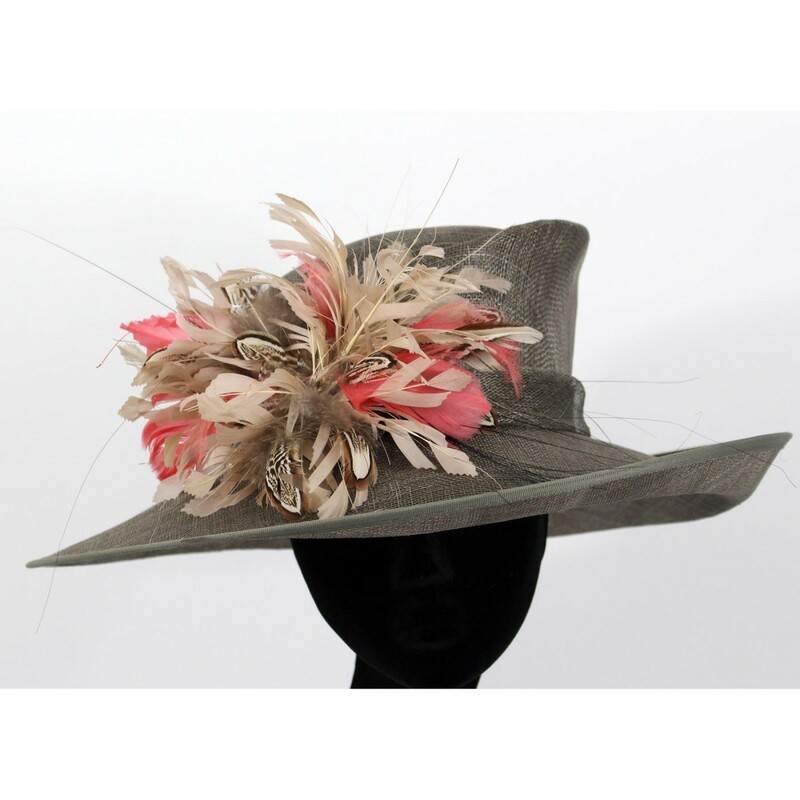 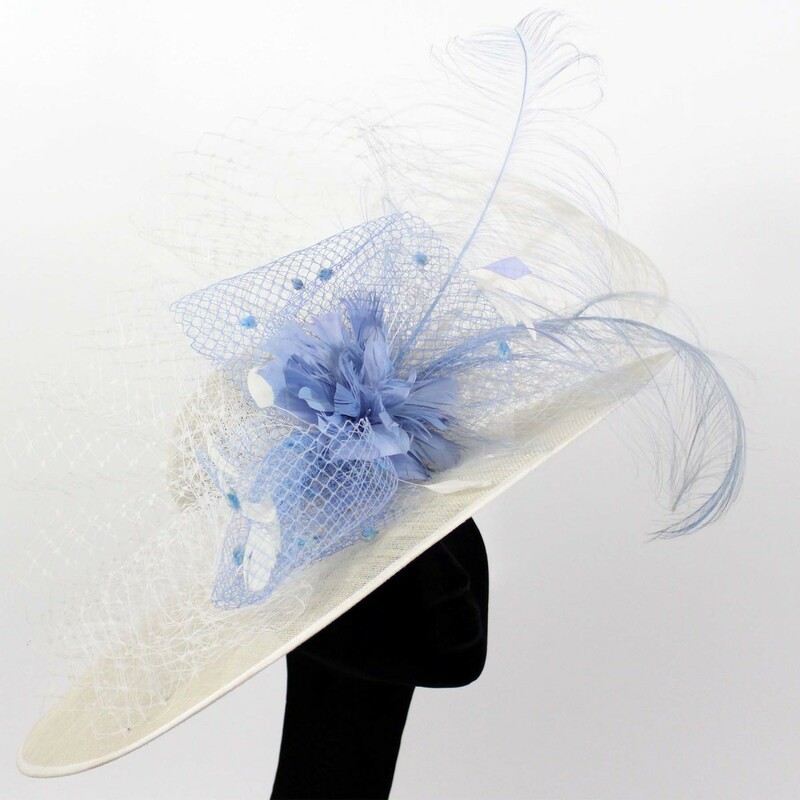 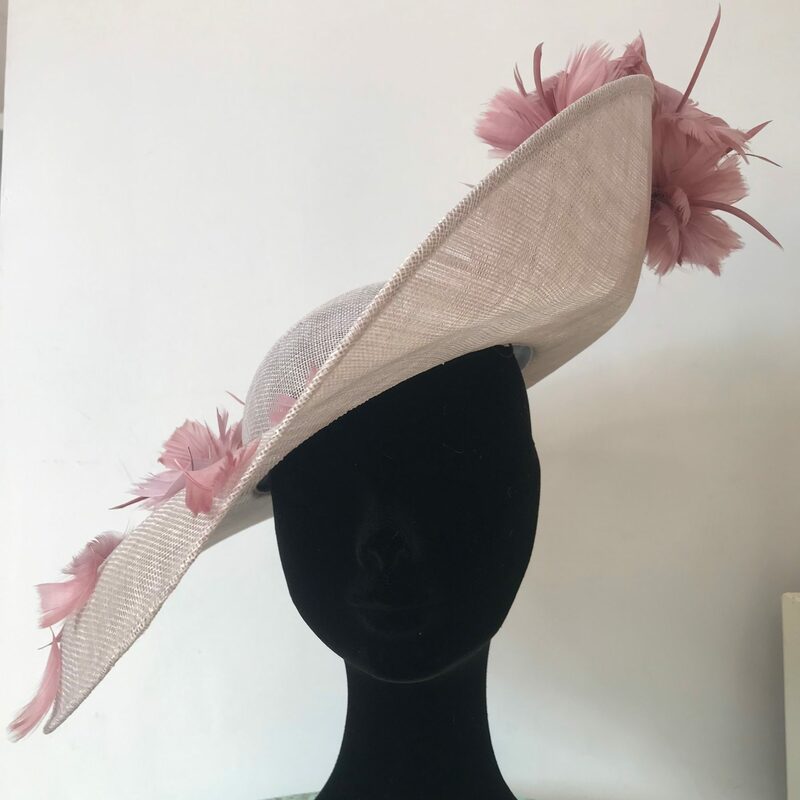 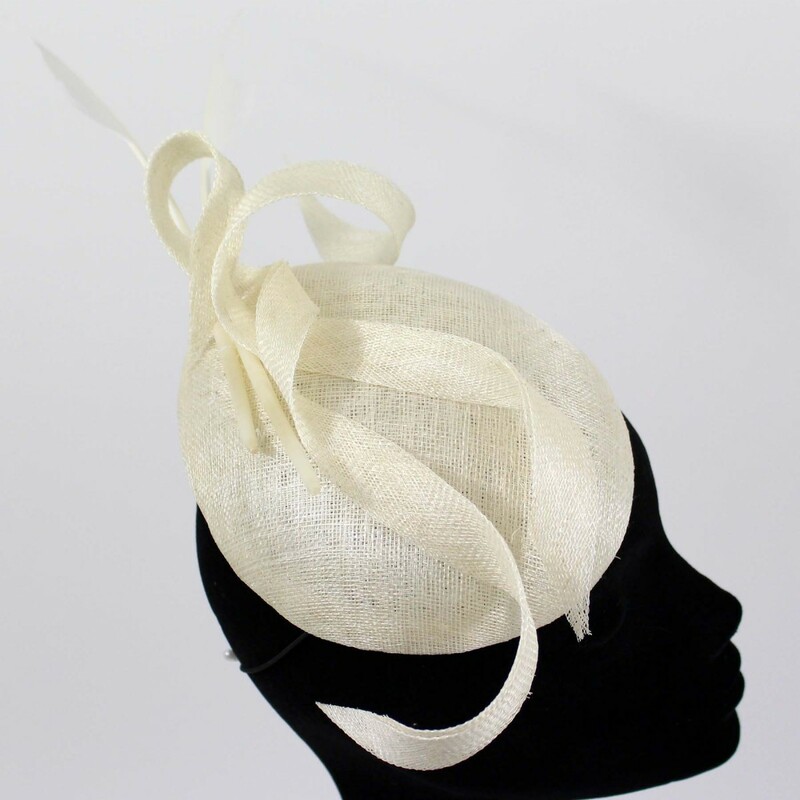 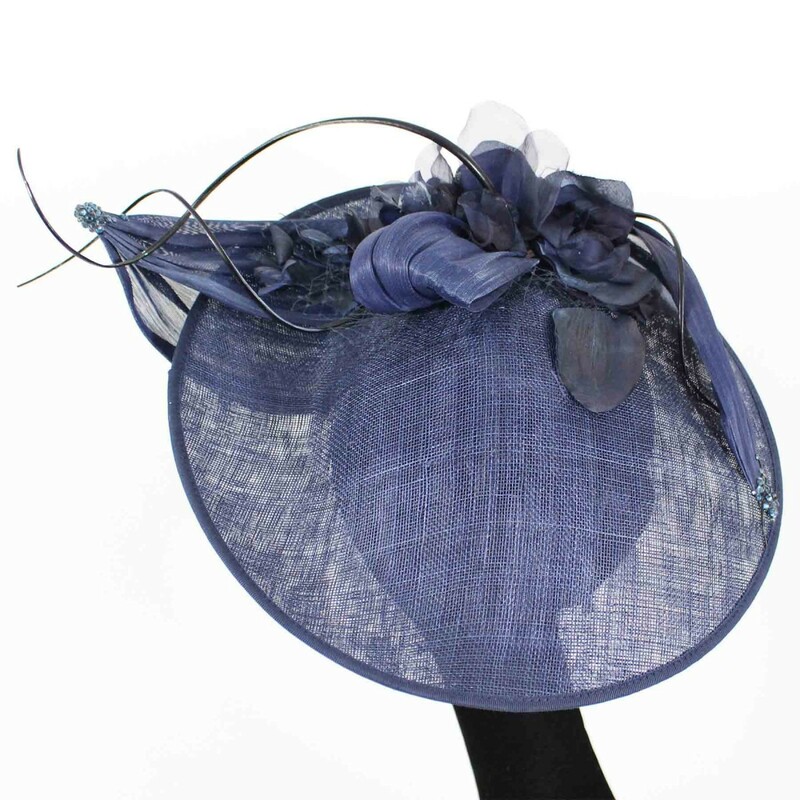 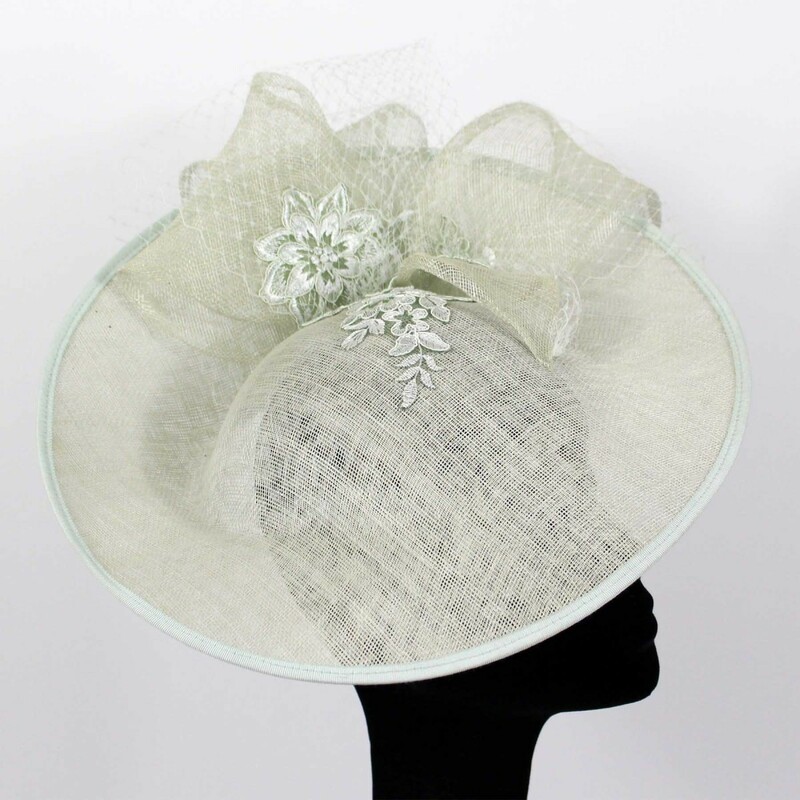 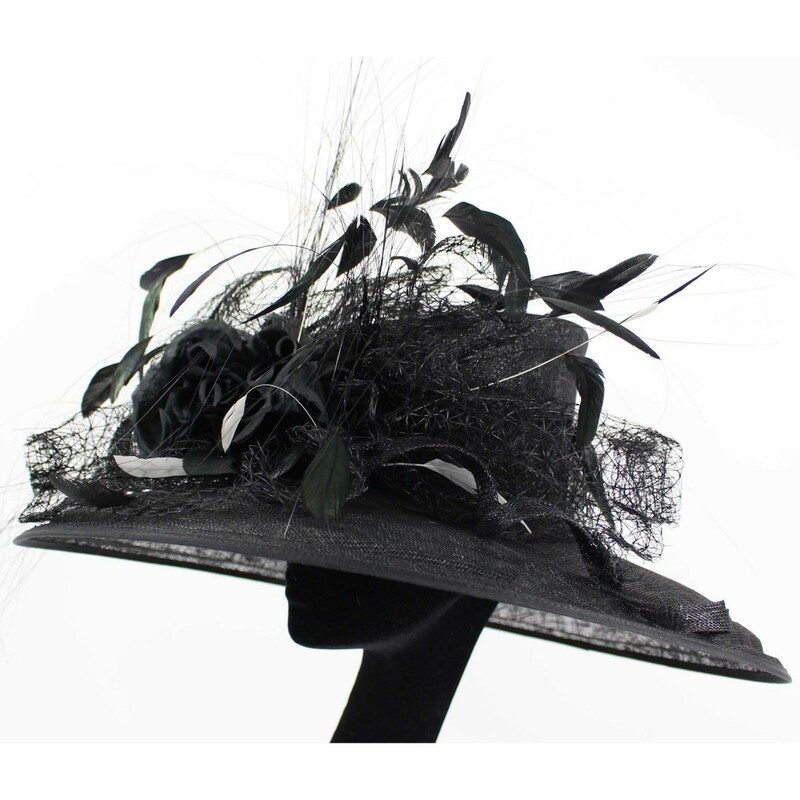 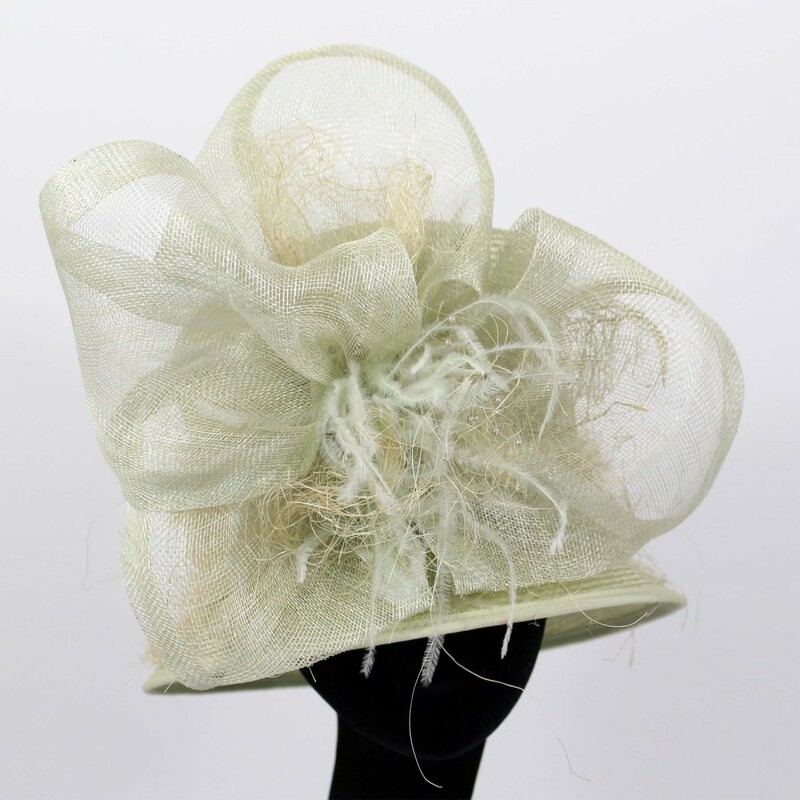 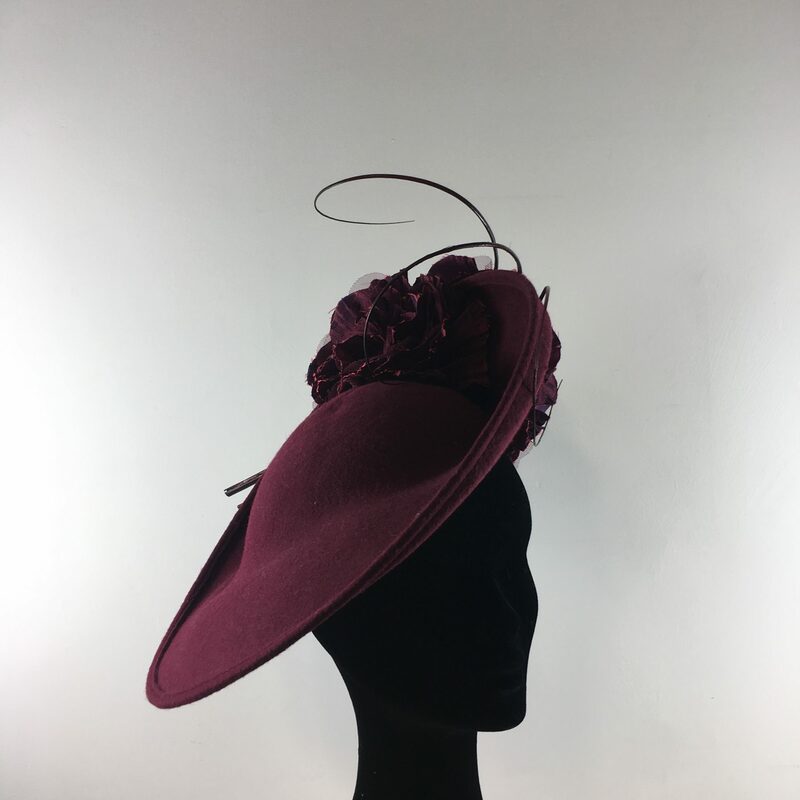 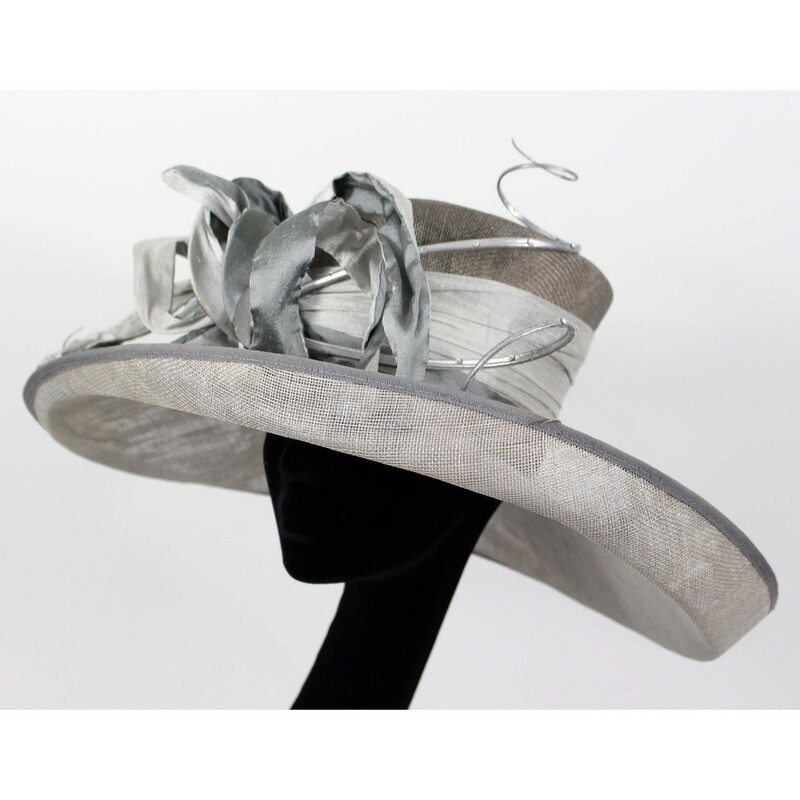 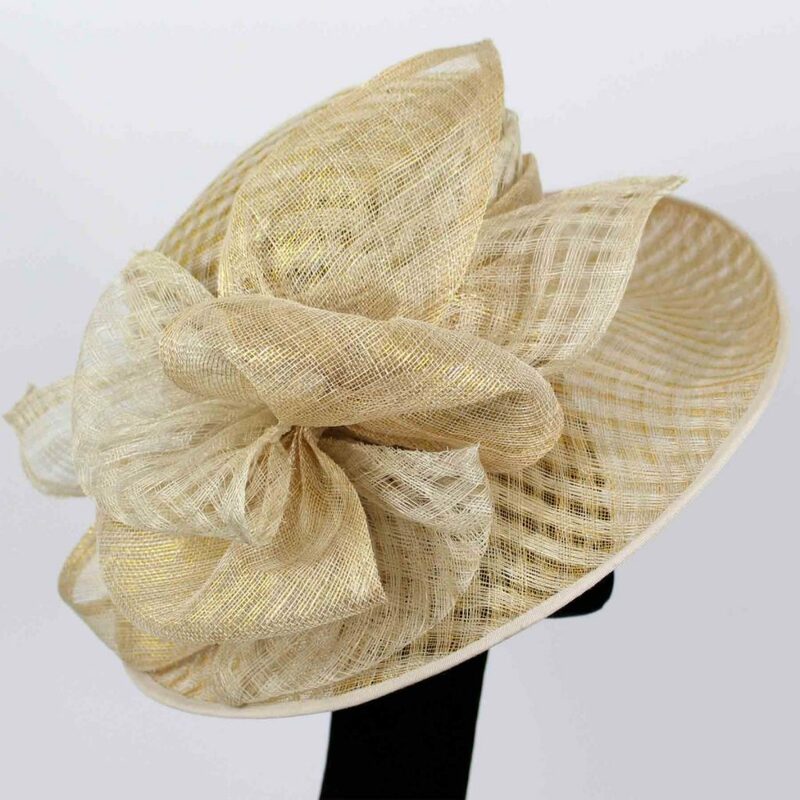 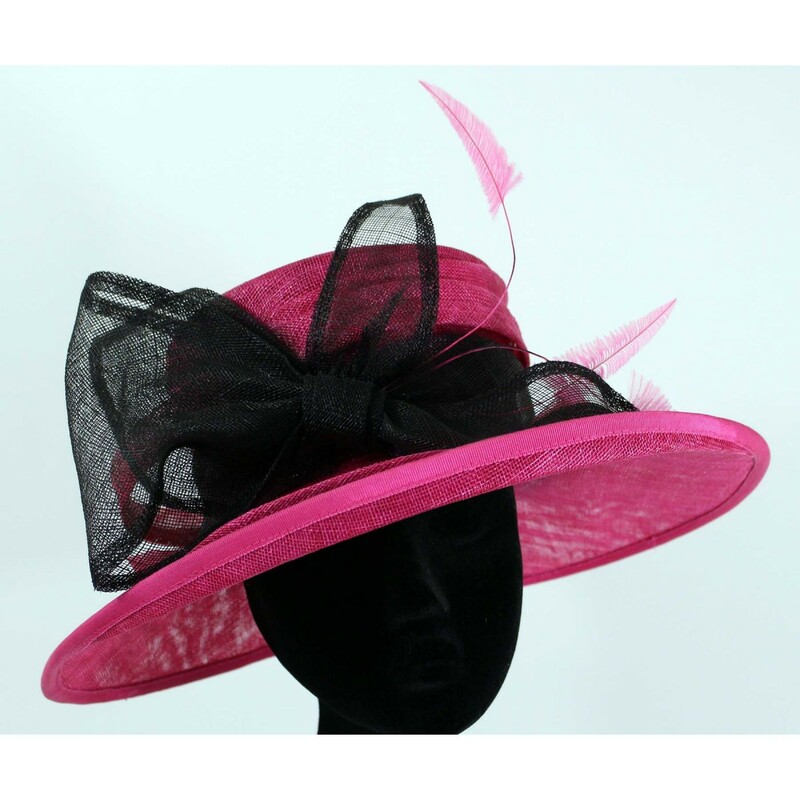 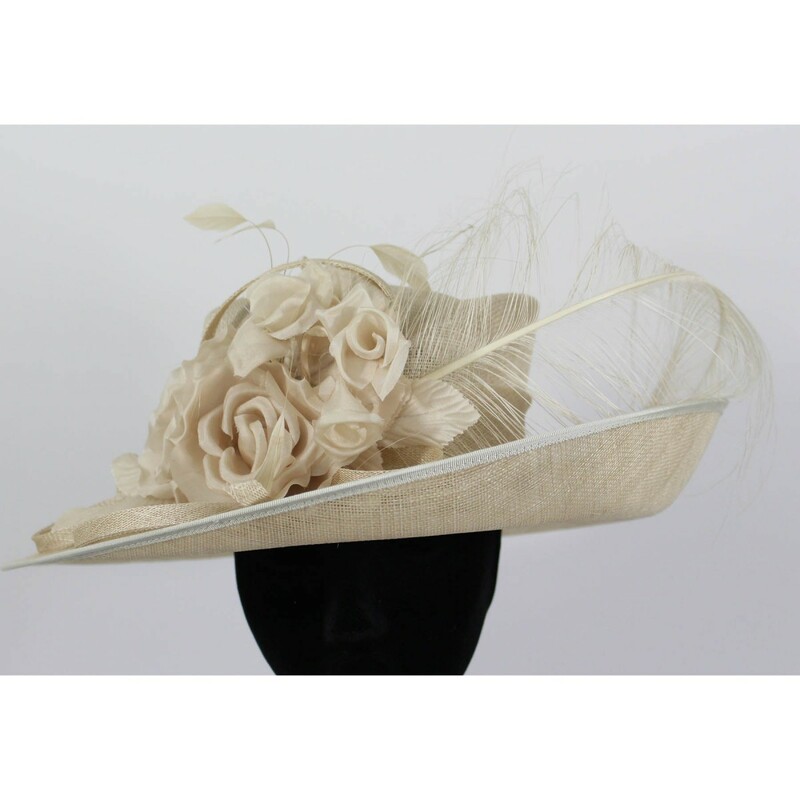 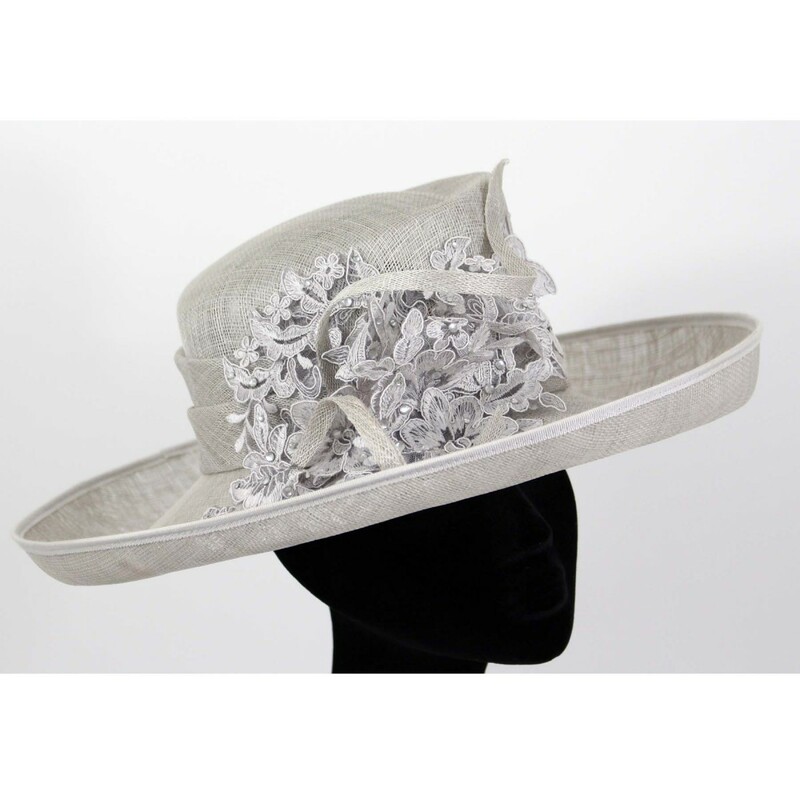 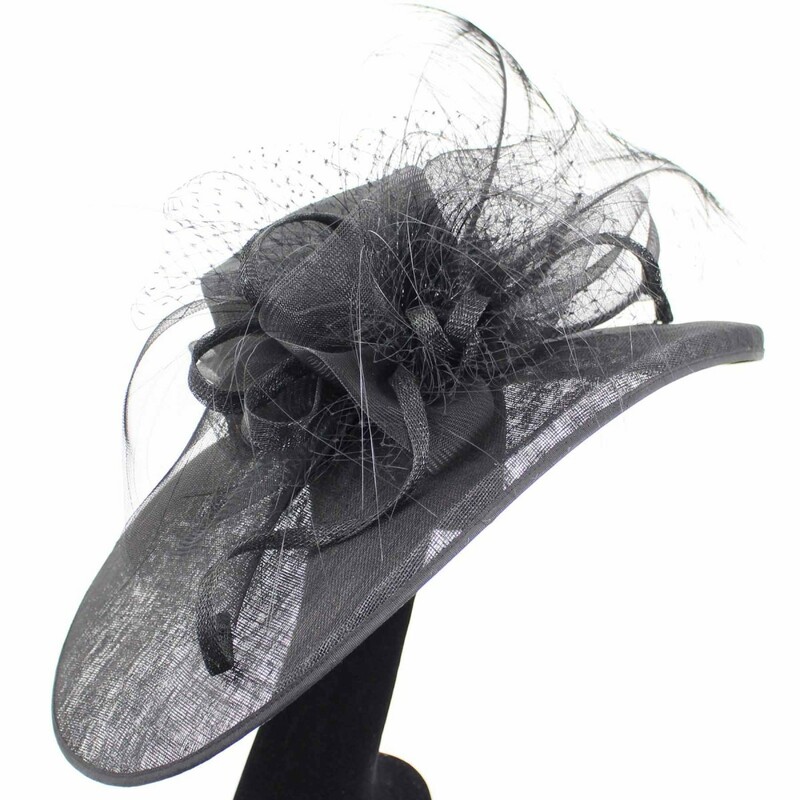 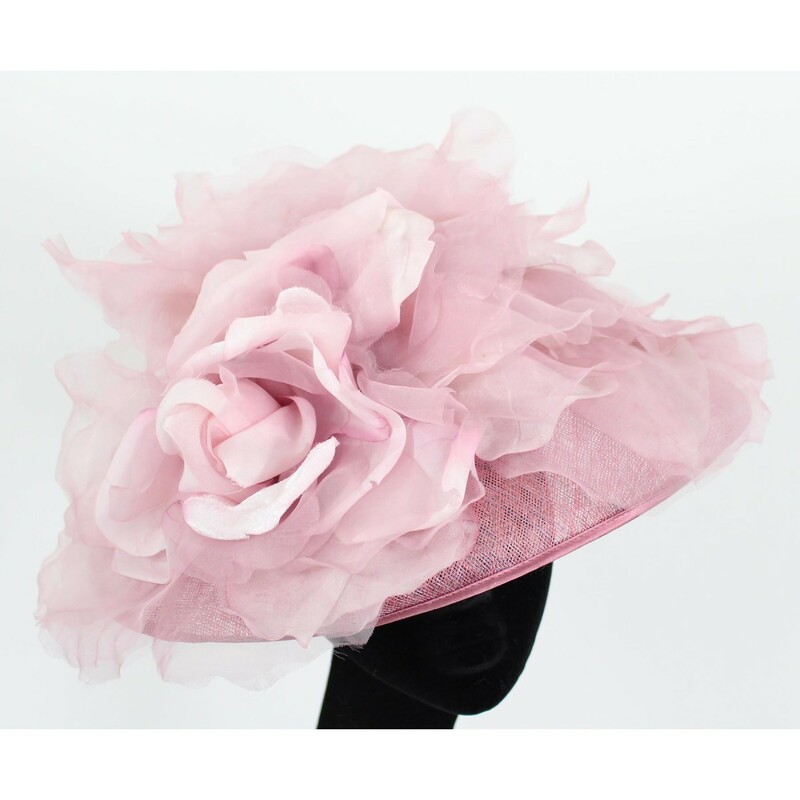 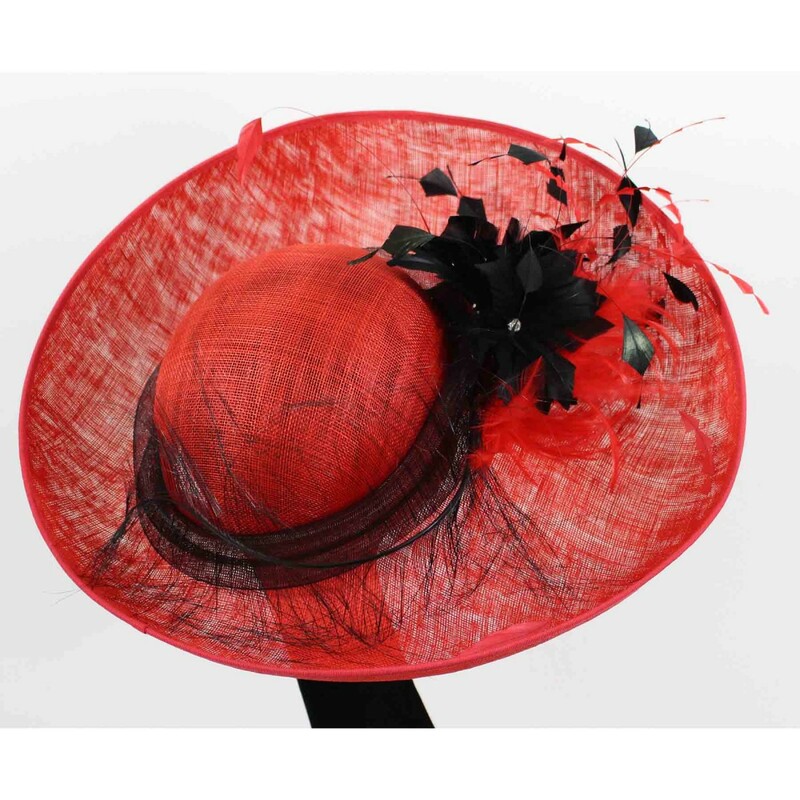 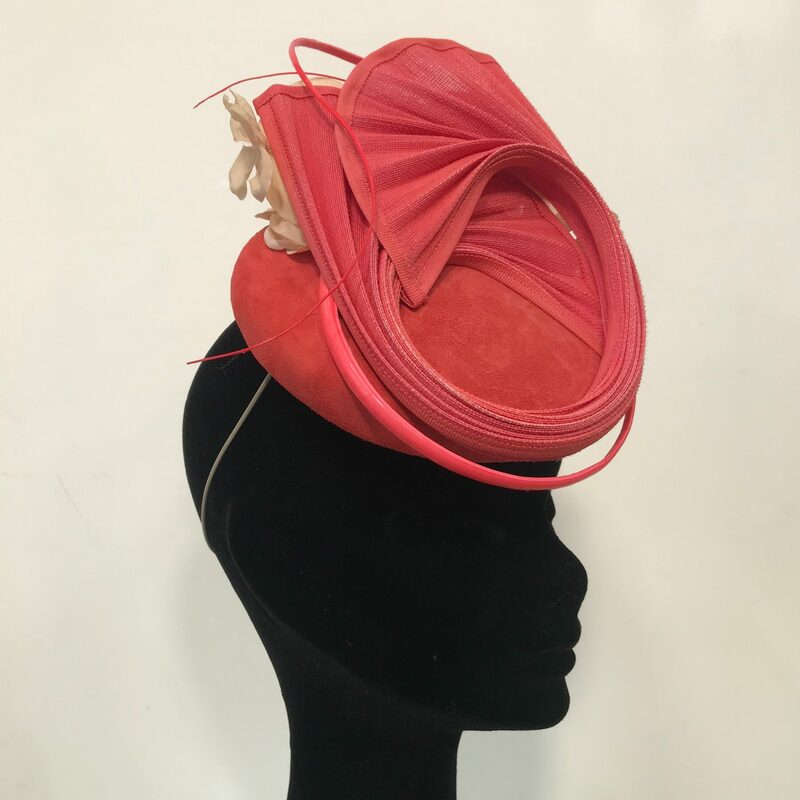 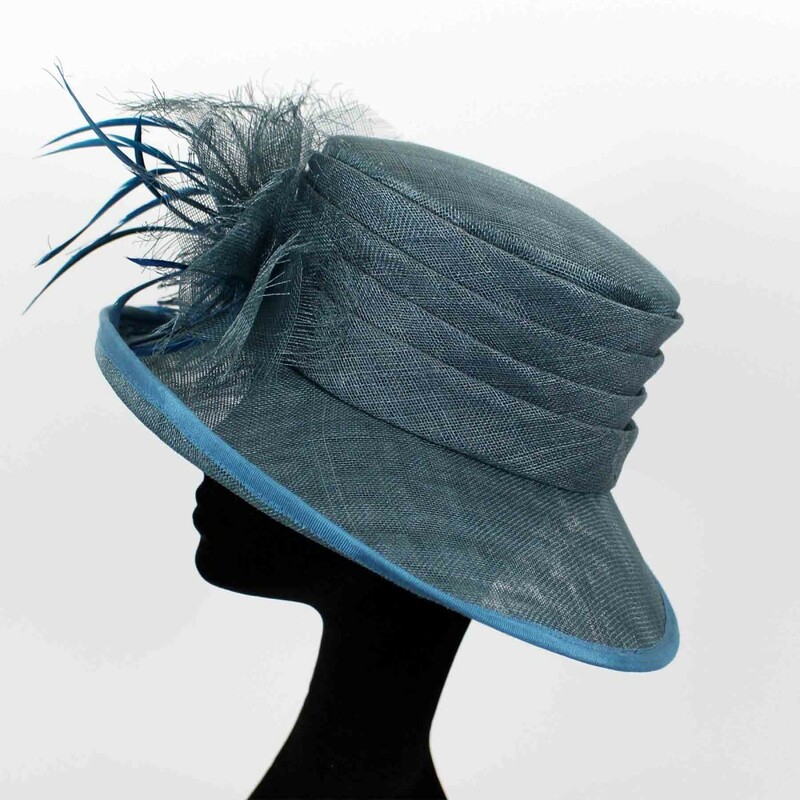 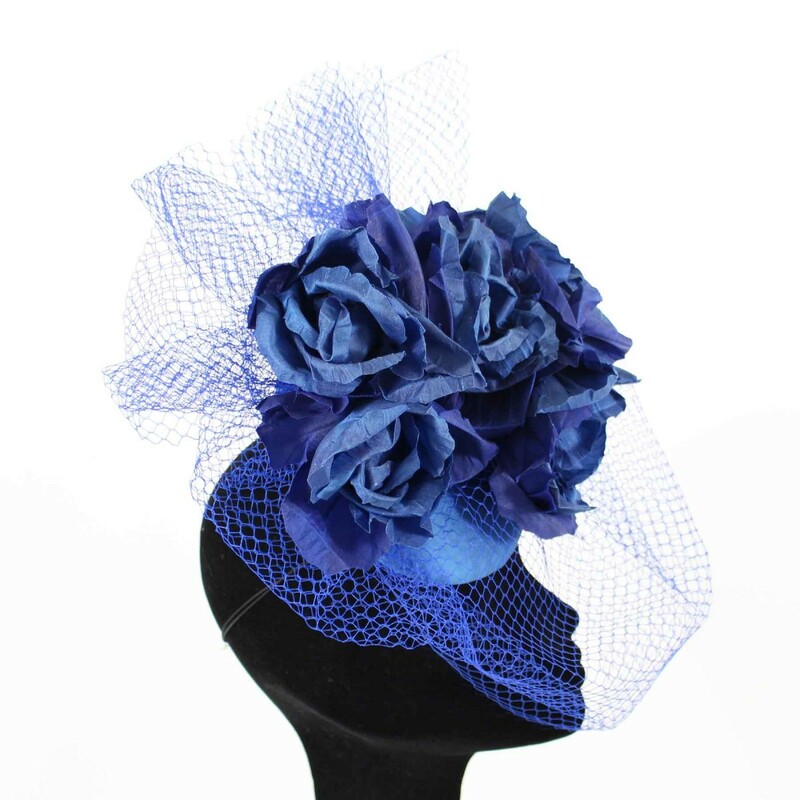 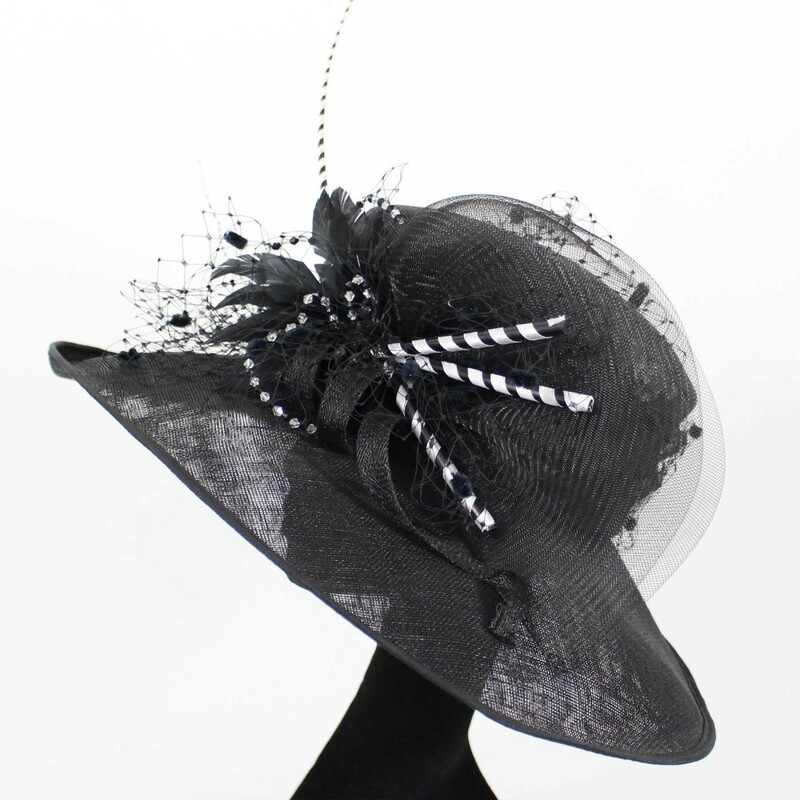 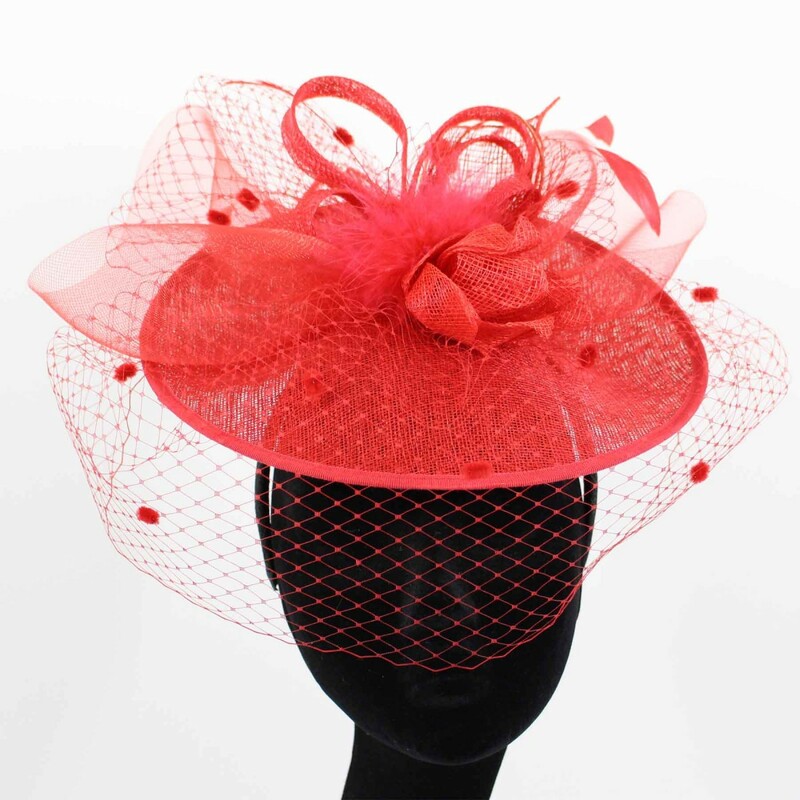 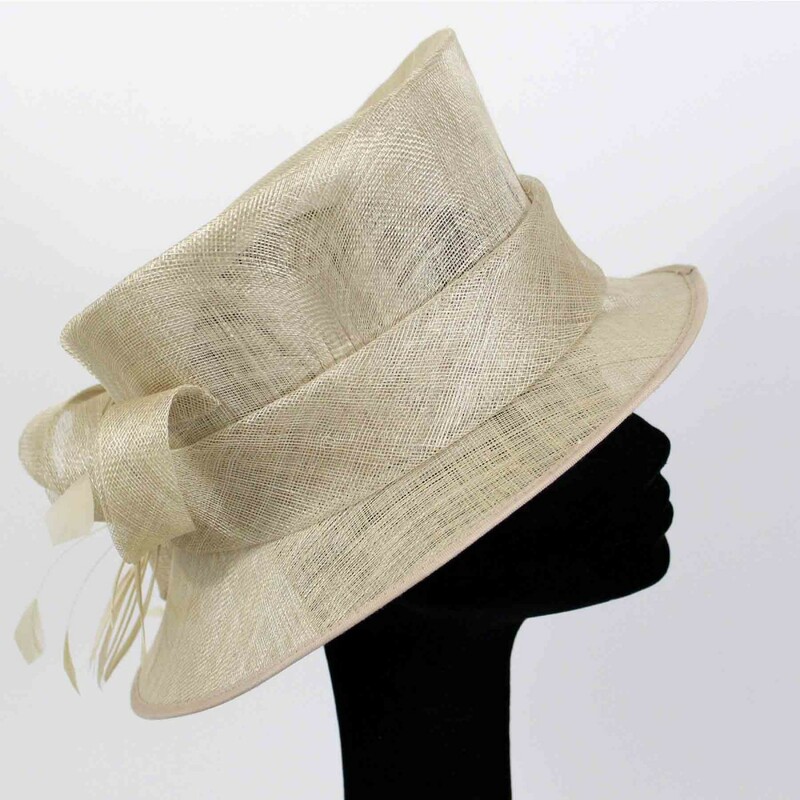 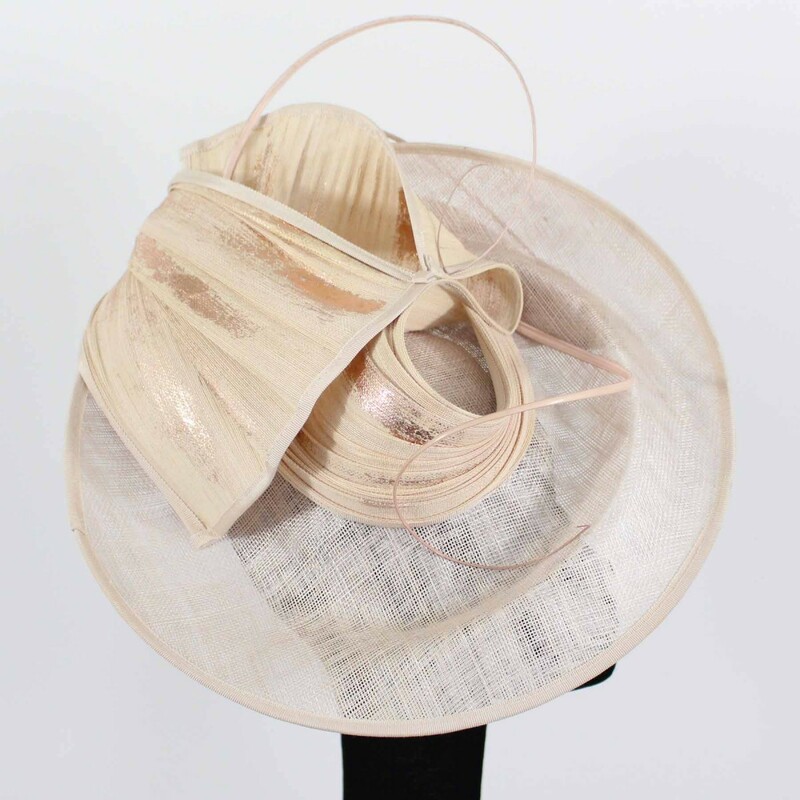 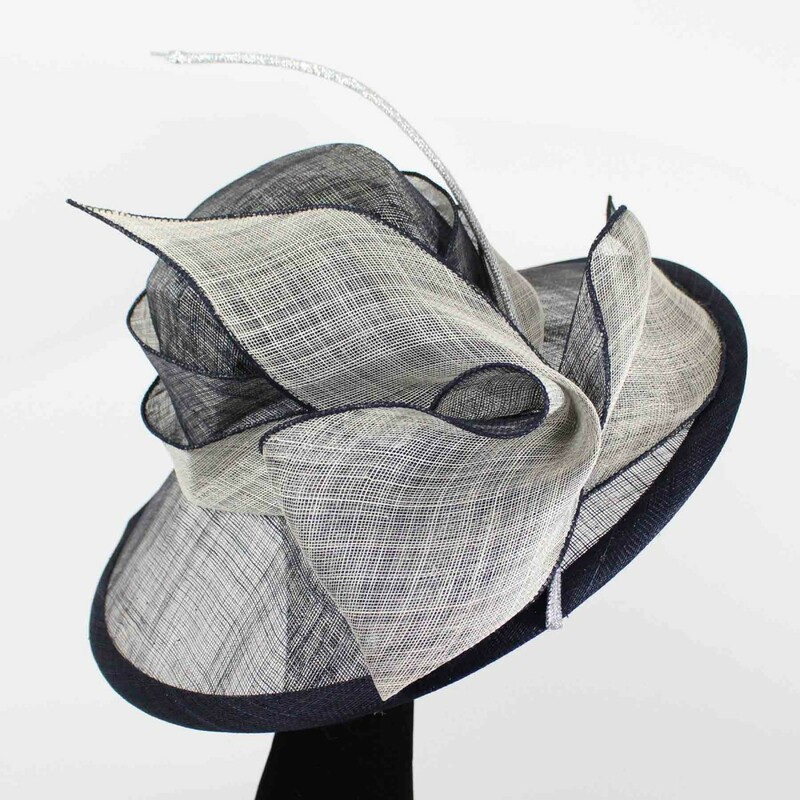 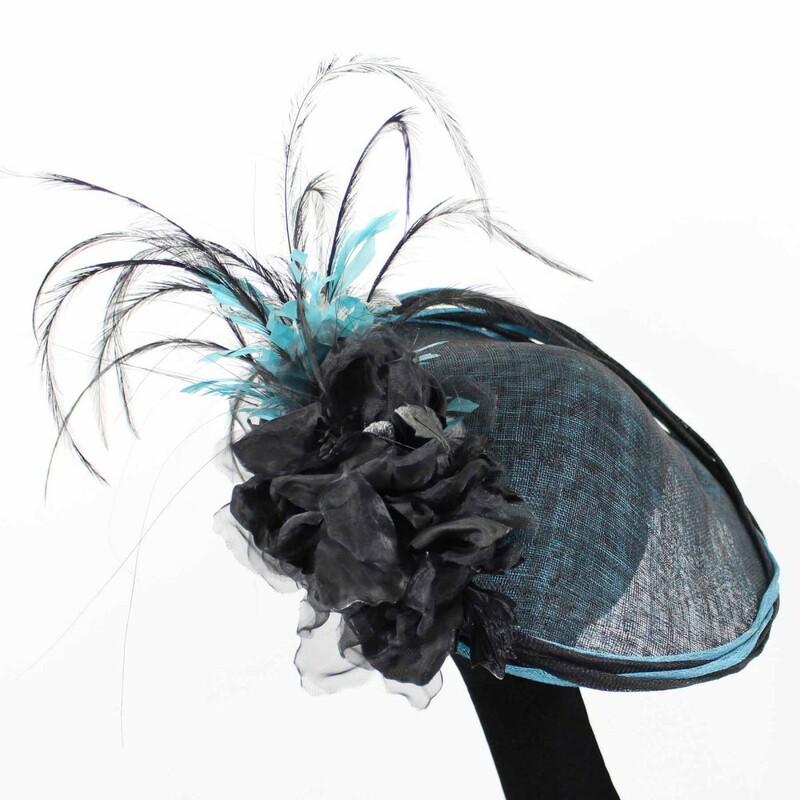 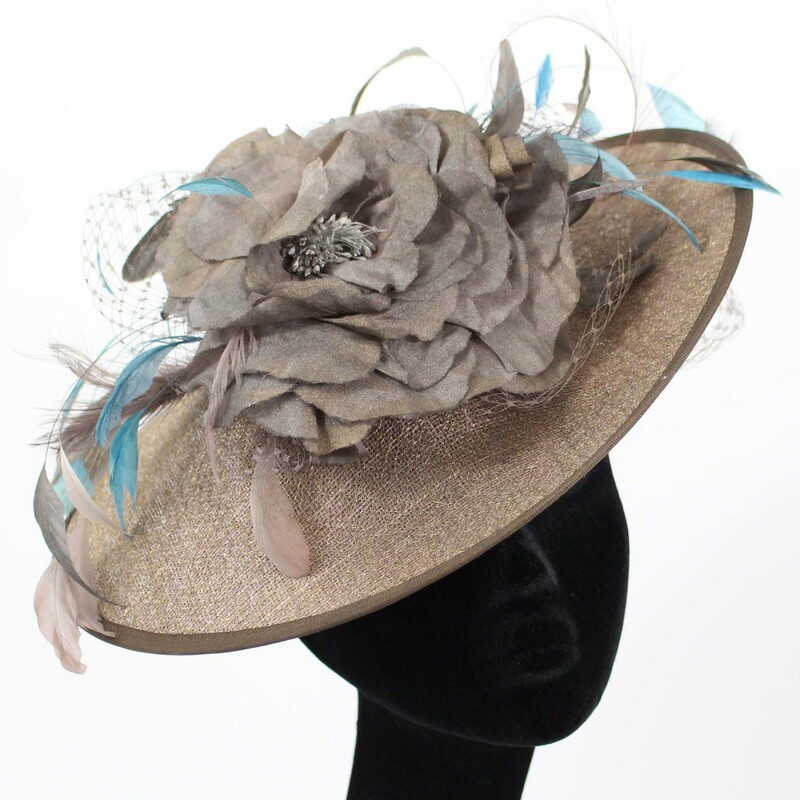 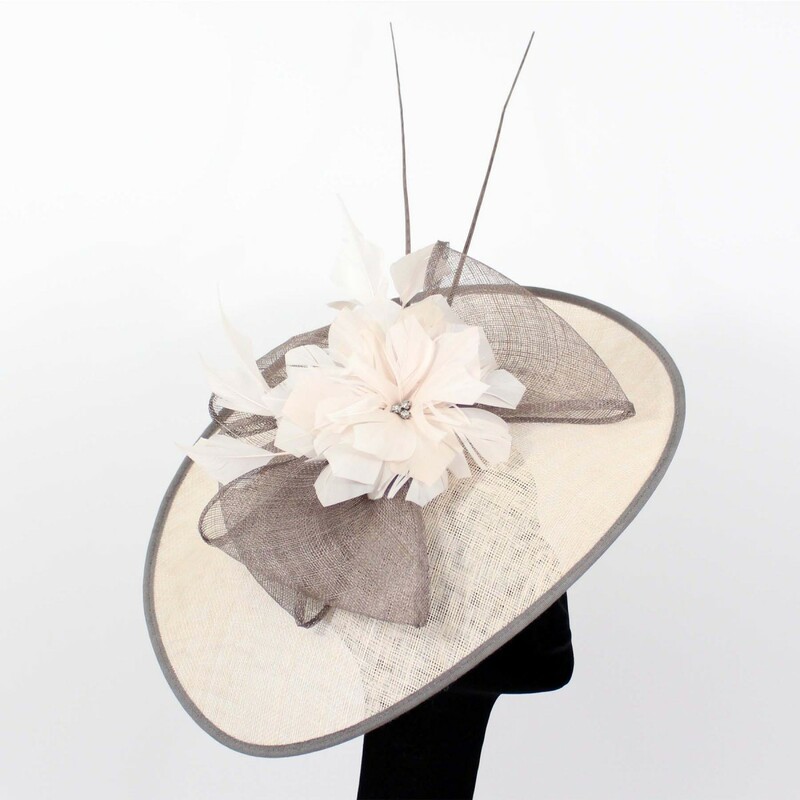 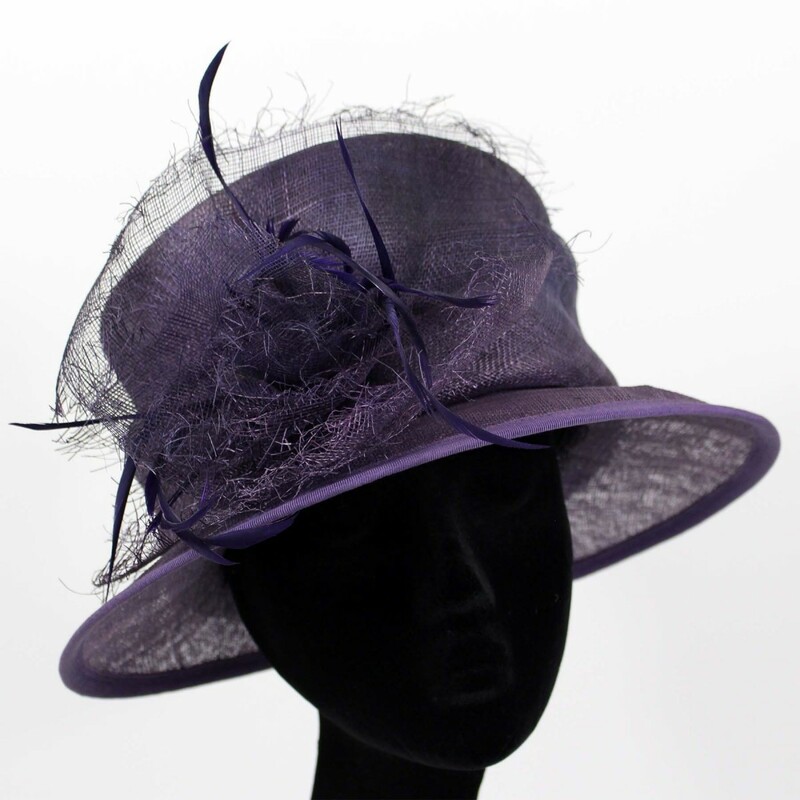 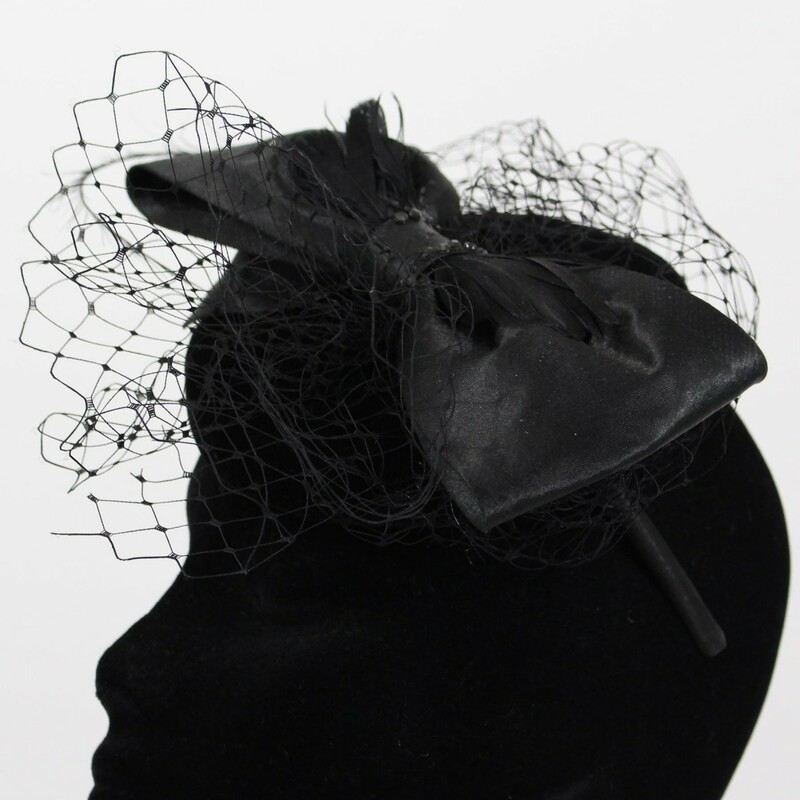 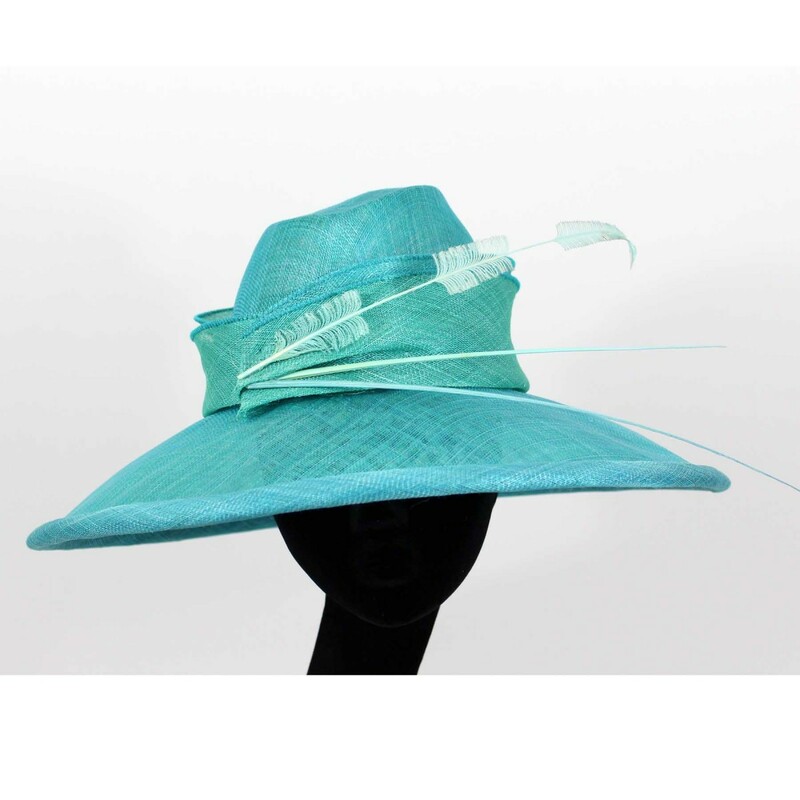 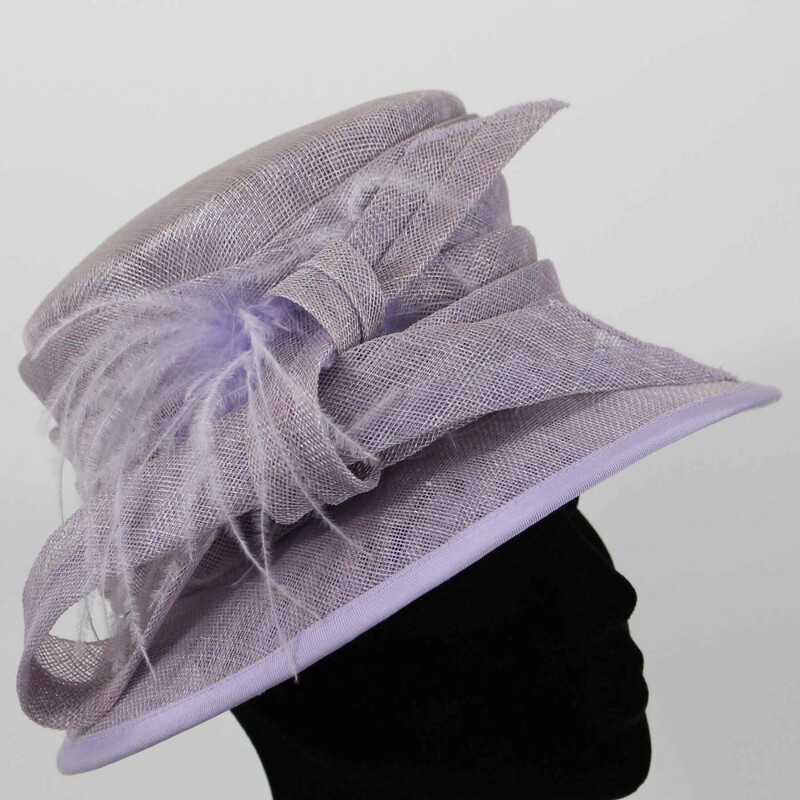 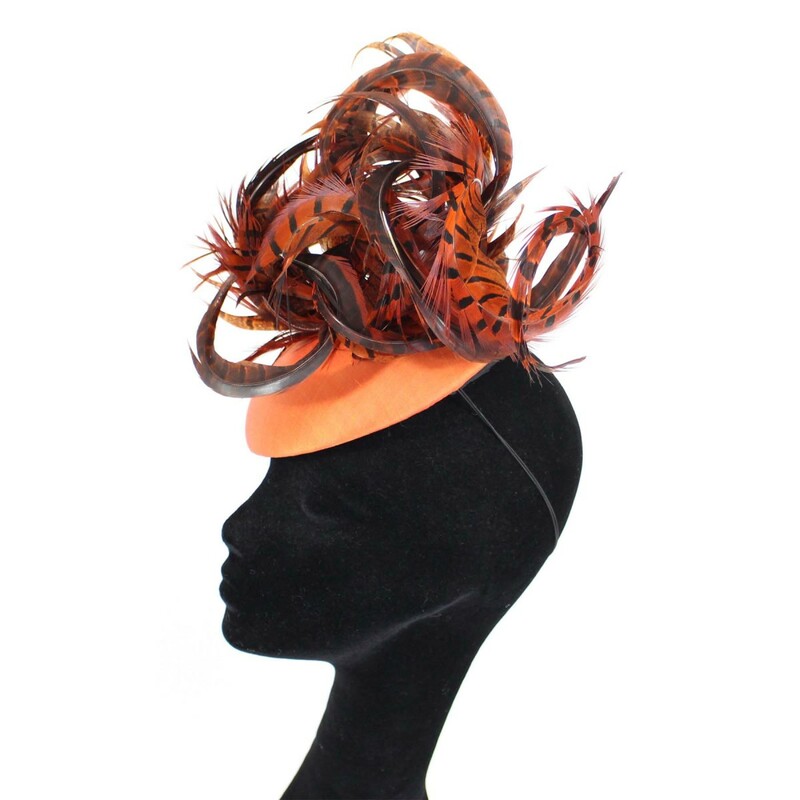 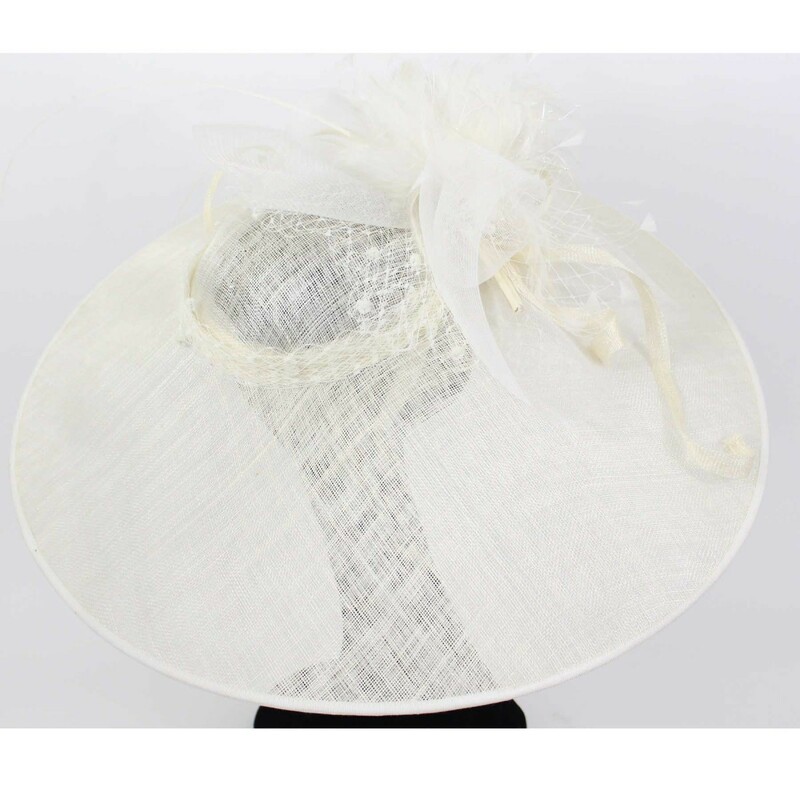 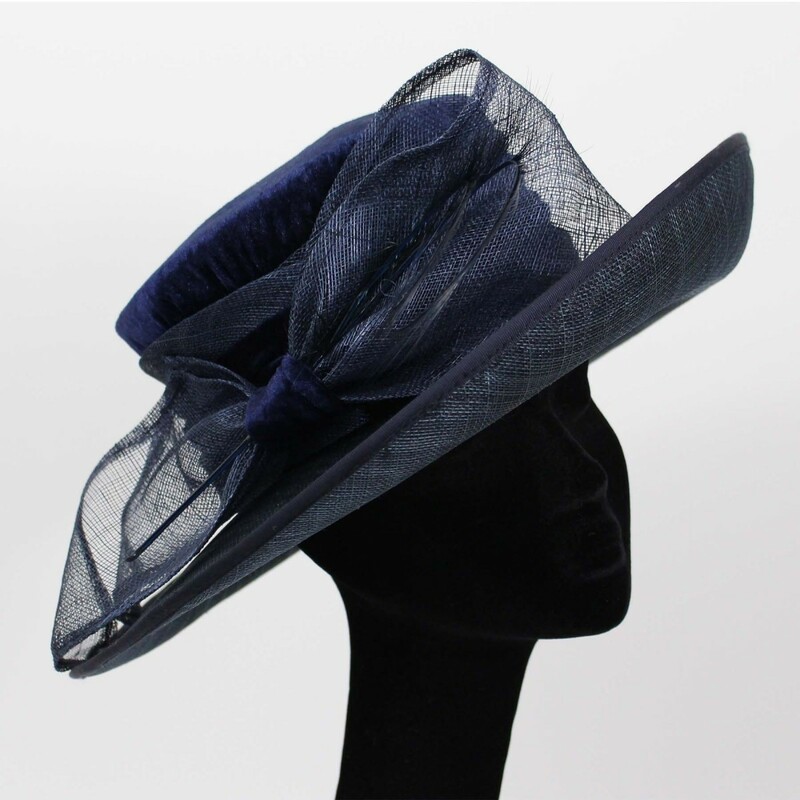 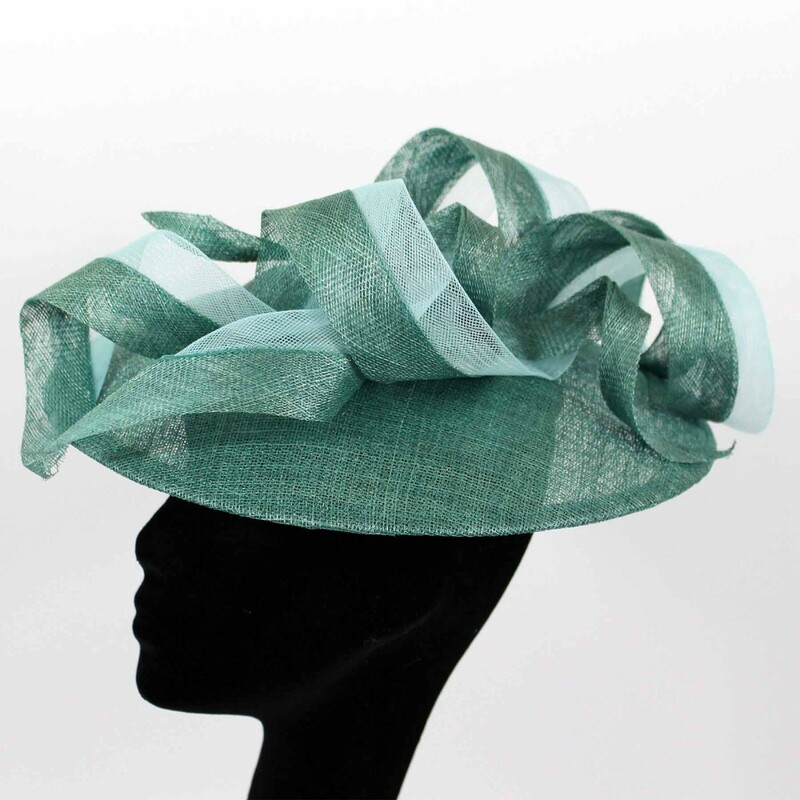 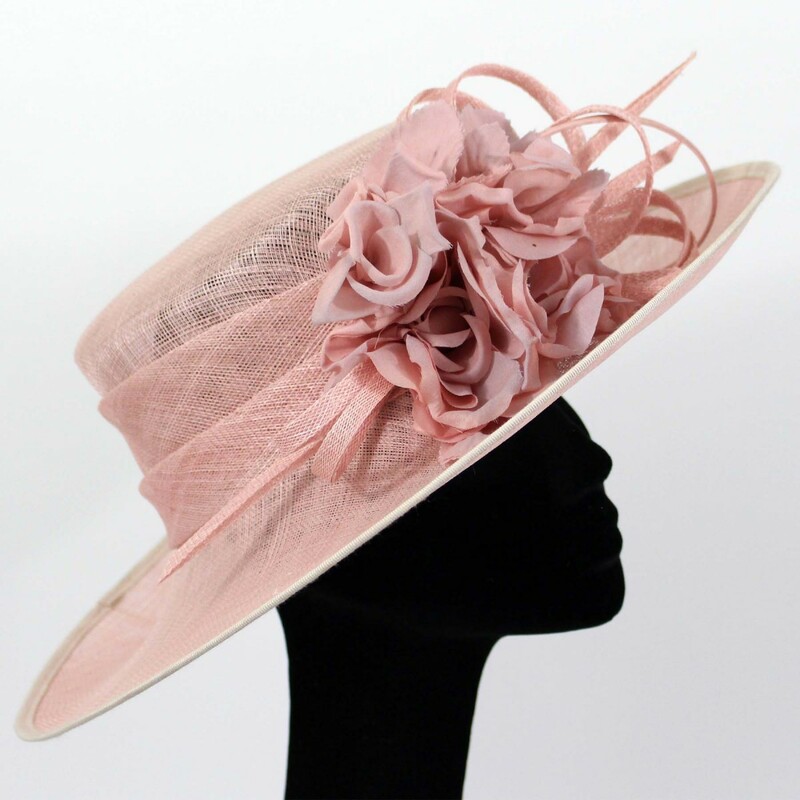 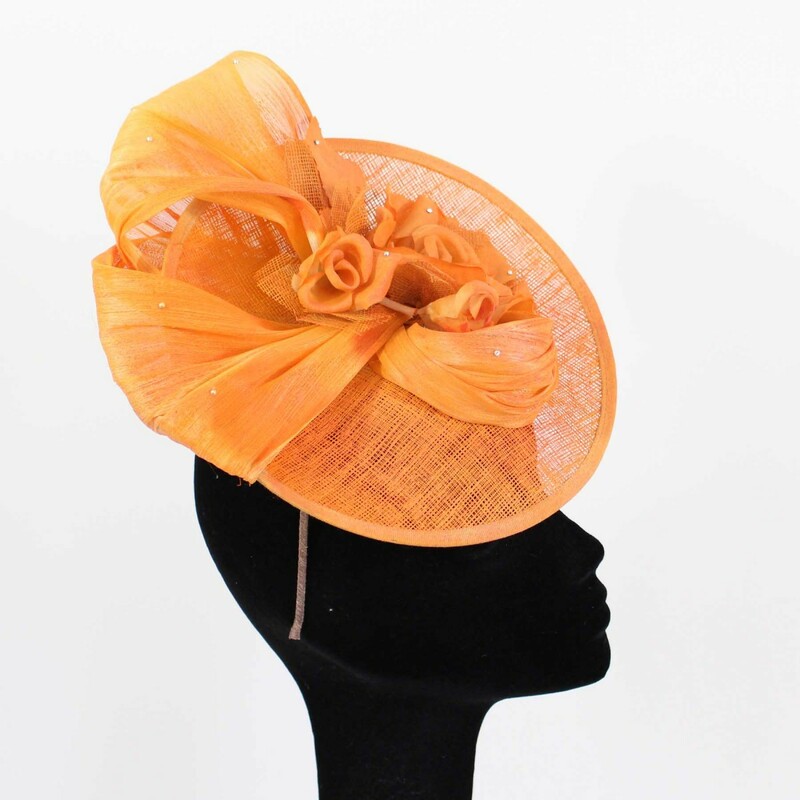 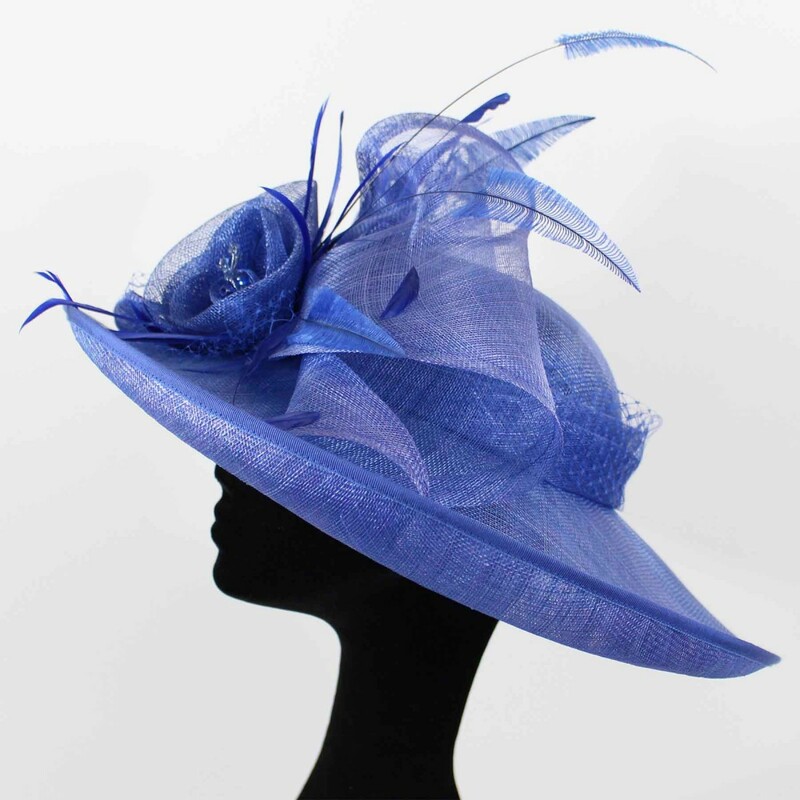 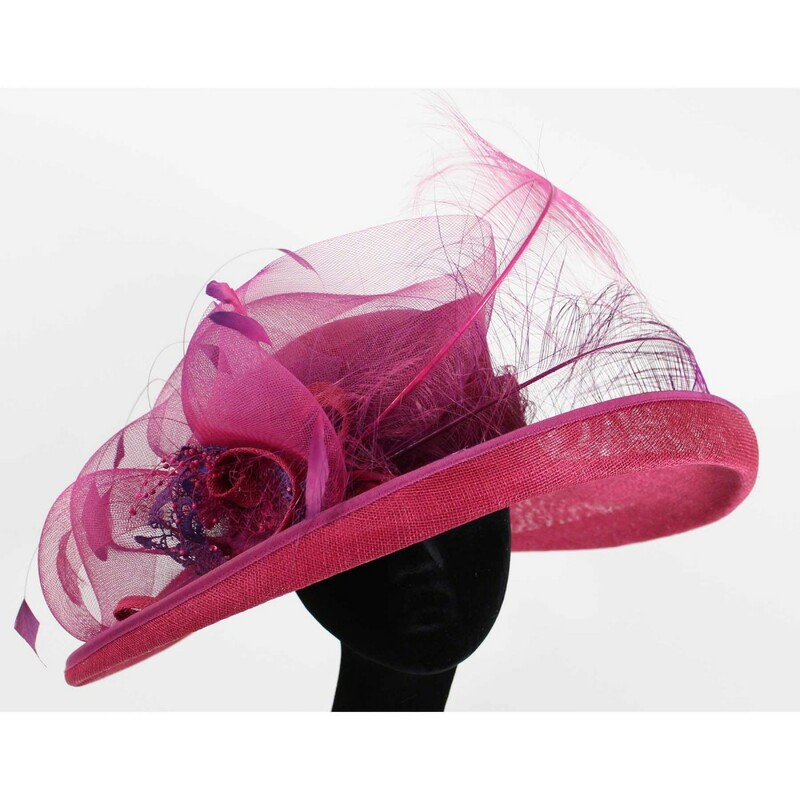 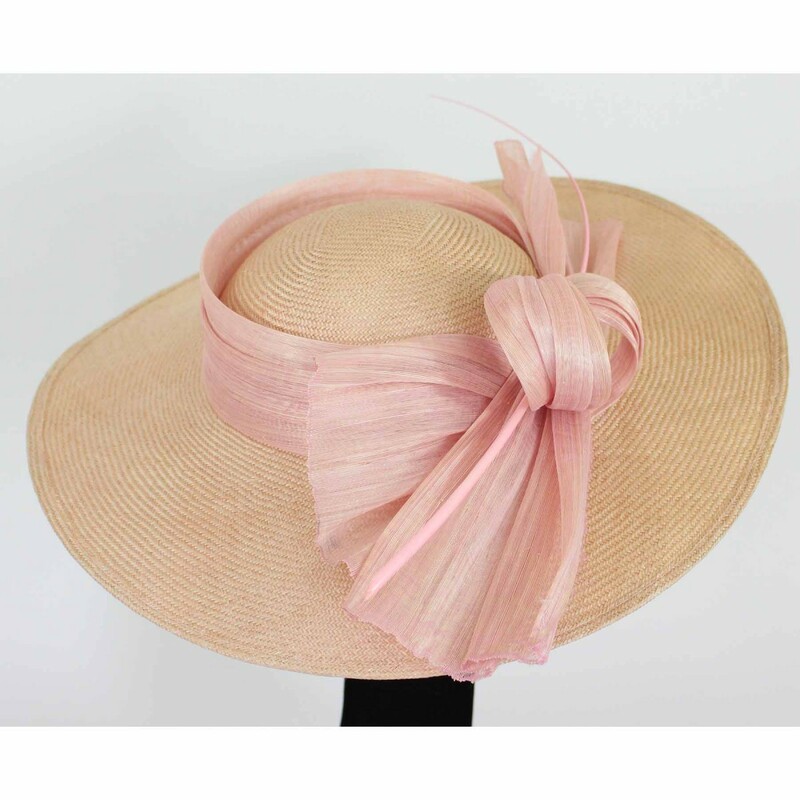 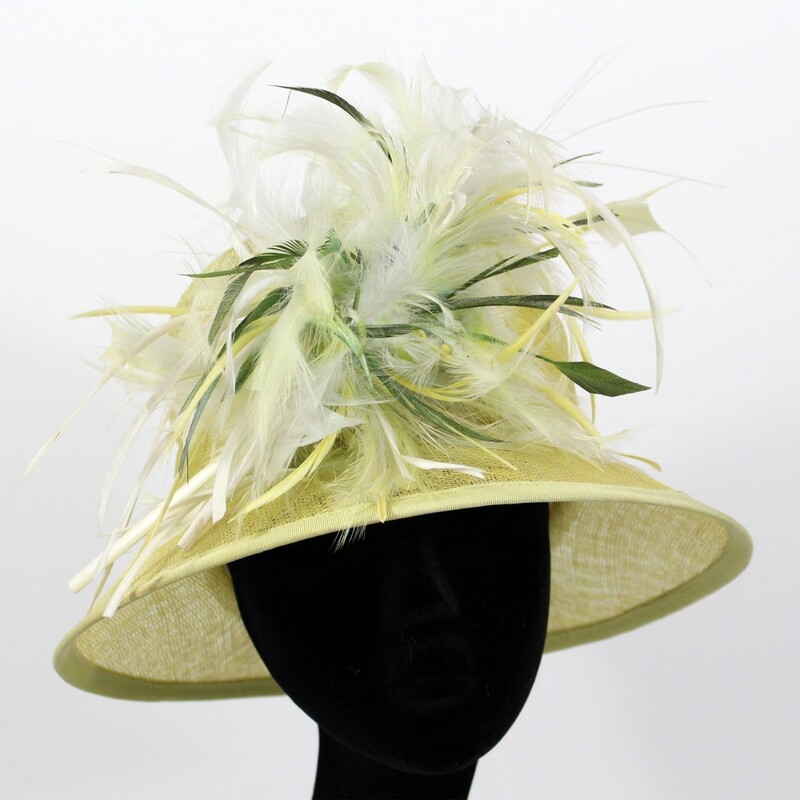 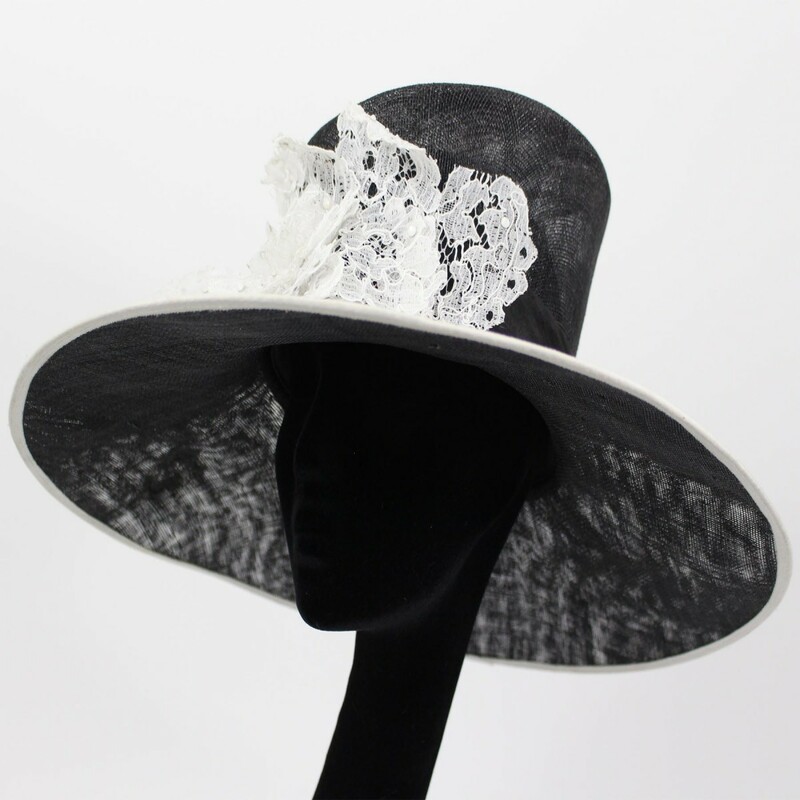 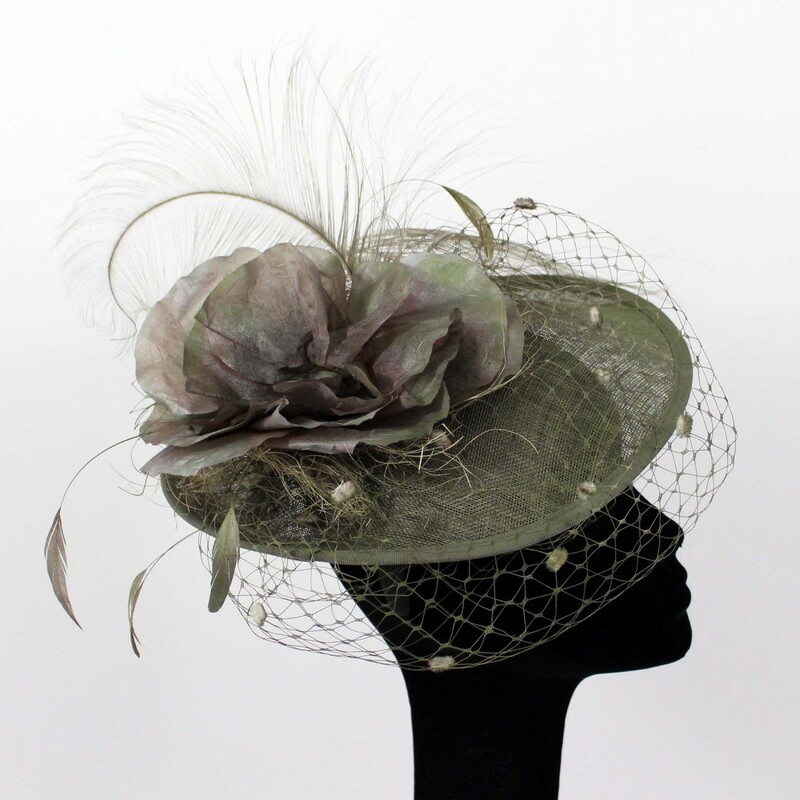 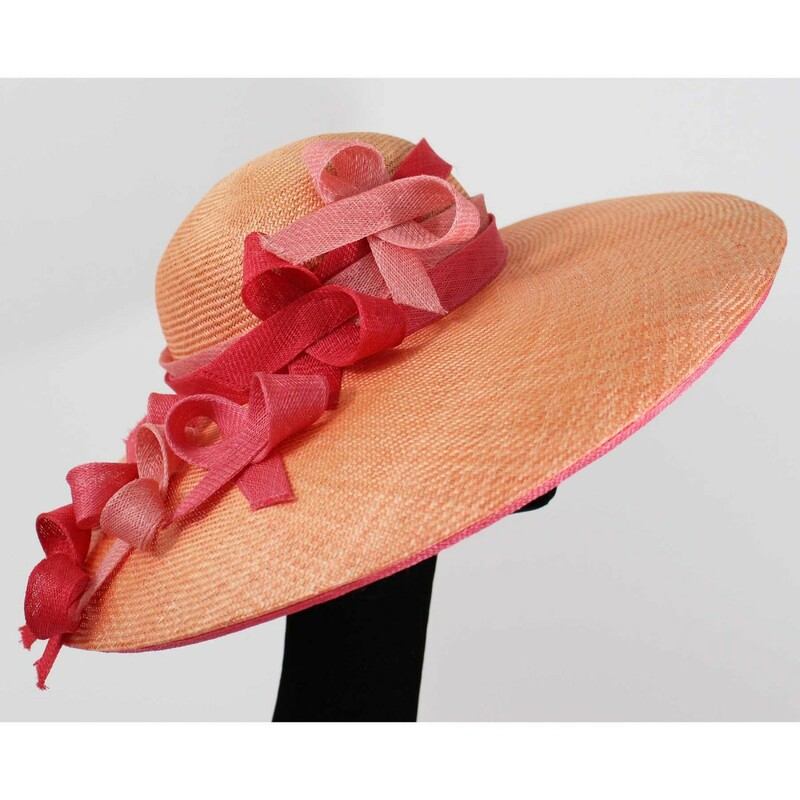 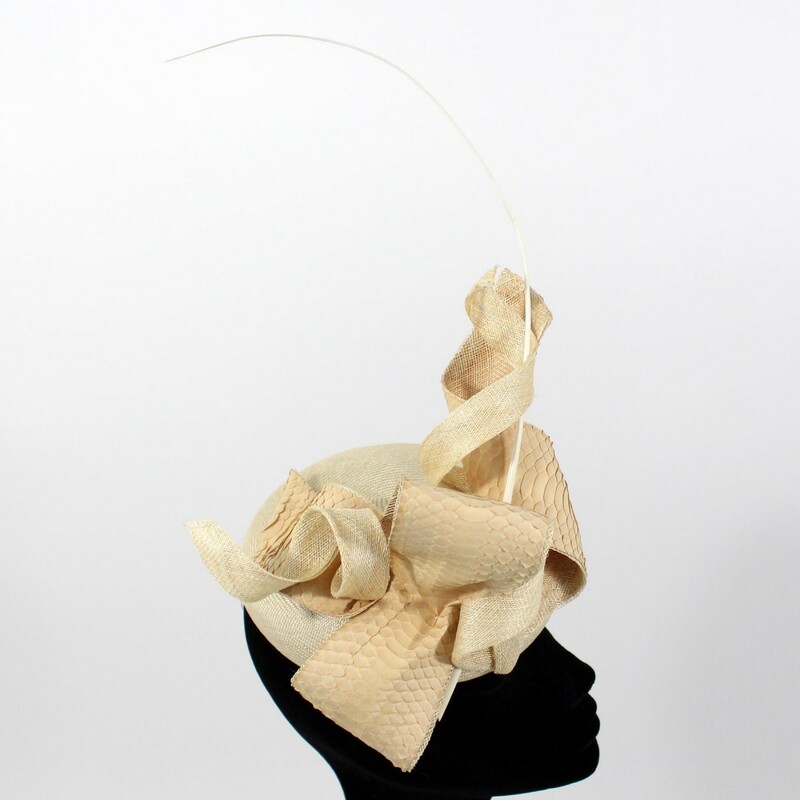 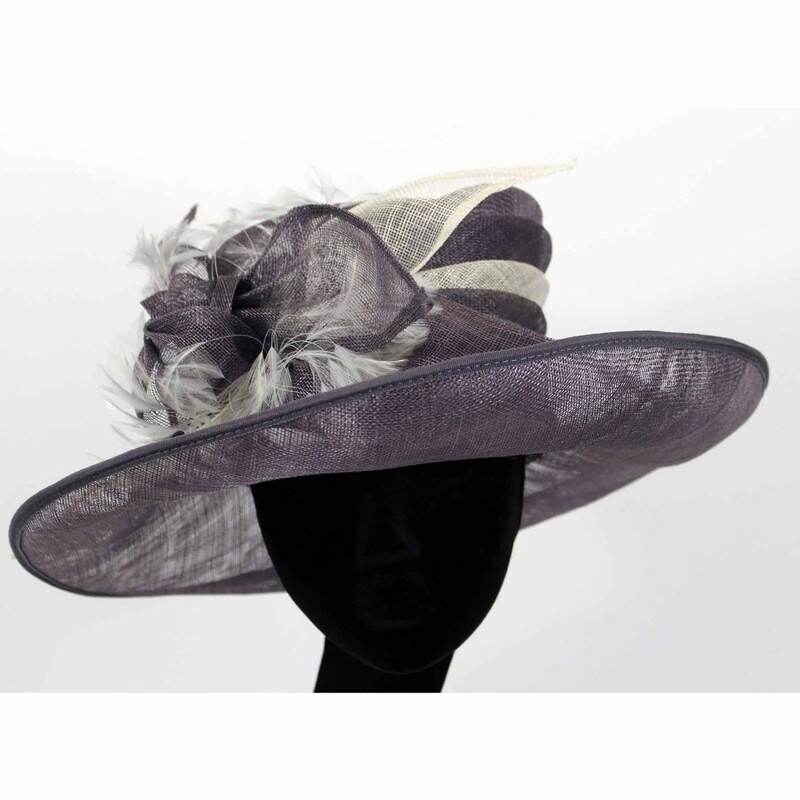 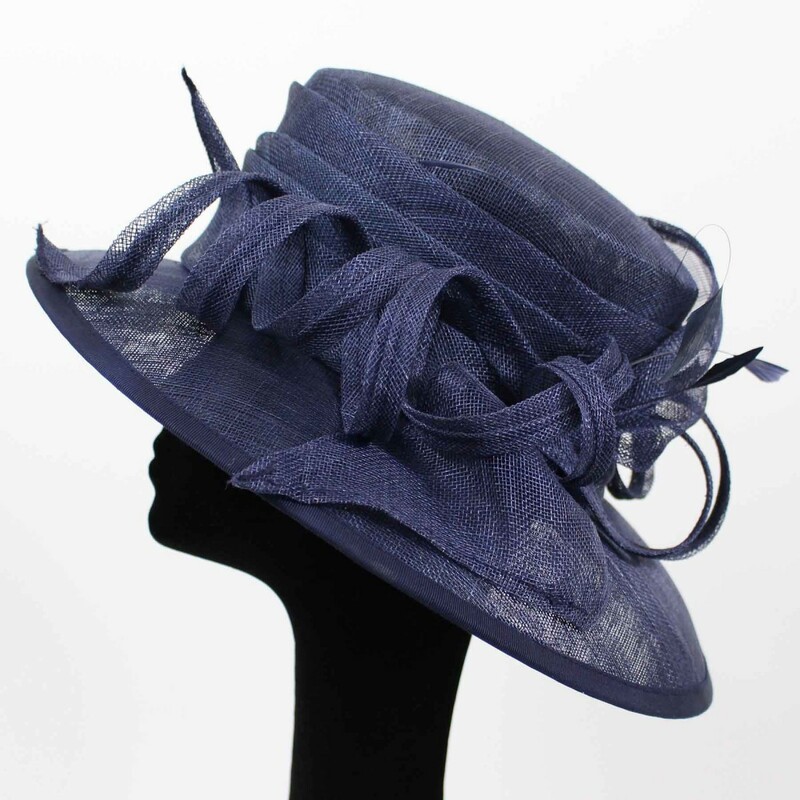 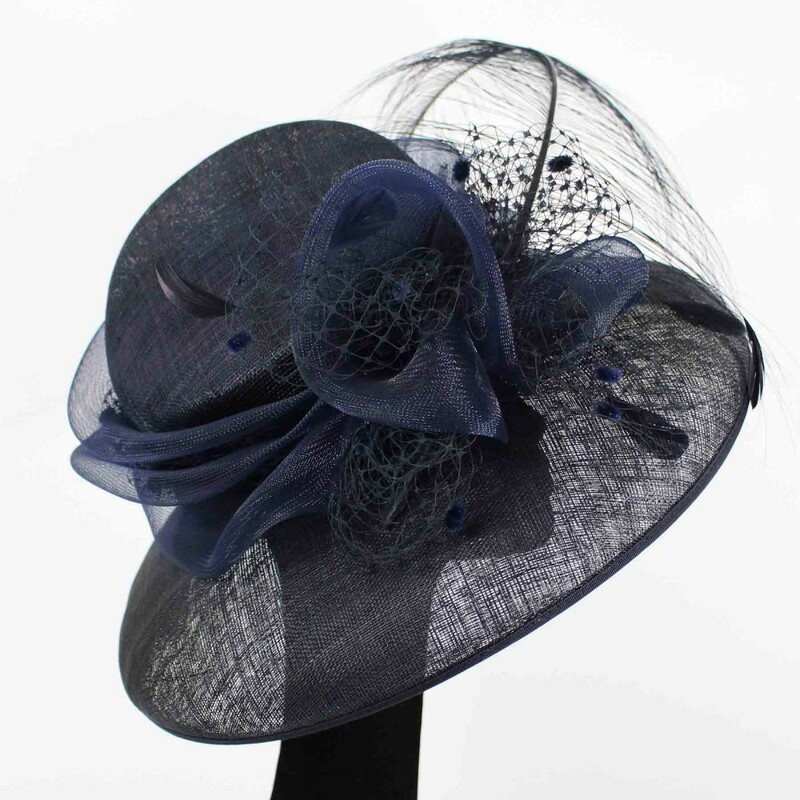 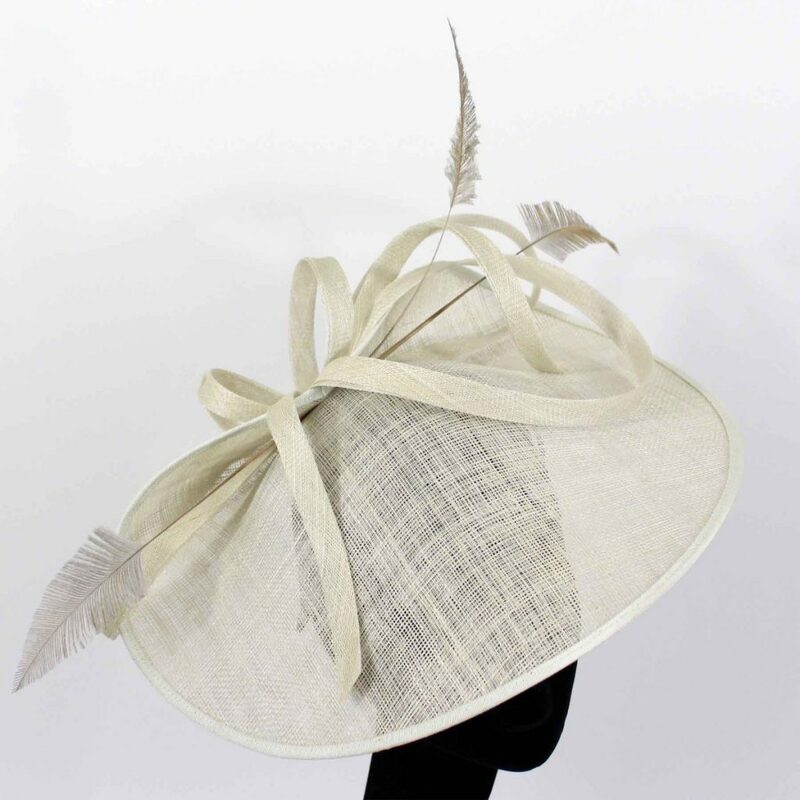 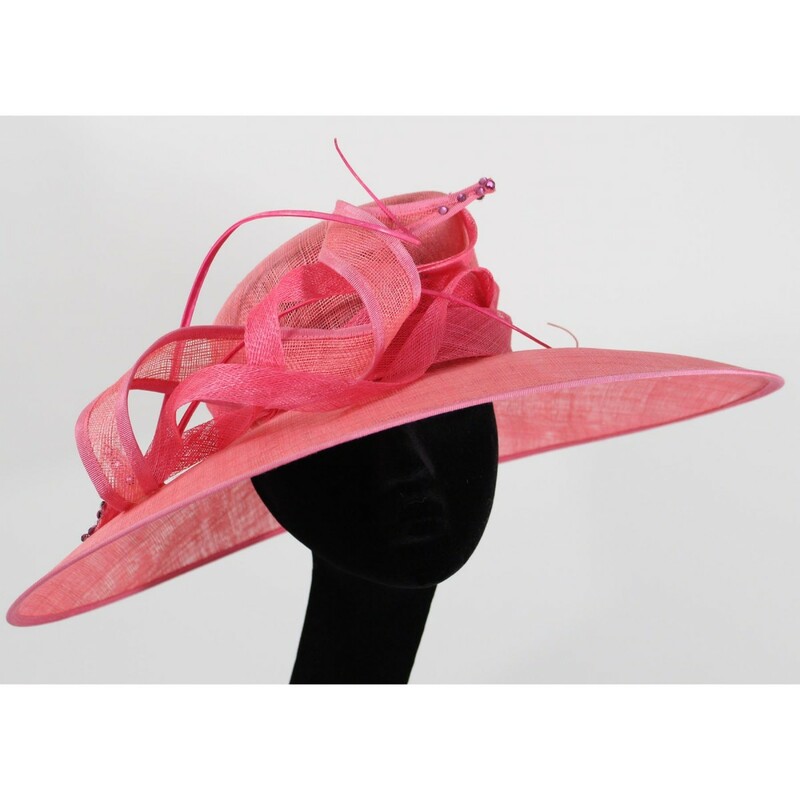 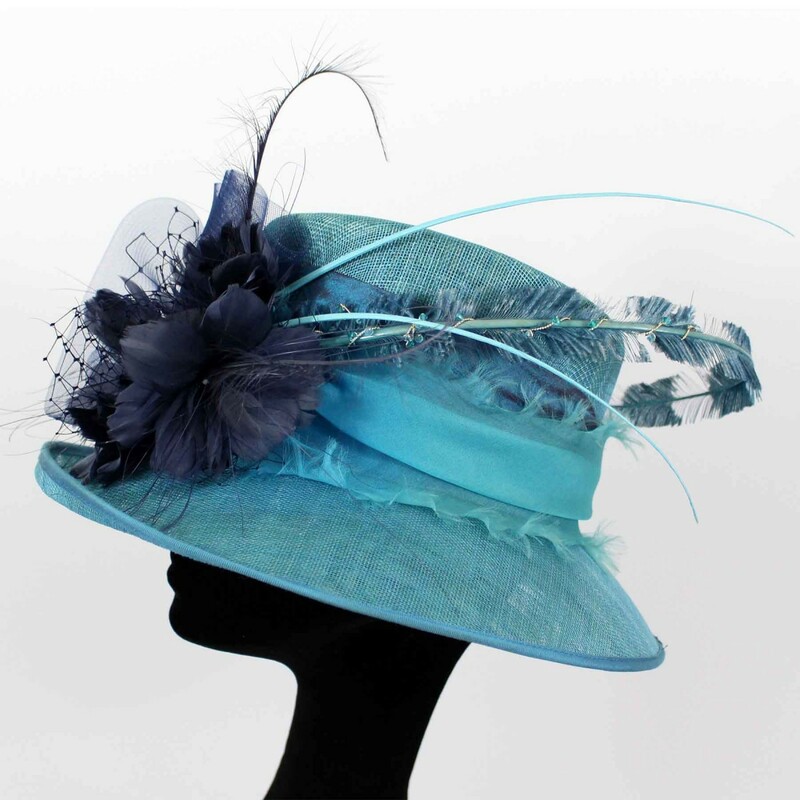 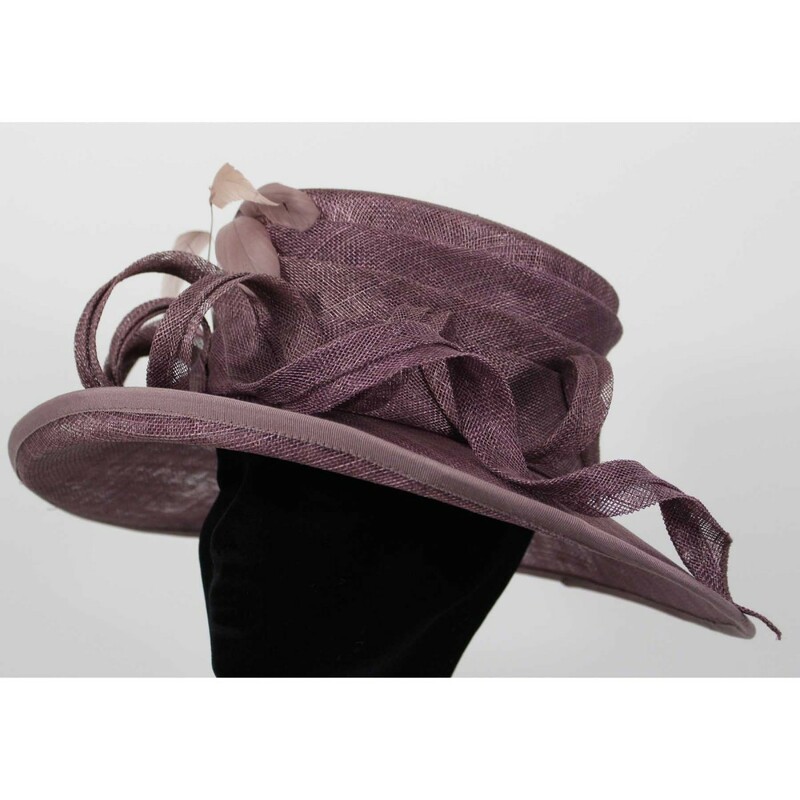 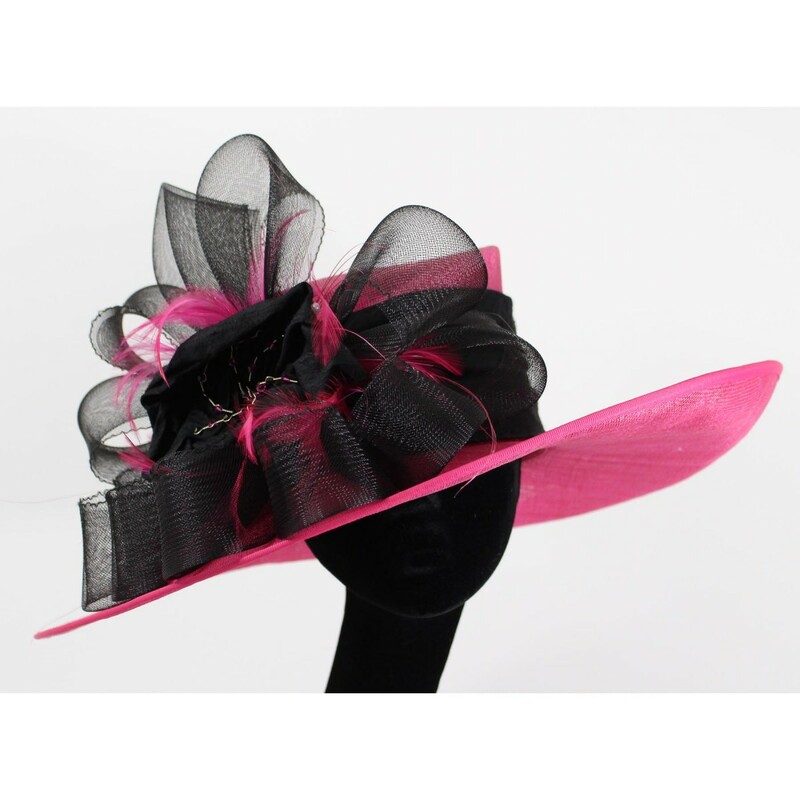 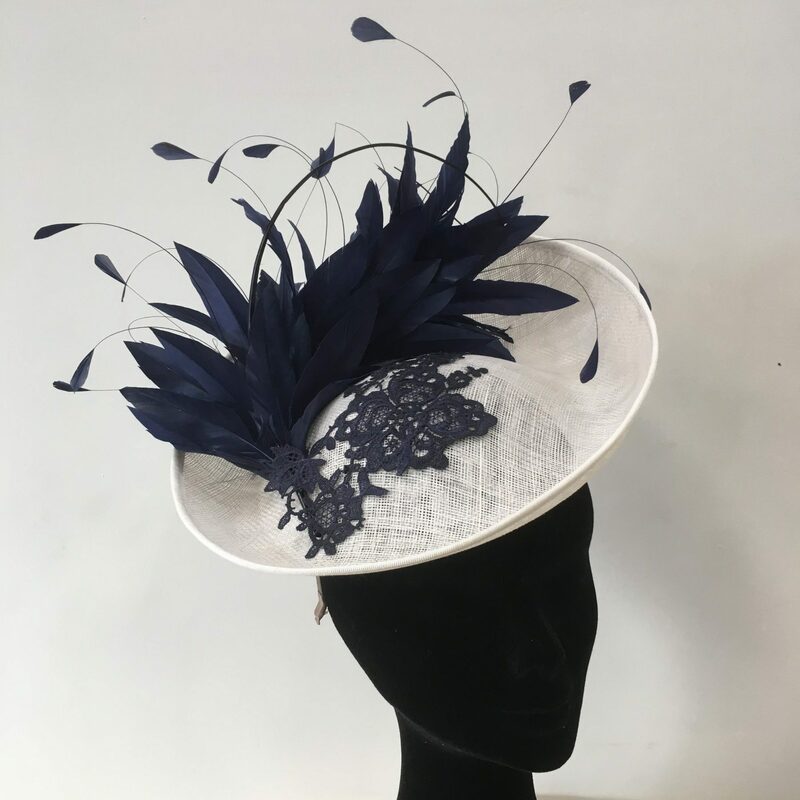 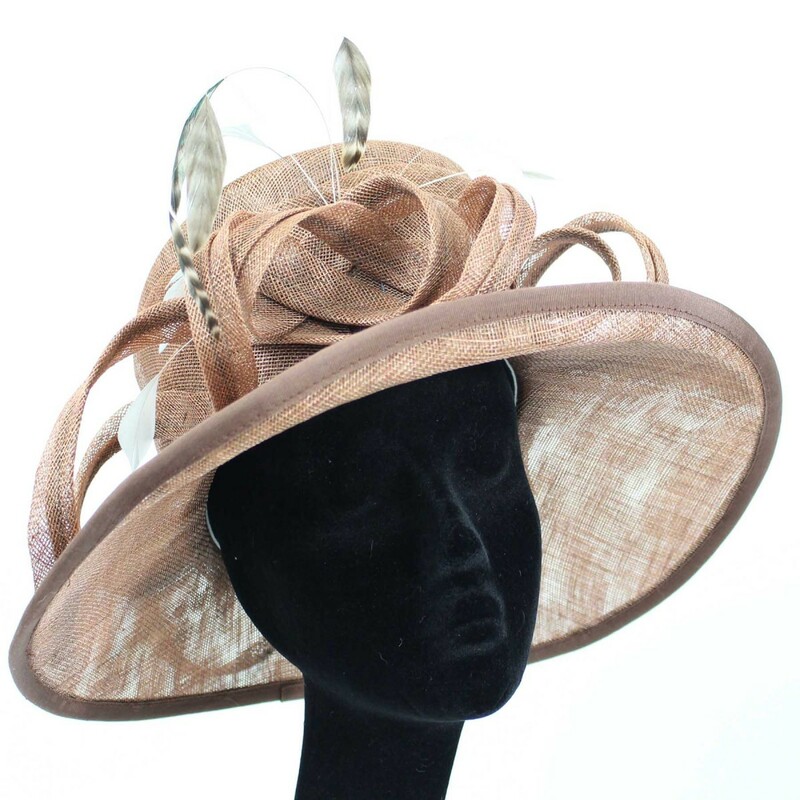 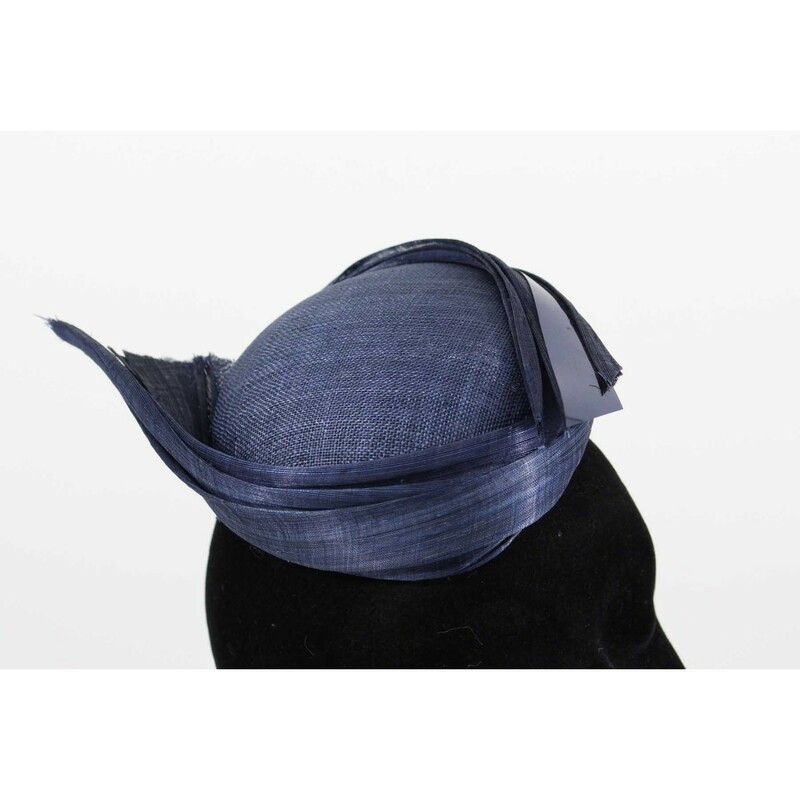 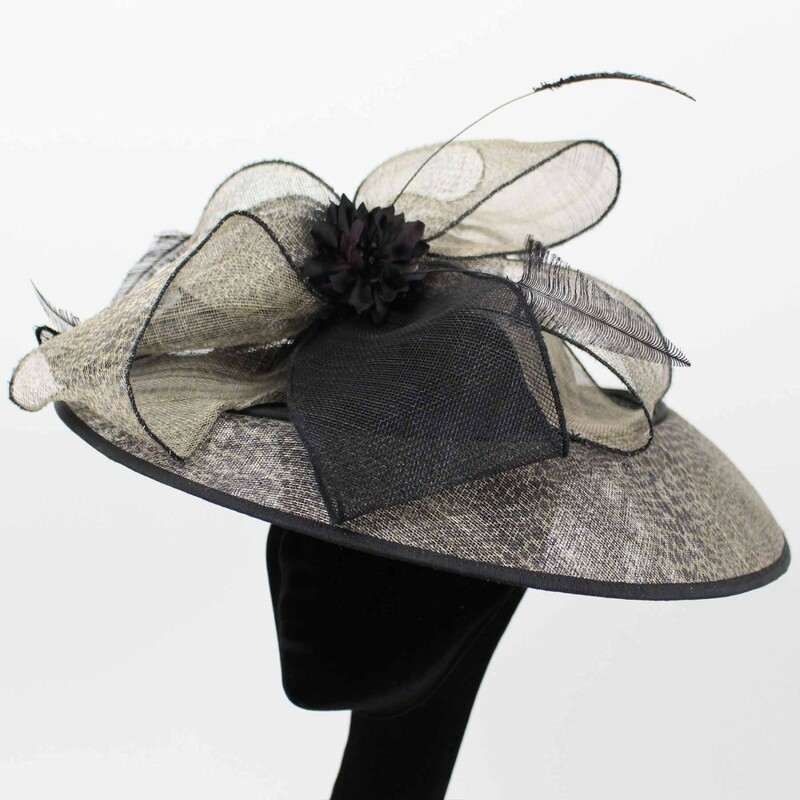 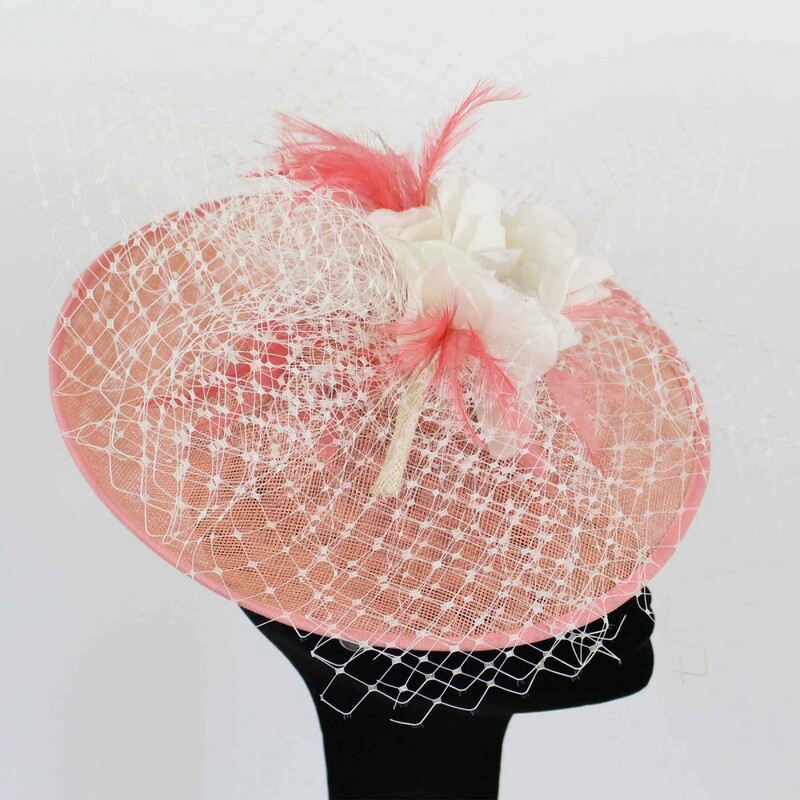 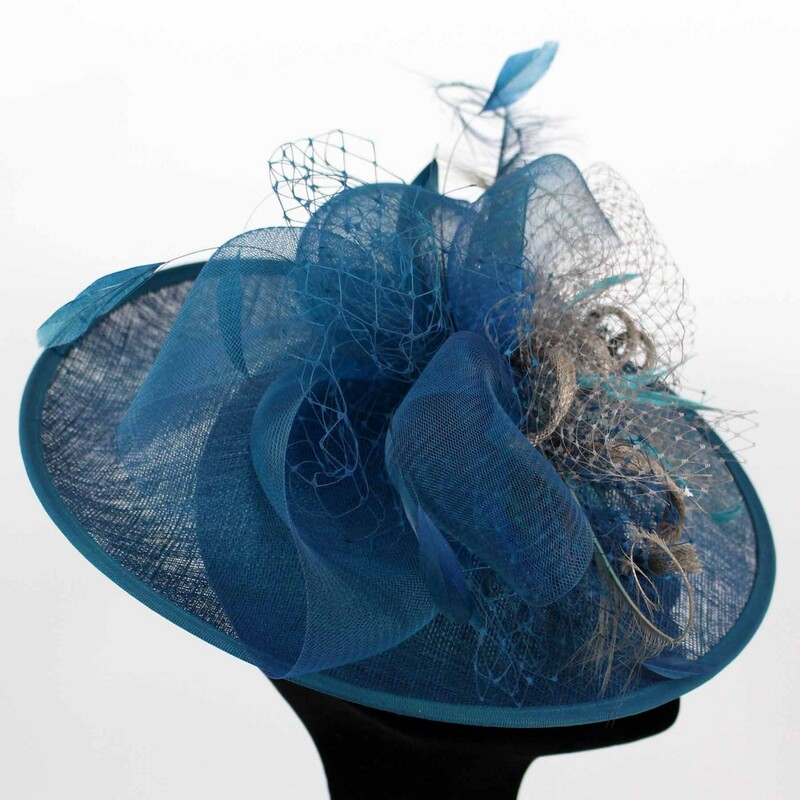 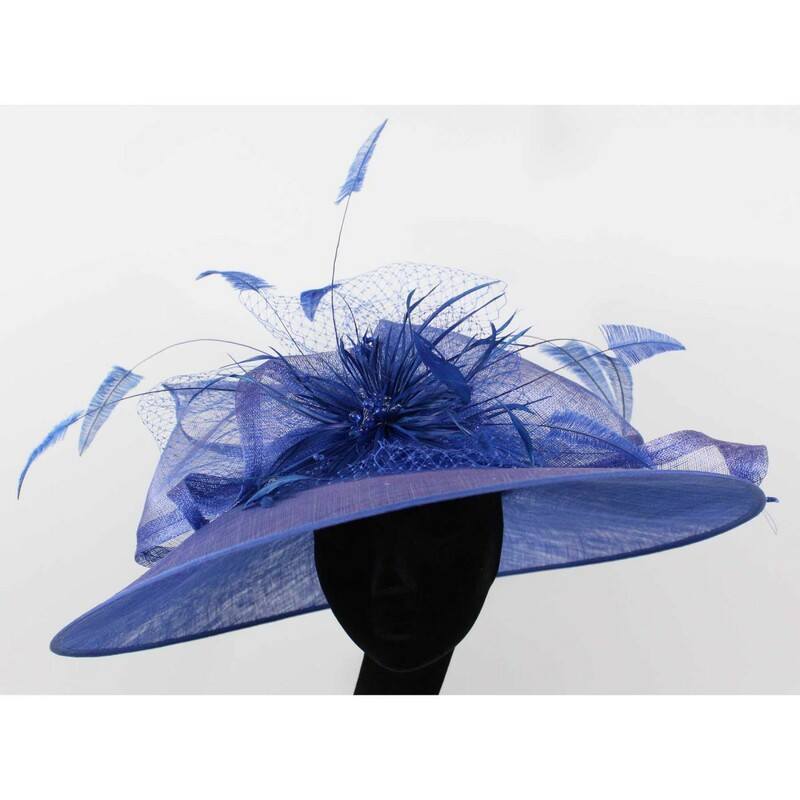 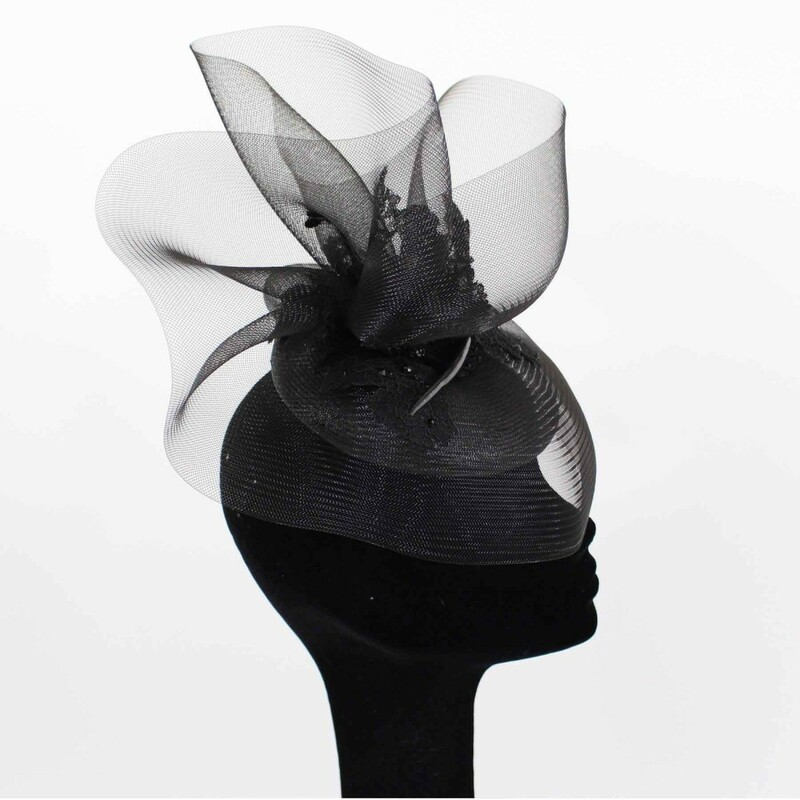 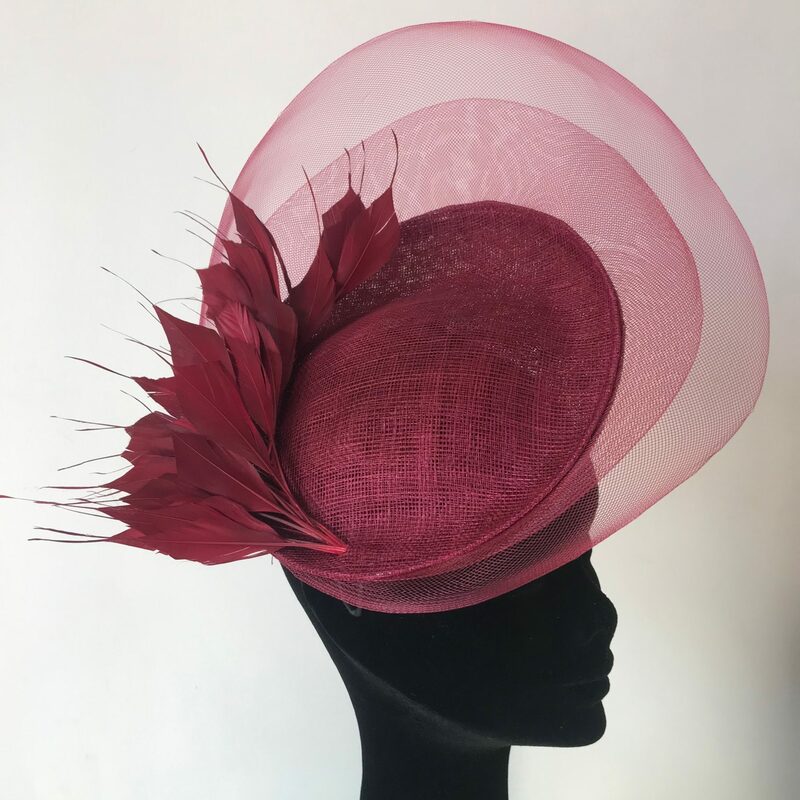 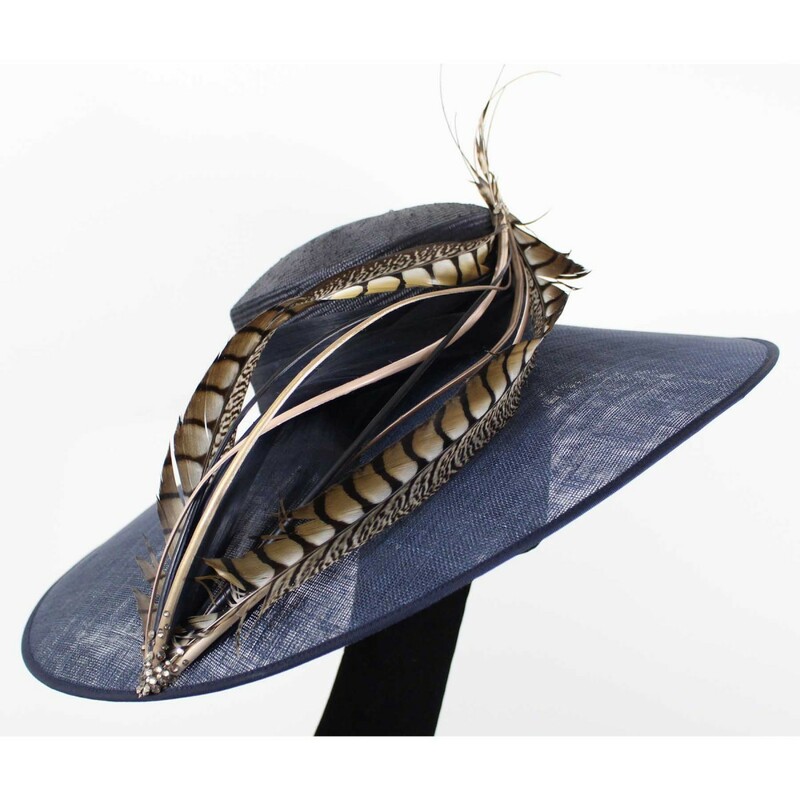 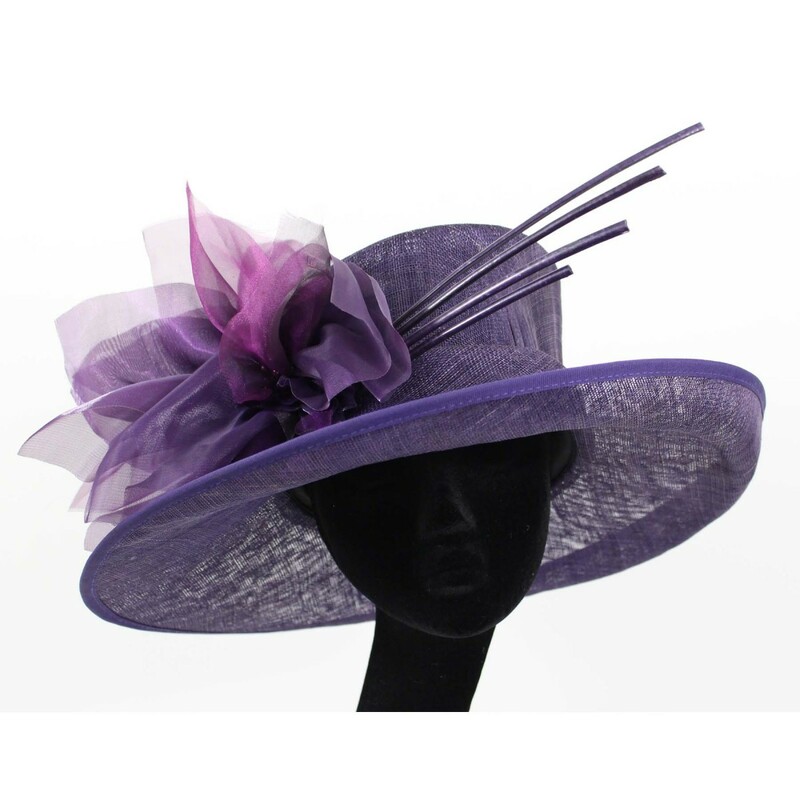 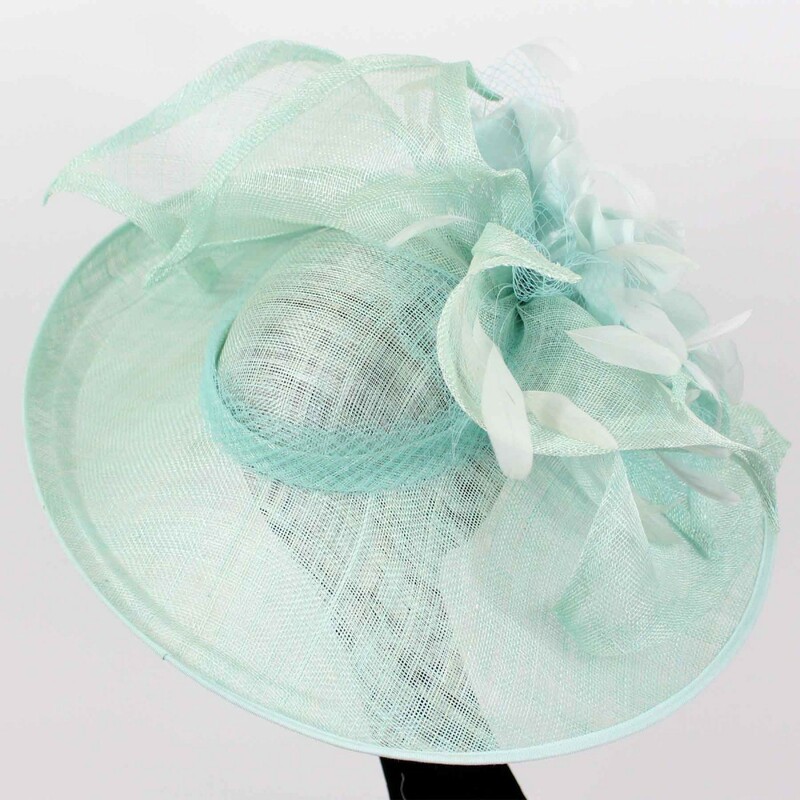 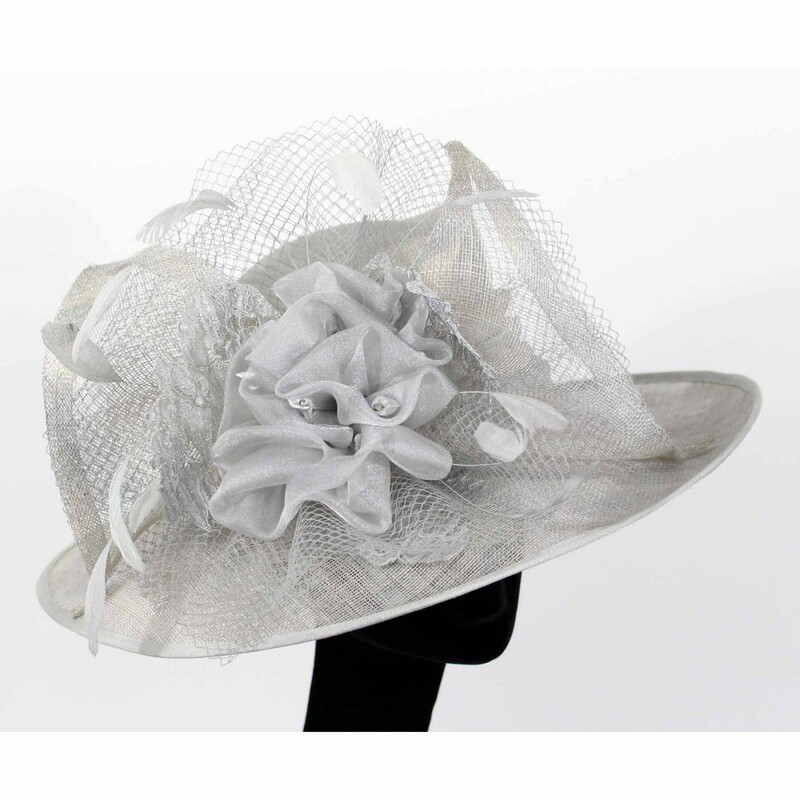 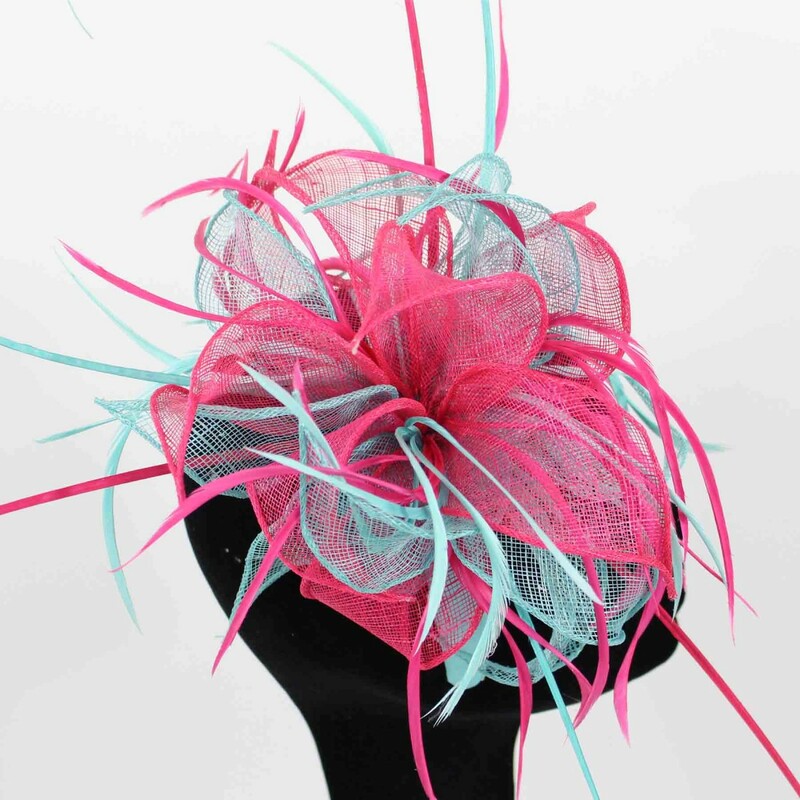 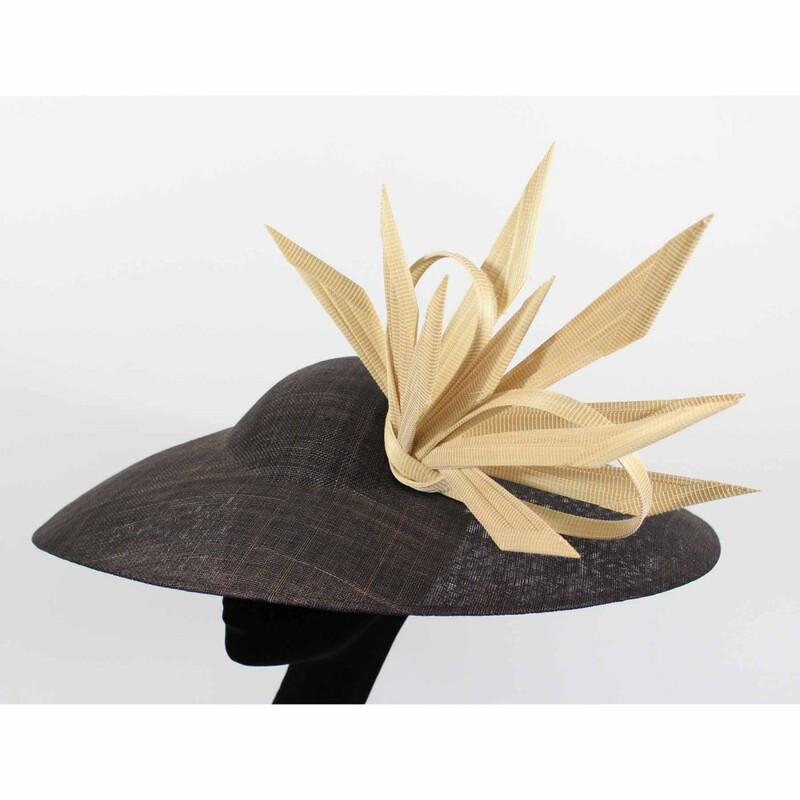 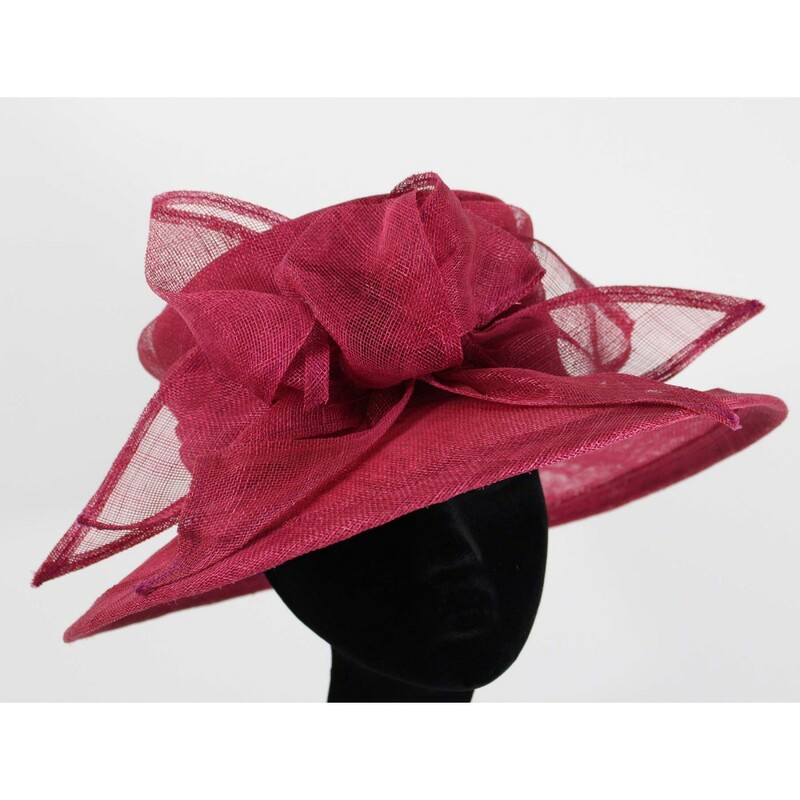 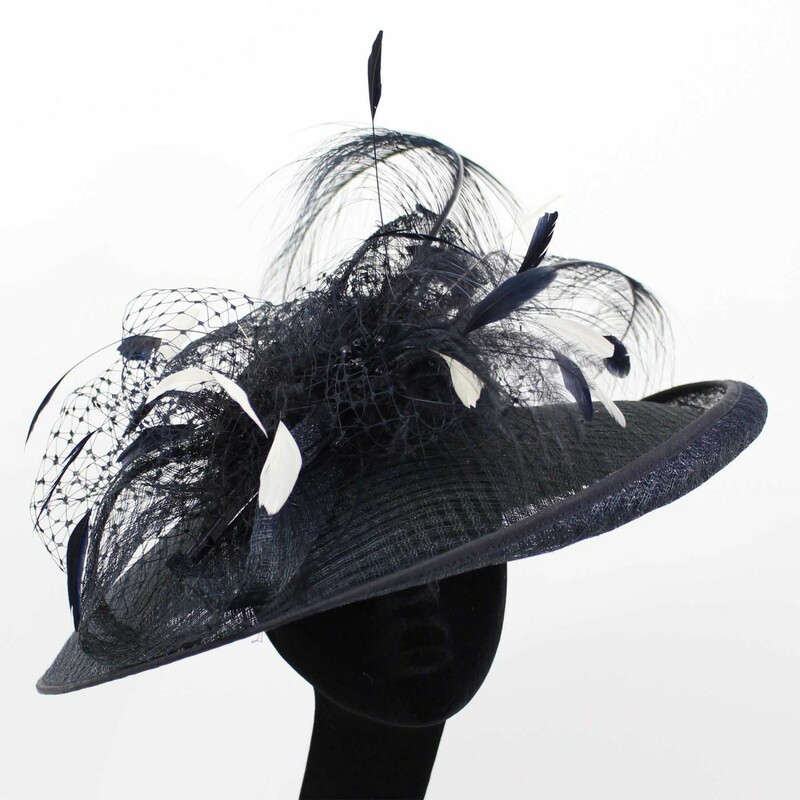 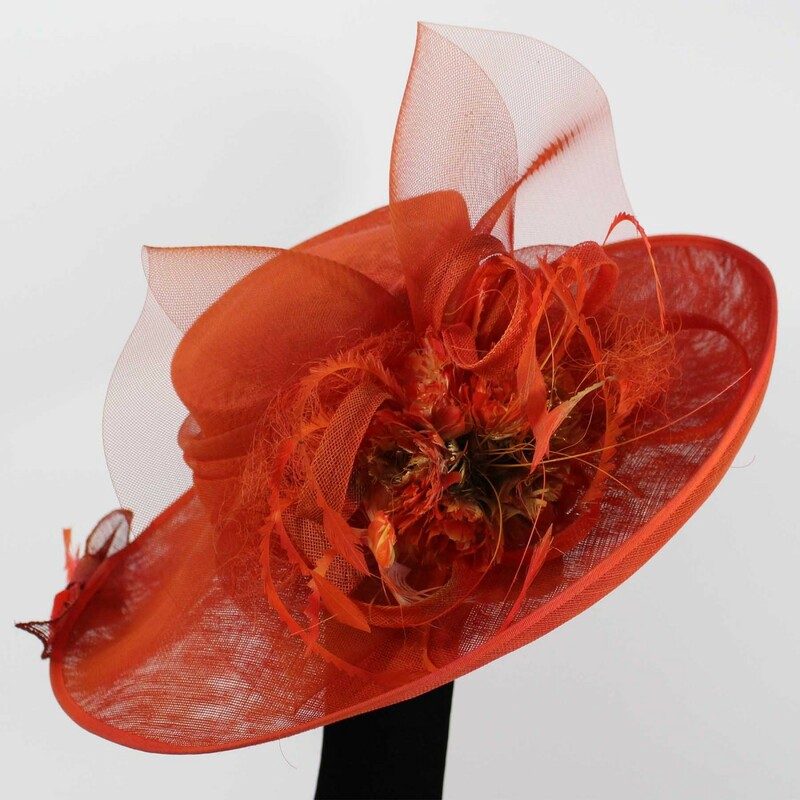 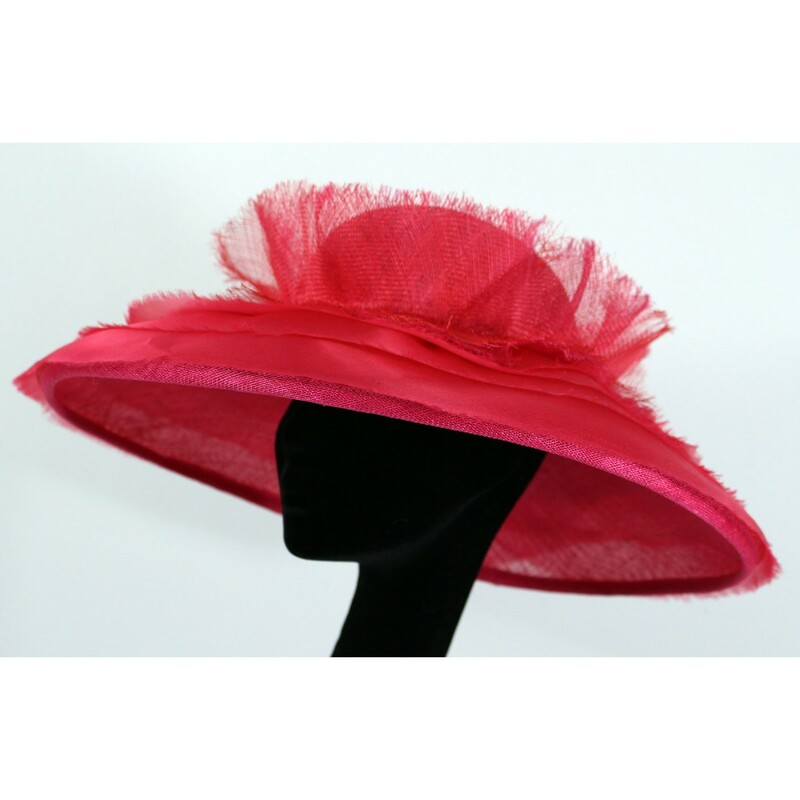 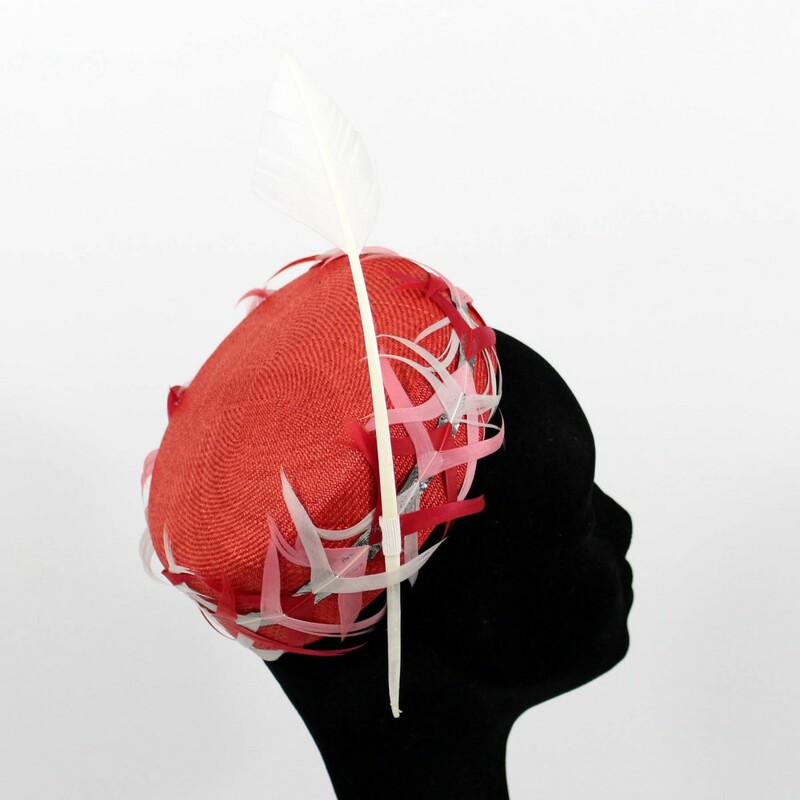 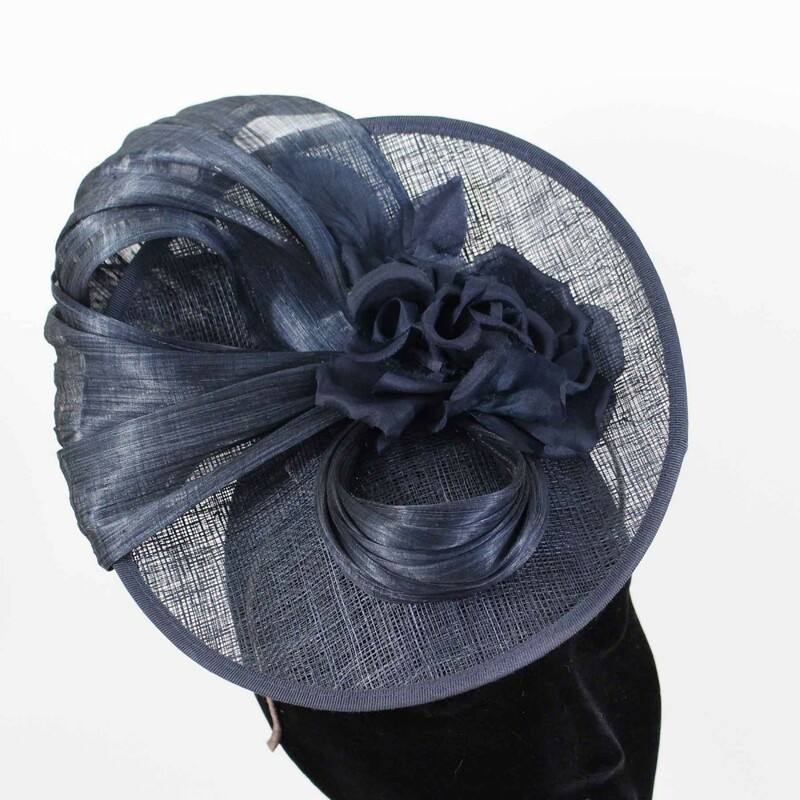 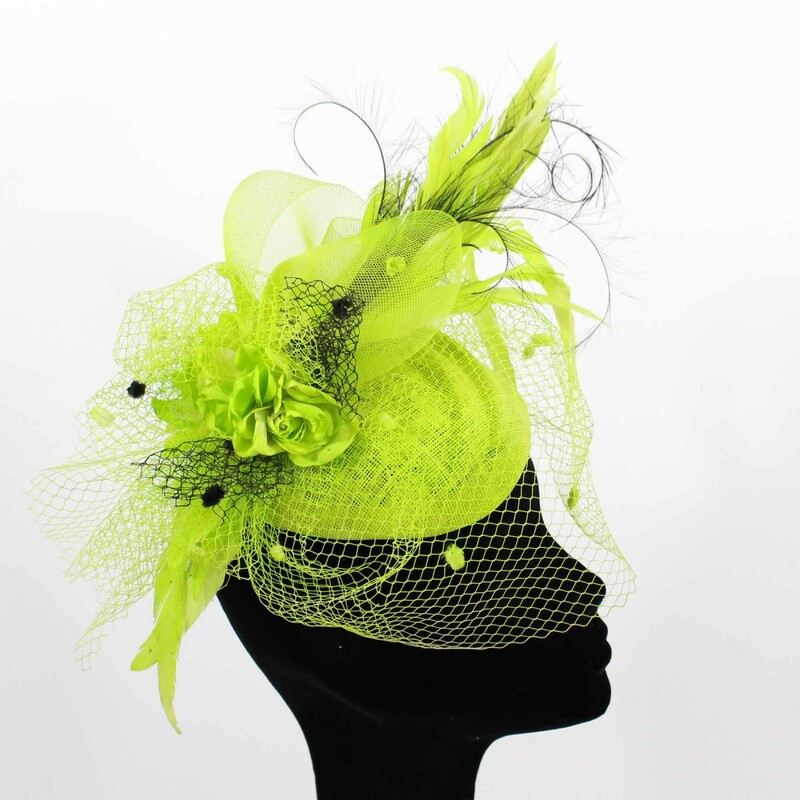 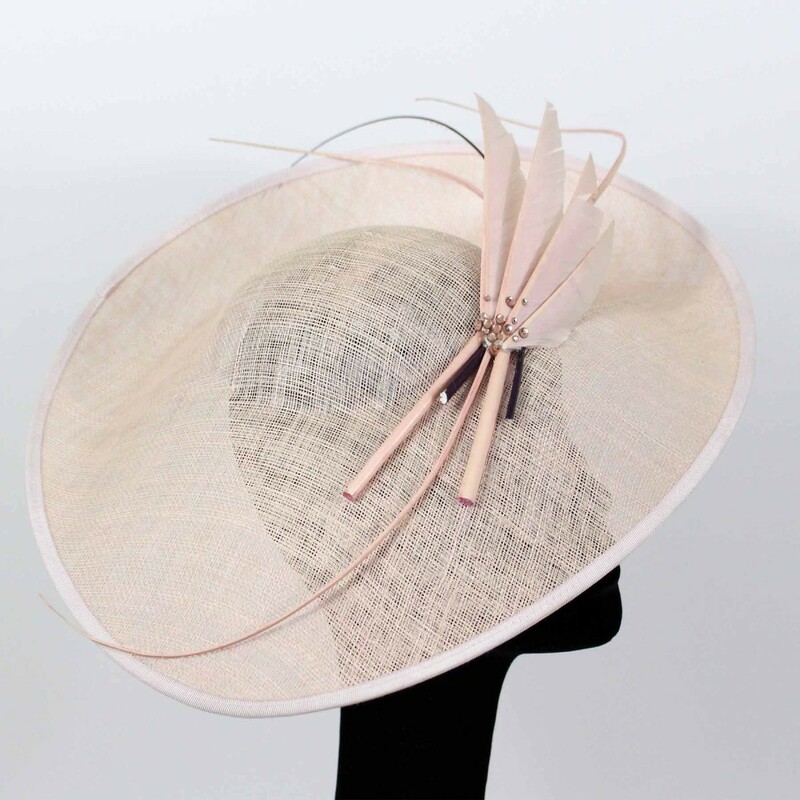 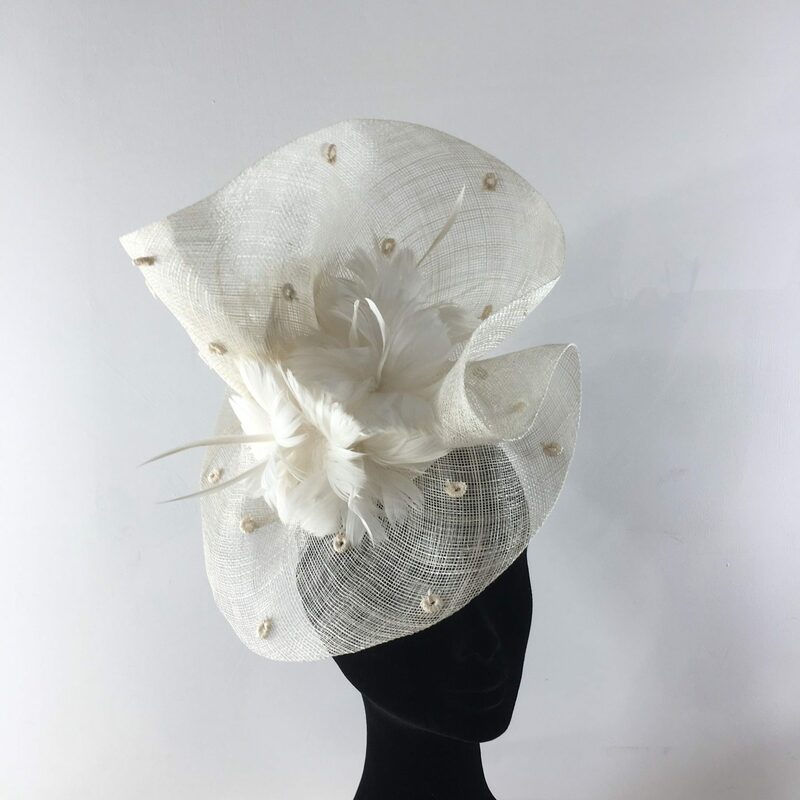 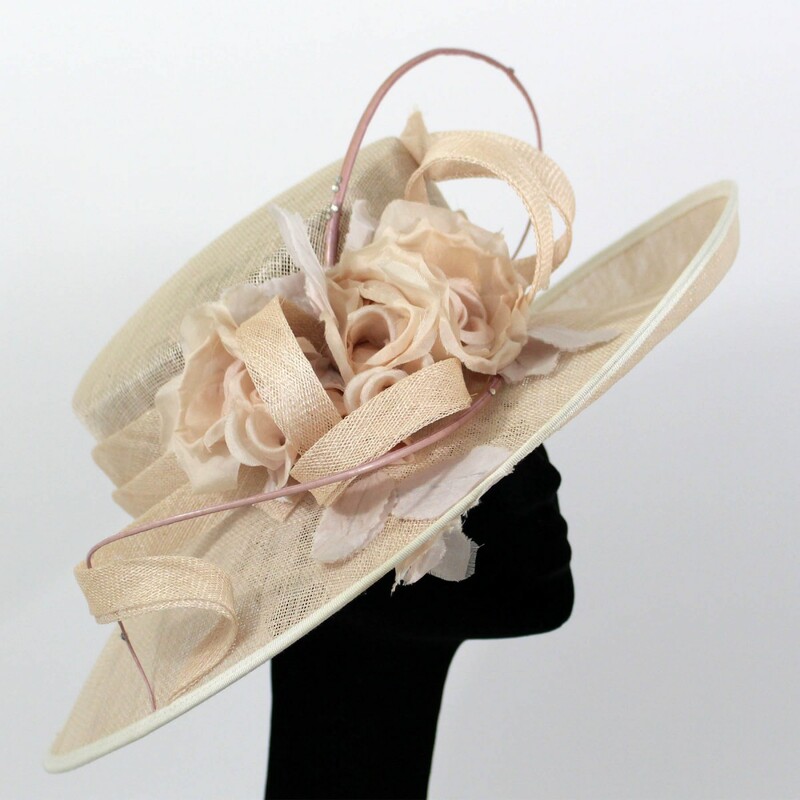 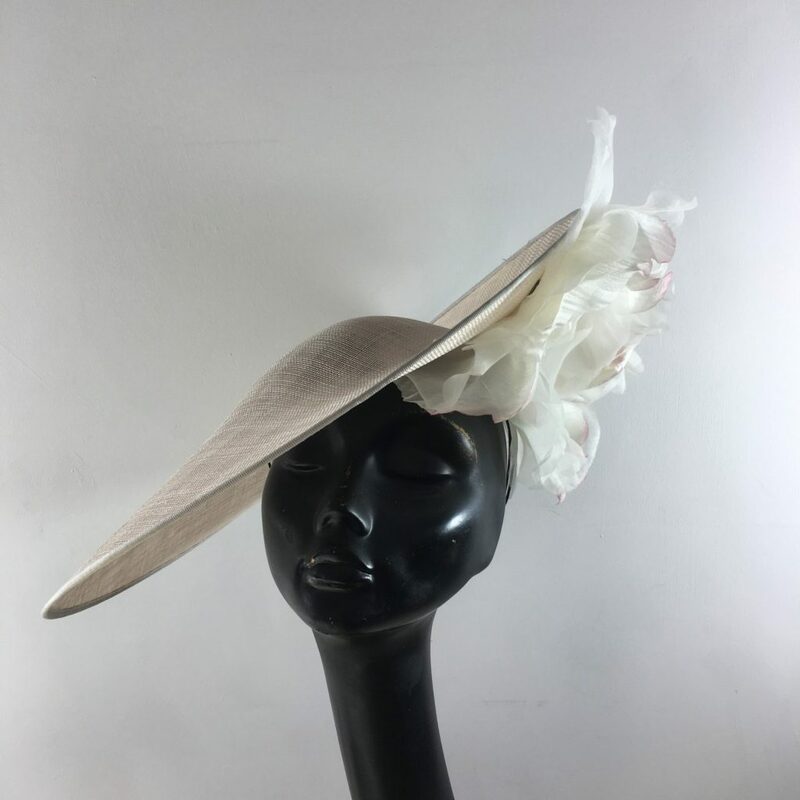 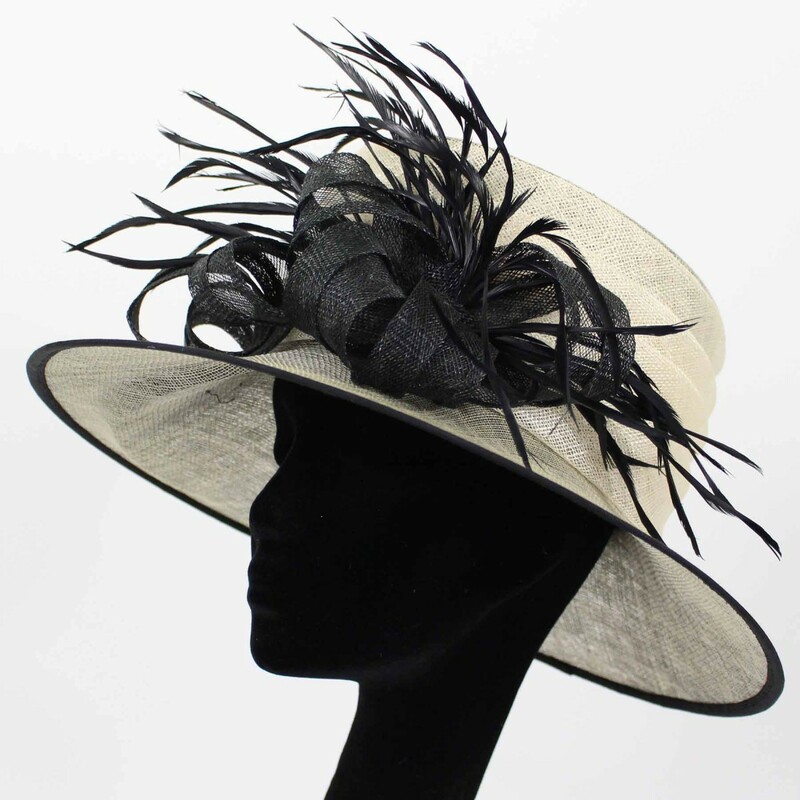 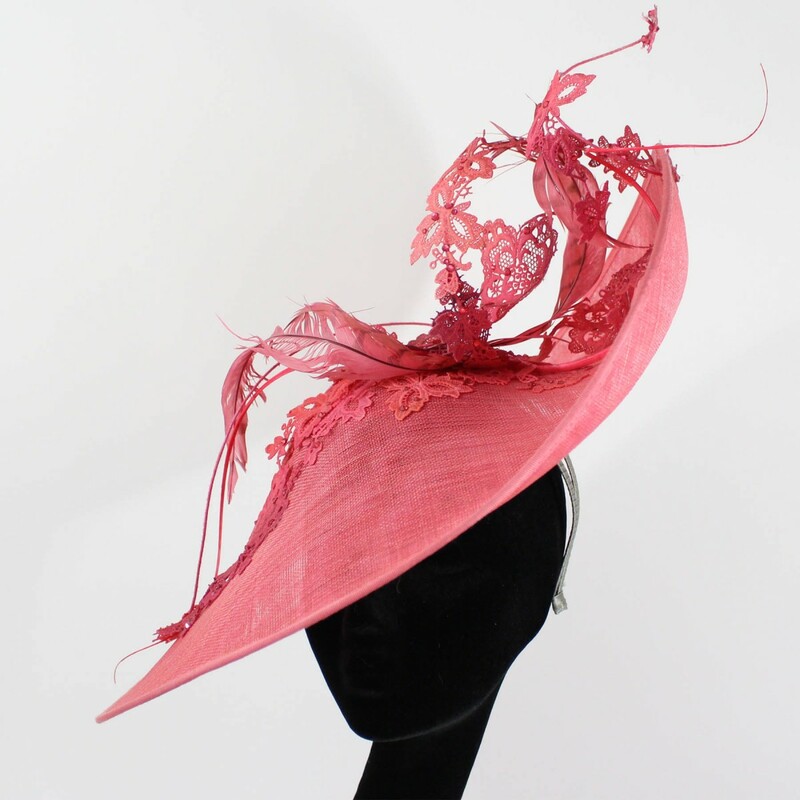 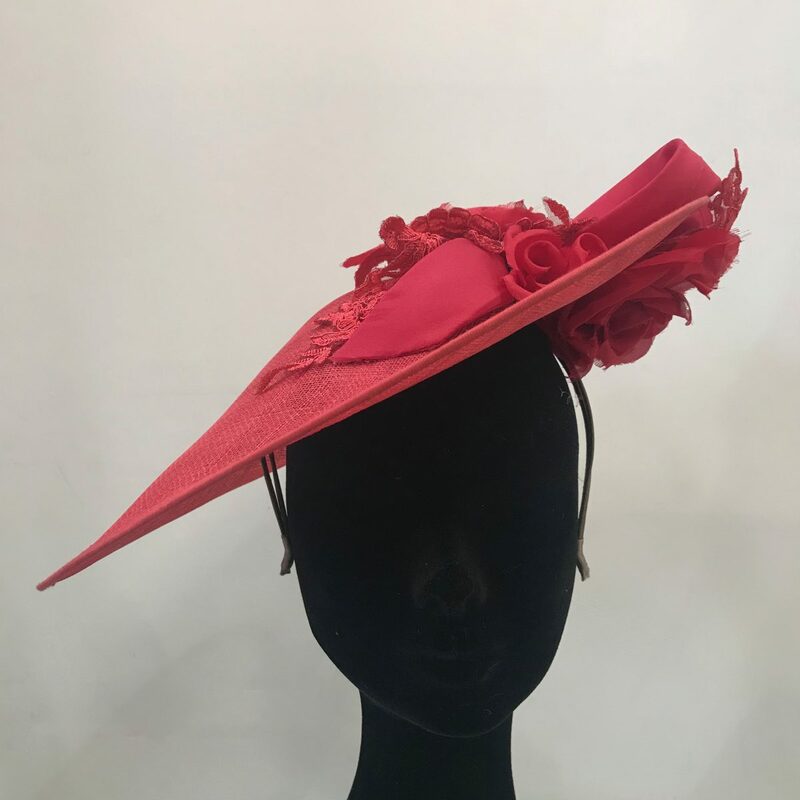 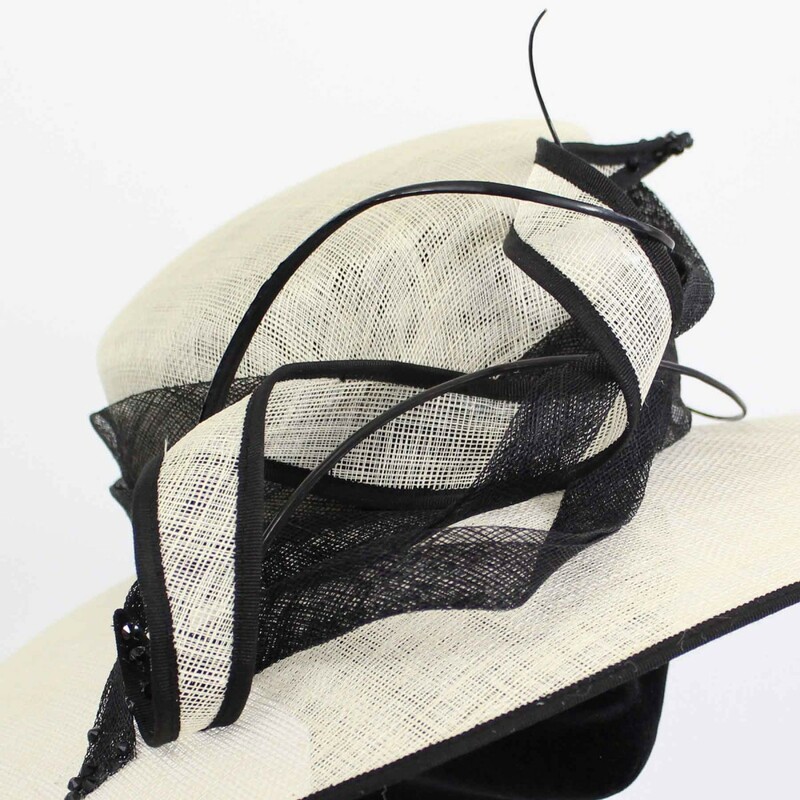 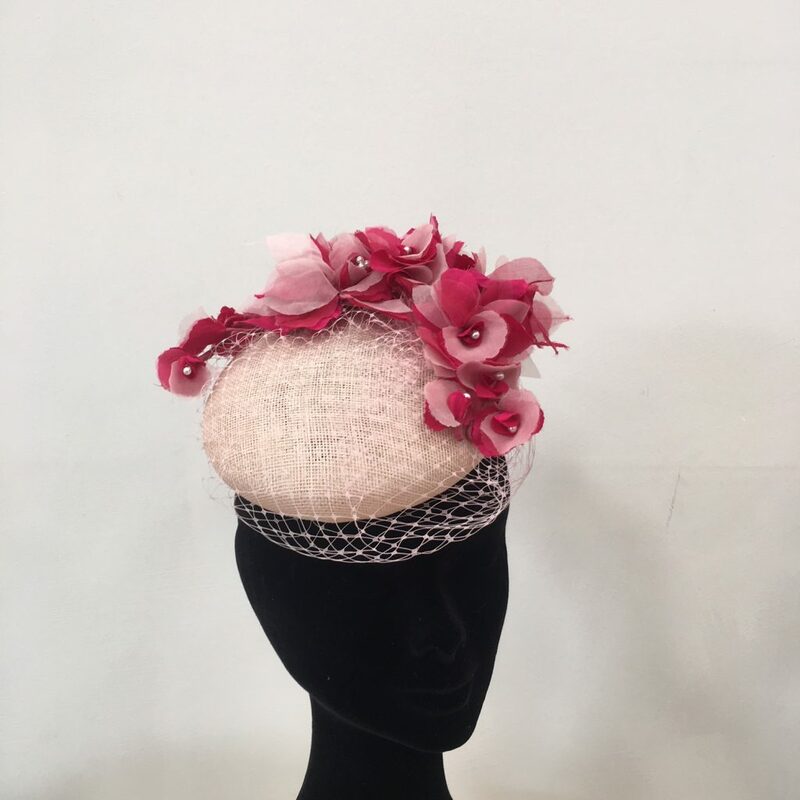 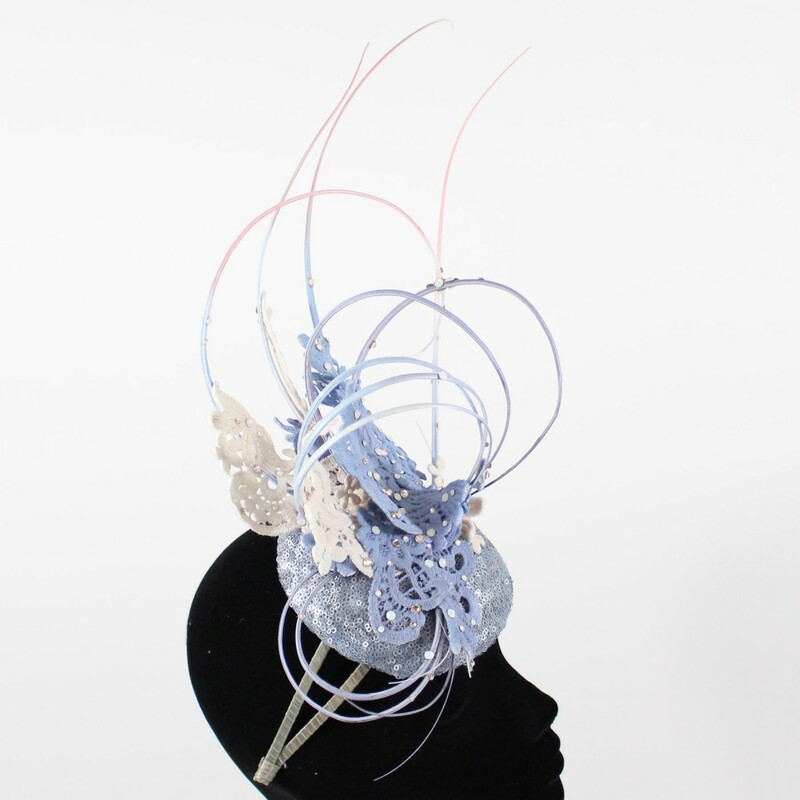 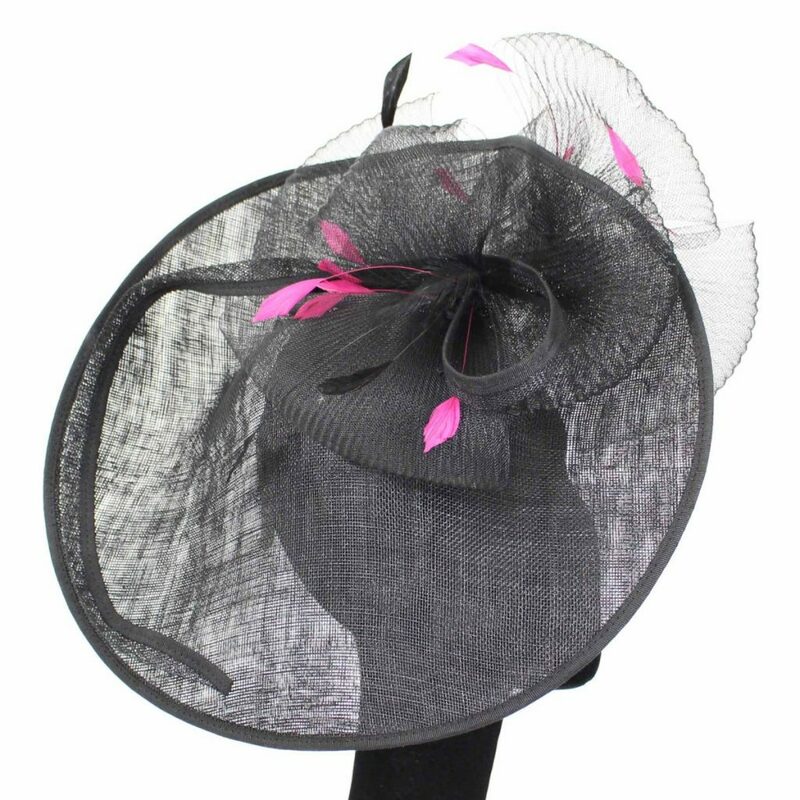 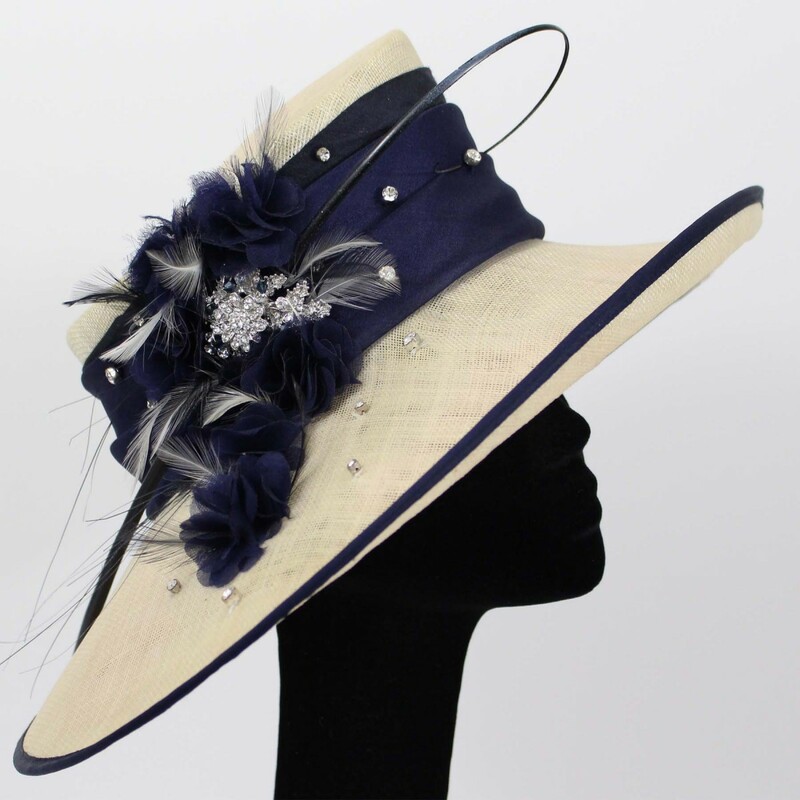 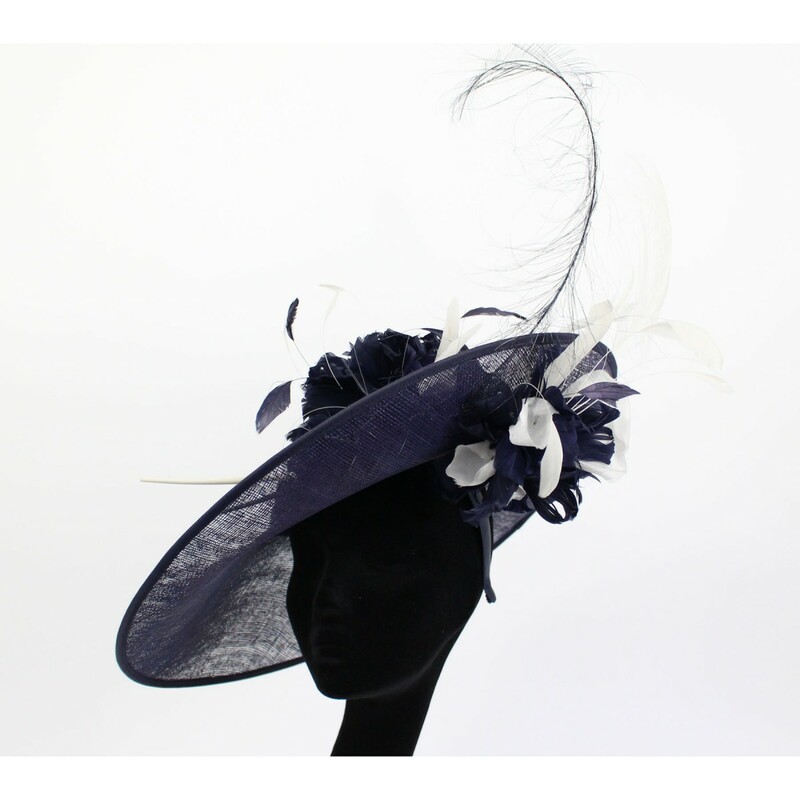 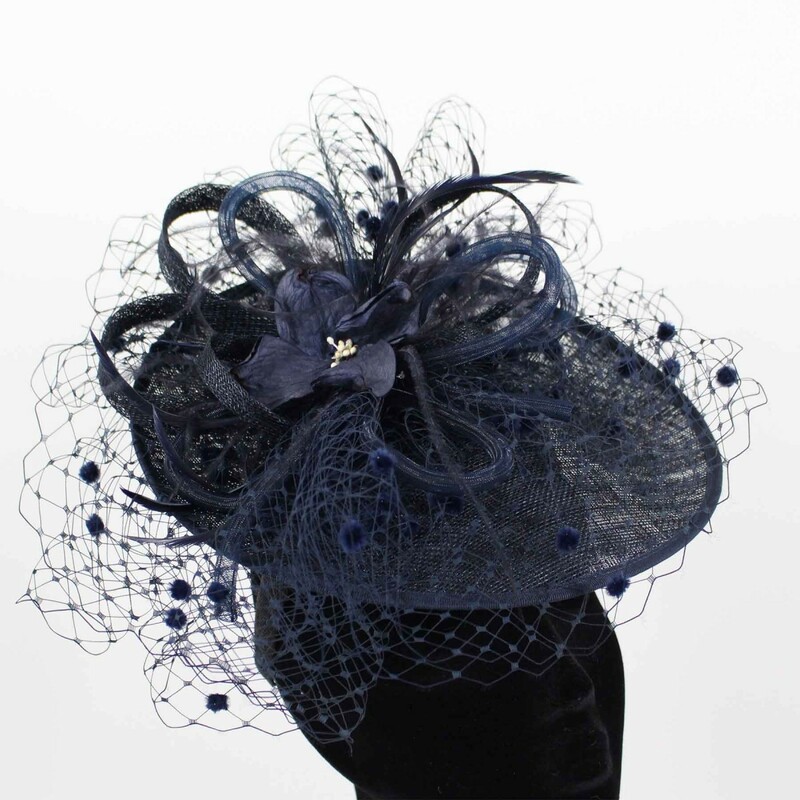 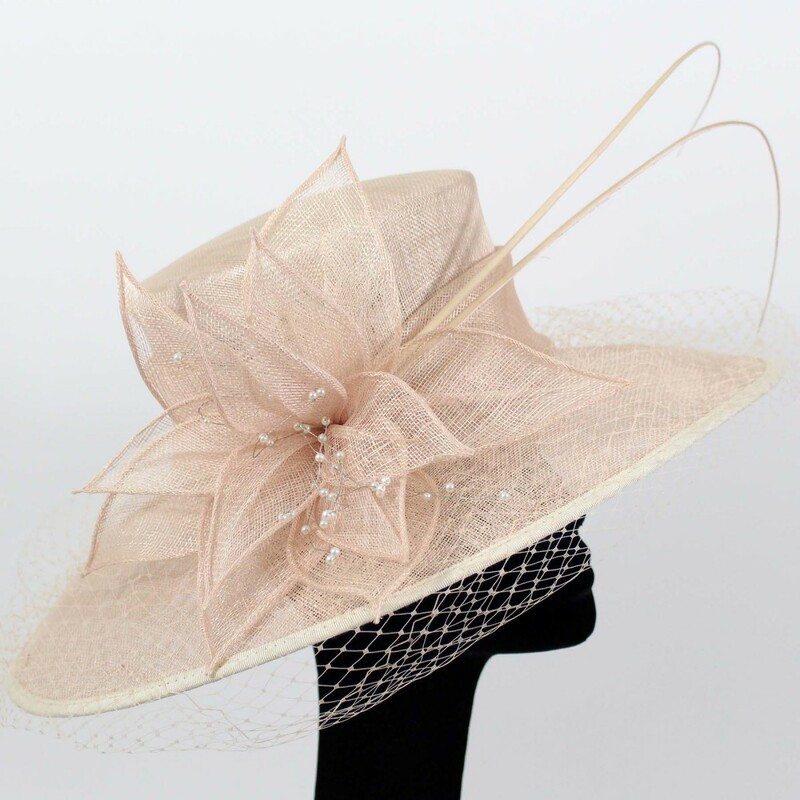 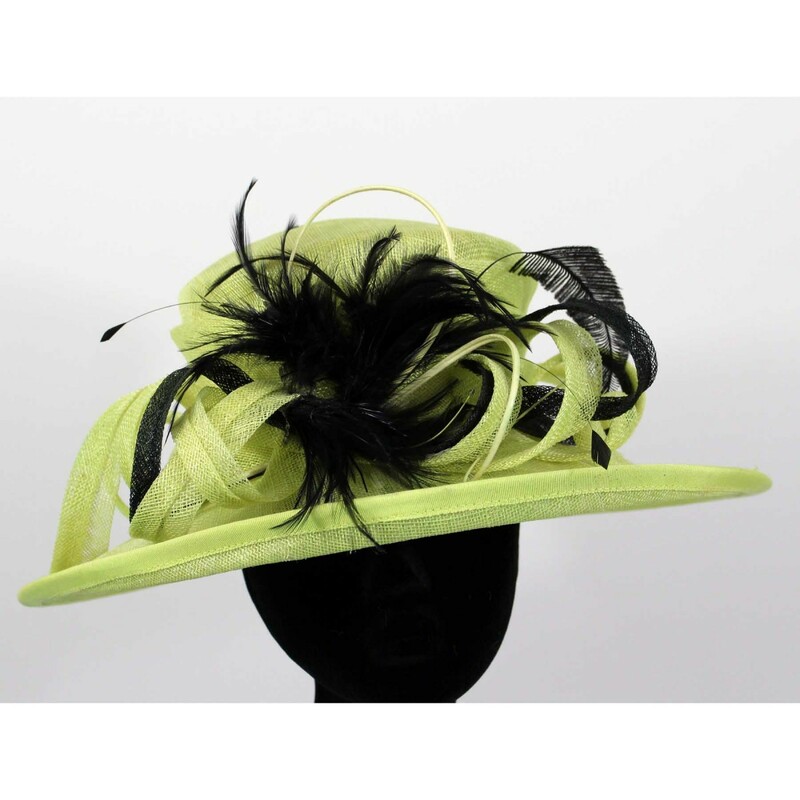 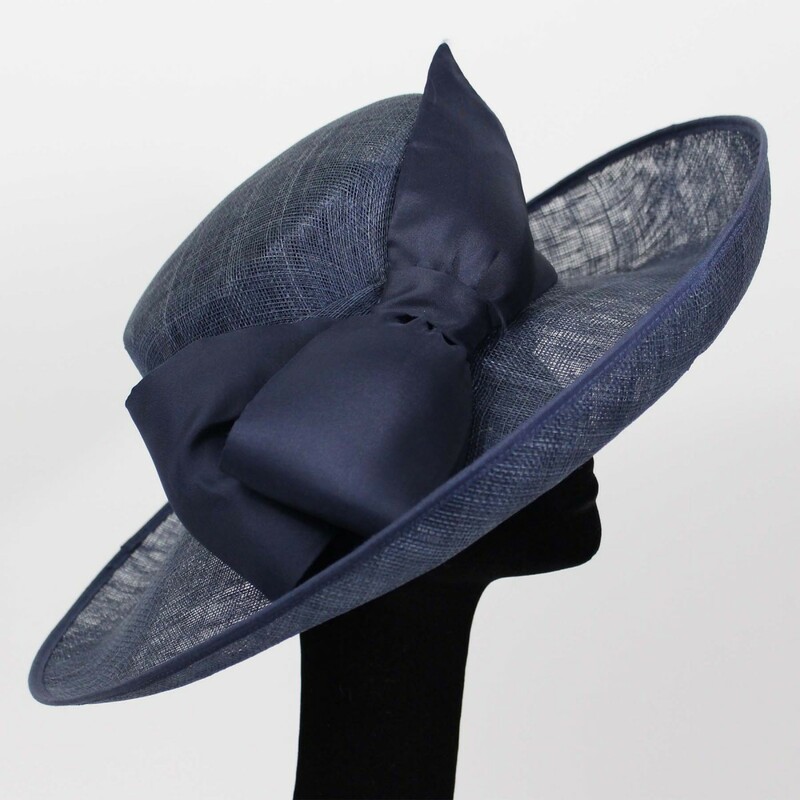 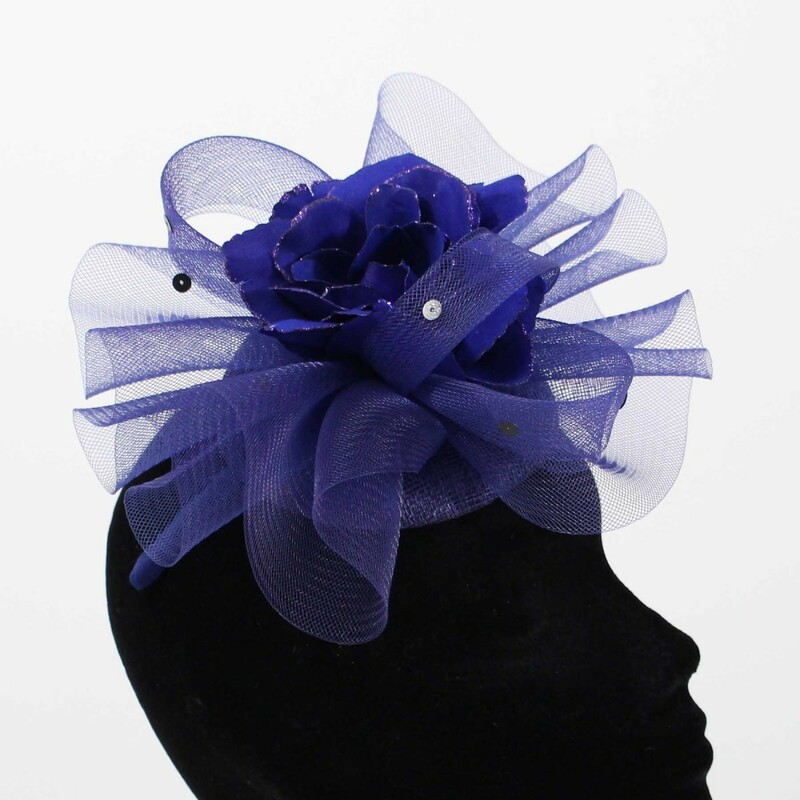 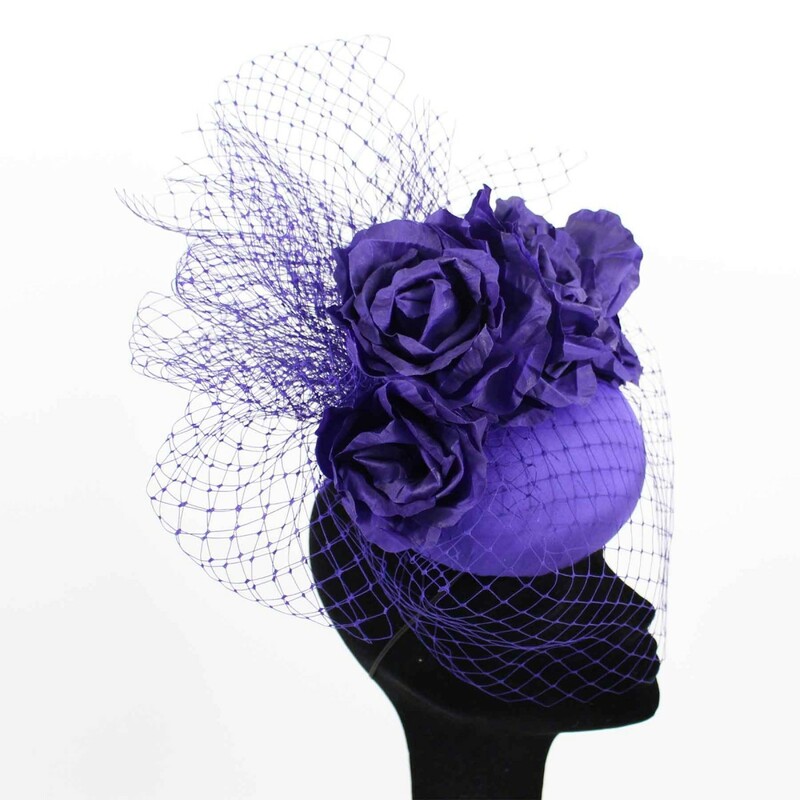 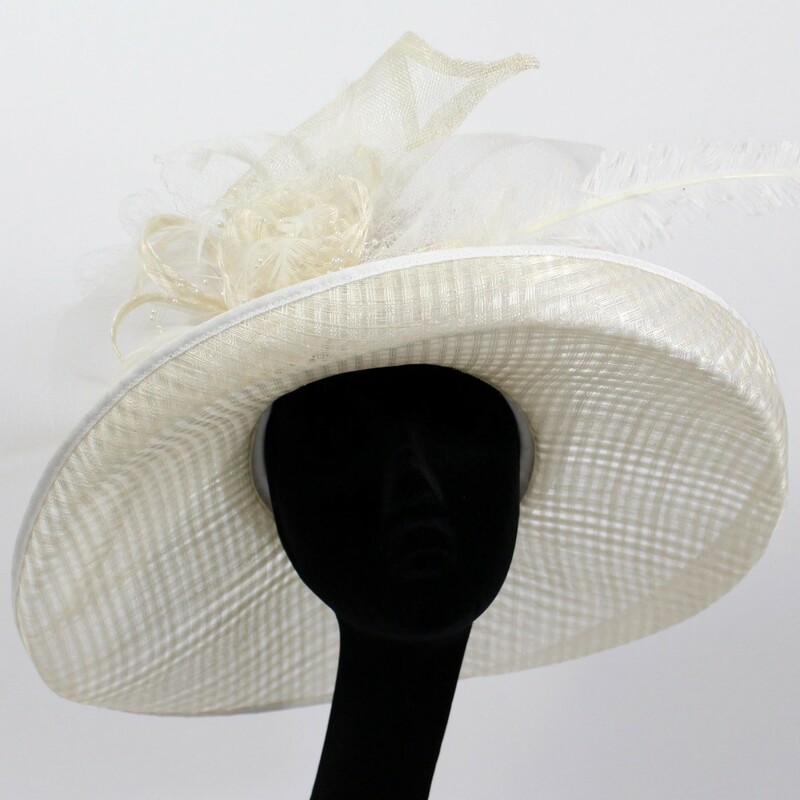 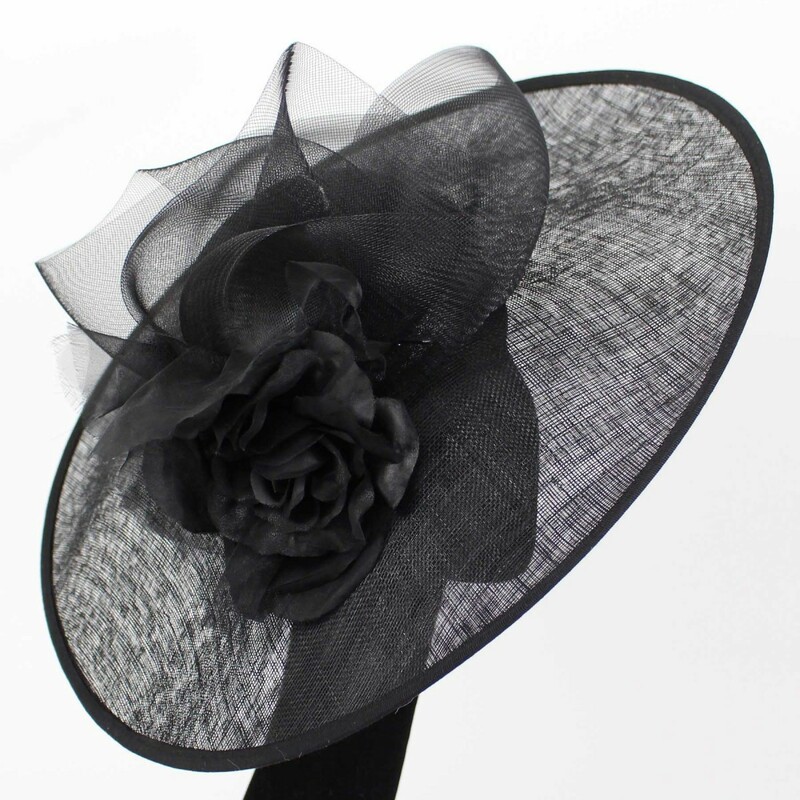 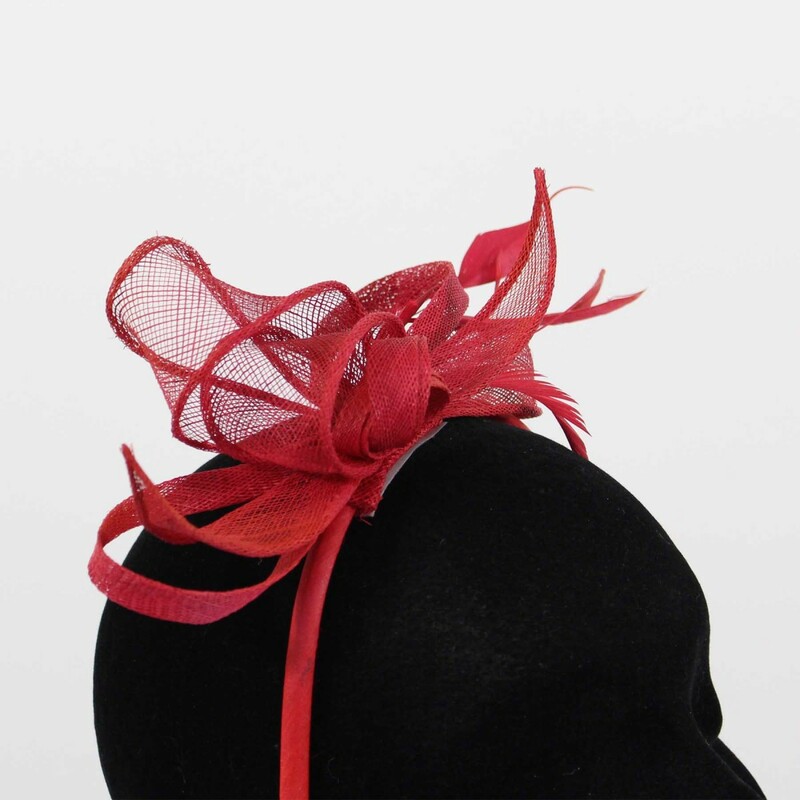 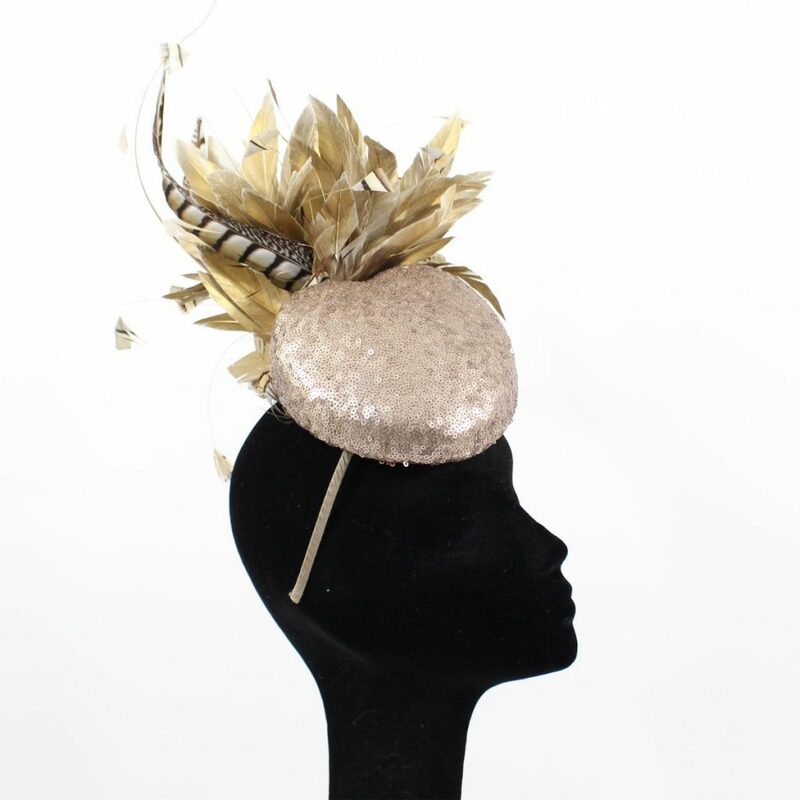 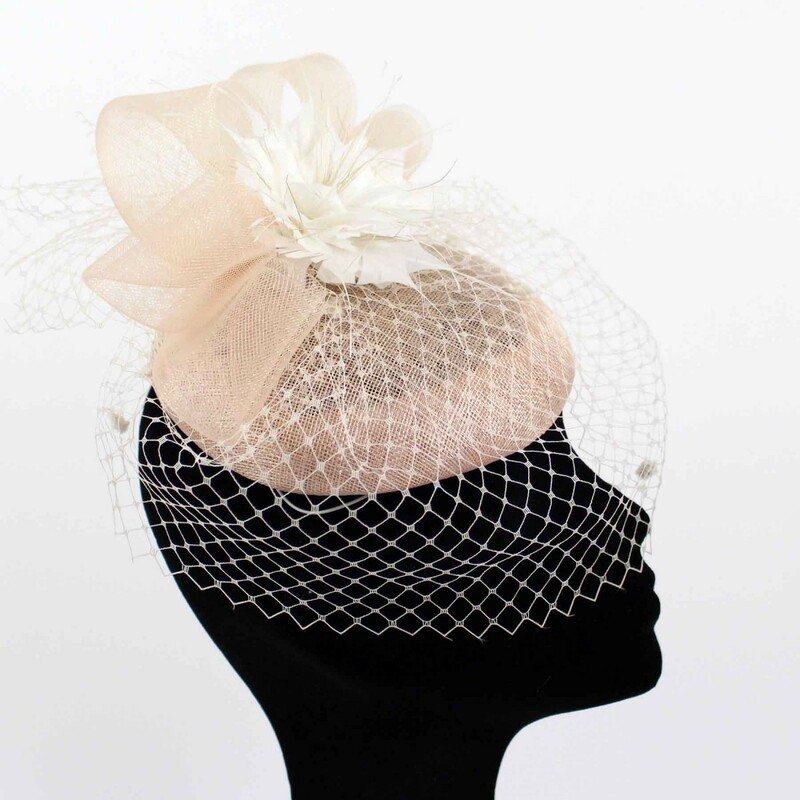 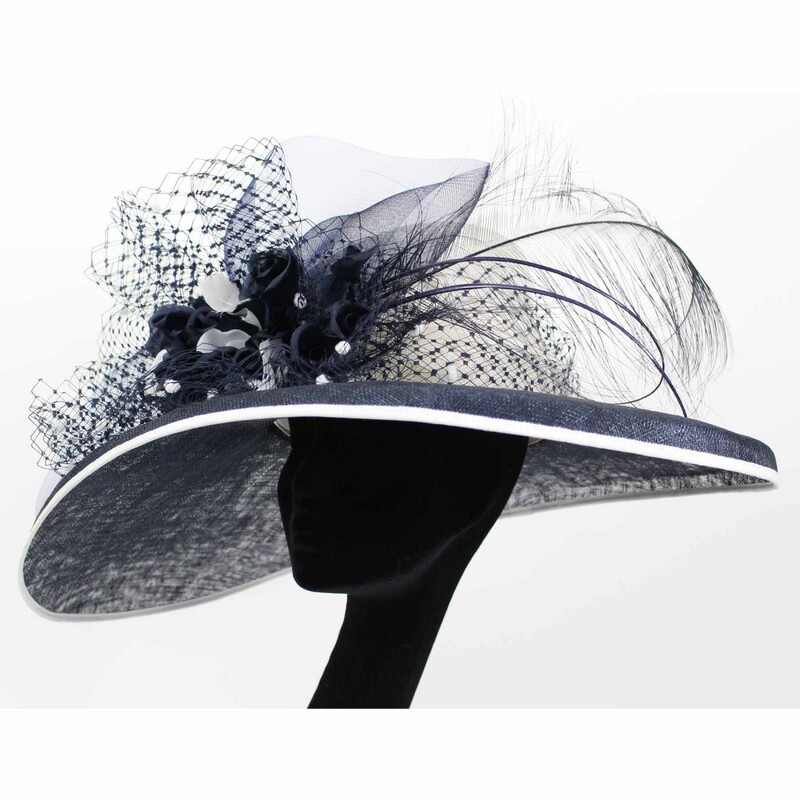 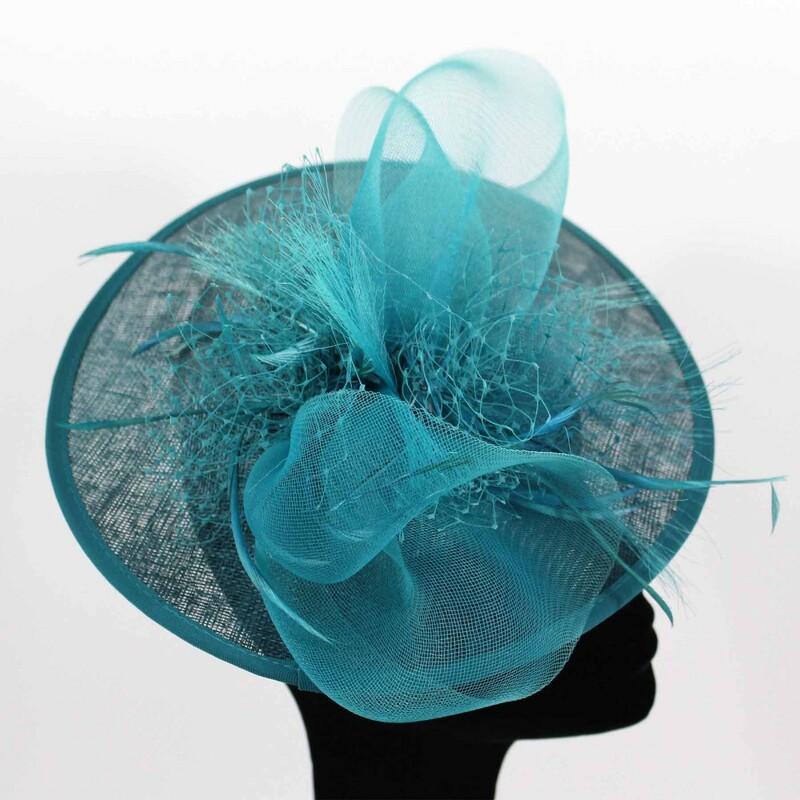 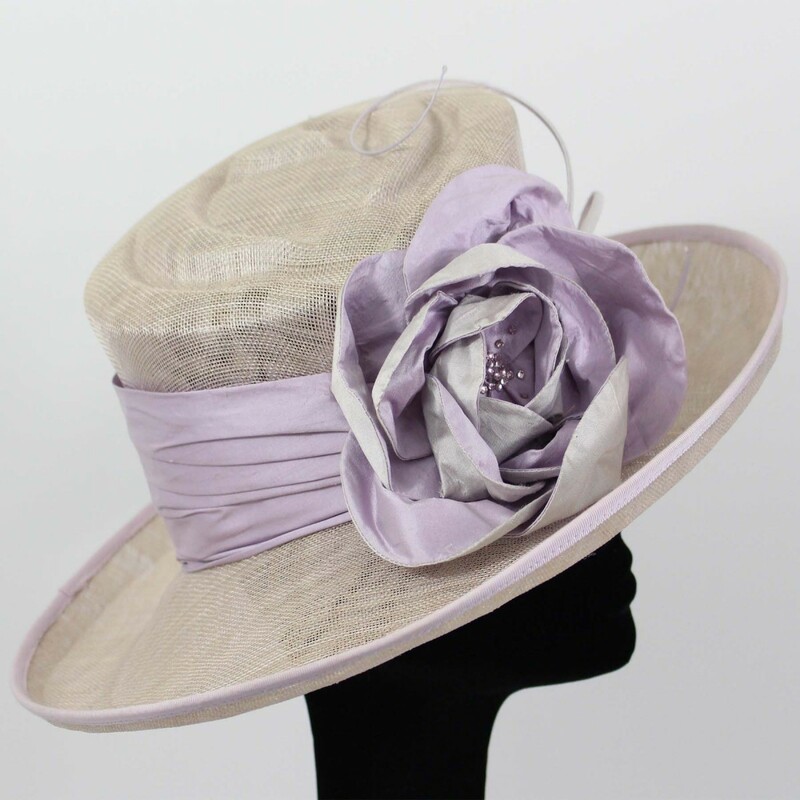 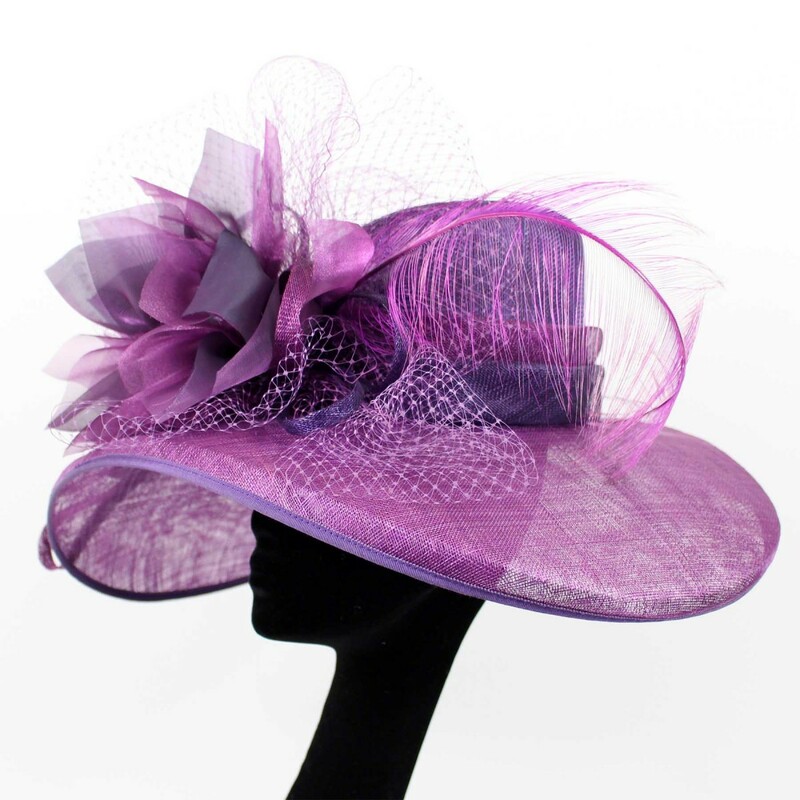 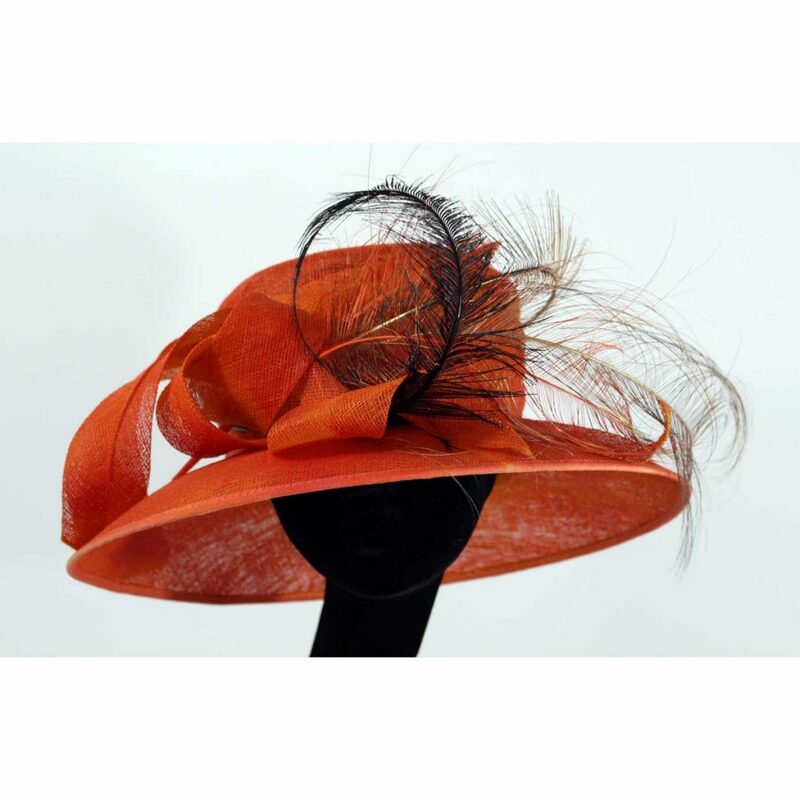 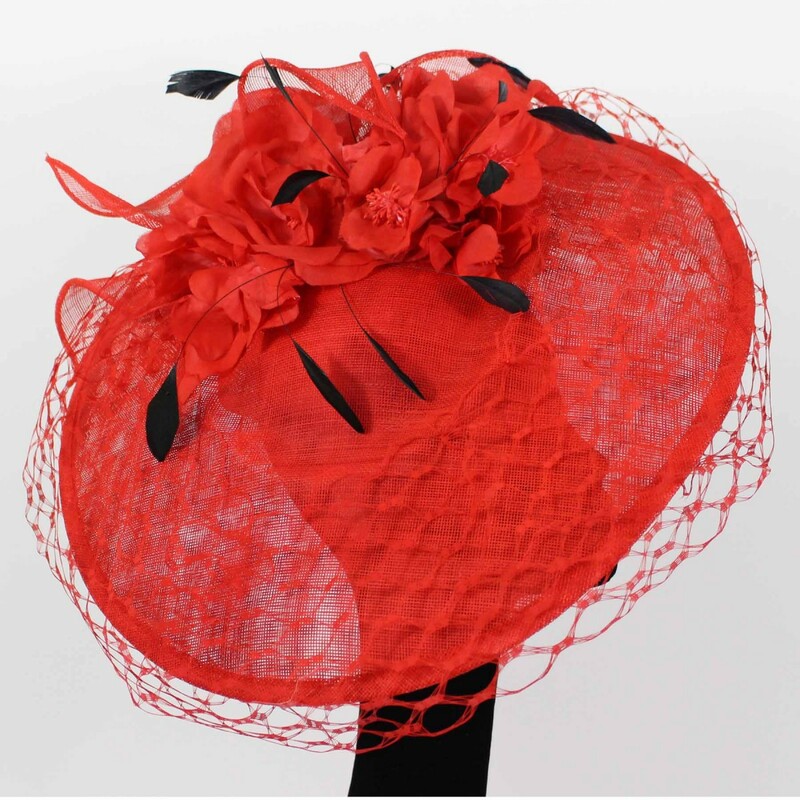 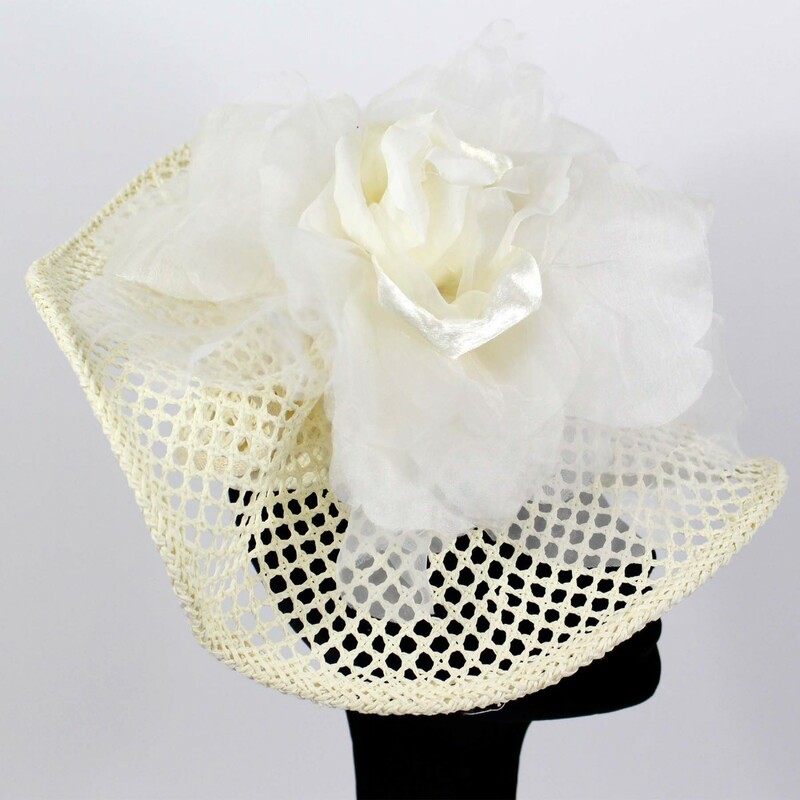 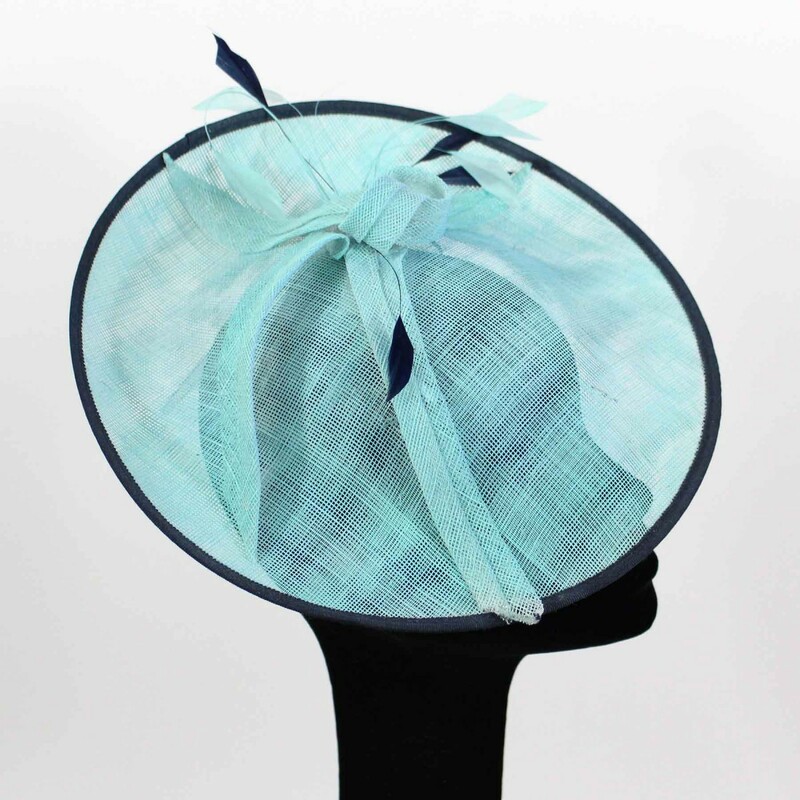 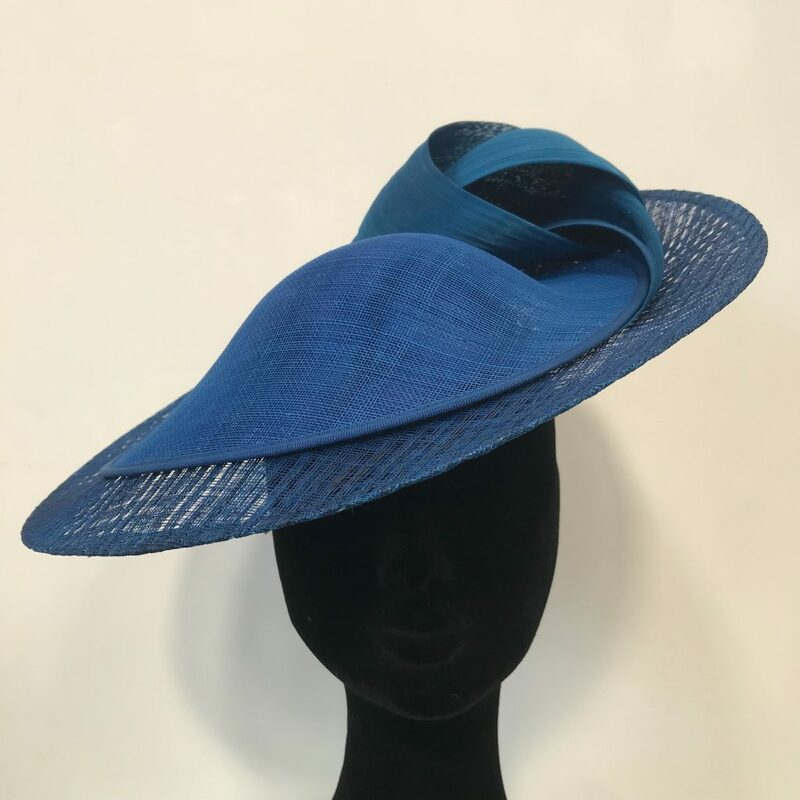 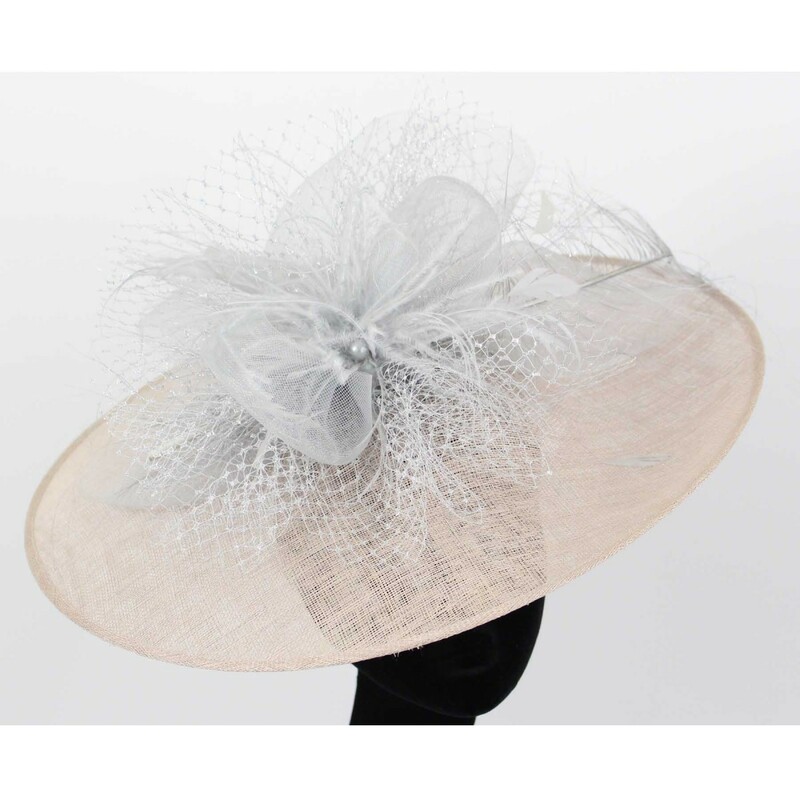 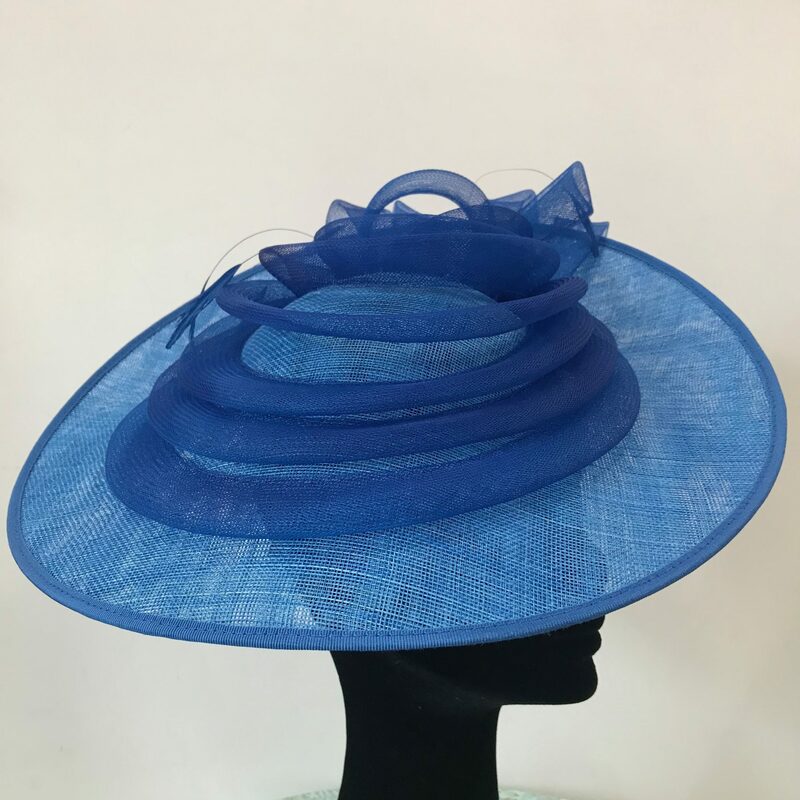 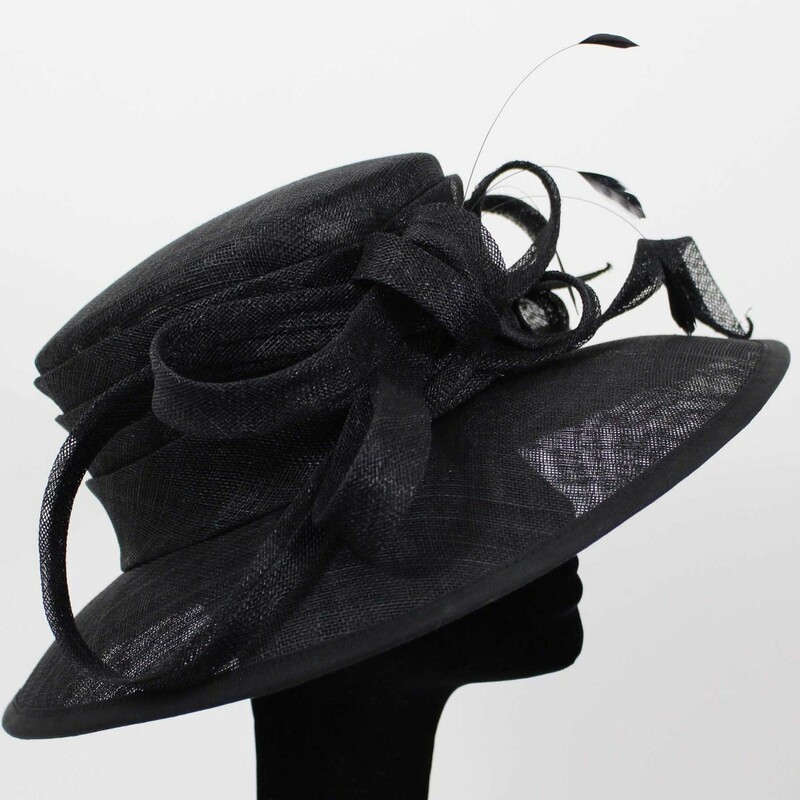 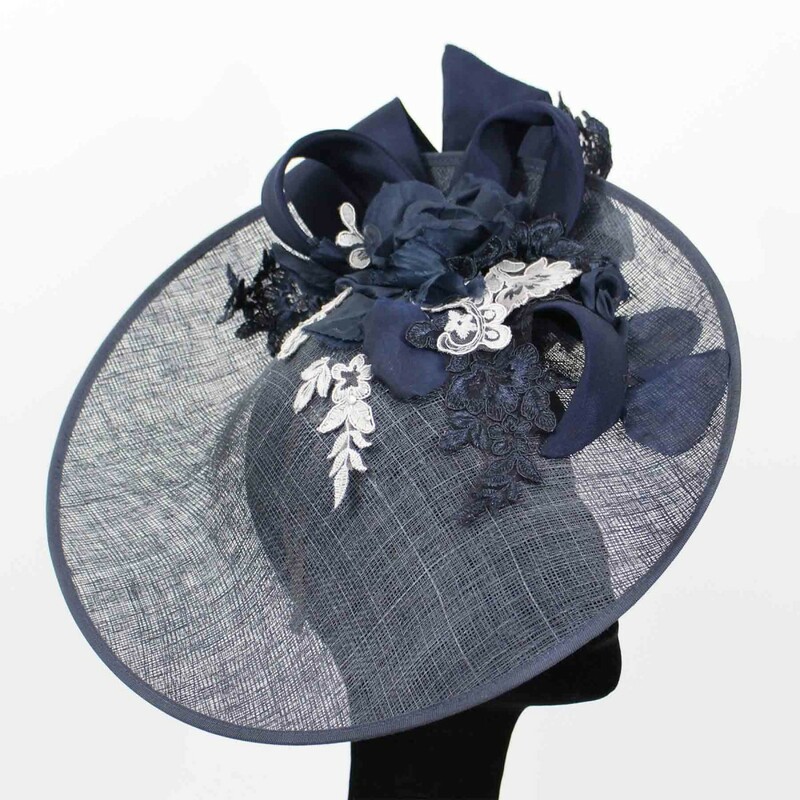 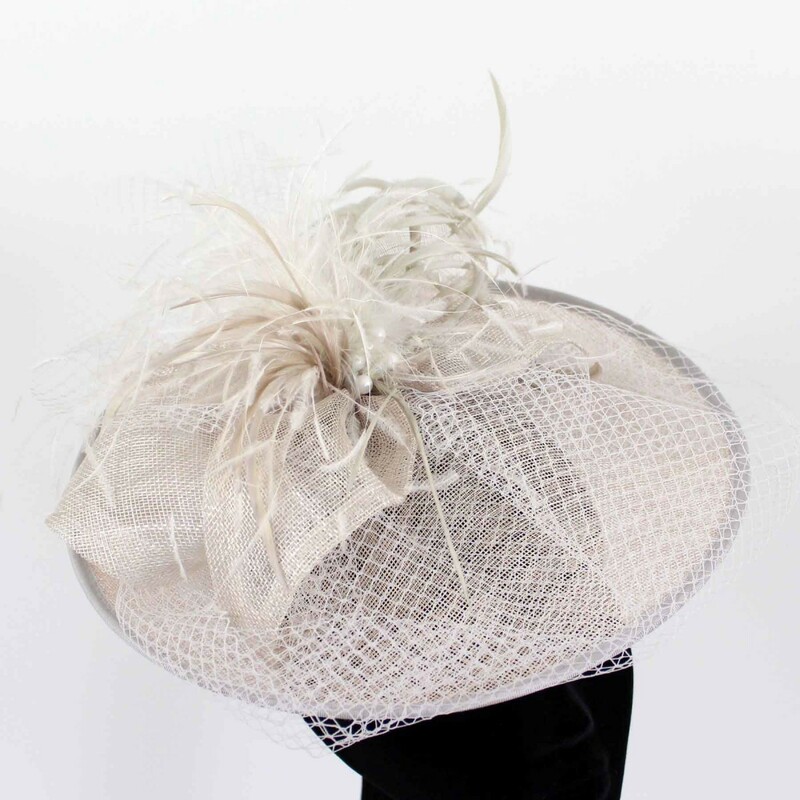 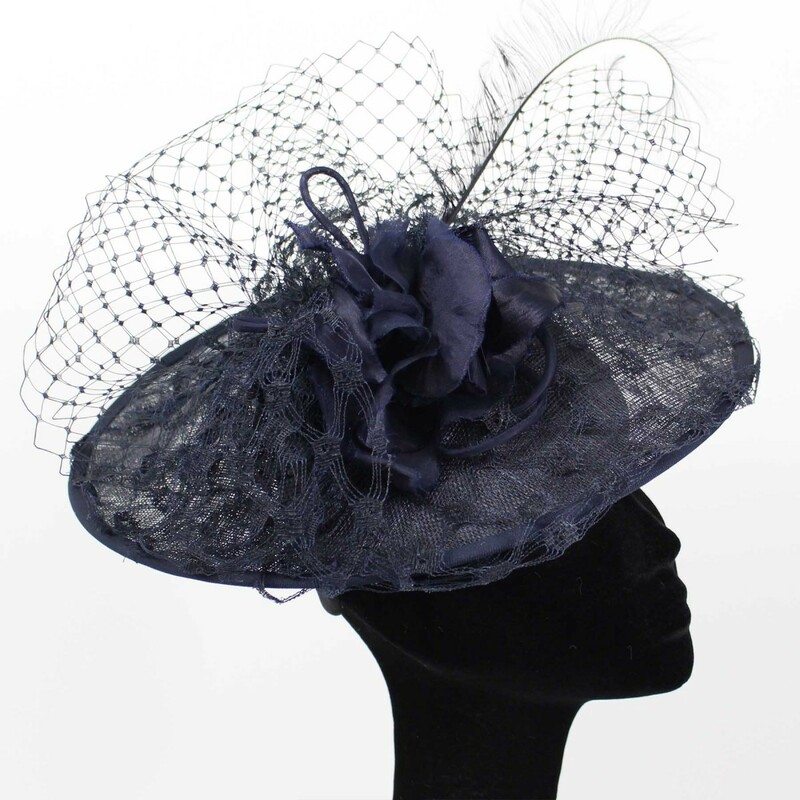 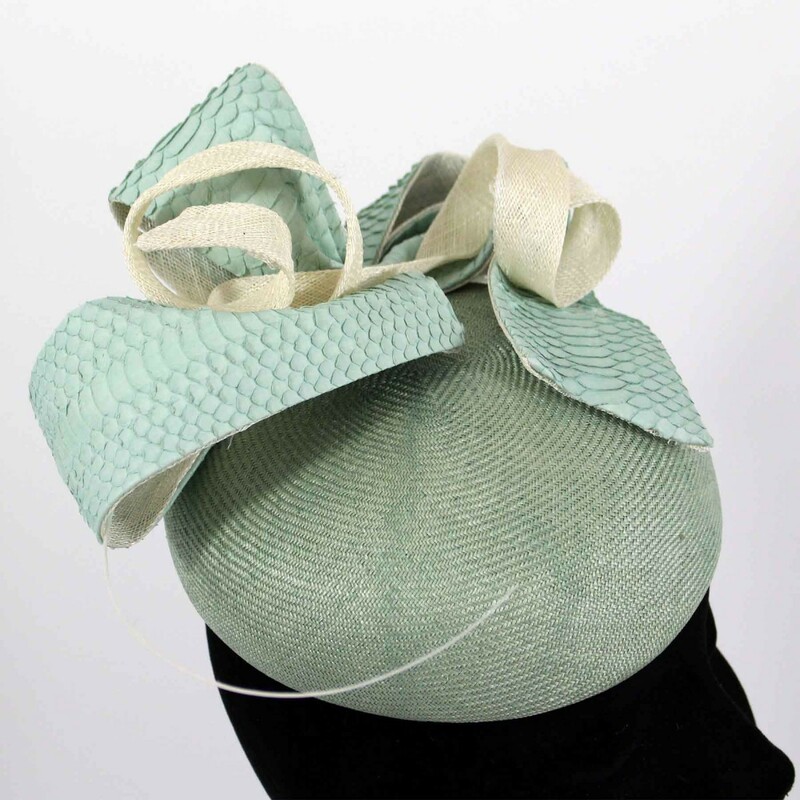 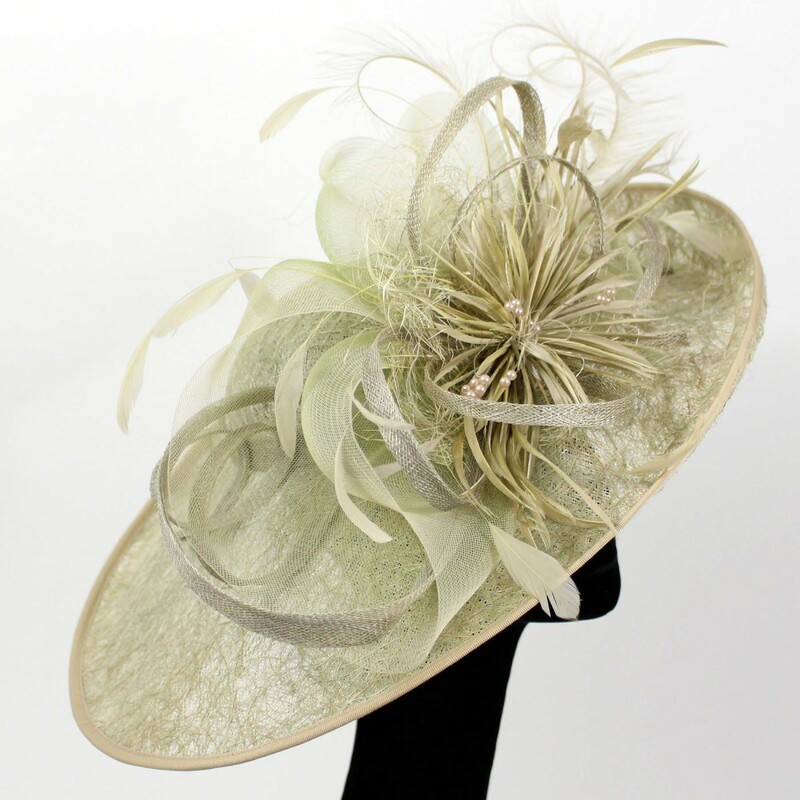 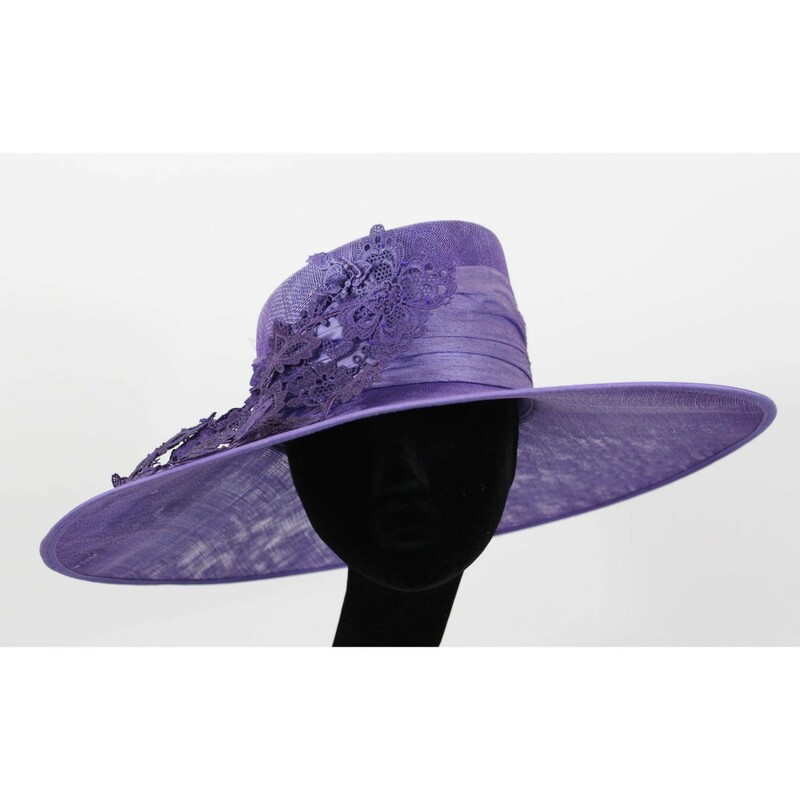 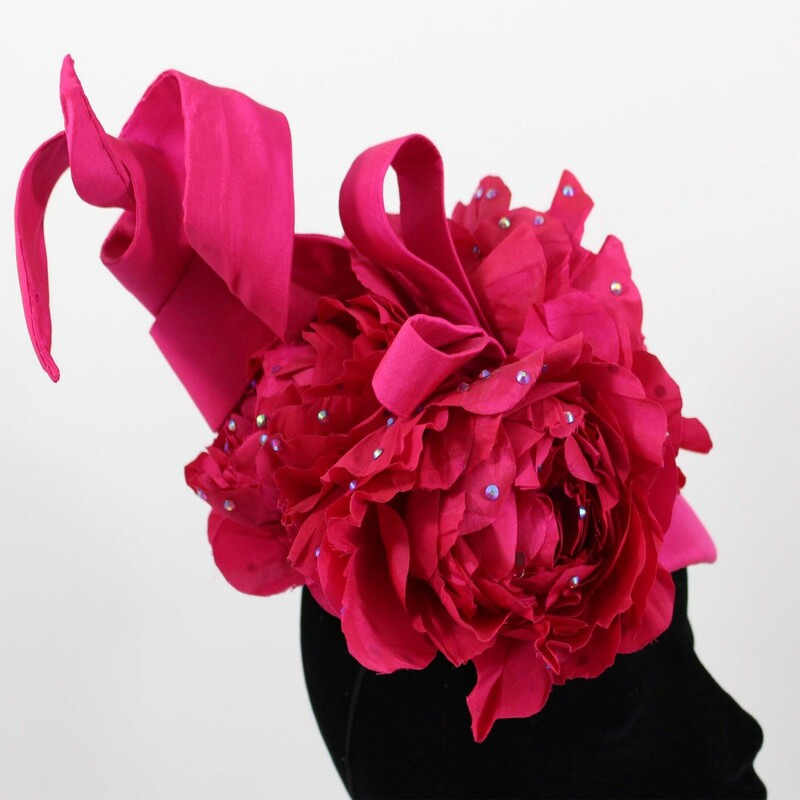 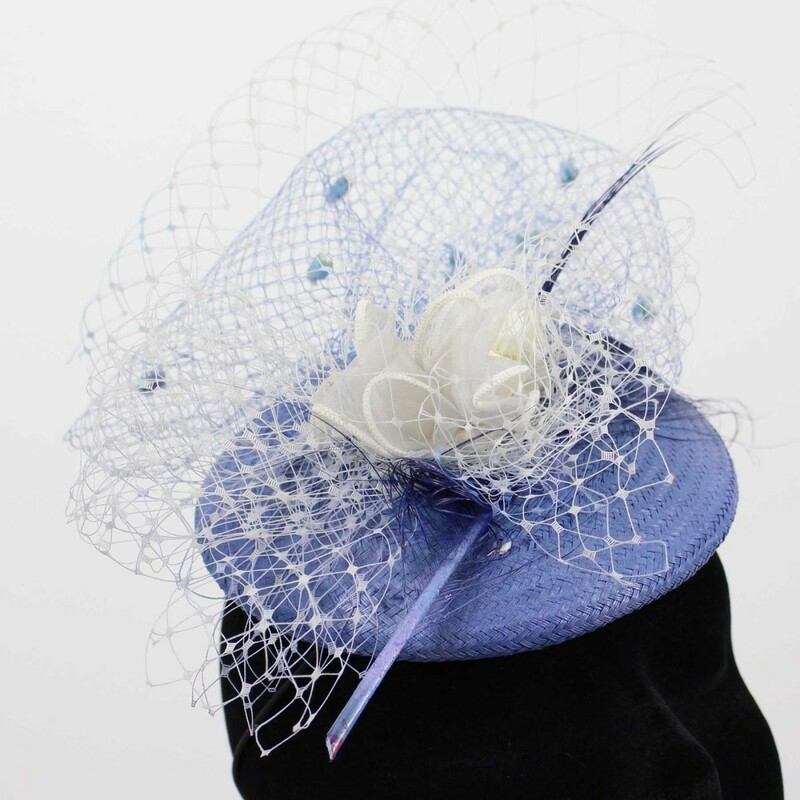 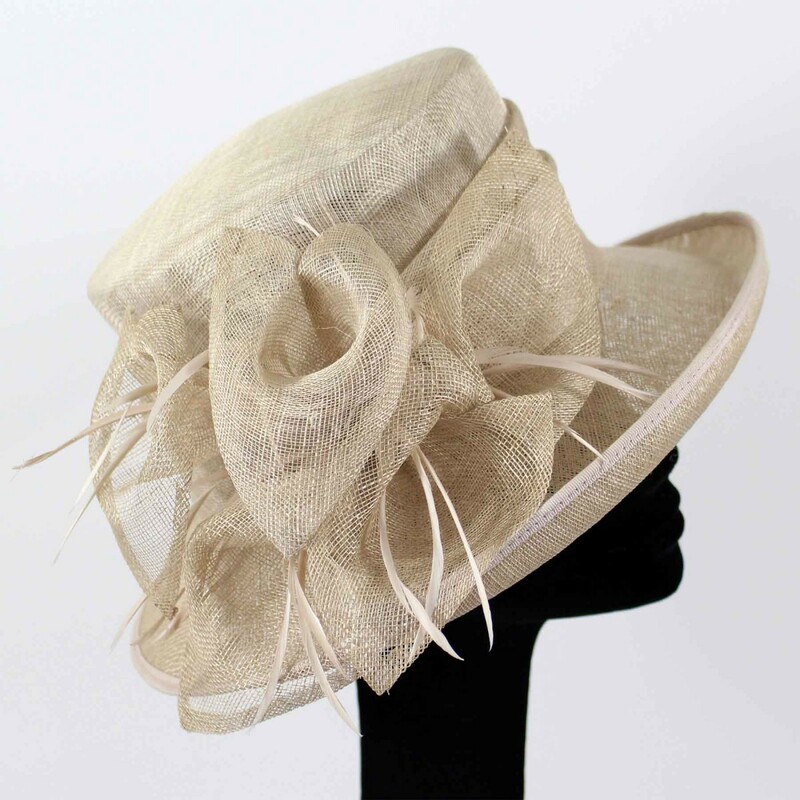 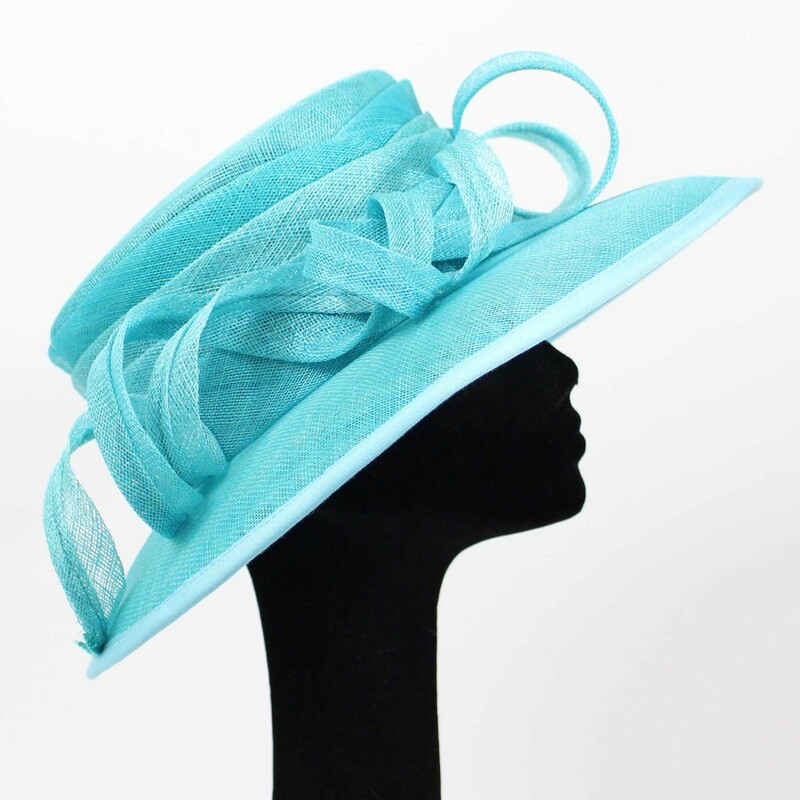 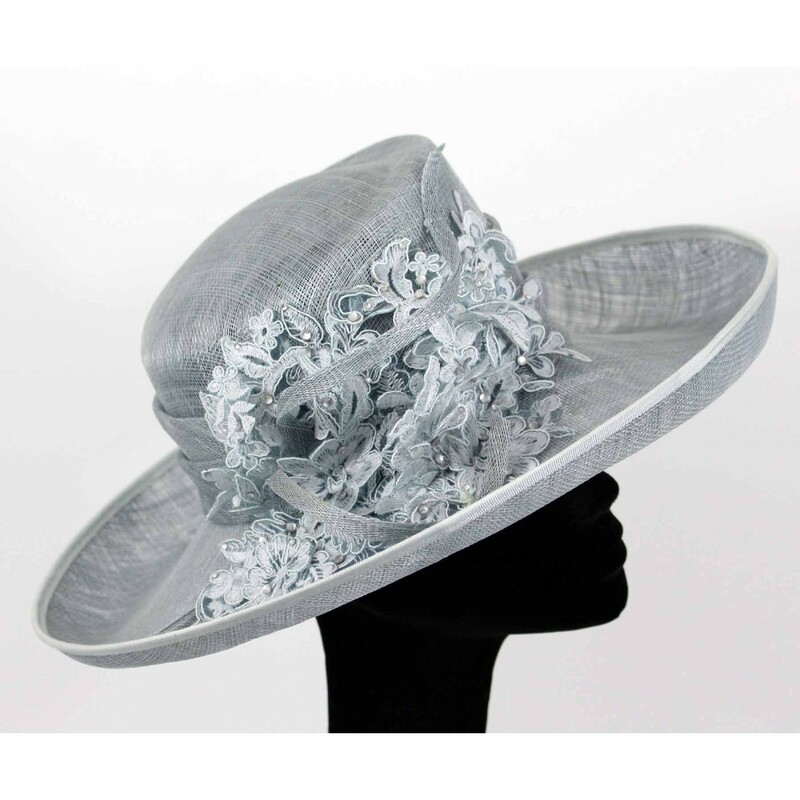 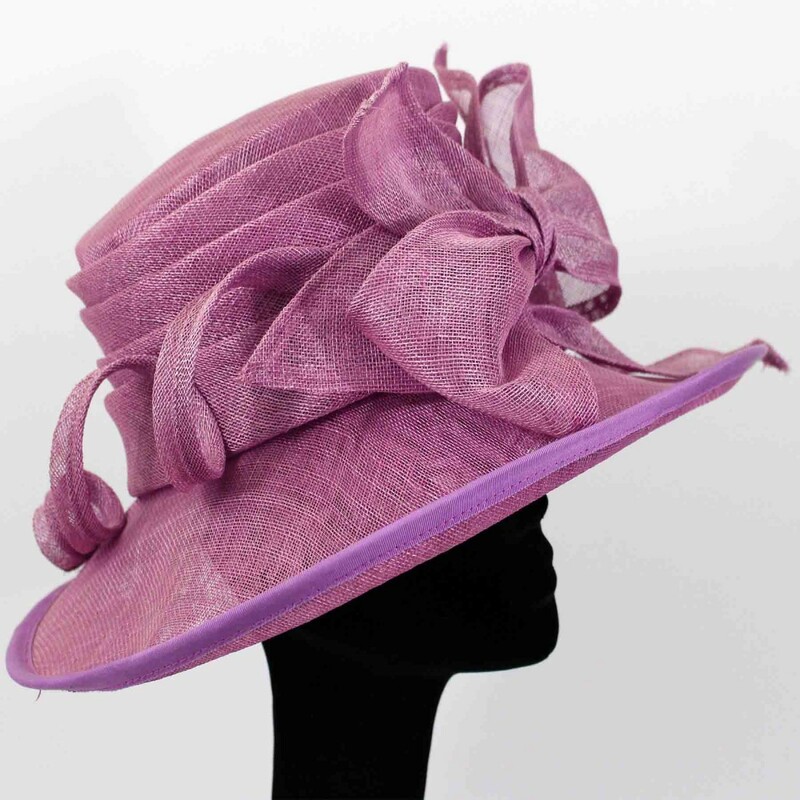 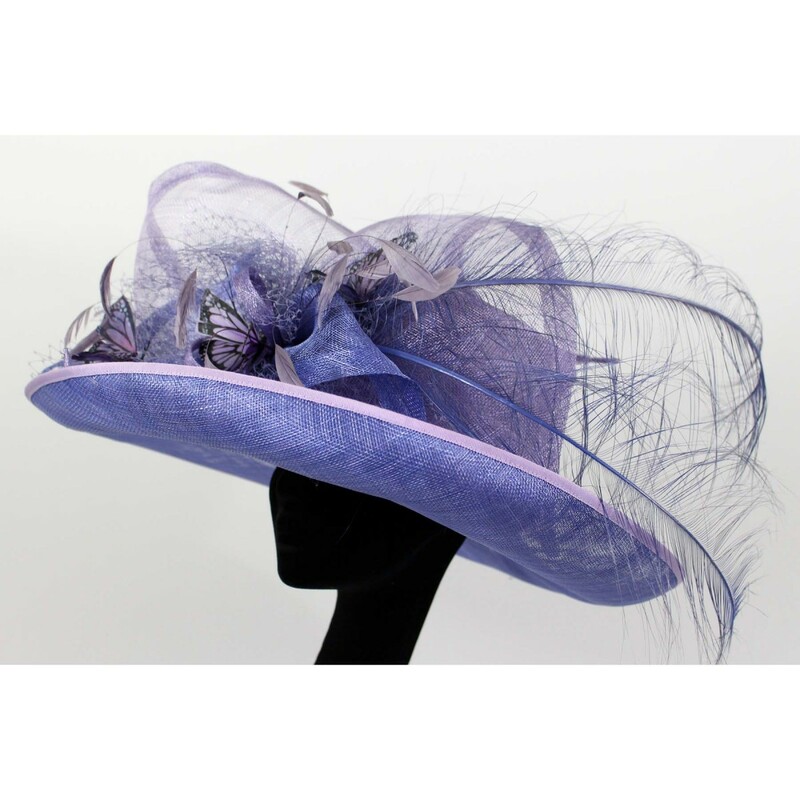 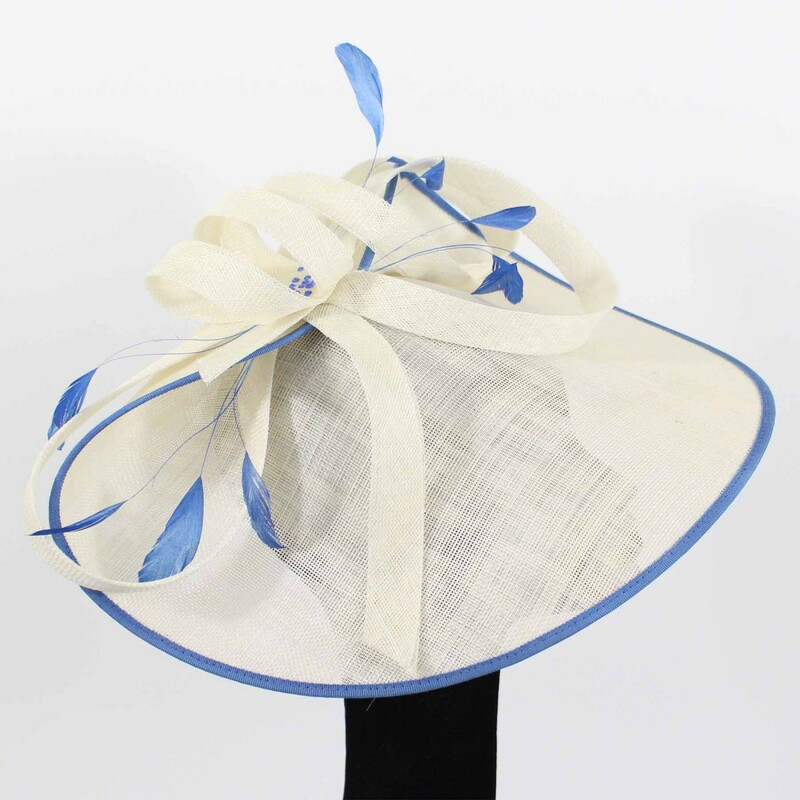 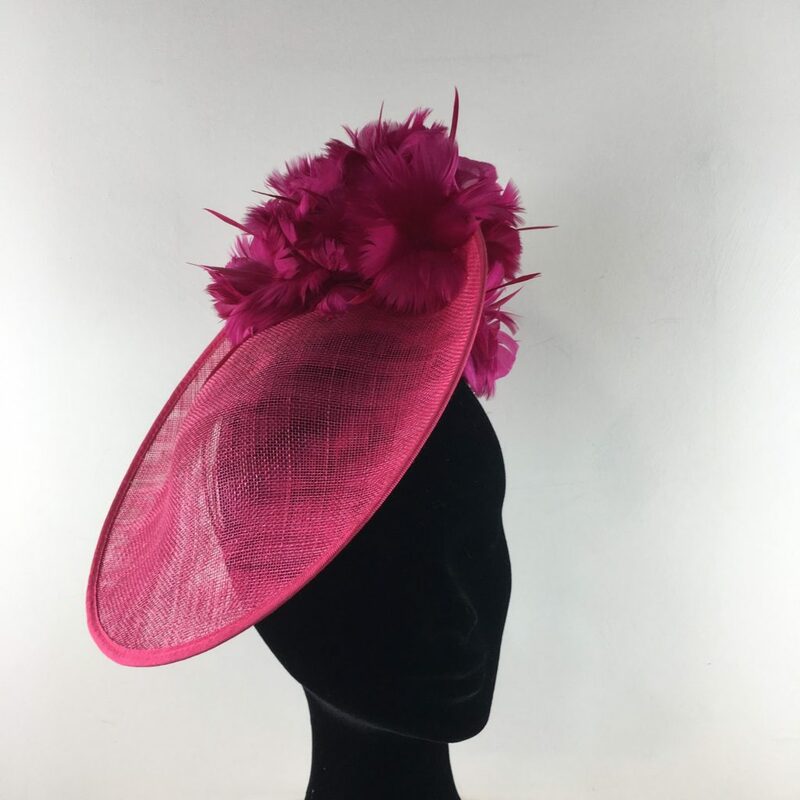 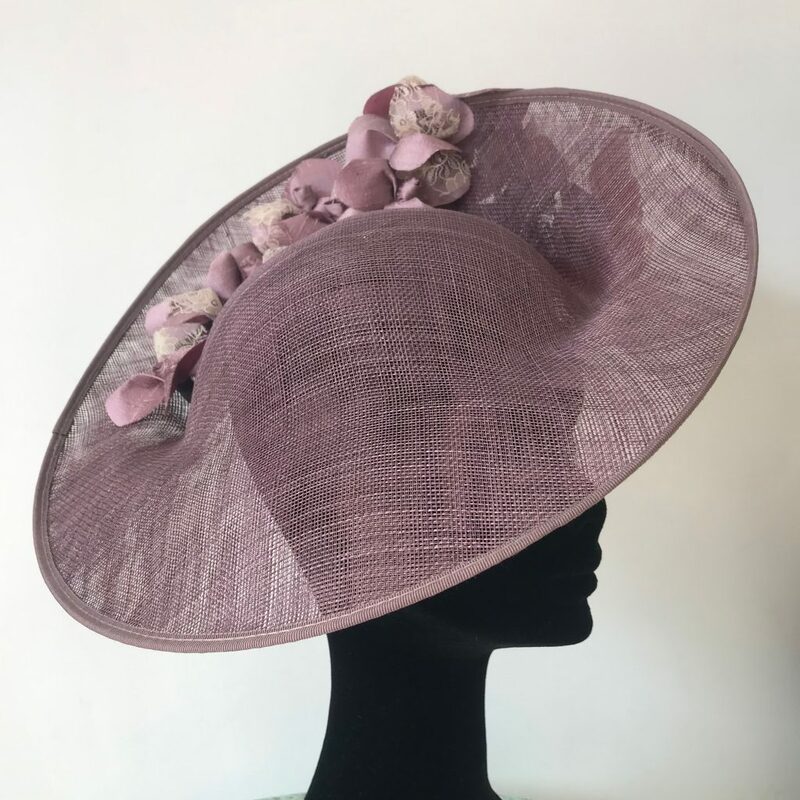 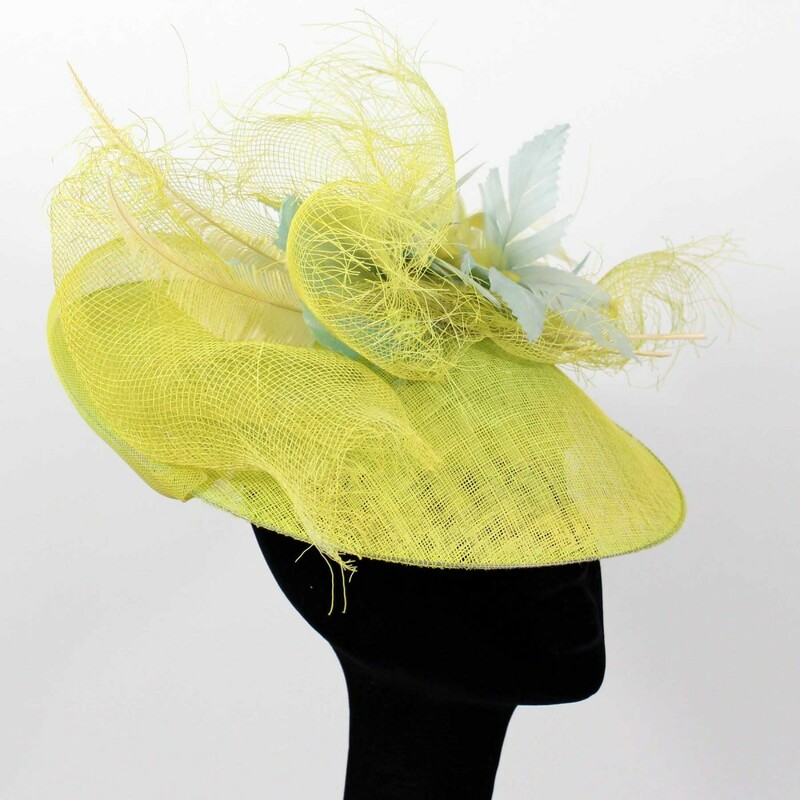 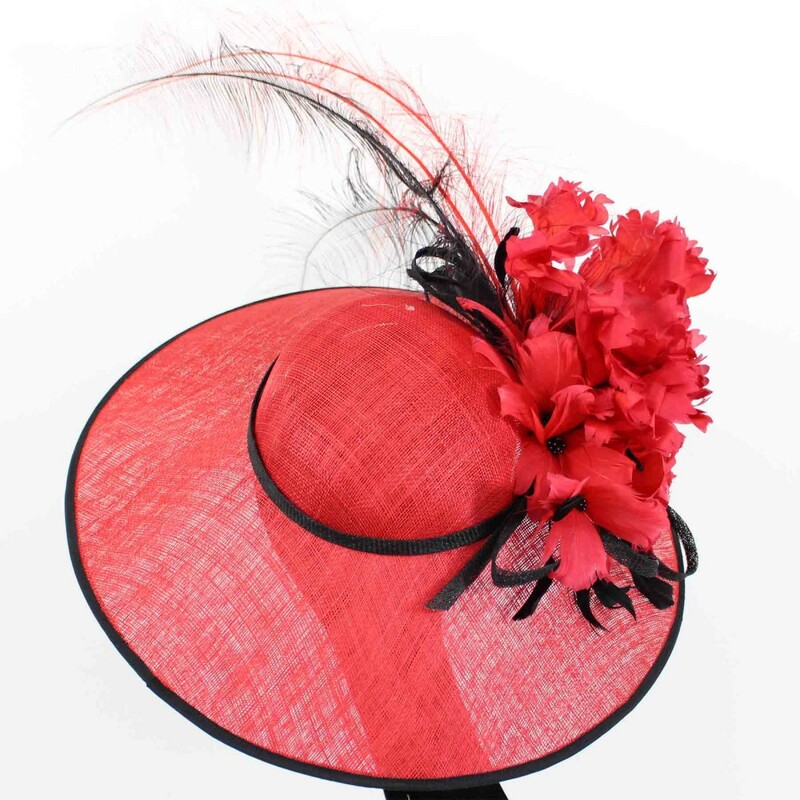 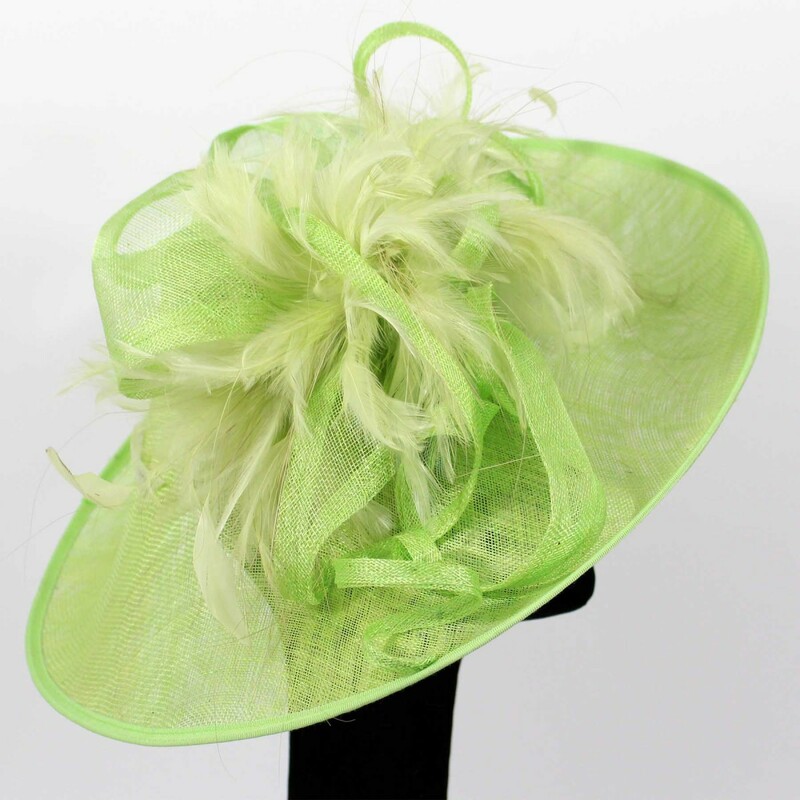 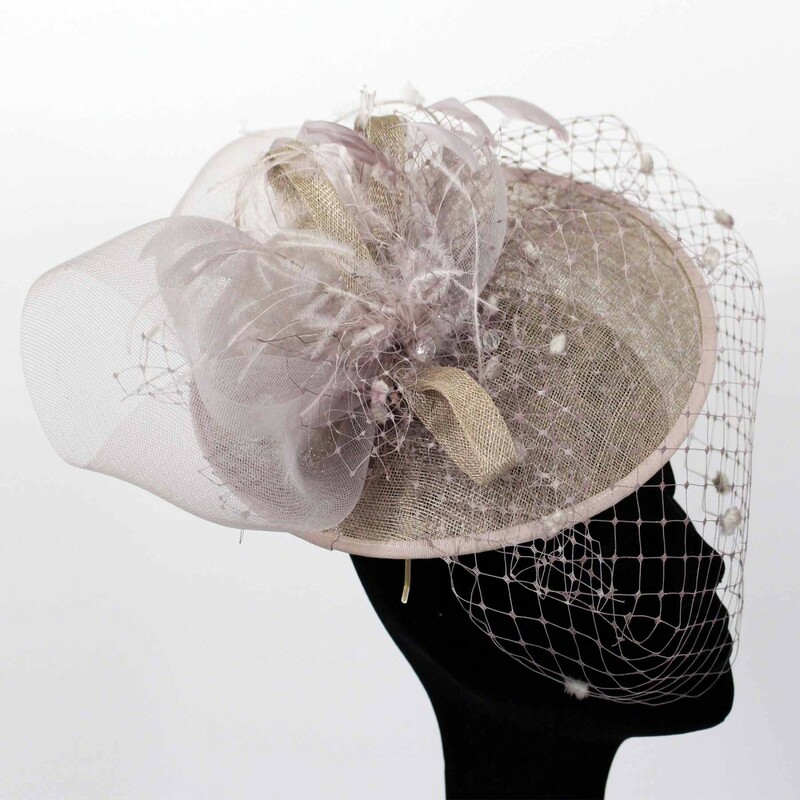 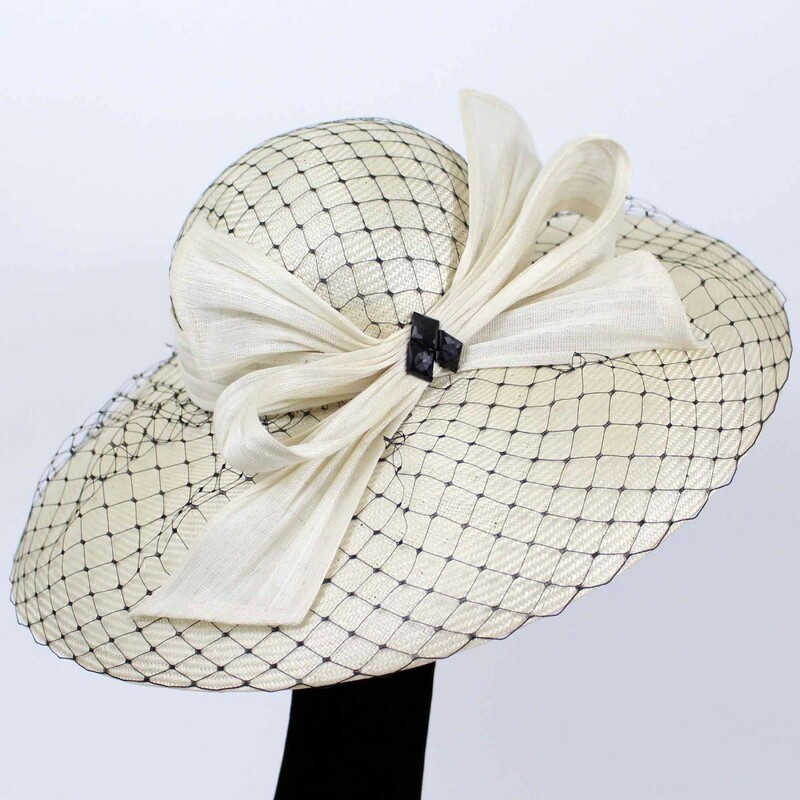 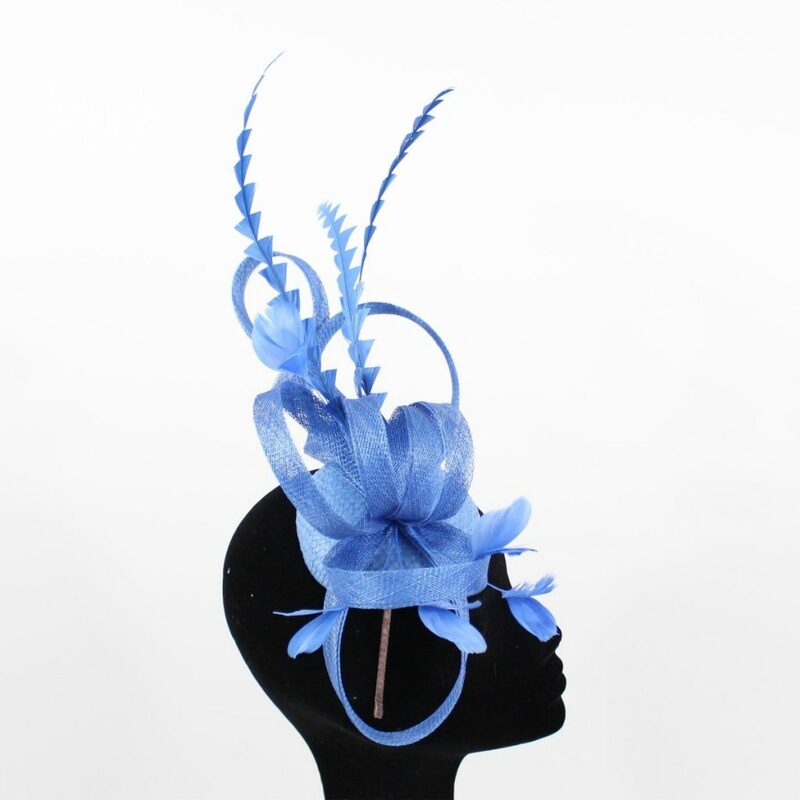 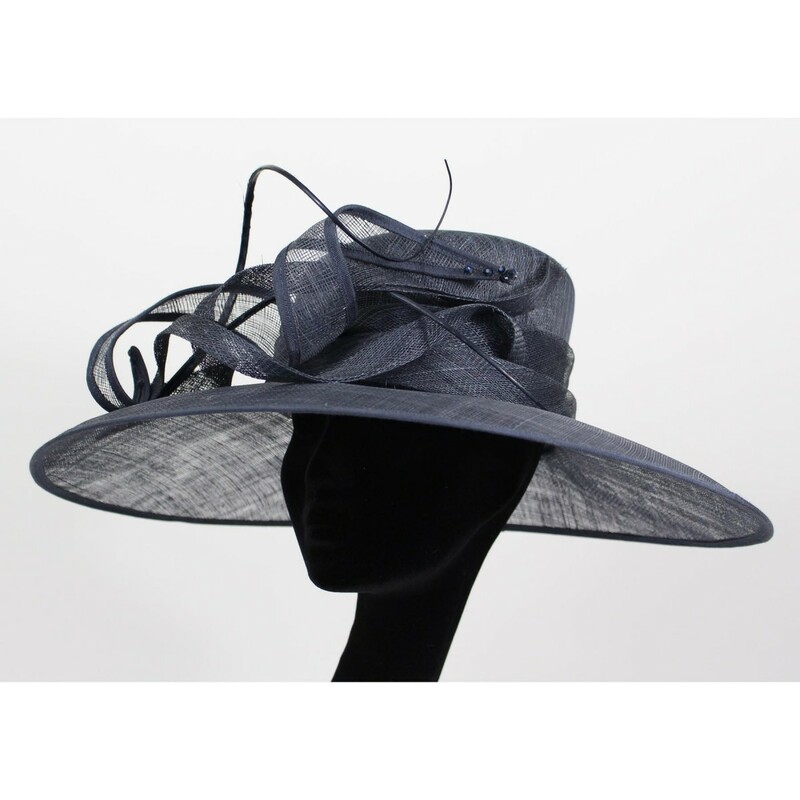 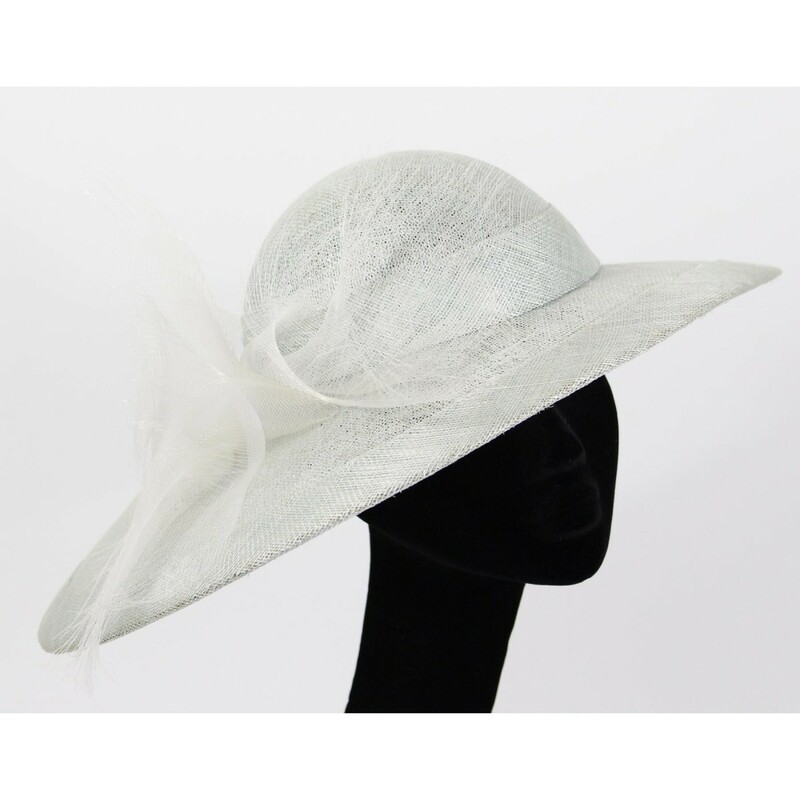 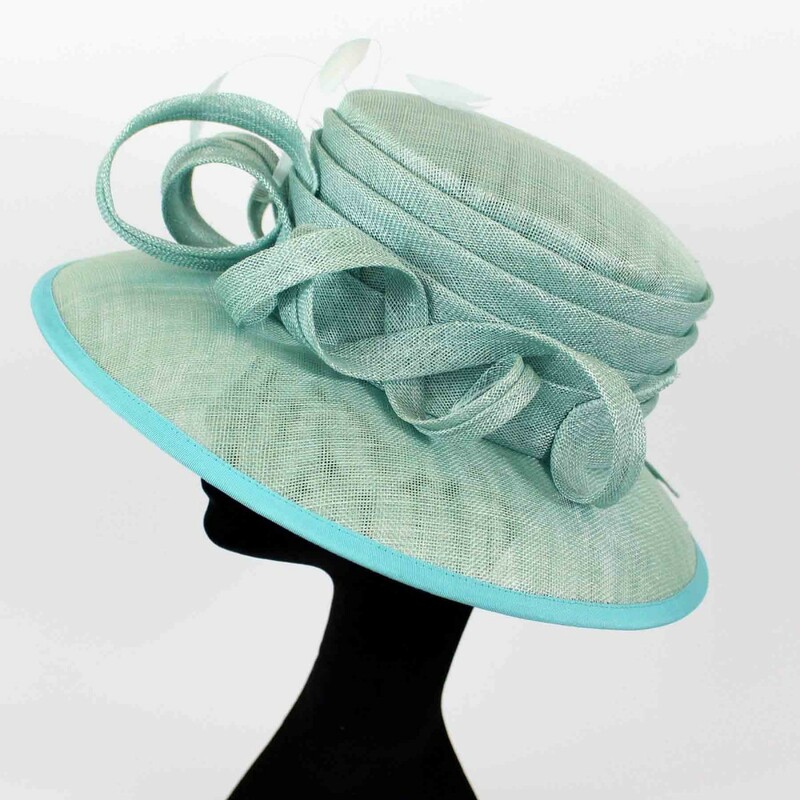 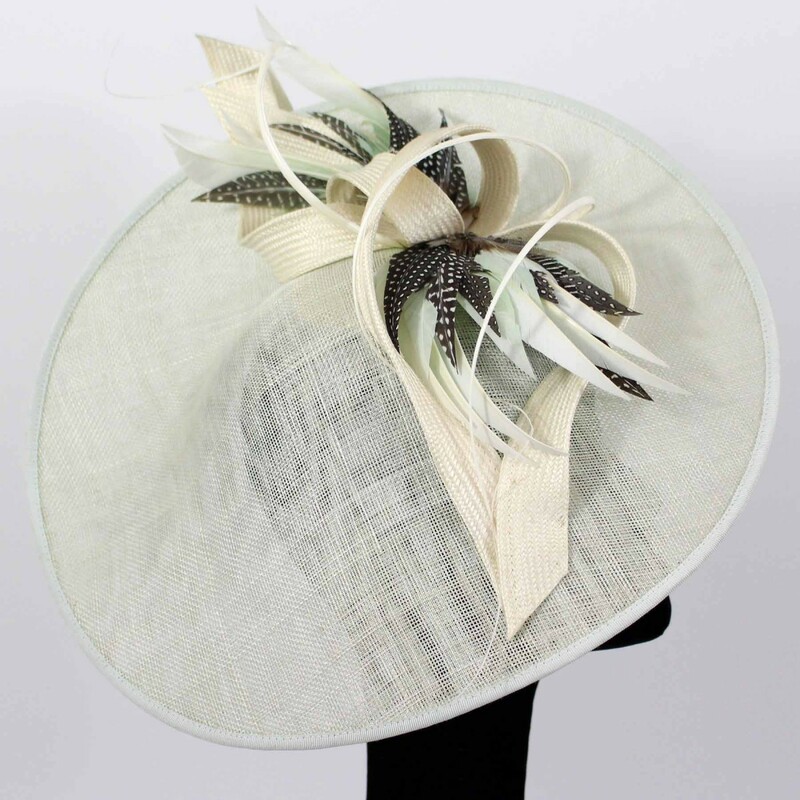 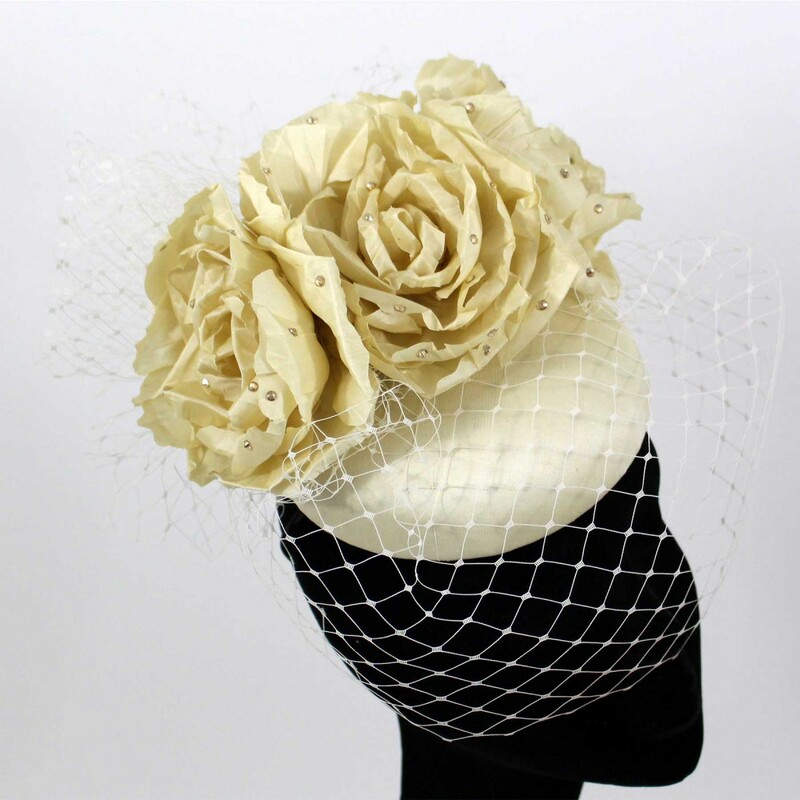 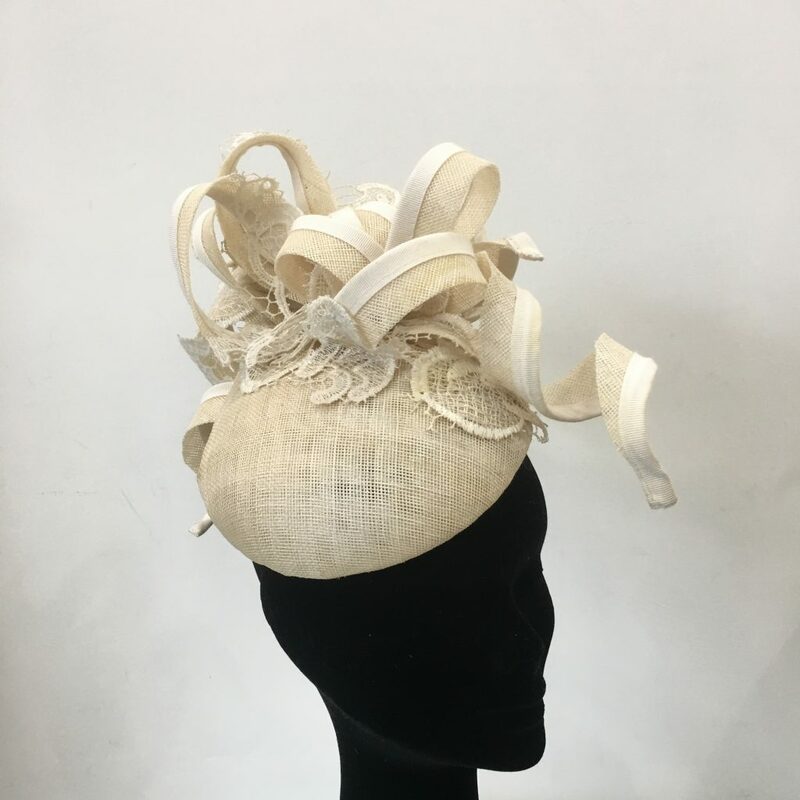 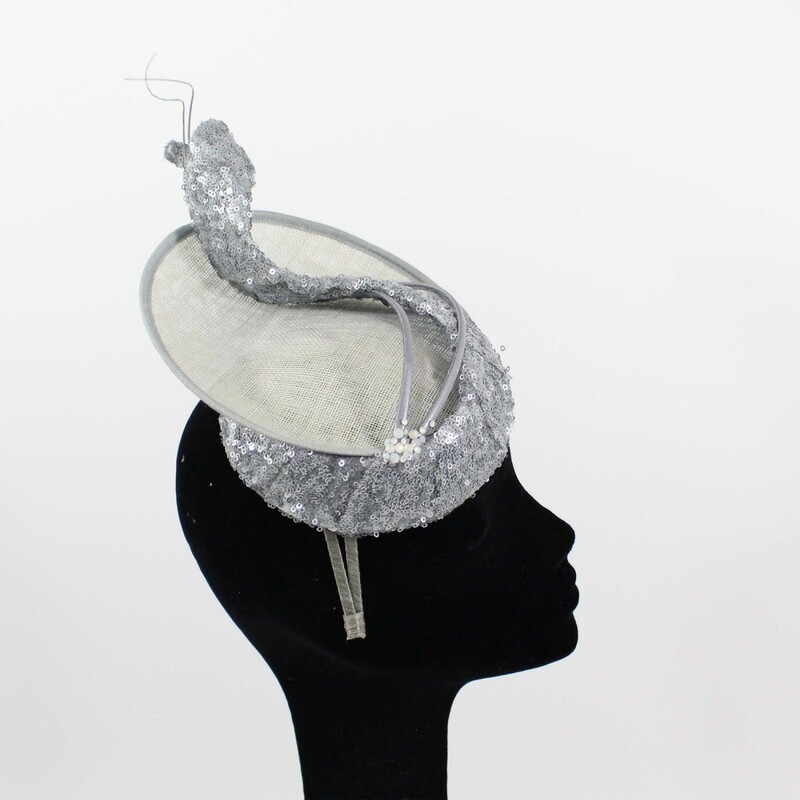 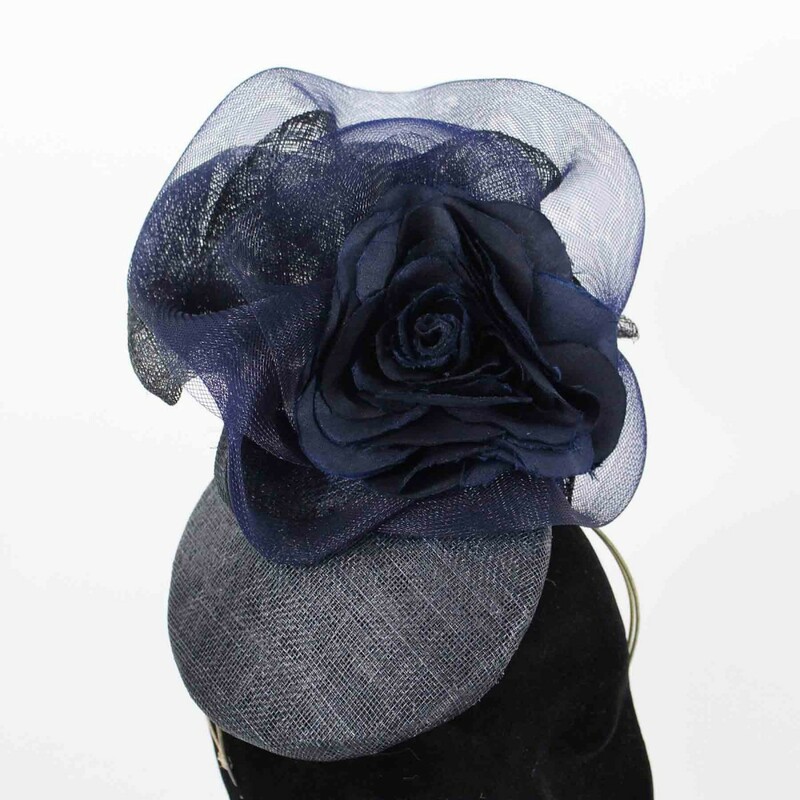 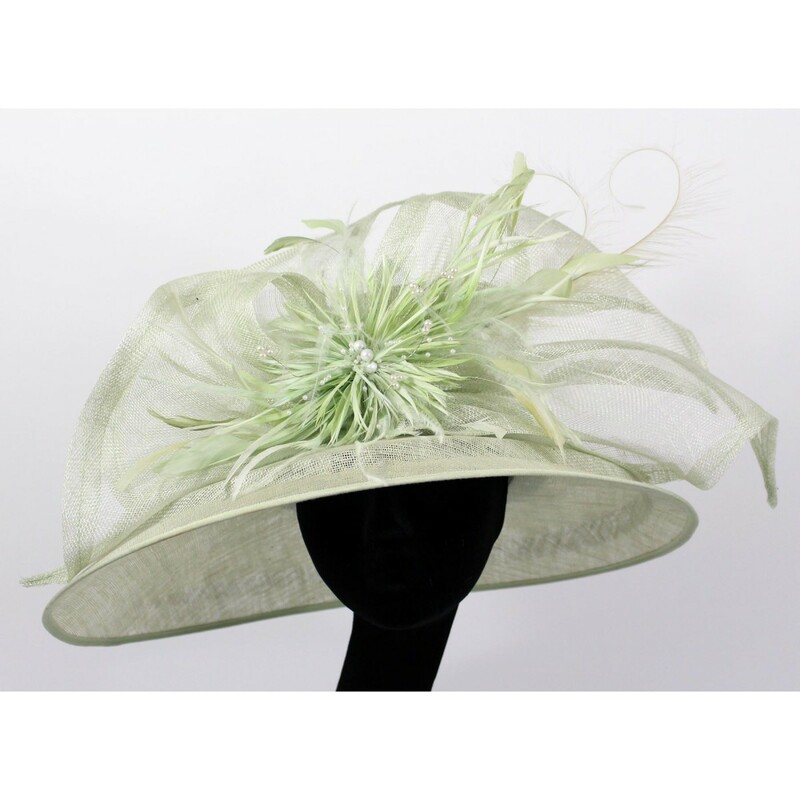 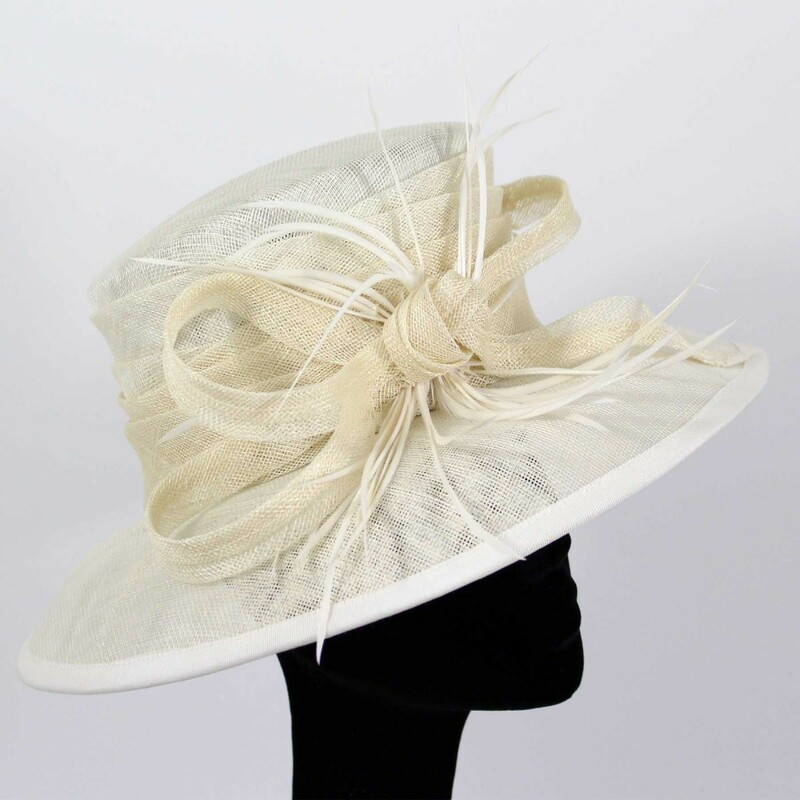 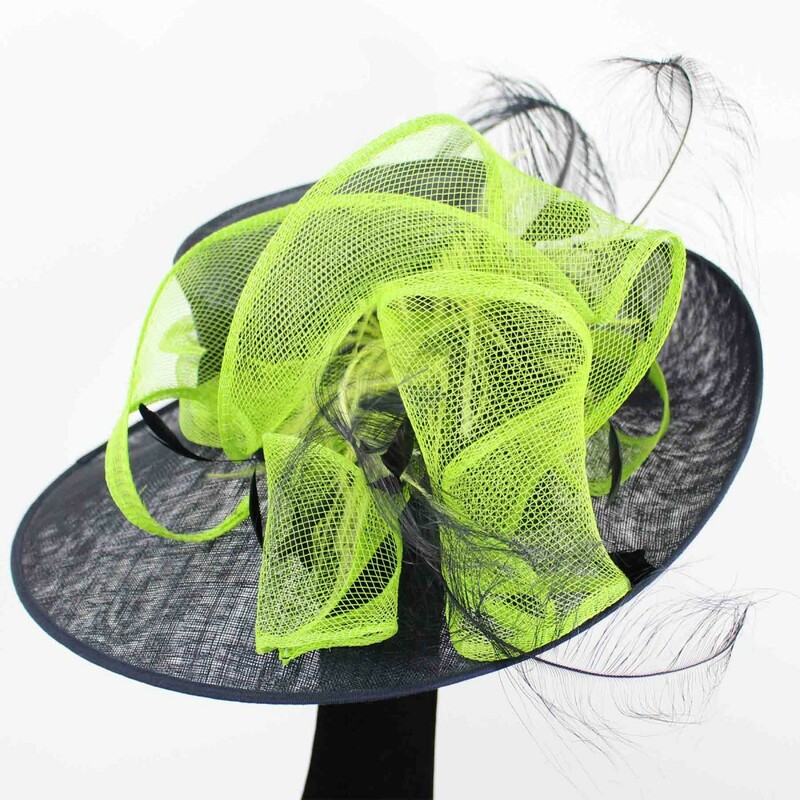 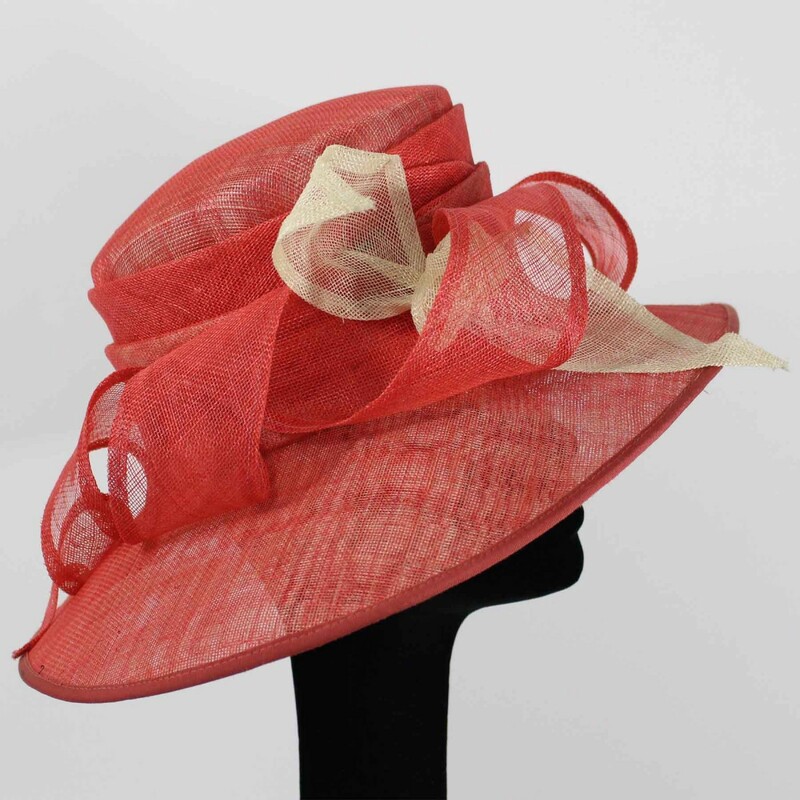 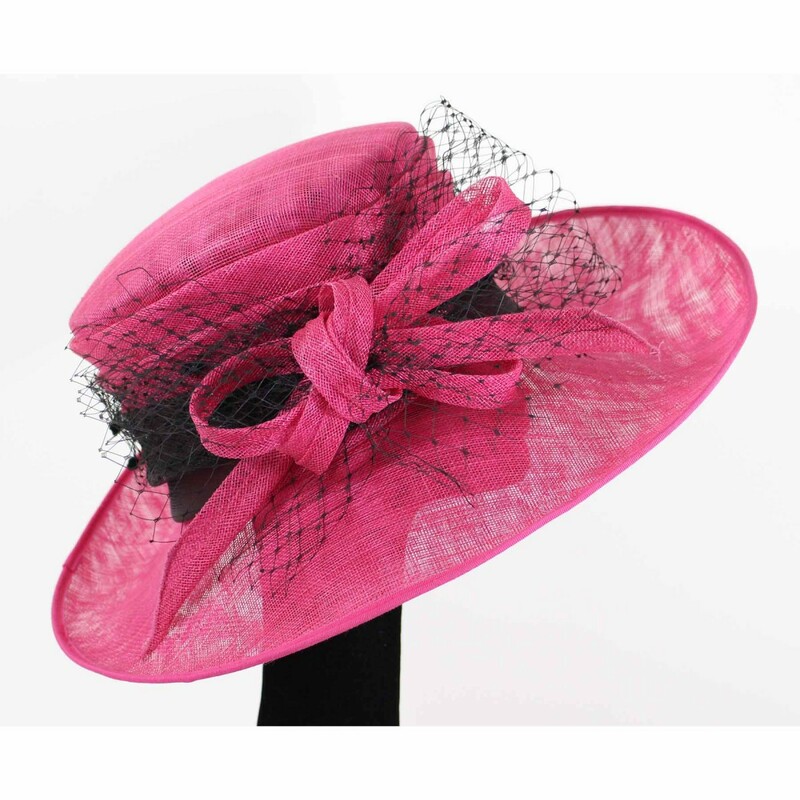 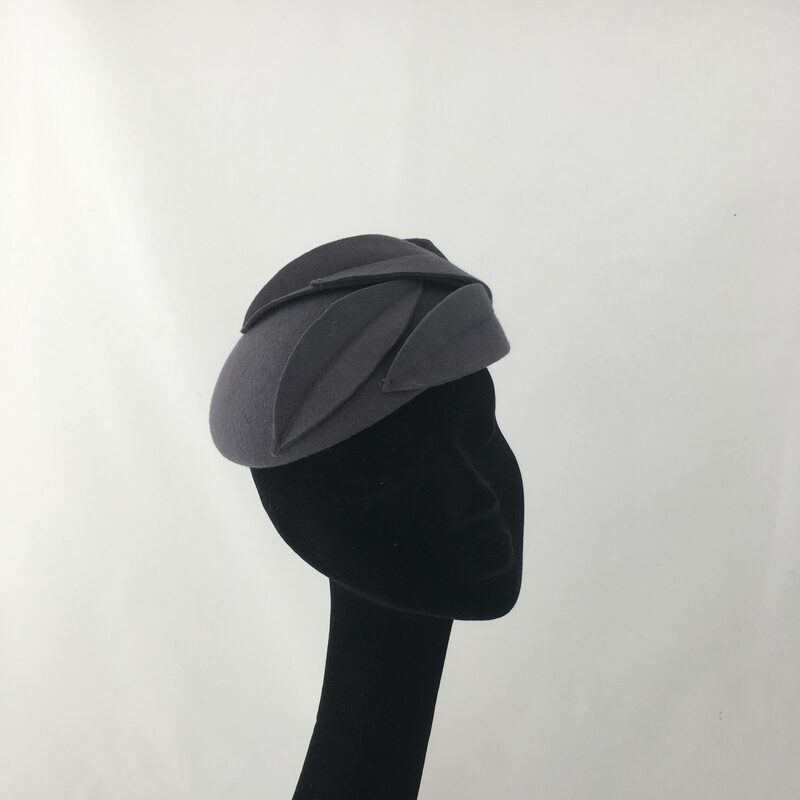 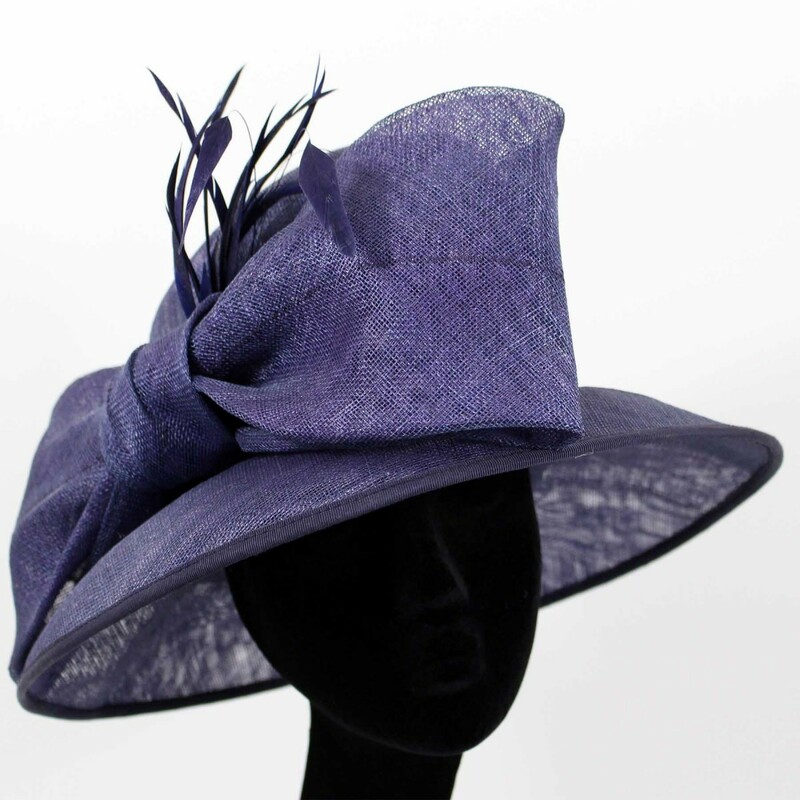 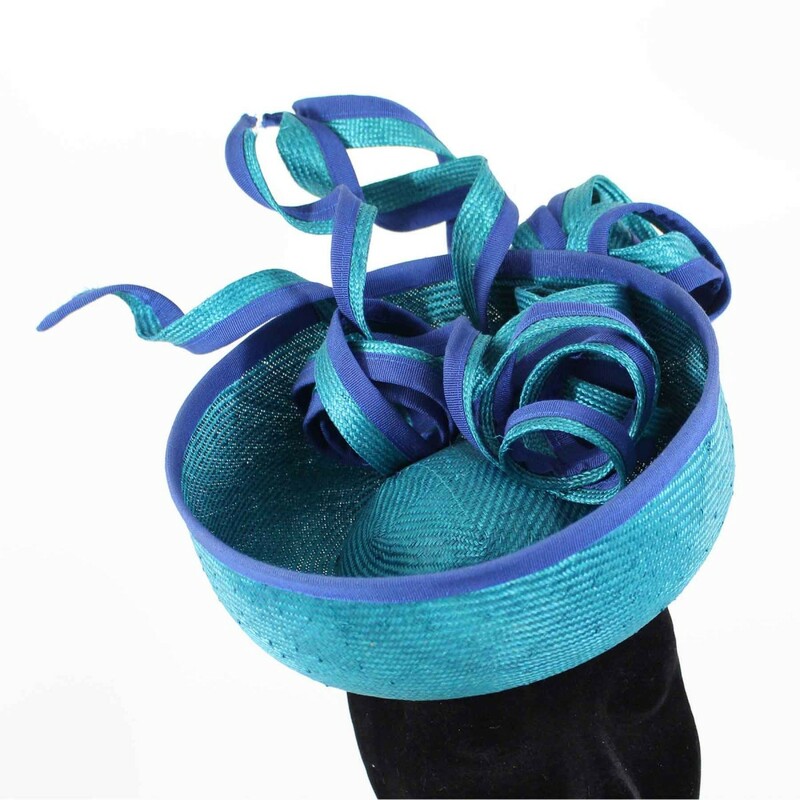 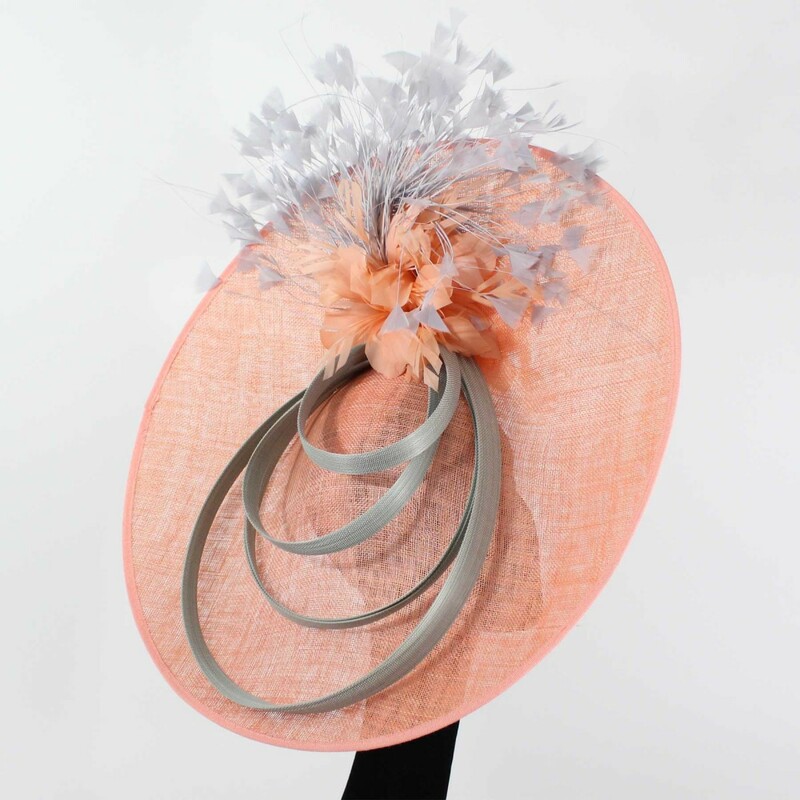 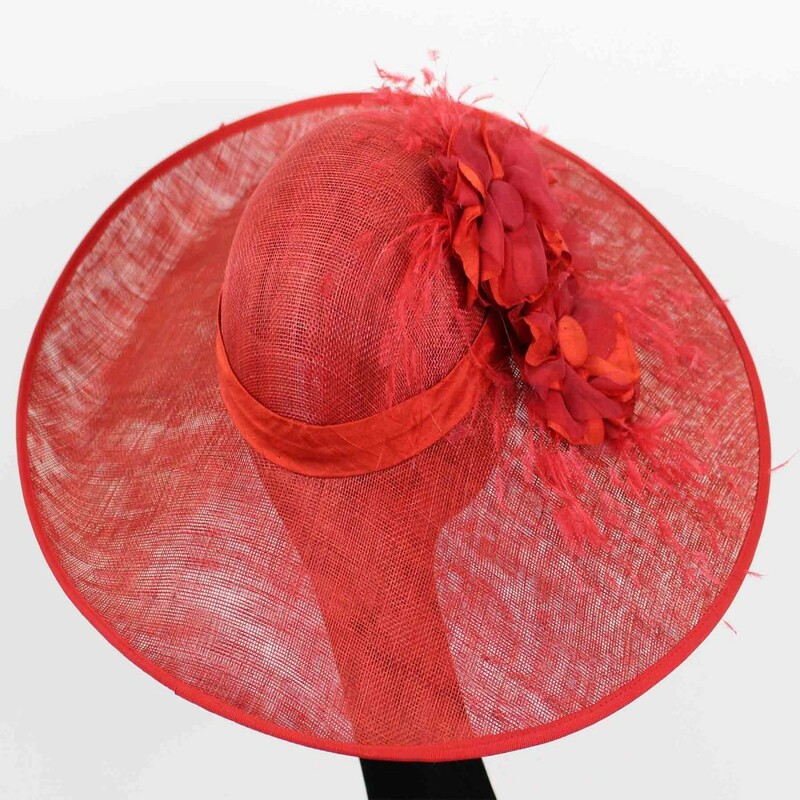 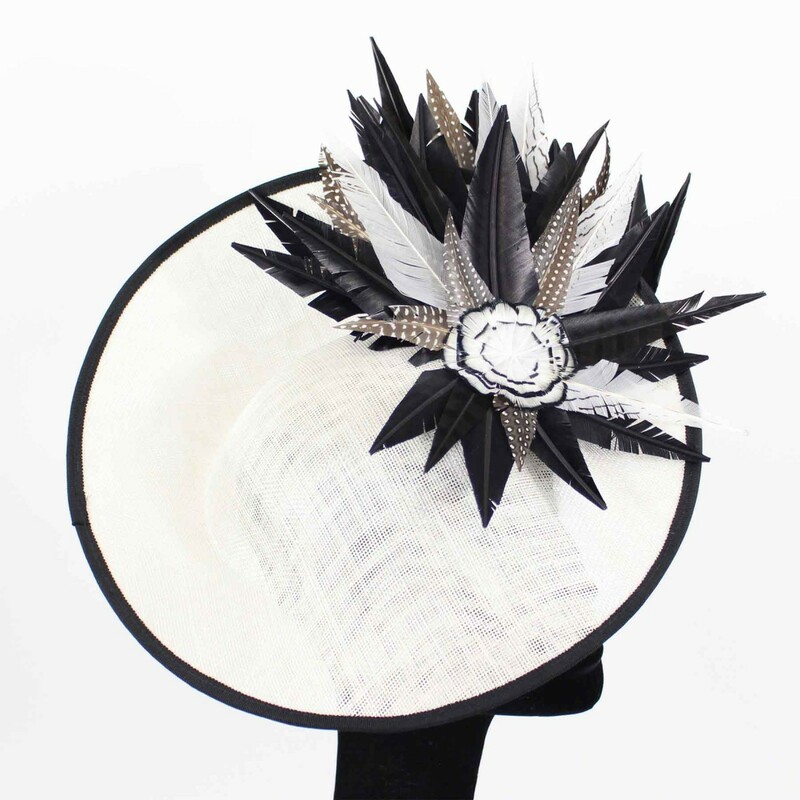 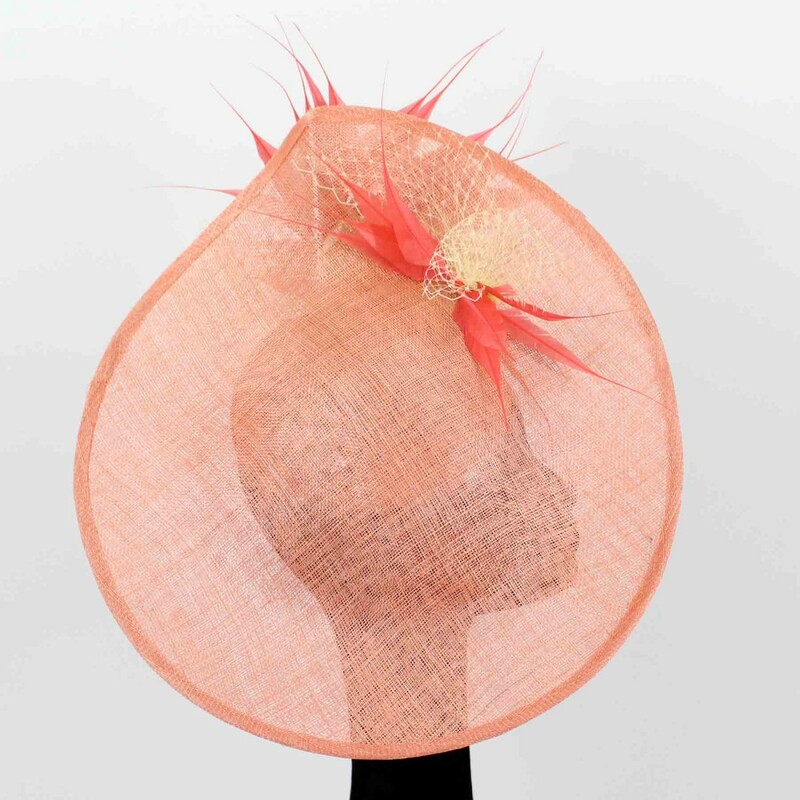 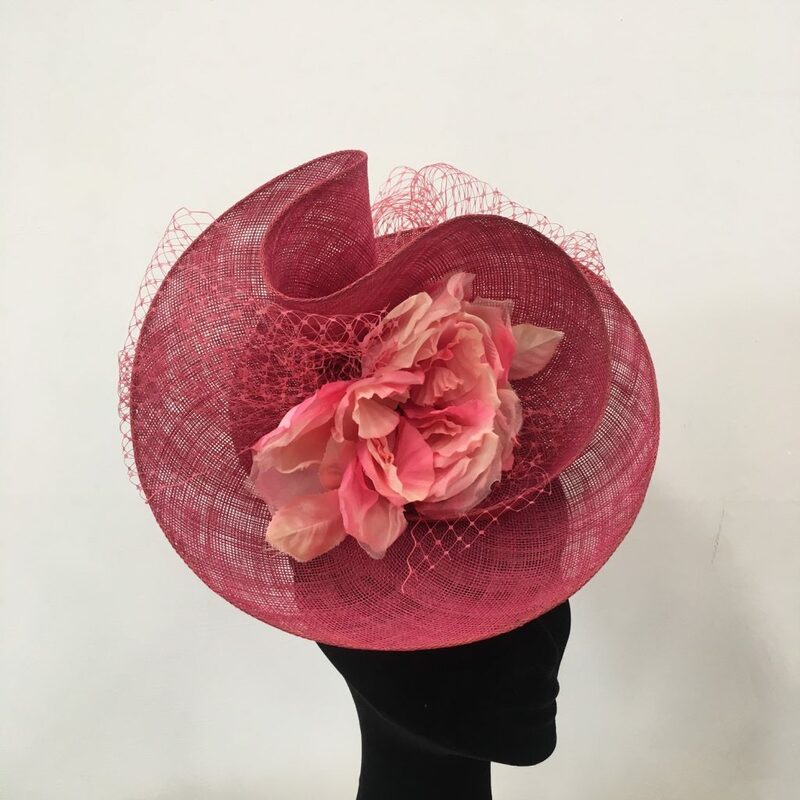 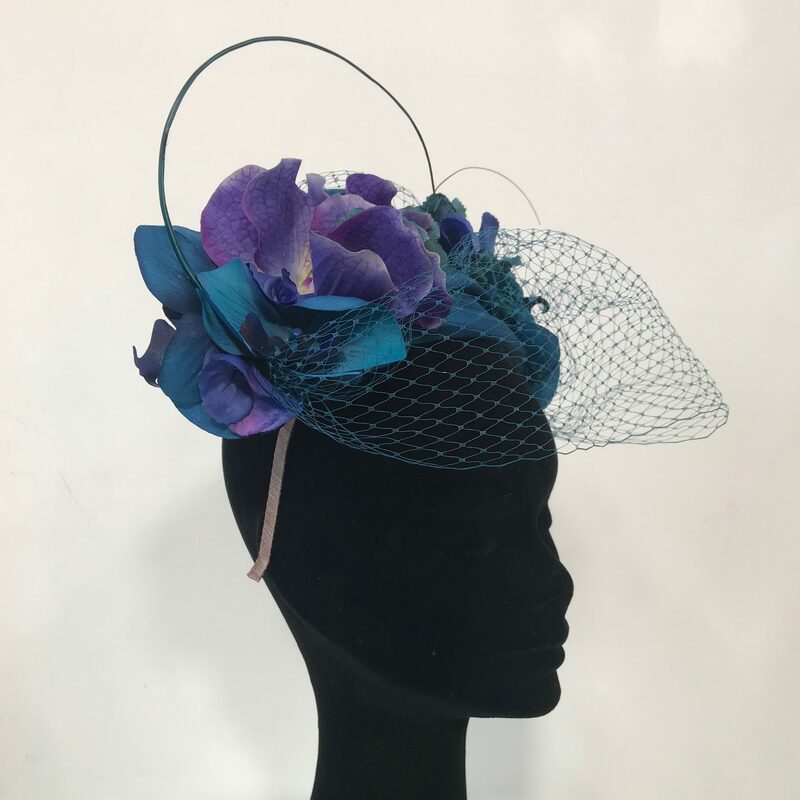 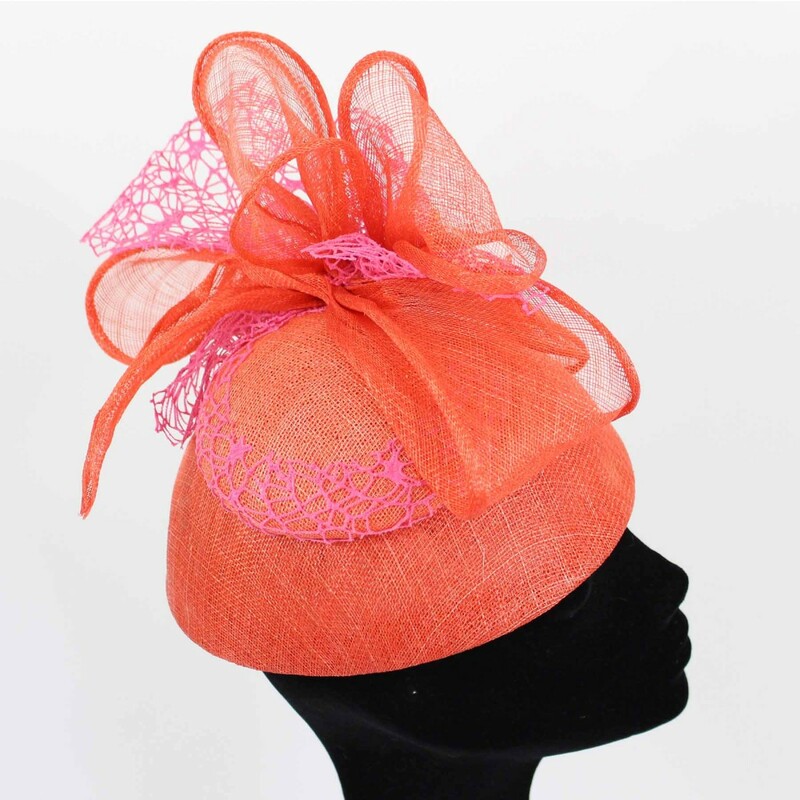 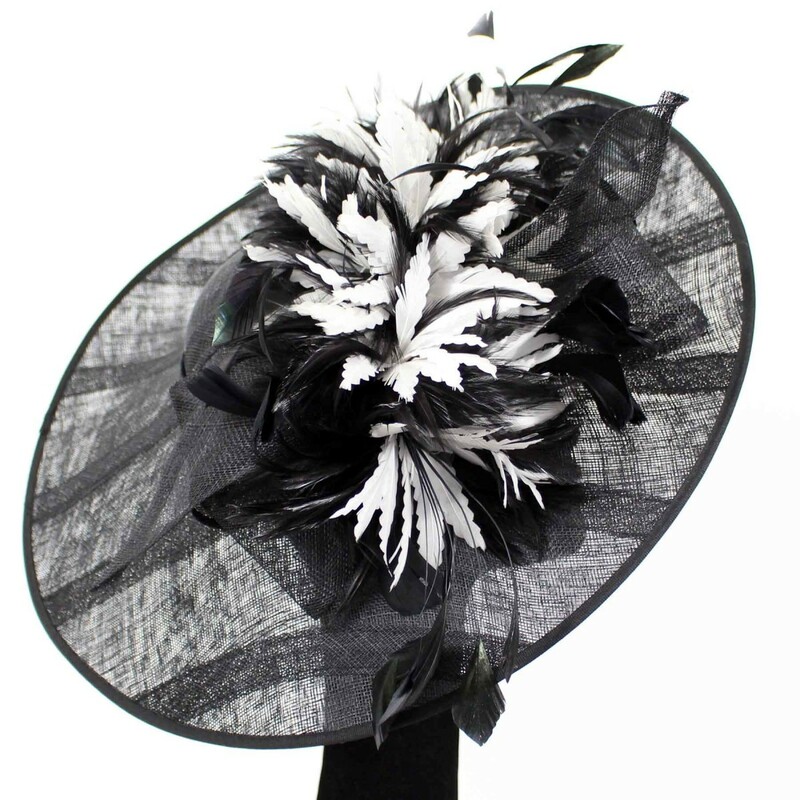 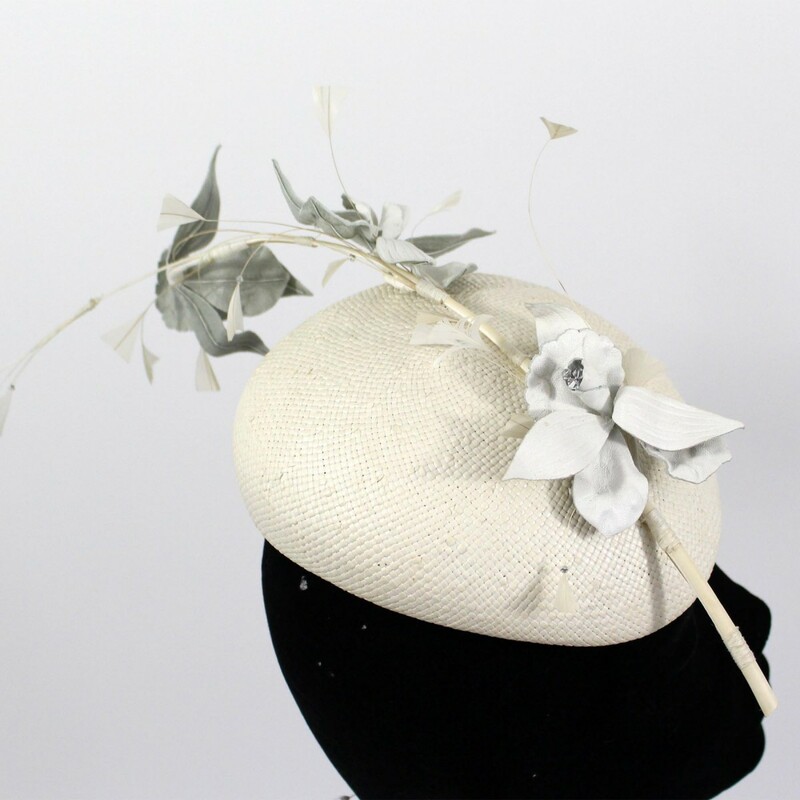 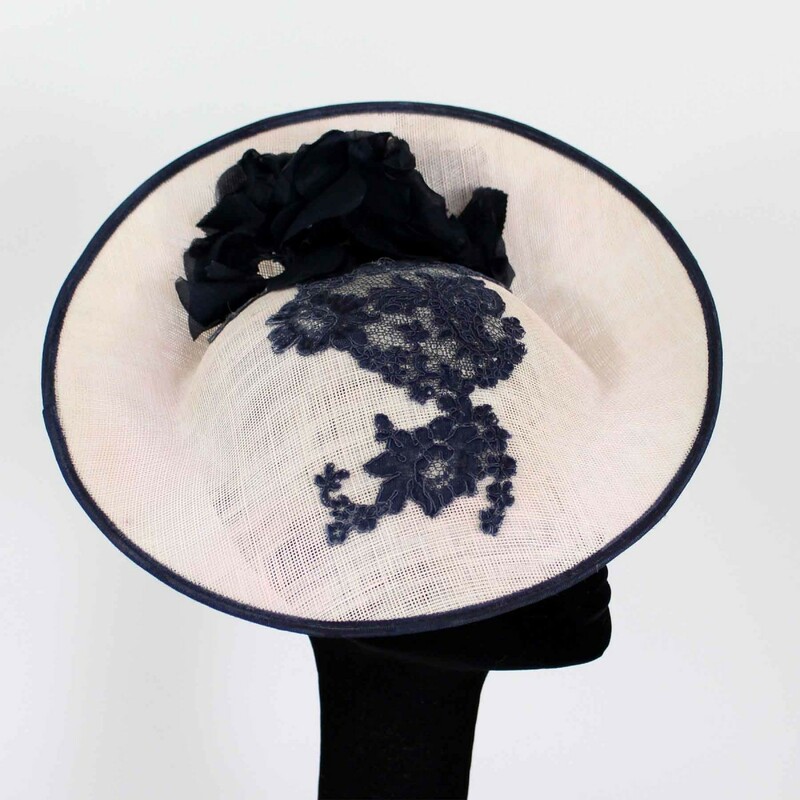 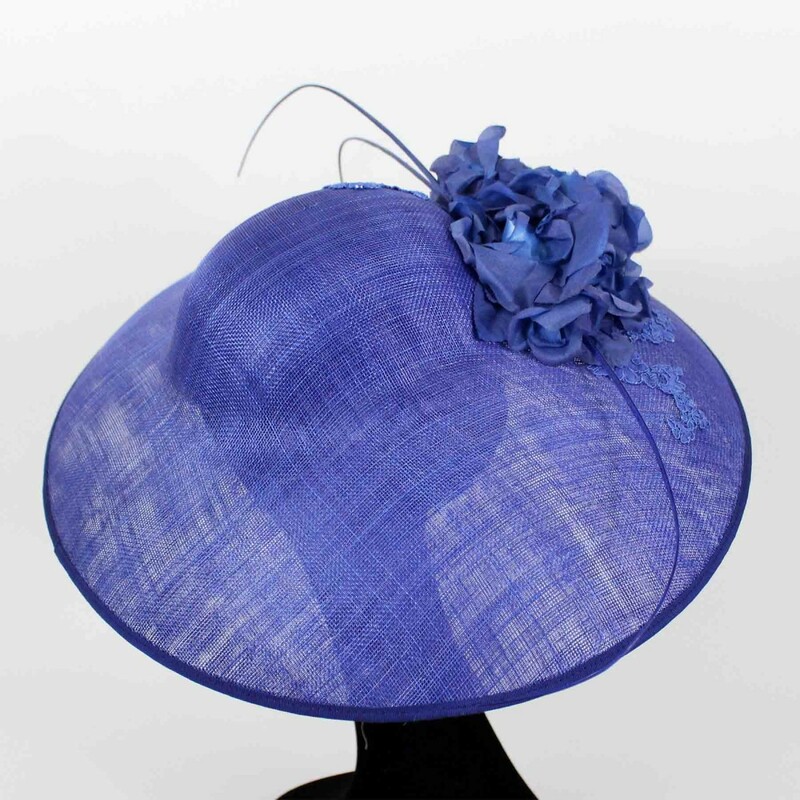 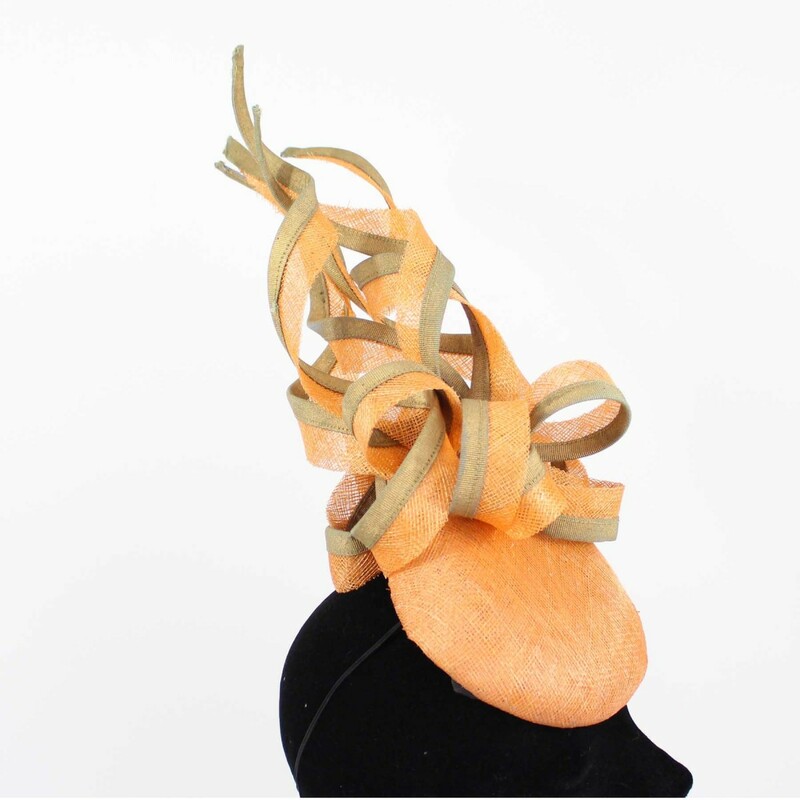 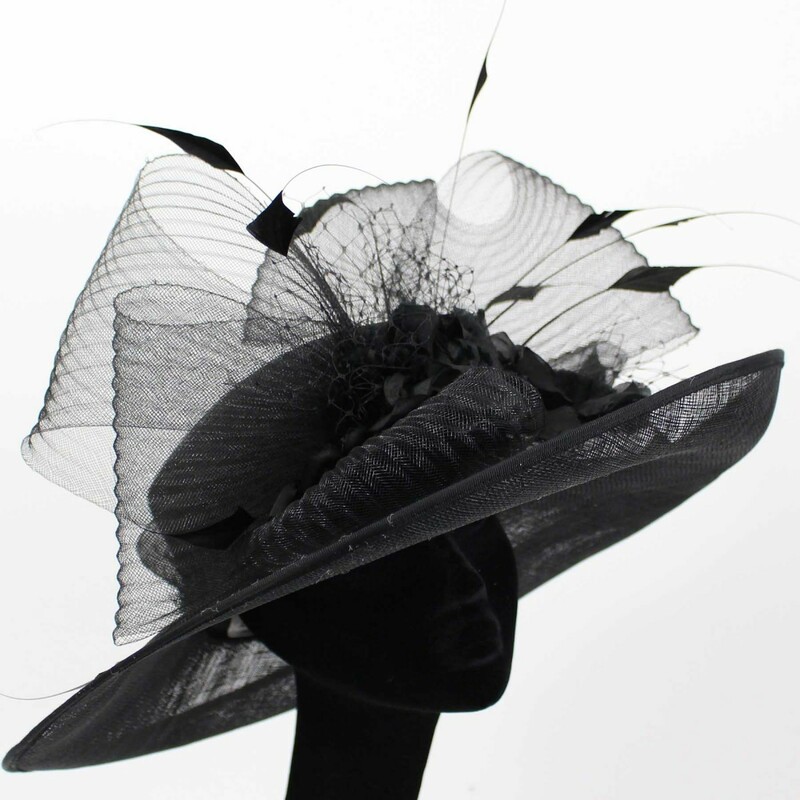 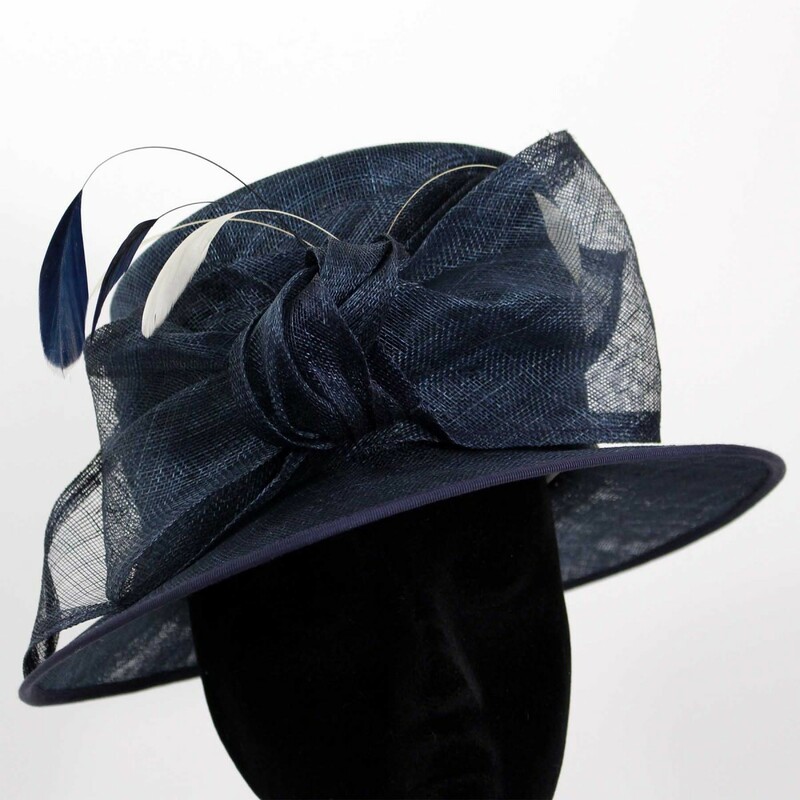 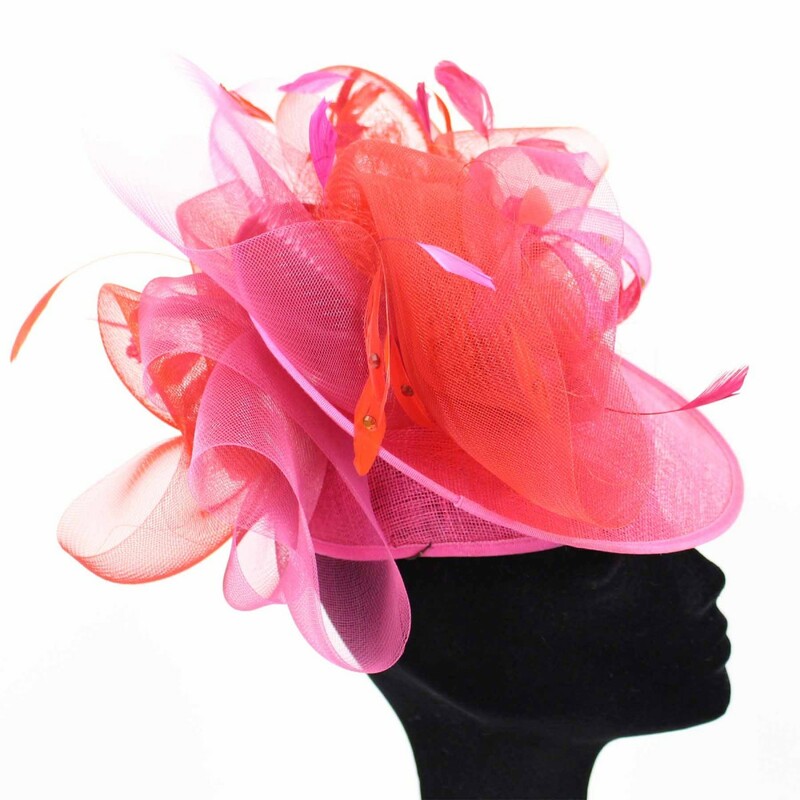 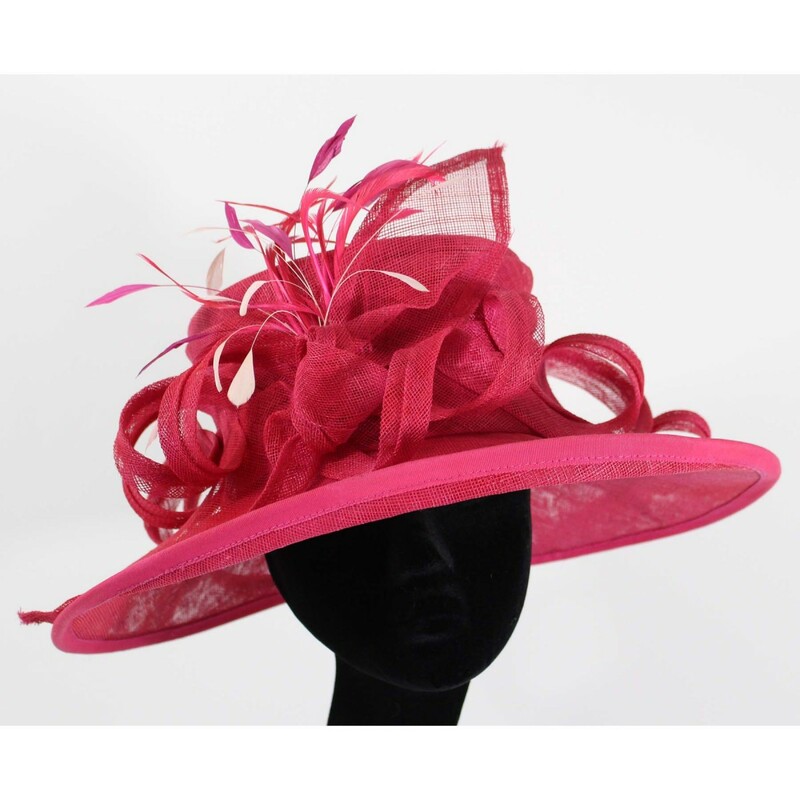 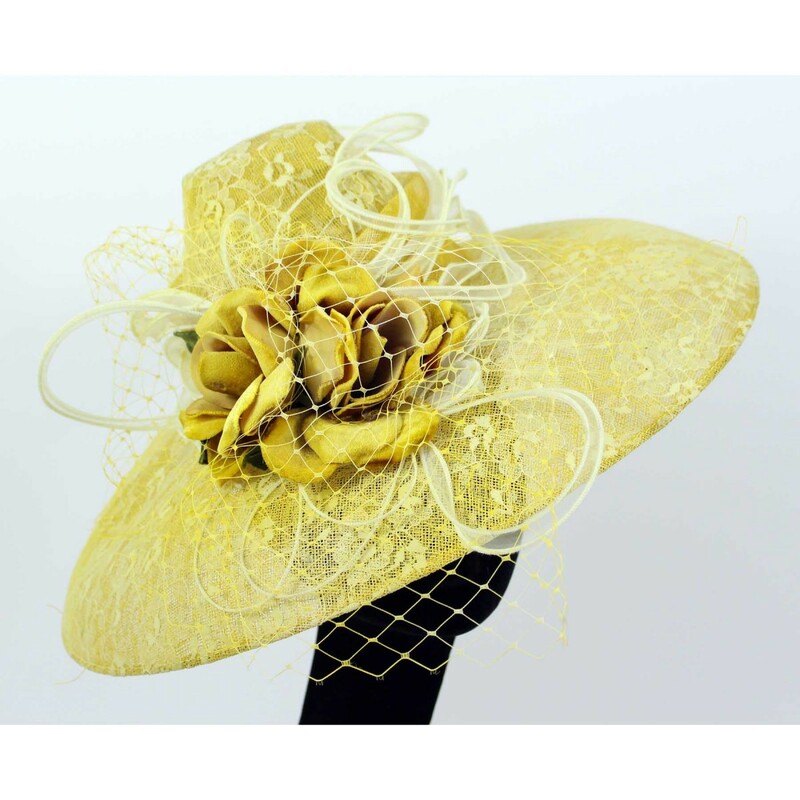 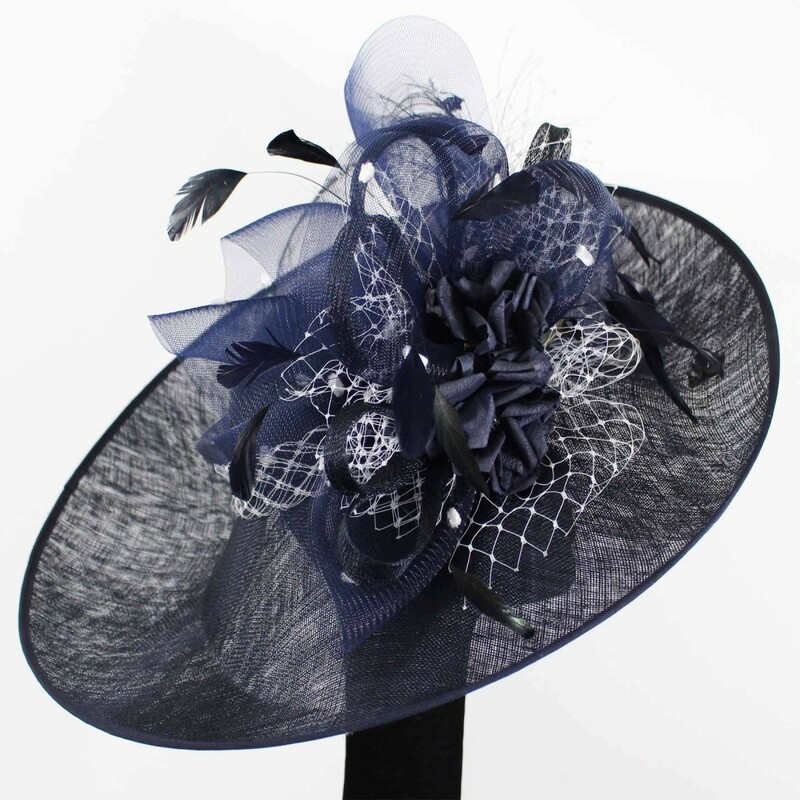 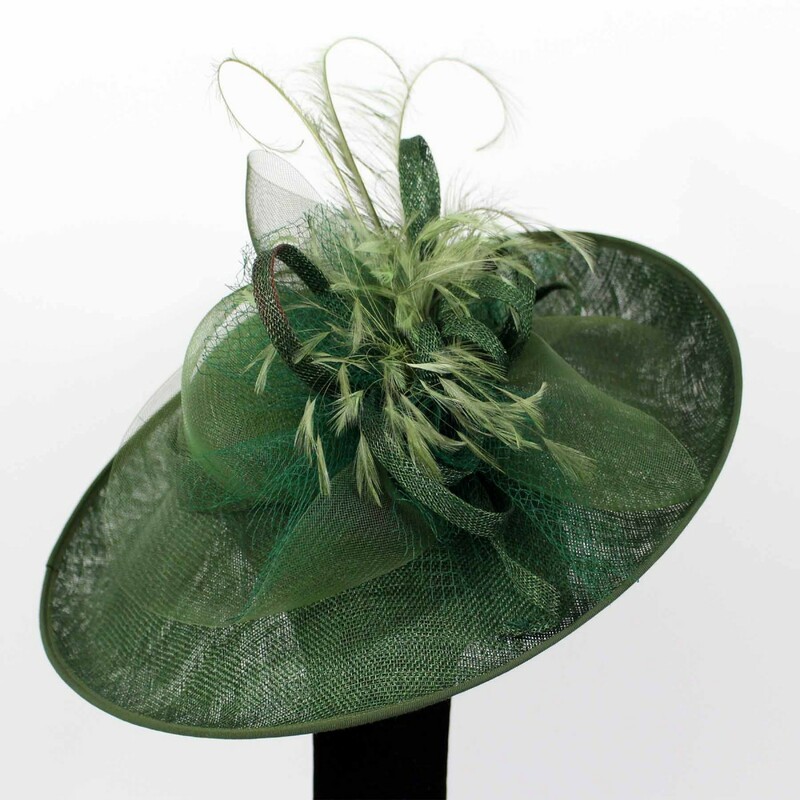 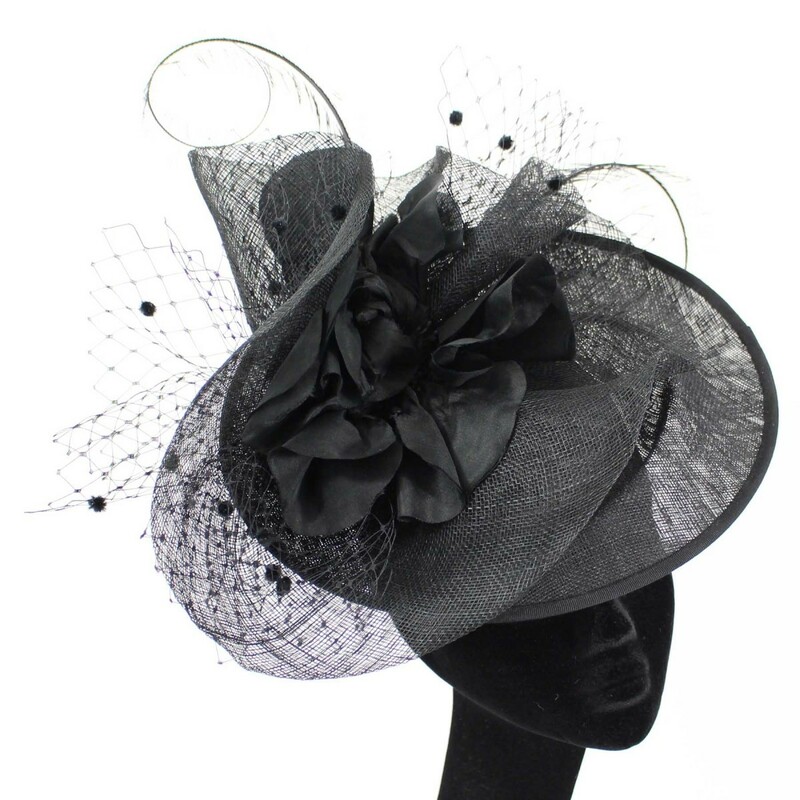 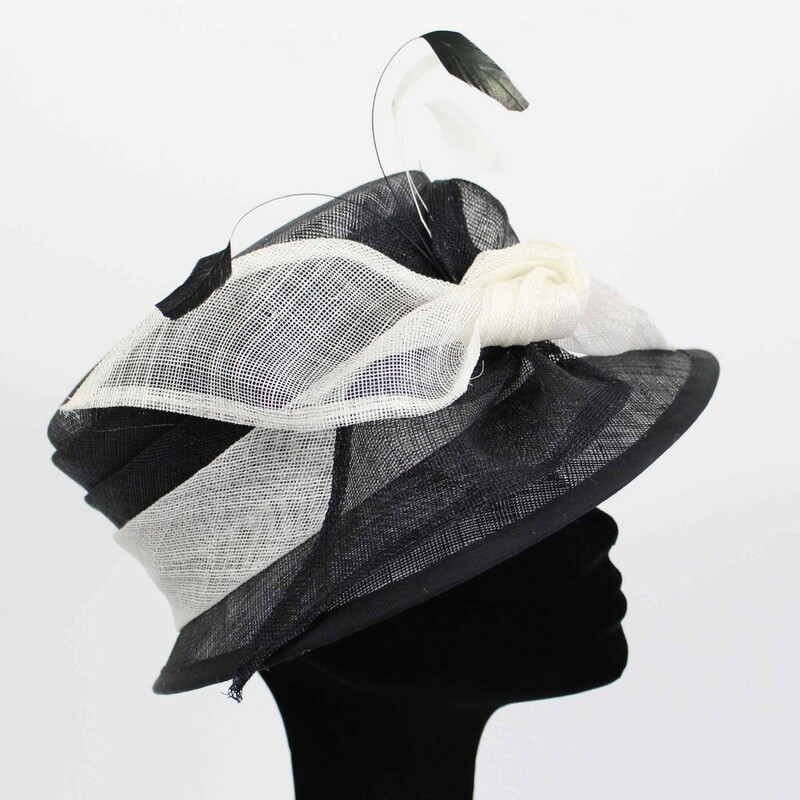 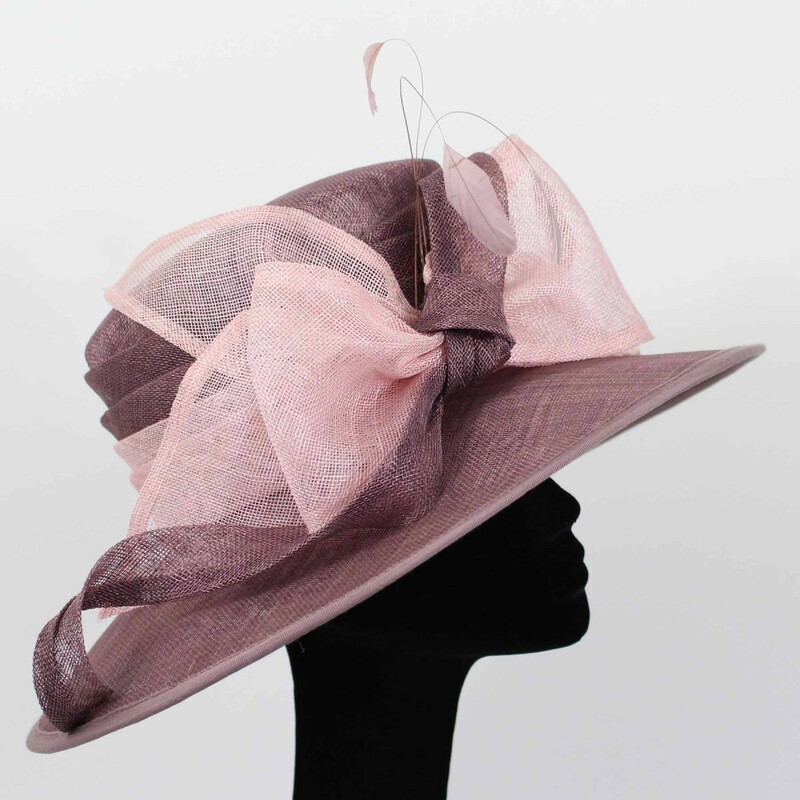 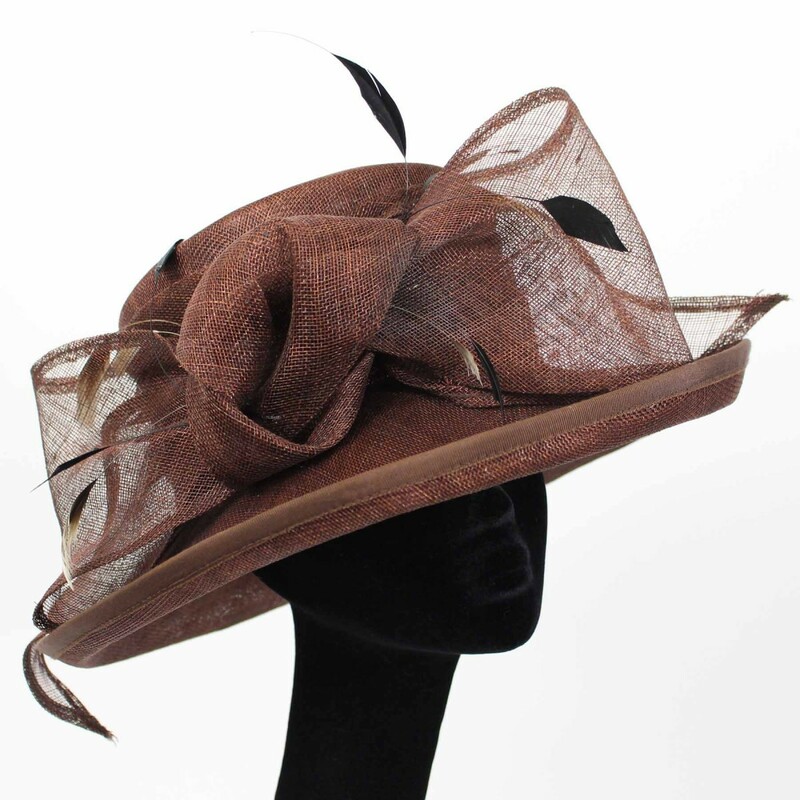 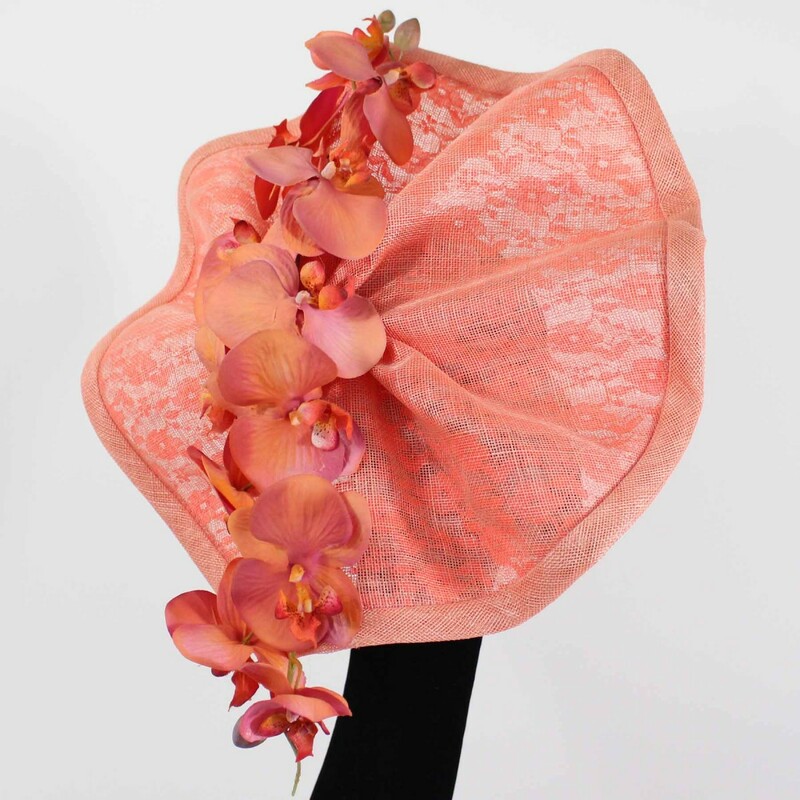 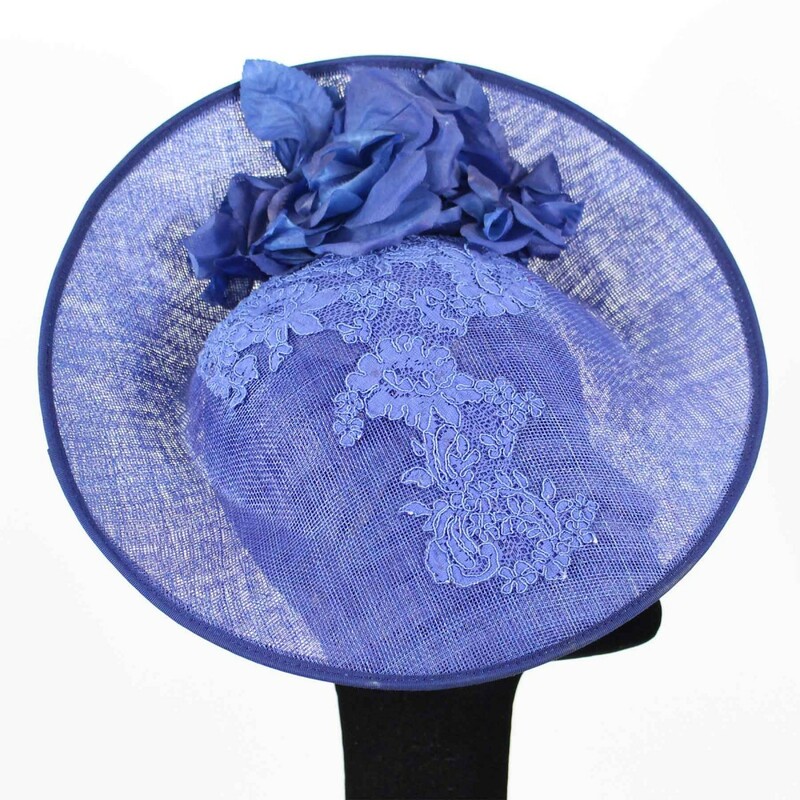 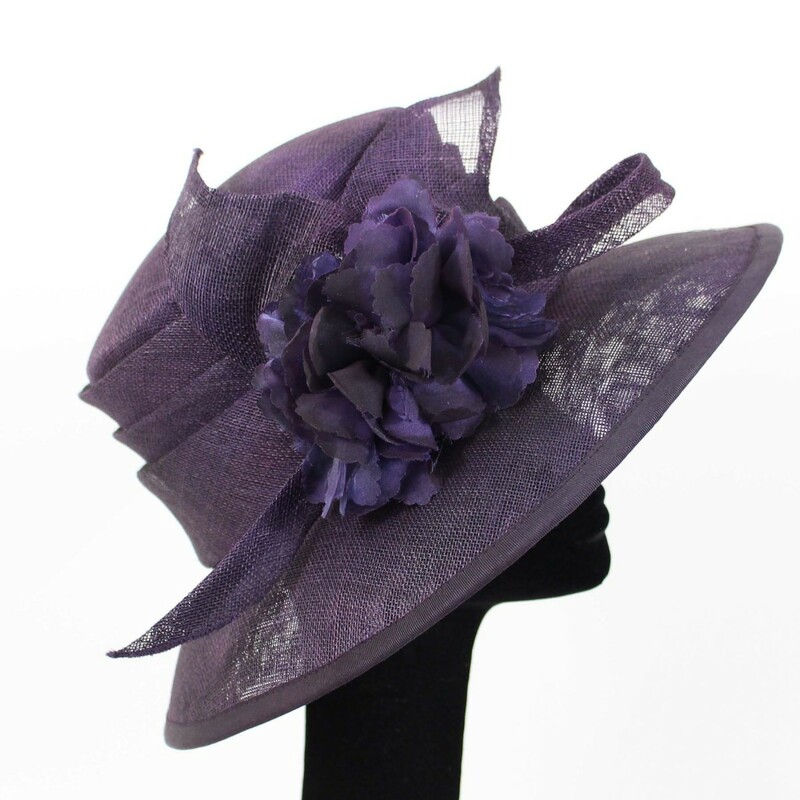 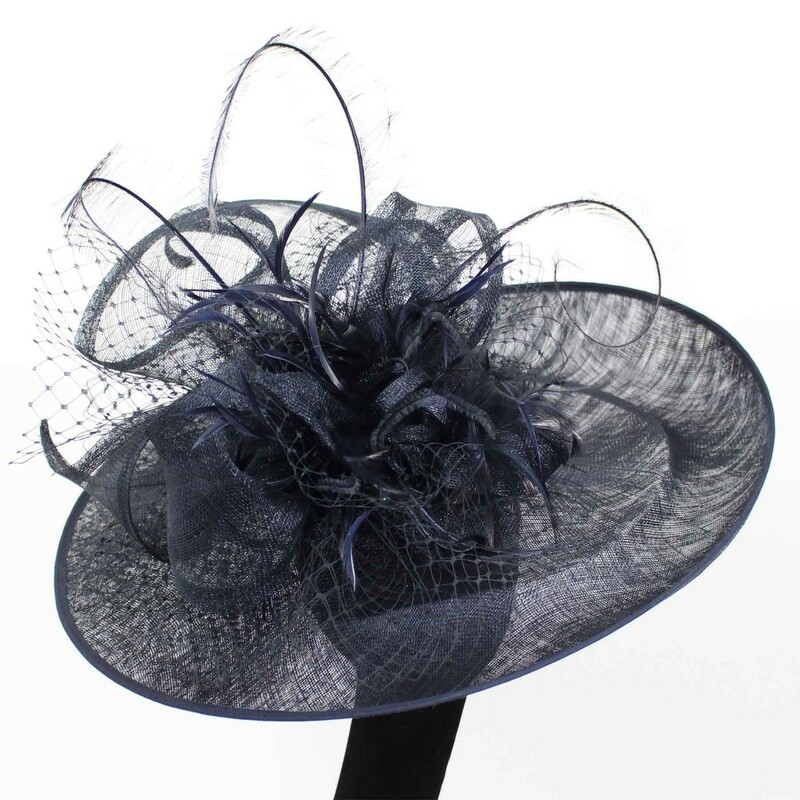 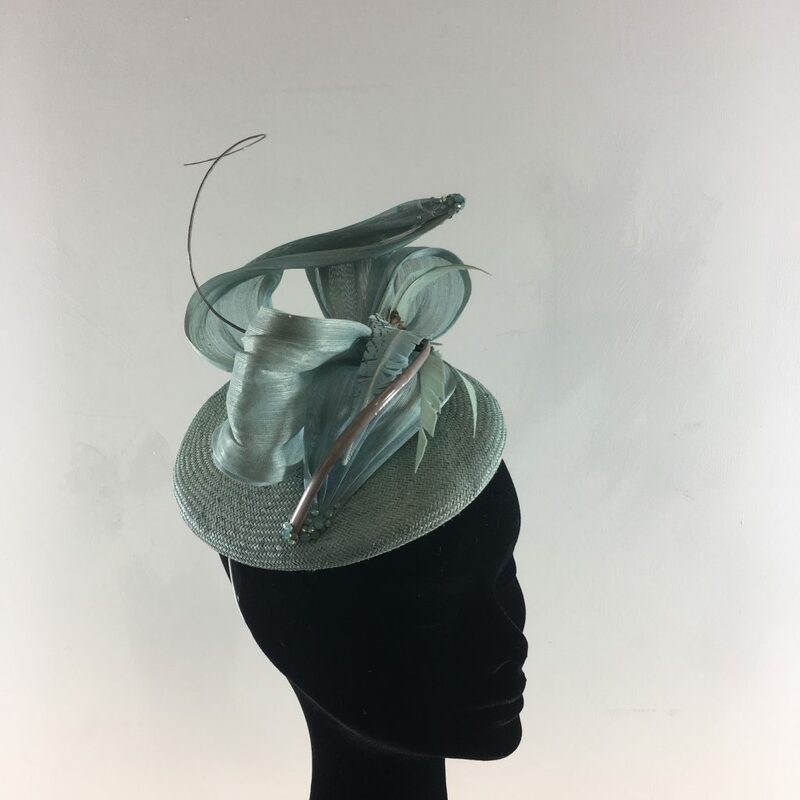 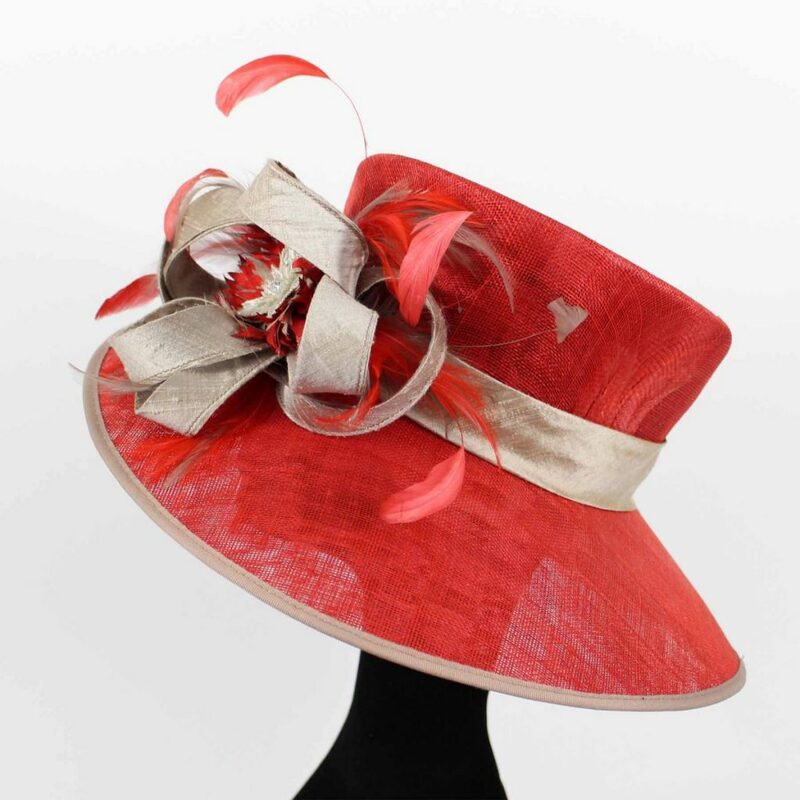 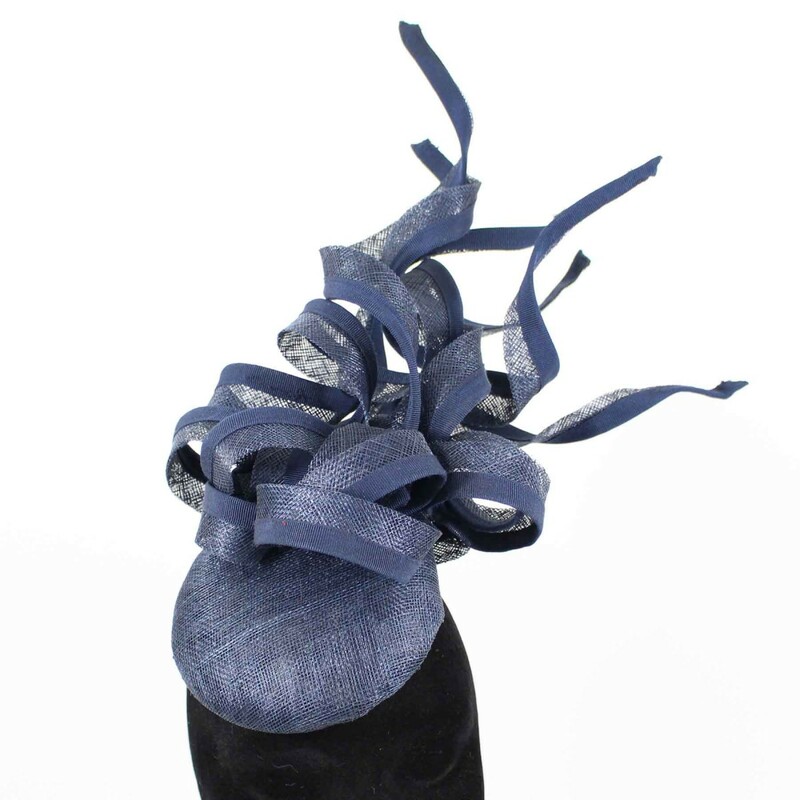 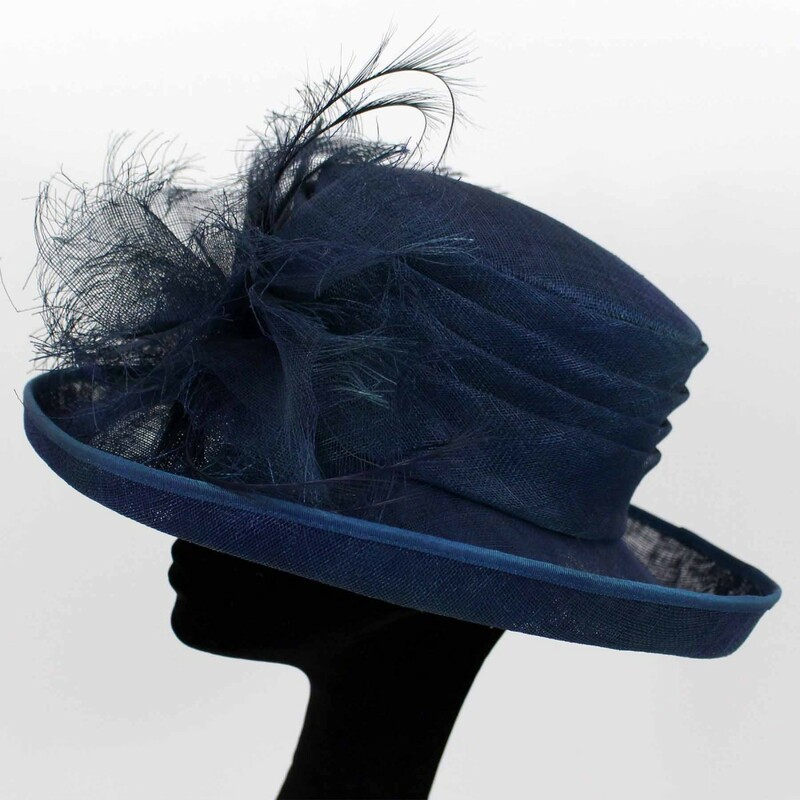 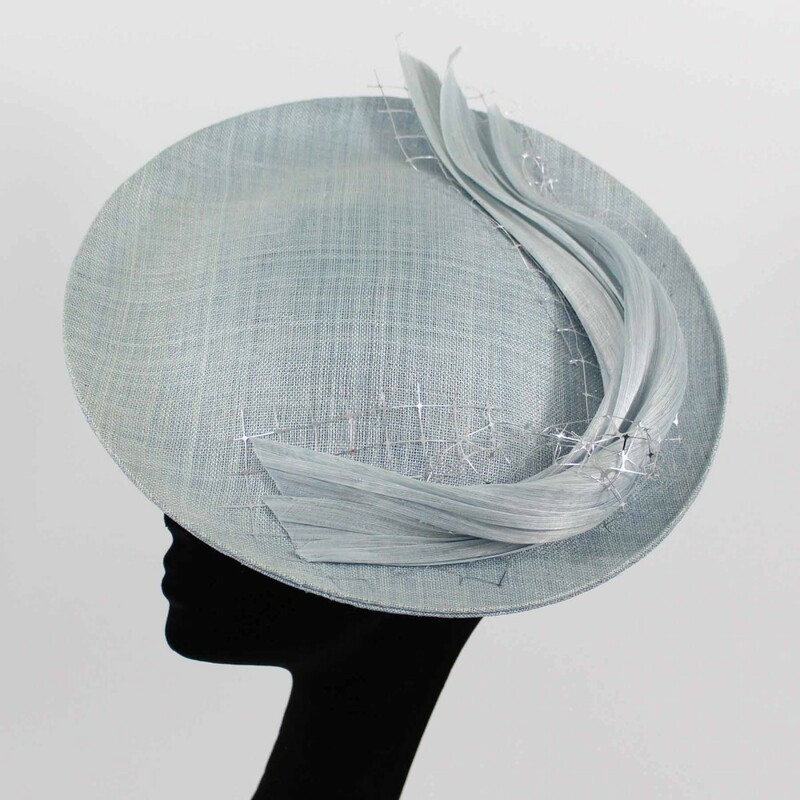 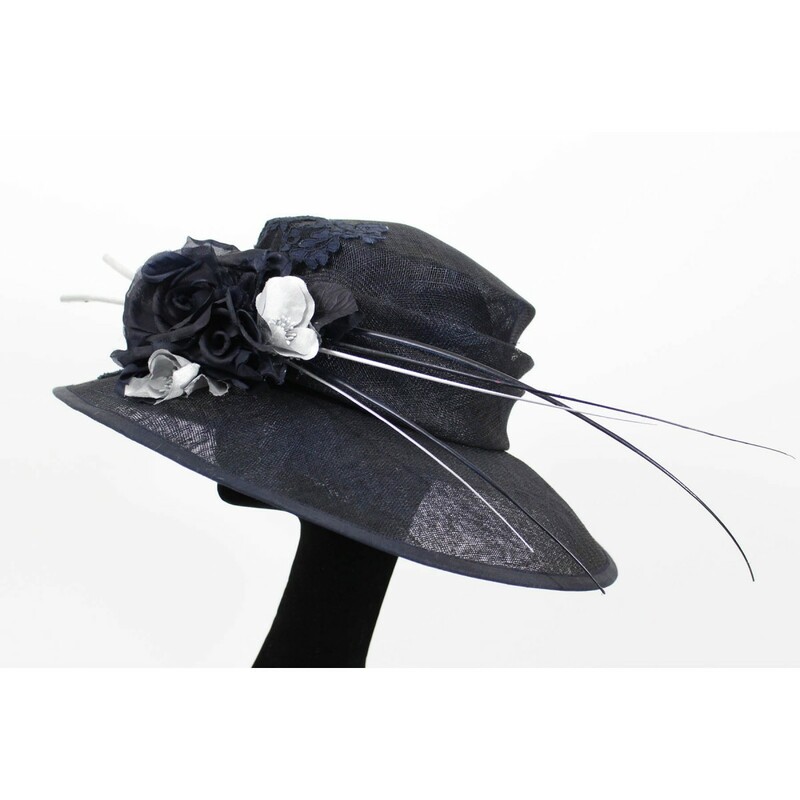 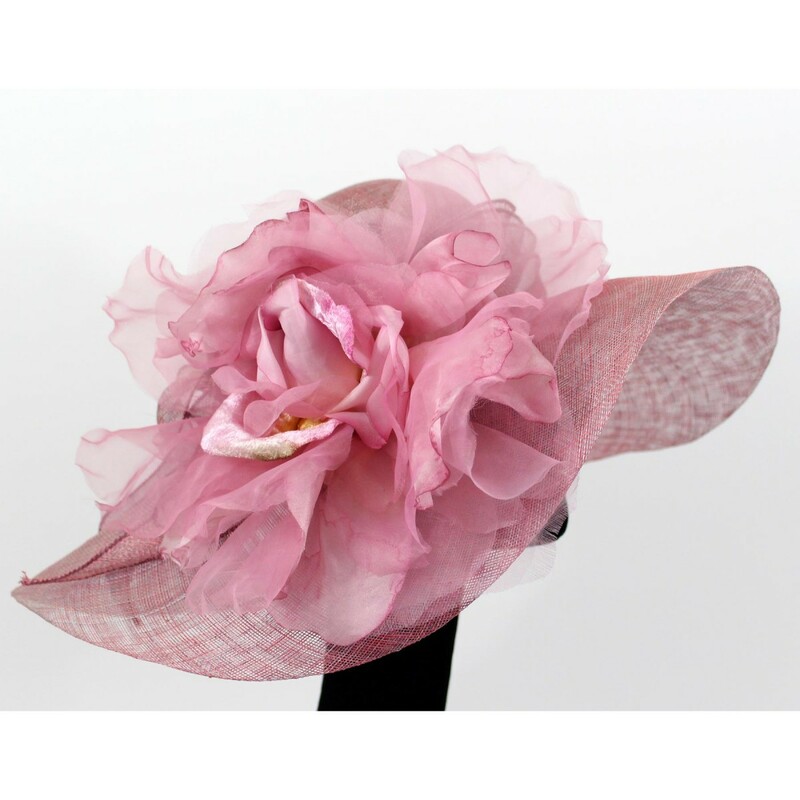 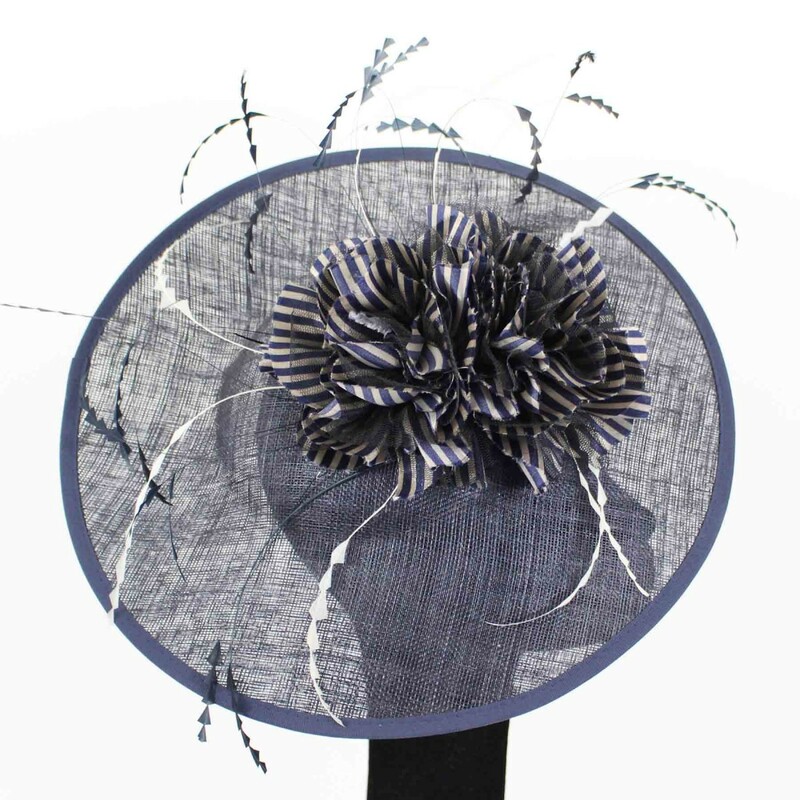 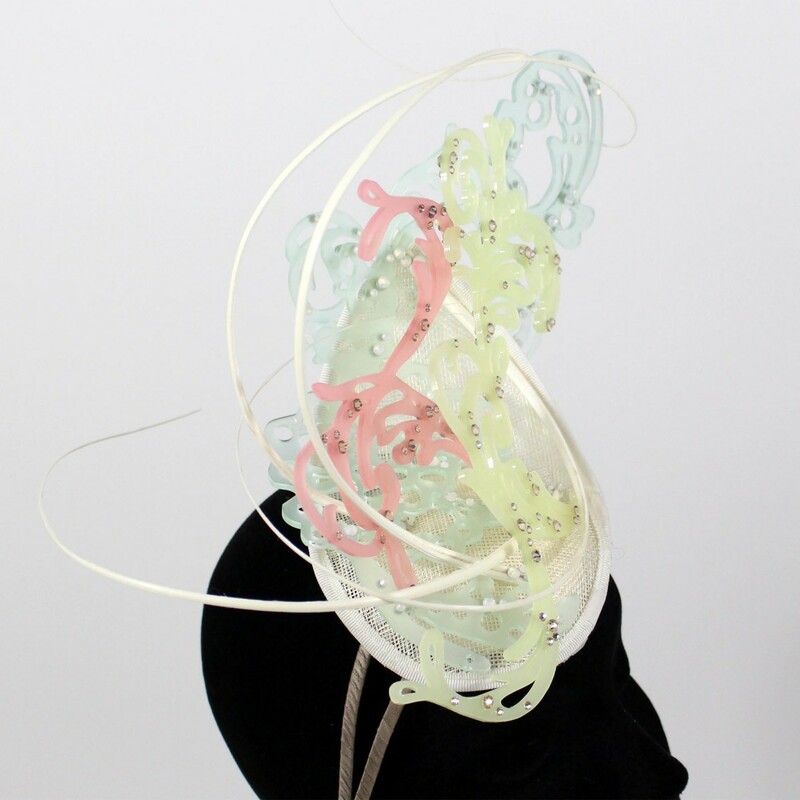 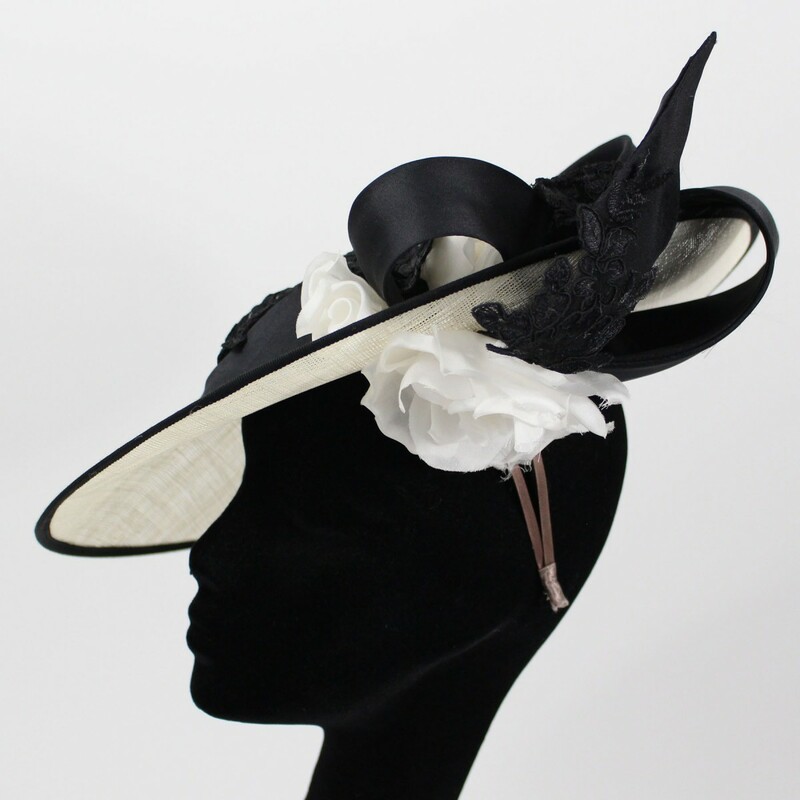 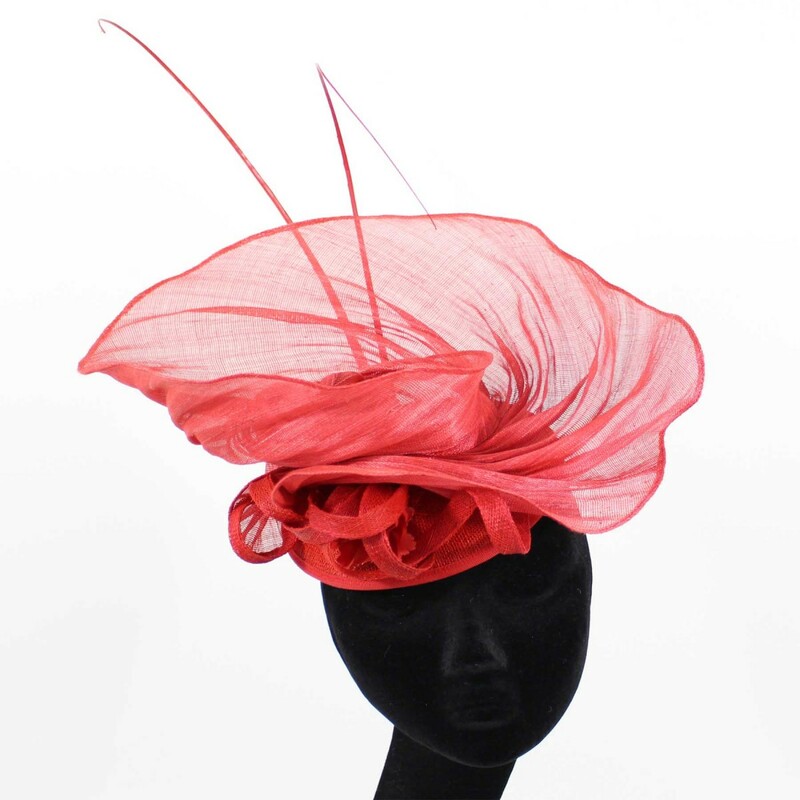 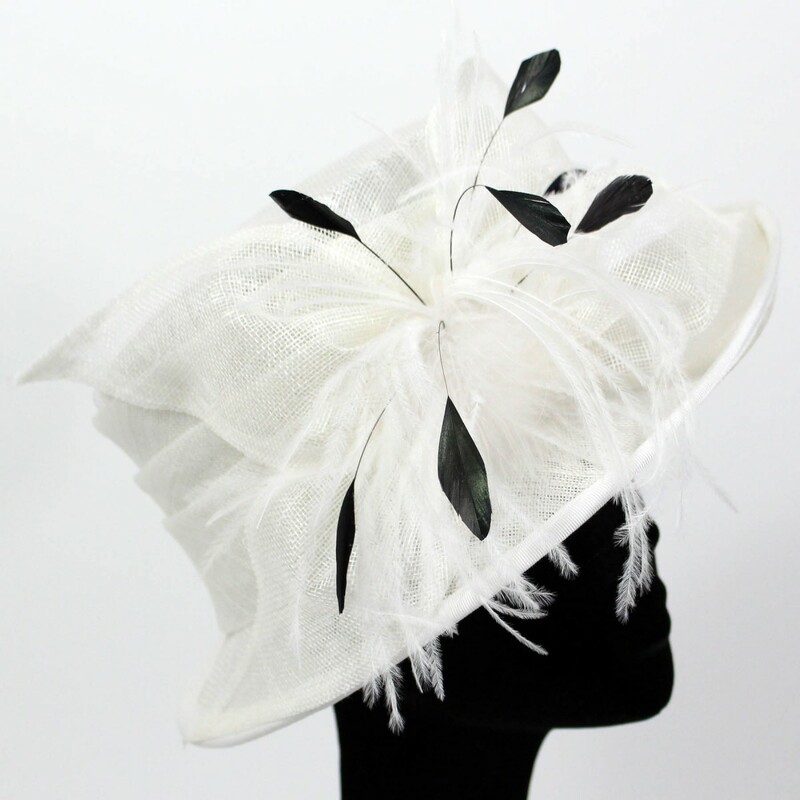 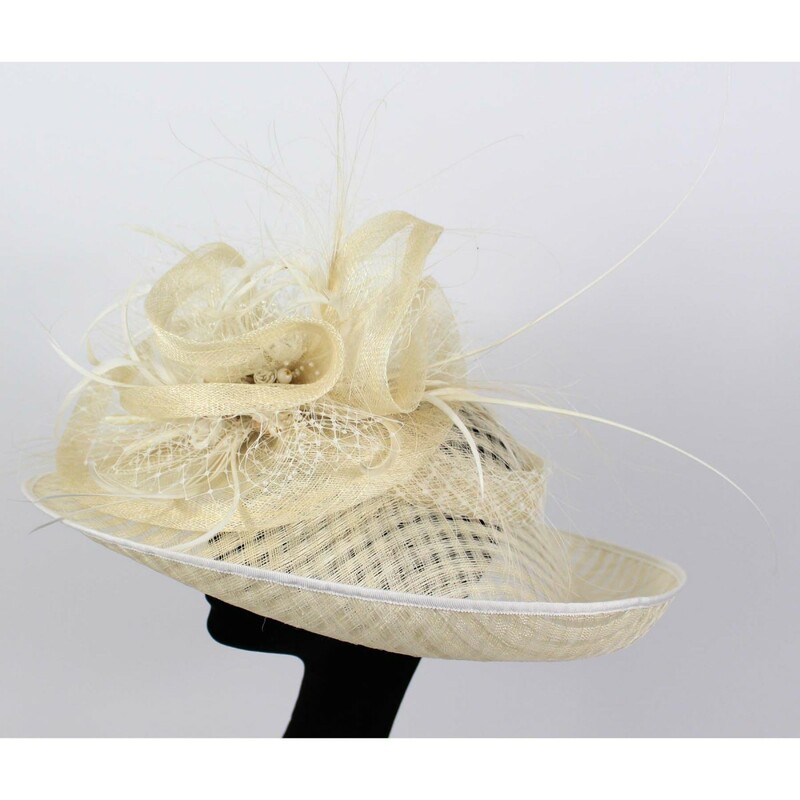 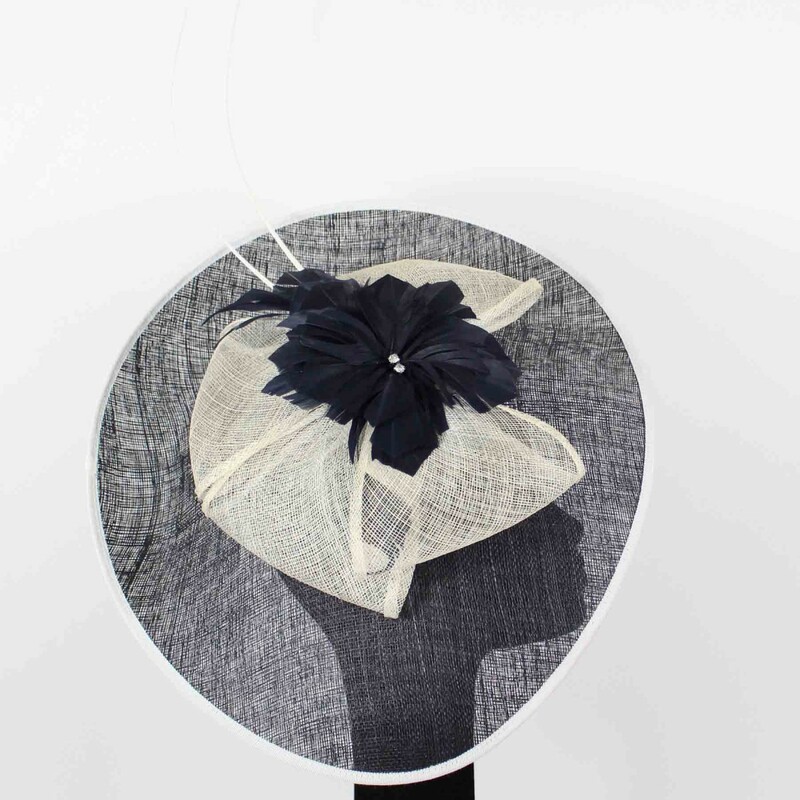 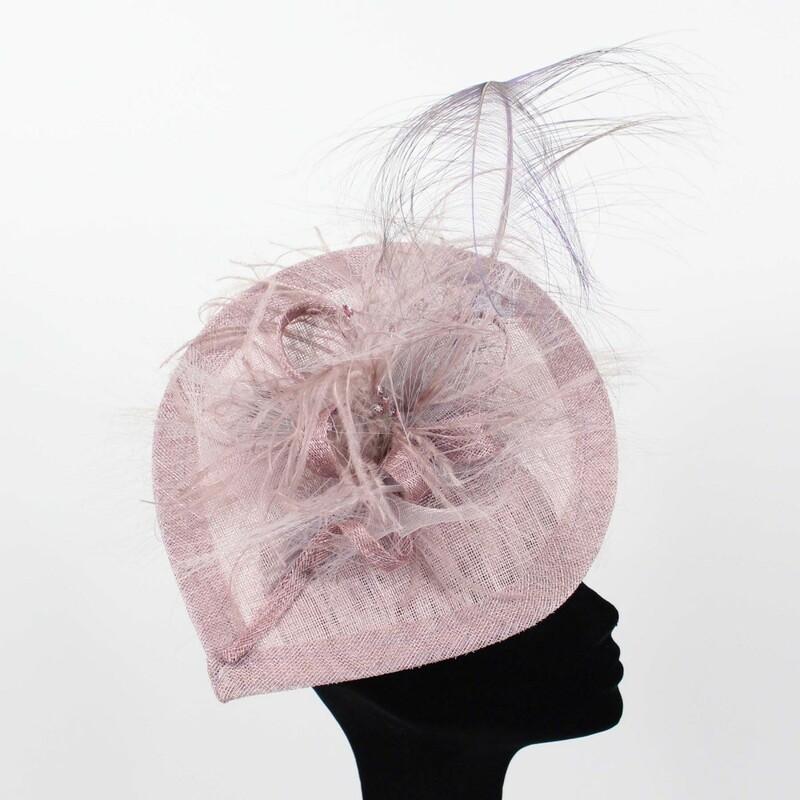 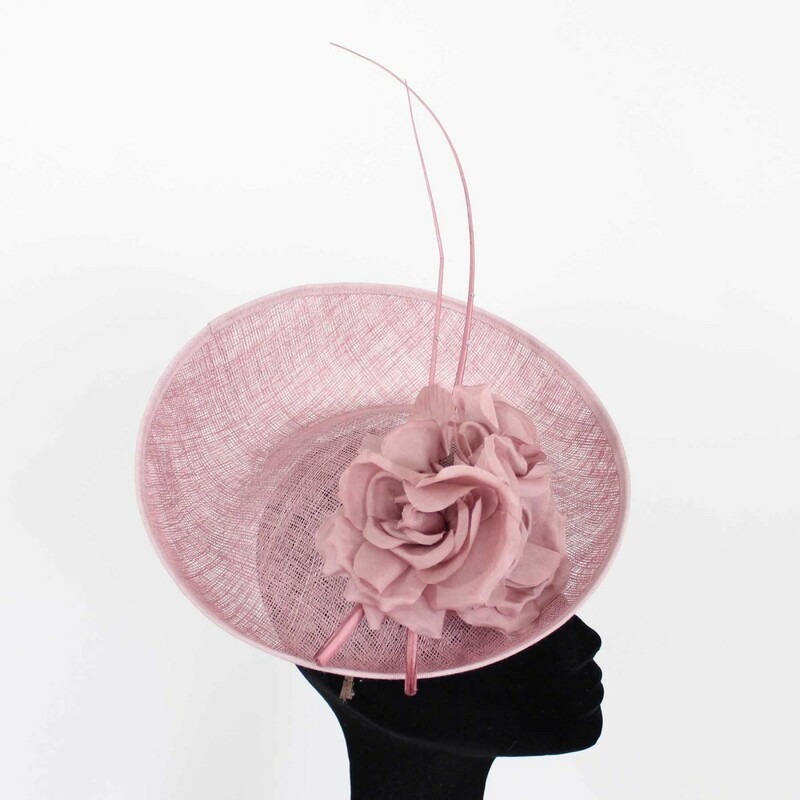 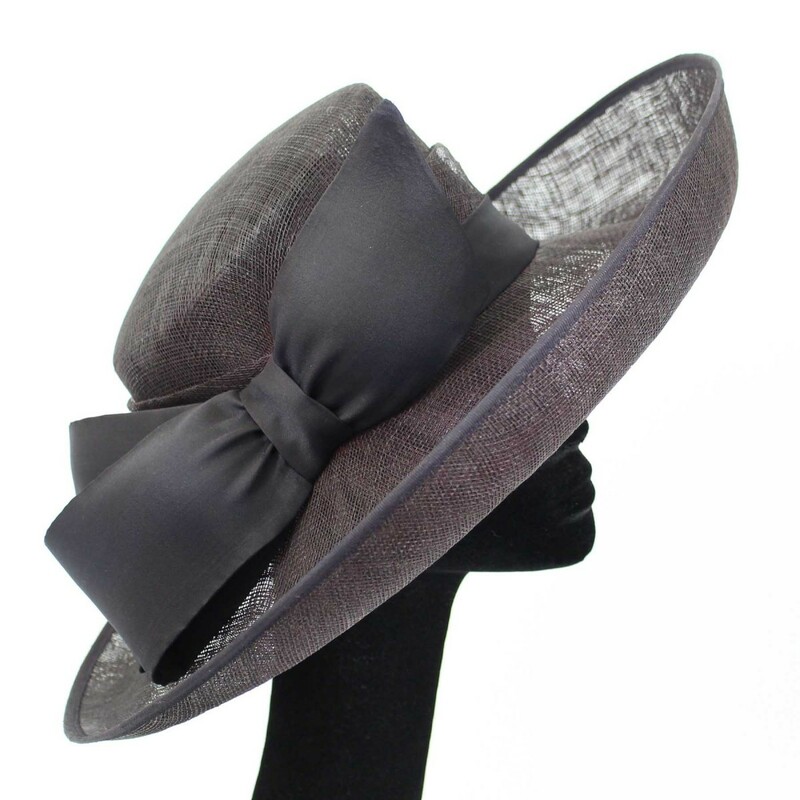 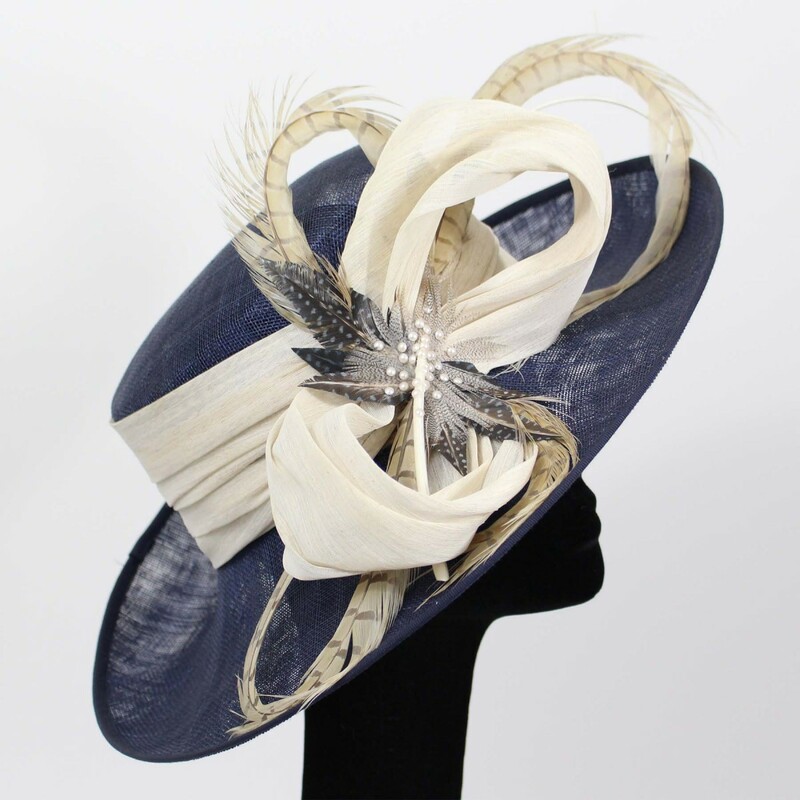 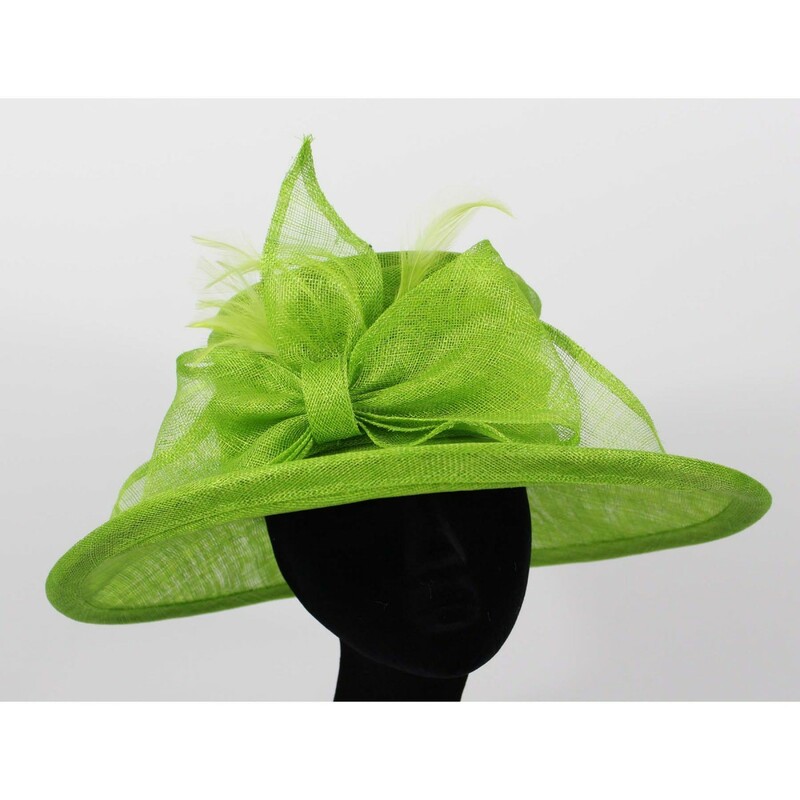 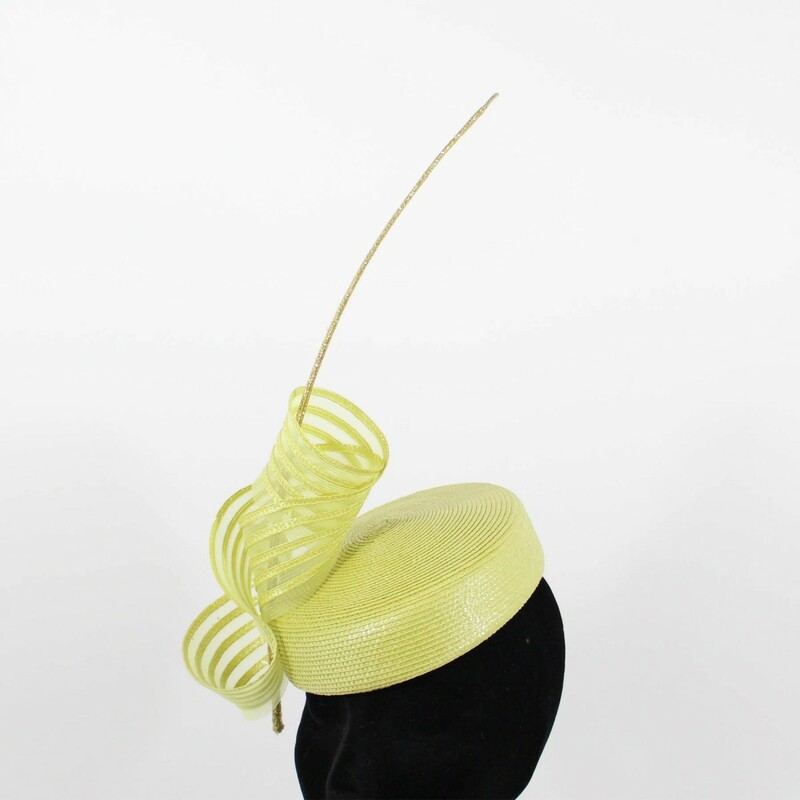 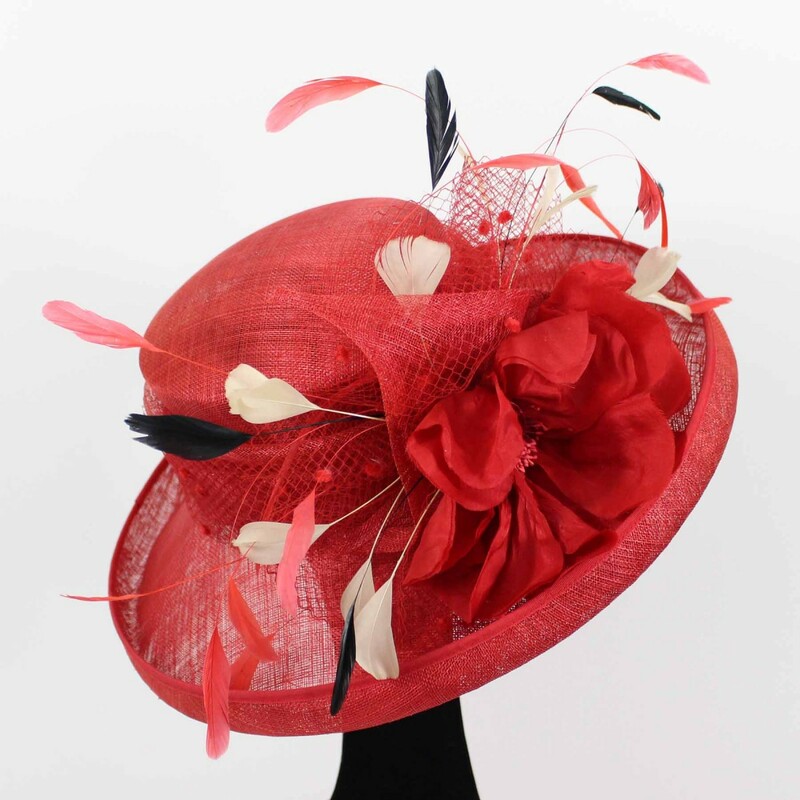 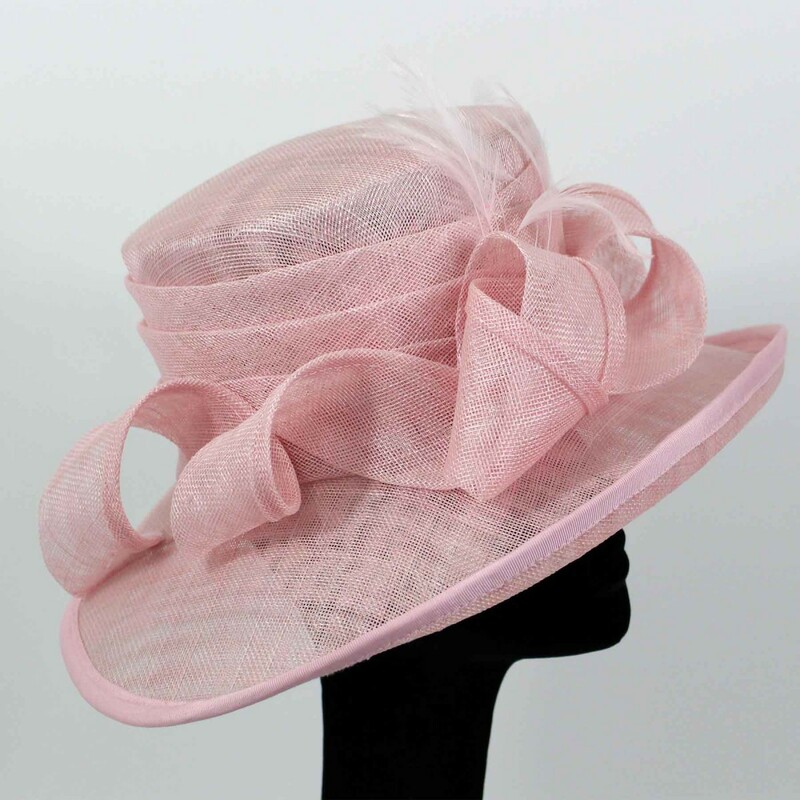 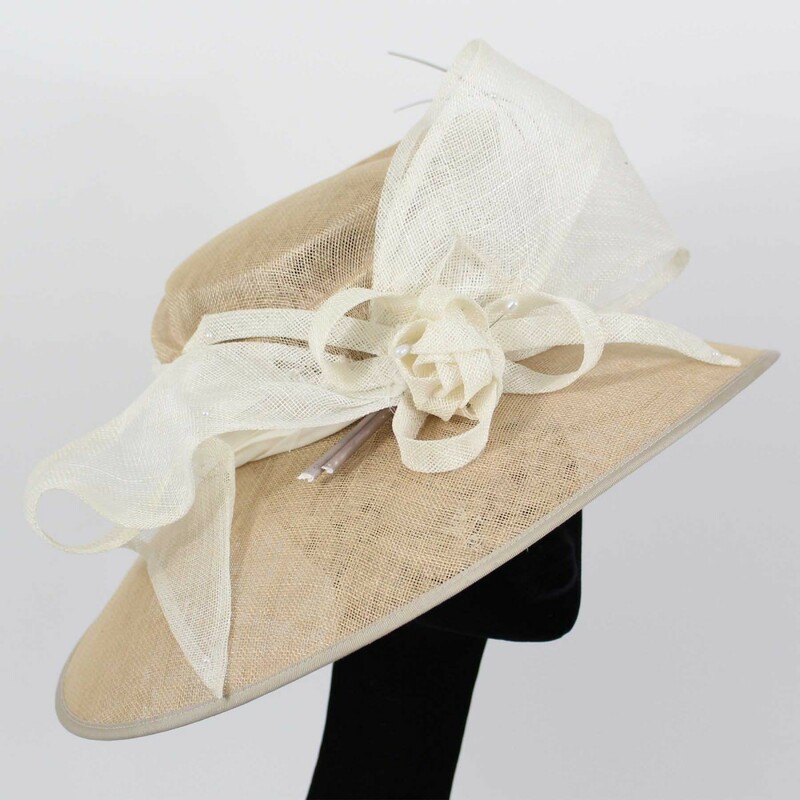 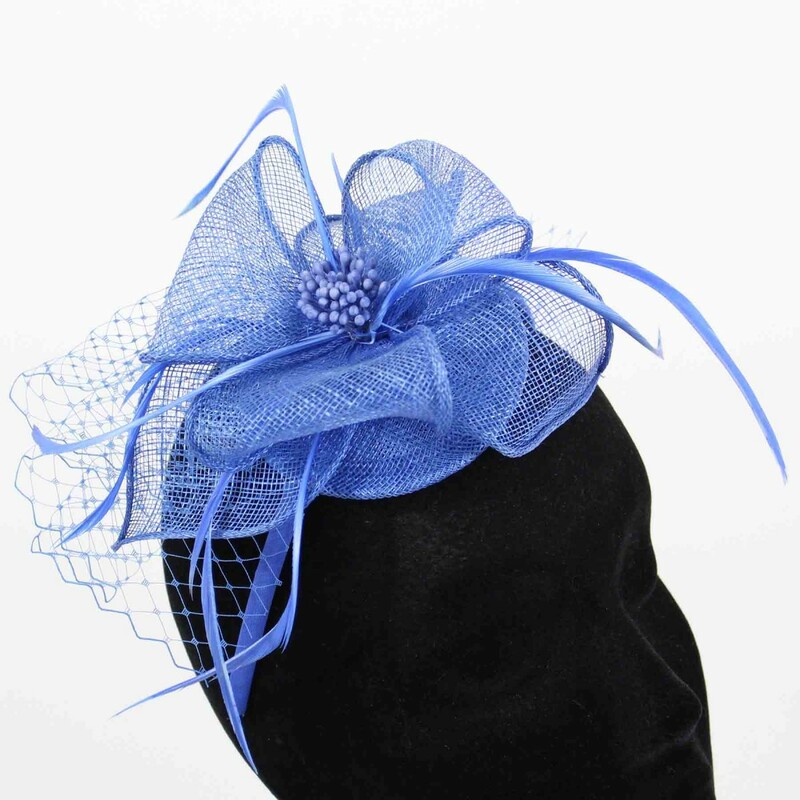 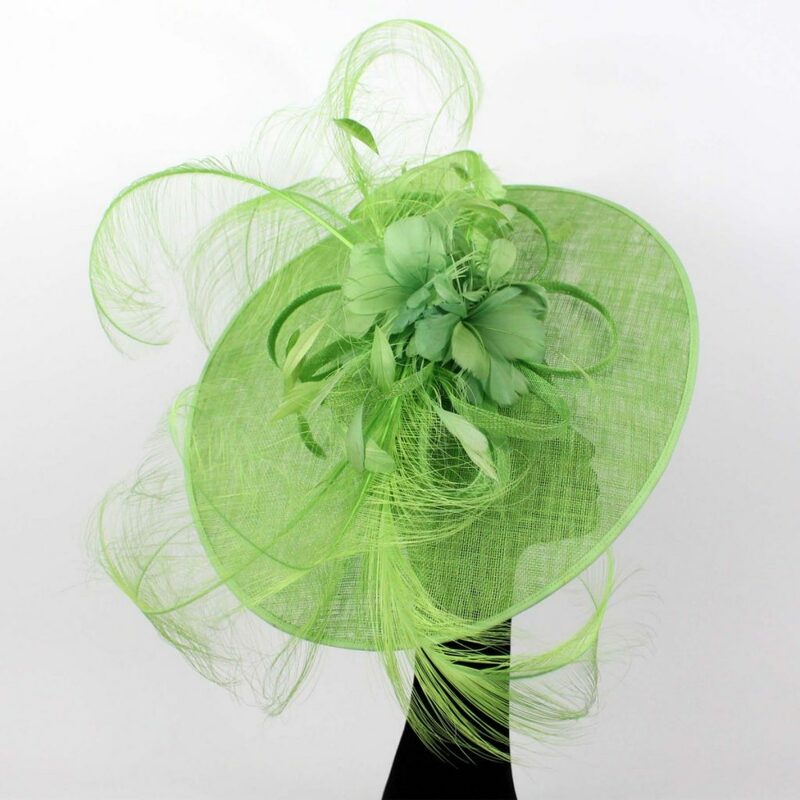 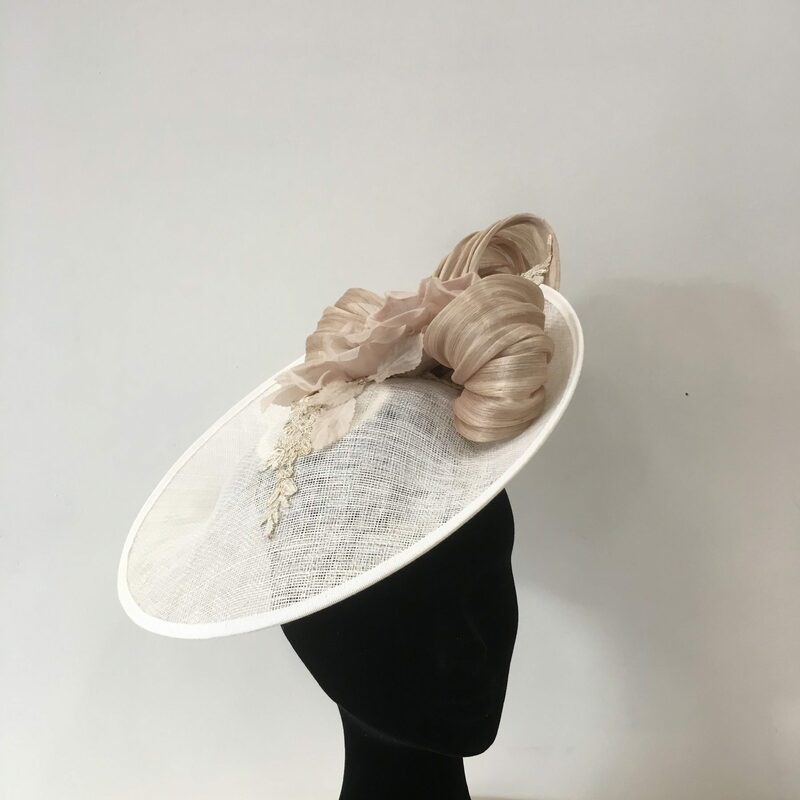 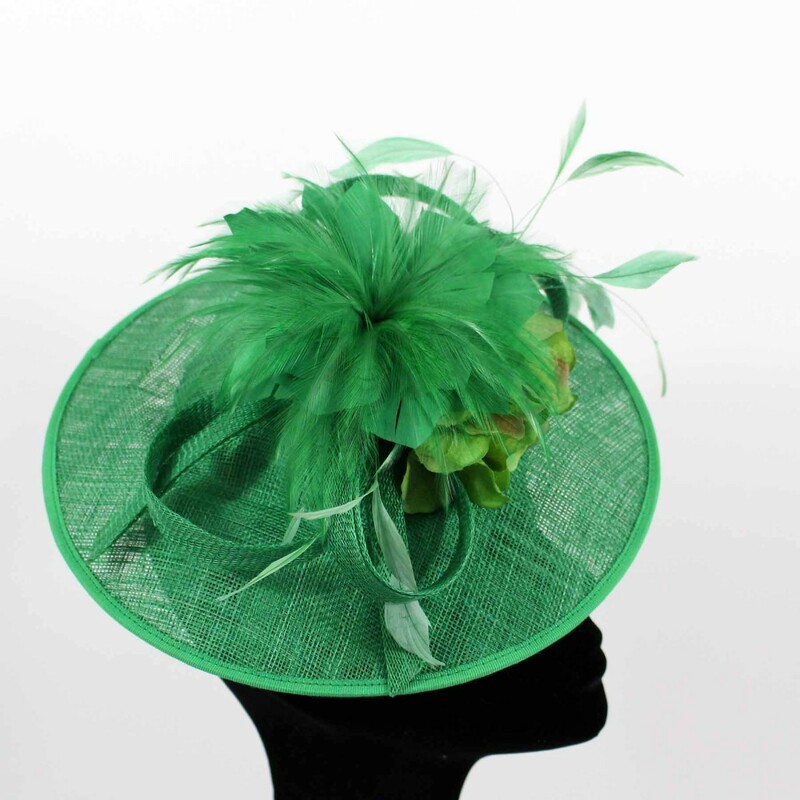 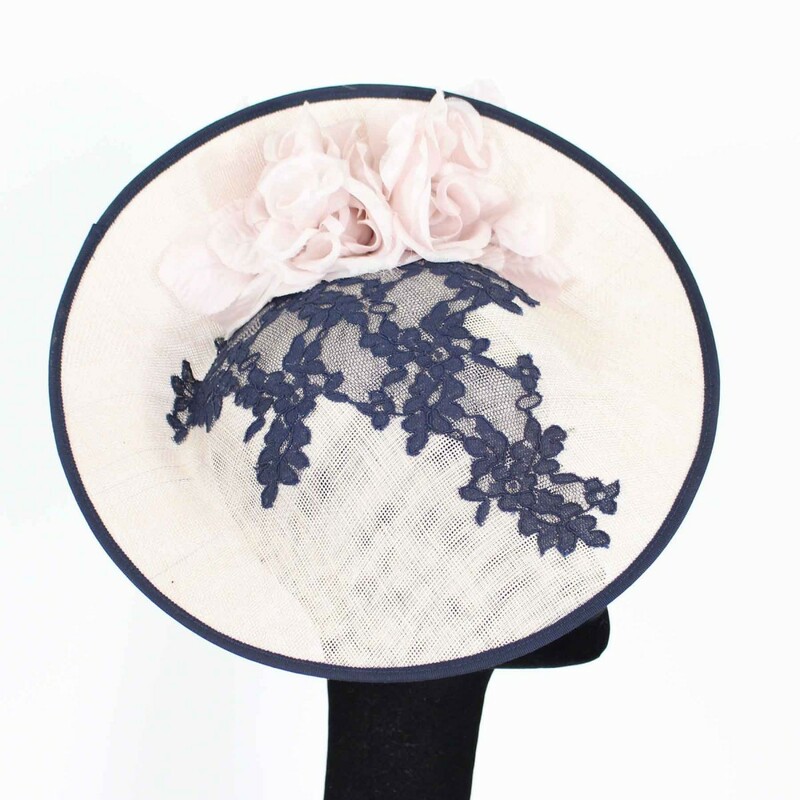 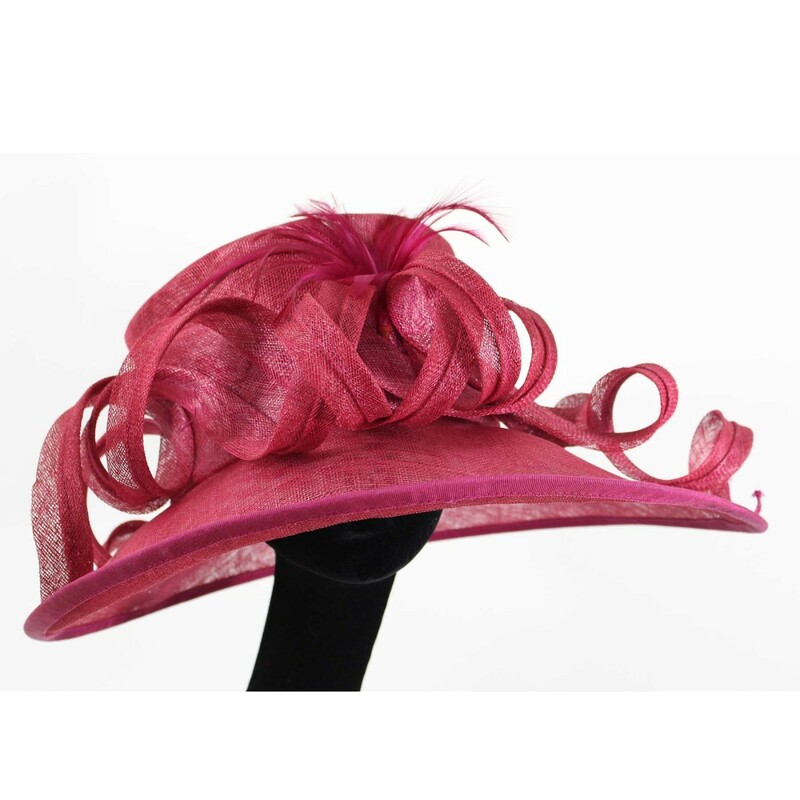 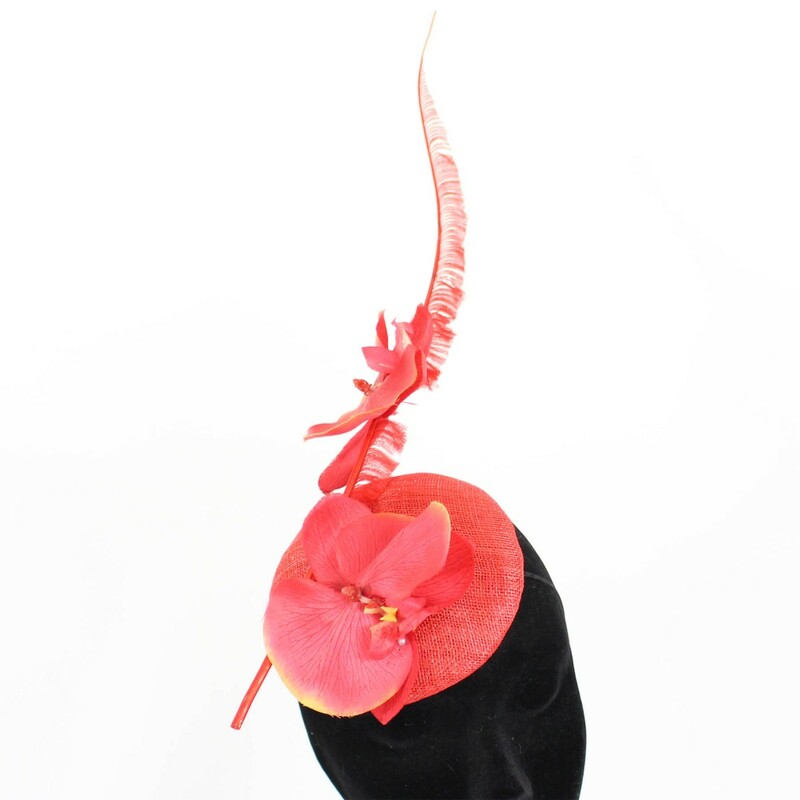 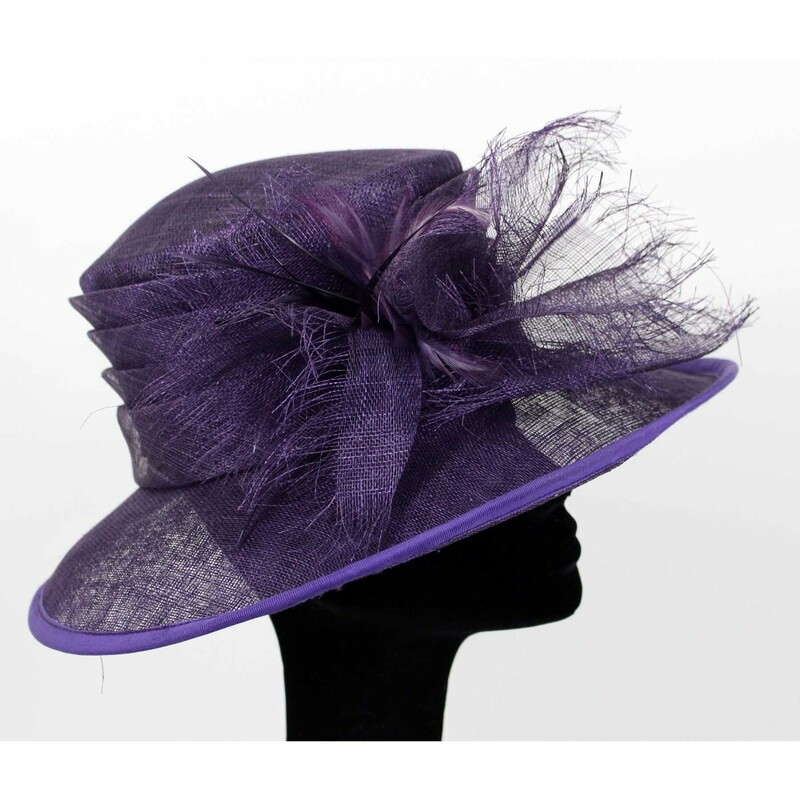 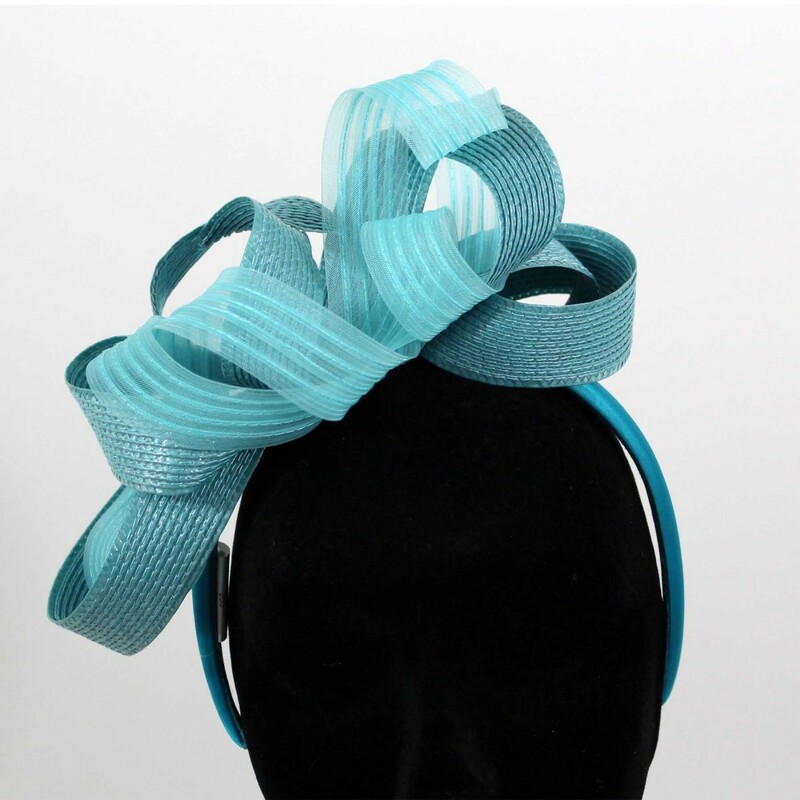 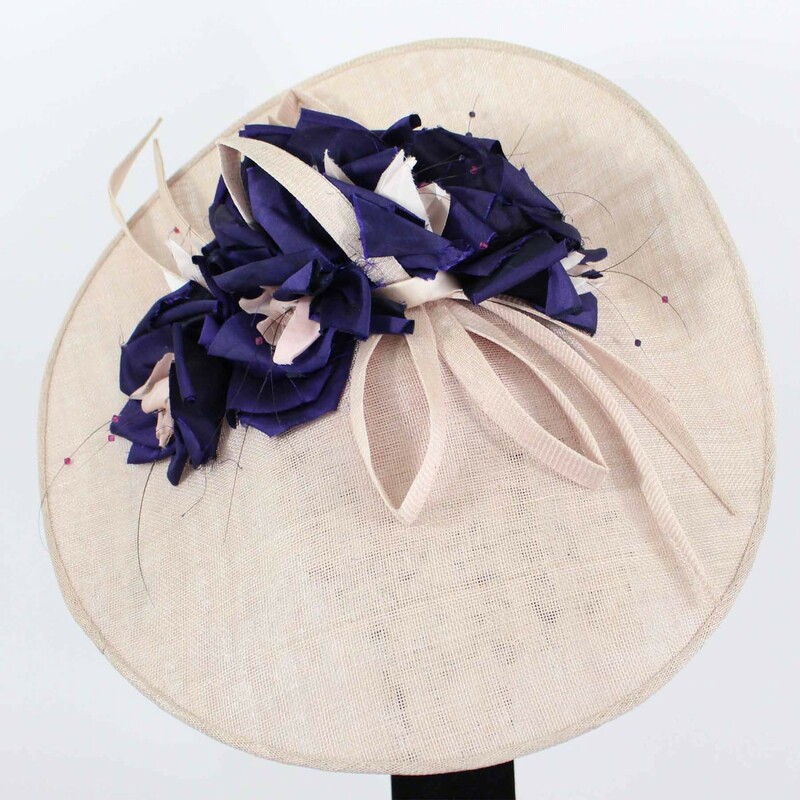 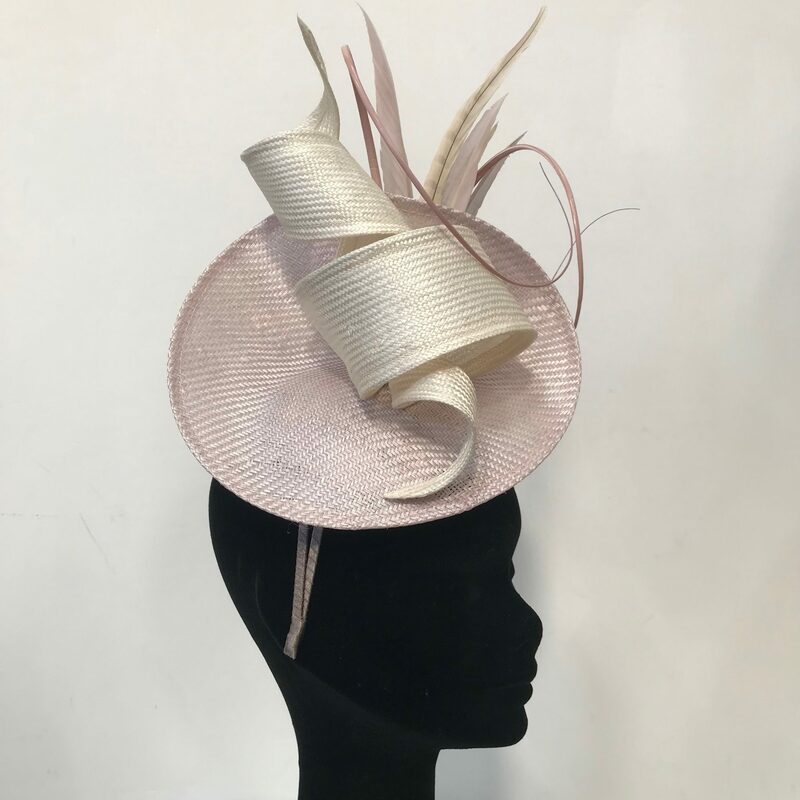 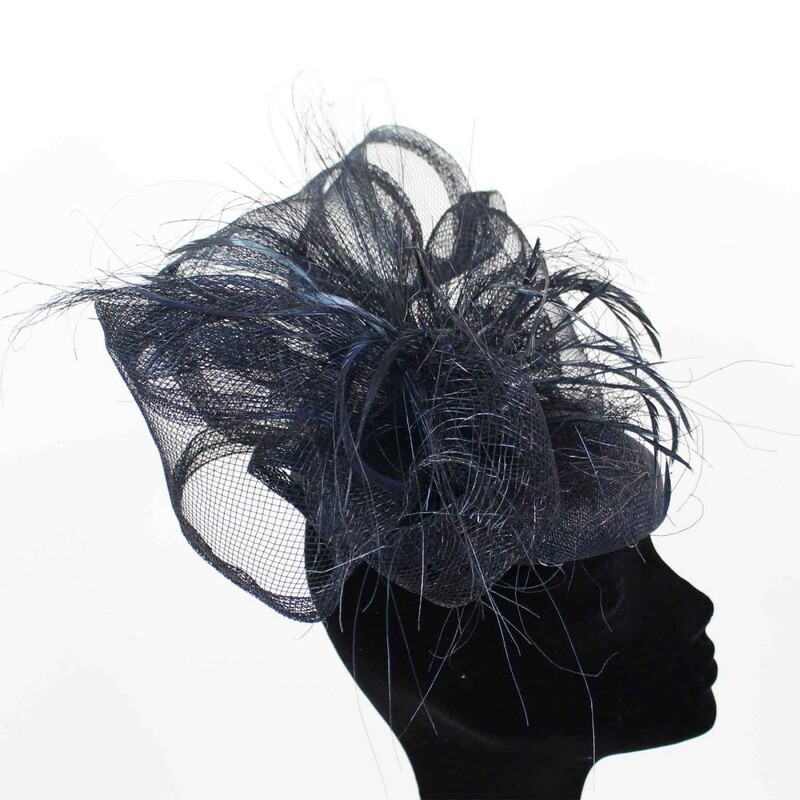 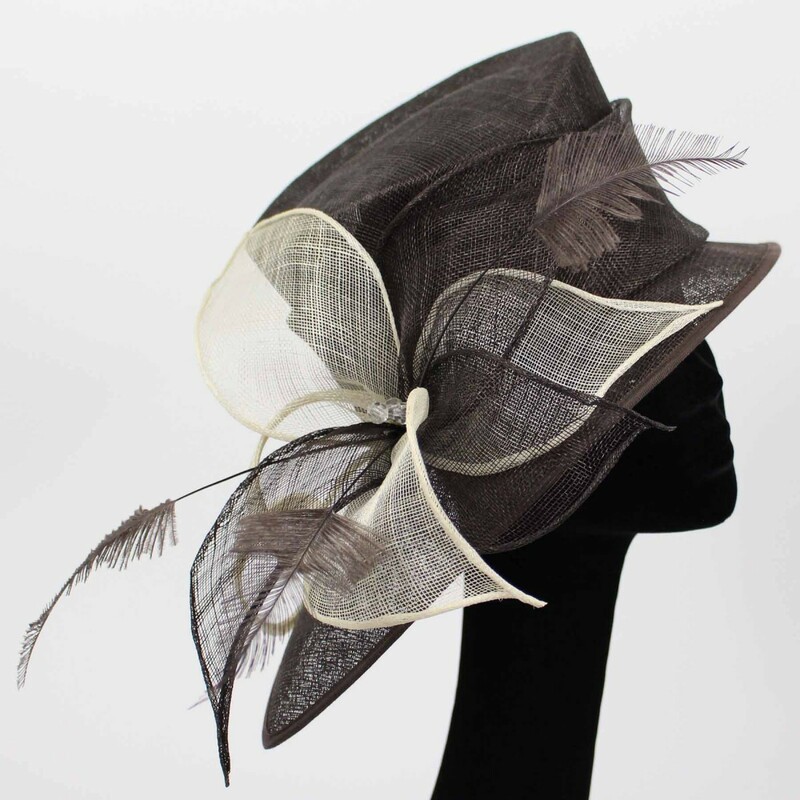 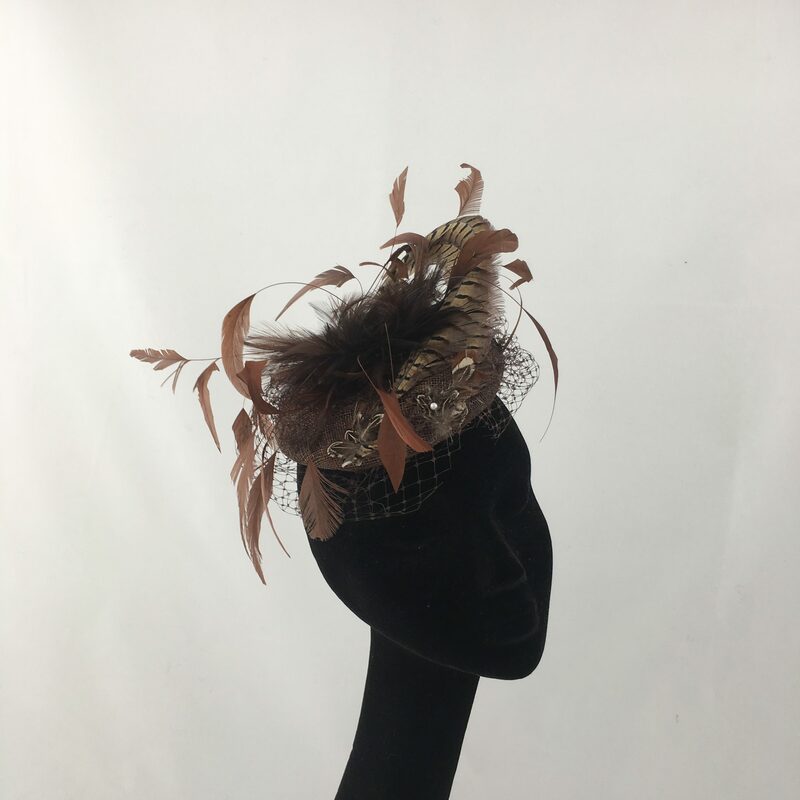 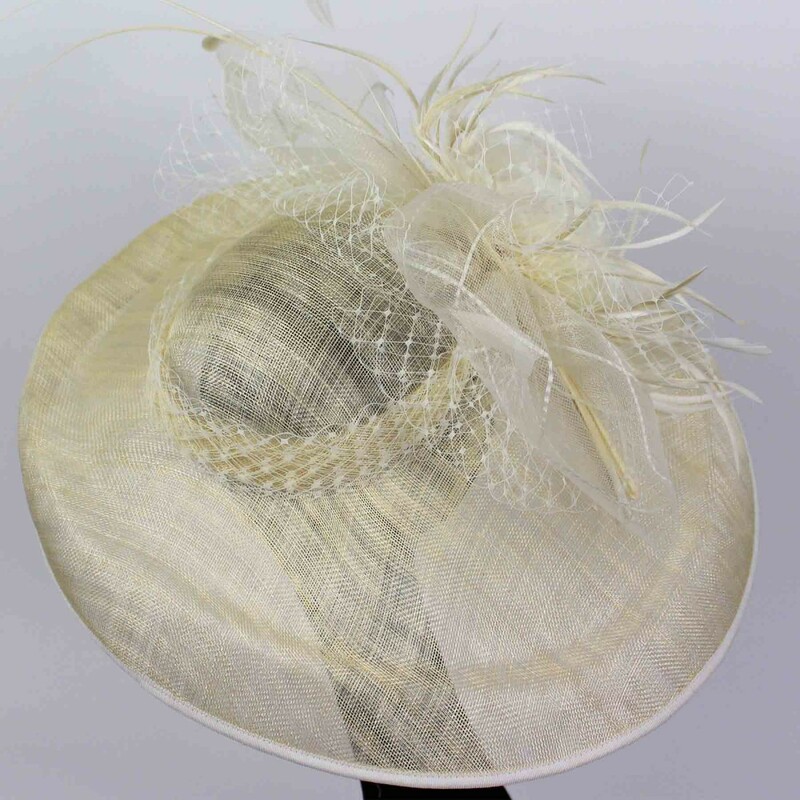 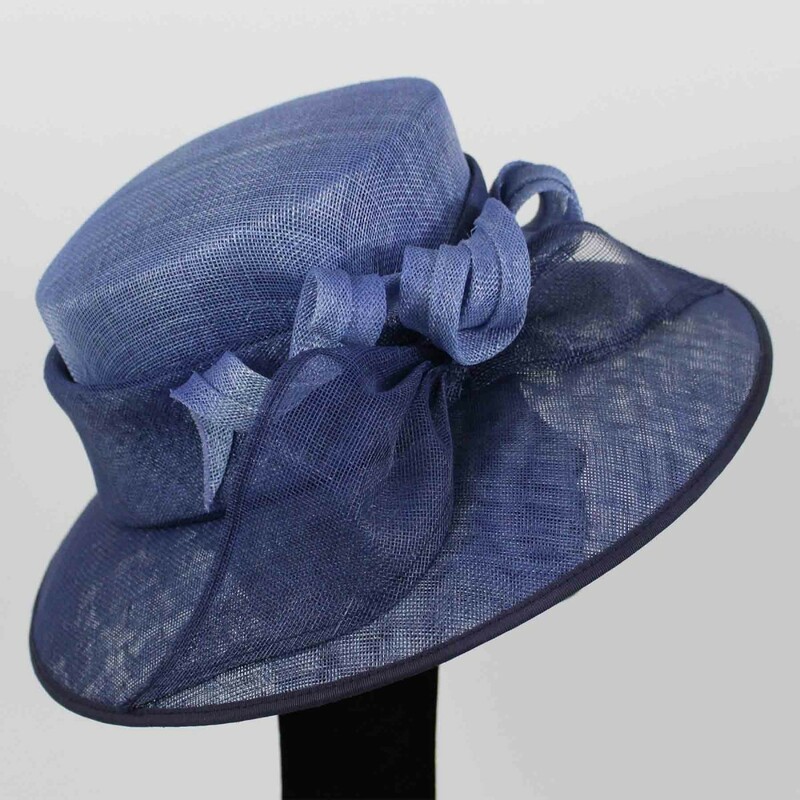 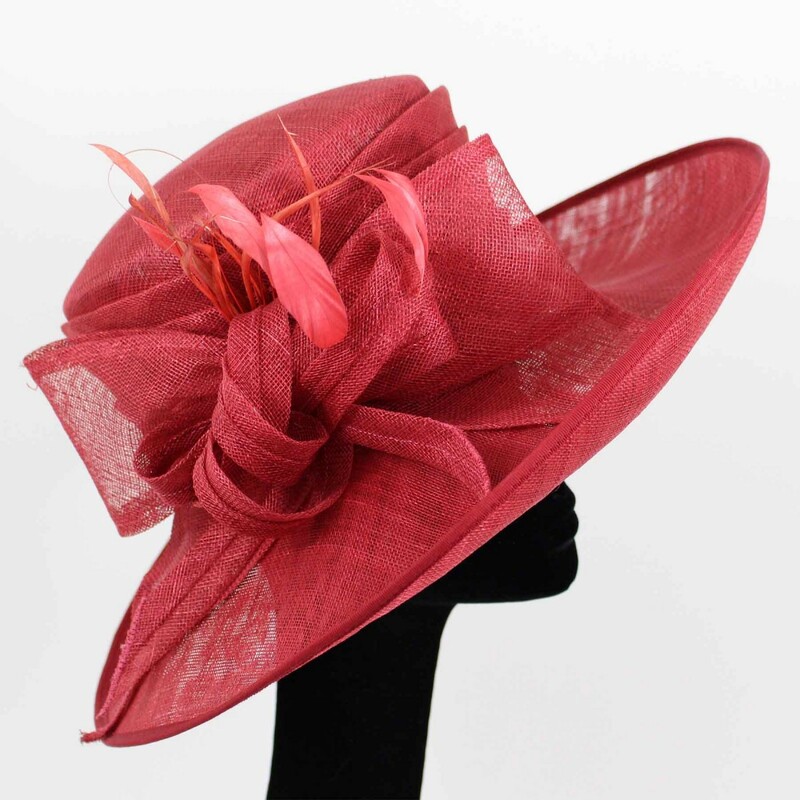 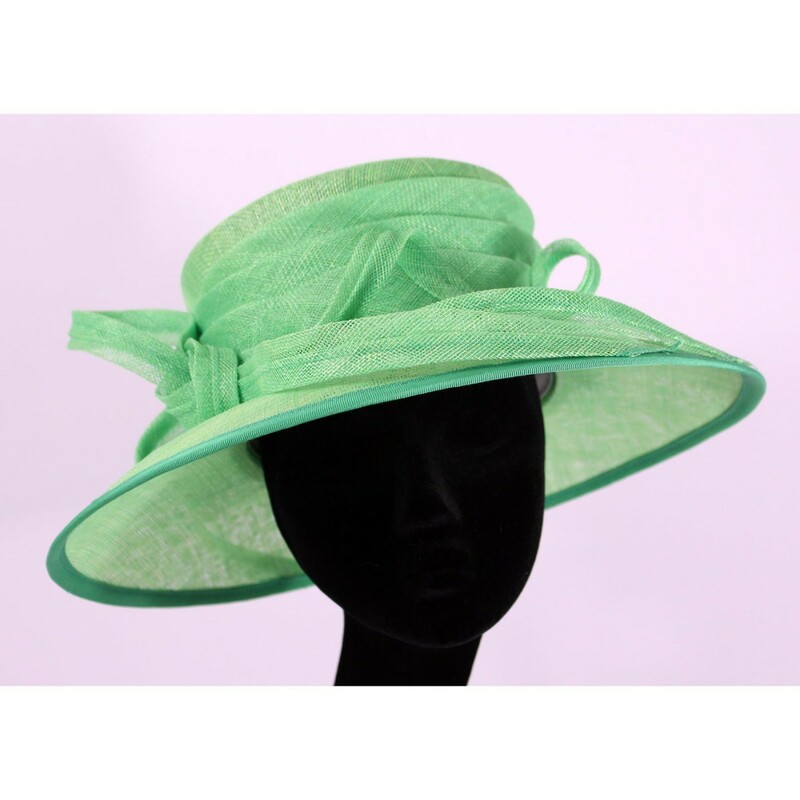 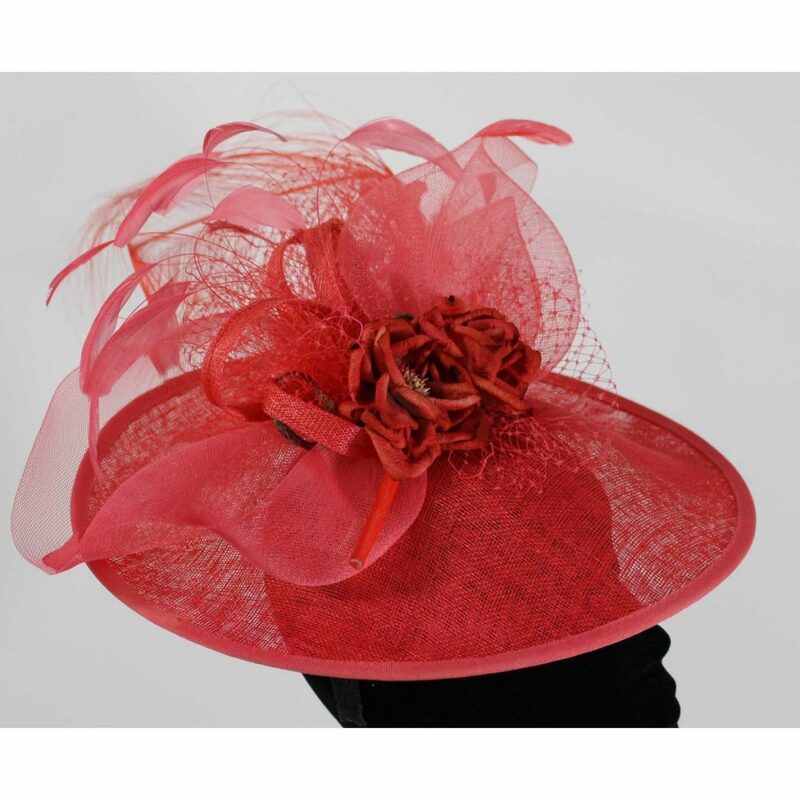 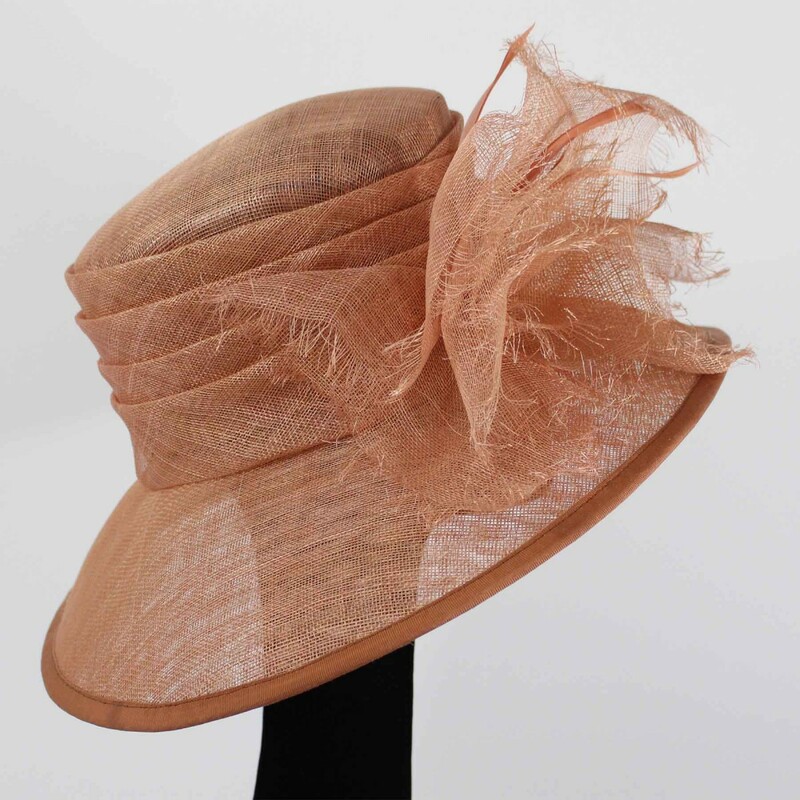 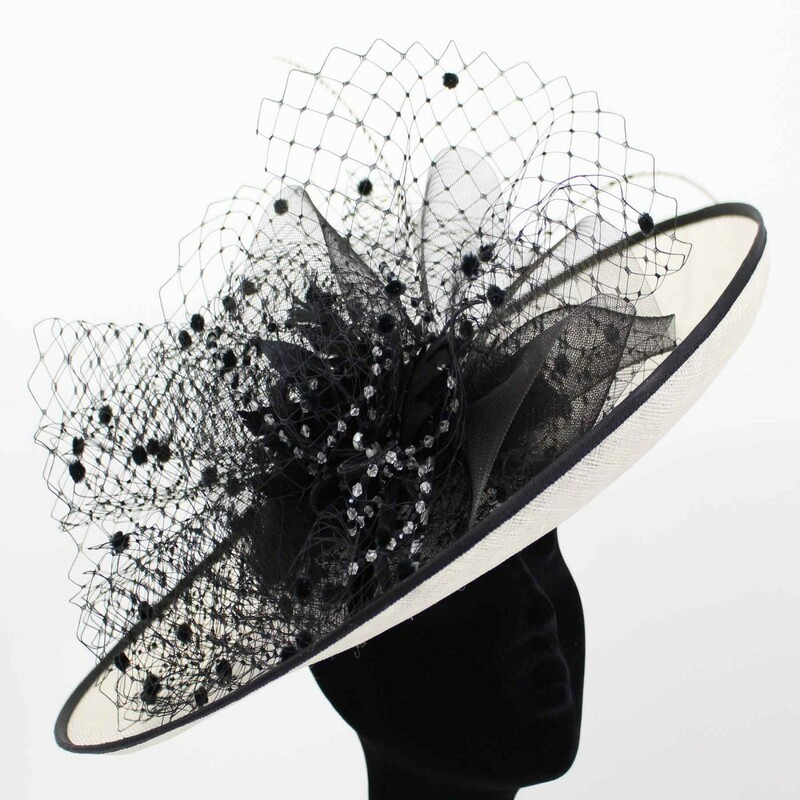 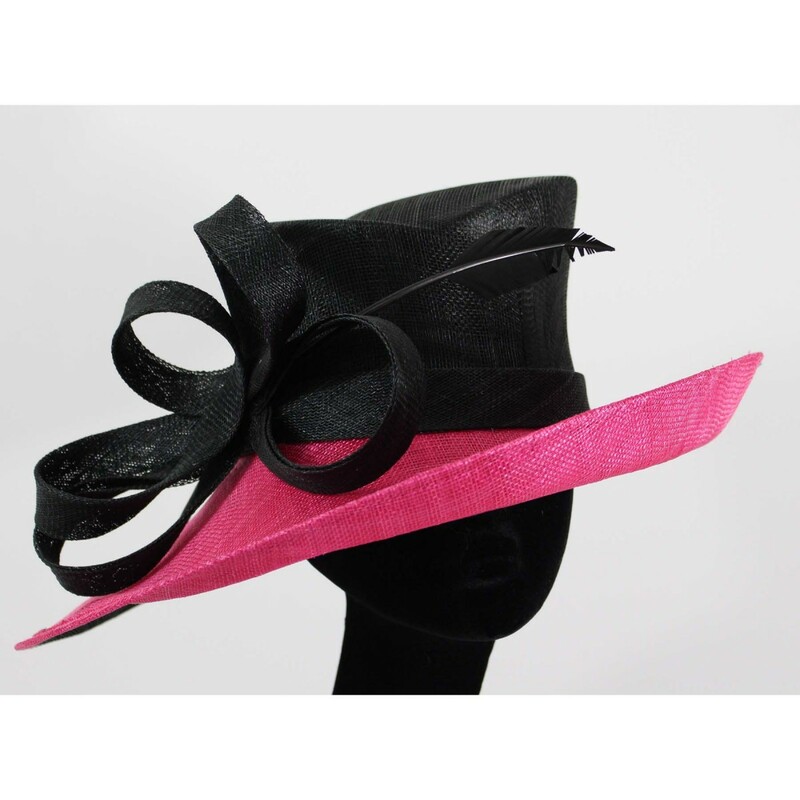 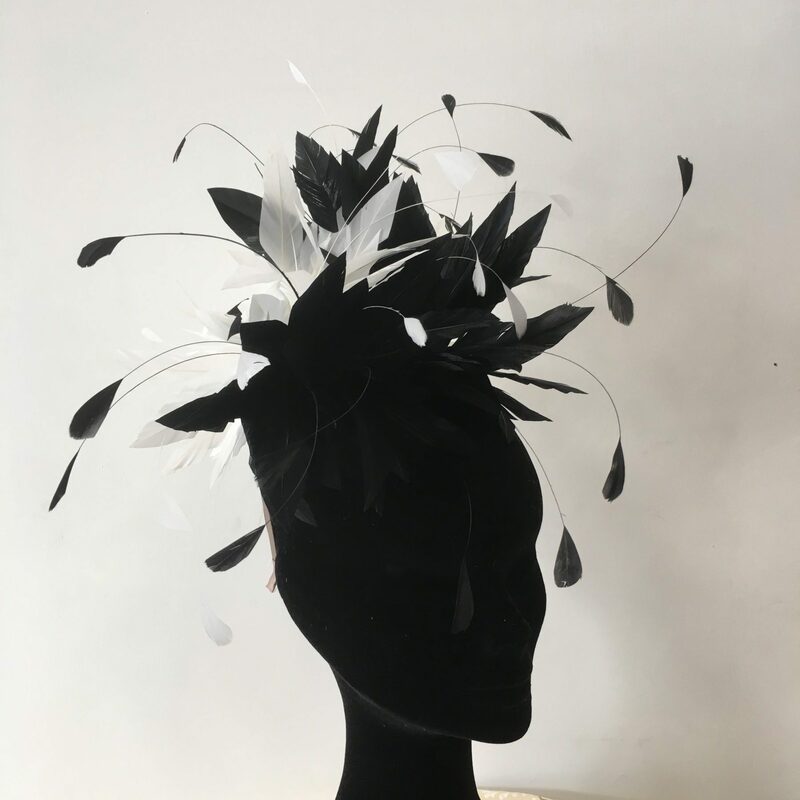 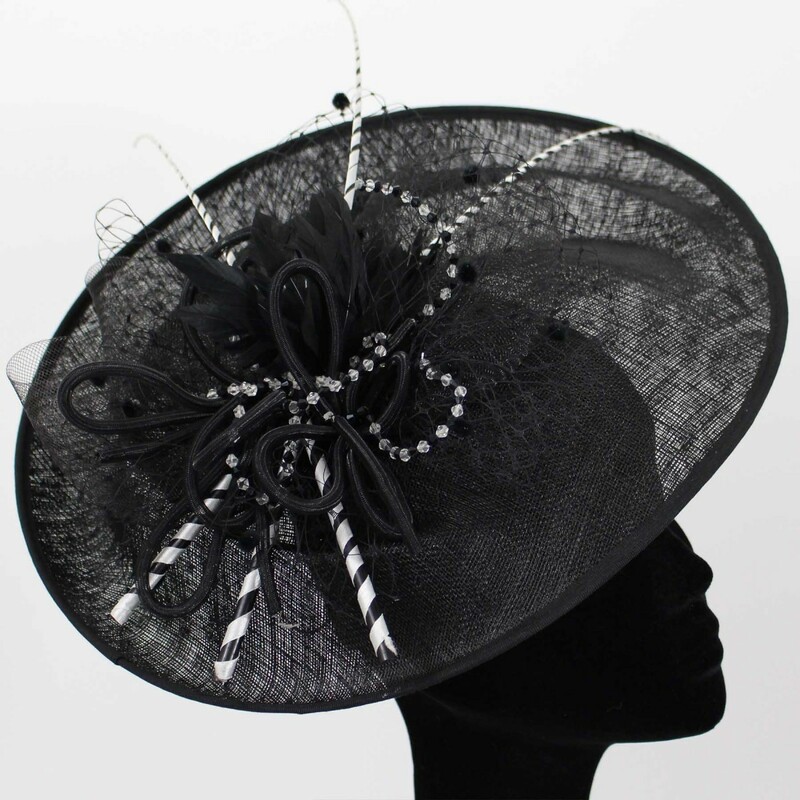 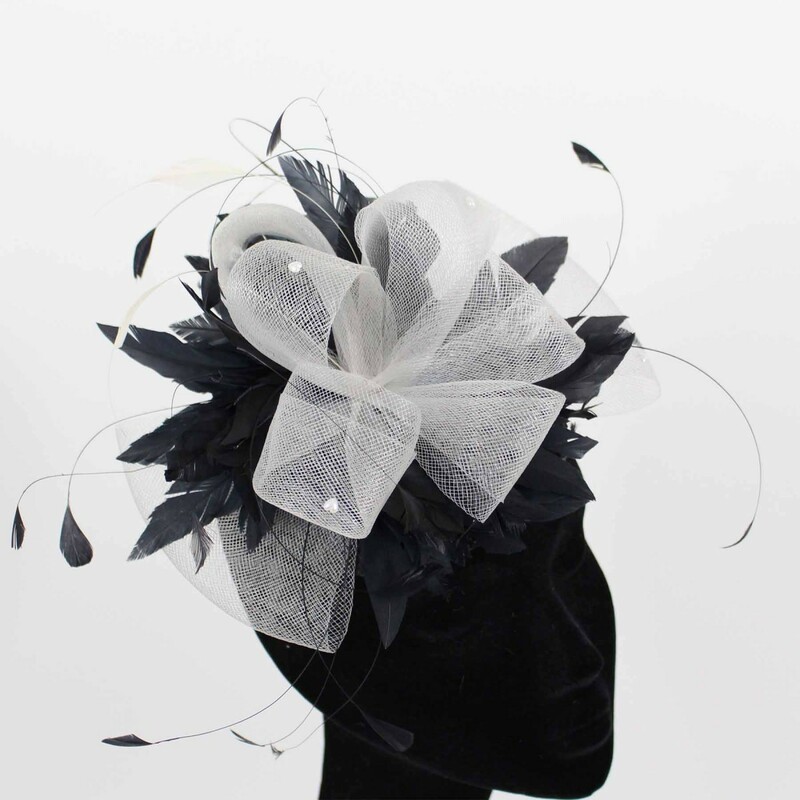 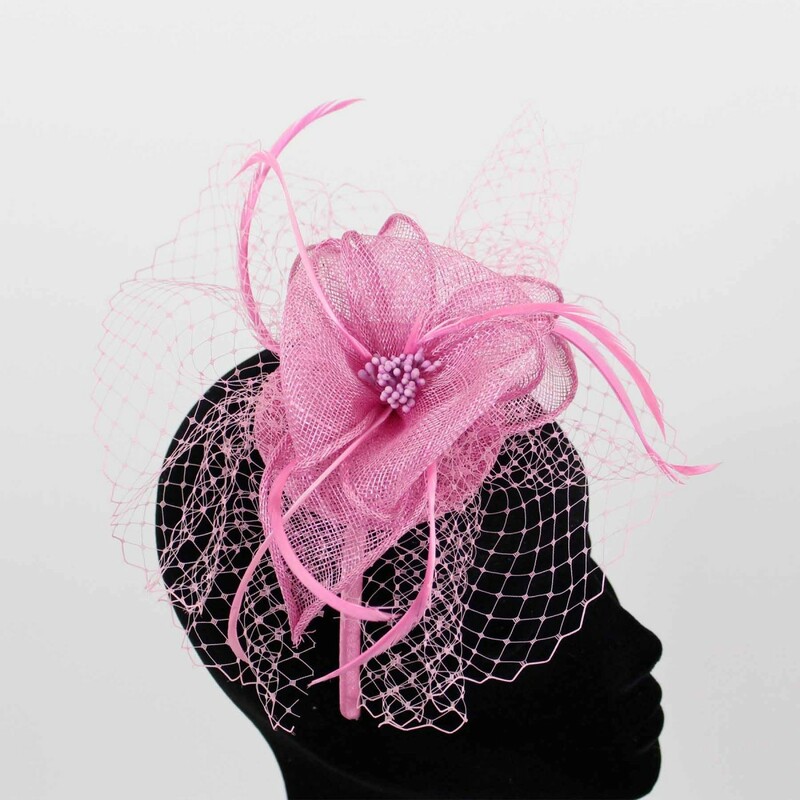 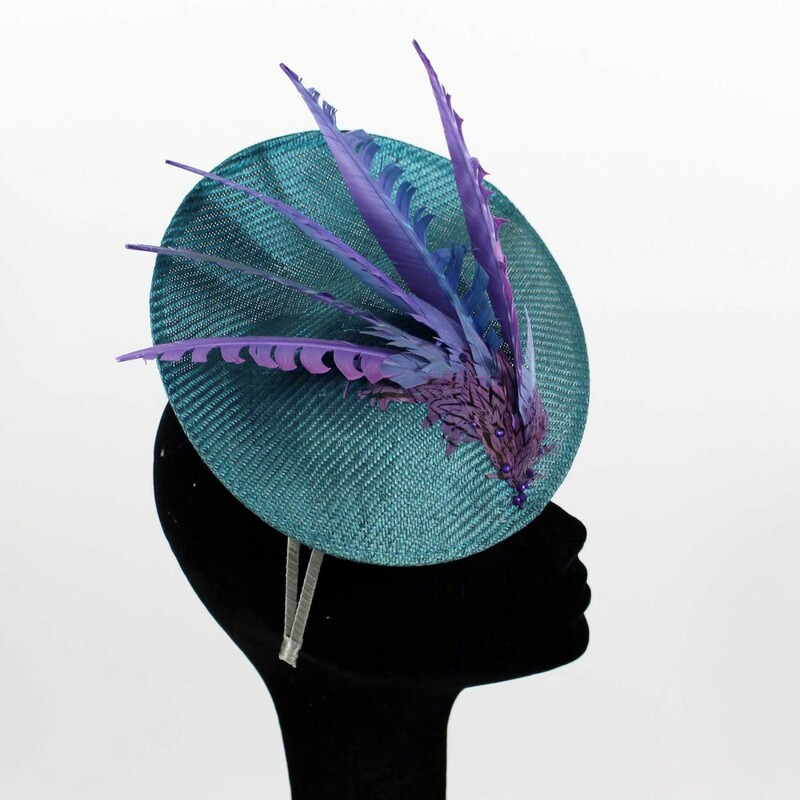 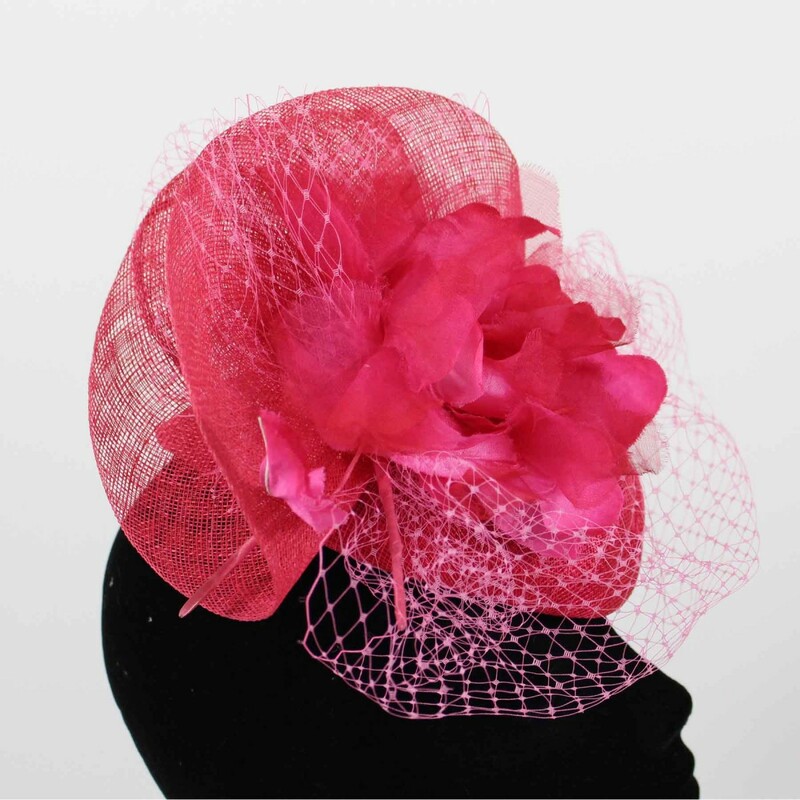 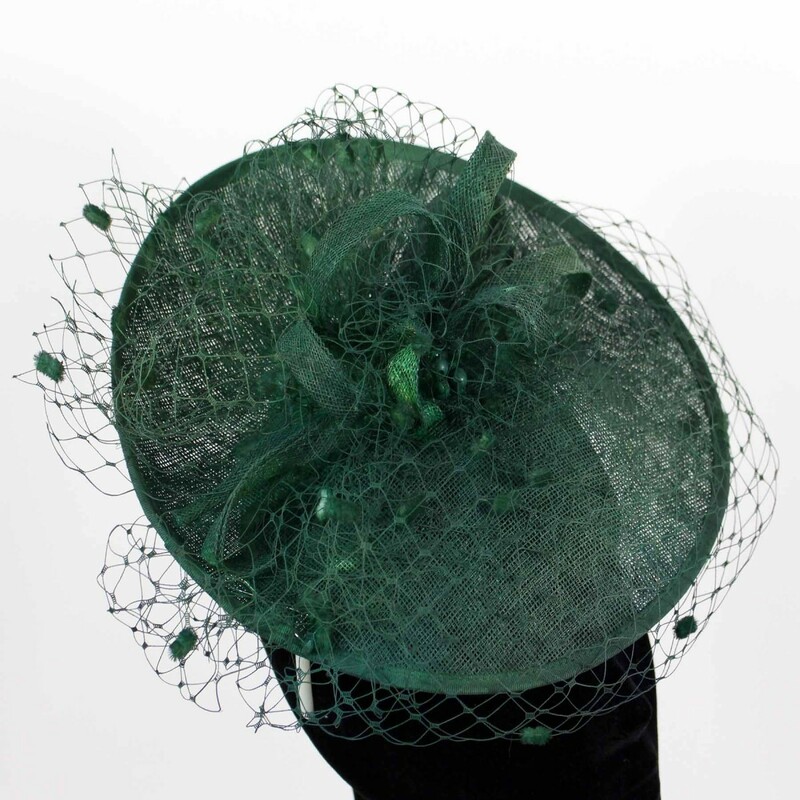 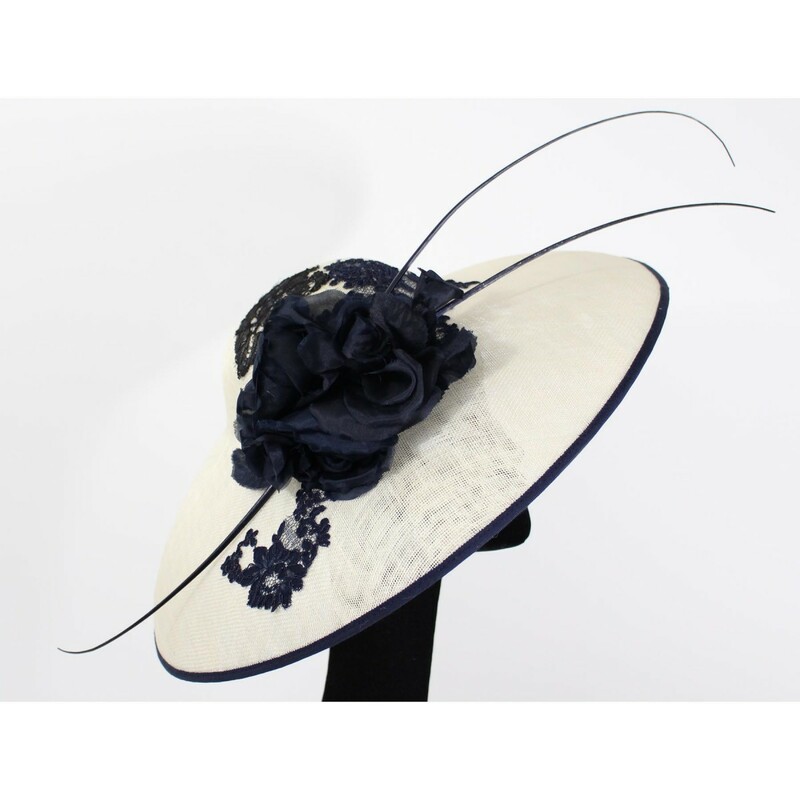 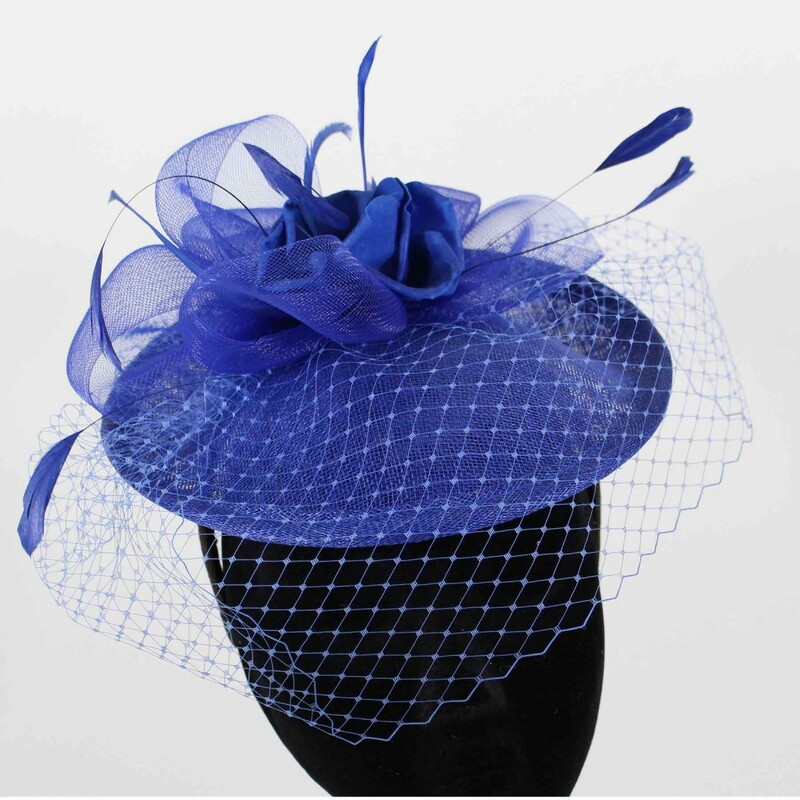 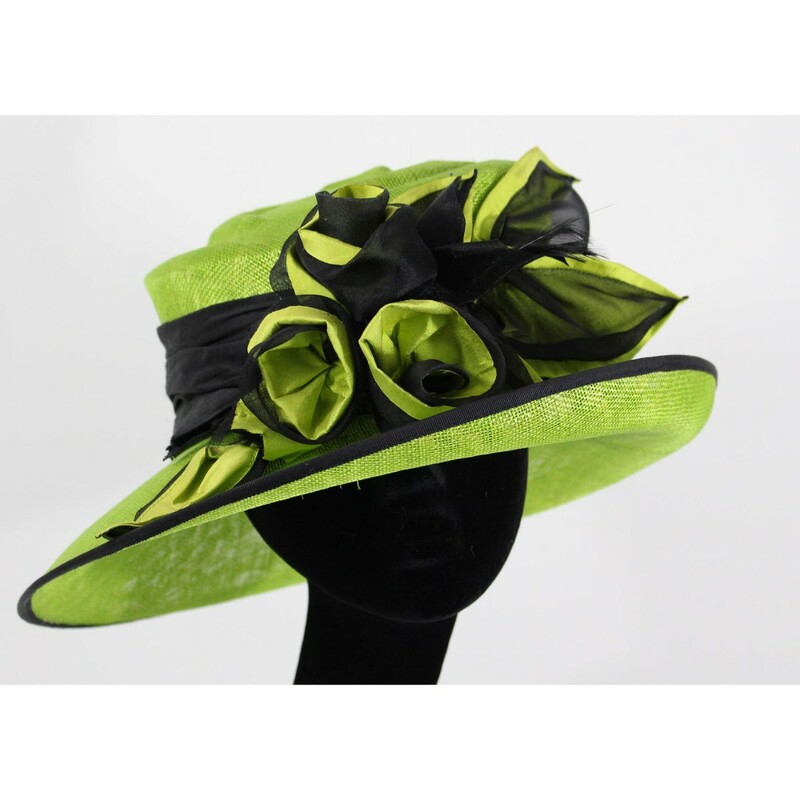 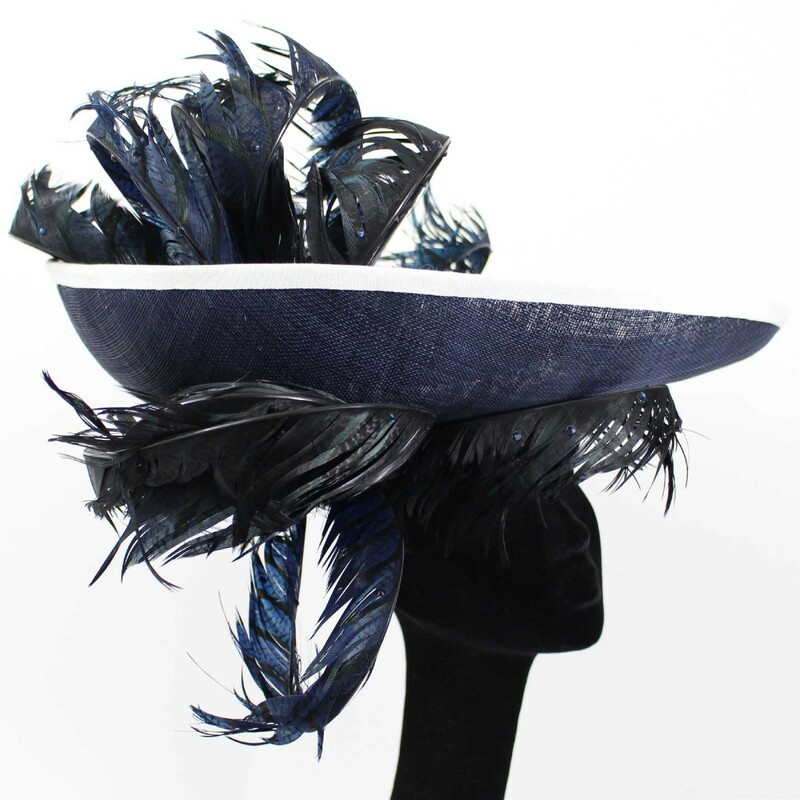 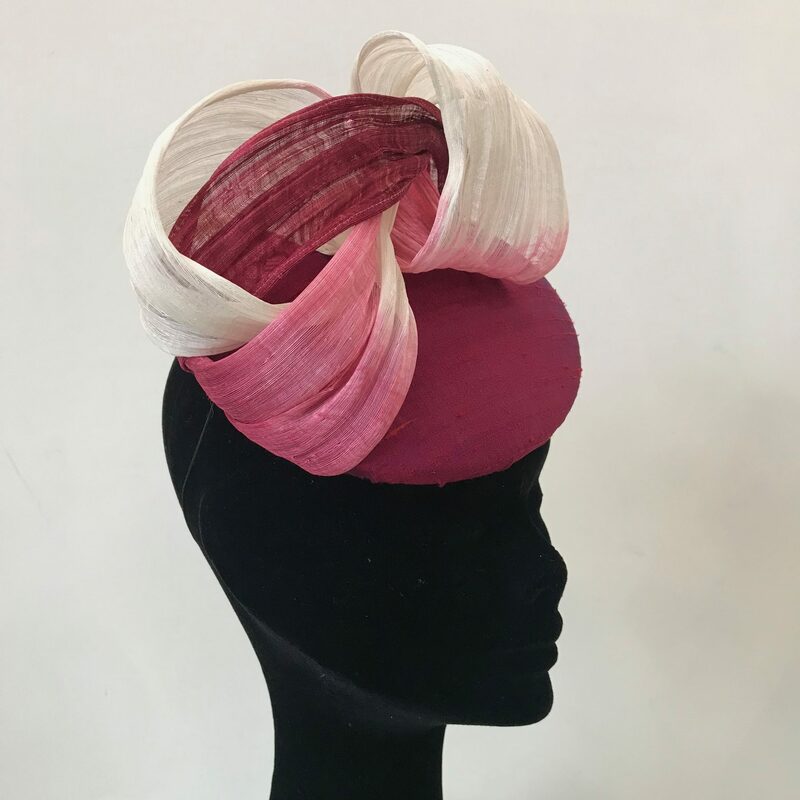 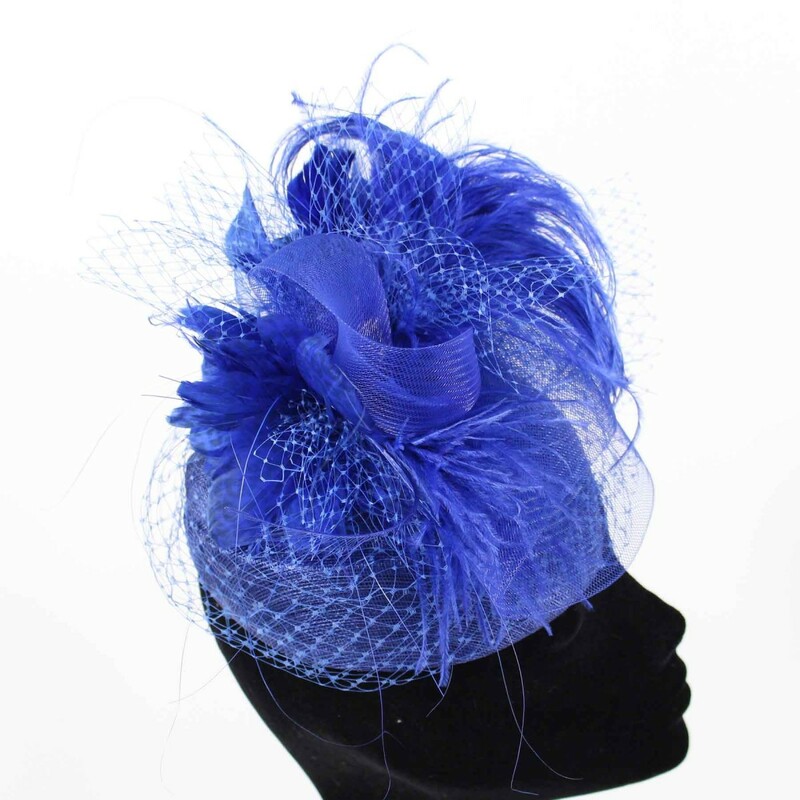 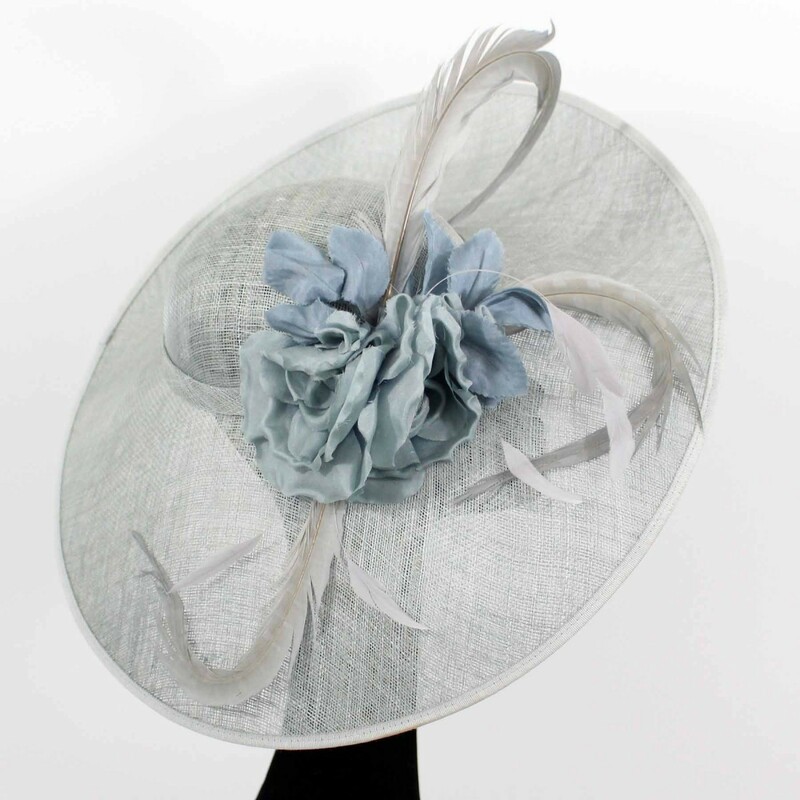 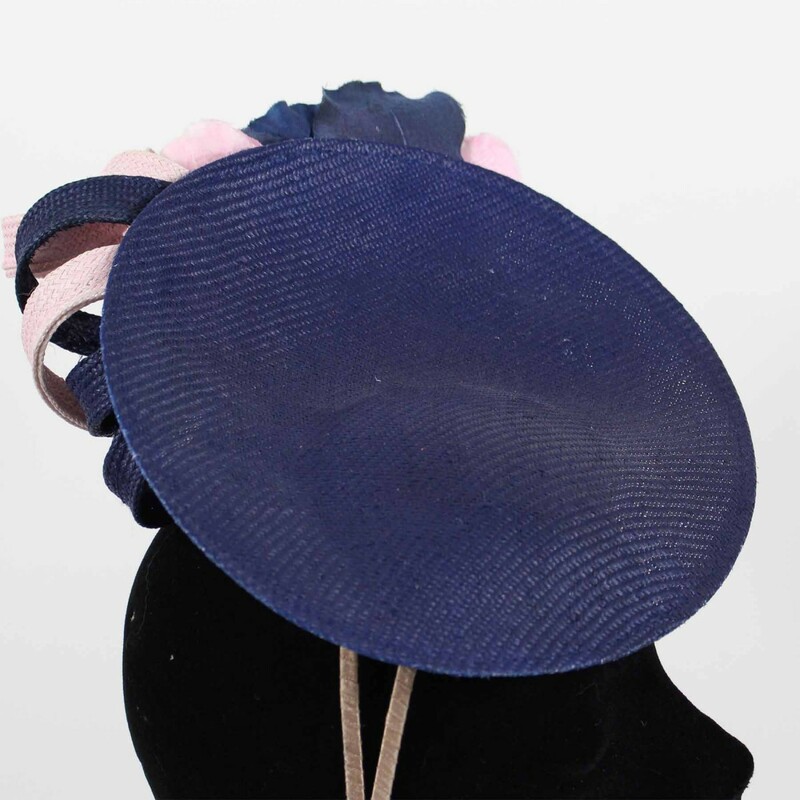 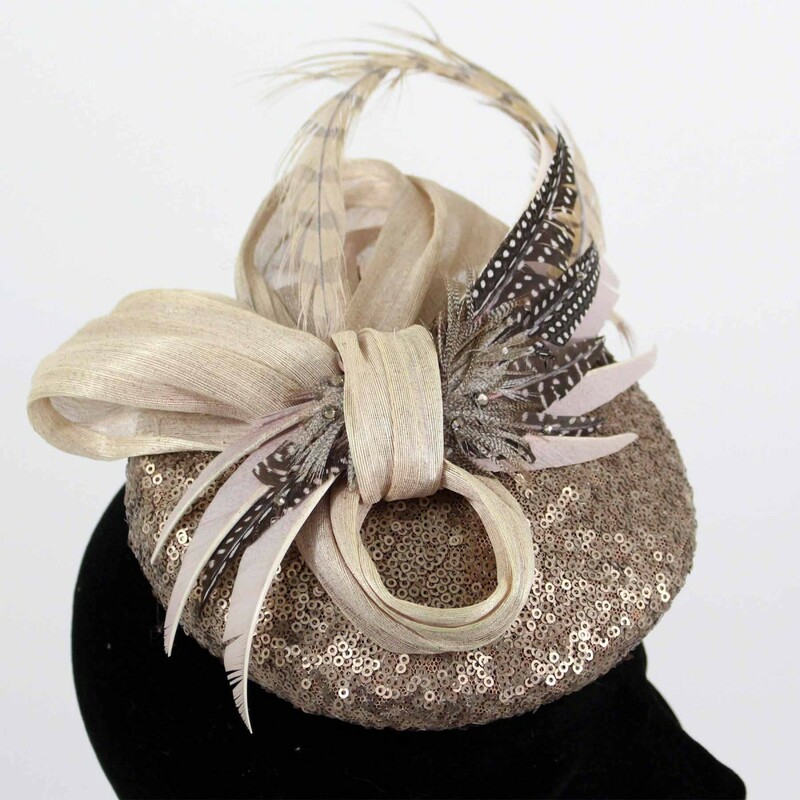 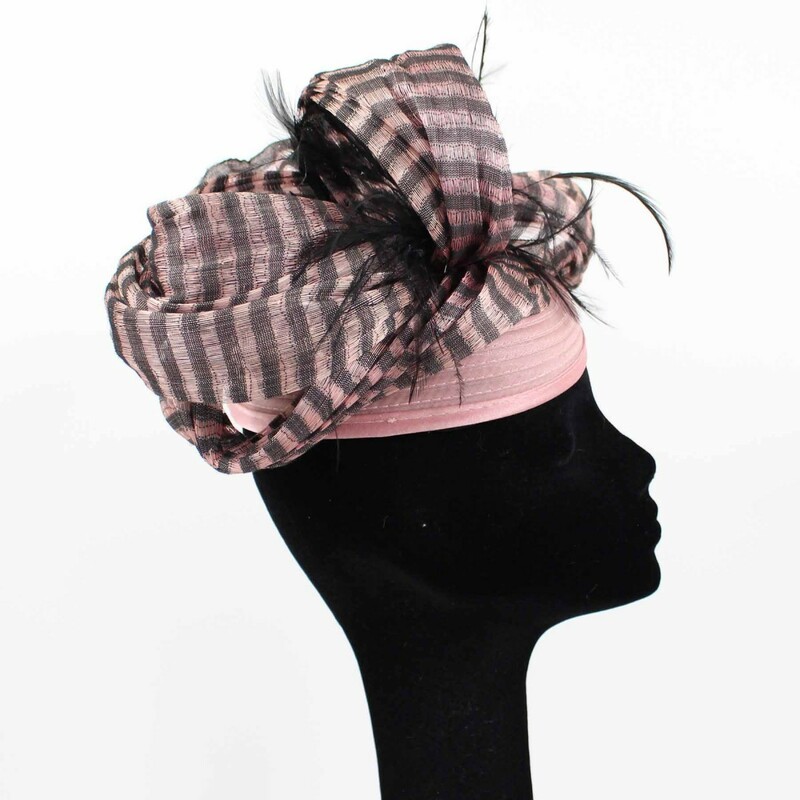 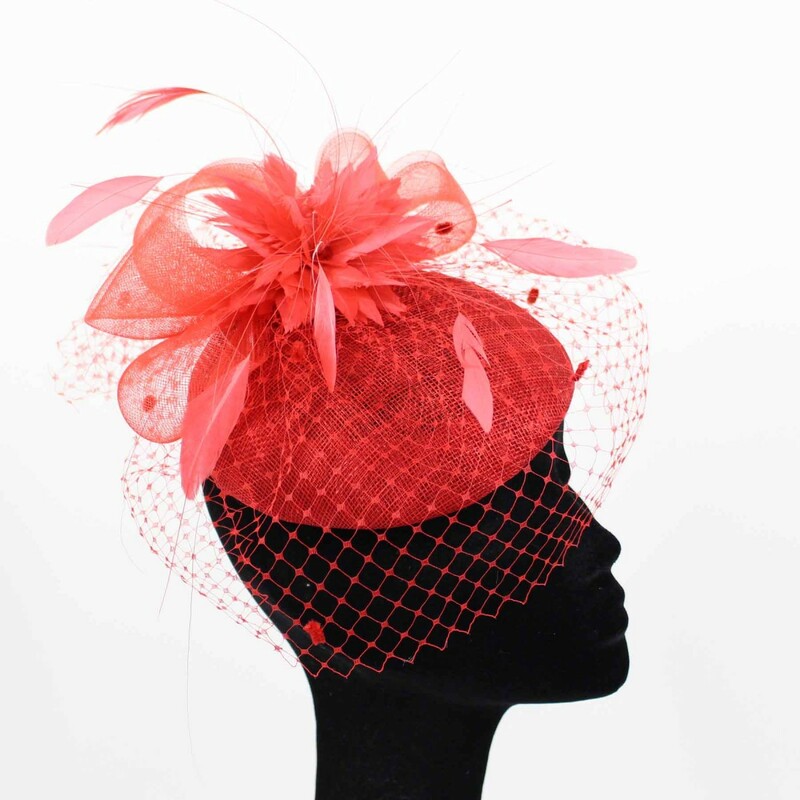 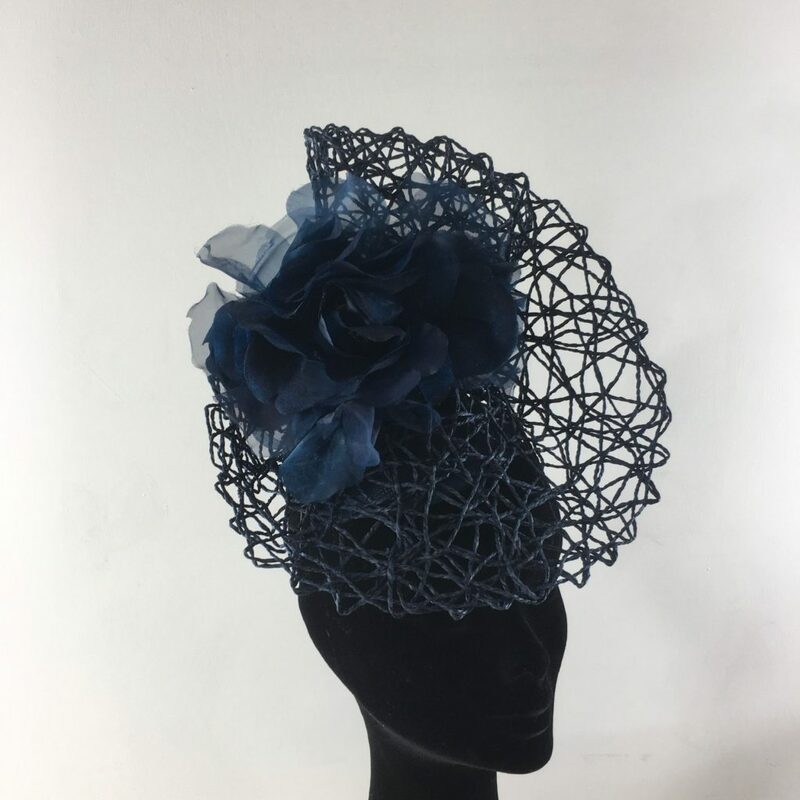 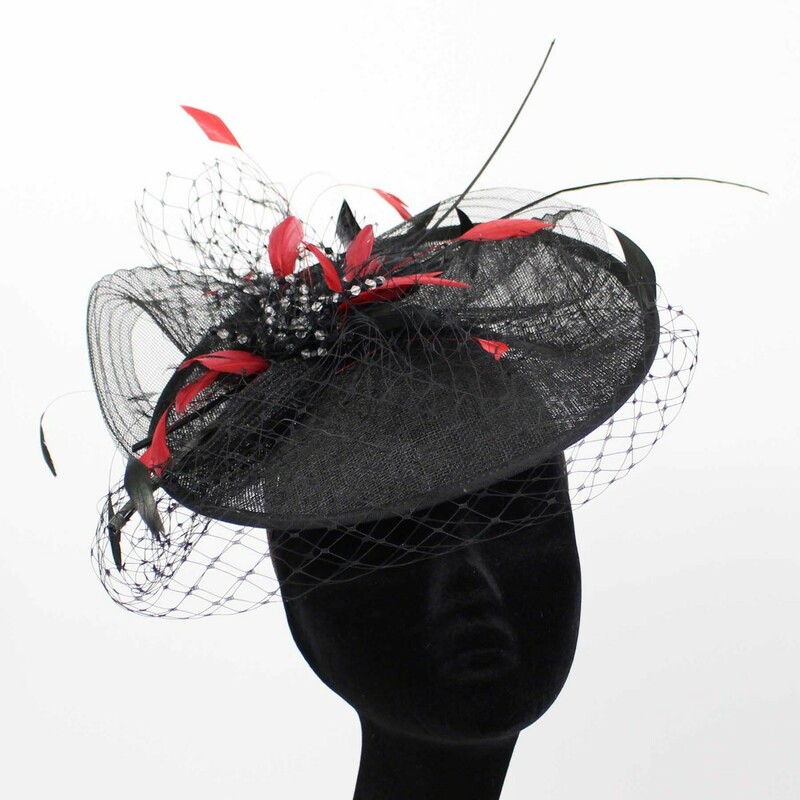 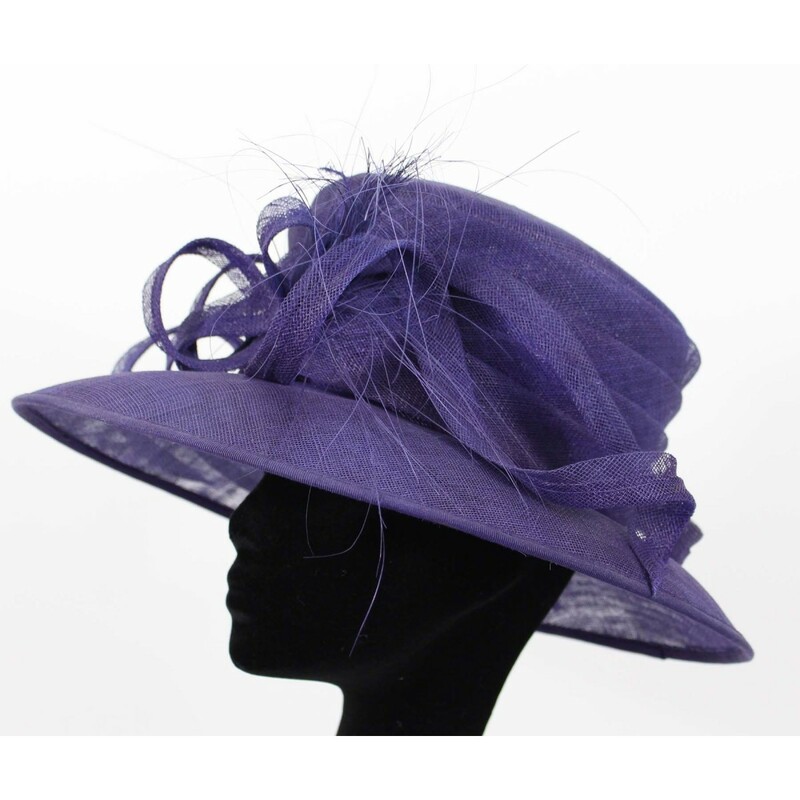 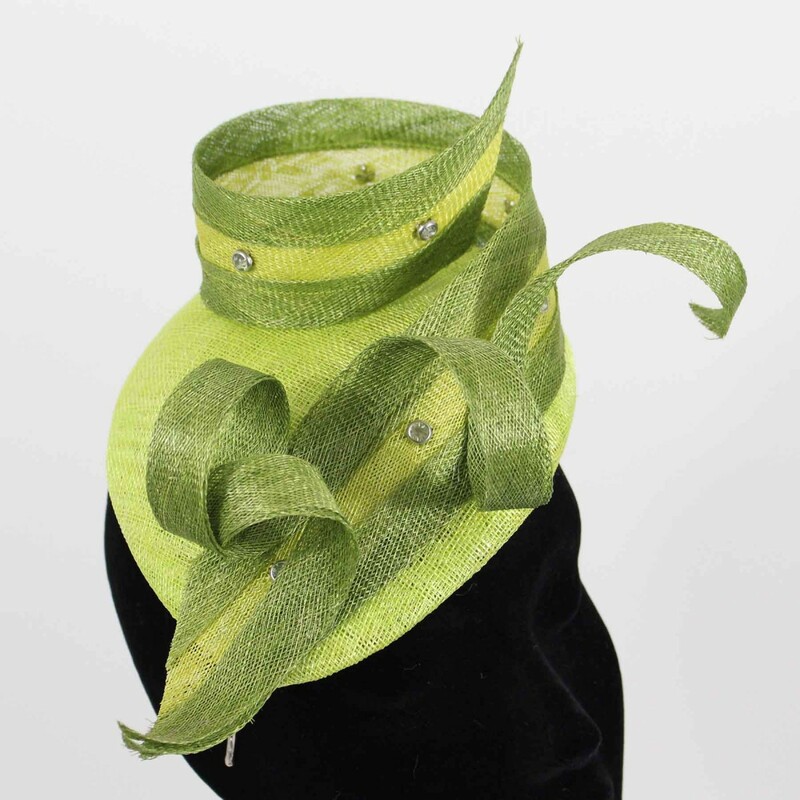 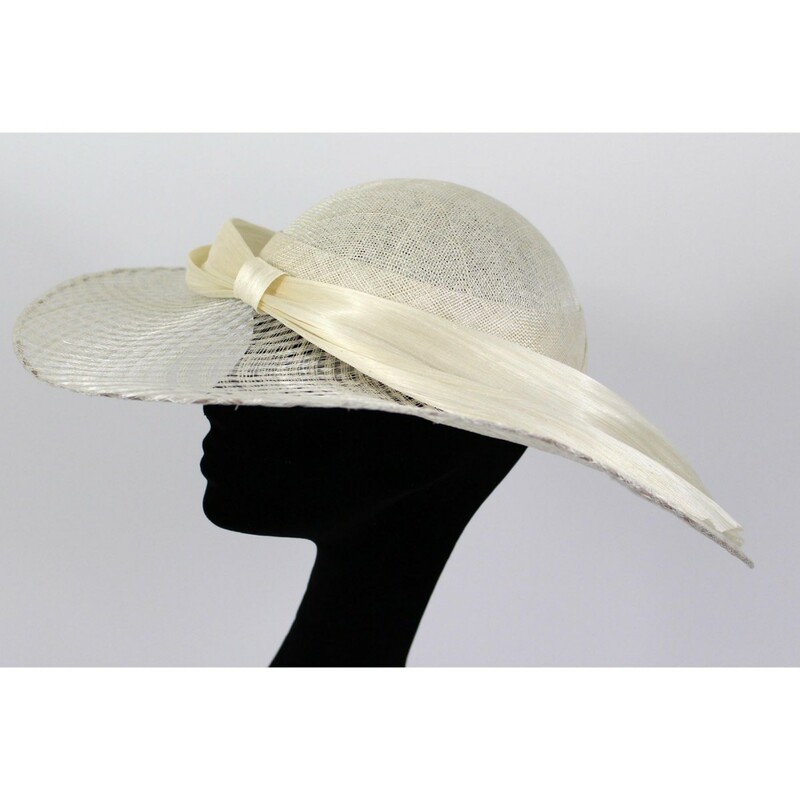 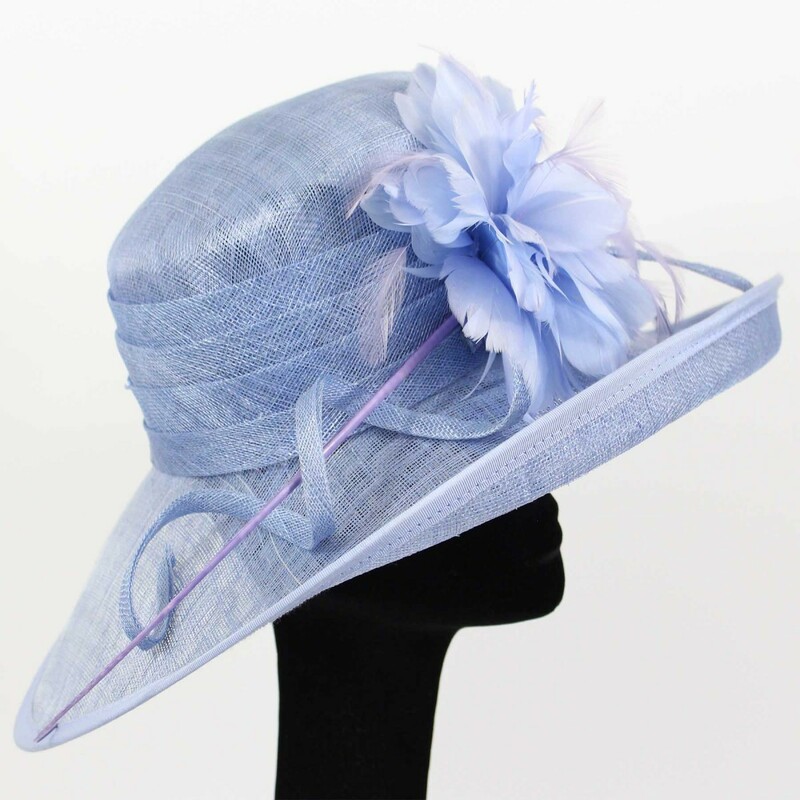 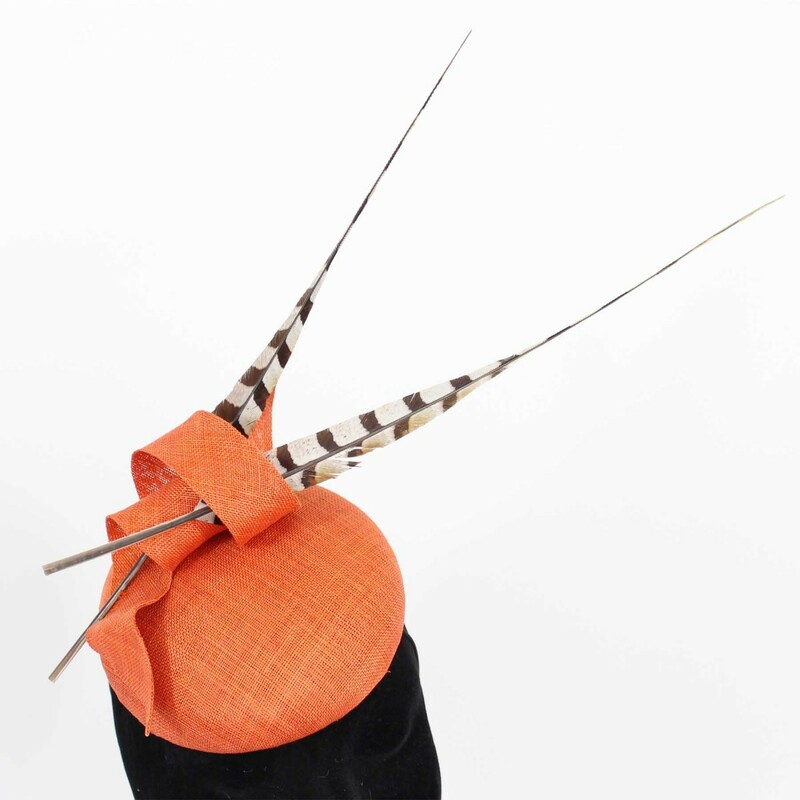 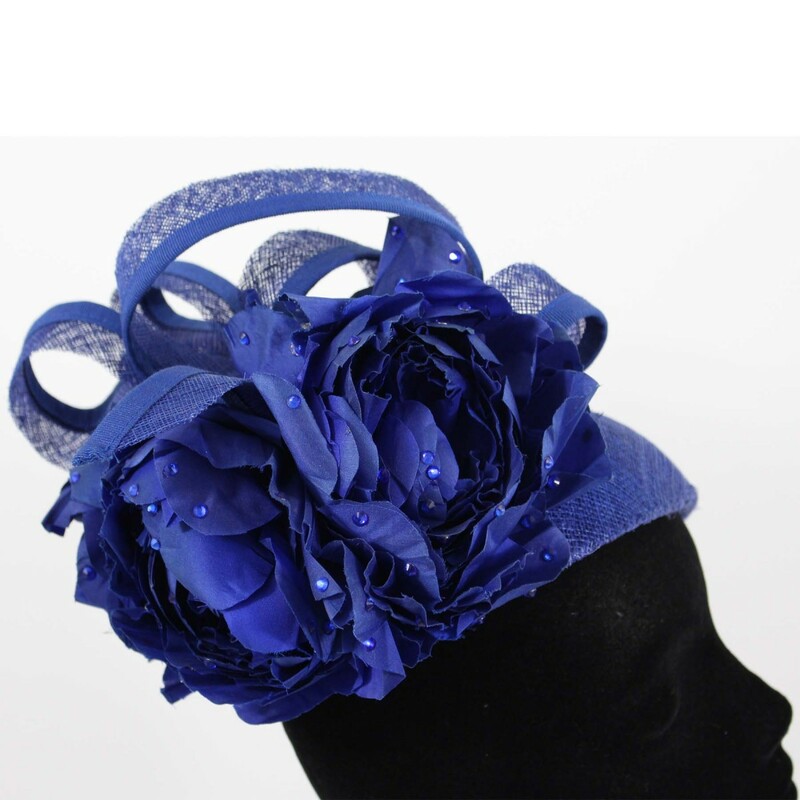 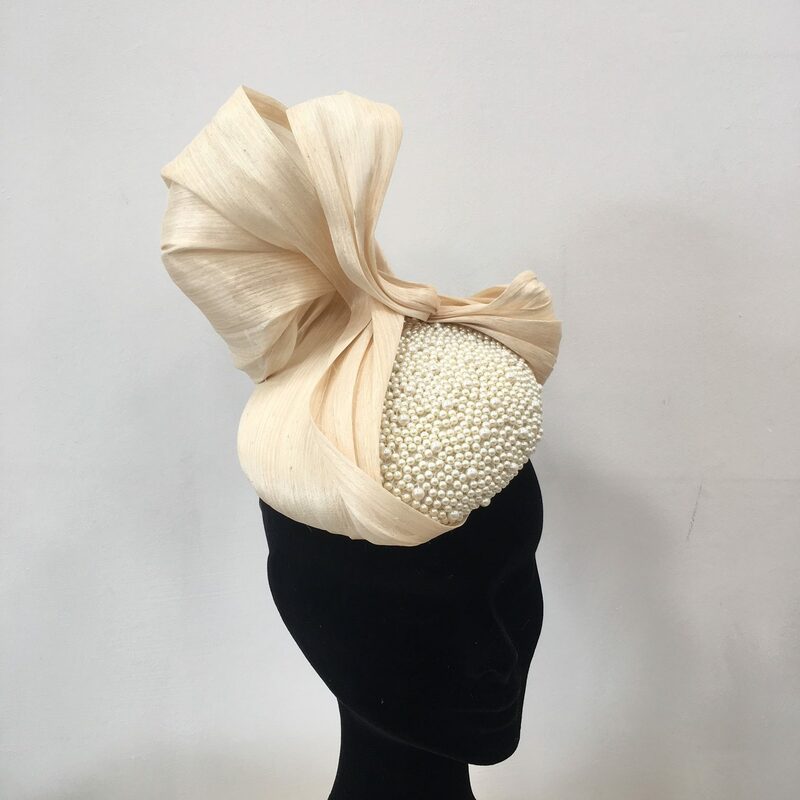 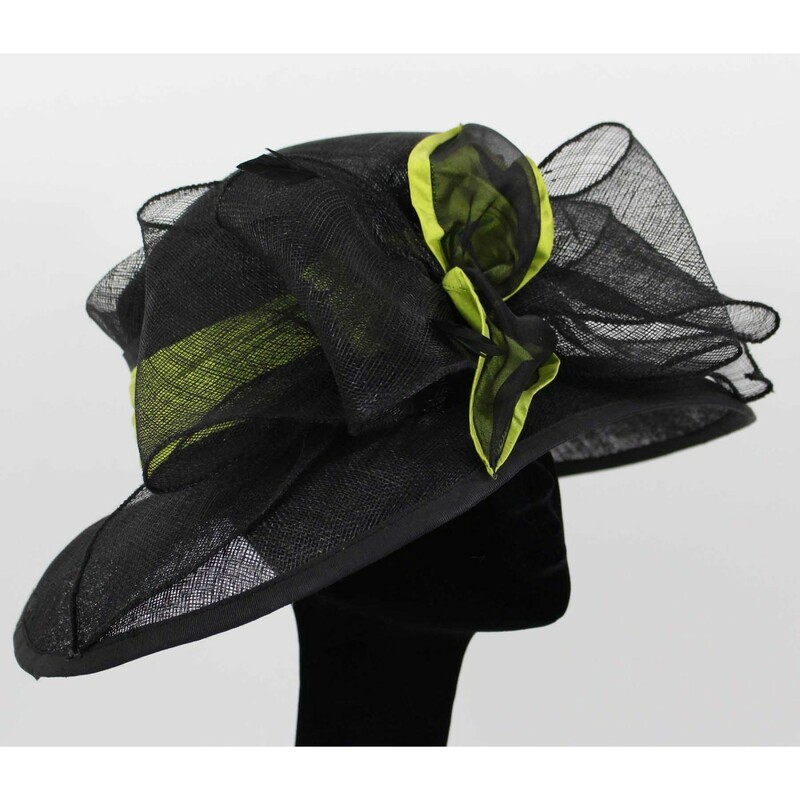 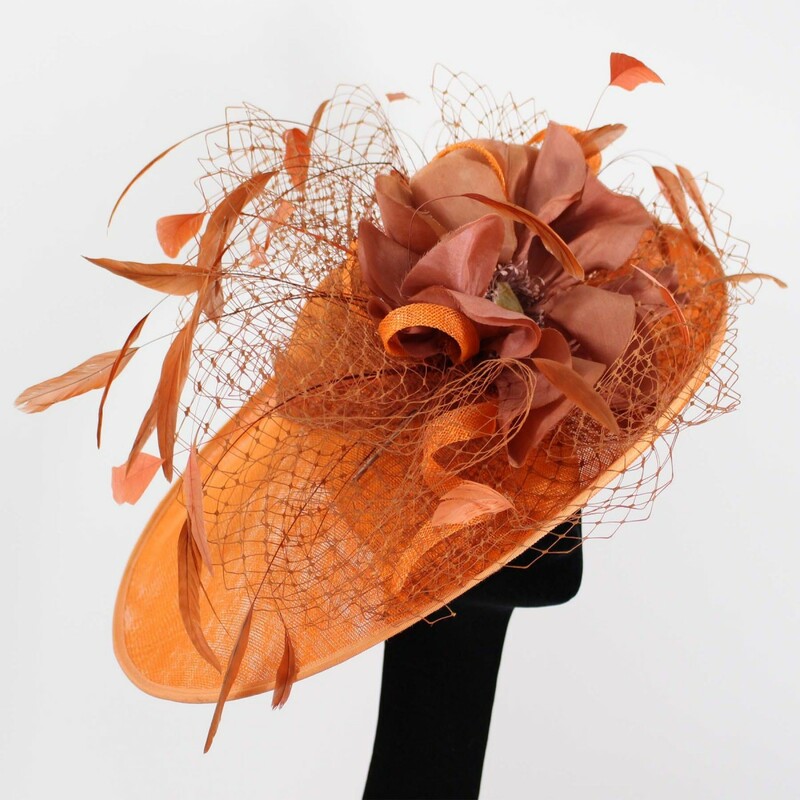 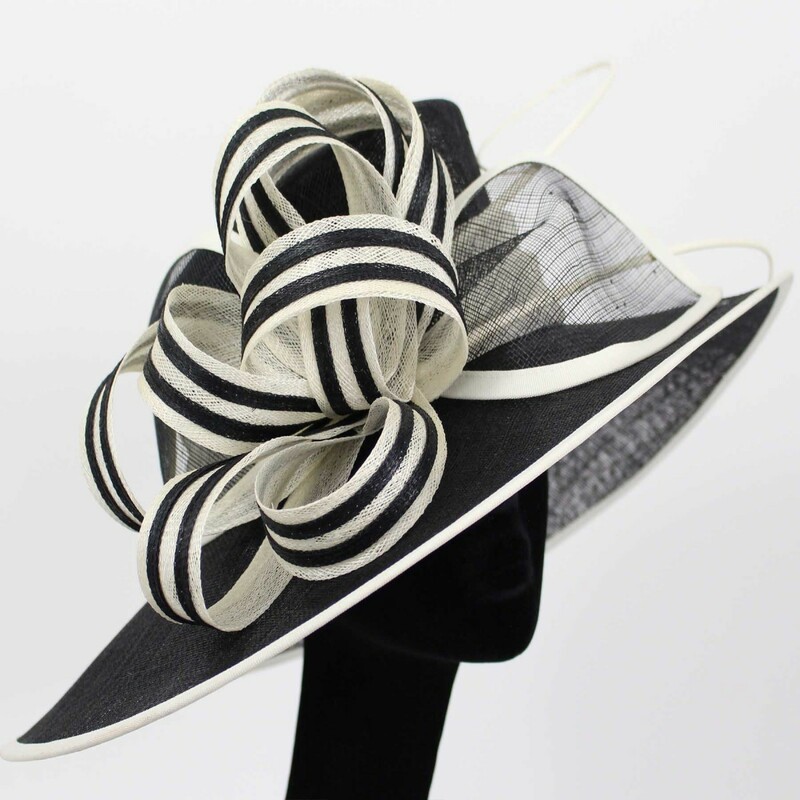 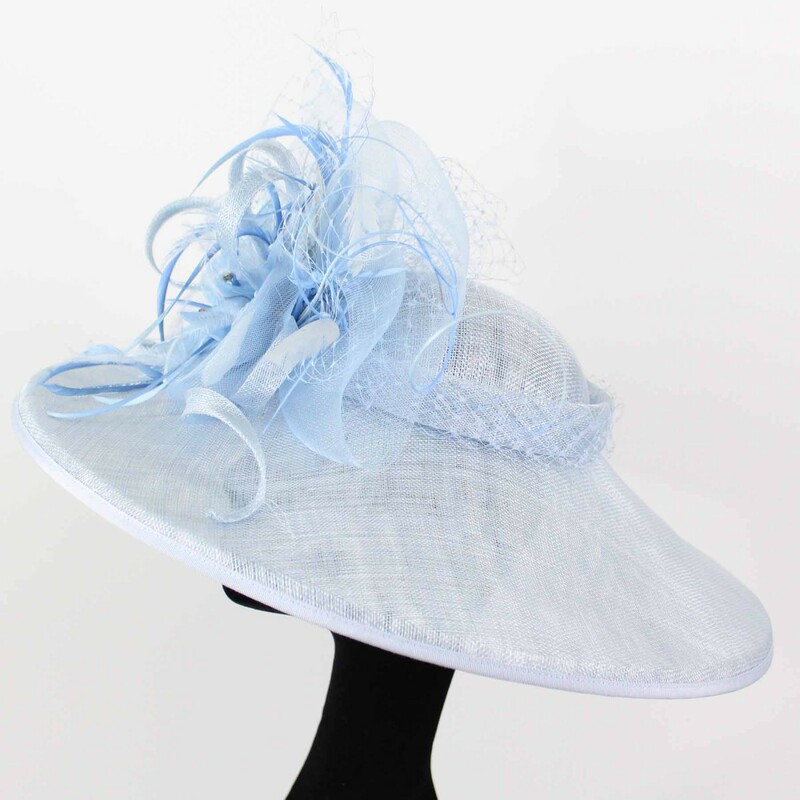 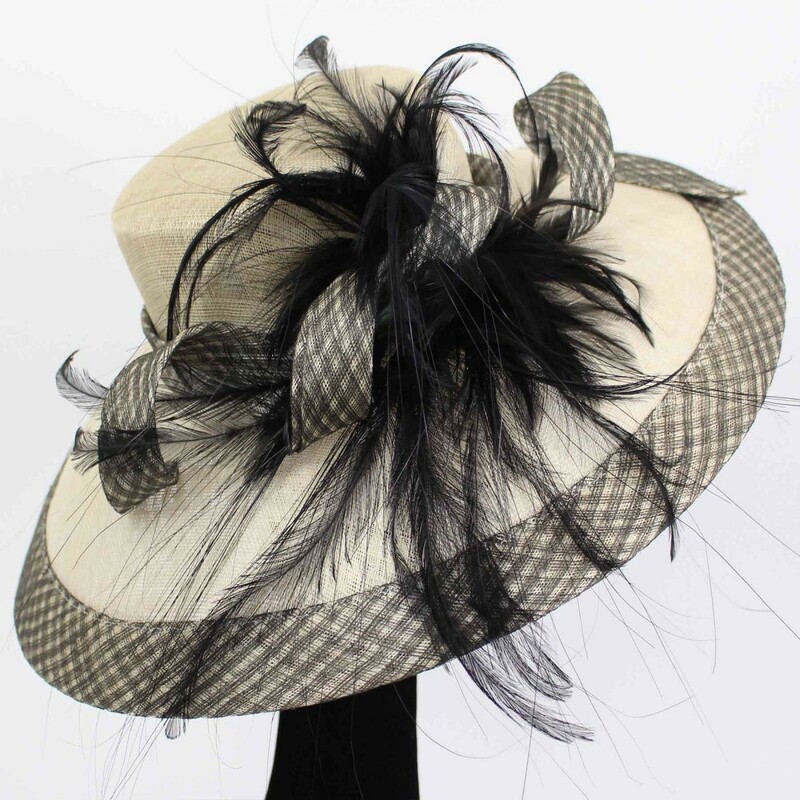 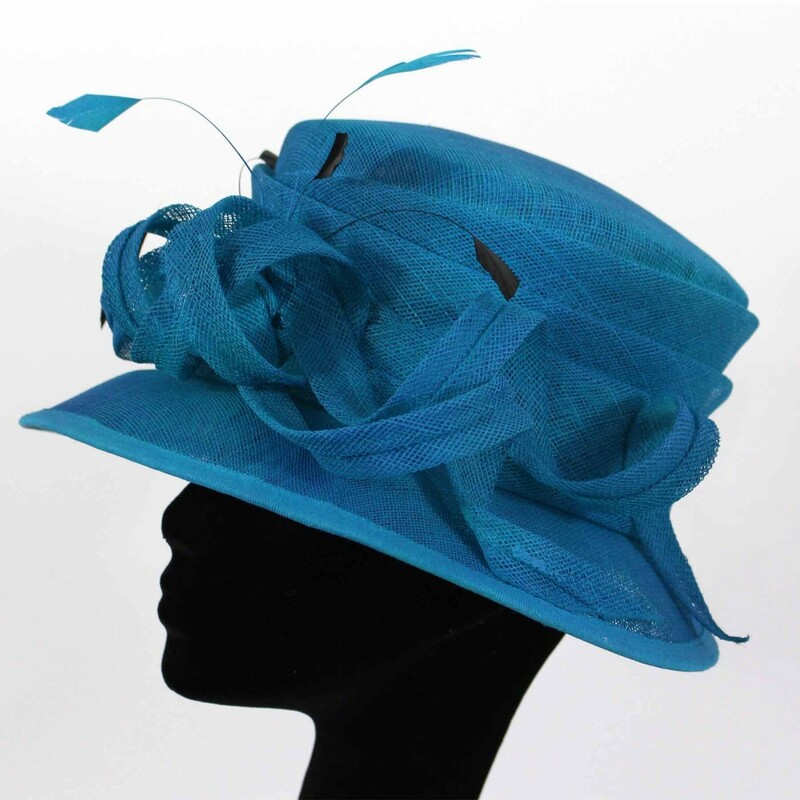 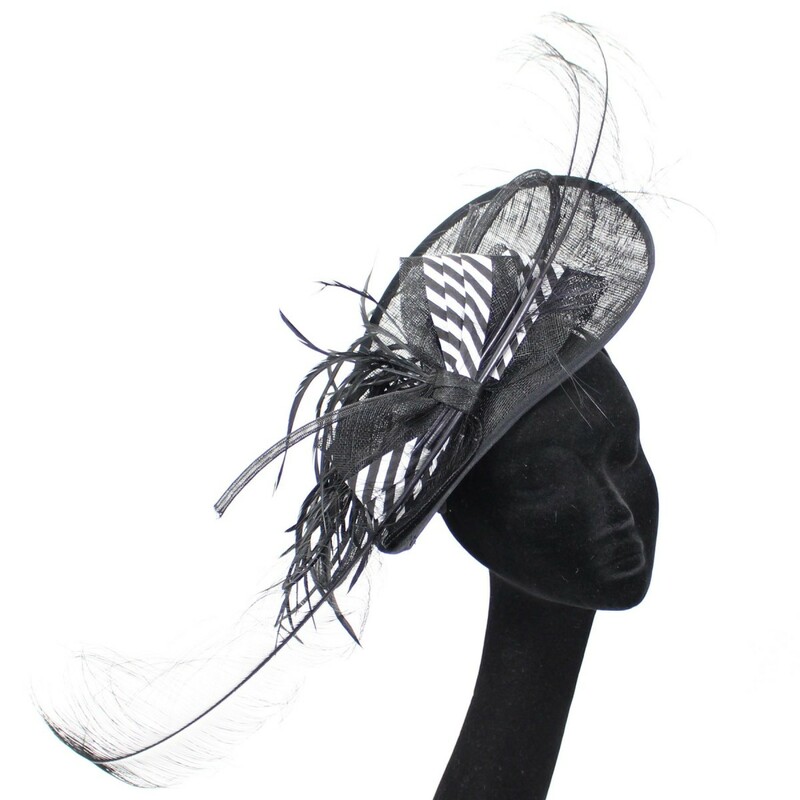 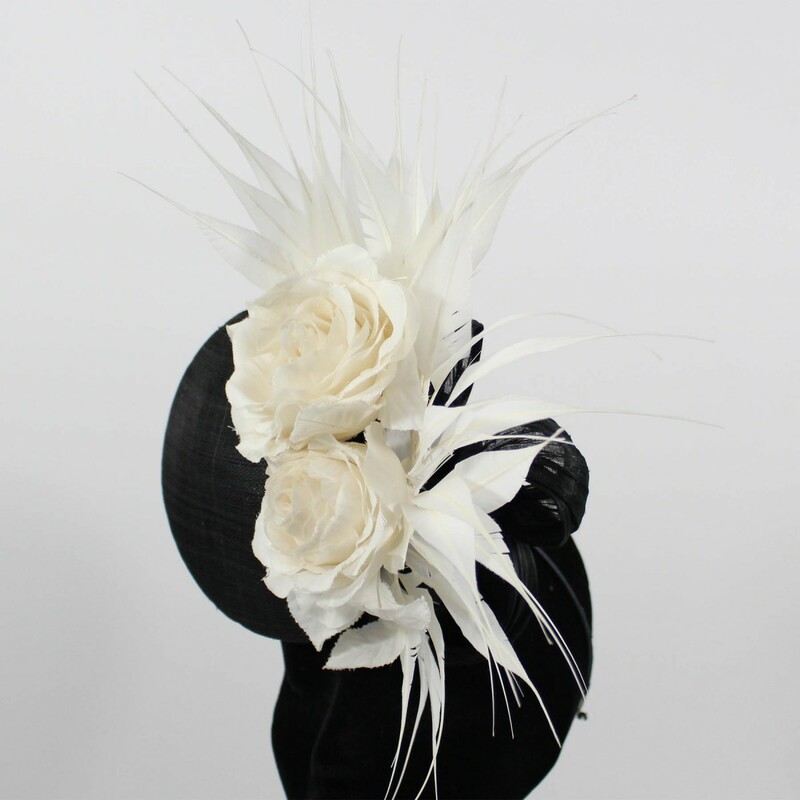 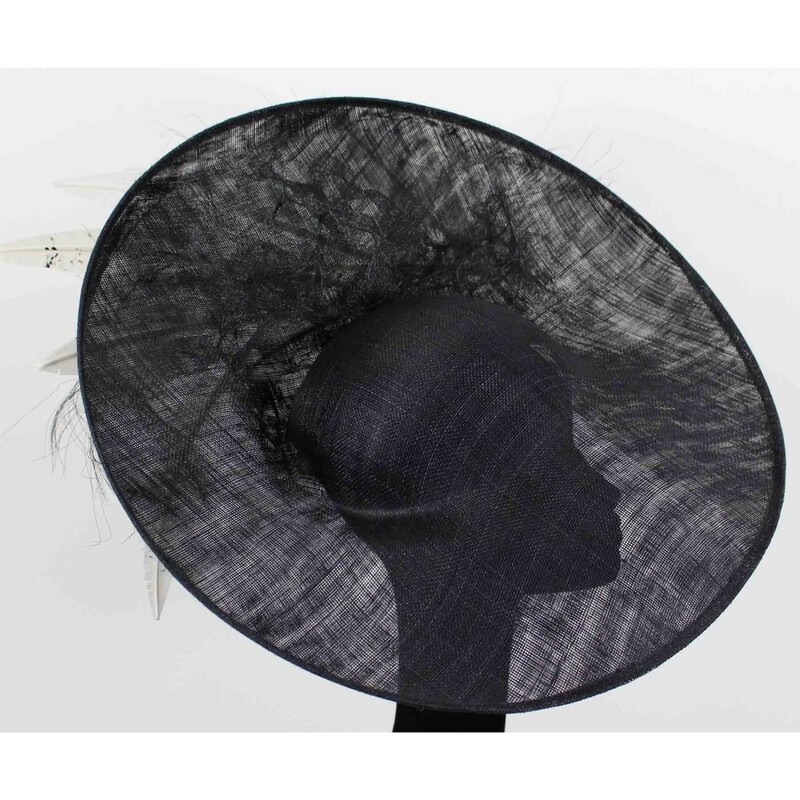 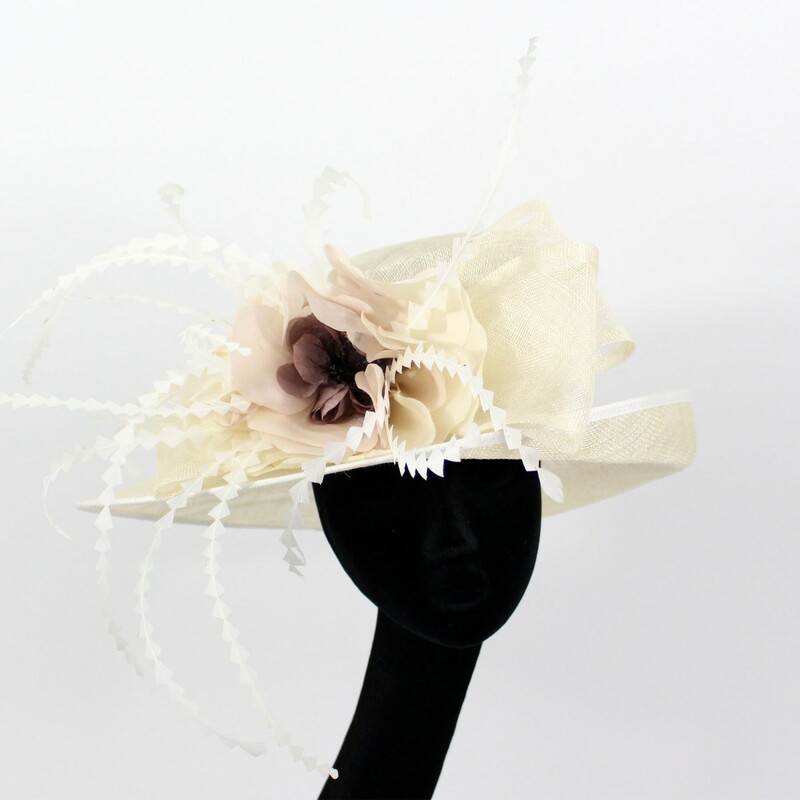 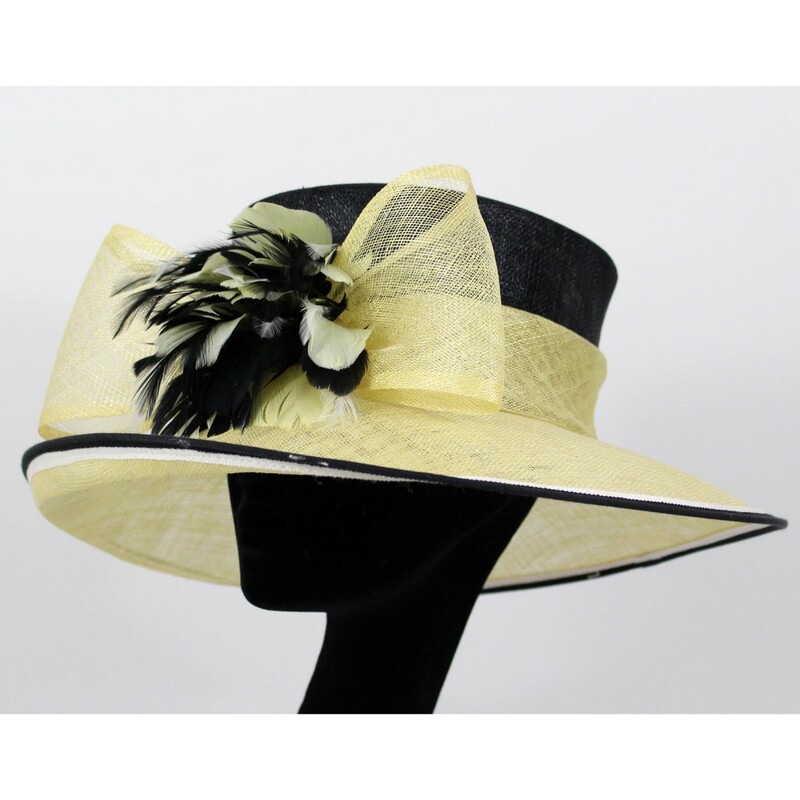 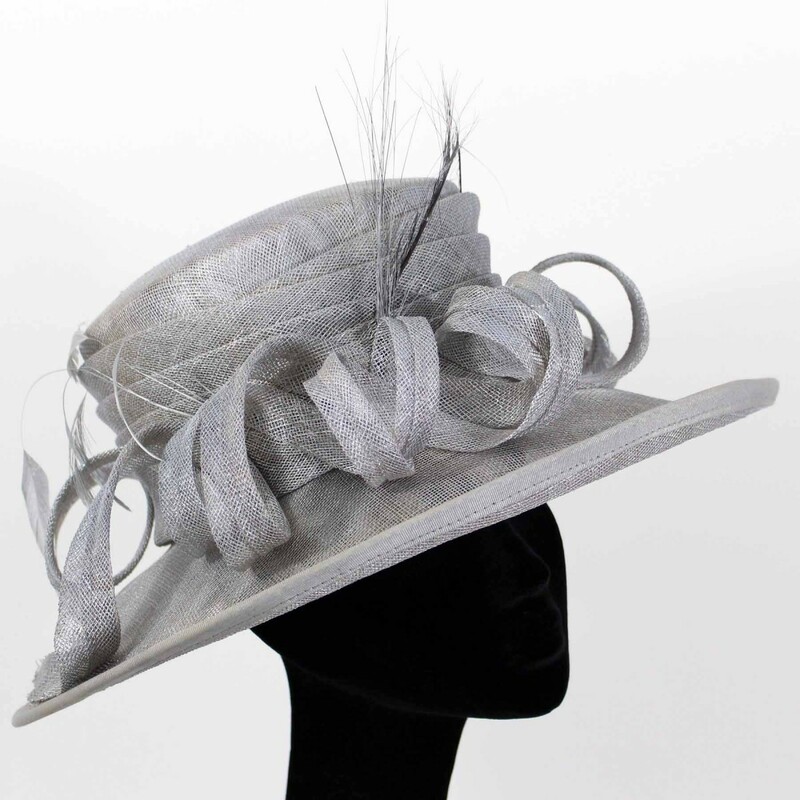 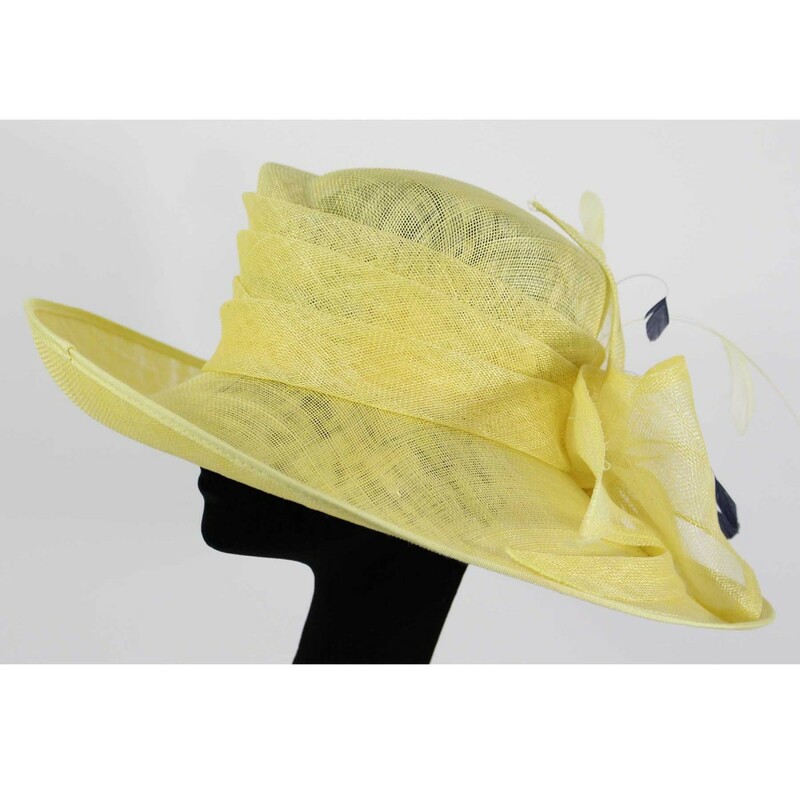 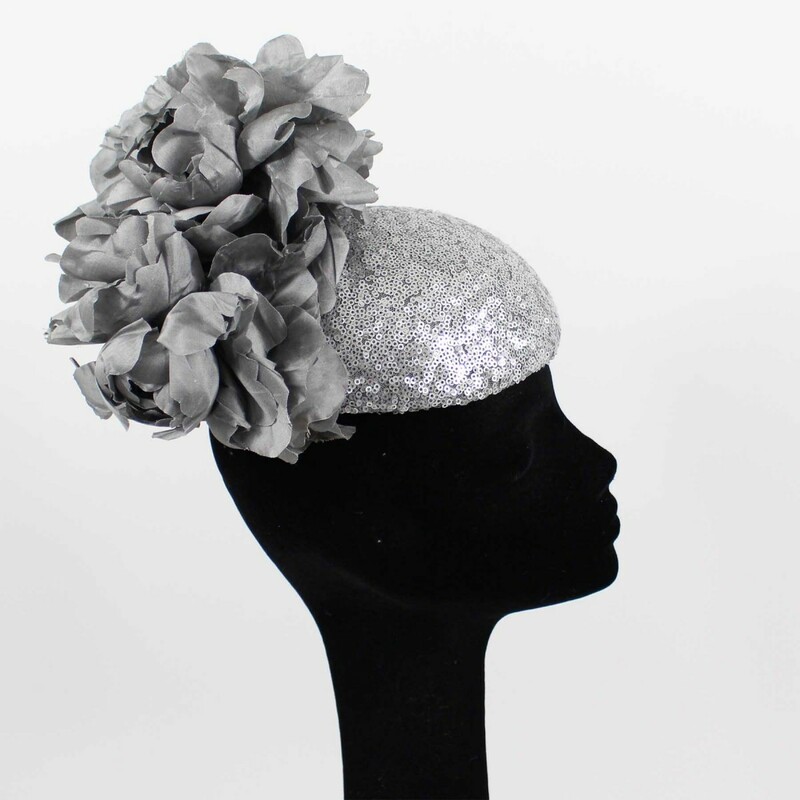 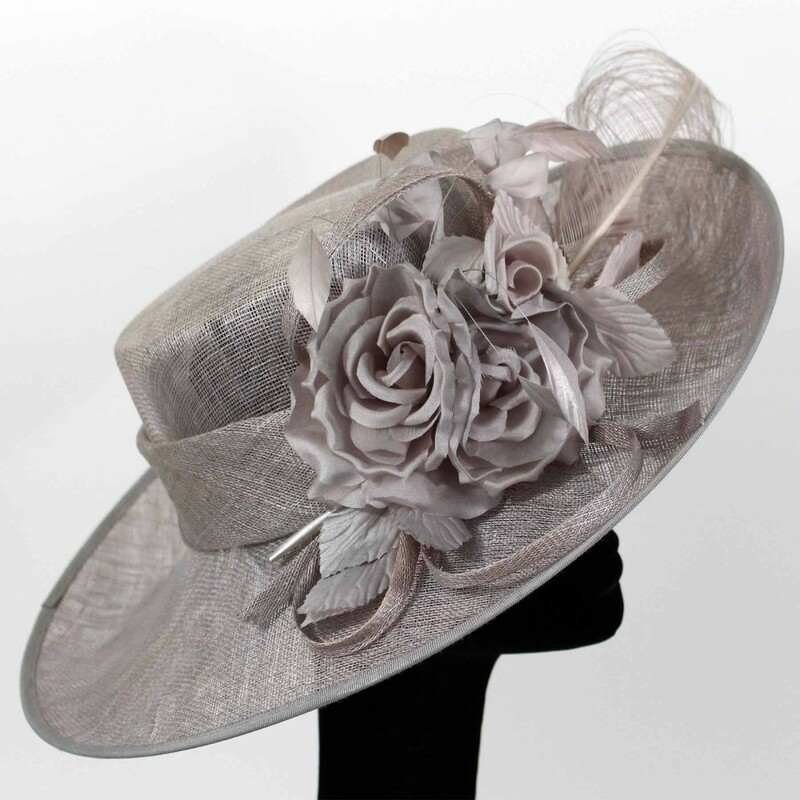 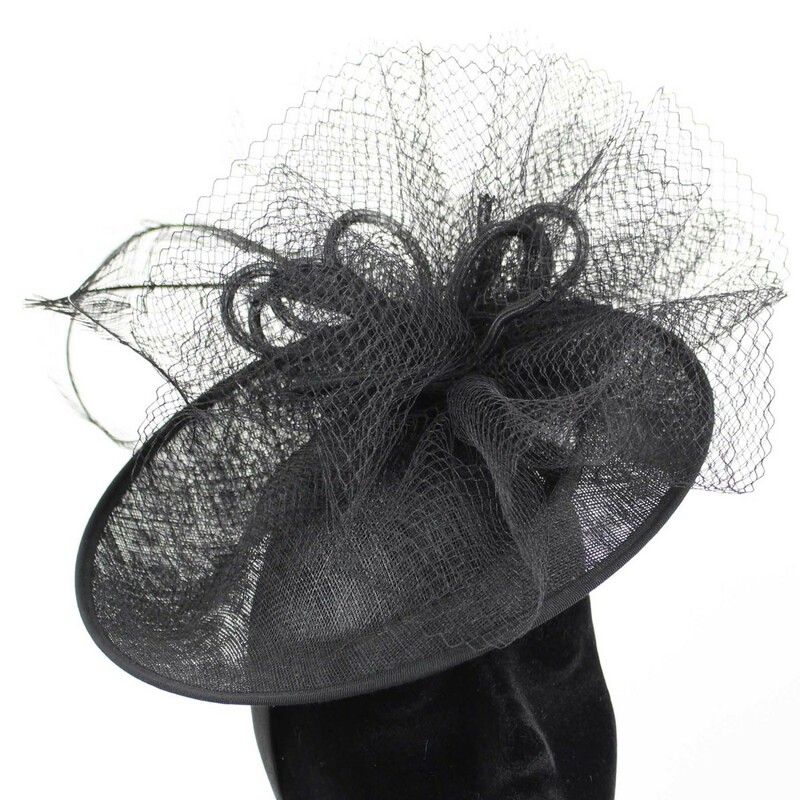 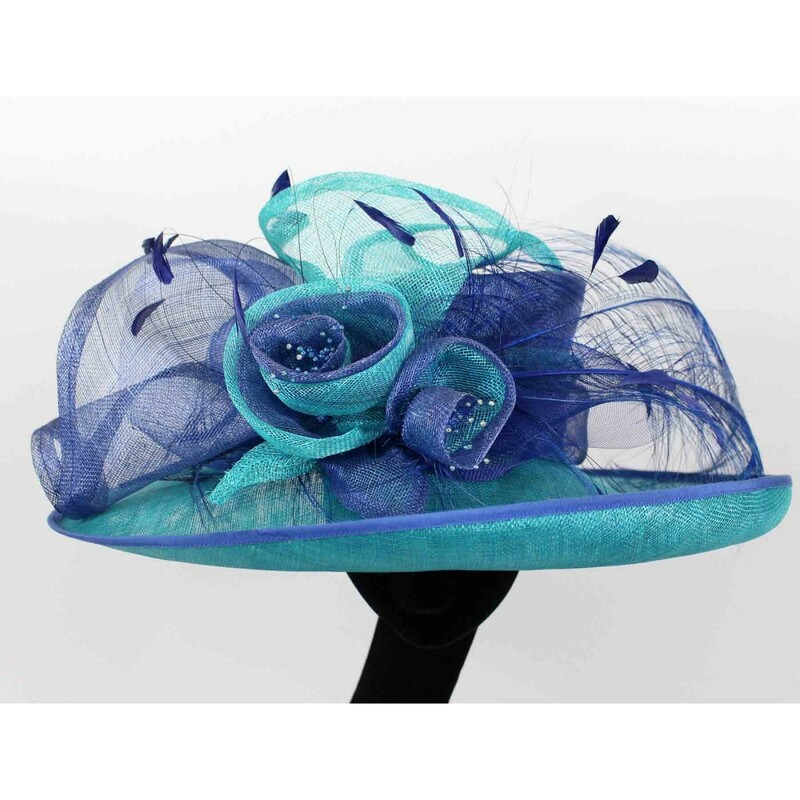 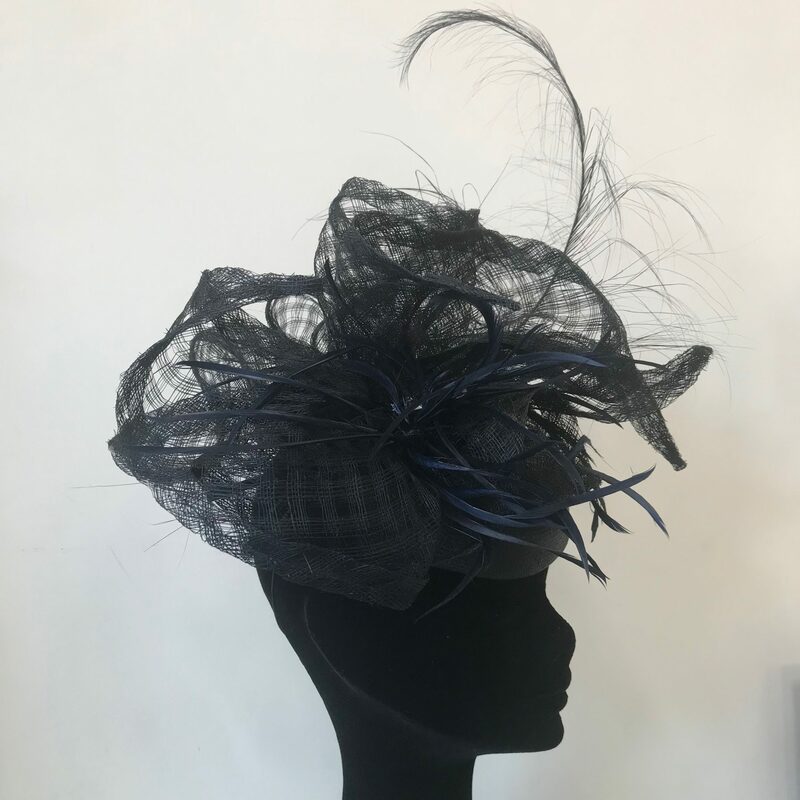 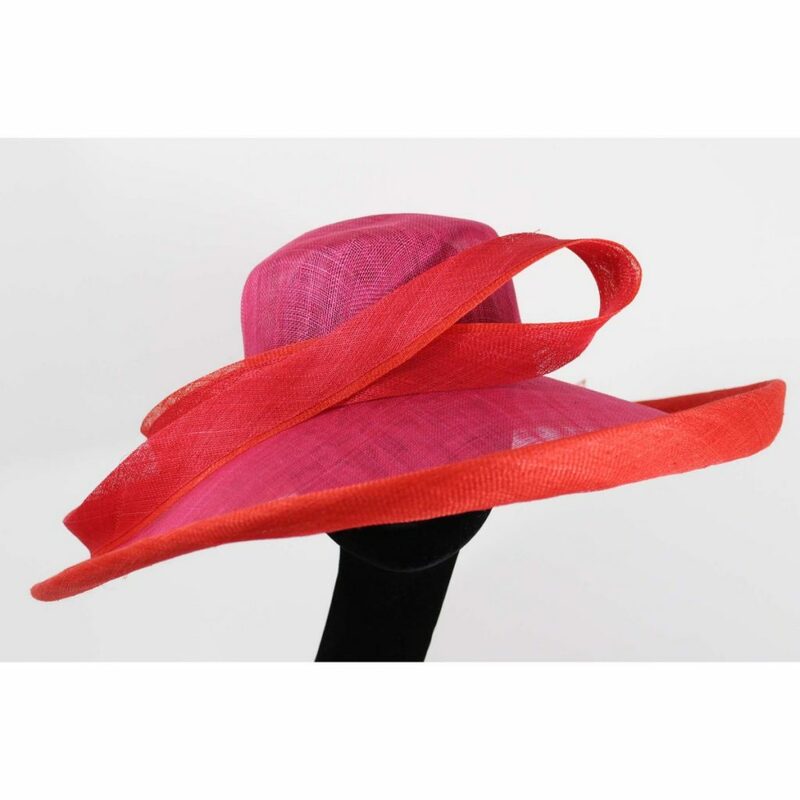 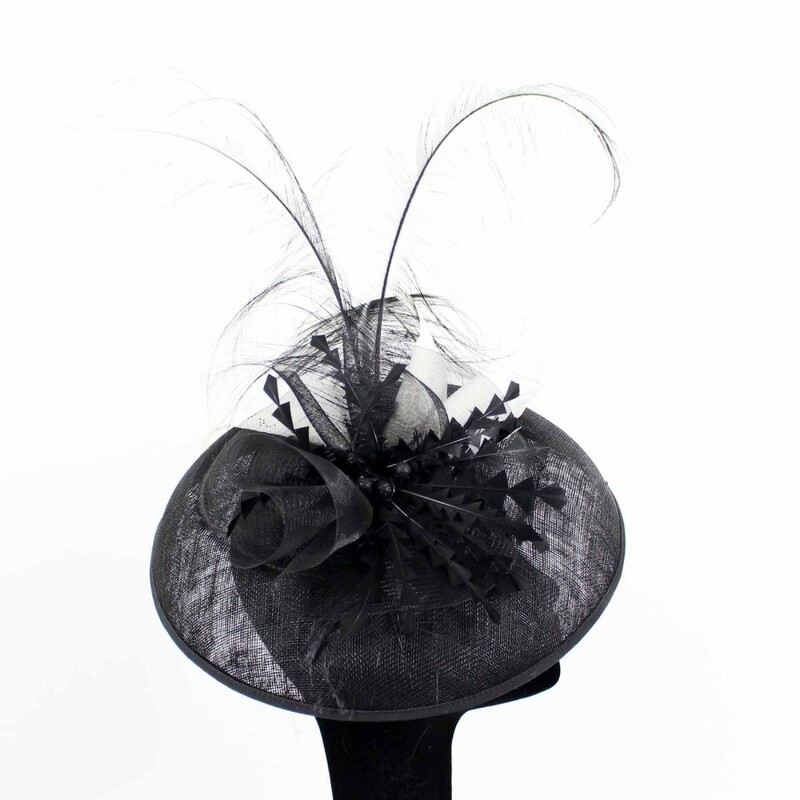 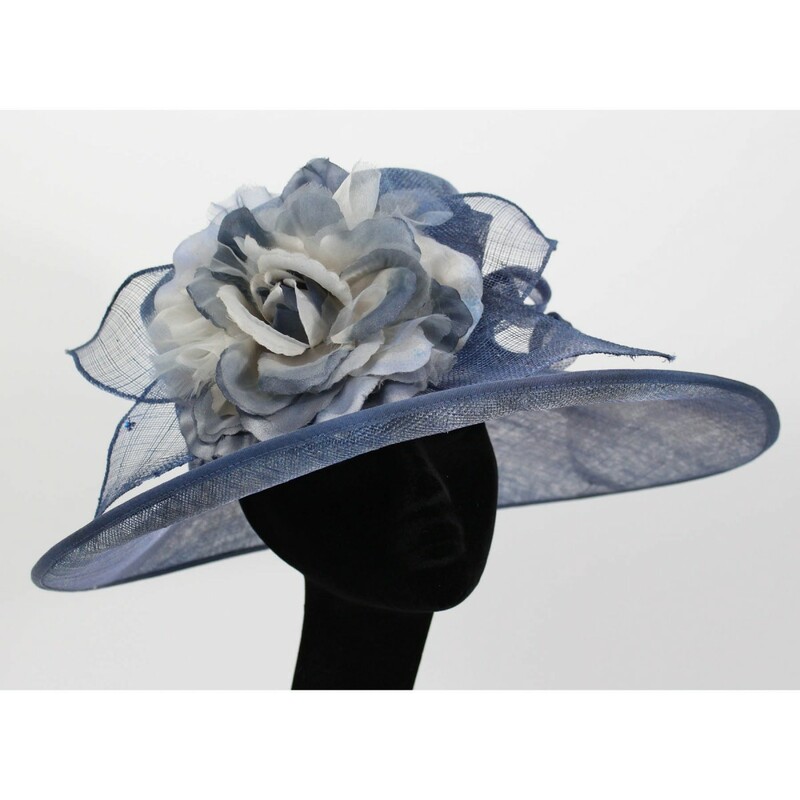 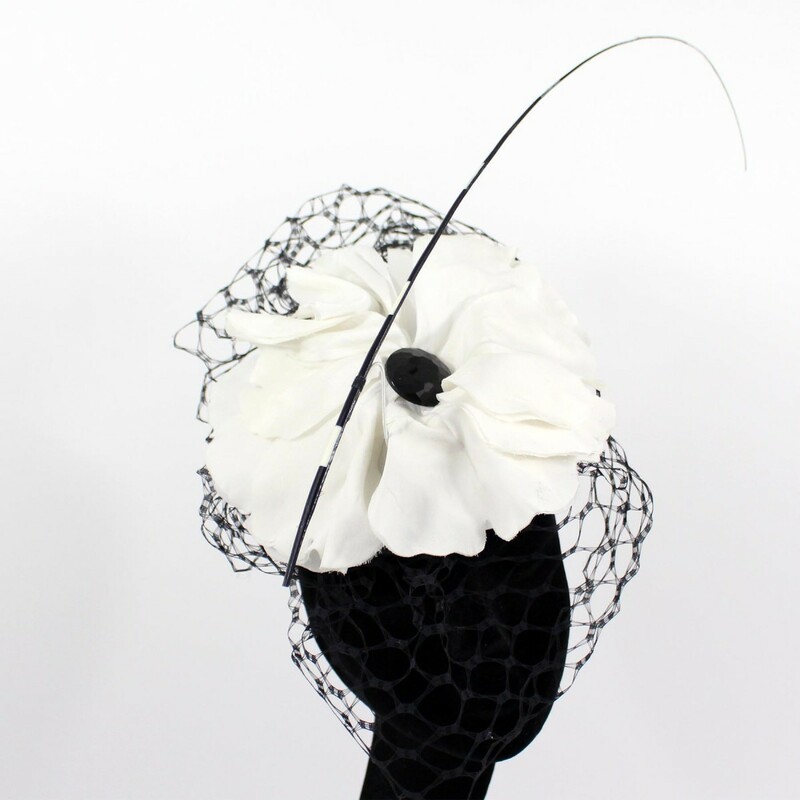 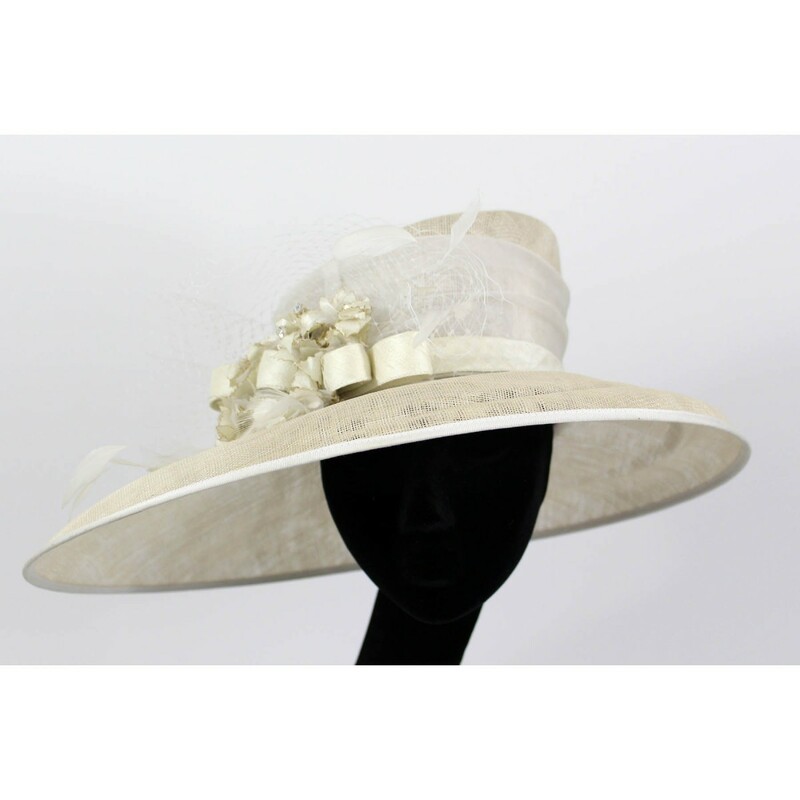 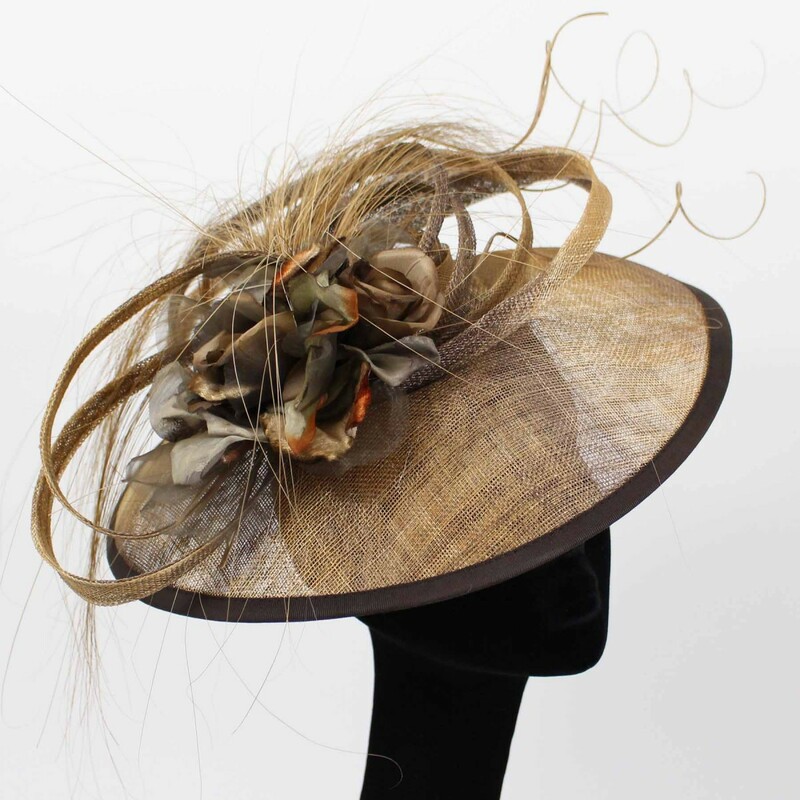 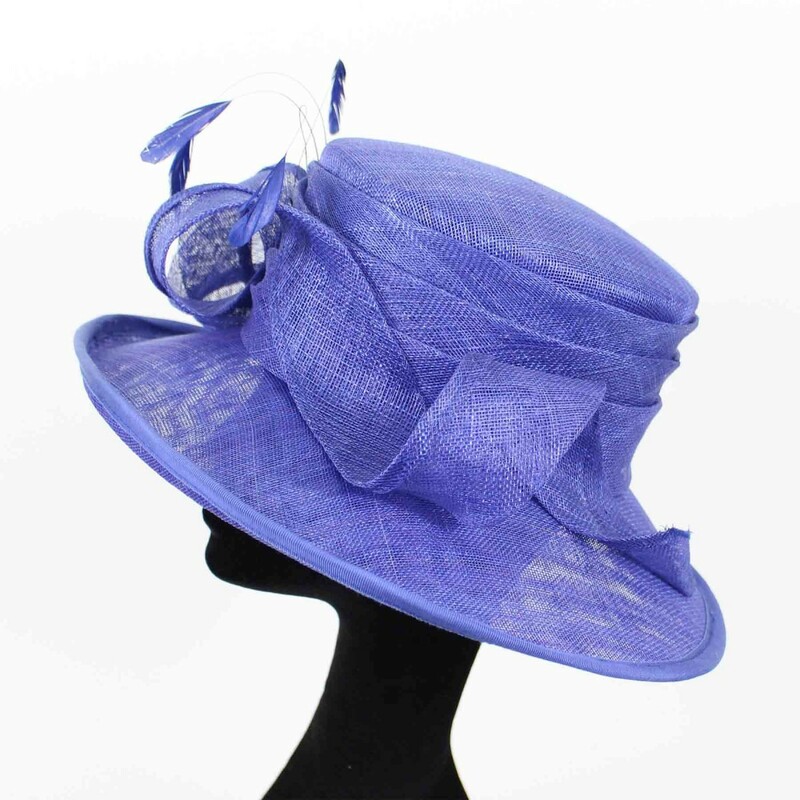 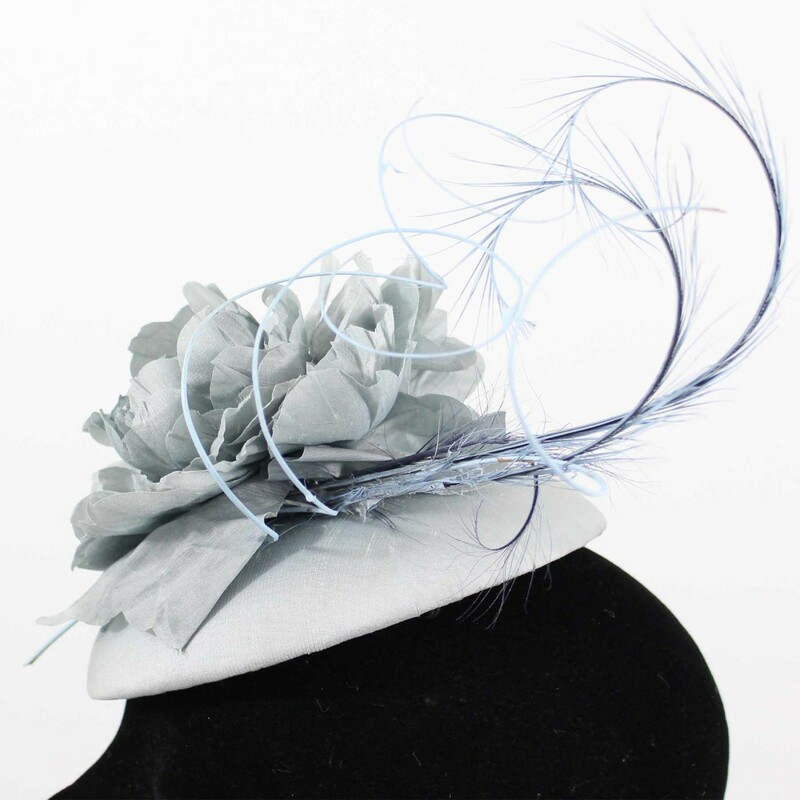 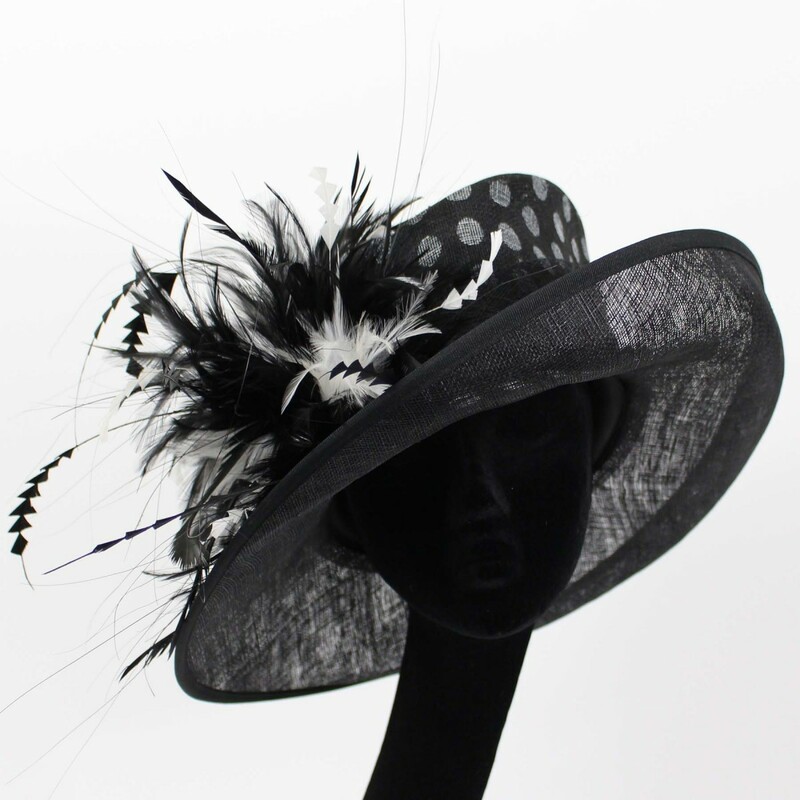 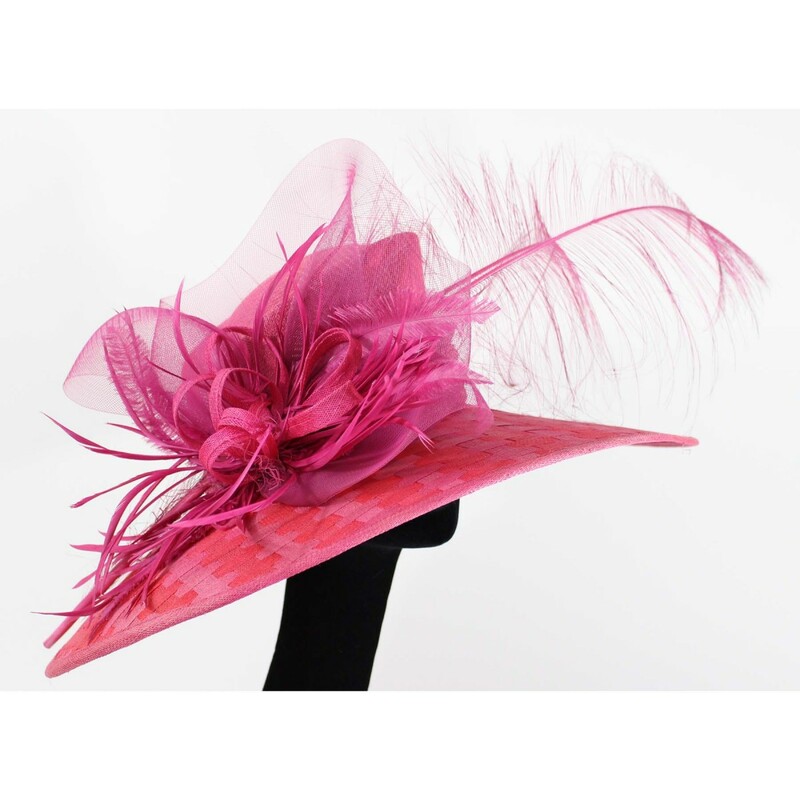 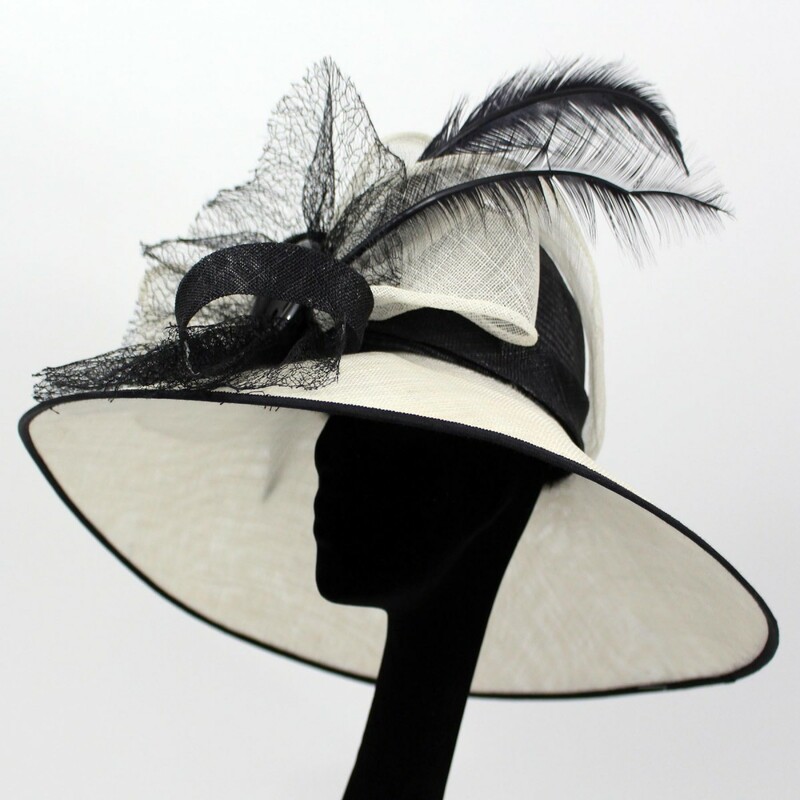 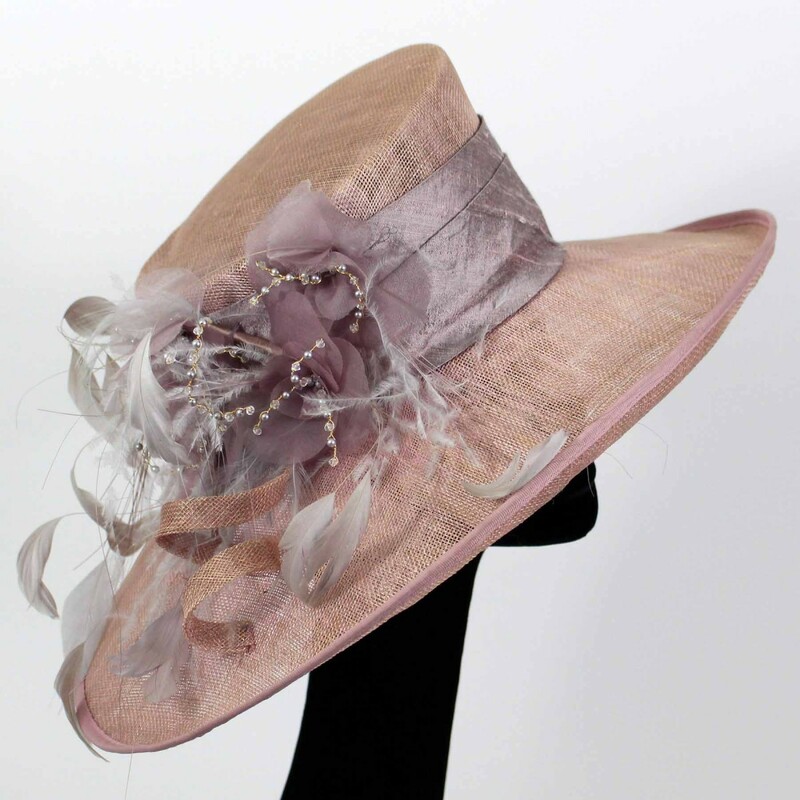 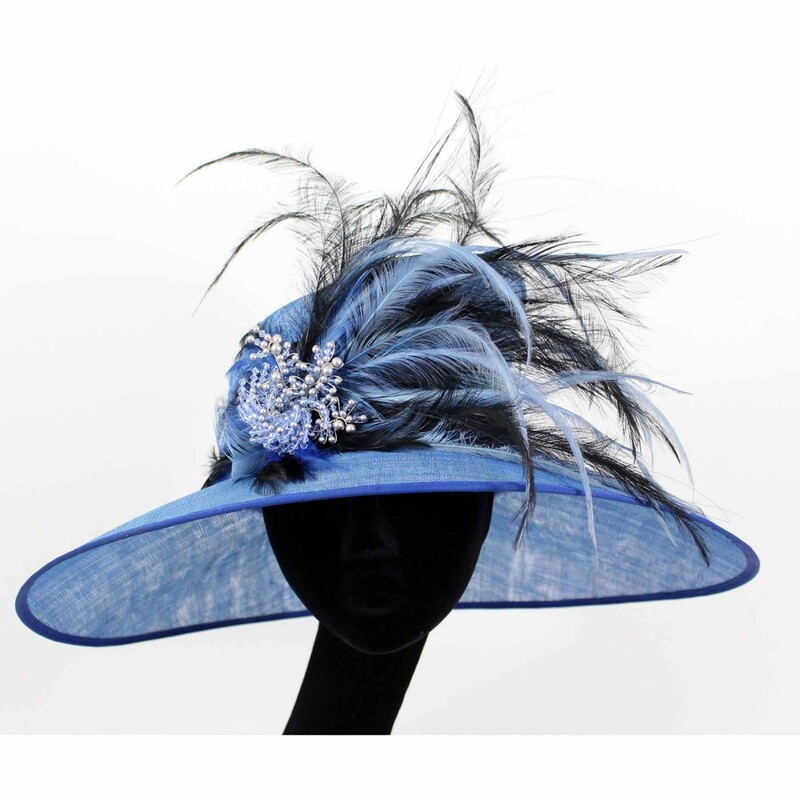 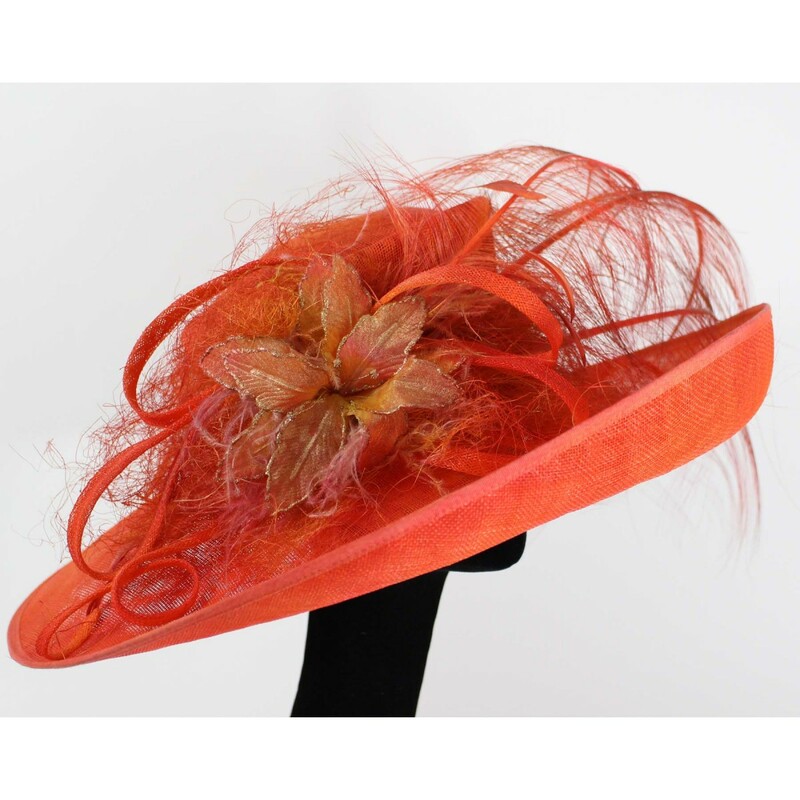 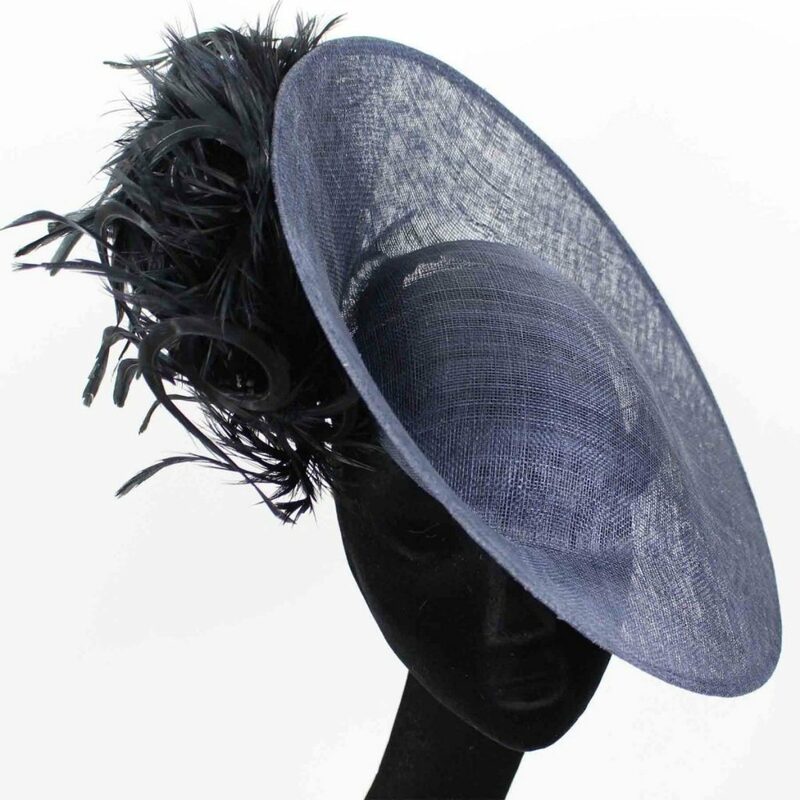 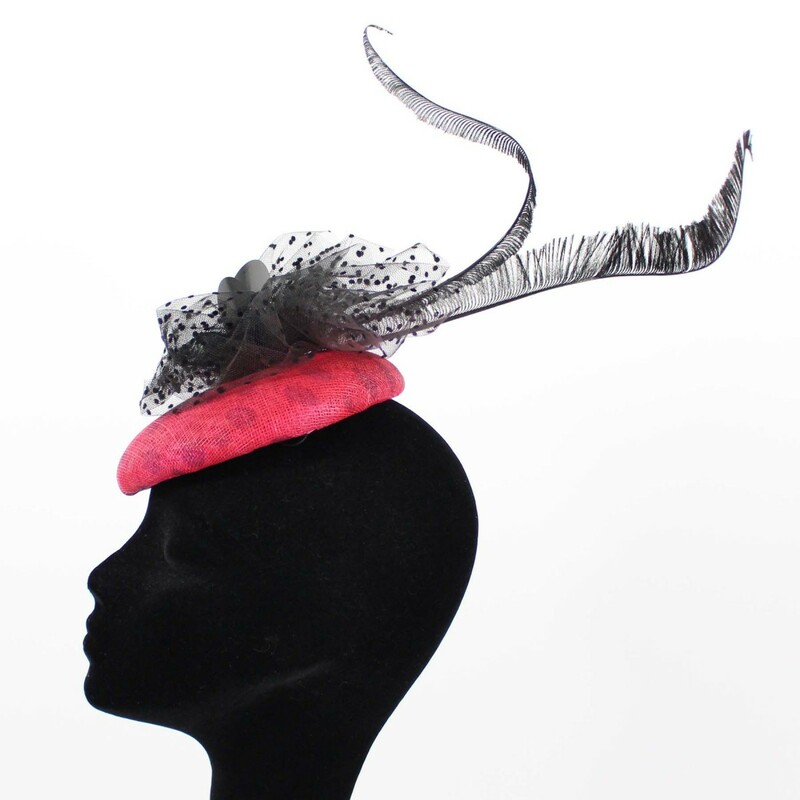 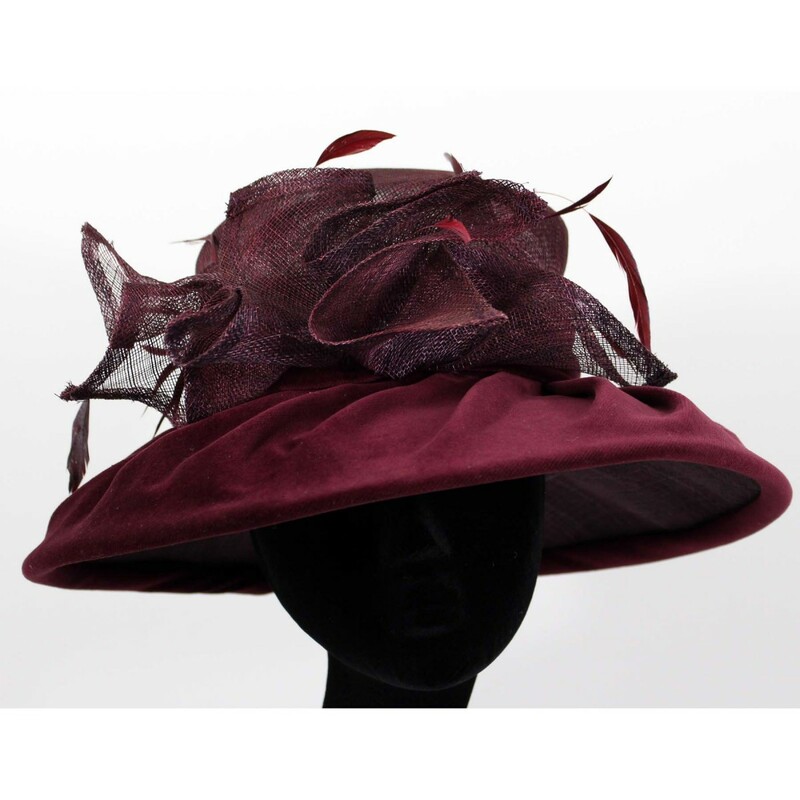 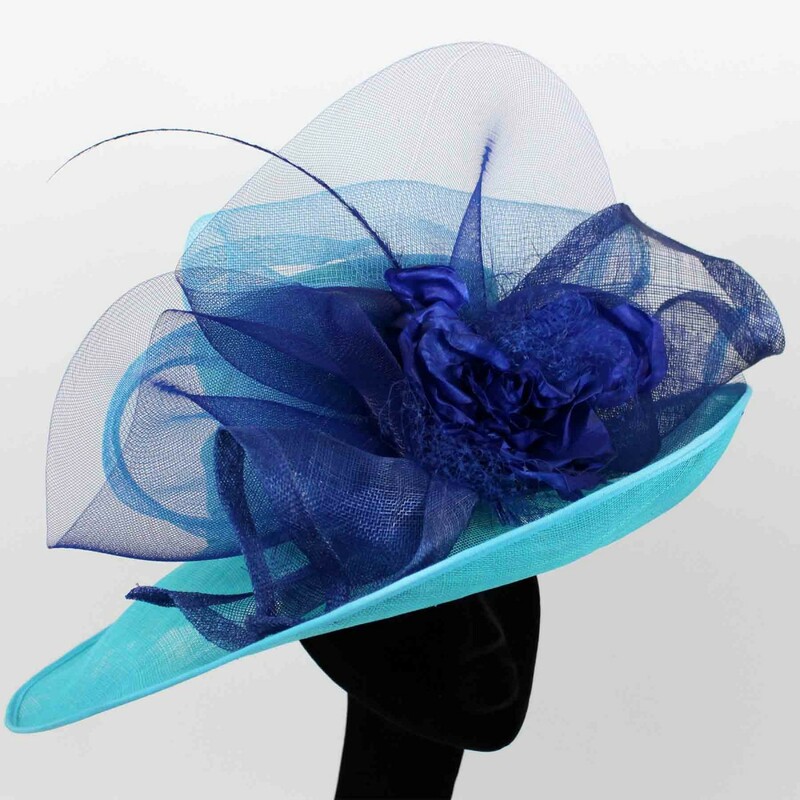 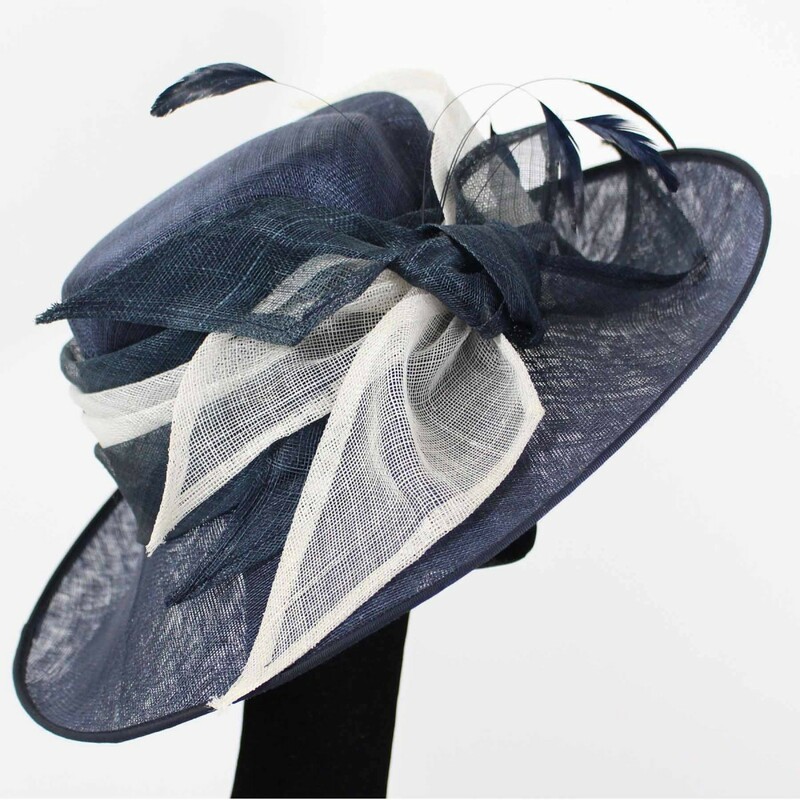 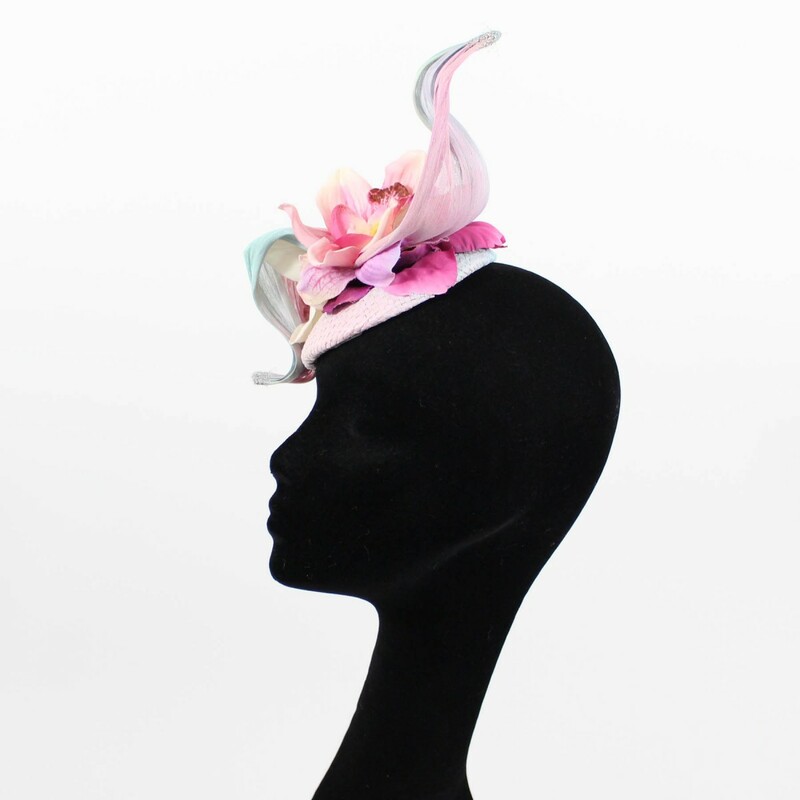 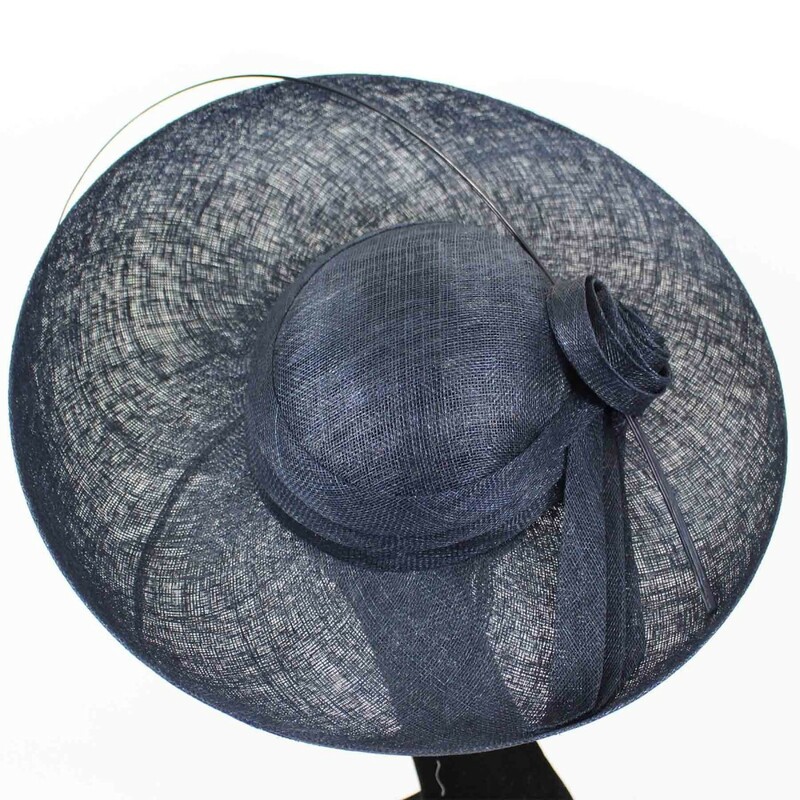 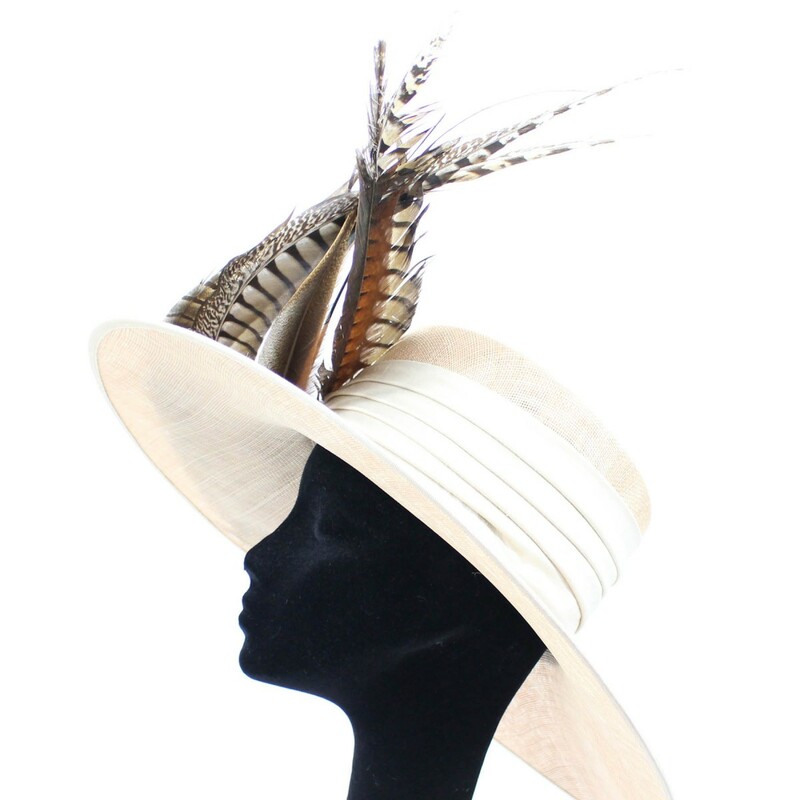 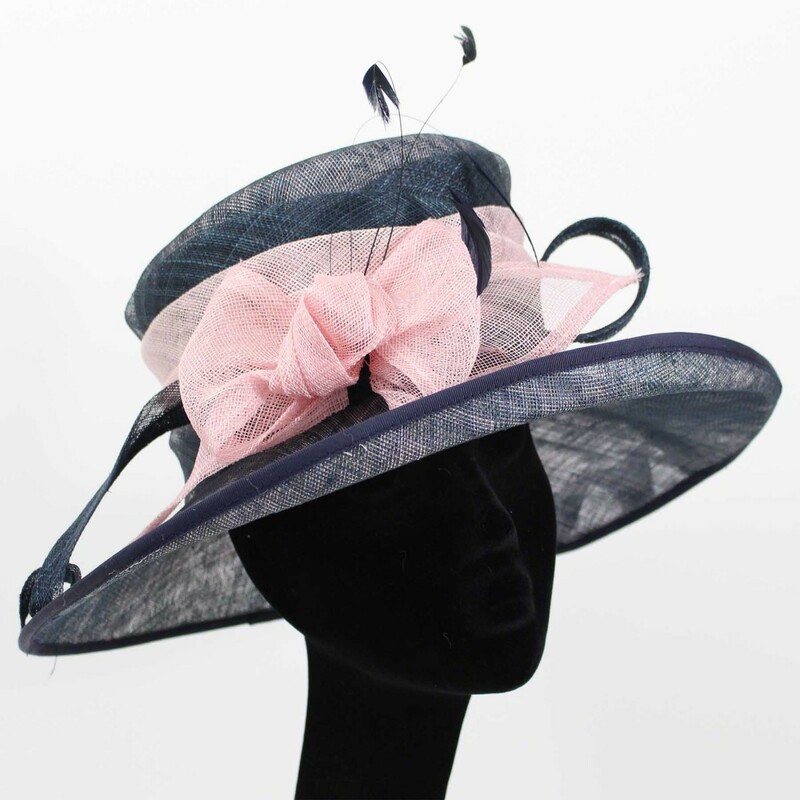 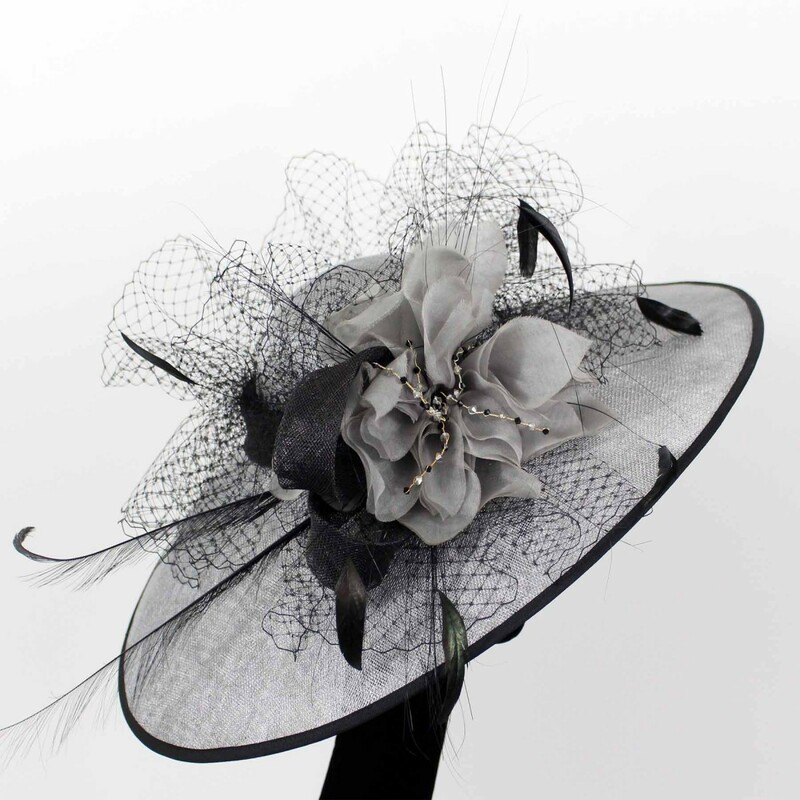 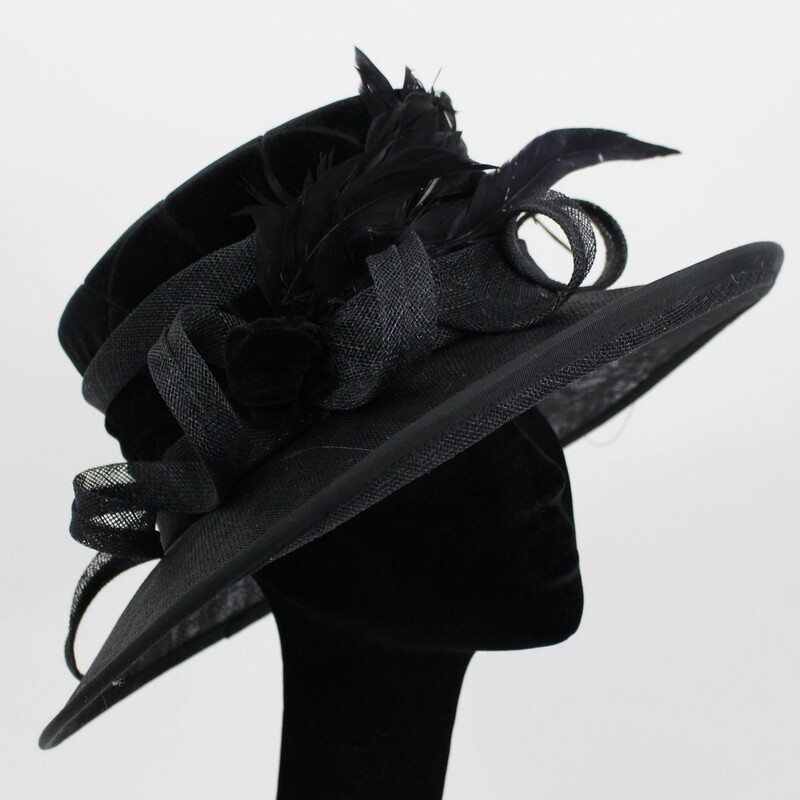 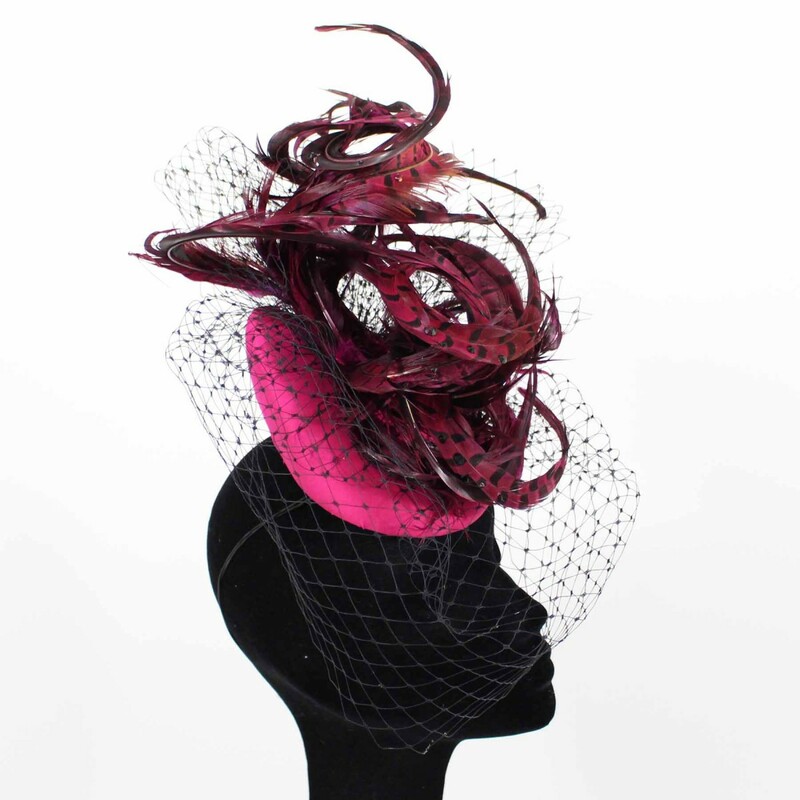 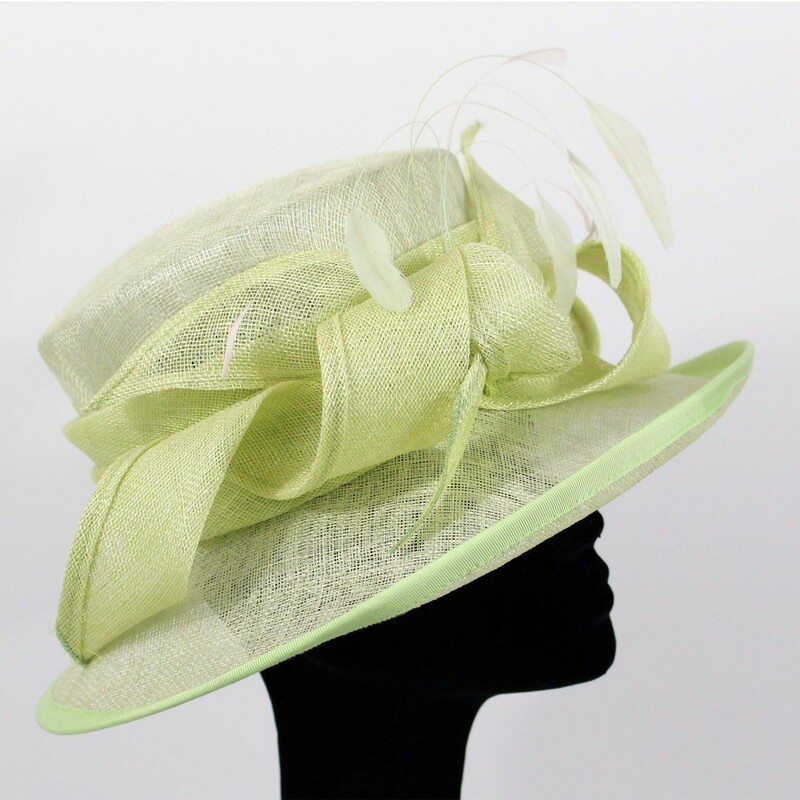 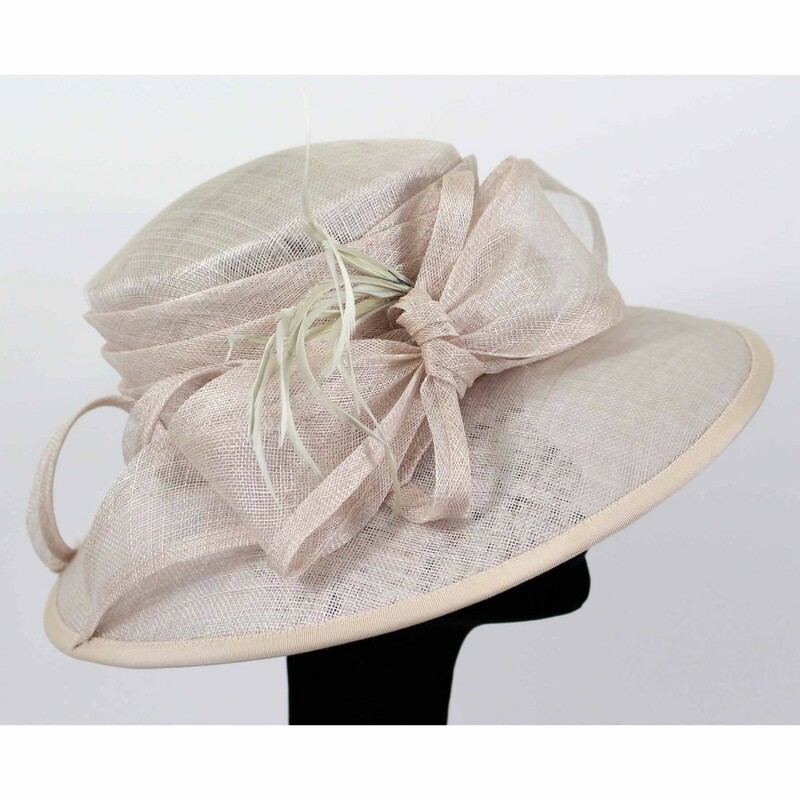 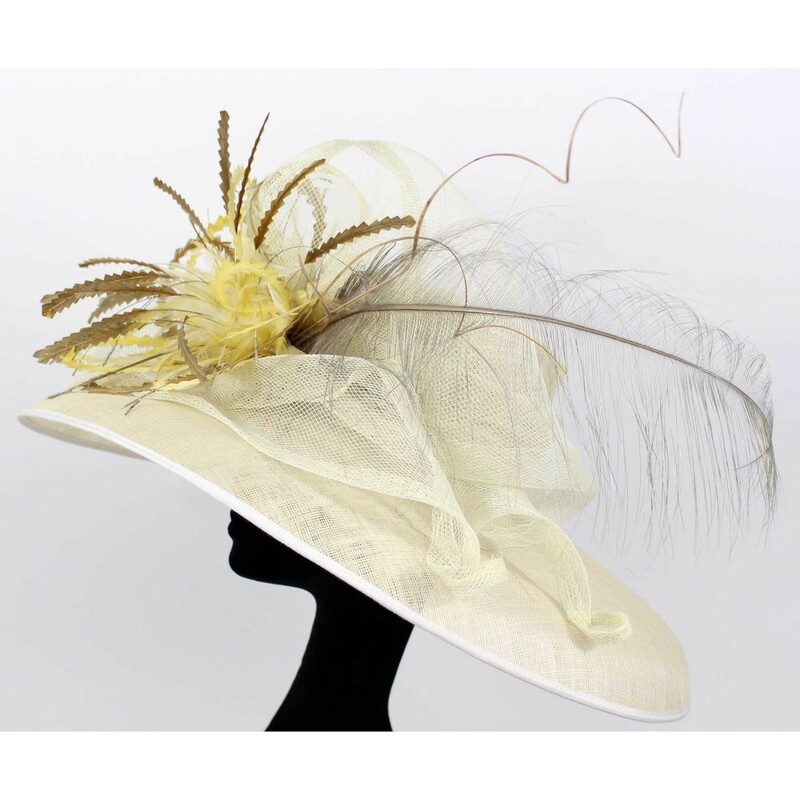 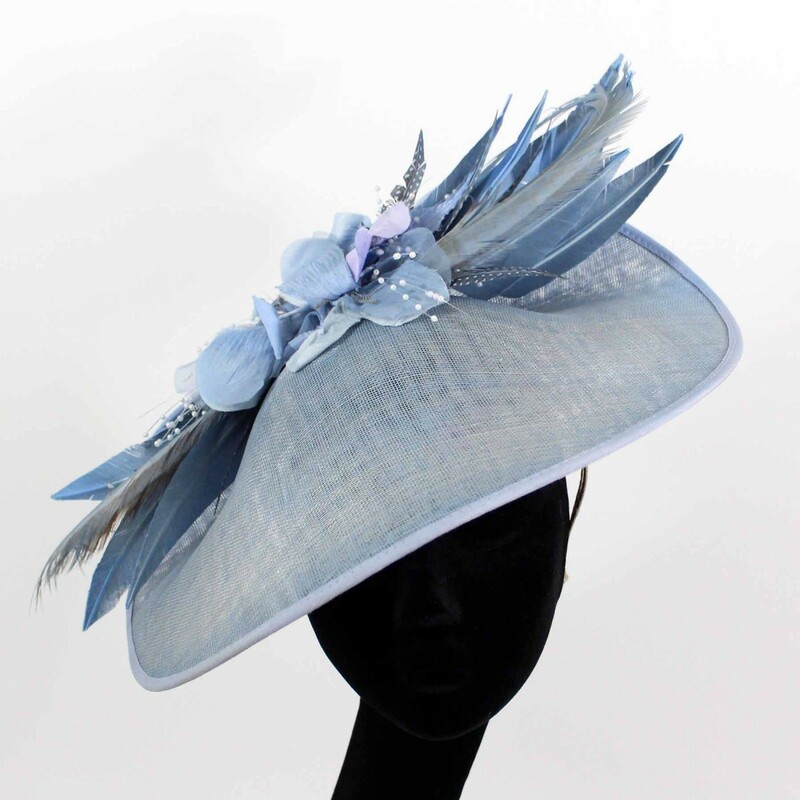 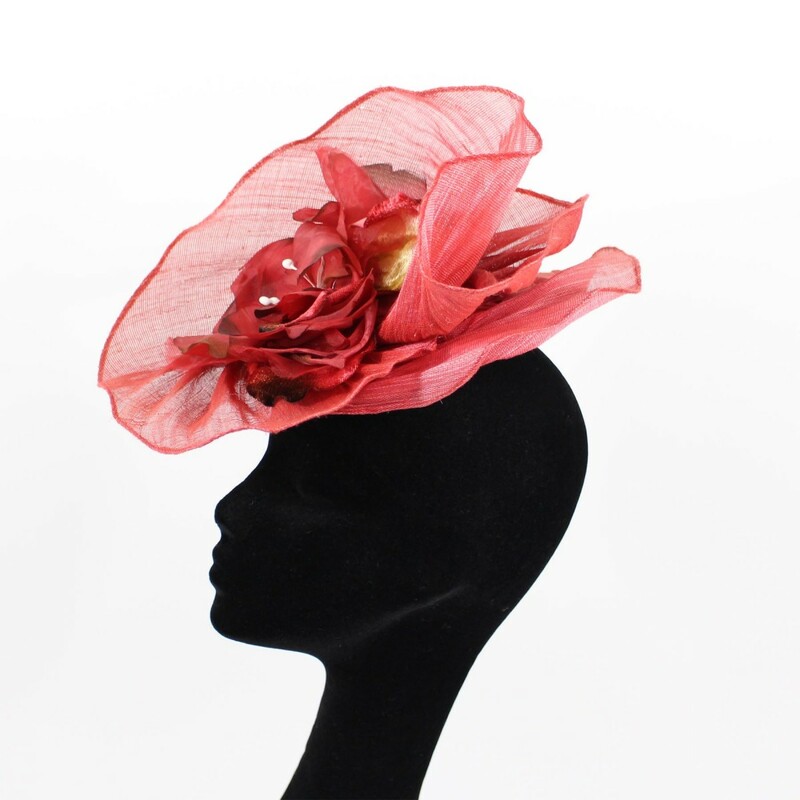 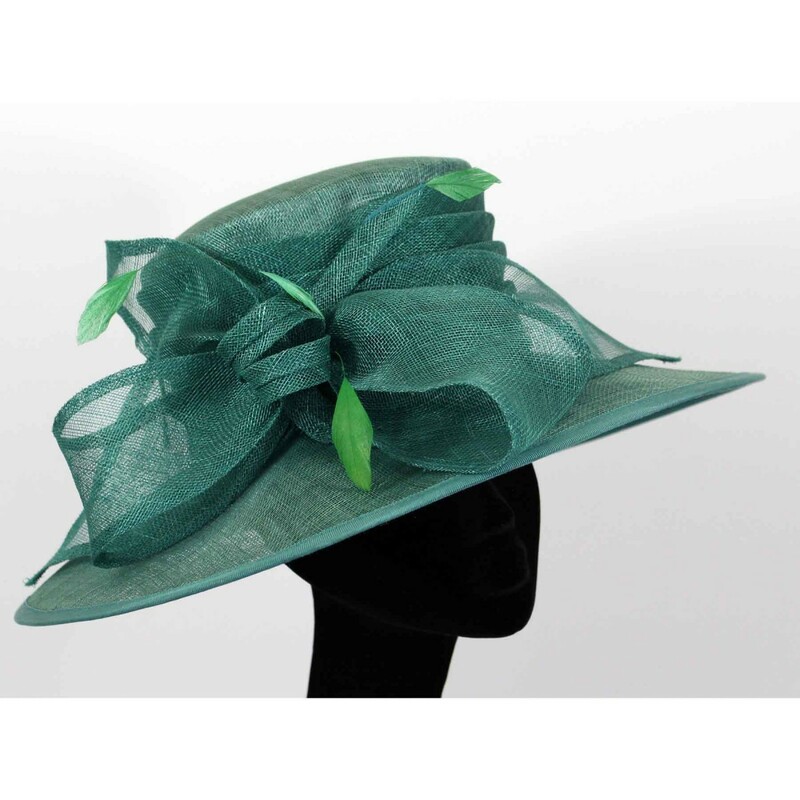 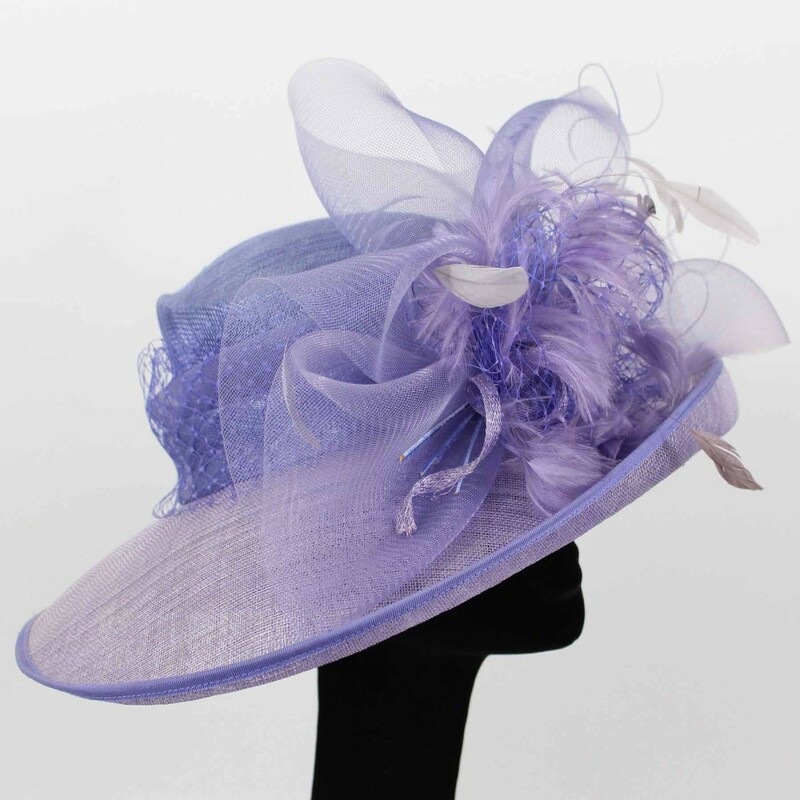 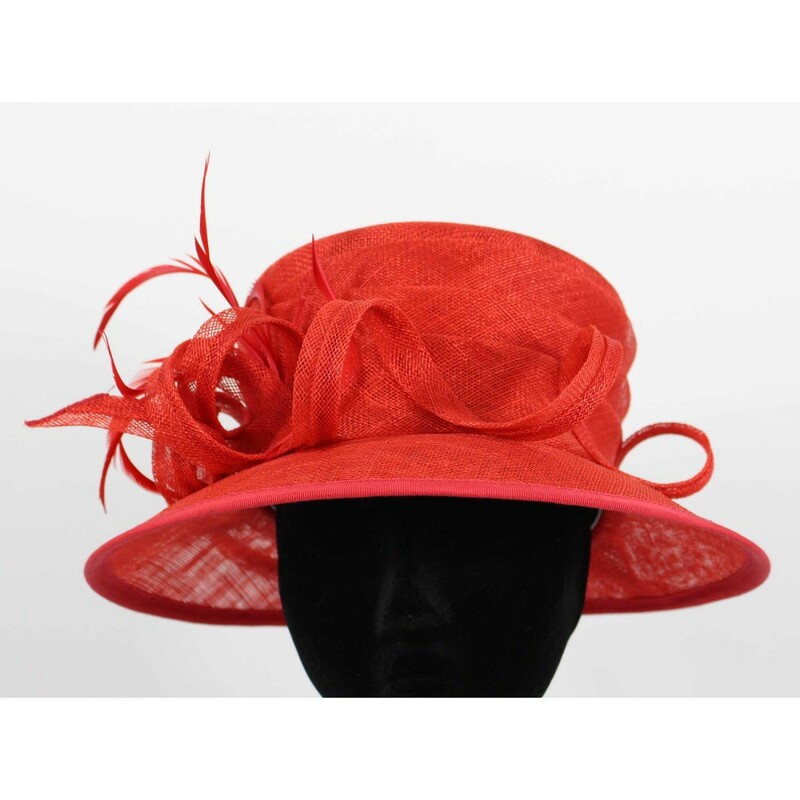 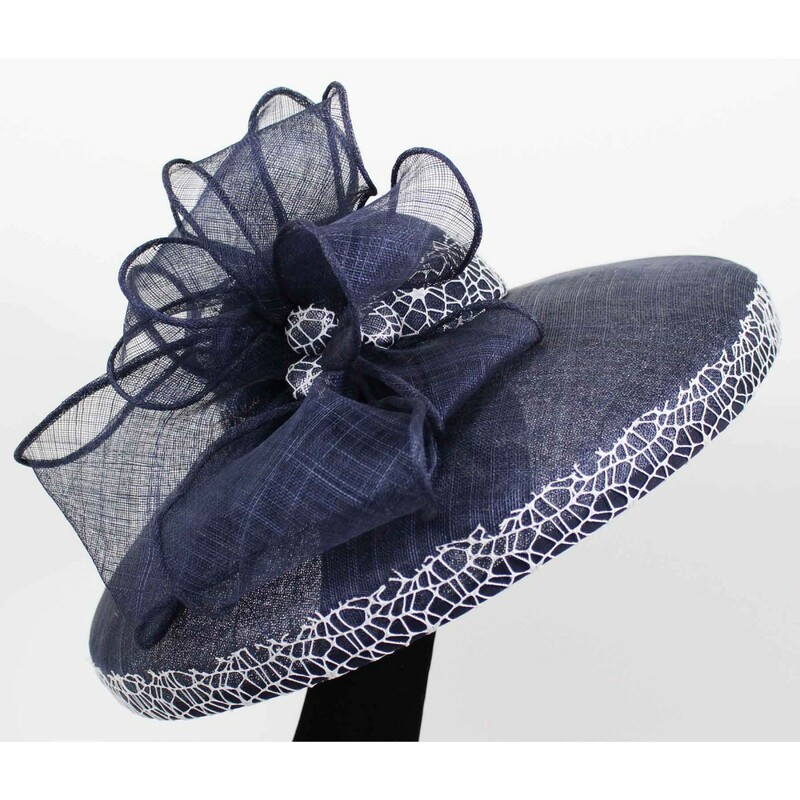 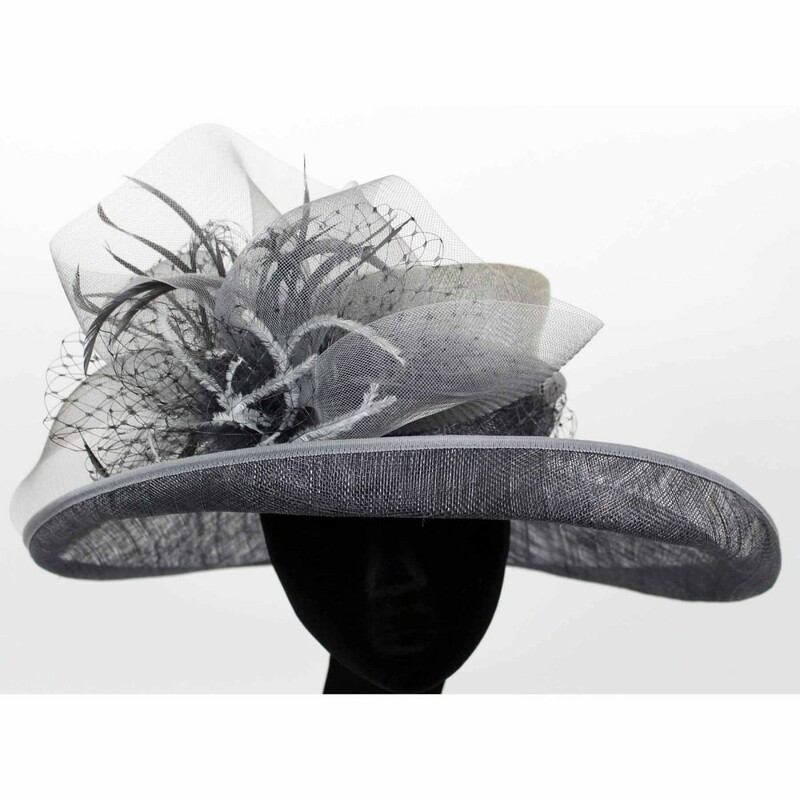 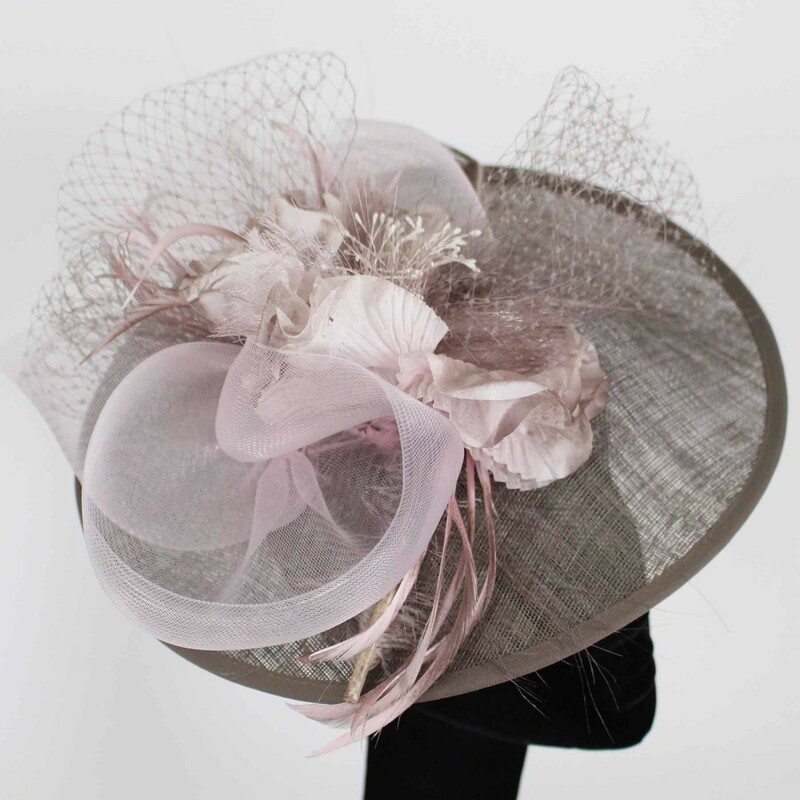 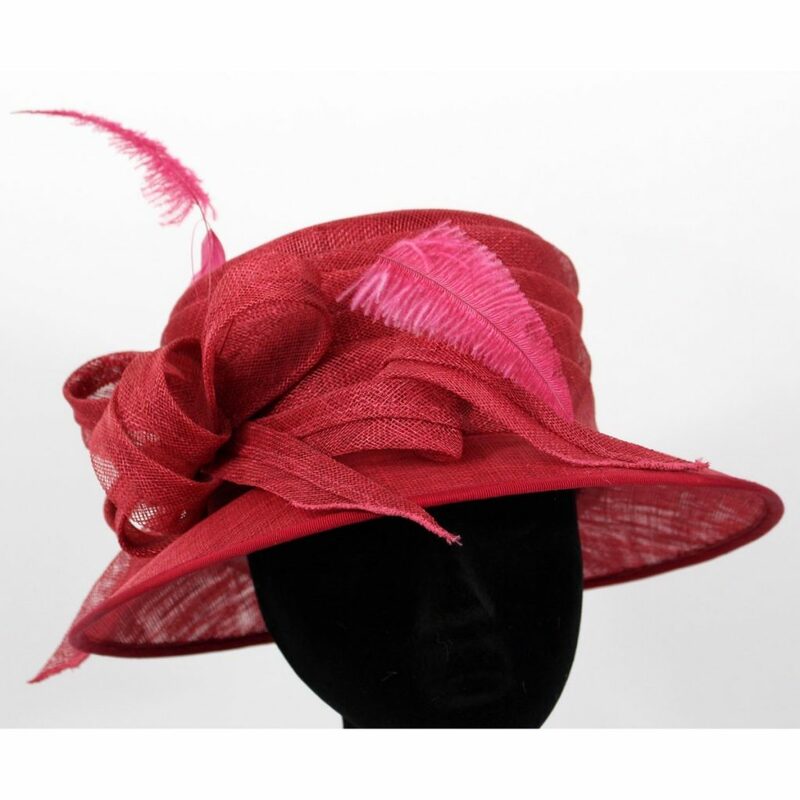 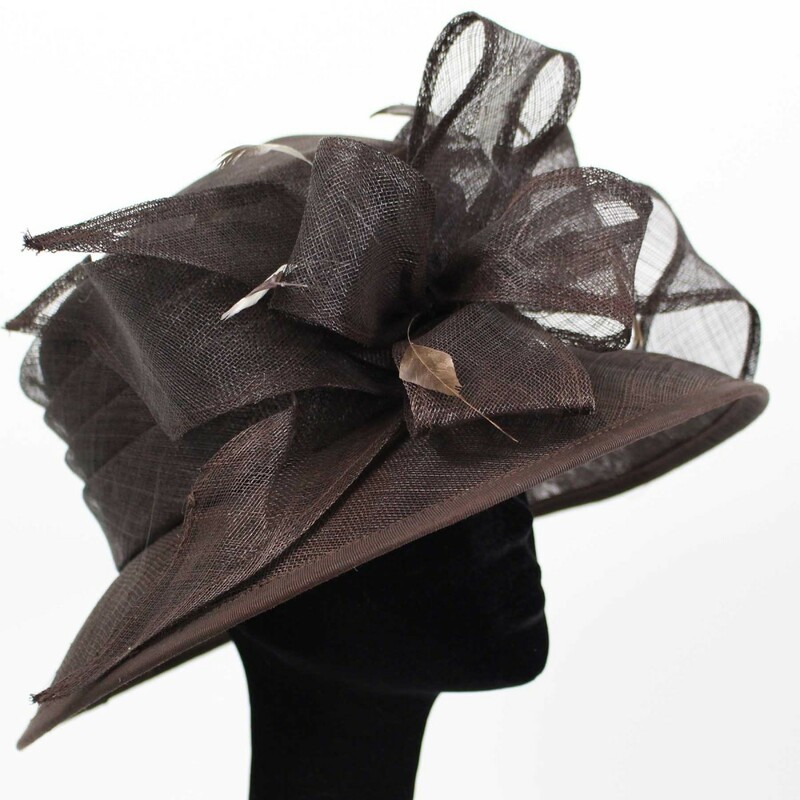 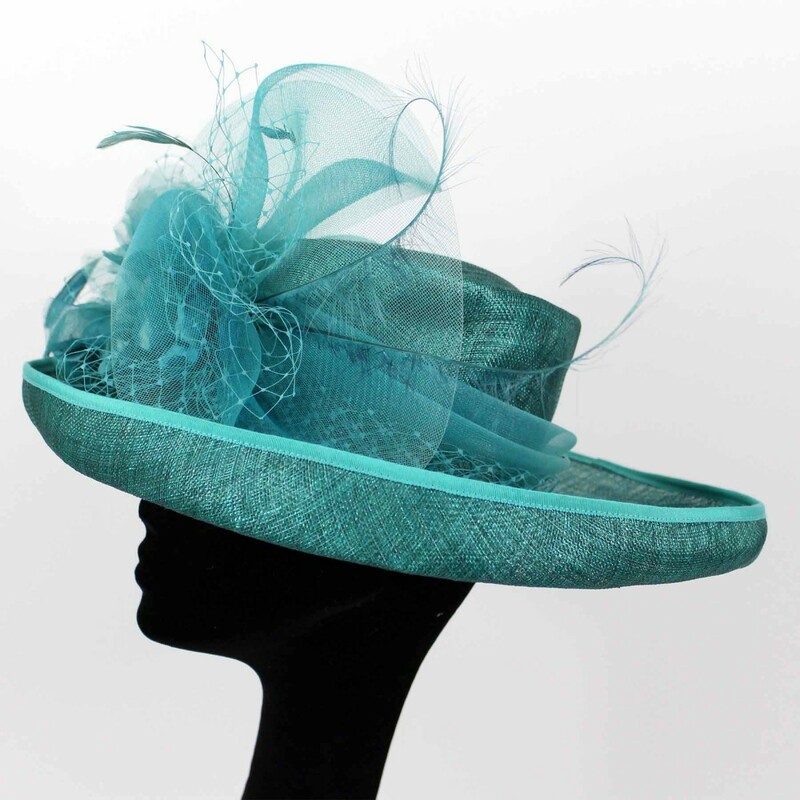 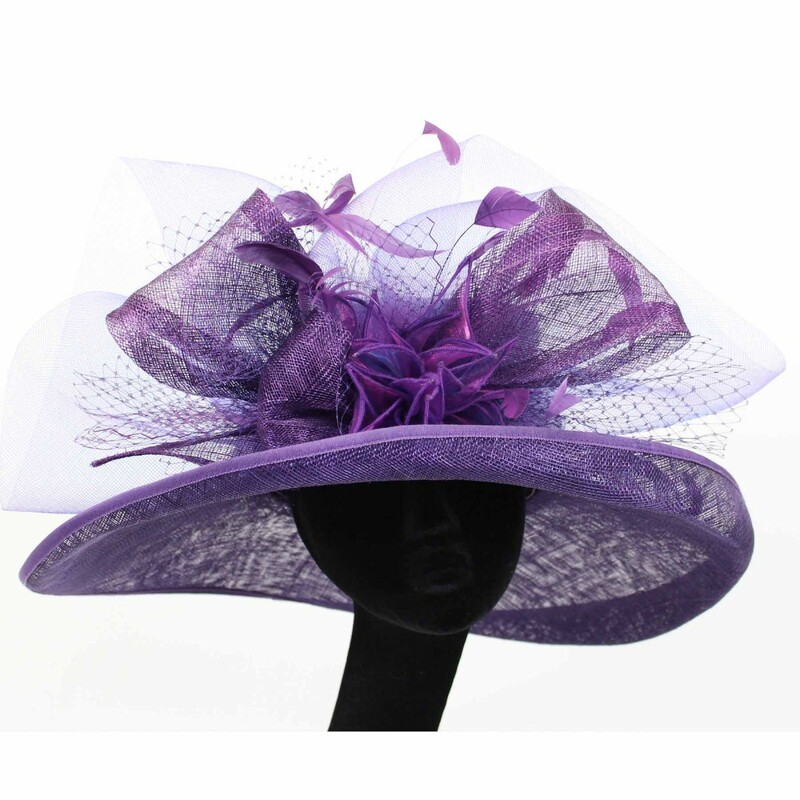 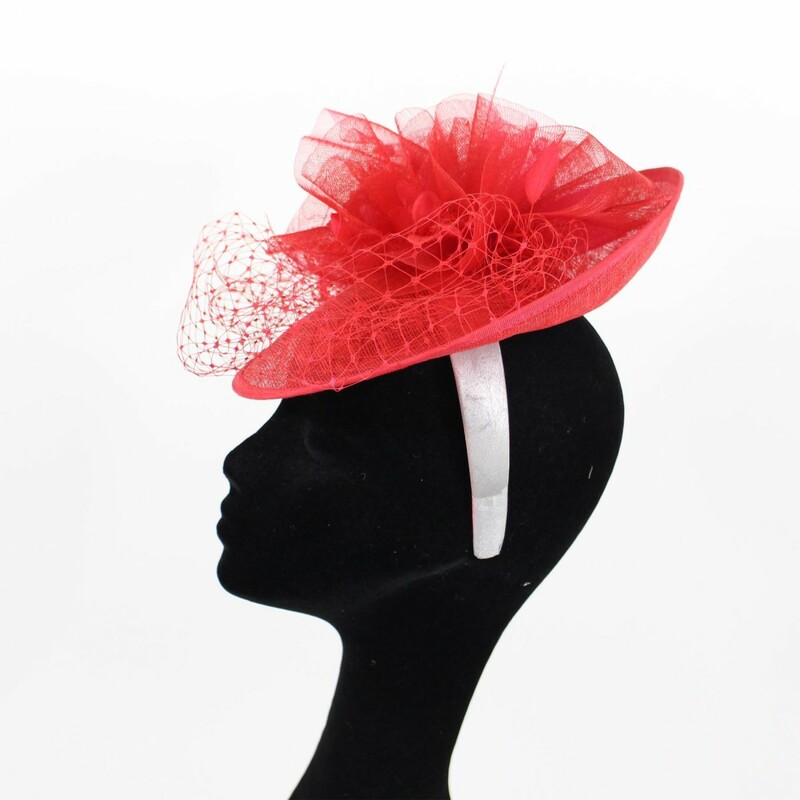 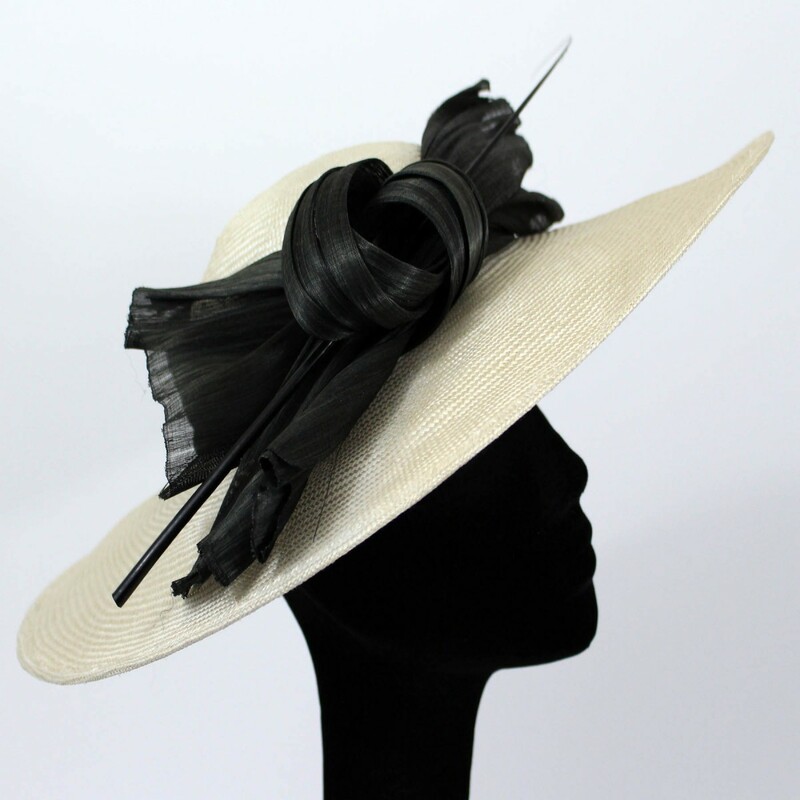 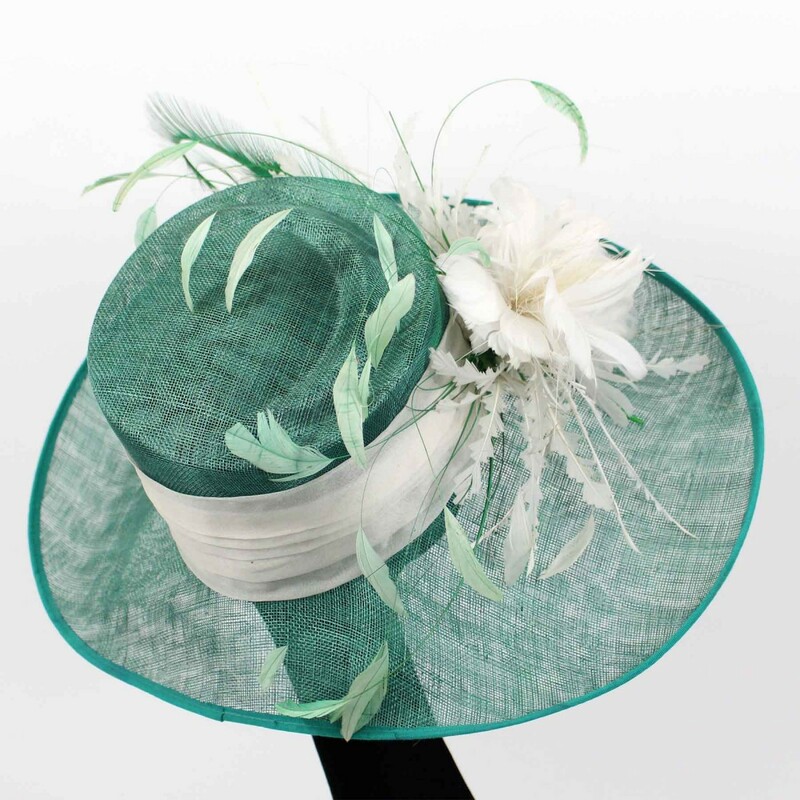 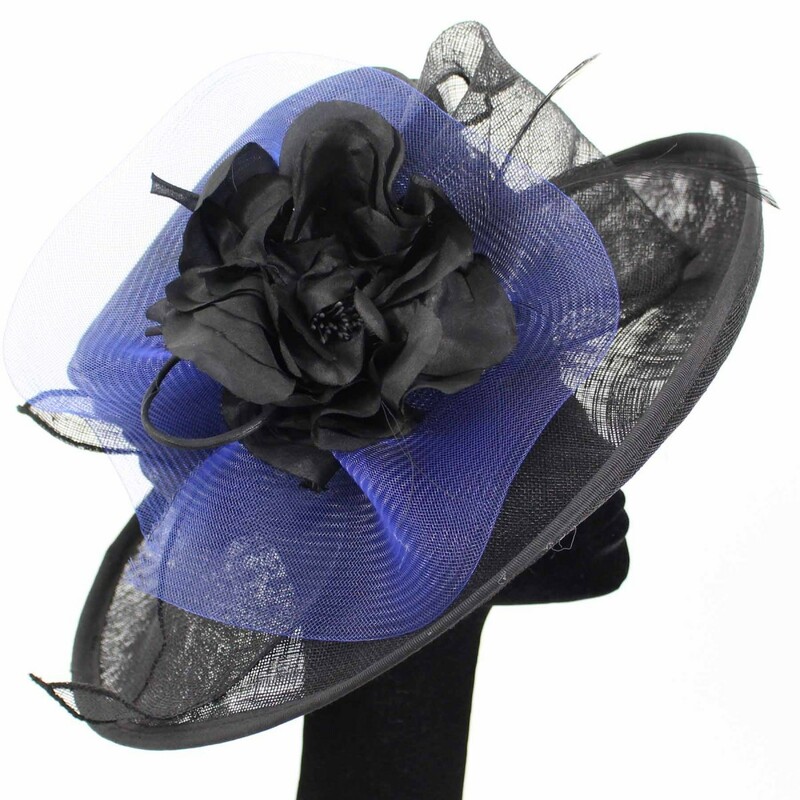 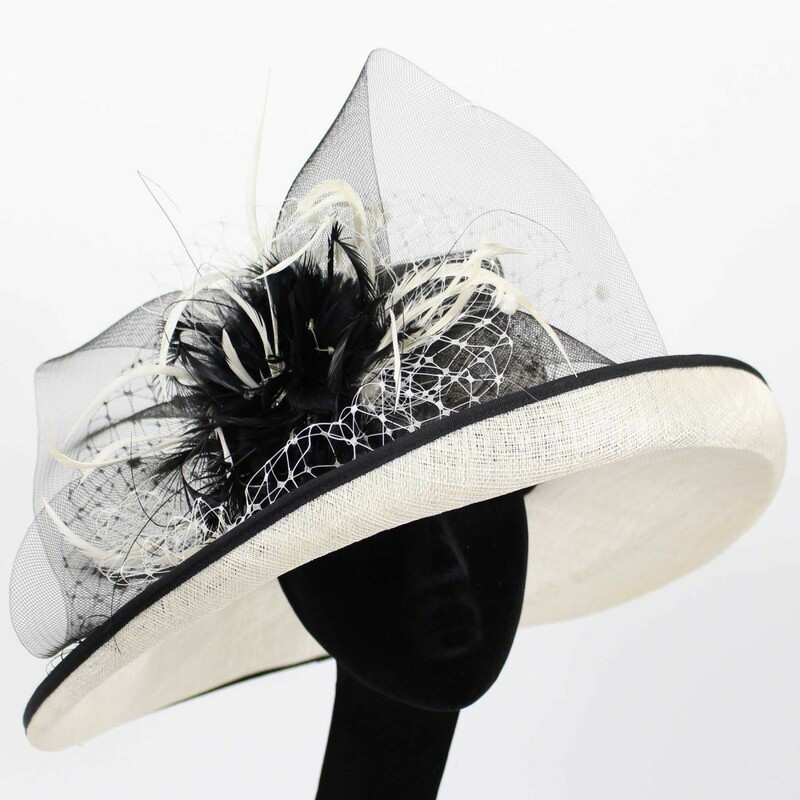 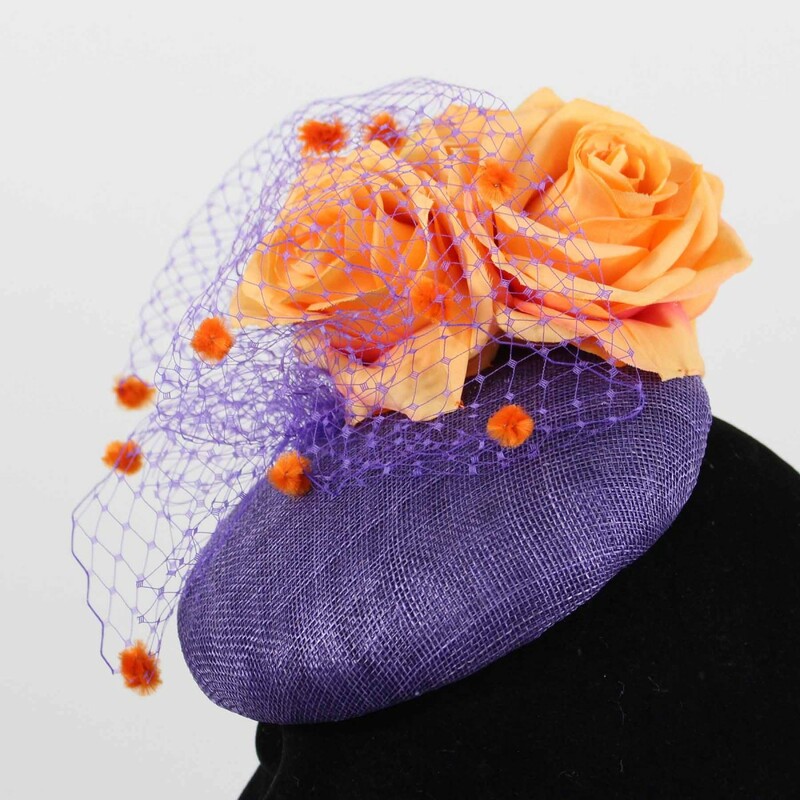 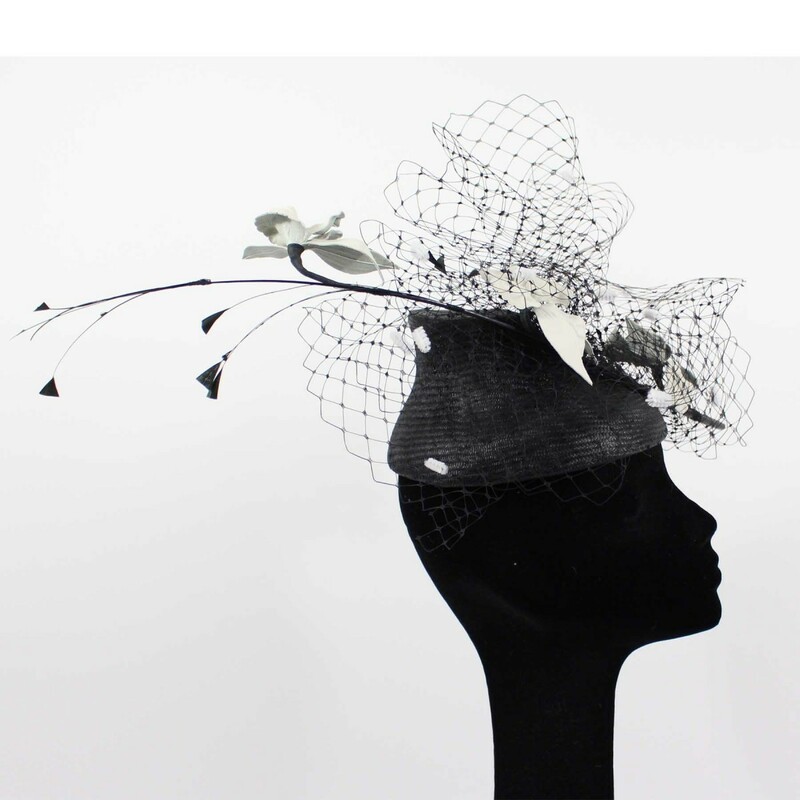 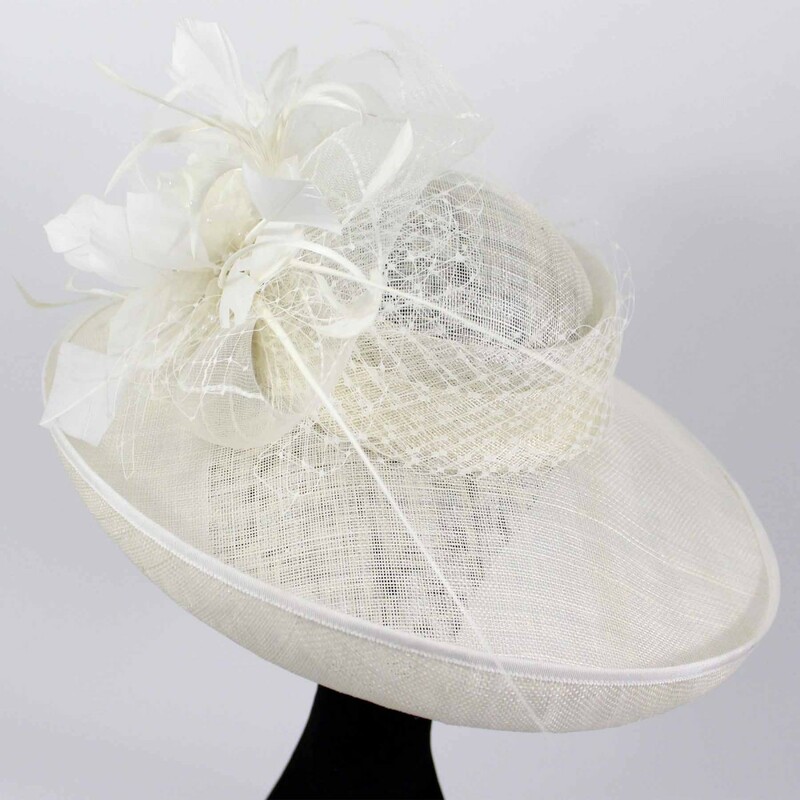 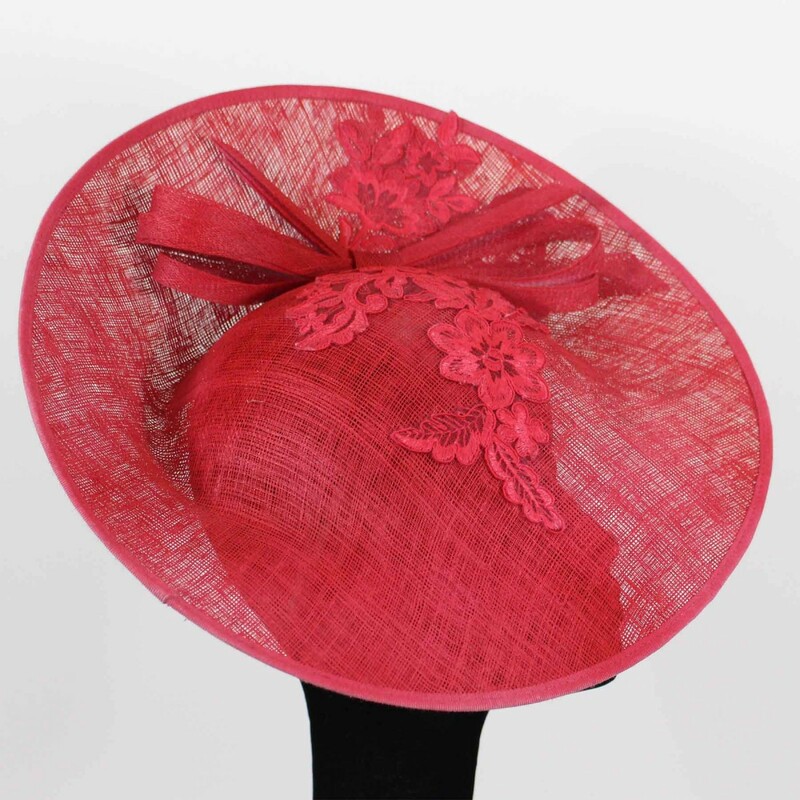 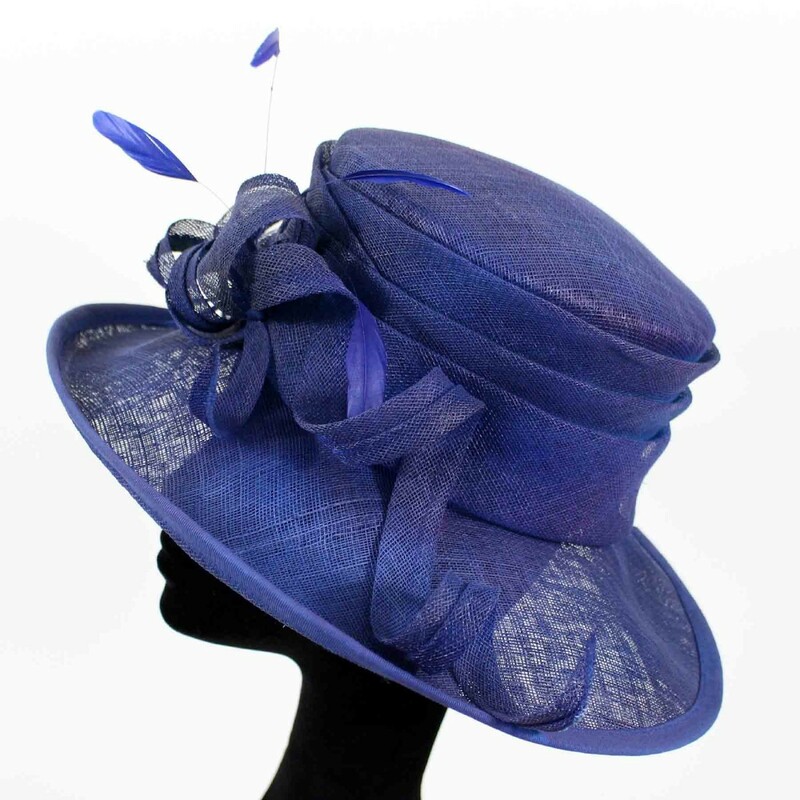 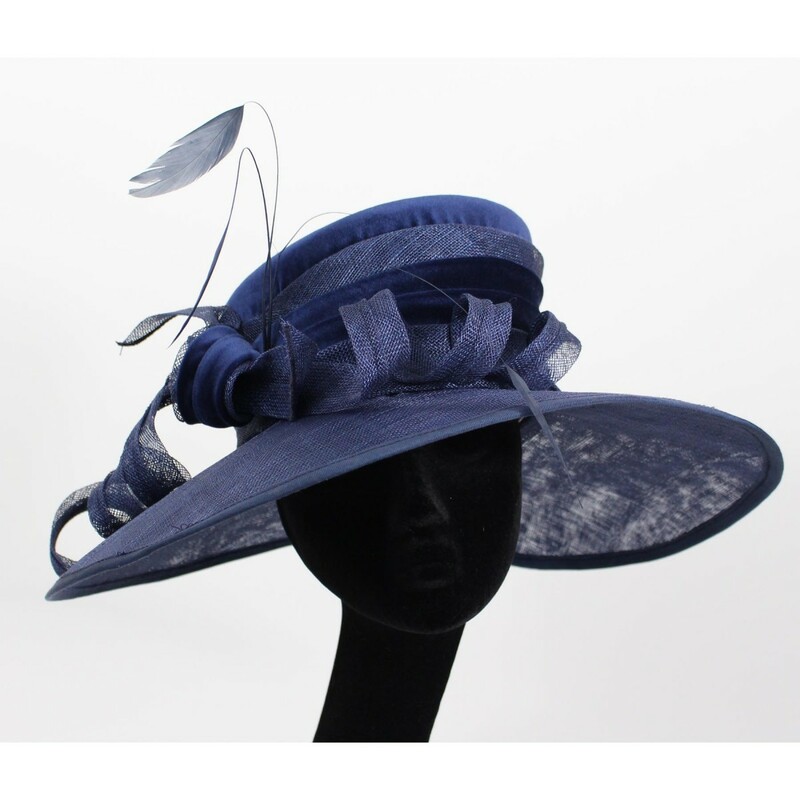 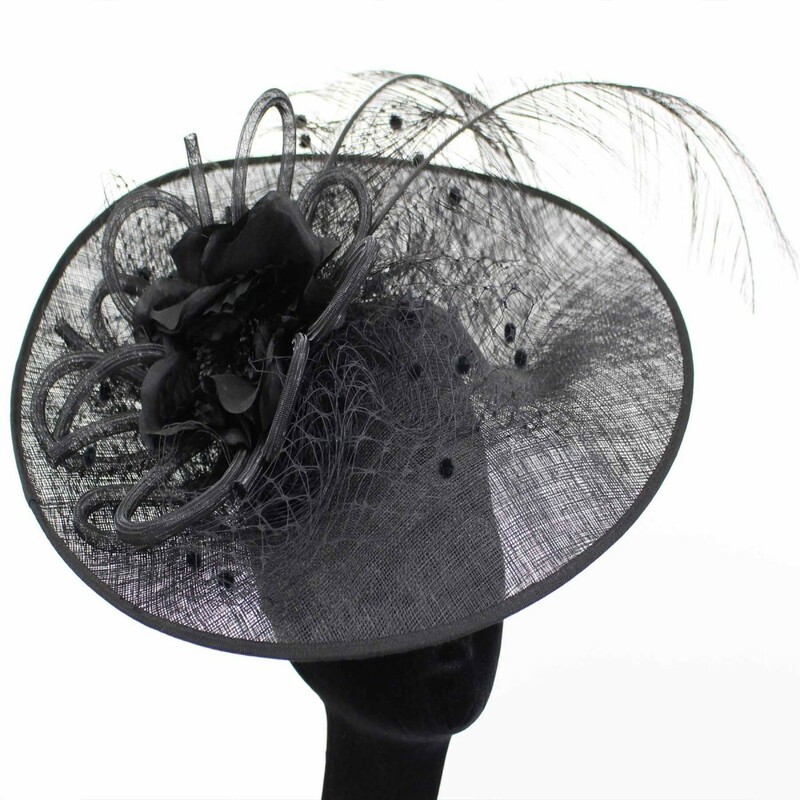 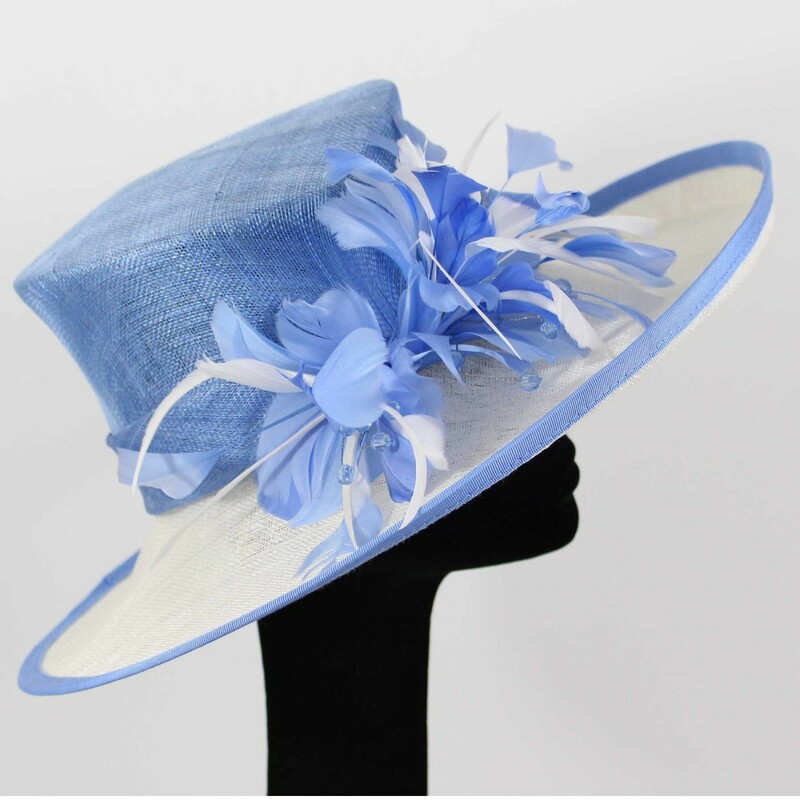 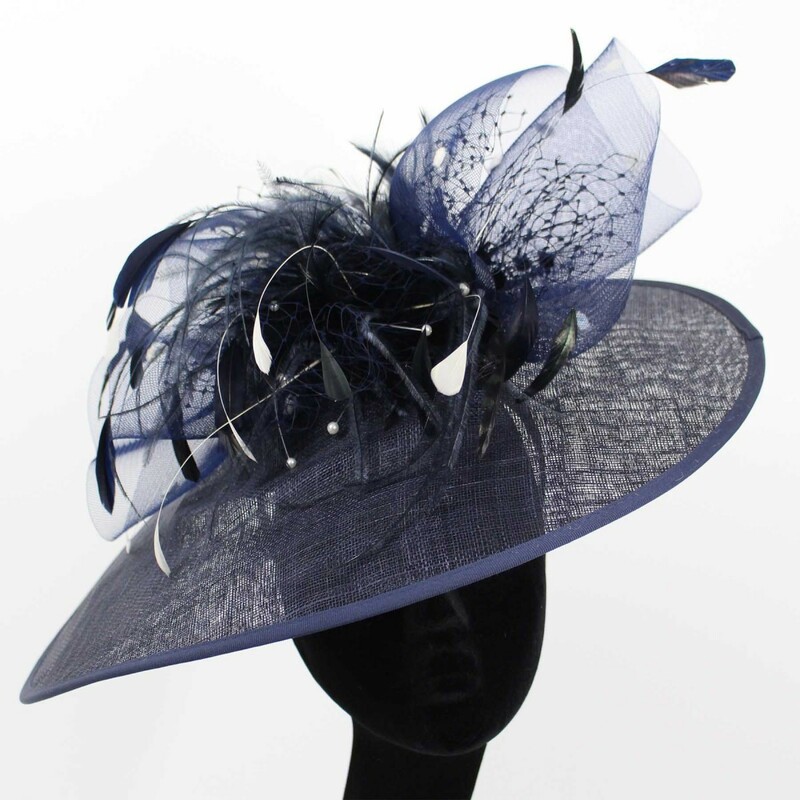 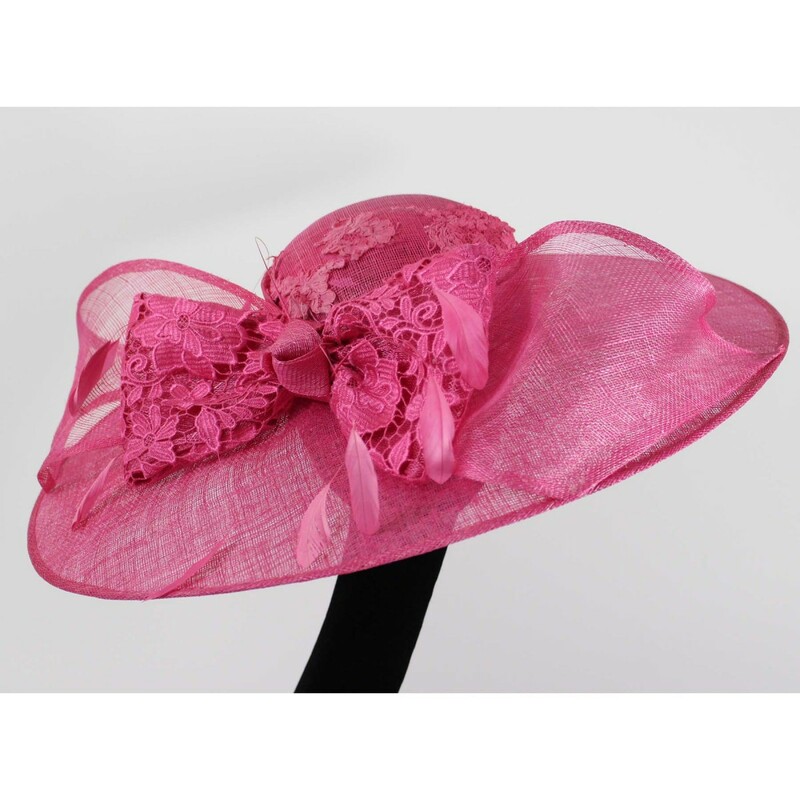 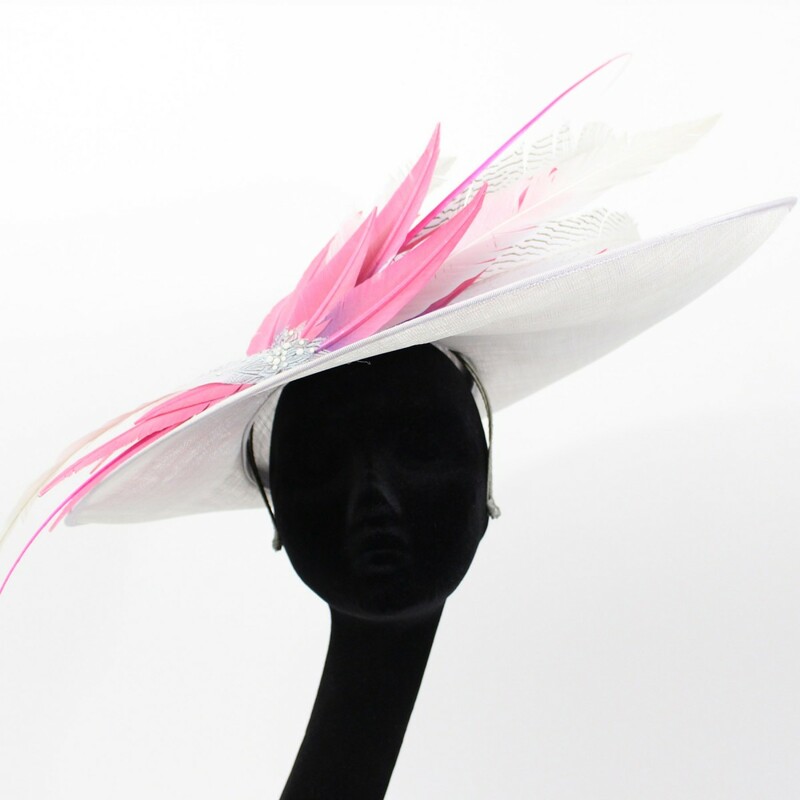 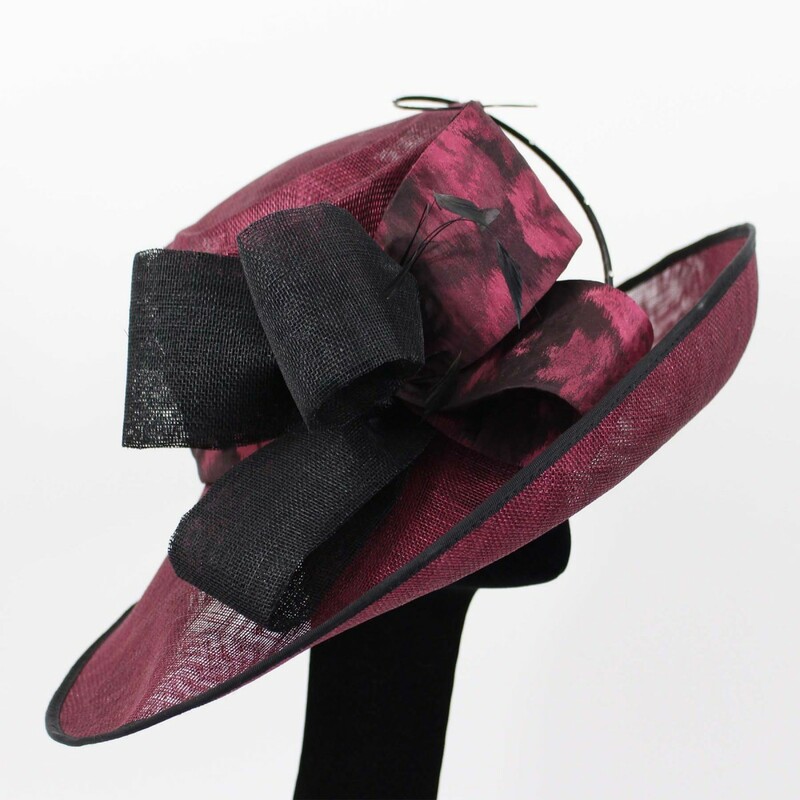 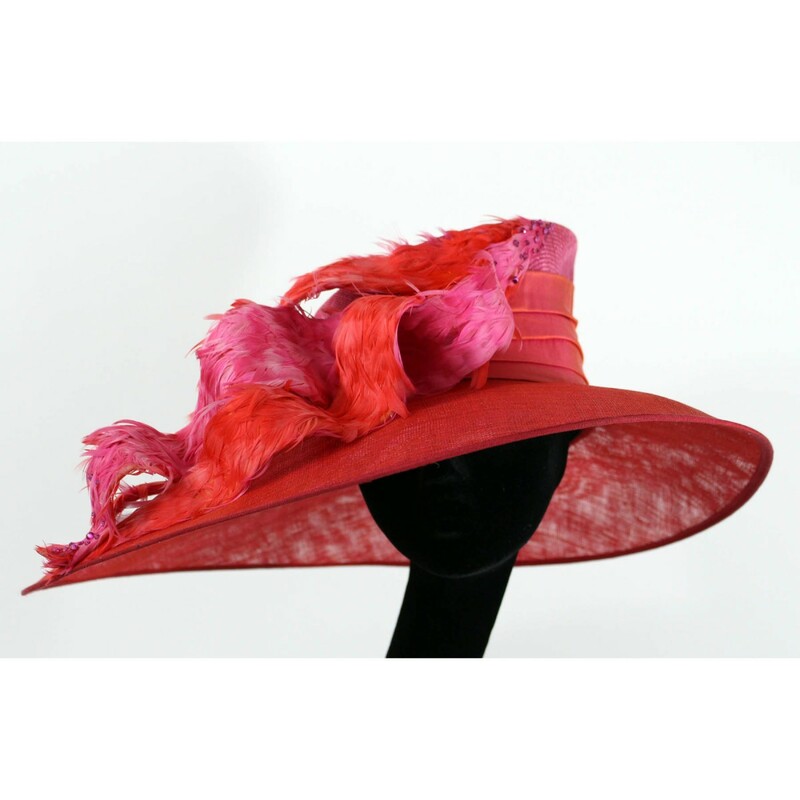 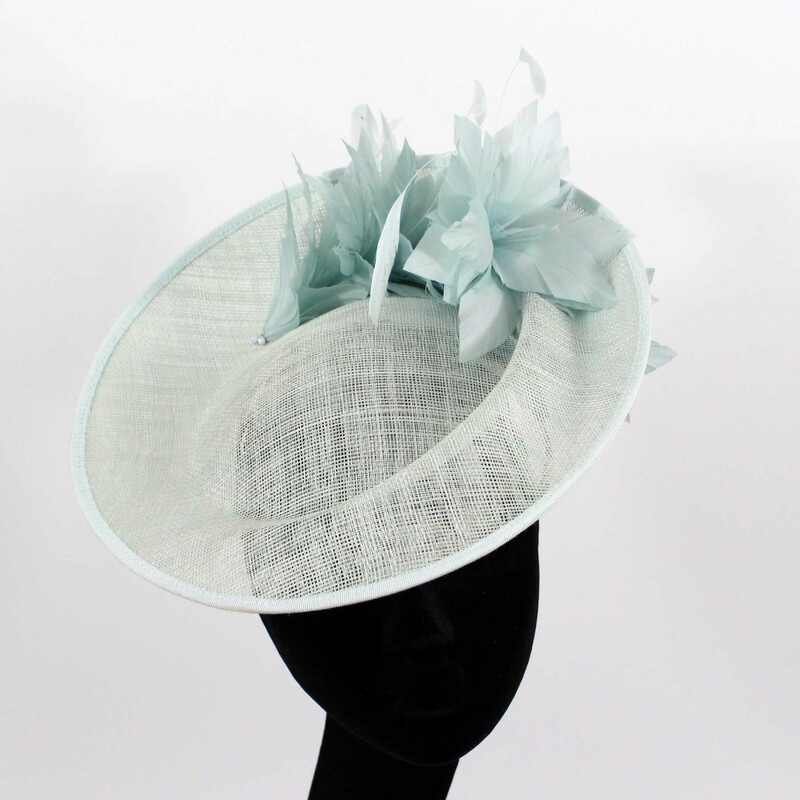 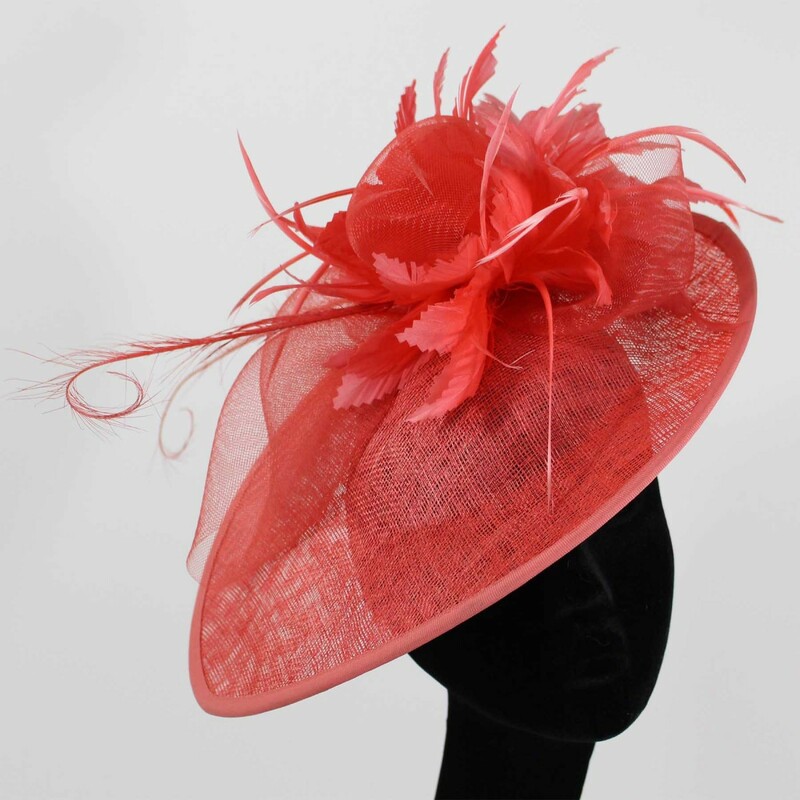 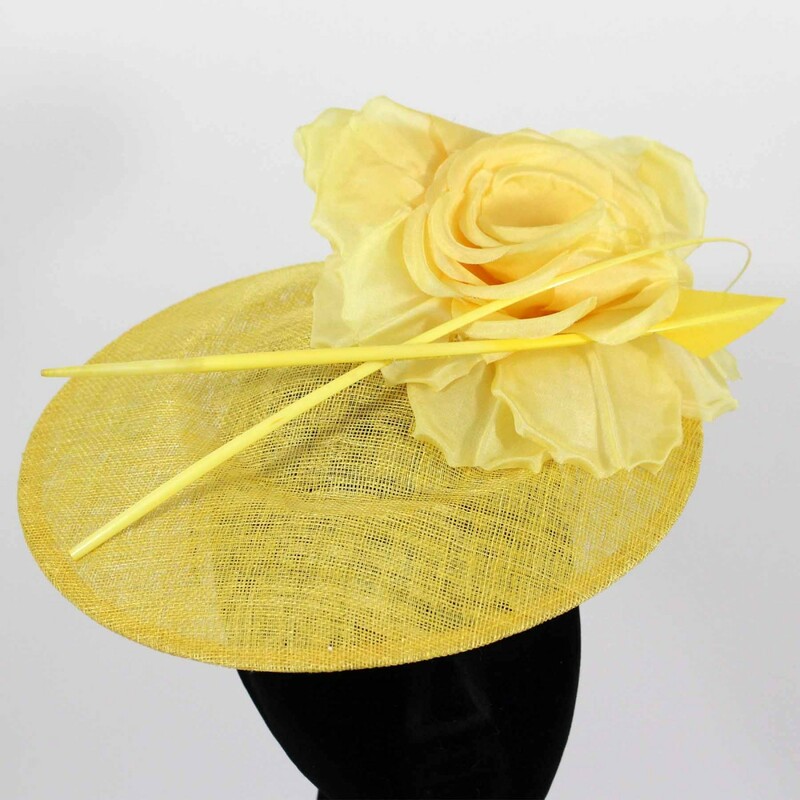 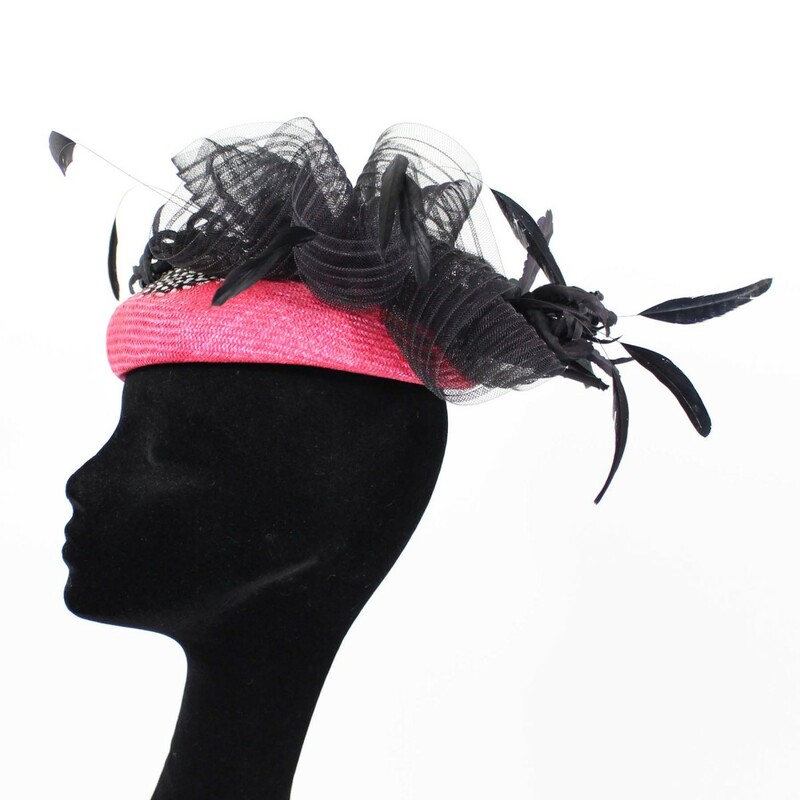 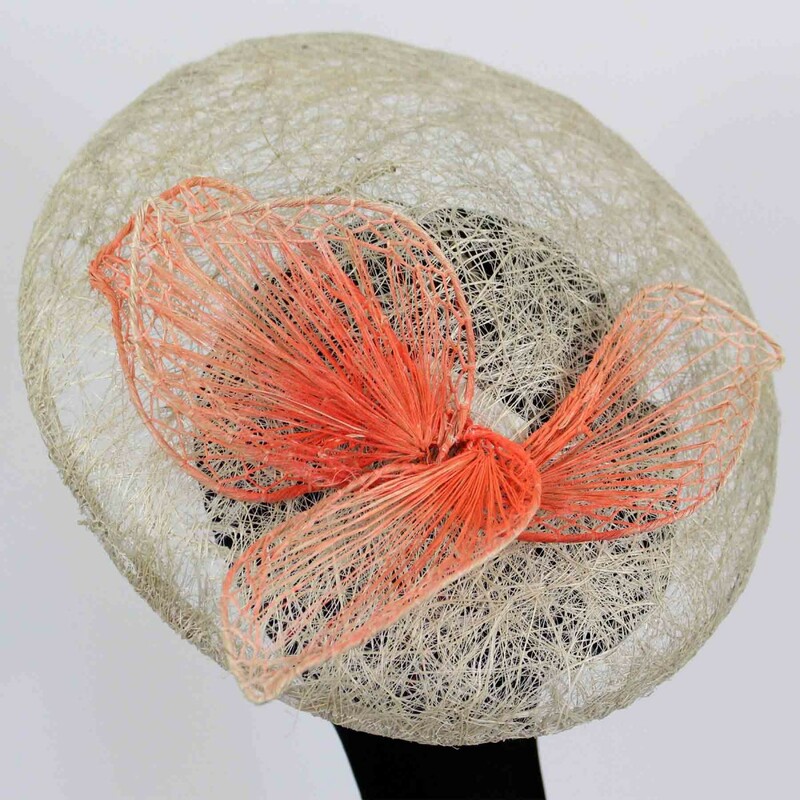 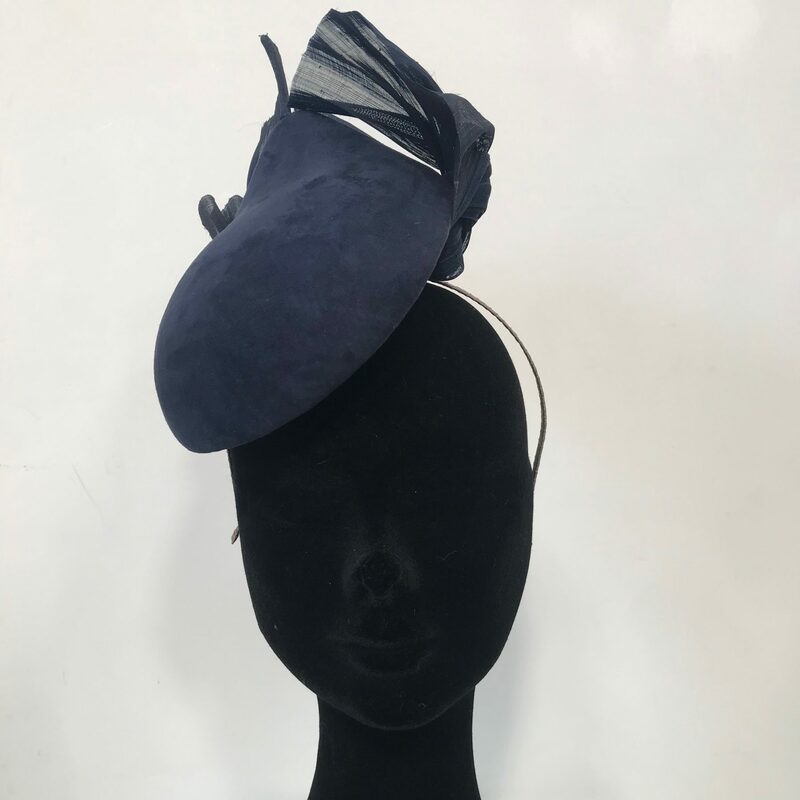 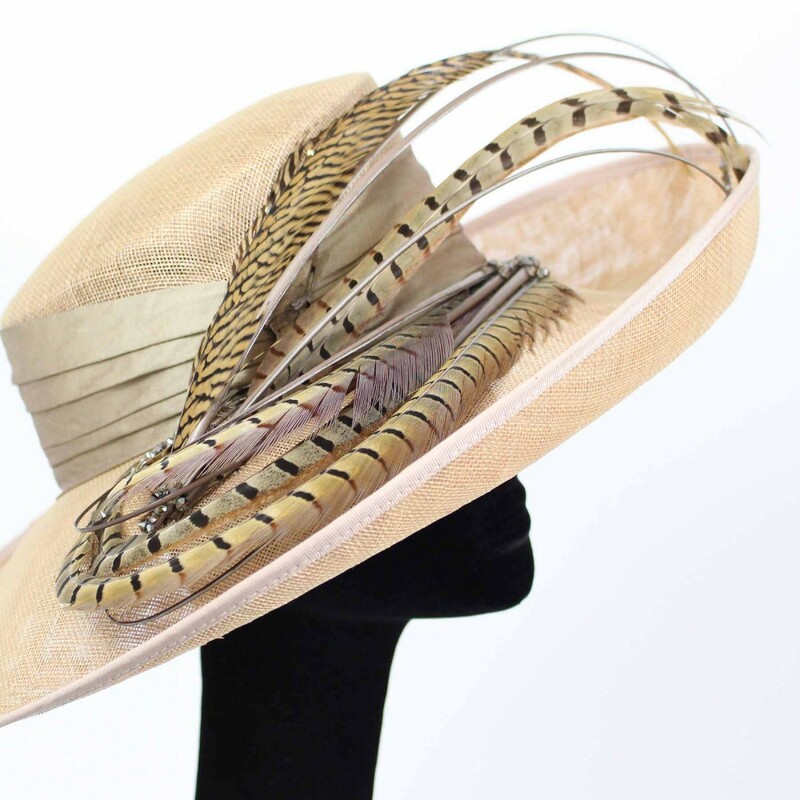 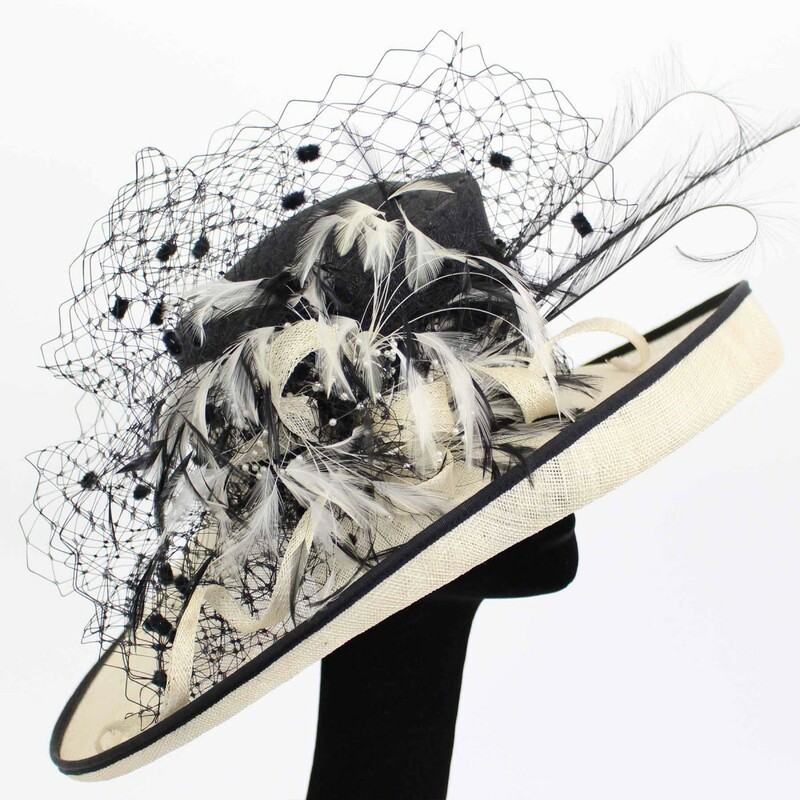 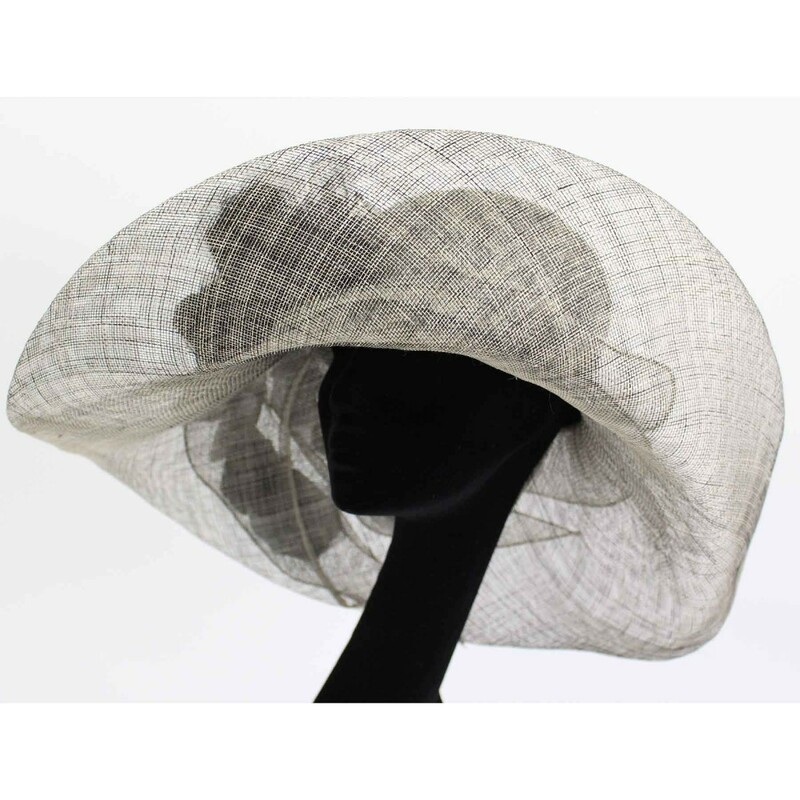 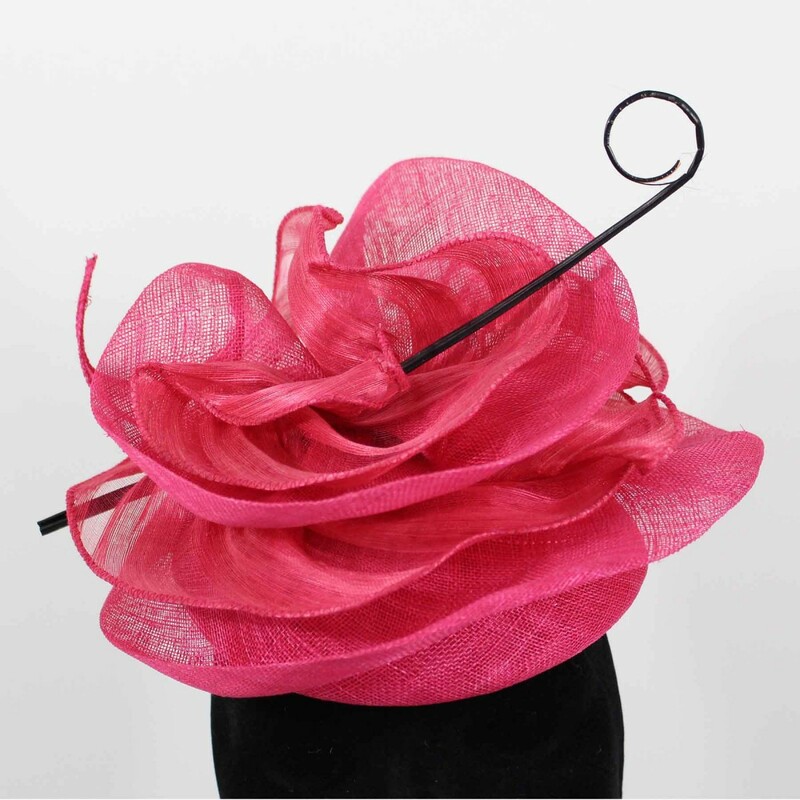 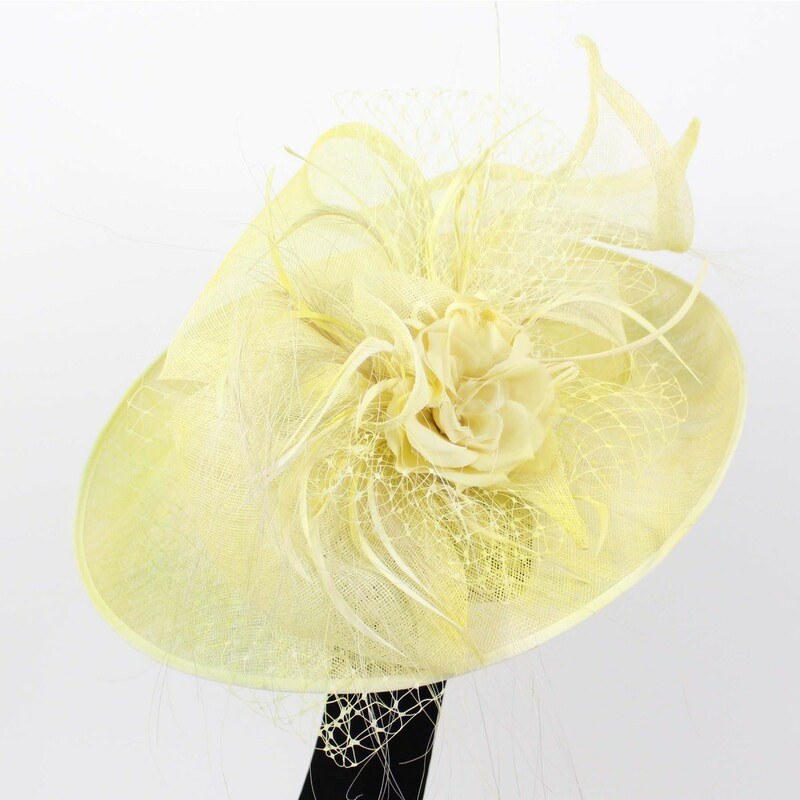 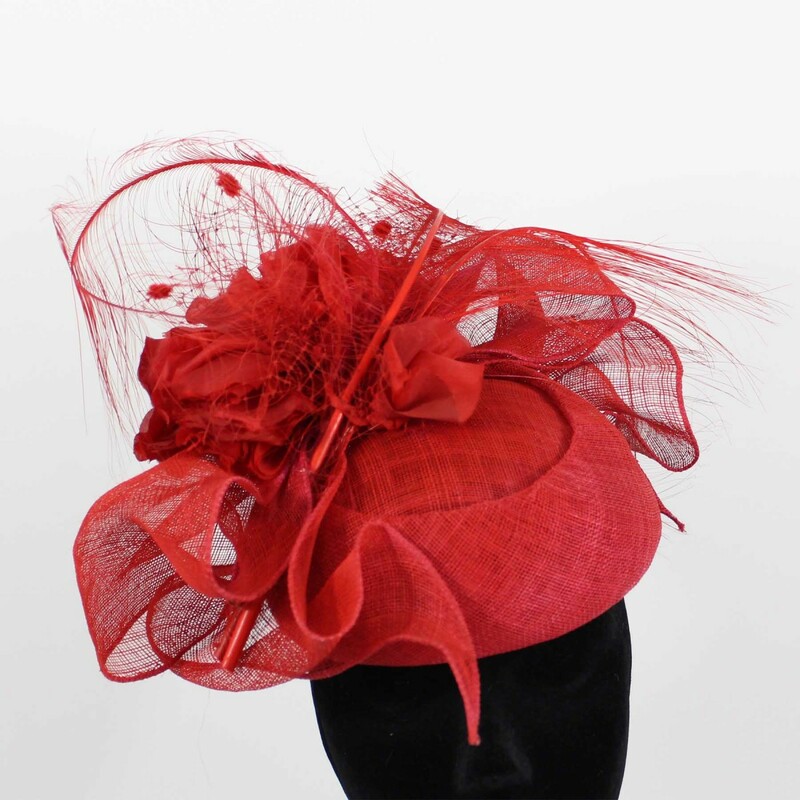 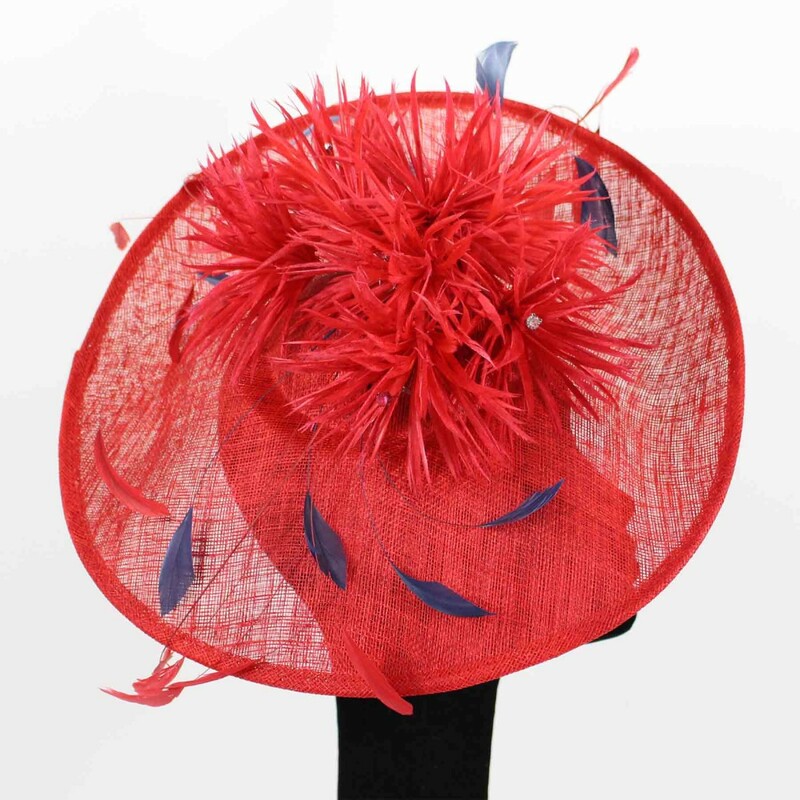 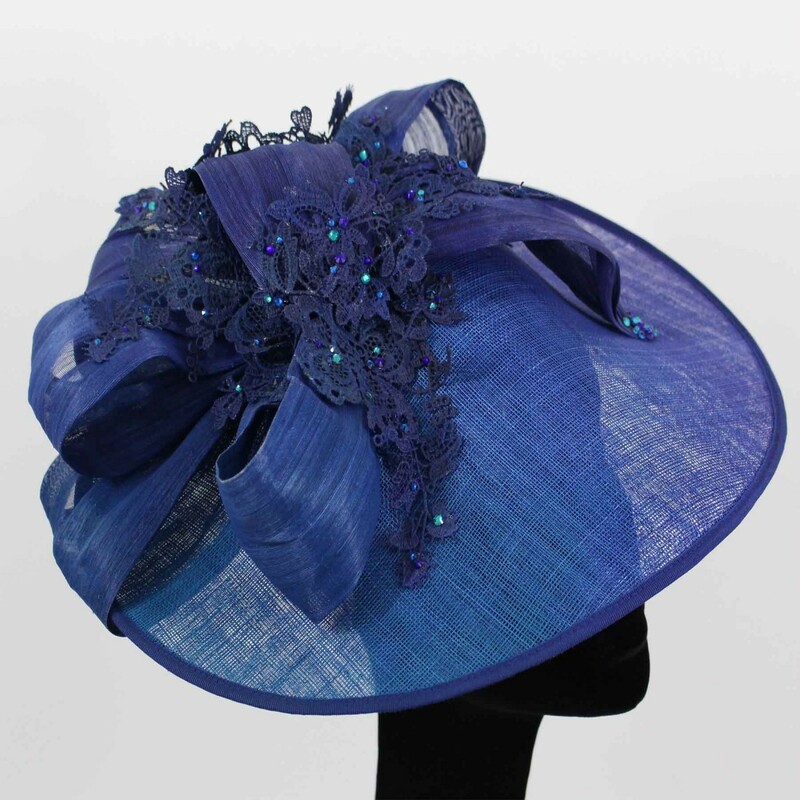 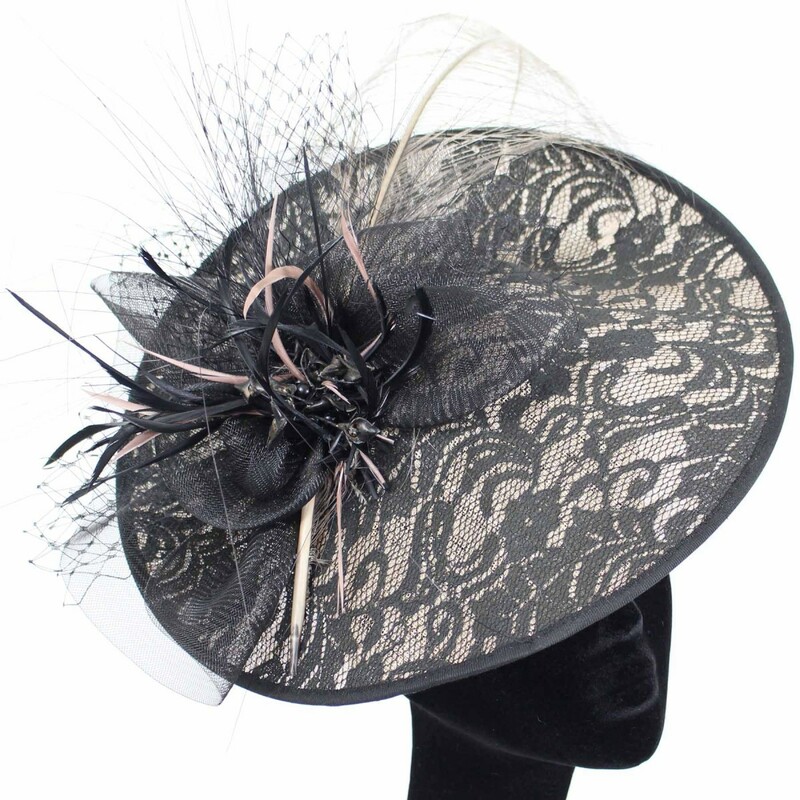 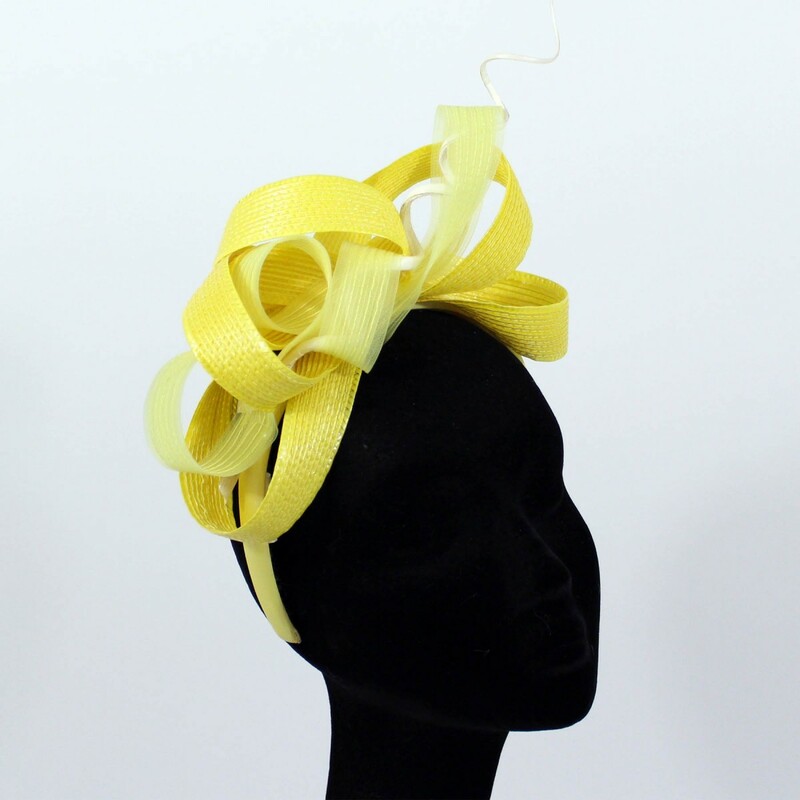 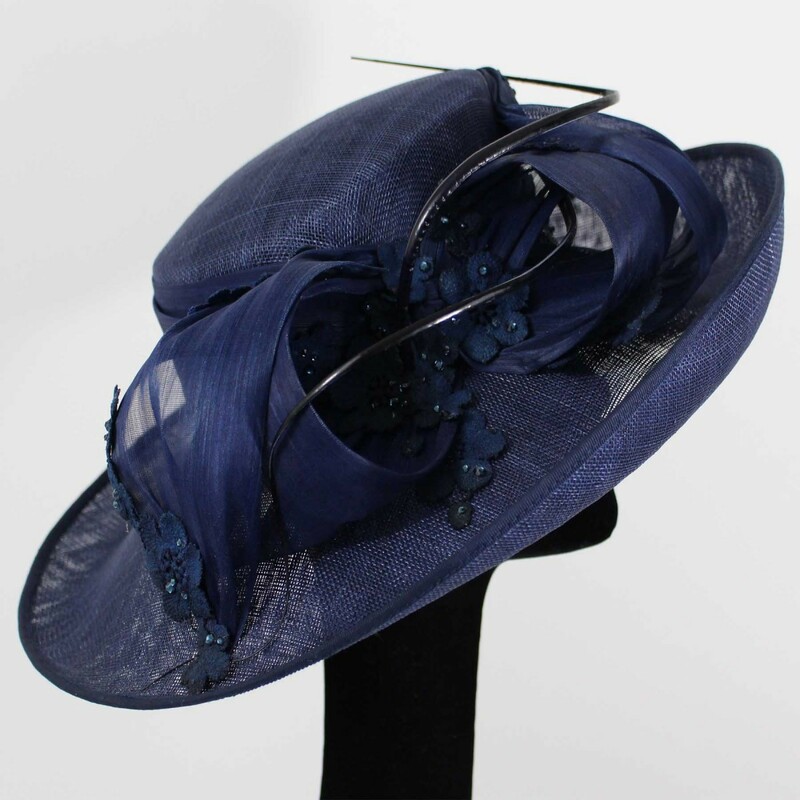 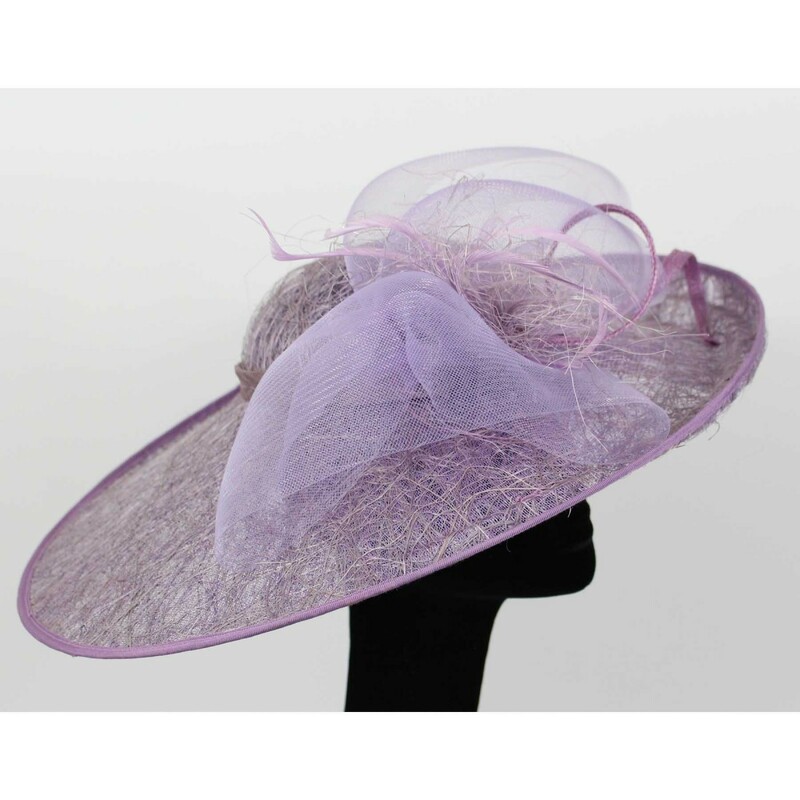 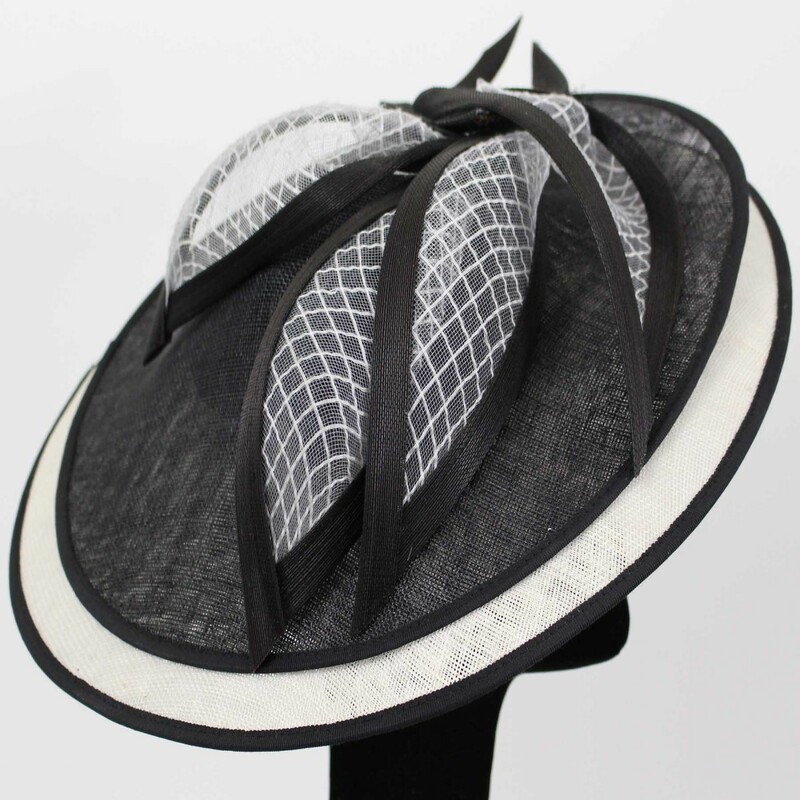 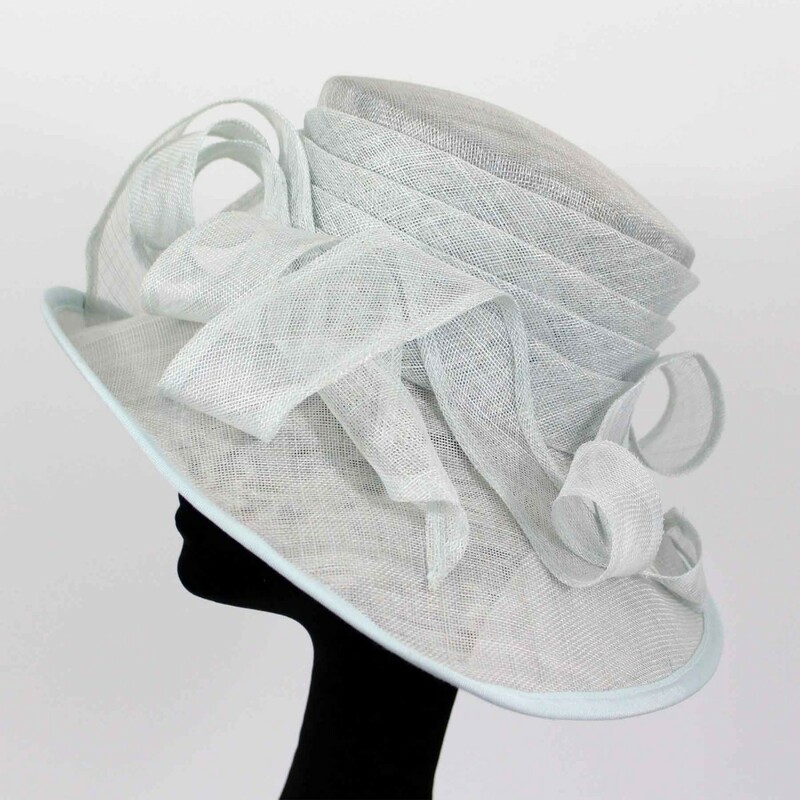 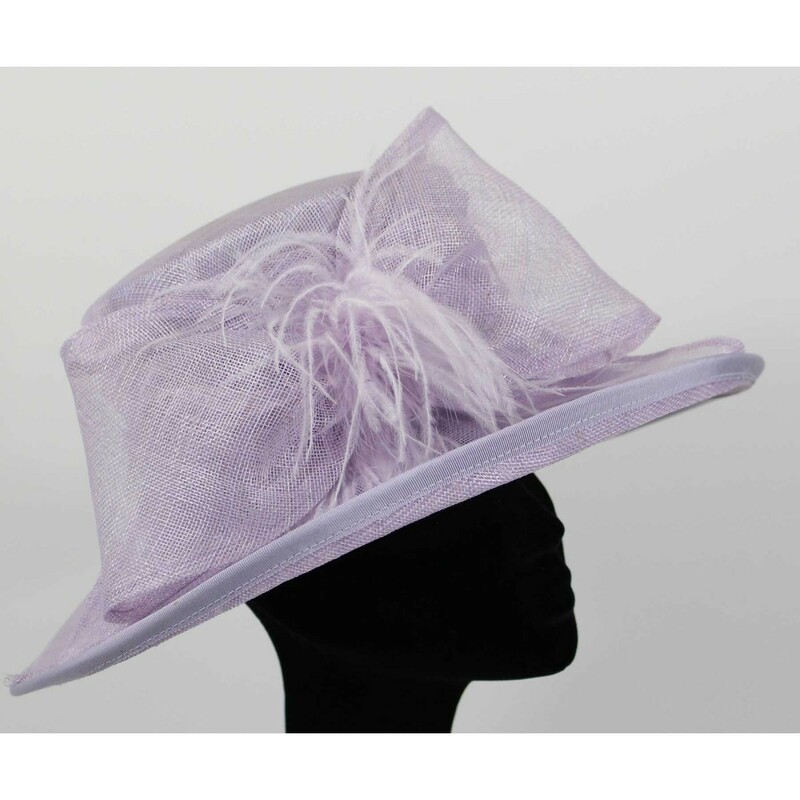 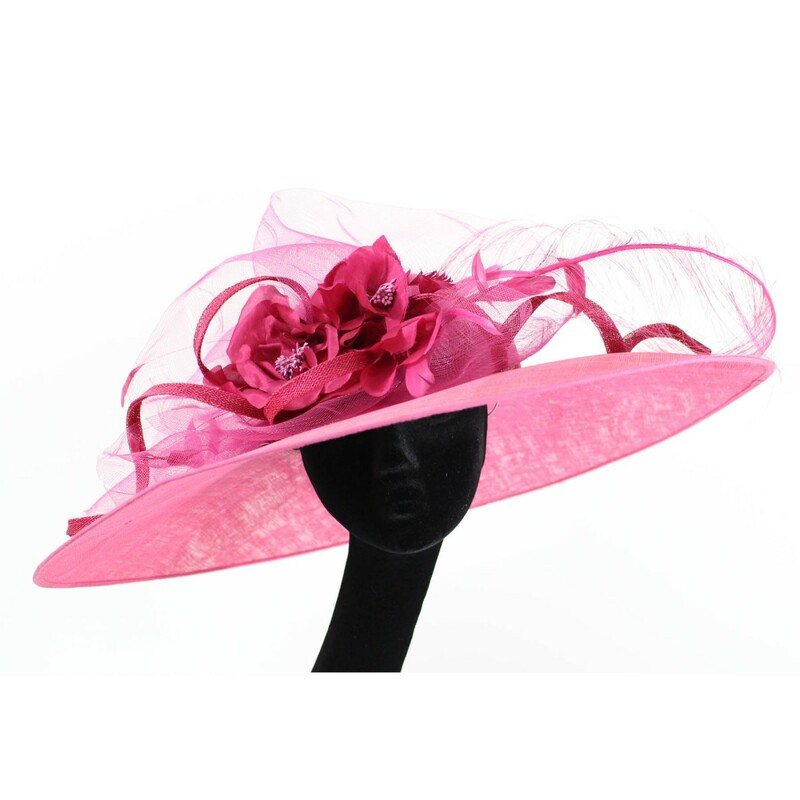 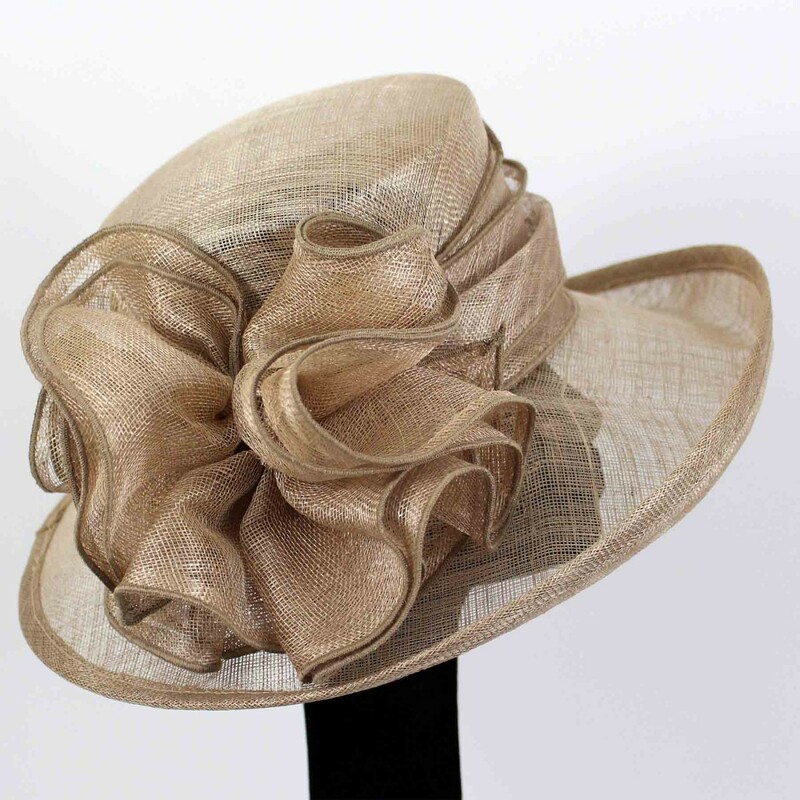 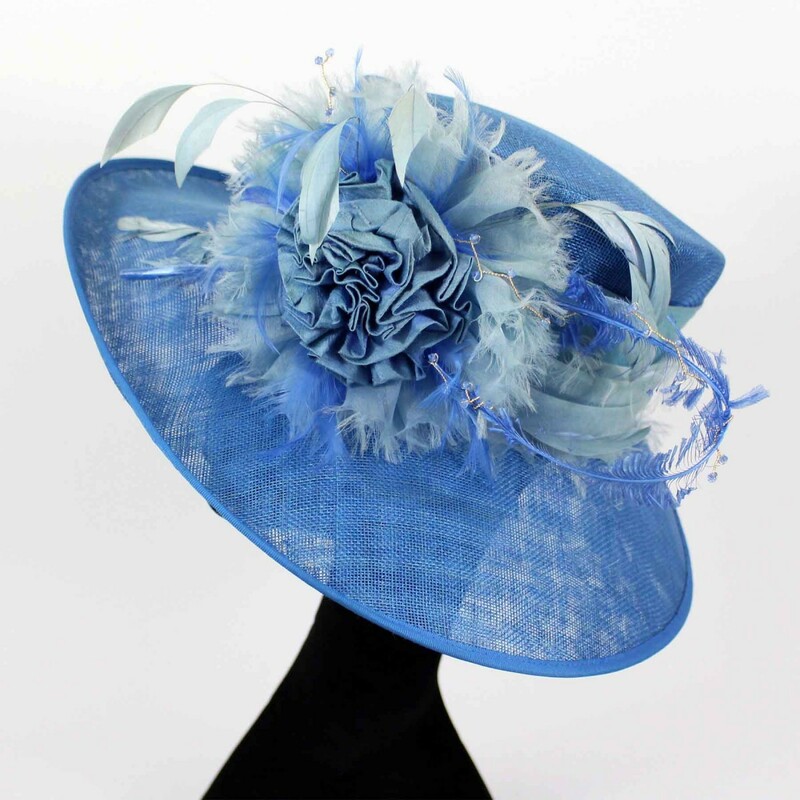 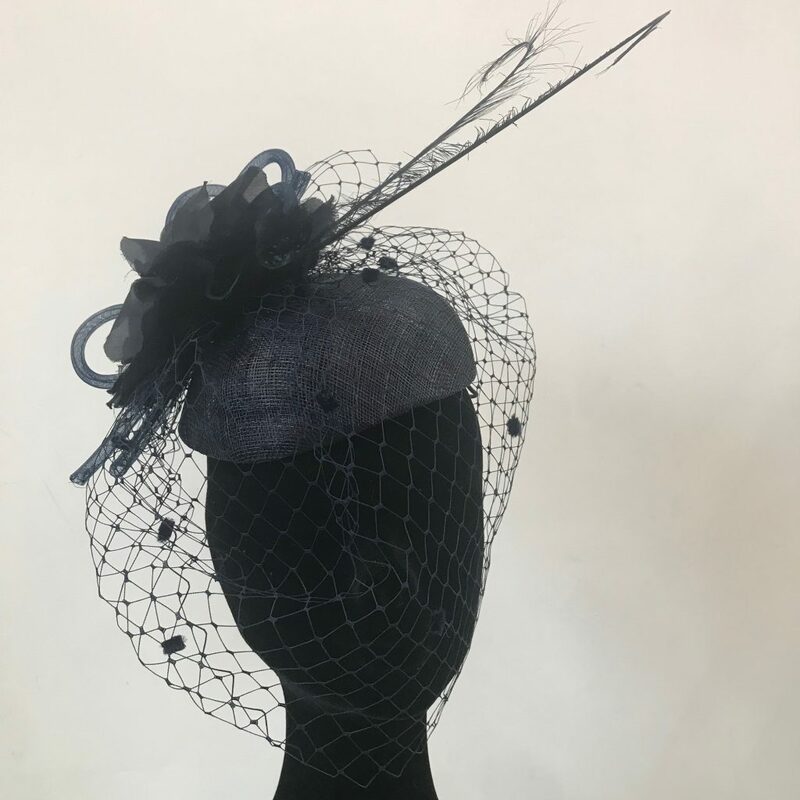 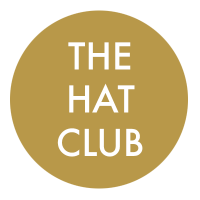 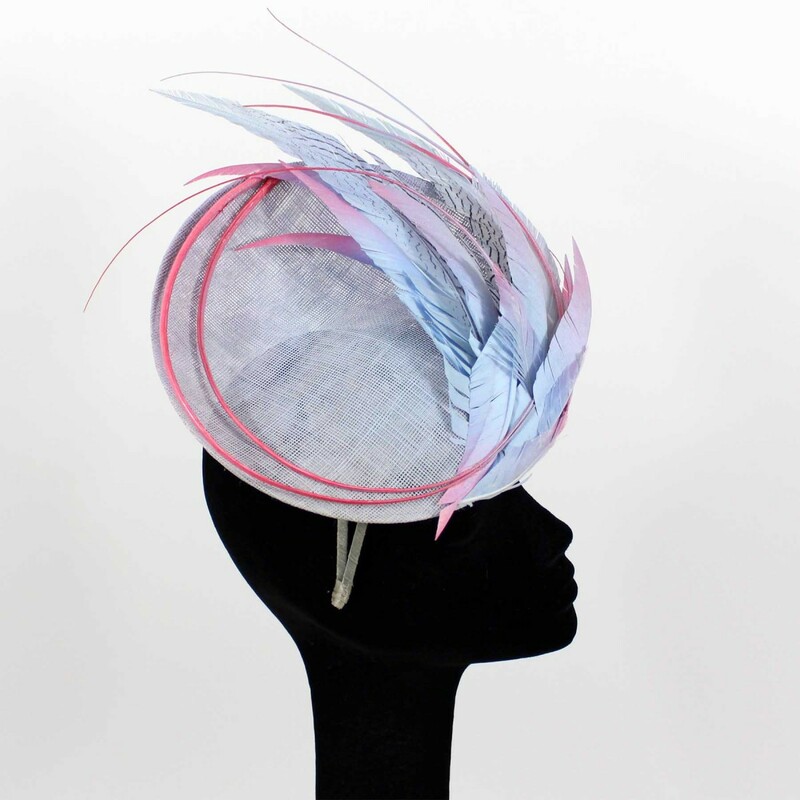 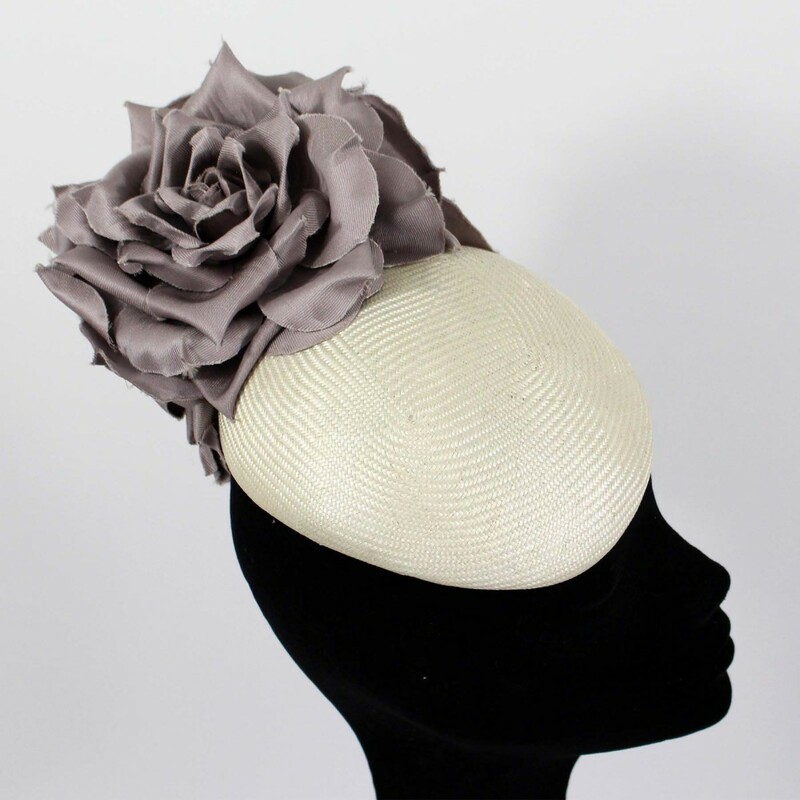 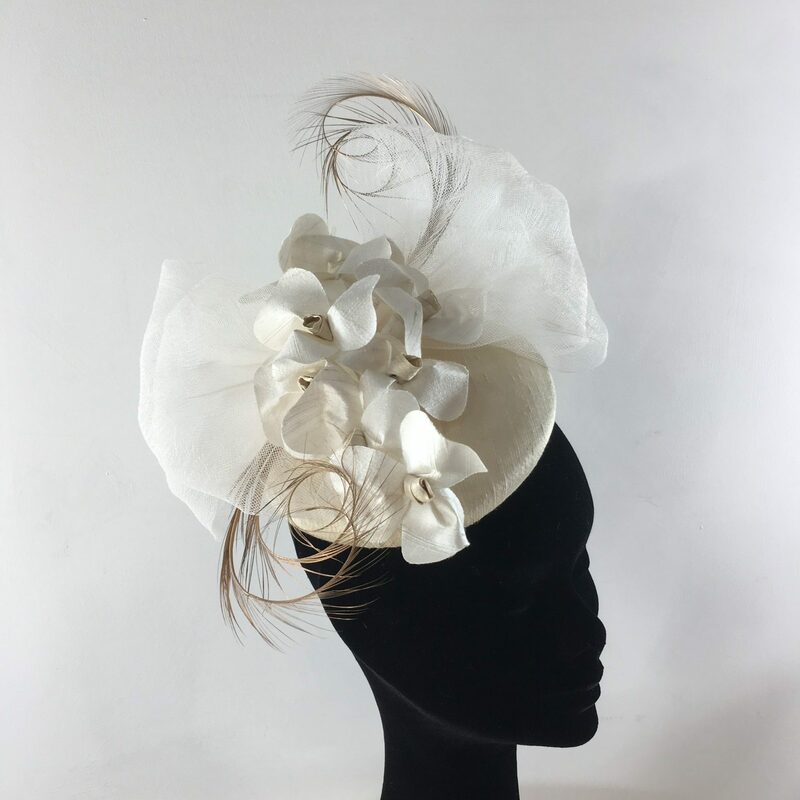 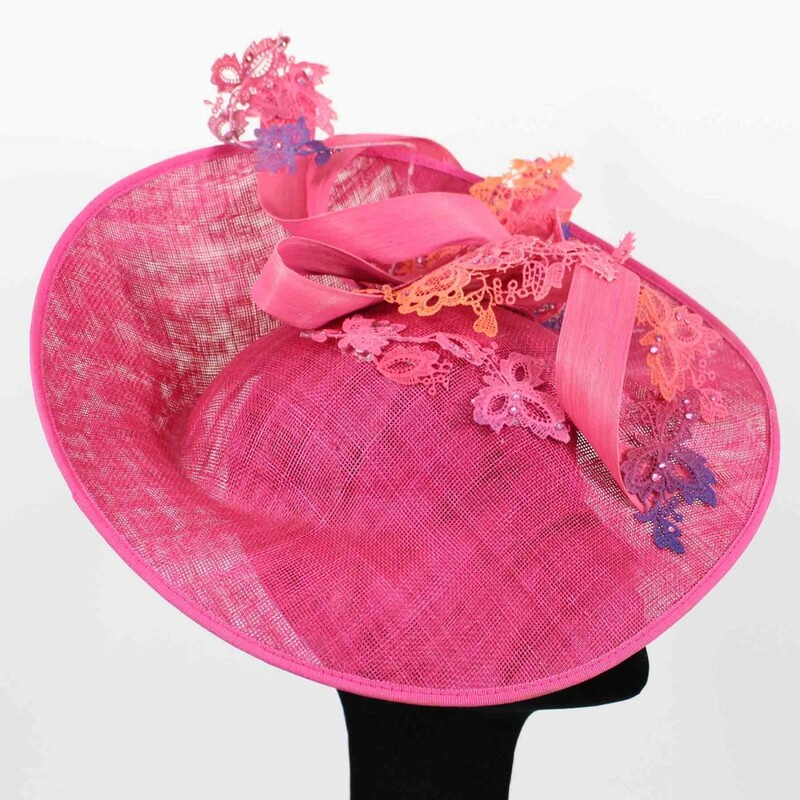 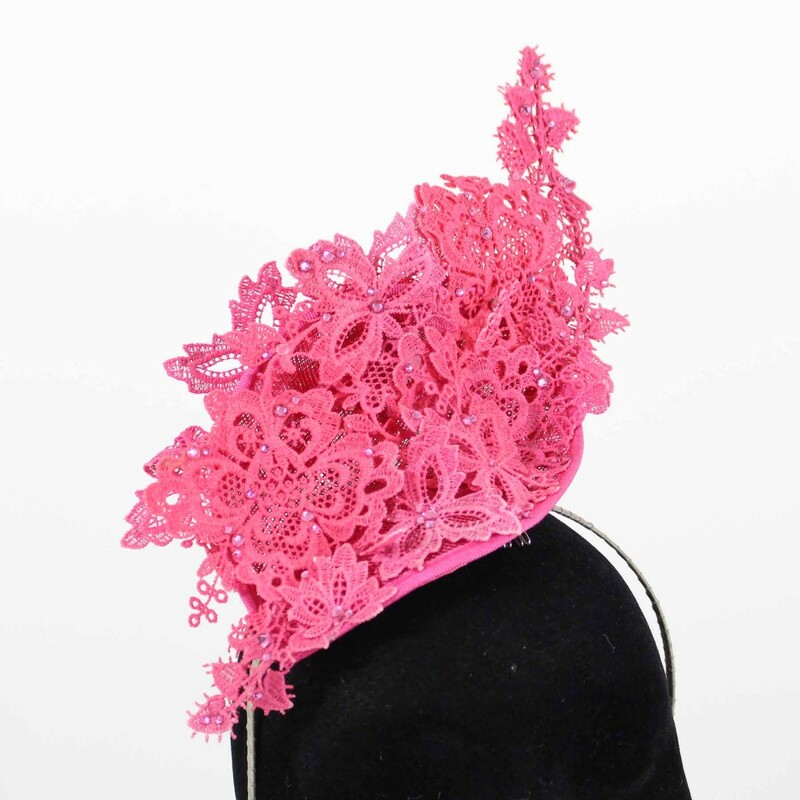 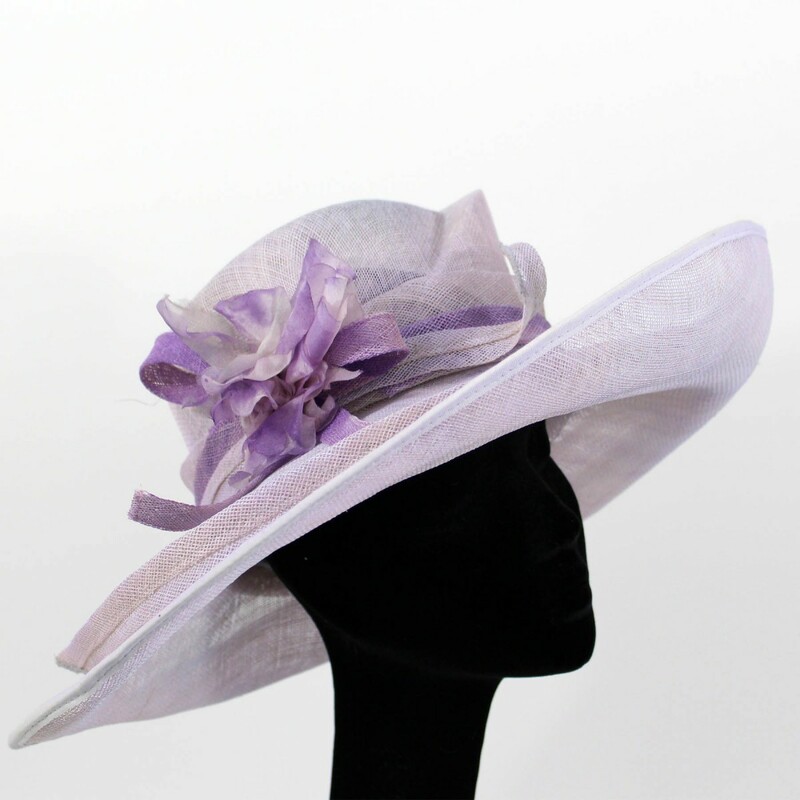 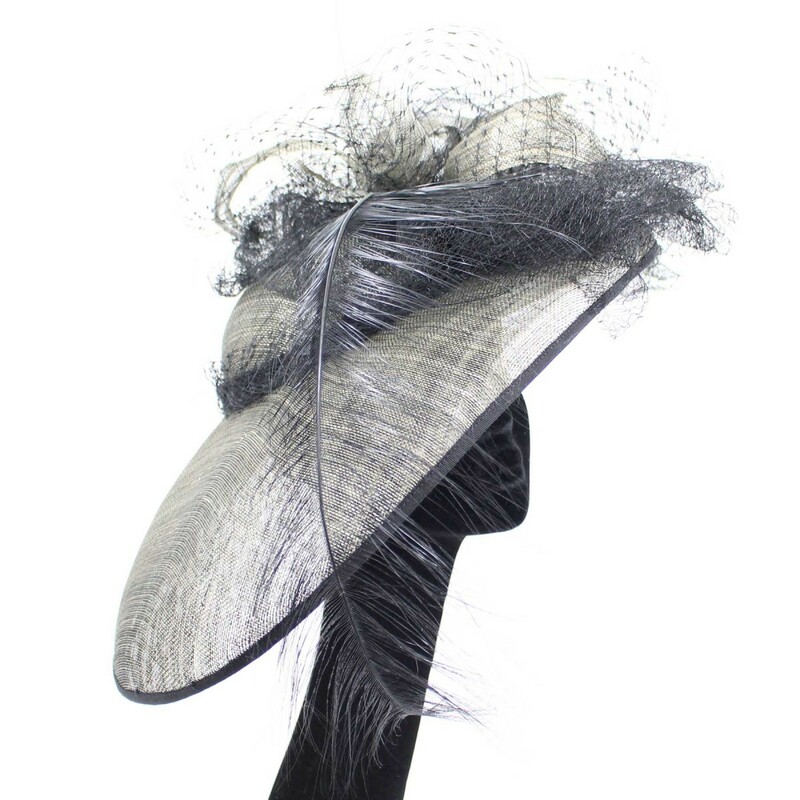 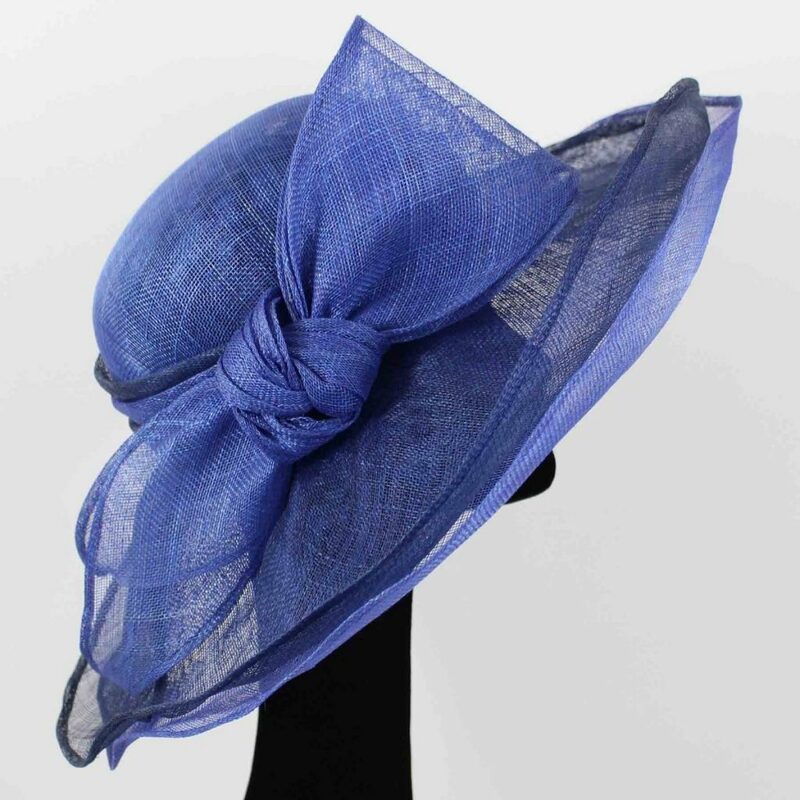 Chic and stylish, the perfect hat for a wedding or the races. 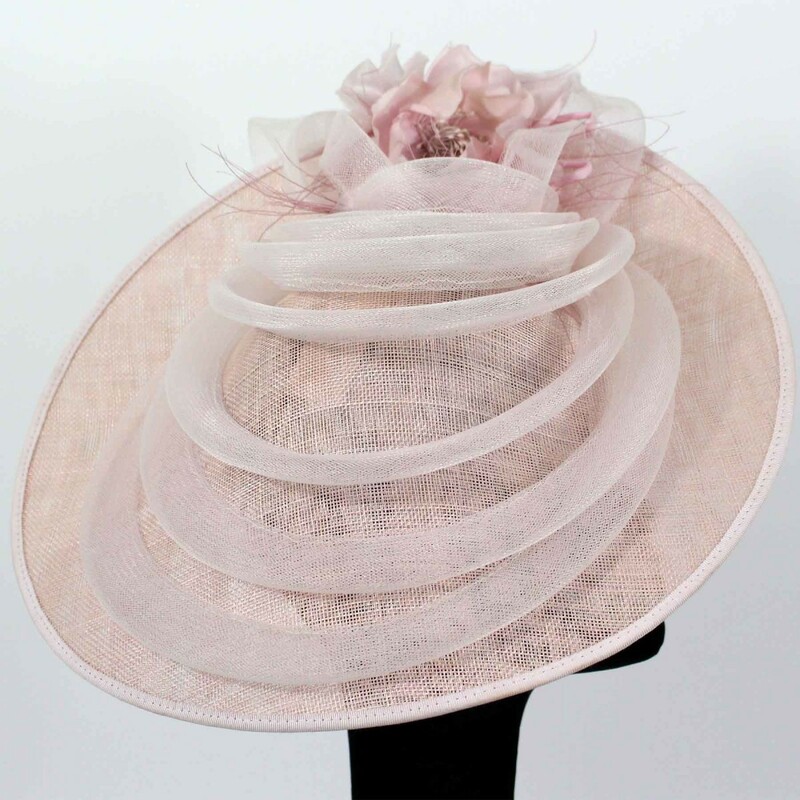 A pink halo crown with ivory pearled petals. 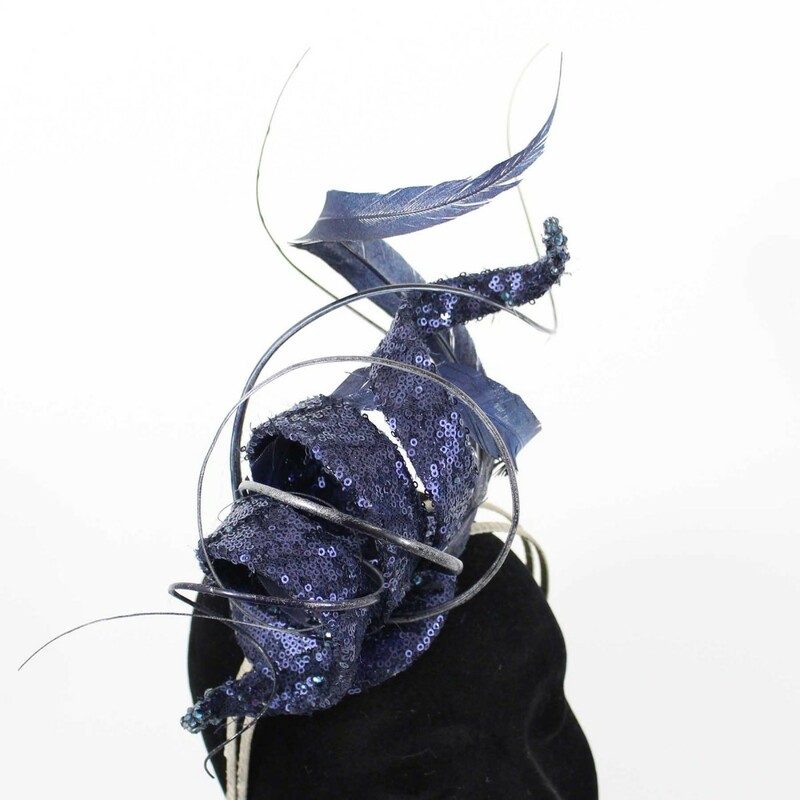 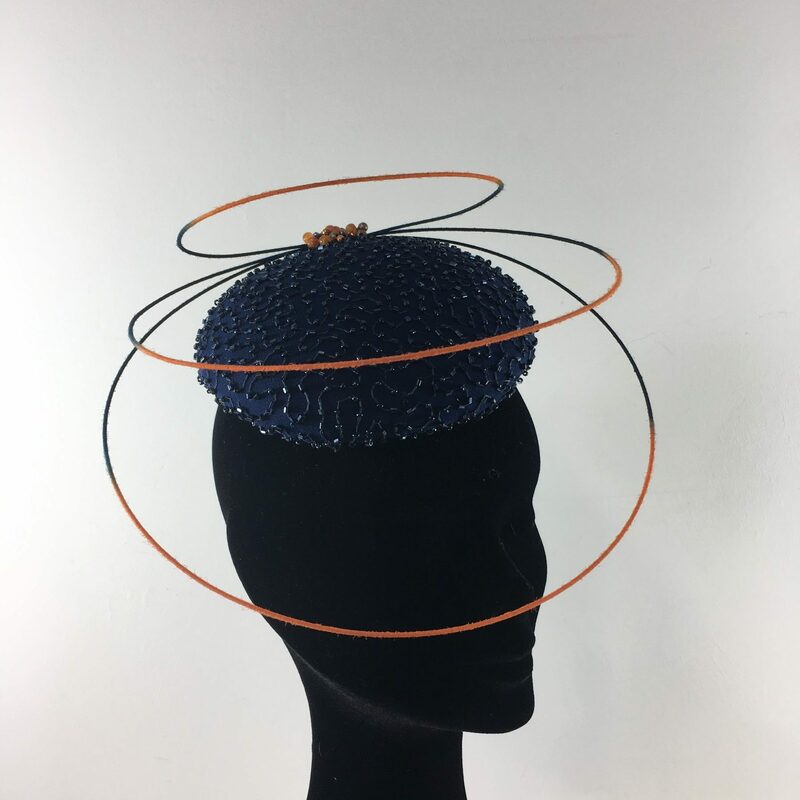 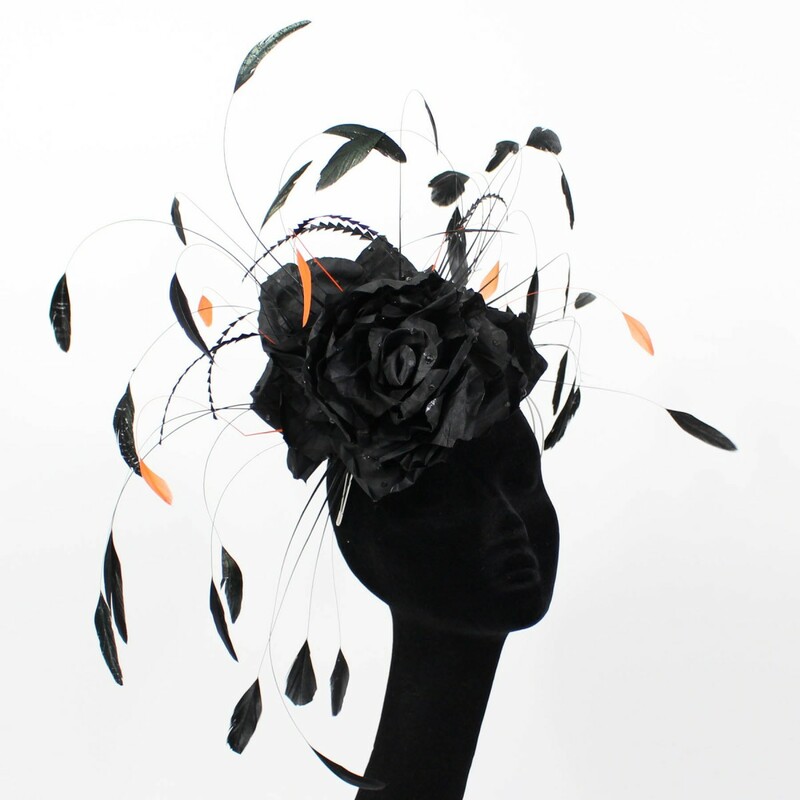 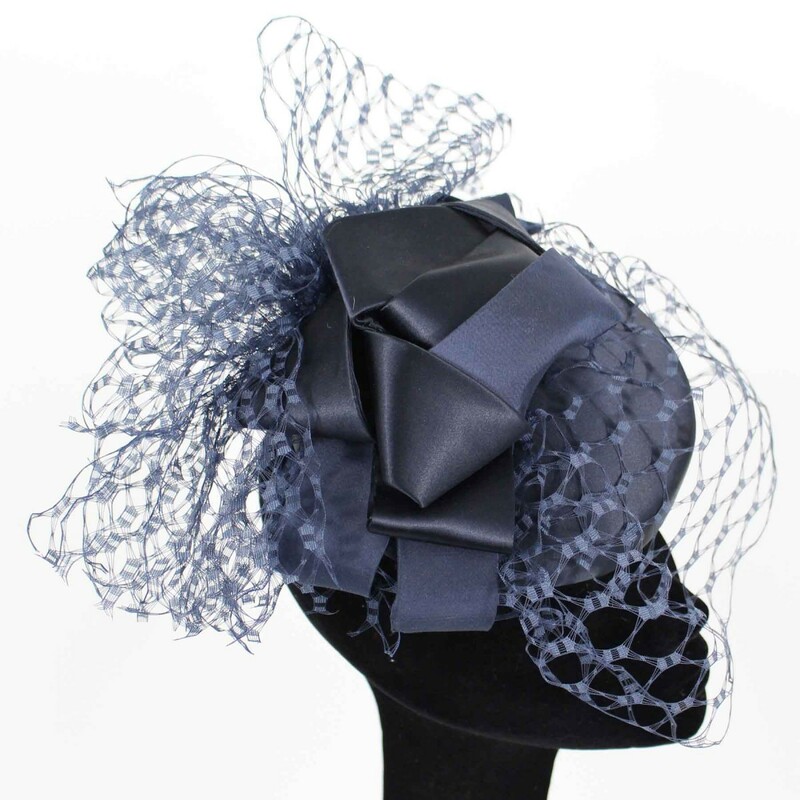 A stunning modern light navy headpiece with orange detail. 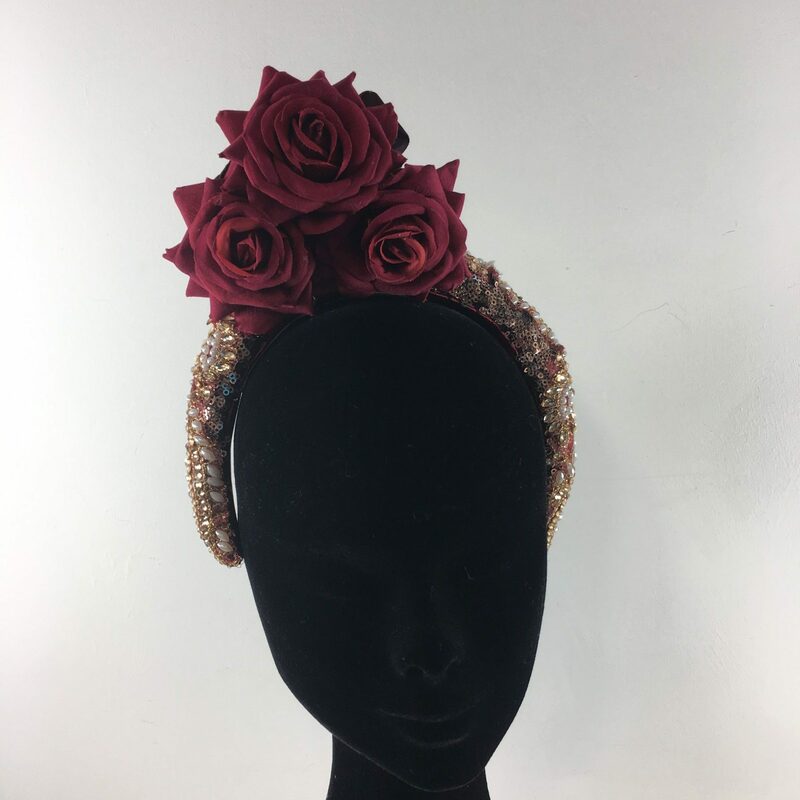 A beautiful bejewelled headband with burgundy roses. 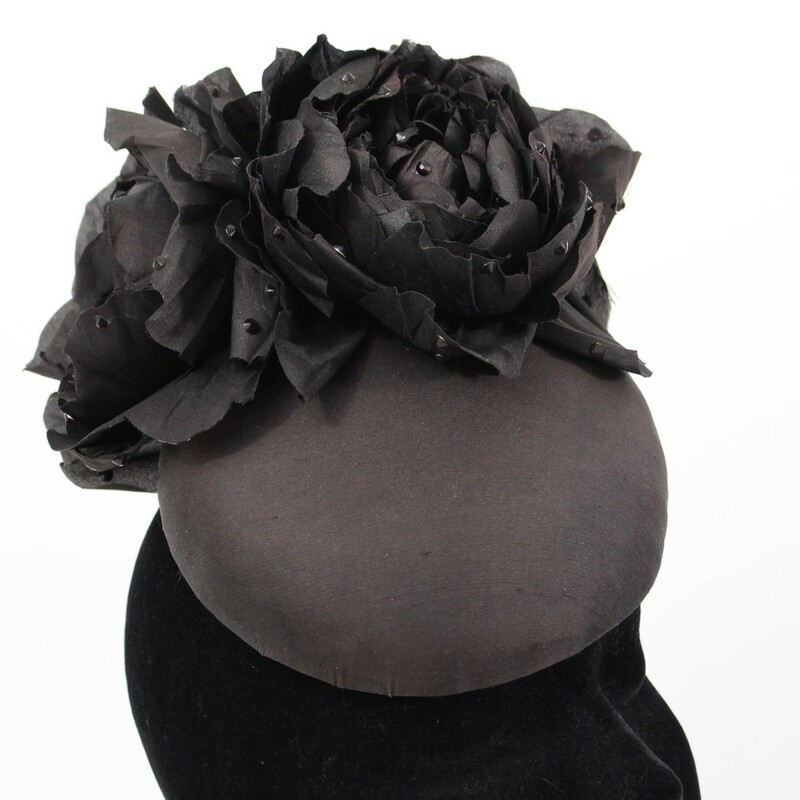 A monochrome houndstooth beret, with black velvet roses and feather spray. 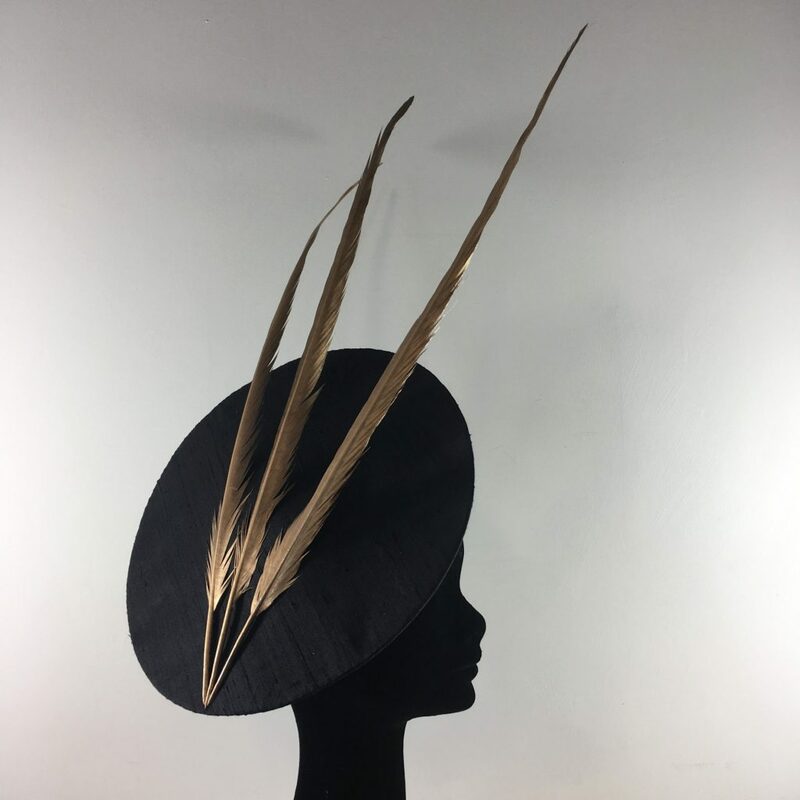 A modern twist on a traditional design. 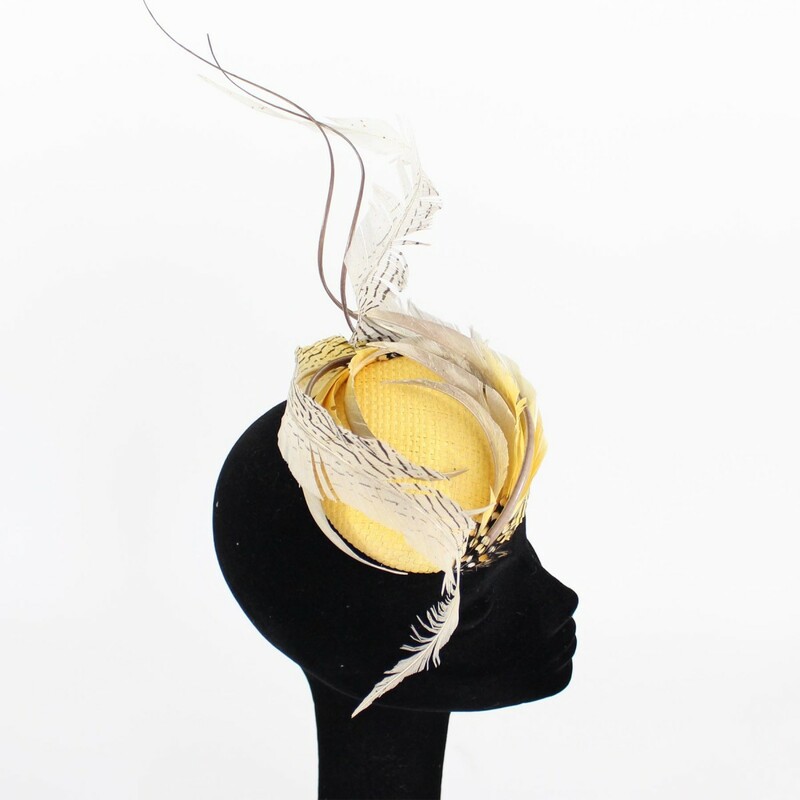 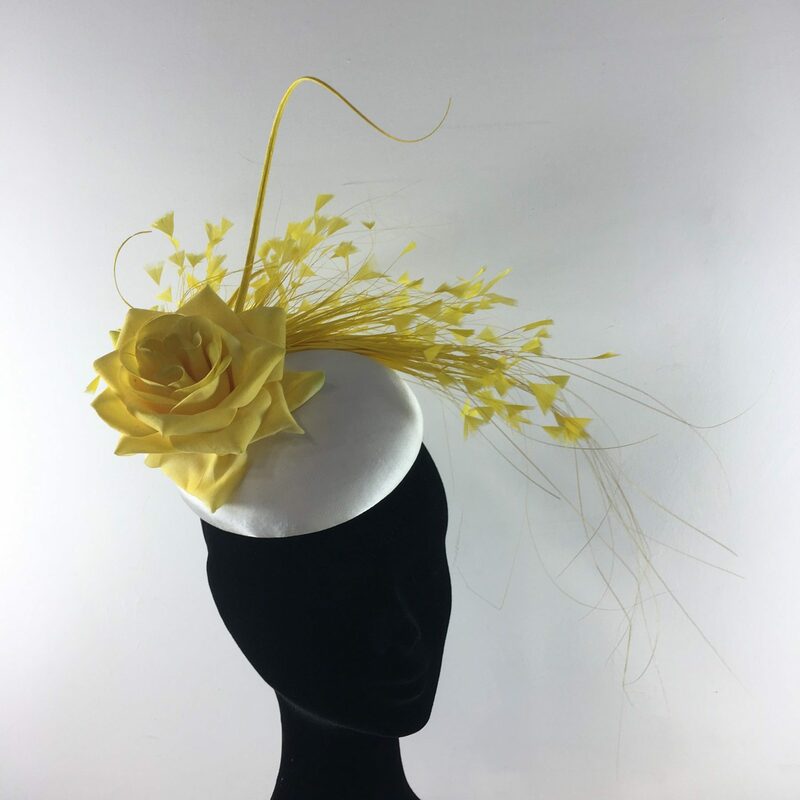 A ivory and yellow button headpiece with yellow feather spray, curled quills and a velvet rose. 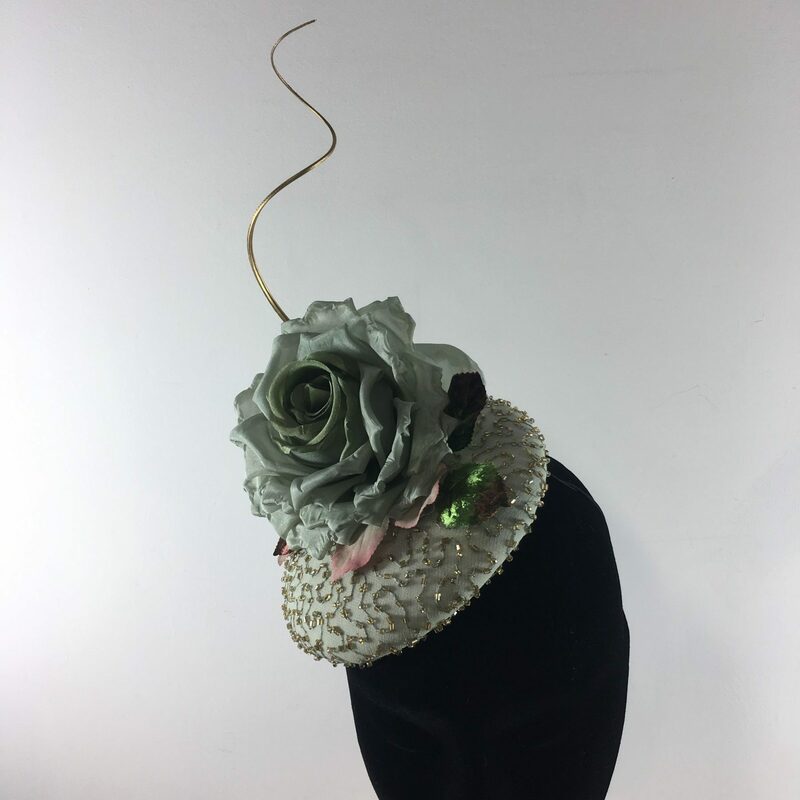 A beaded pistachio silk button with a handmade silk rose and a gold curled quill. 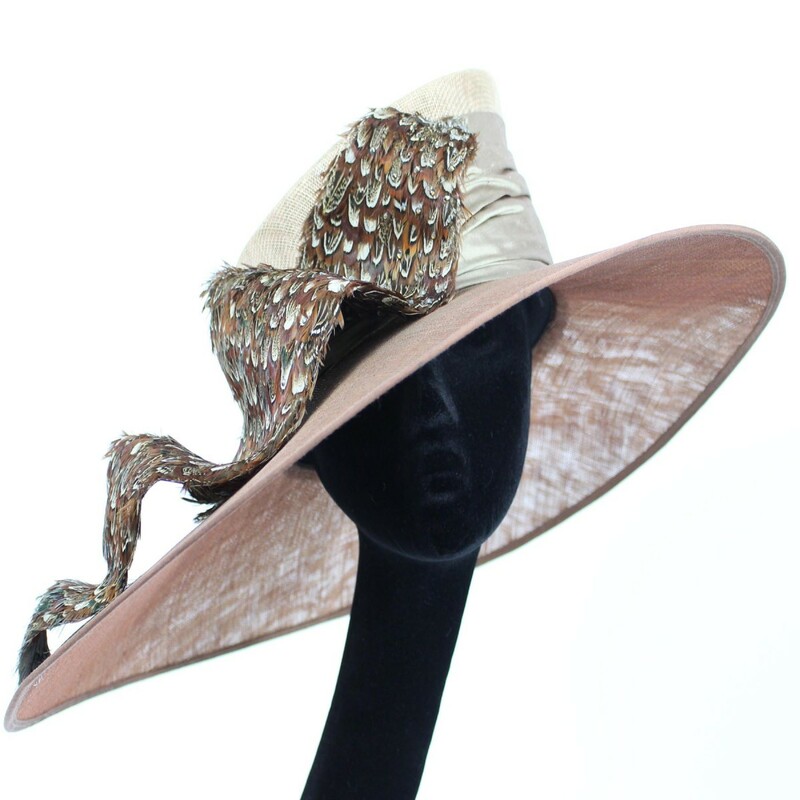 A truly luxurious piece that has a vintage feel. 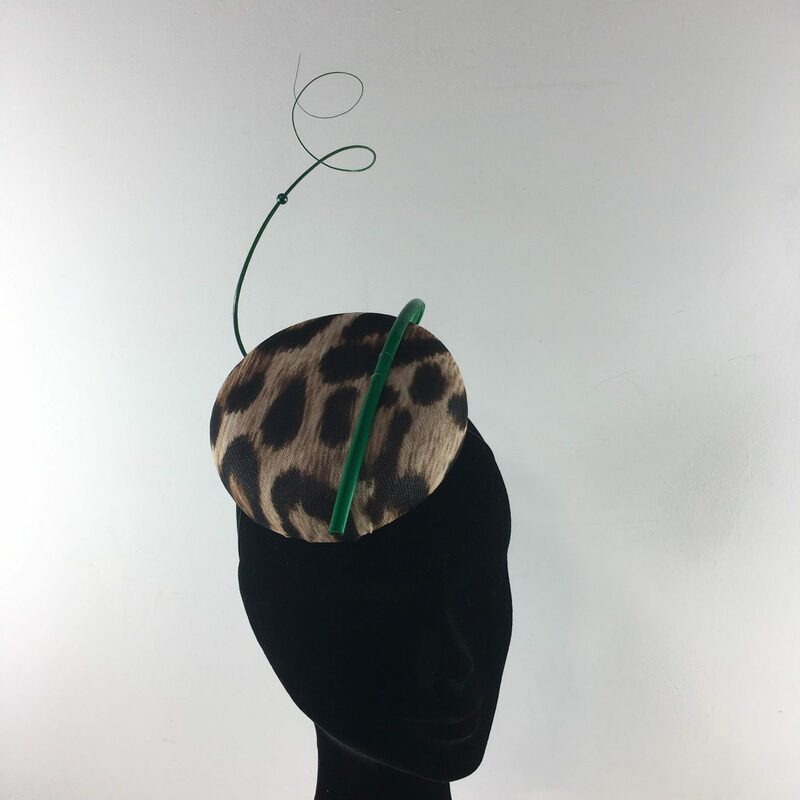 A Haute Couture simplistic yet high impact leopard print bun adorned with a green quill. 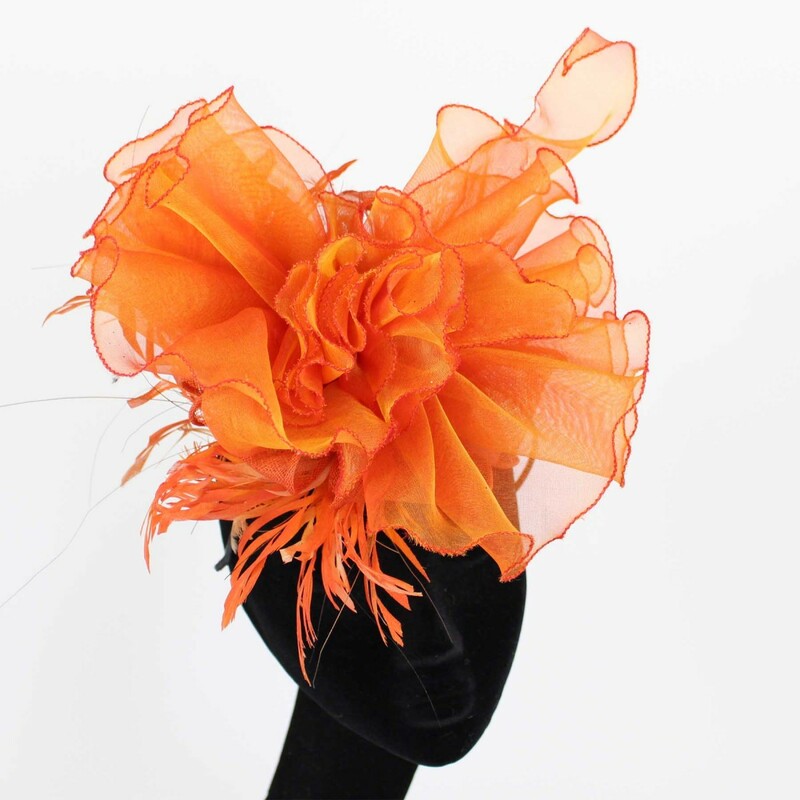 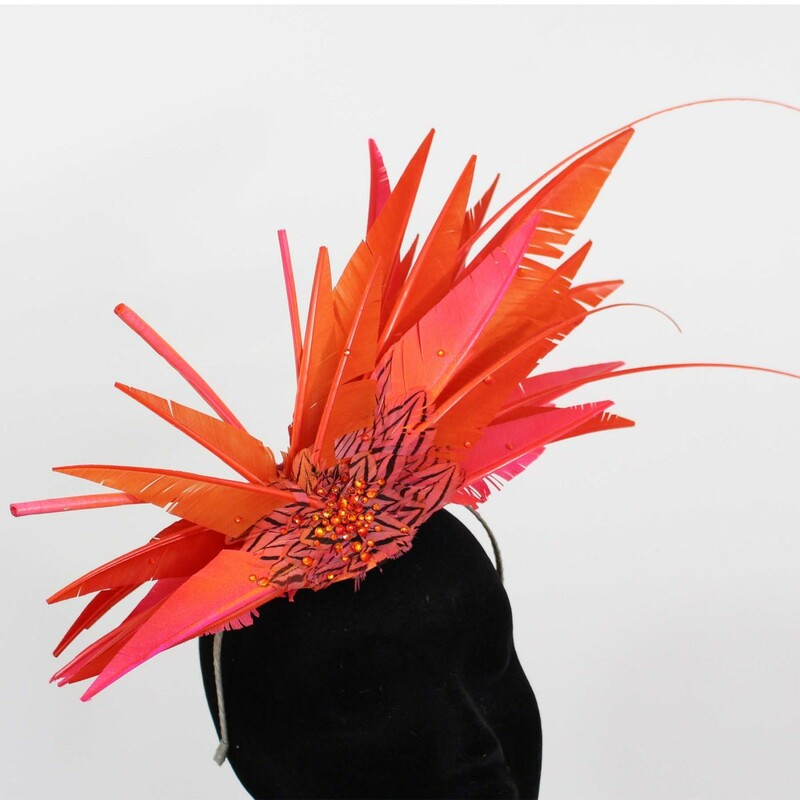 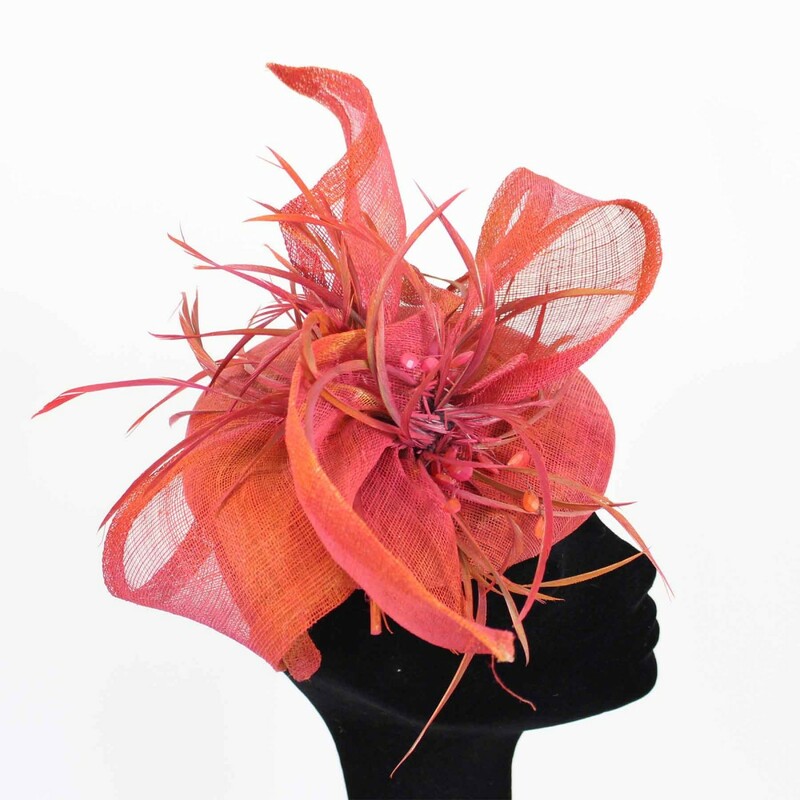 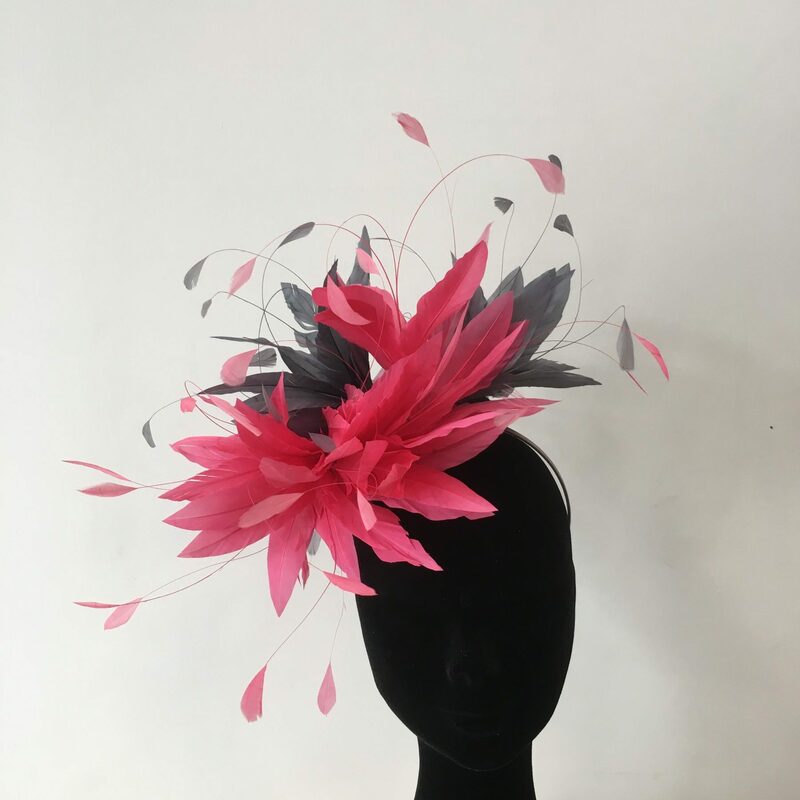 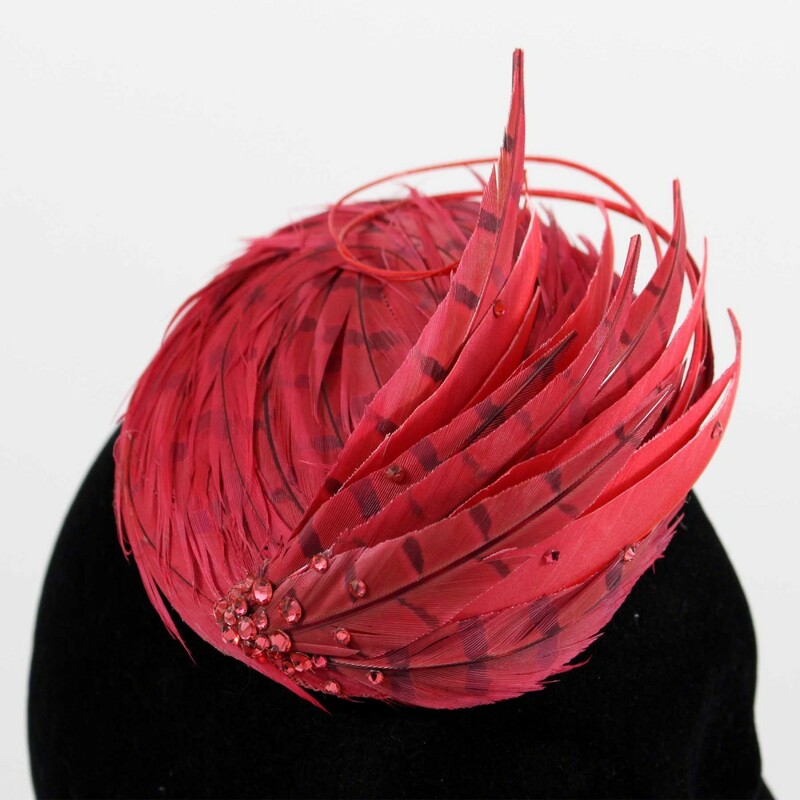 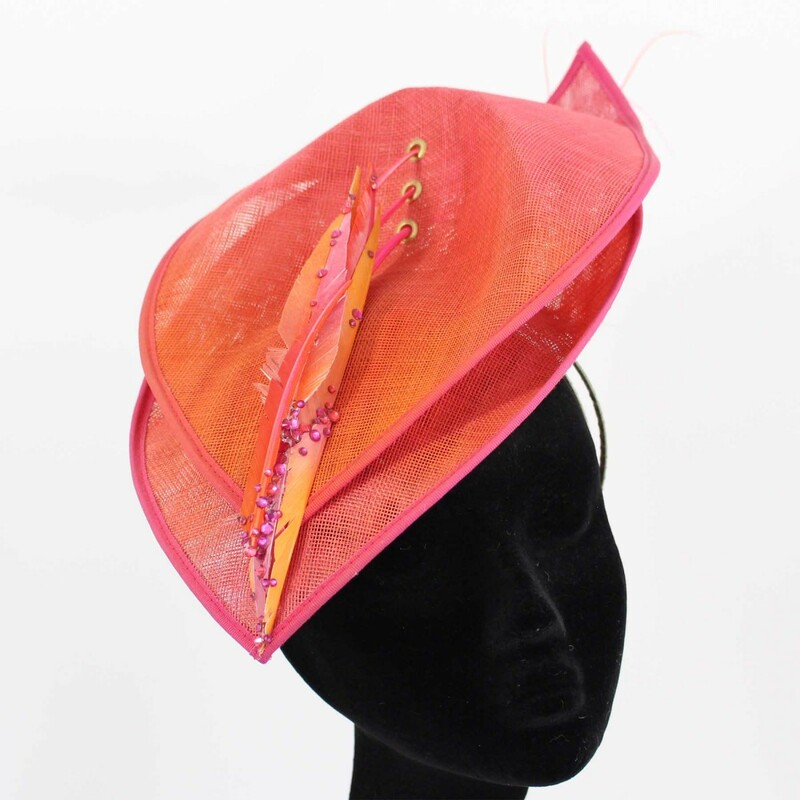 A stunning button headpiece, covered in hot pink shot silk and adorned with pink and orange quills. 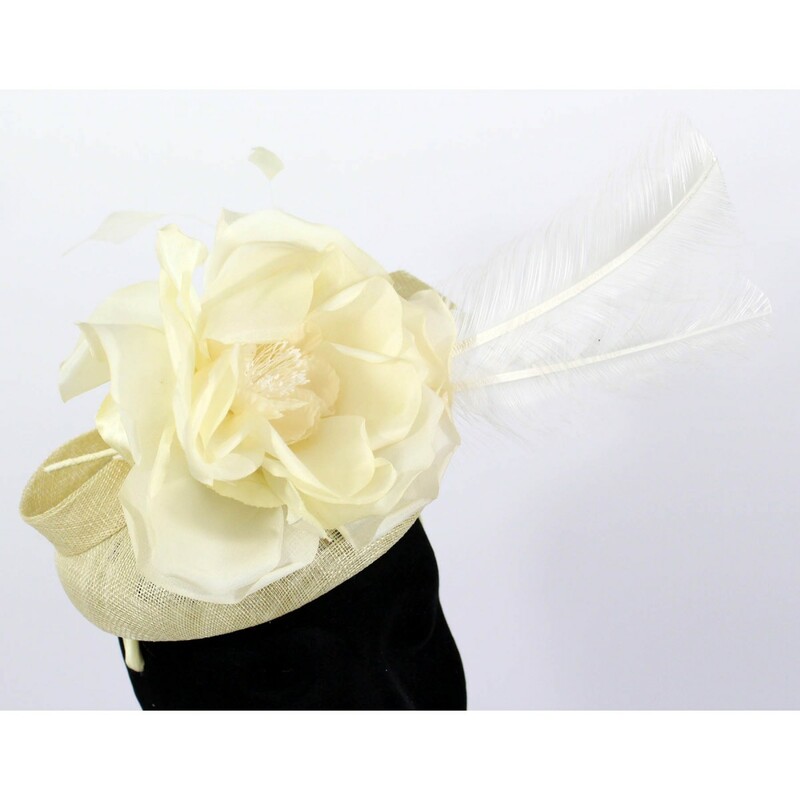 Champagne silk covered button adorned with an ivory crinoline bow, curled gold sprayed pheasant feathers and handmade ivory and champagne silk flowers. 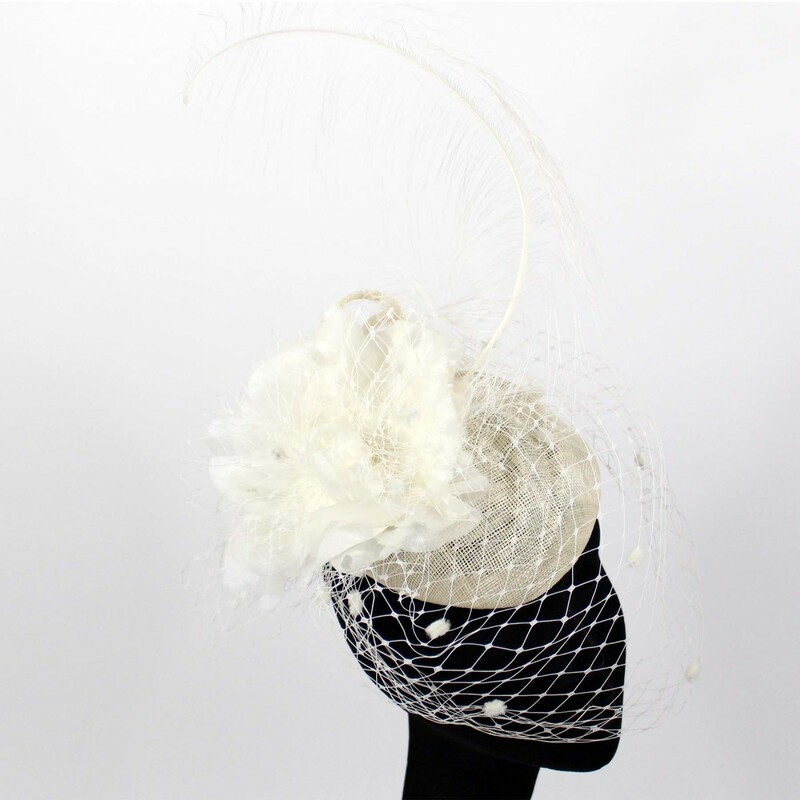 A beautifully timeless and elegant headpiece. 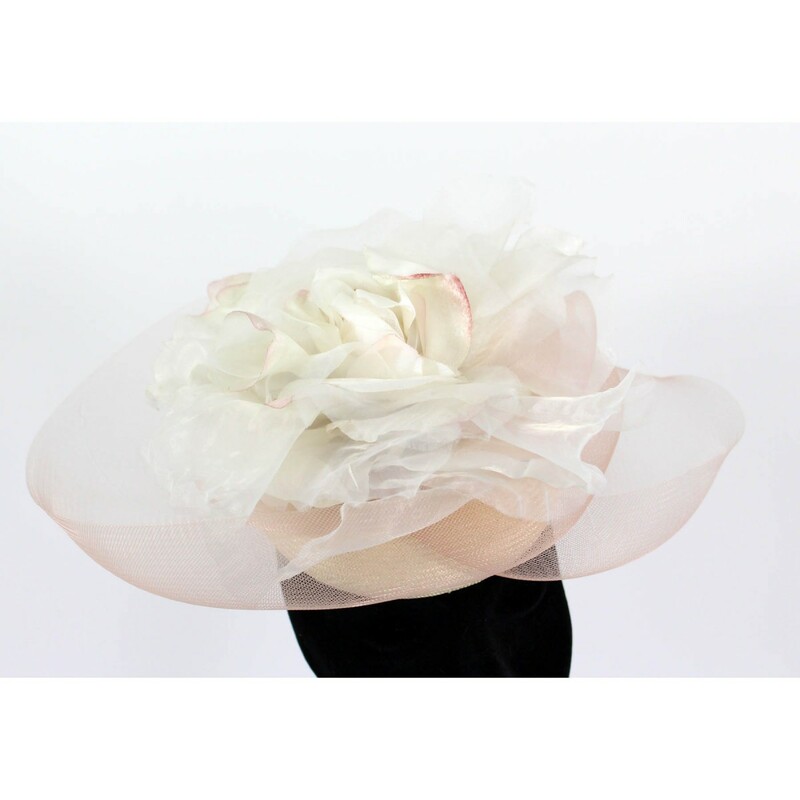 An oyster sinamay saucer adorned with a stunning pale pink silk and chiffon rose. 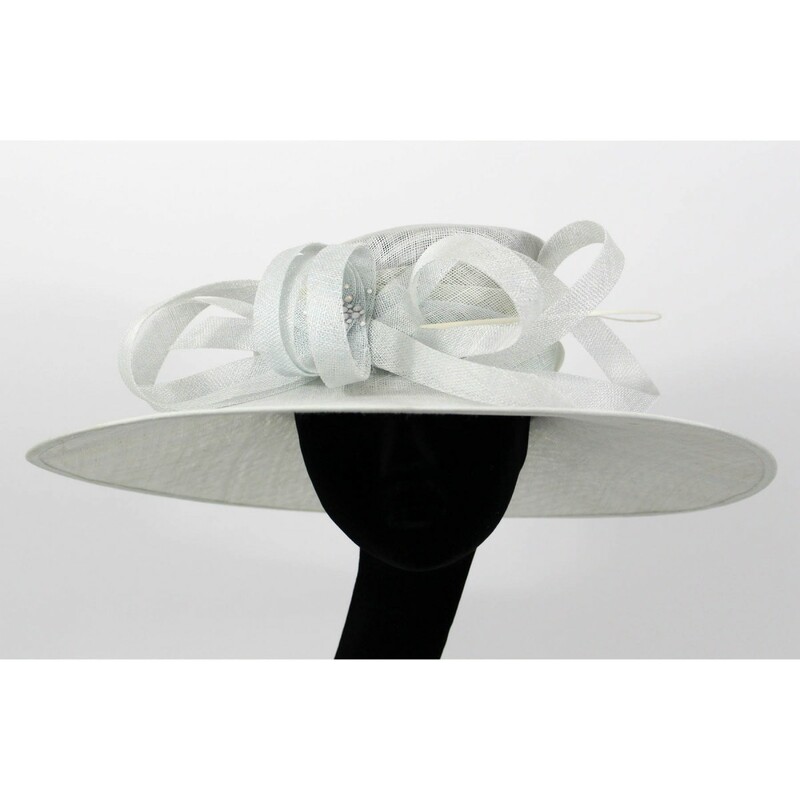 An ivory sinamay swoosh on an ivory cookie base with ivory feathers. 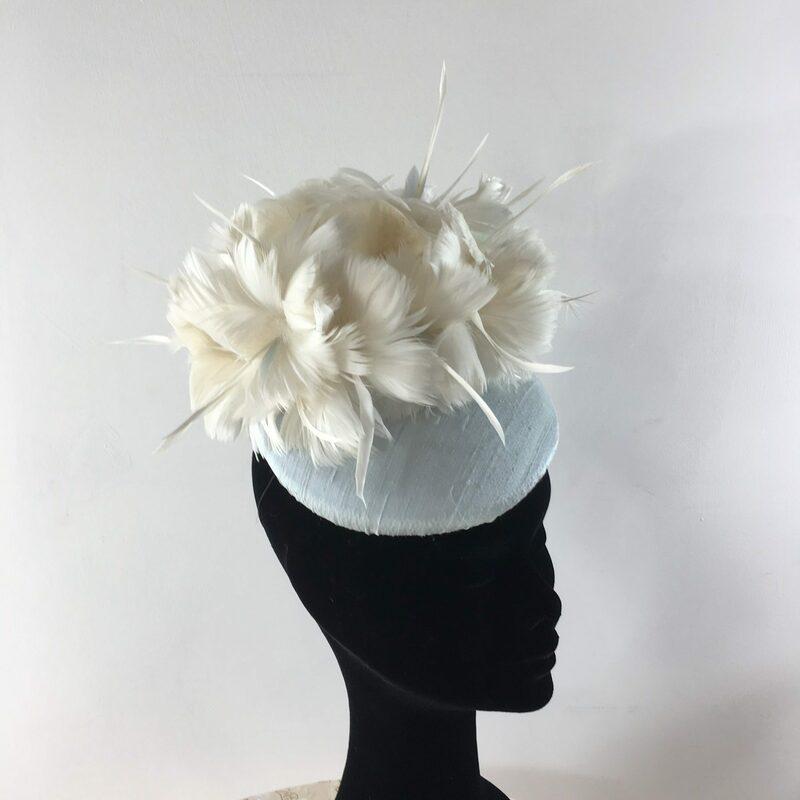 A flourish of delicate ivory feather flowers run through with baby blue coq feathers adorns this beautiful baby blue silk covered button. 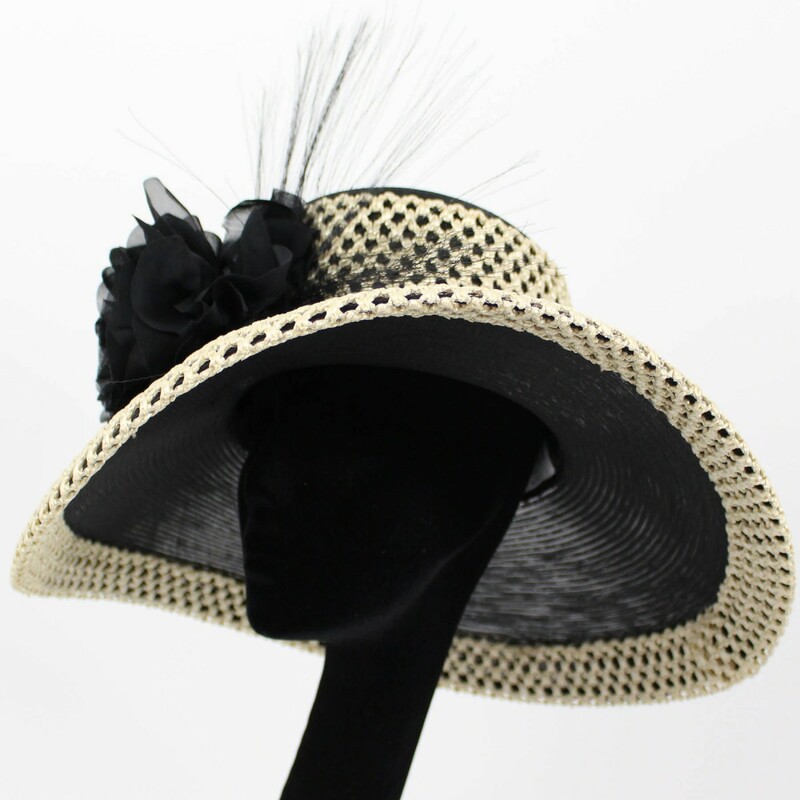 High impact and super easy to wear. 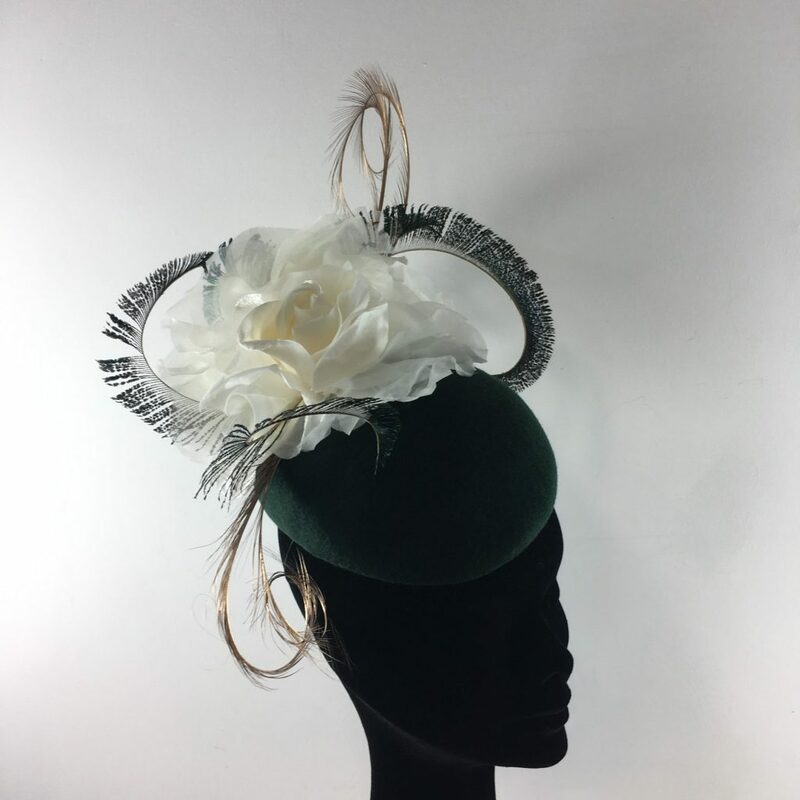 A racing green felt beret adorned with a stunning ivory silk rose and finished with ornate peacock swords. 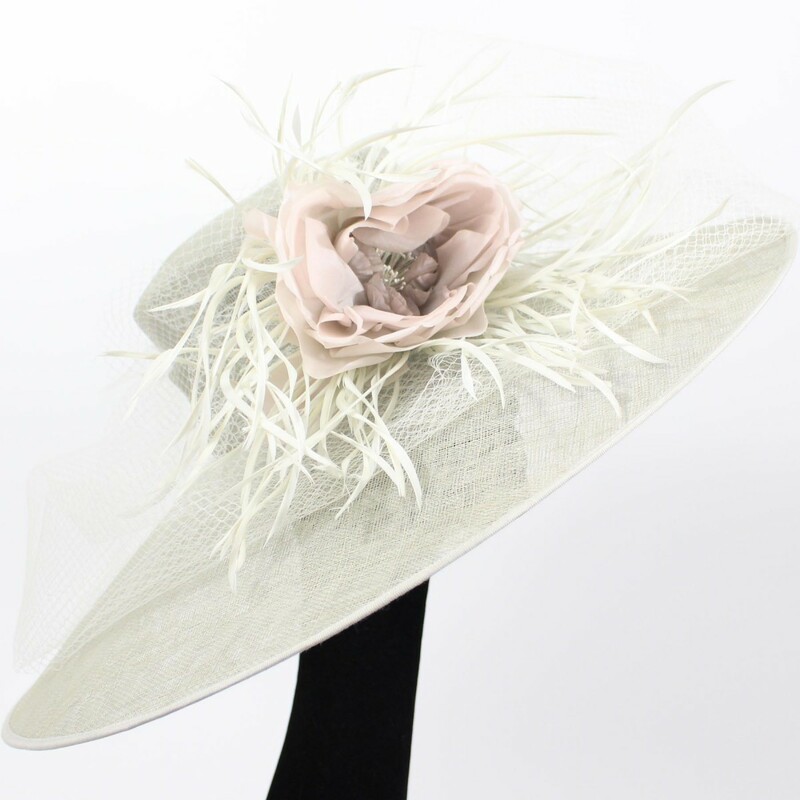 A beautifully feminine and elegant design. 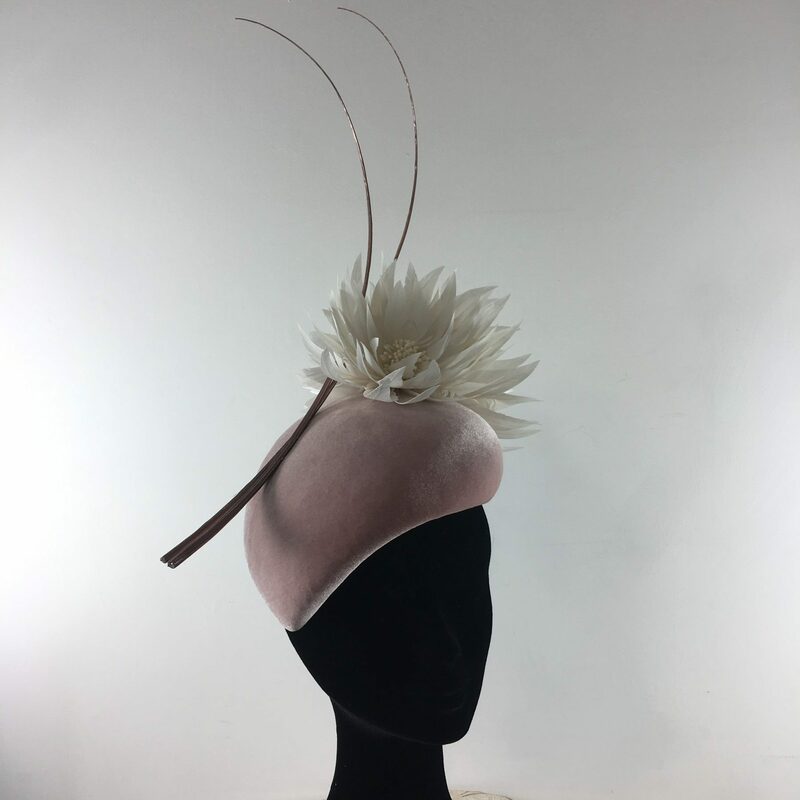 Dusky pink velvet covers this beautiful teardrop base with three ivory feather flowers and rose gold quills, perfect for any occasion in winter or summer. 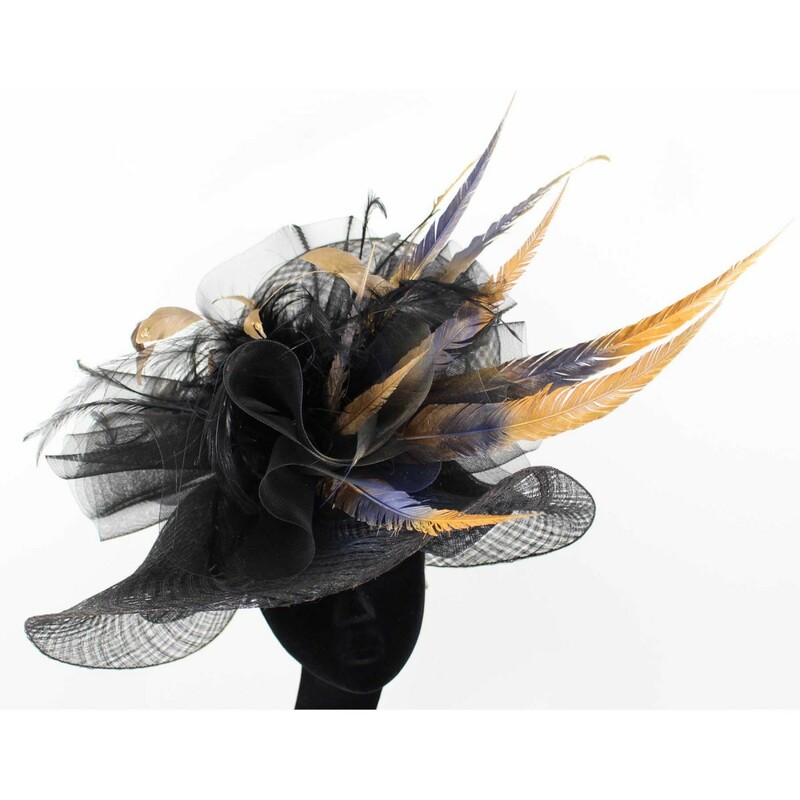 Long gold pheasant feathers sit on a jaunty angel on this luxurious black silk covered saucer. 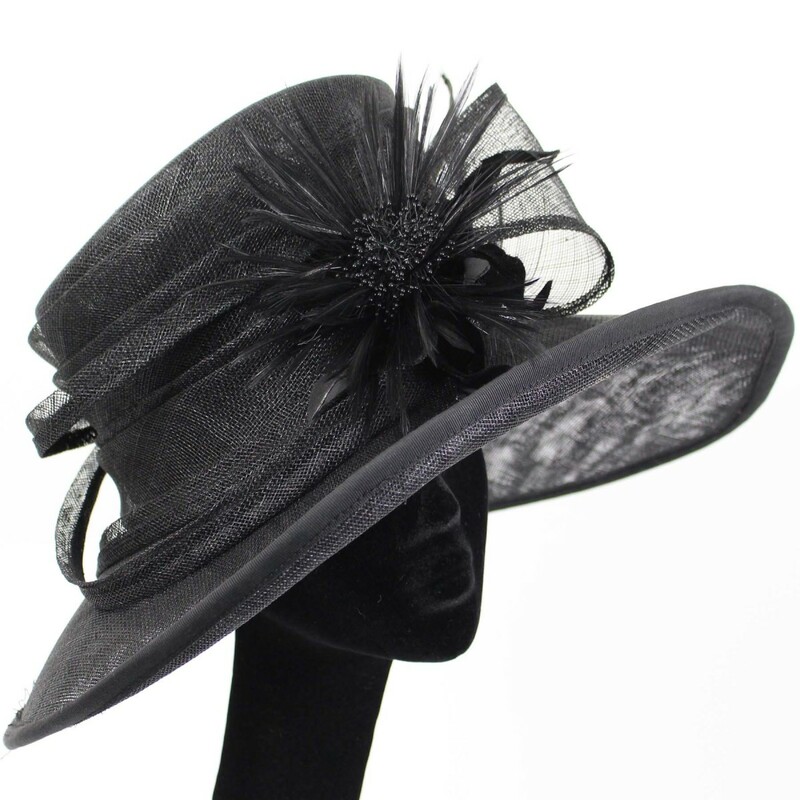 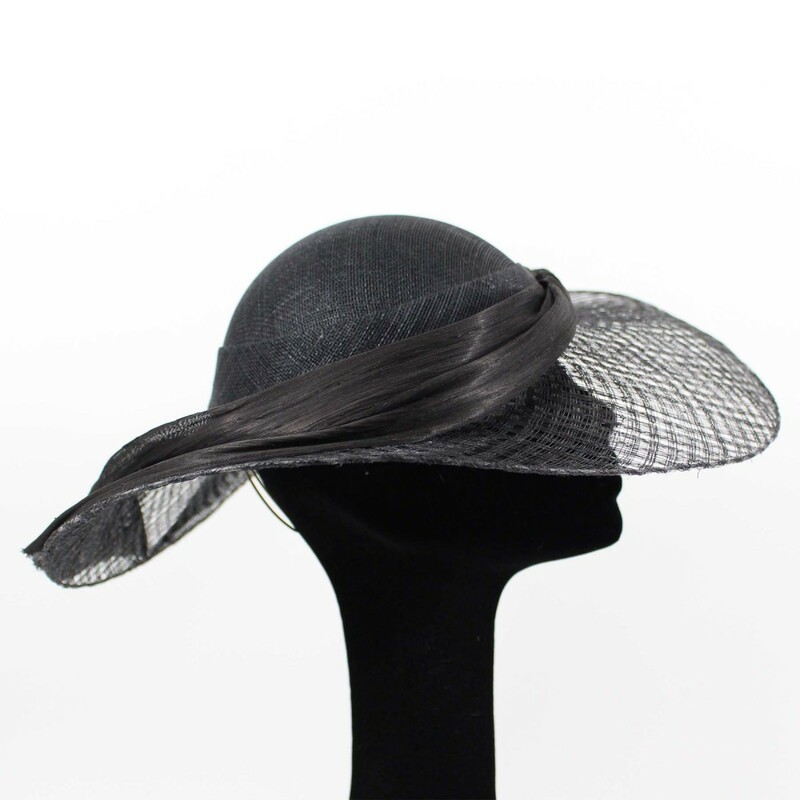 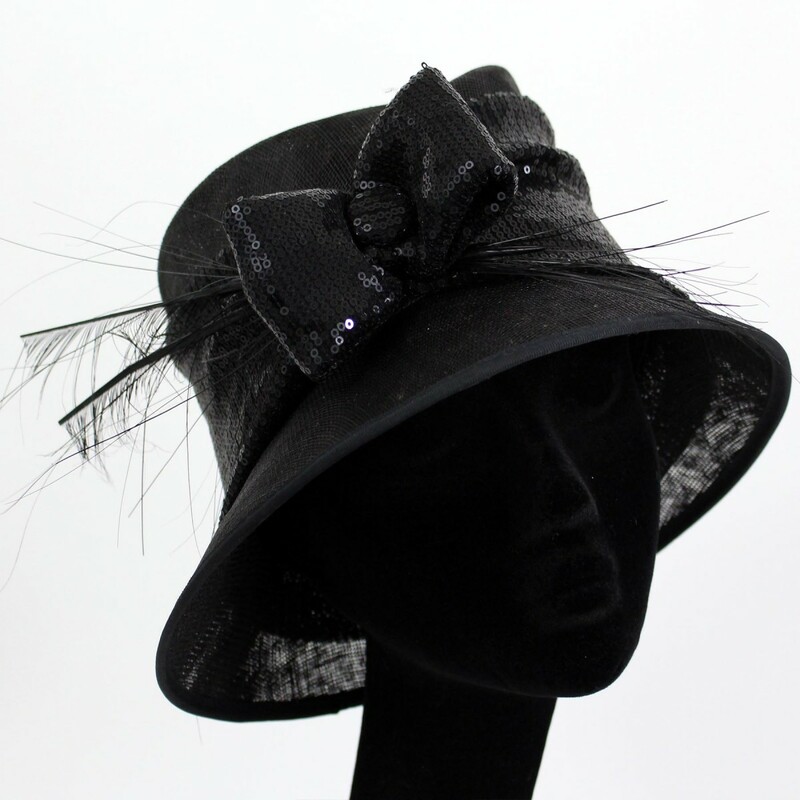 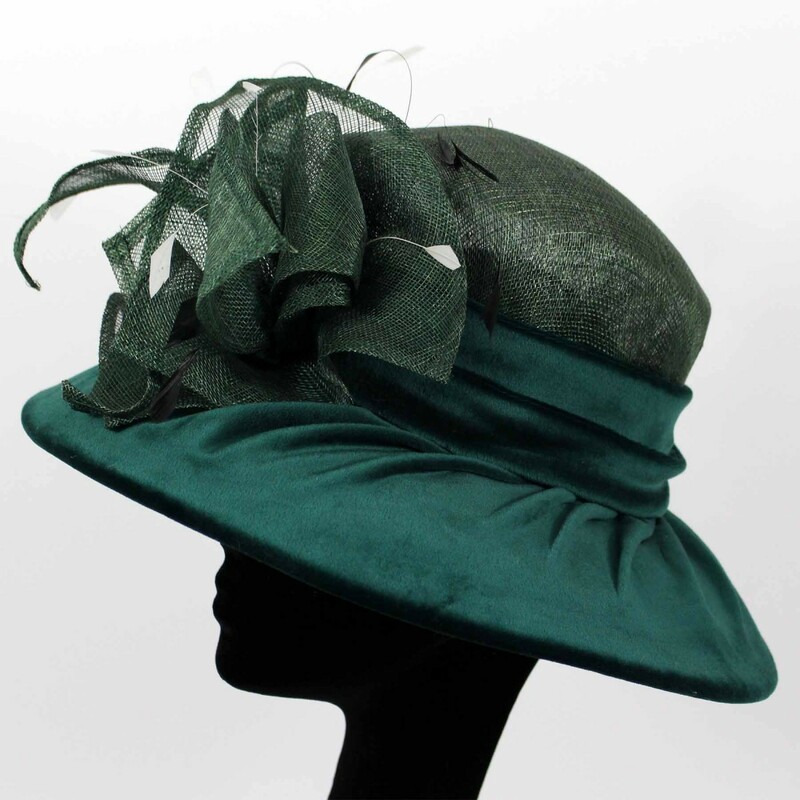 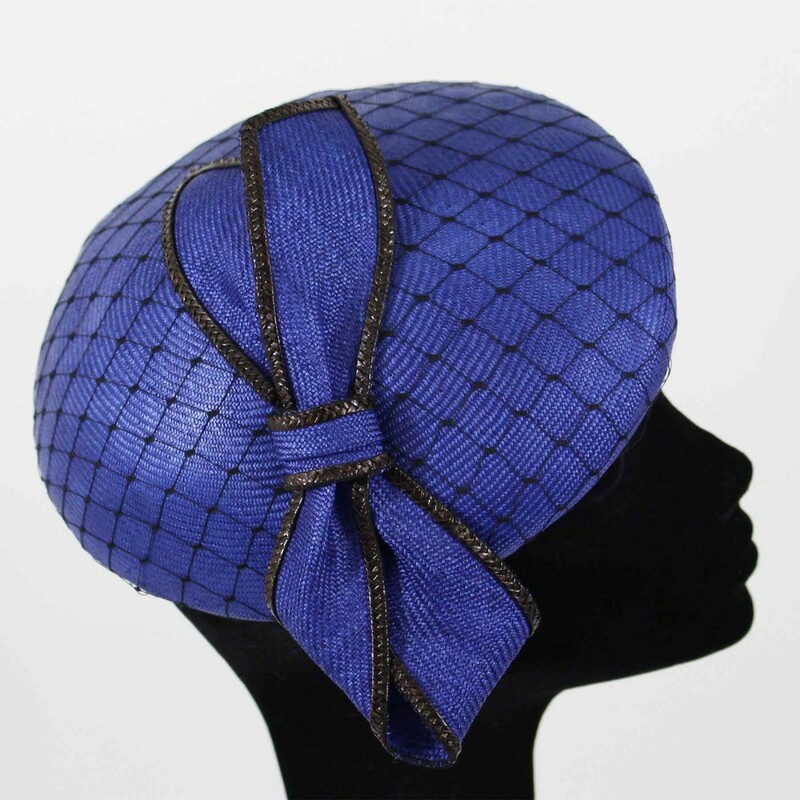 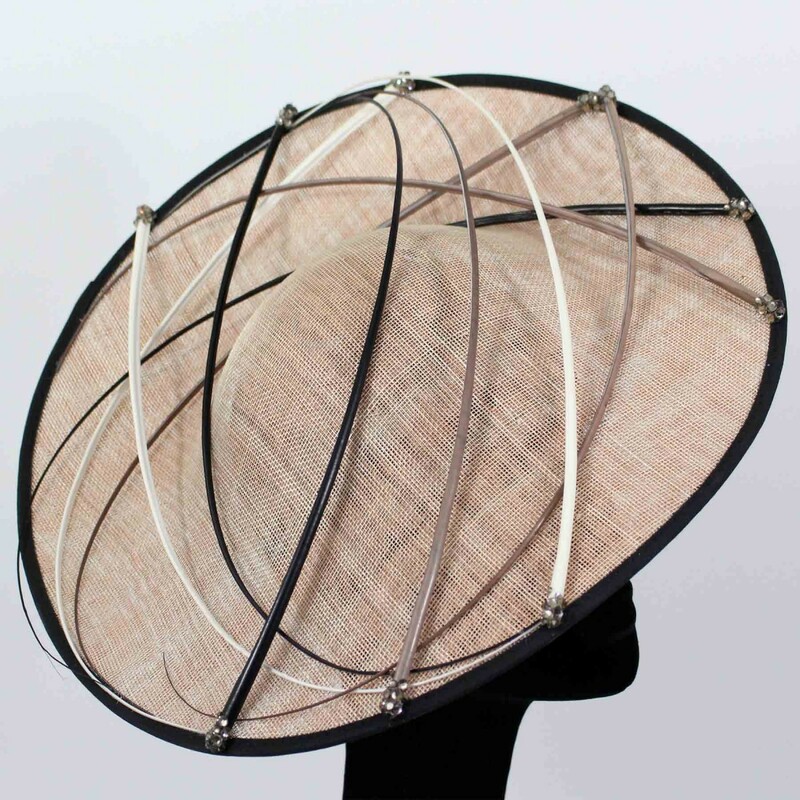 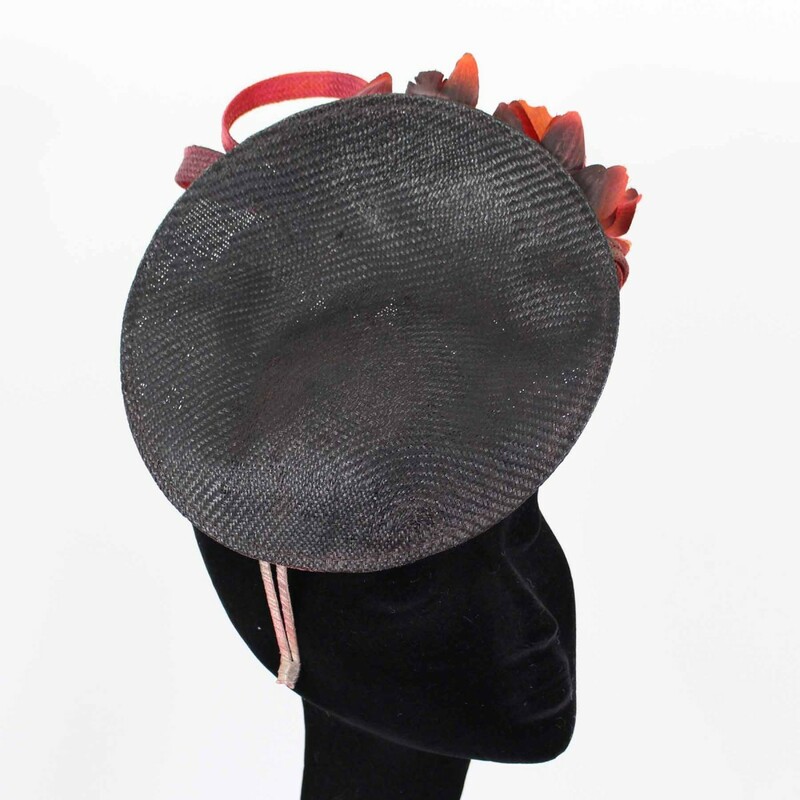 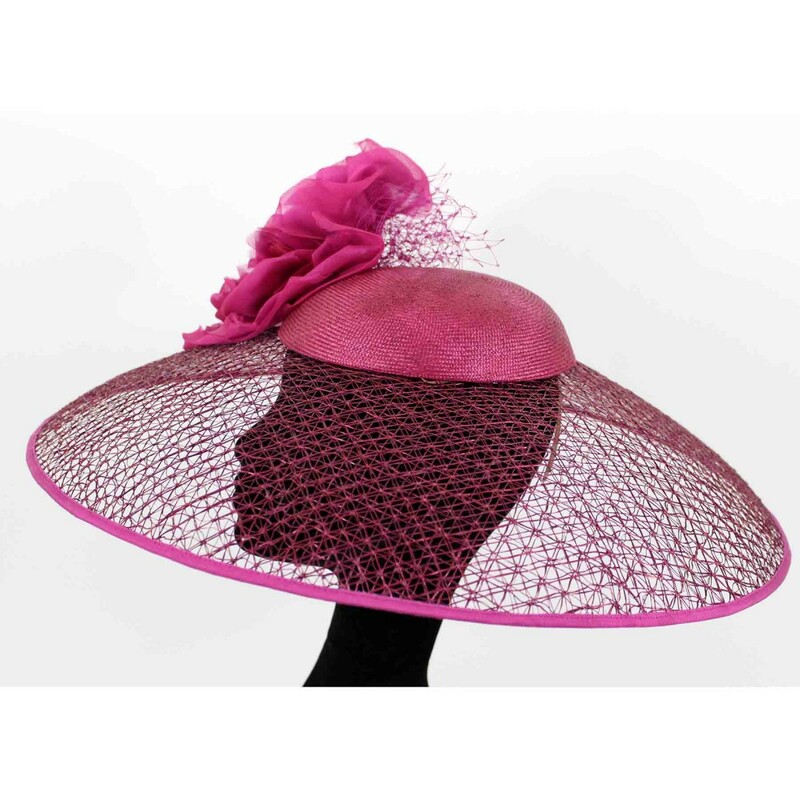 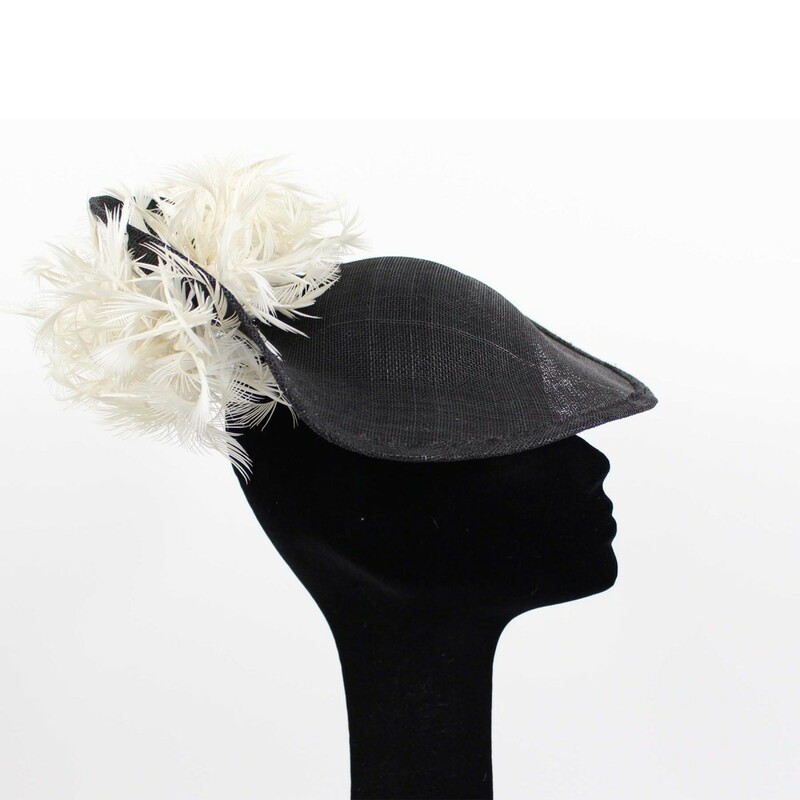 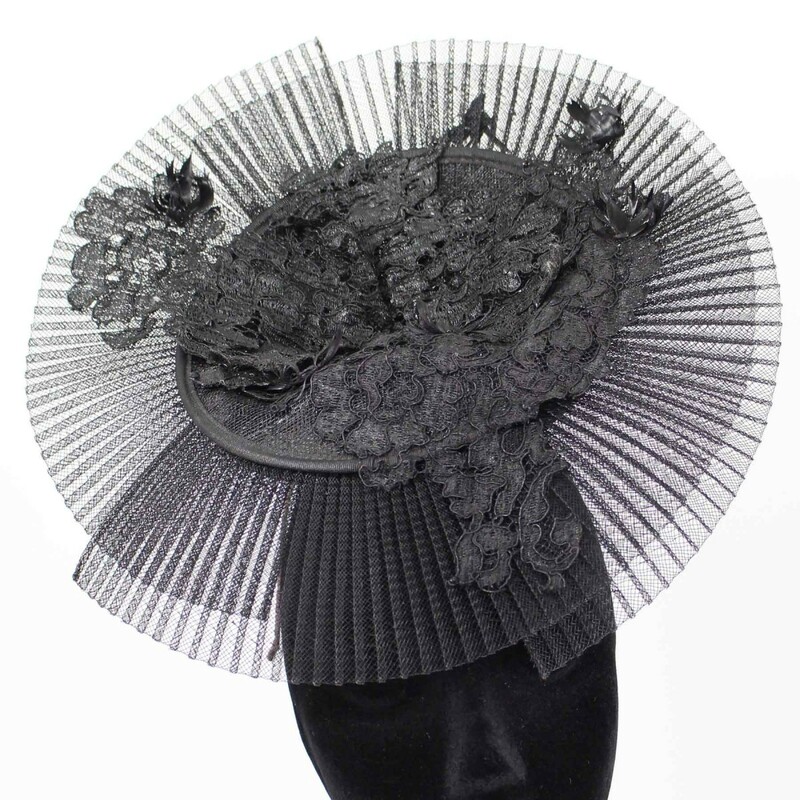 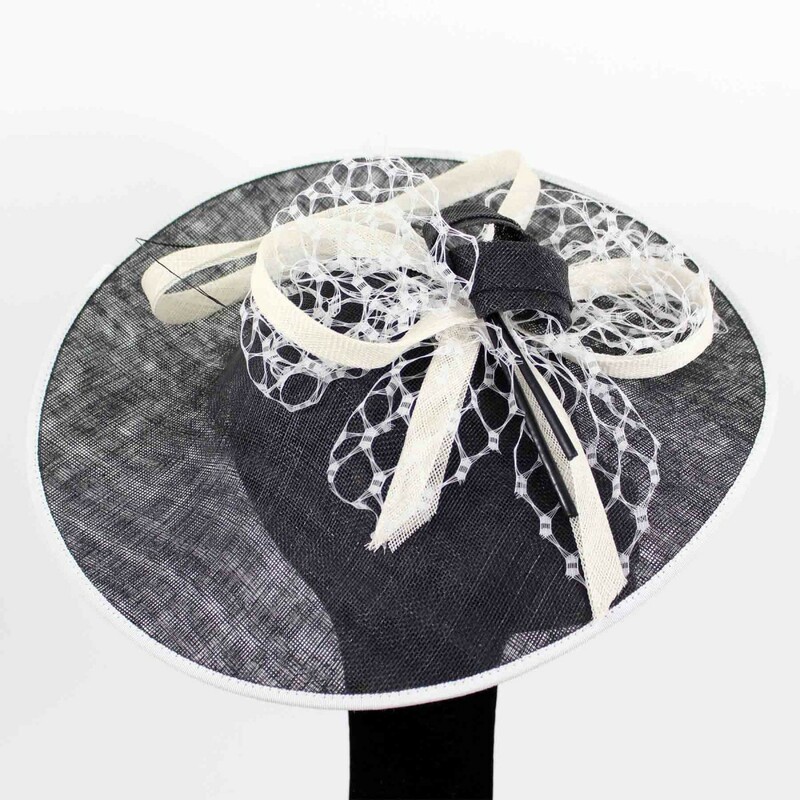 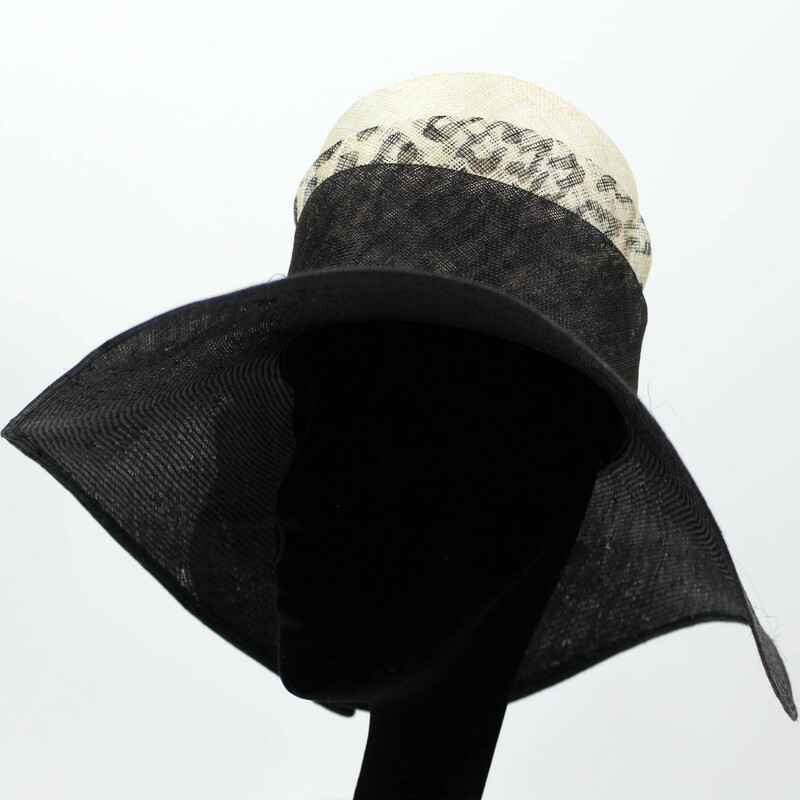 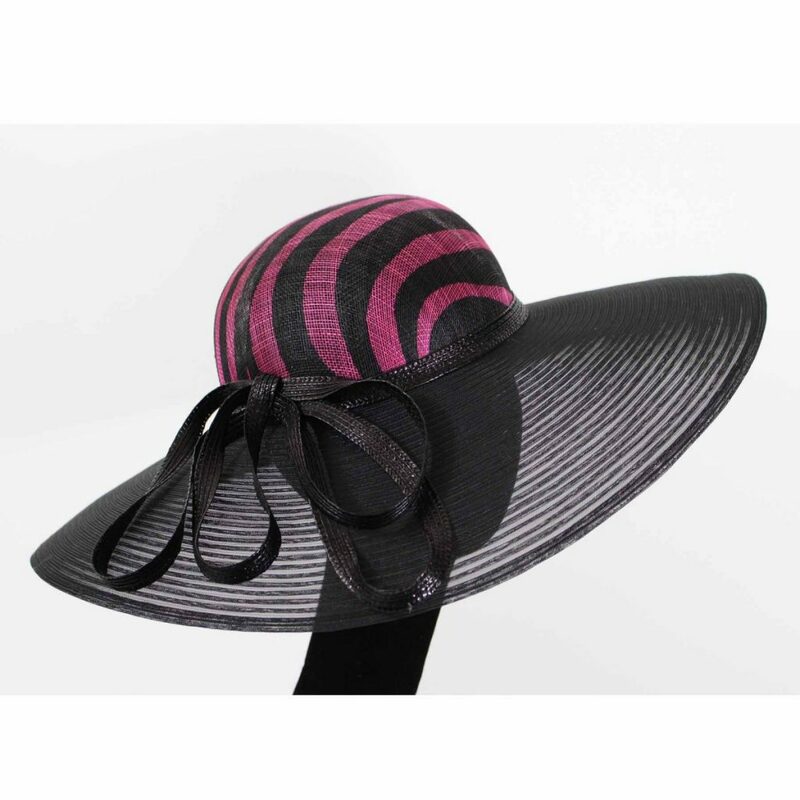 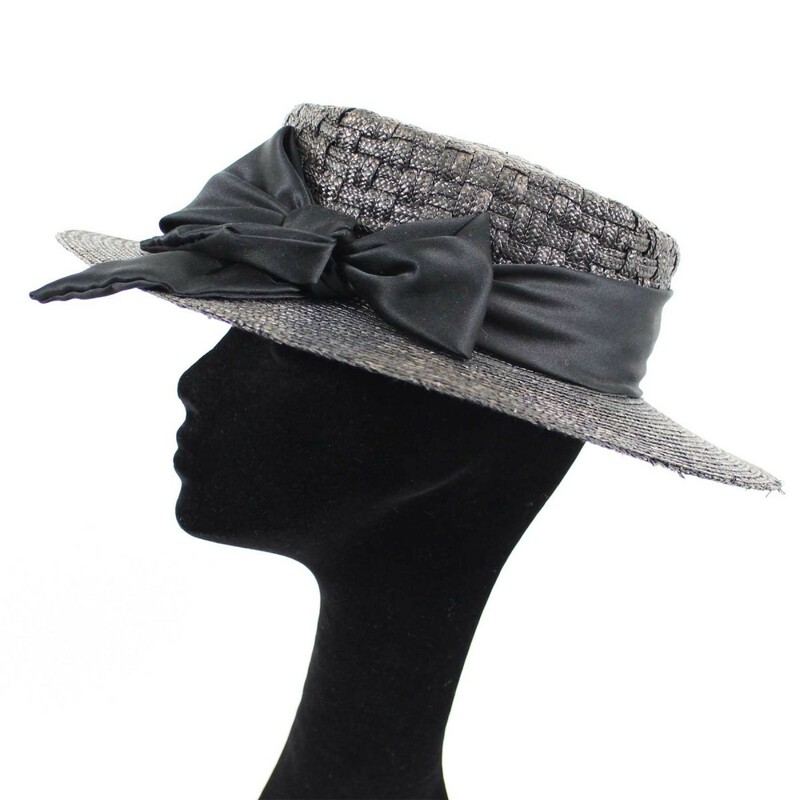 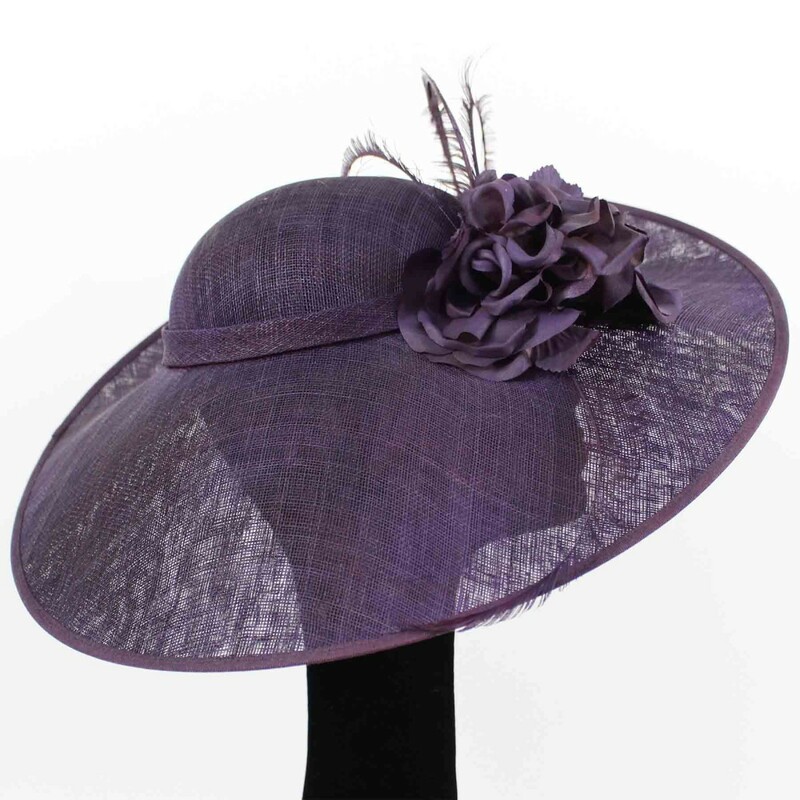 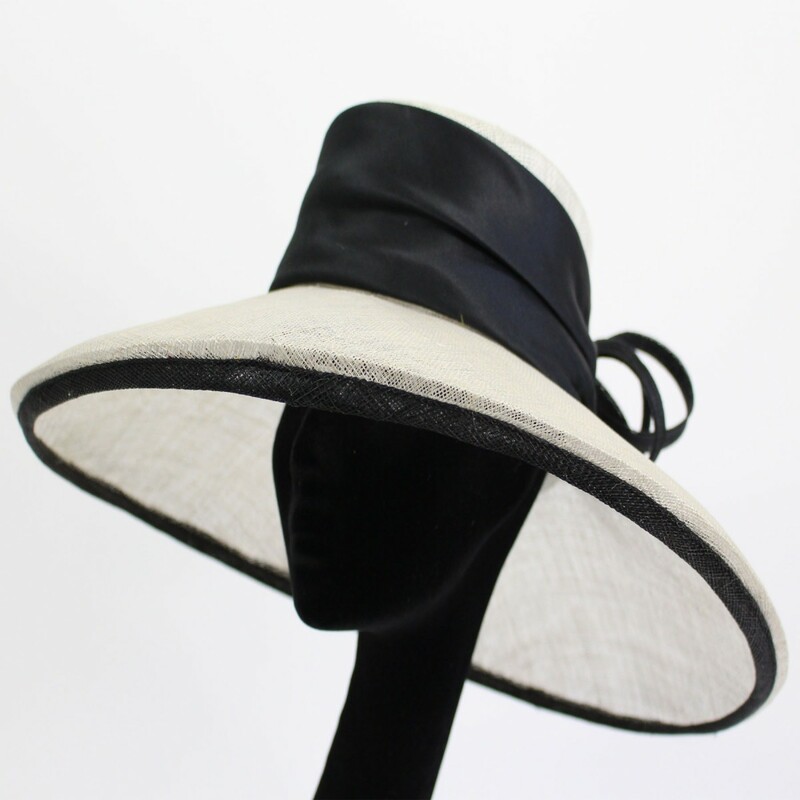 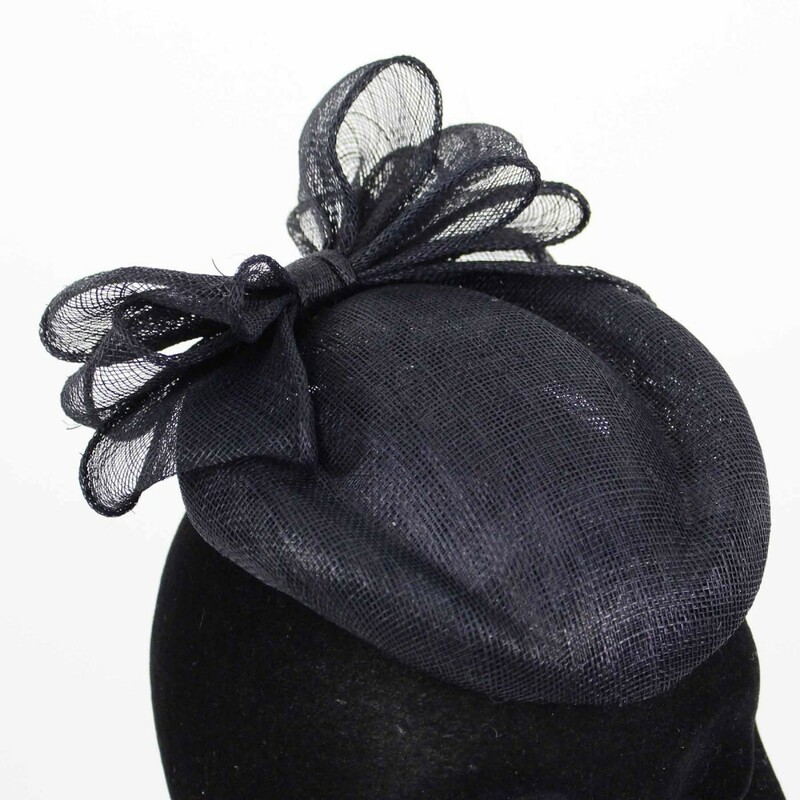 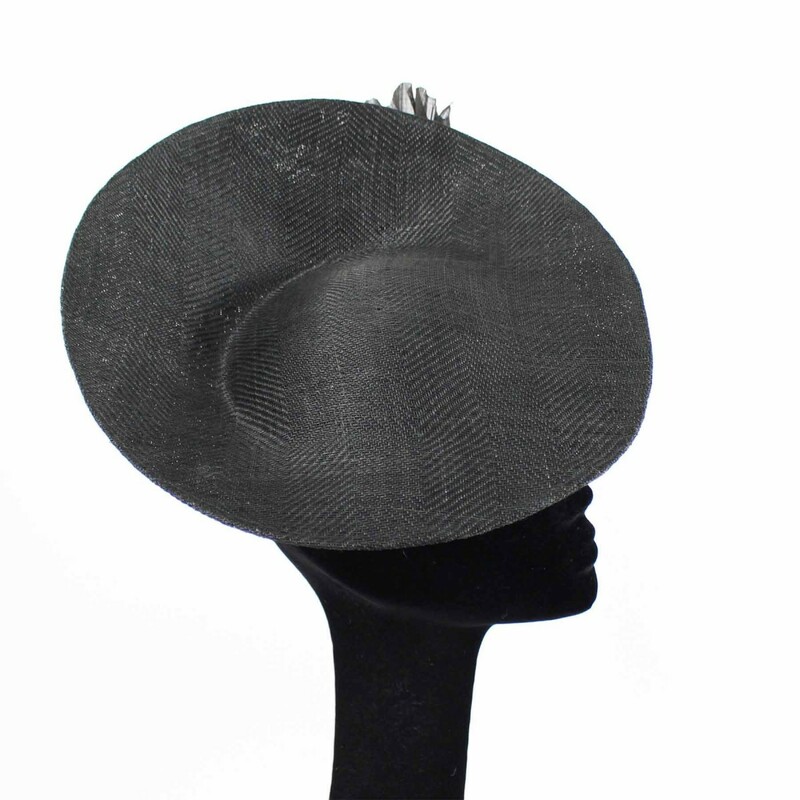 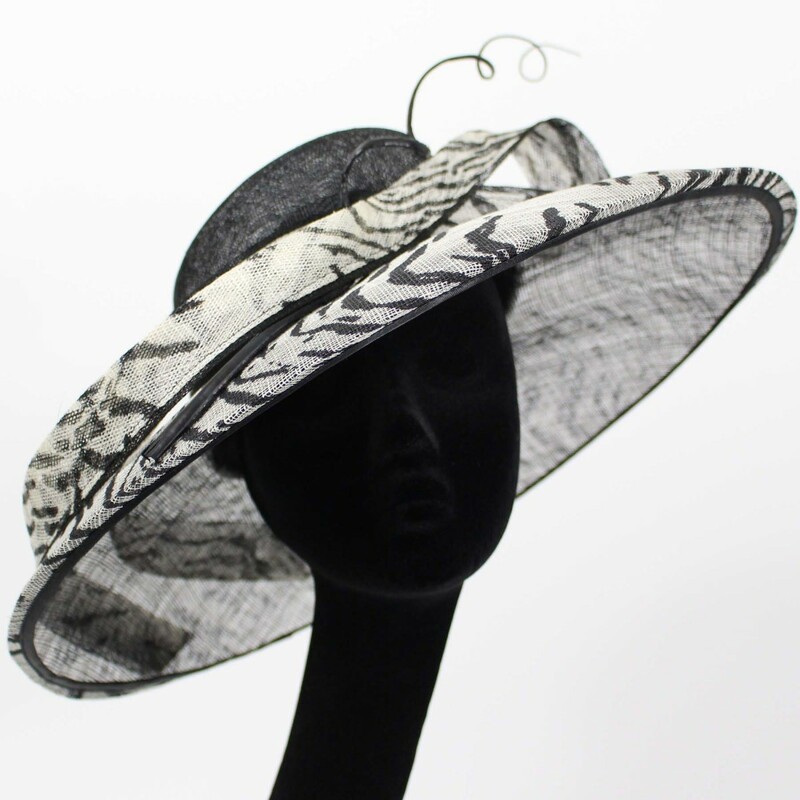 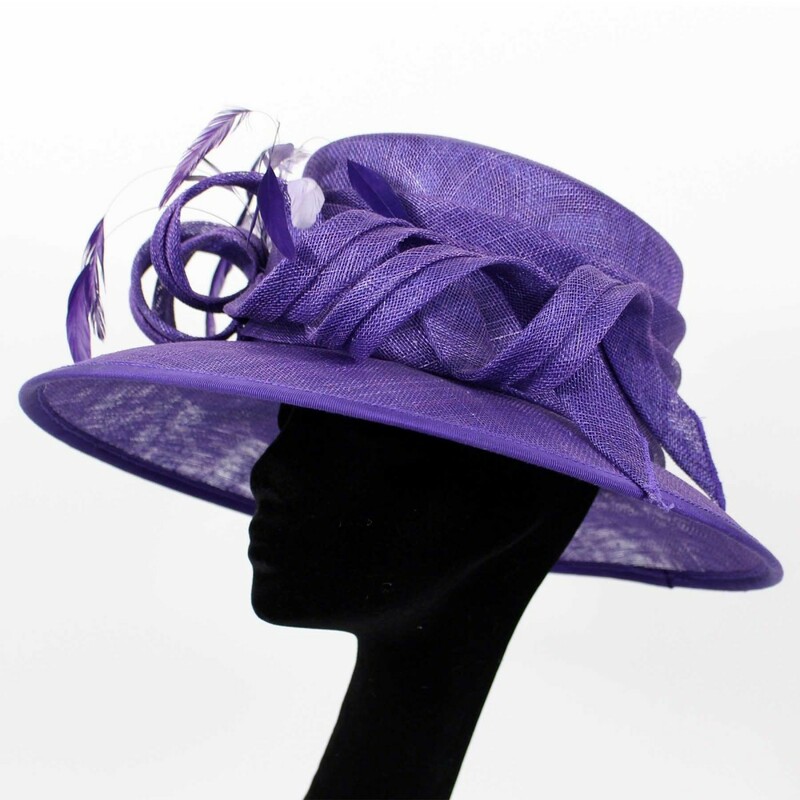 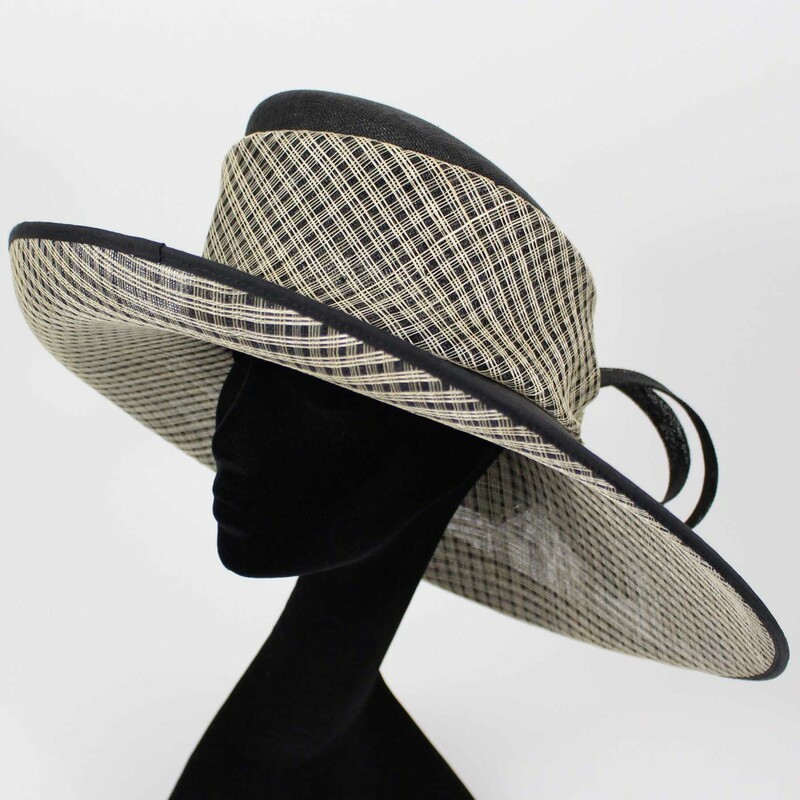 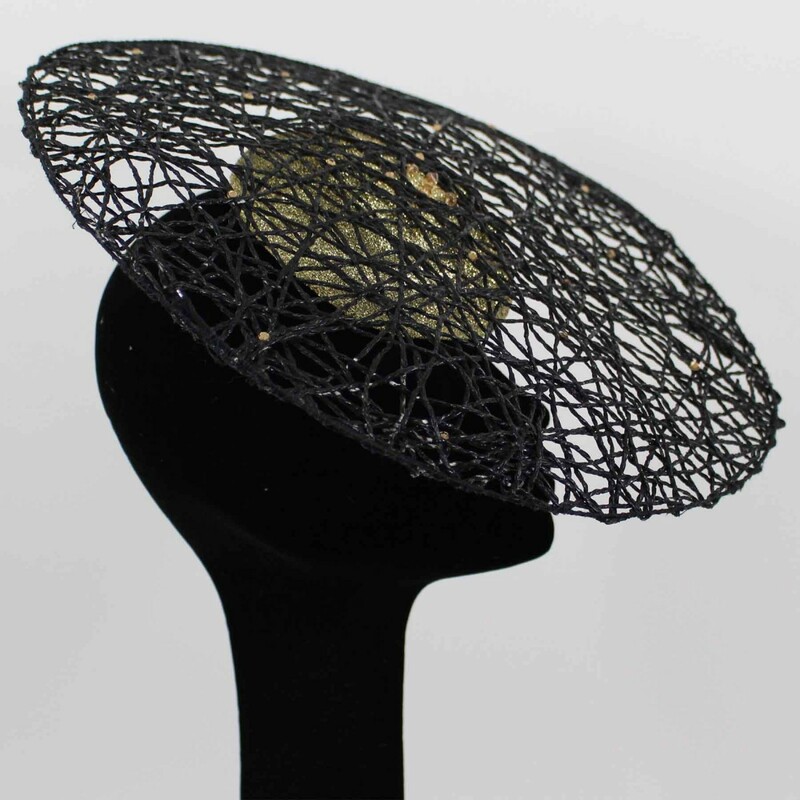 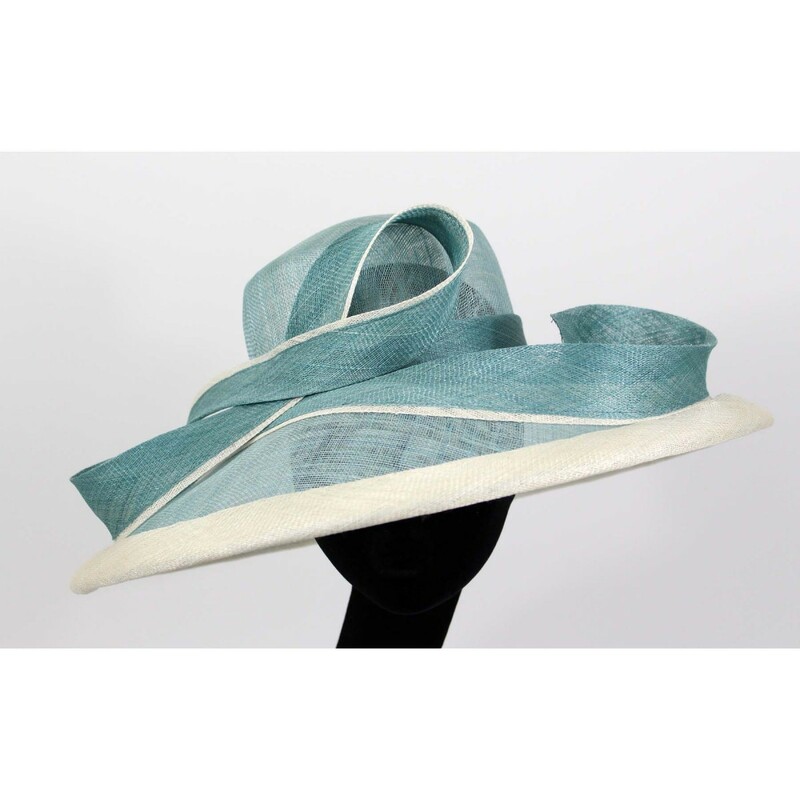 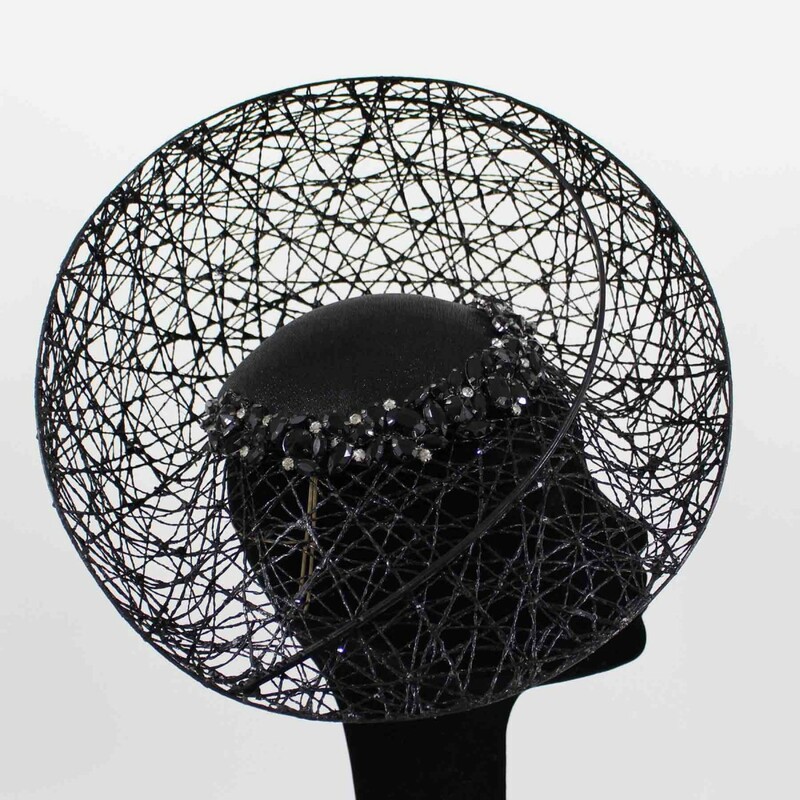 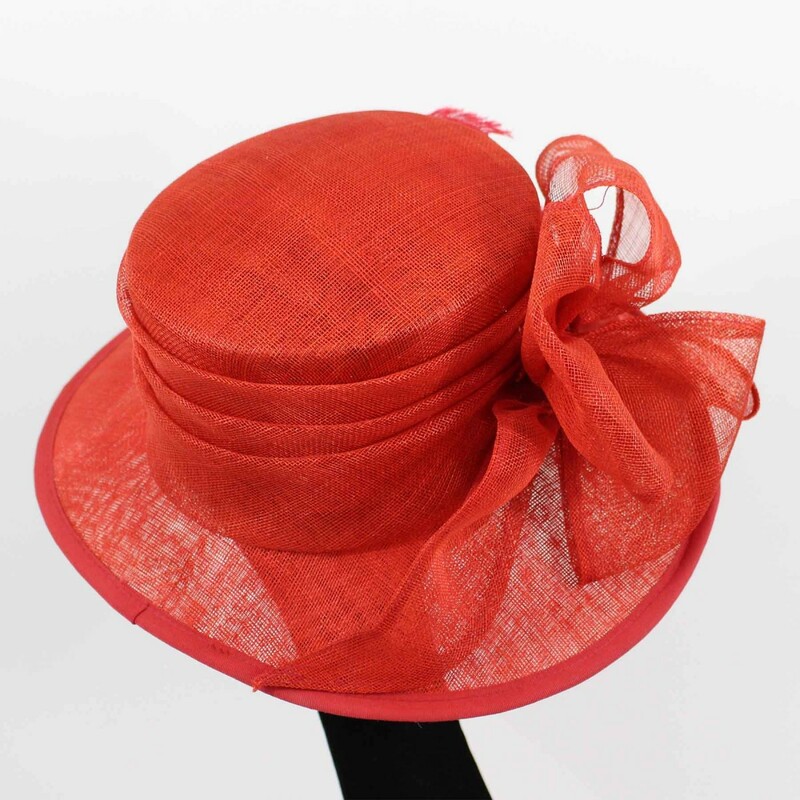 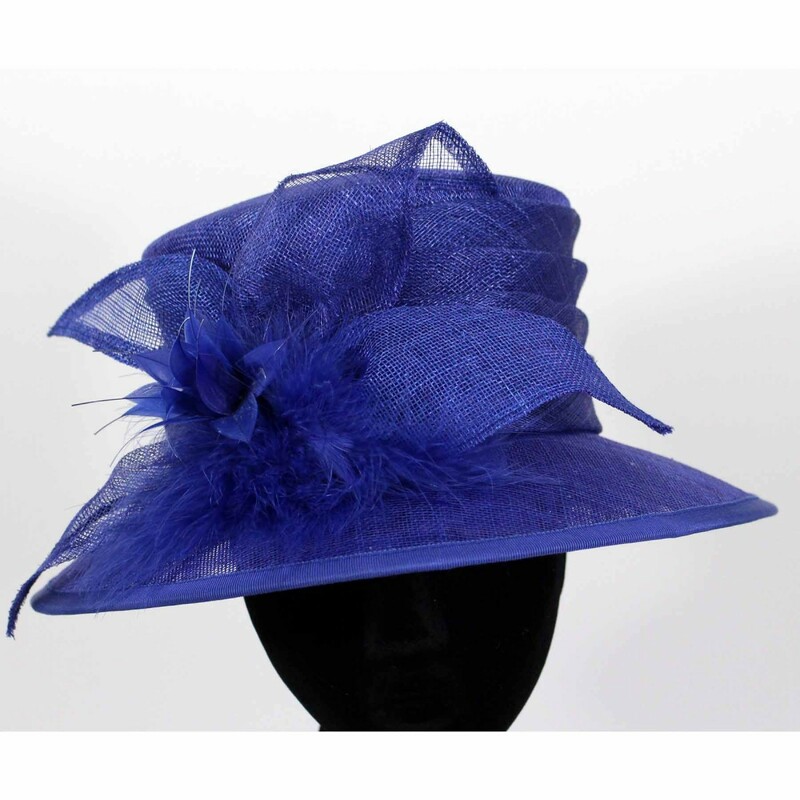 Striking and simple, this hat will suit many patterned dresses. 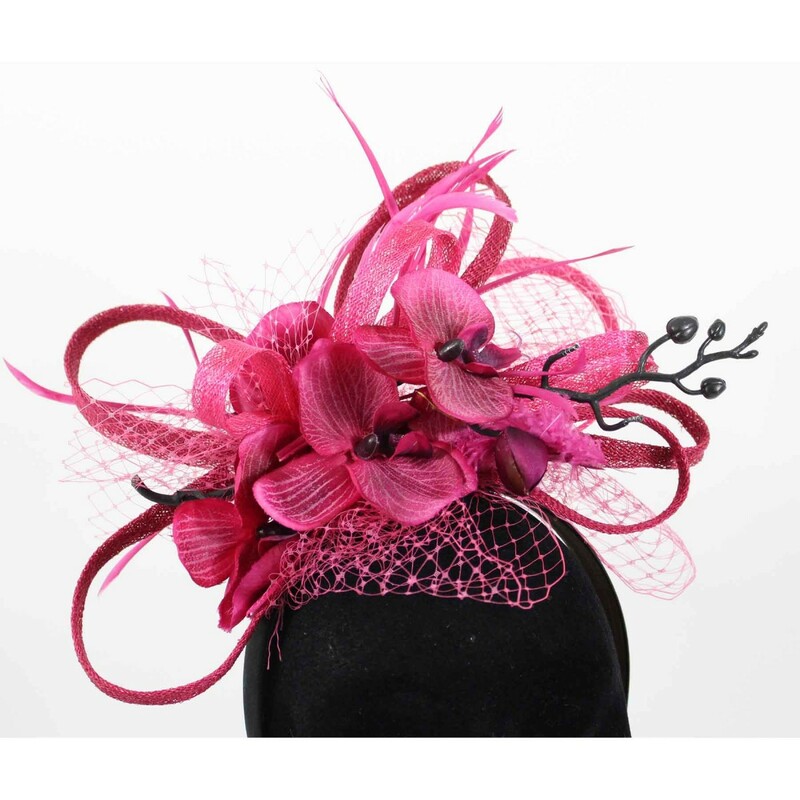 The fabulous ‘Gina’ saucer in fuchsia is decorated with an array of feather flowers on the upper and under slides. 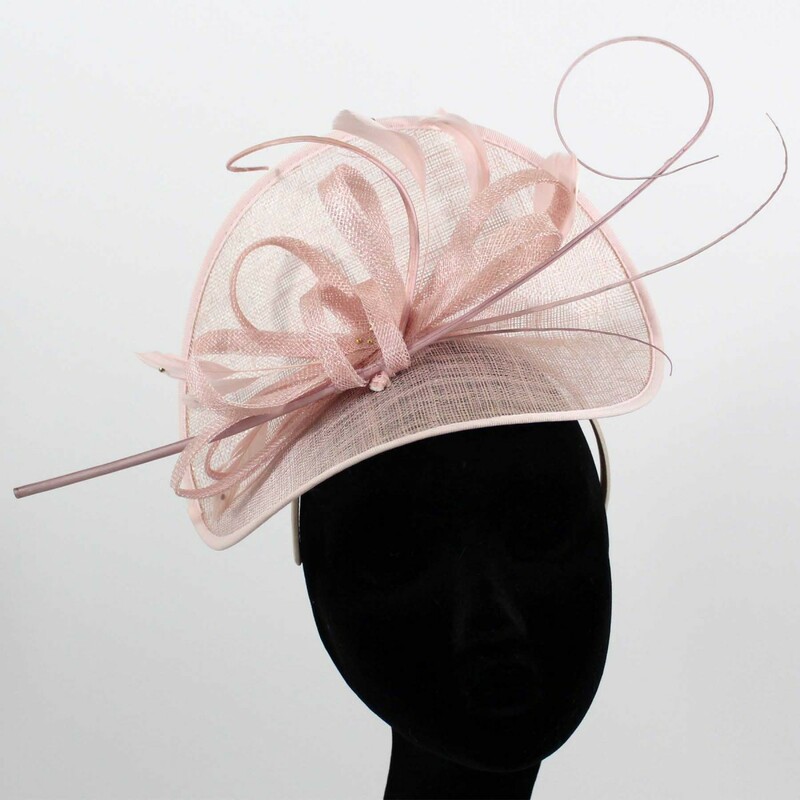 Chic and stylish, the perfect hat for a wedding or the races. 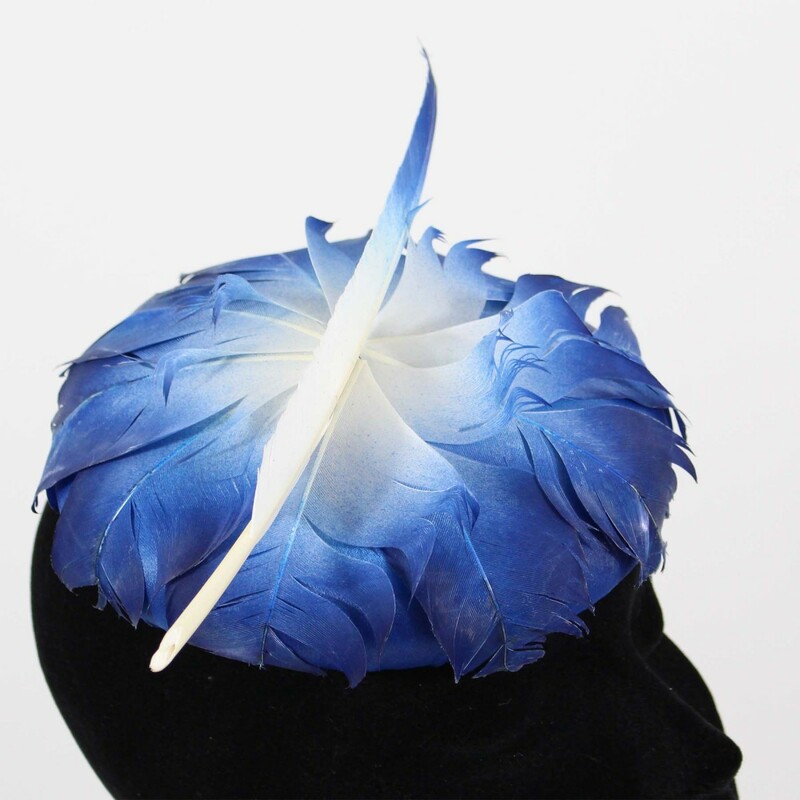 The fabulous ‘Gina’ saucer in navy is decorated with an array of feather flowers on the upper and under slides. 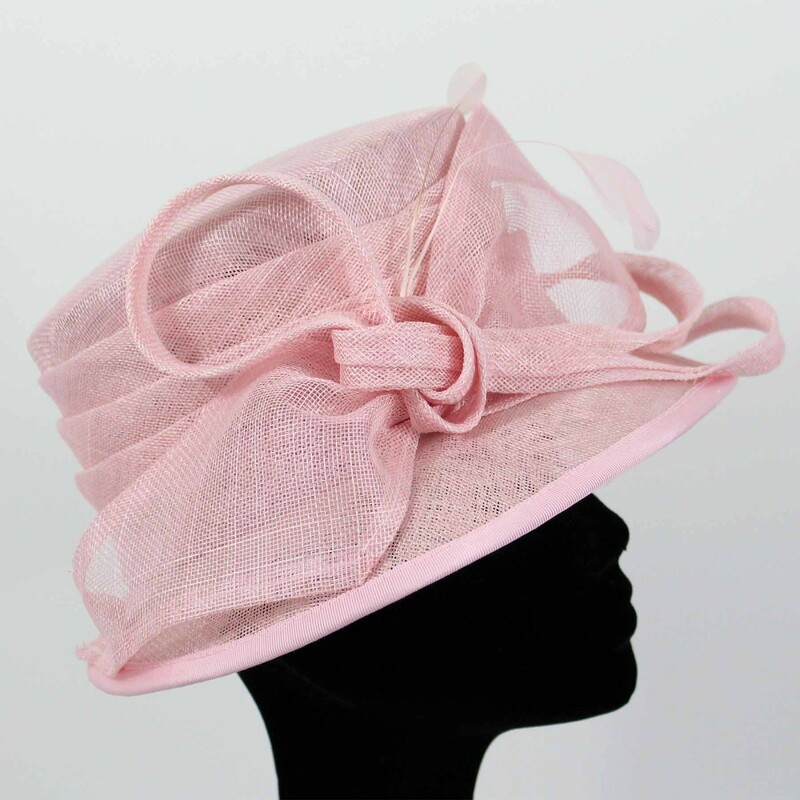 Chic and stylish, the perfect hat for a wedding or the races. 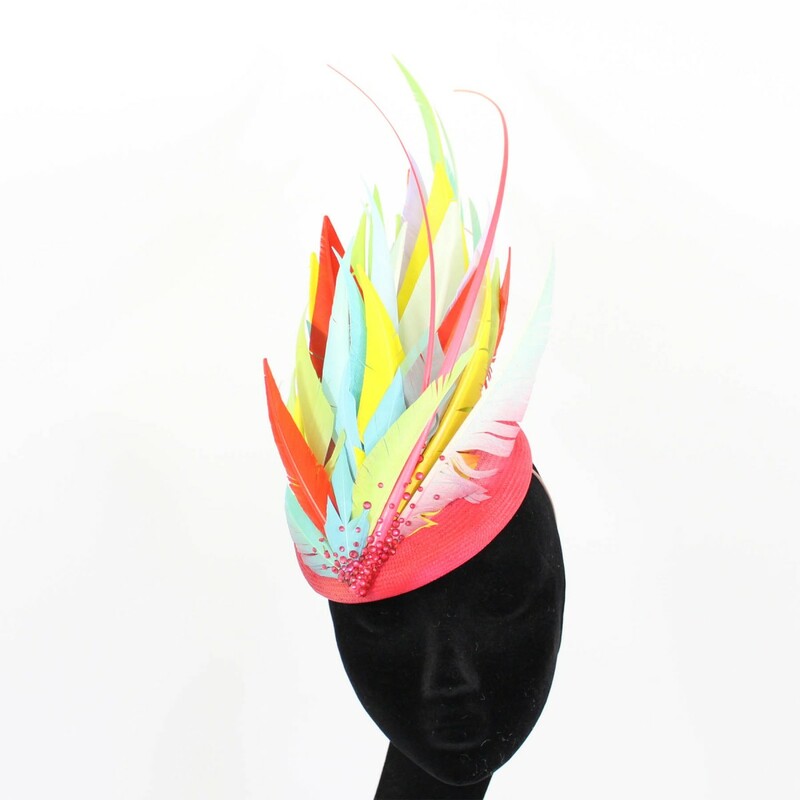 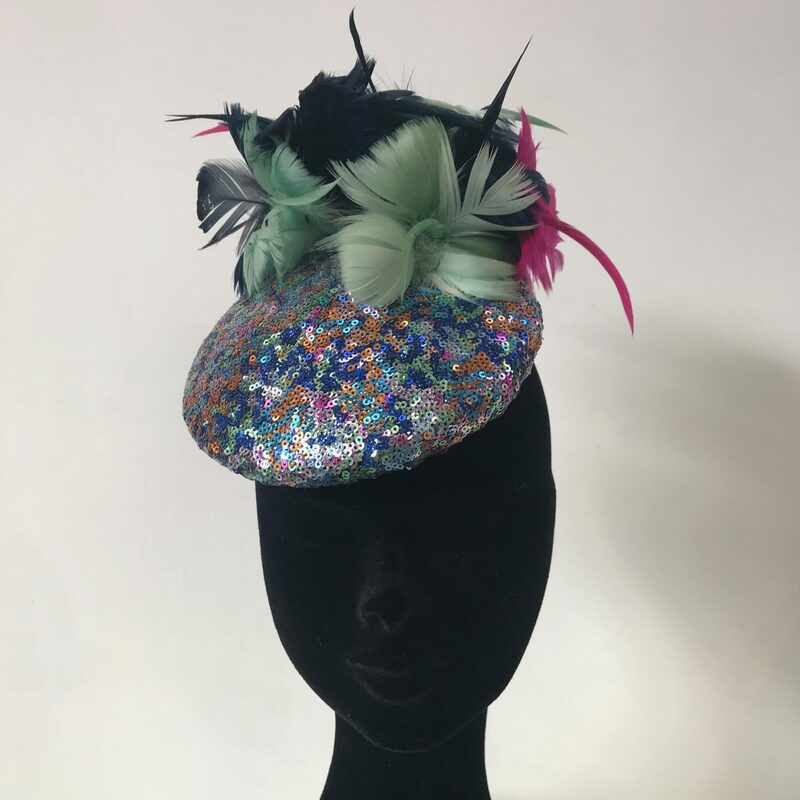 A truly stunning button headpiece covered in multi coloured sequins with the addition of coloured feathers. 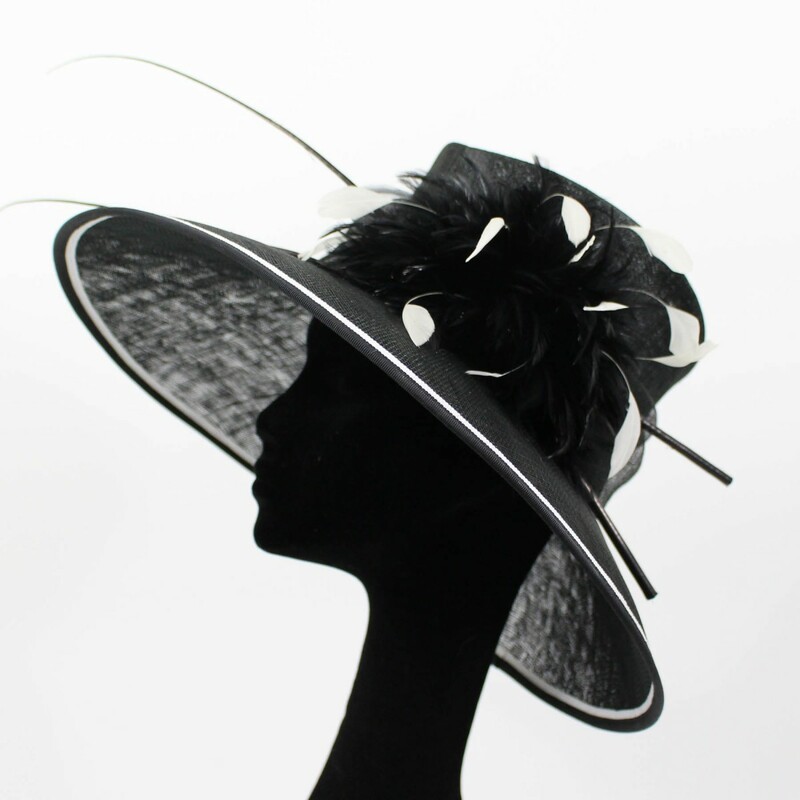 A fun statement piece for any occasion. 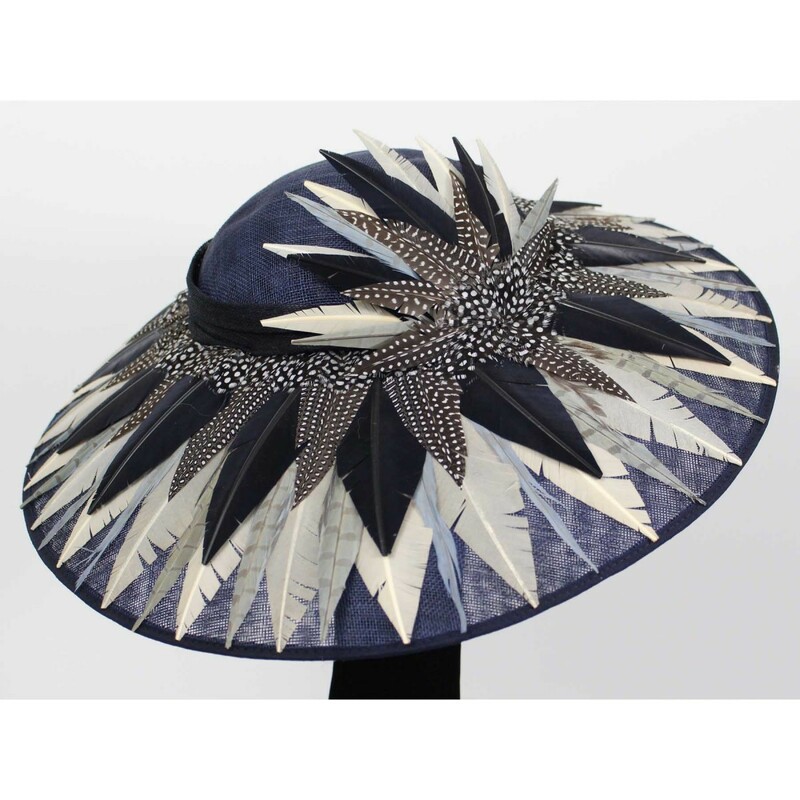 A stunningly ornate beaded button adorned with dark navy gold dipped goose spears. 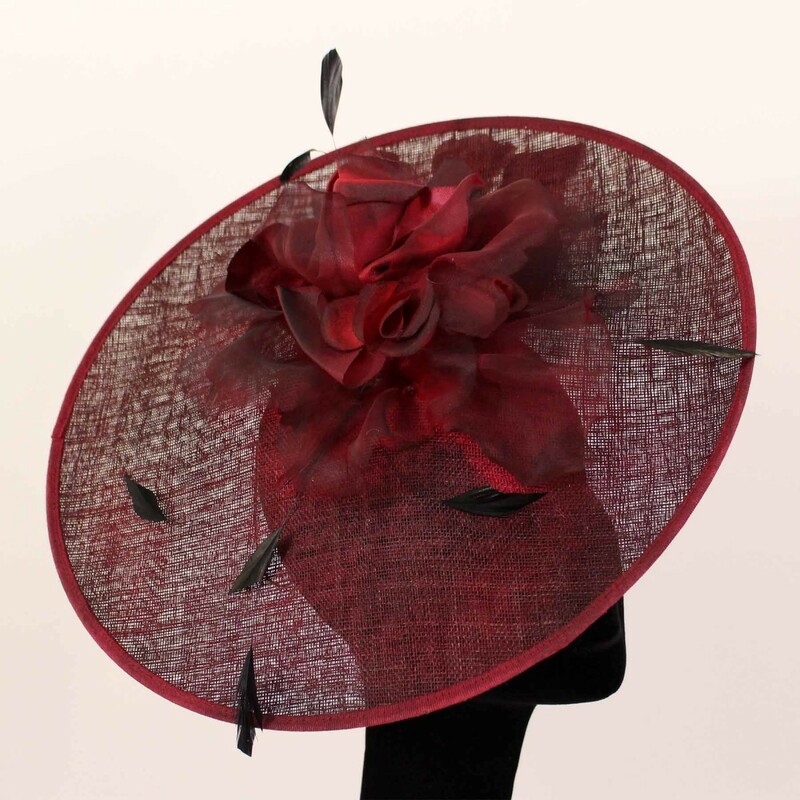 A sophisticated claret felt slice with luxurious silk roses. 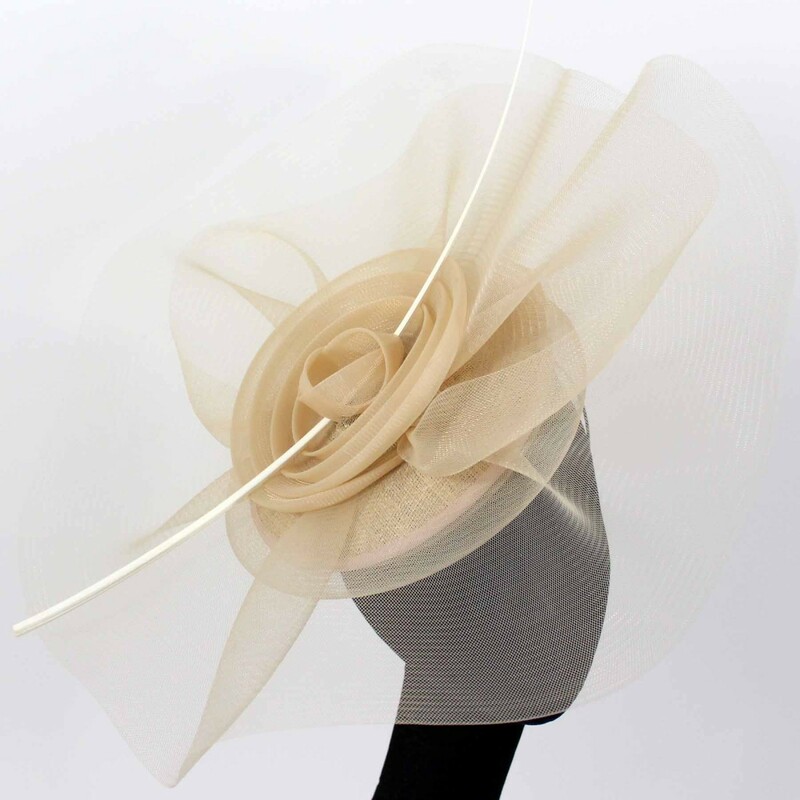 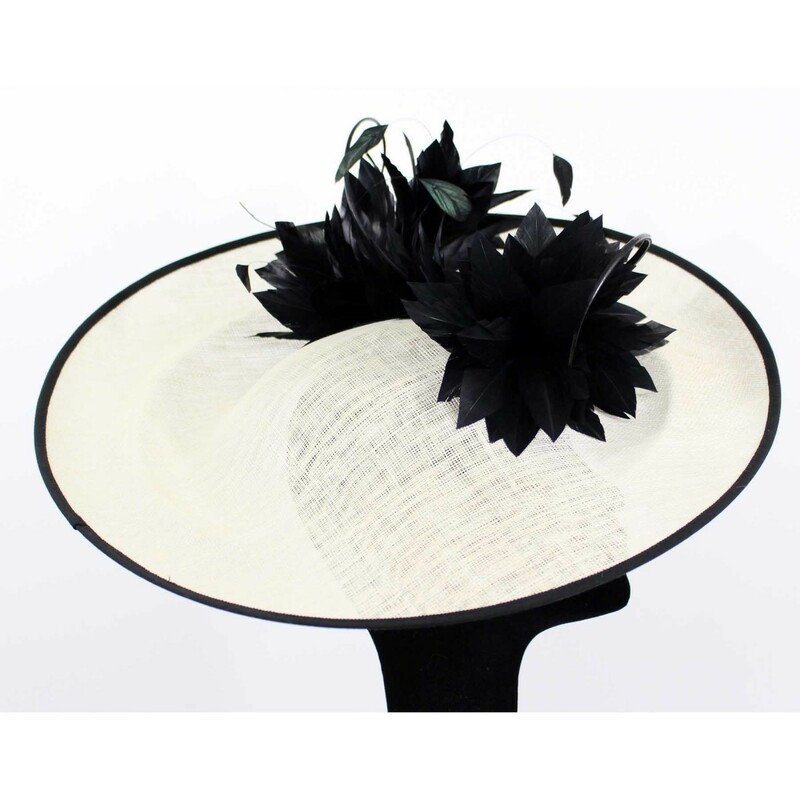 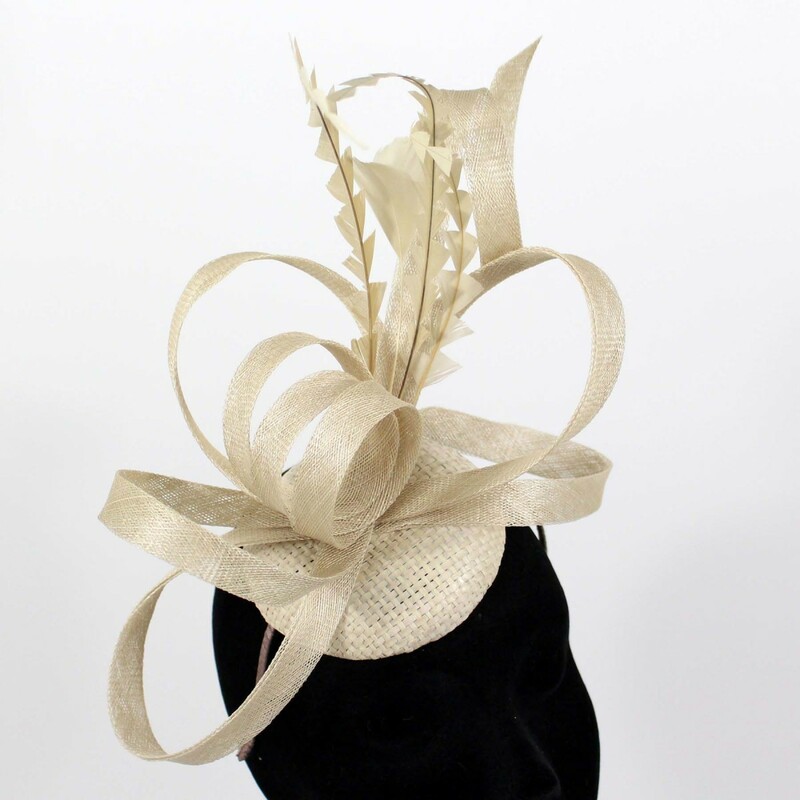 A classic alabaster felt beret style headpiece decorated with gold quills, adding a modern twist. 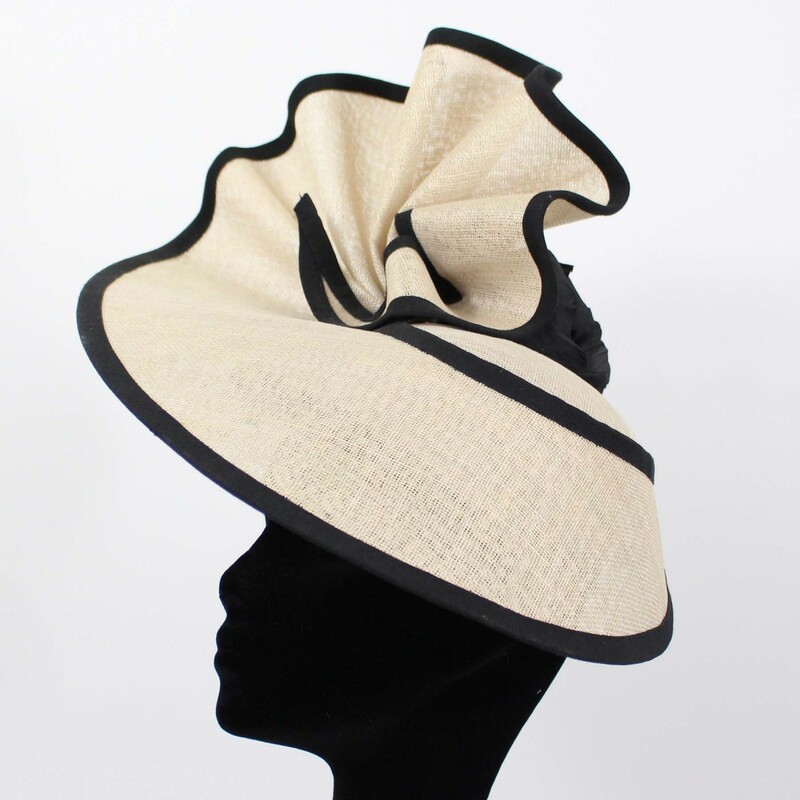 A wonderfully understated, effortless design.